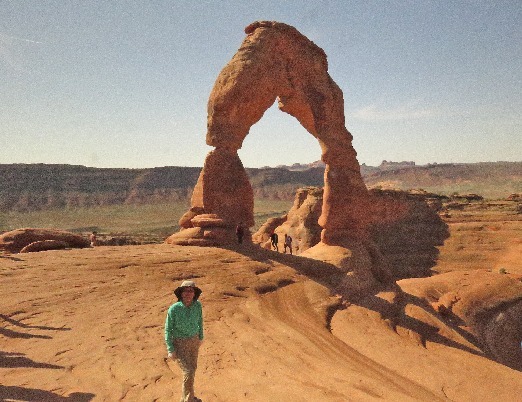 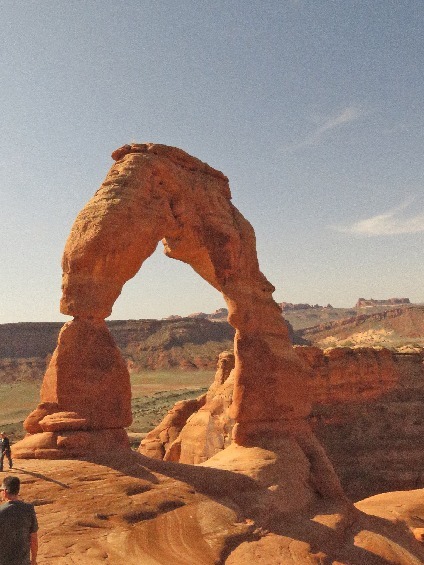 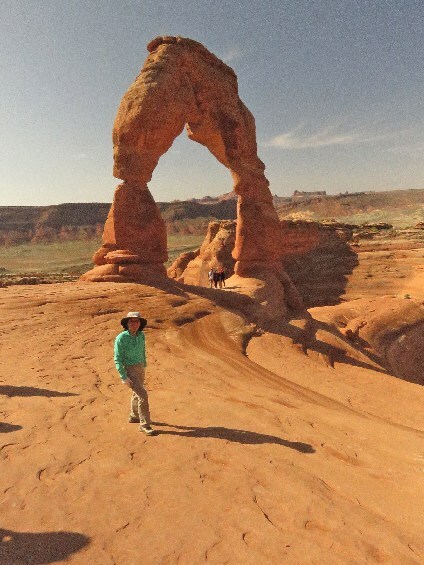 3/25/2019 Delicate Arch, Arches National Park, UT - Entrance to the National Park was long line, then parking lot was full, waited someone to leave, lucky to find one. 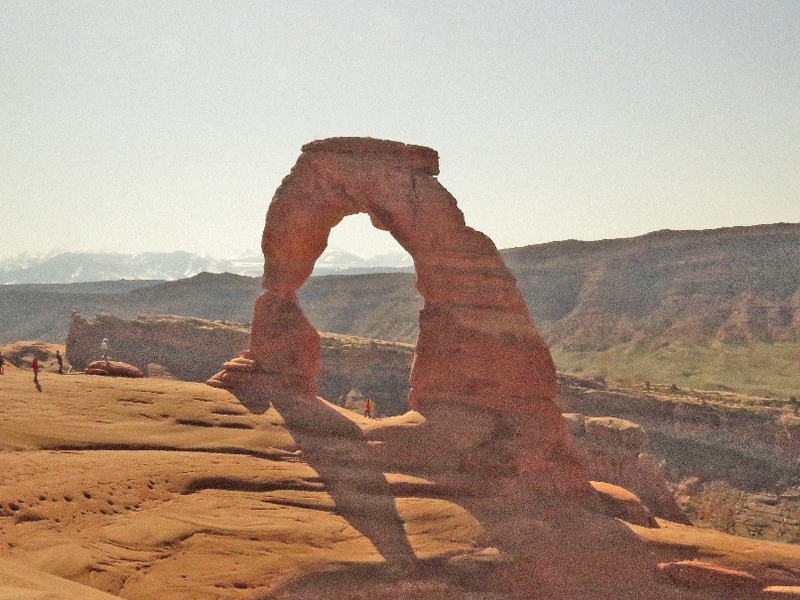 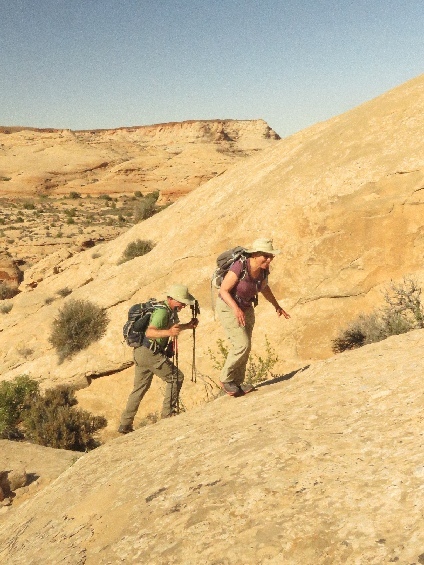 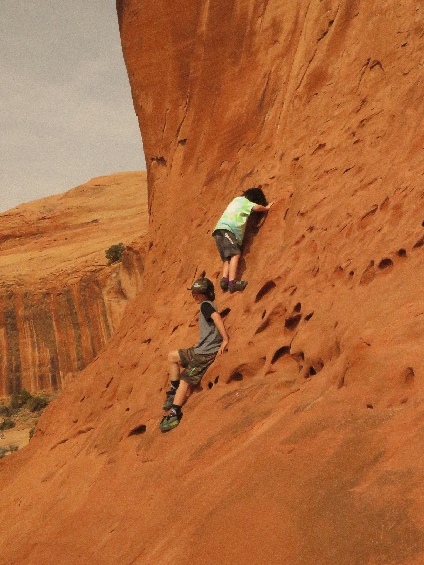 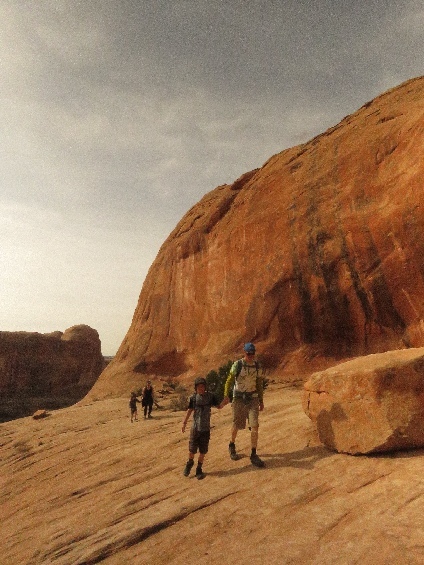 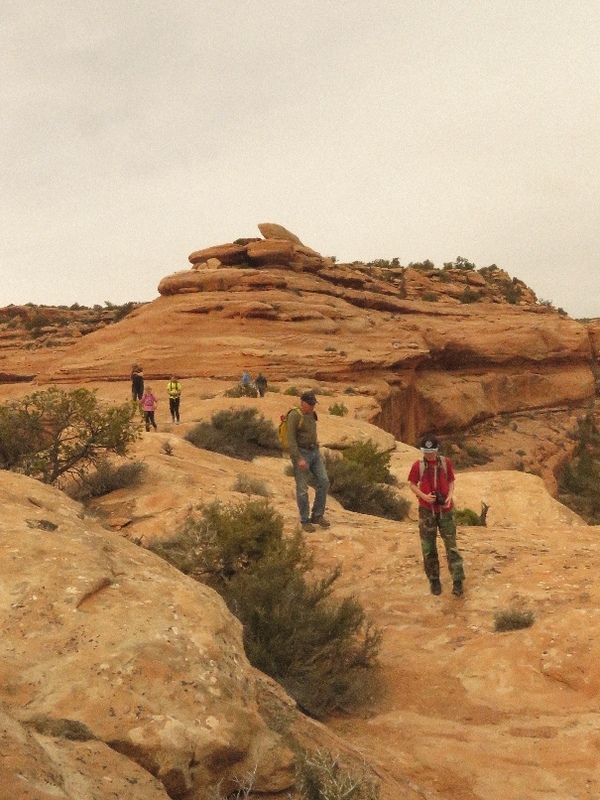 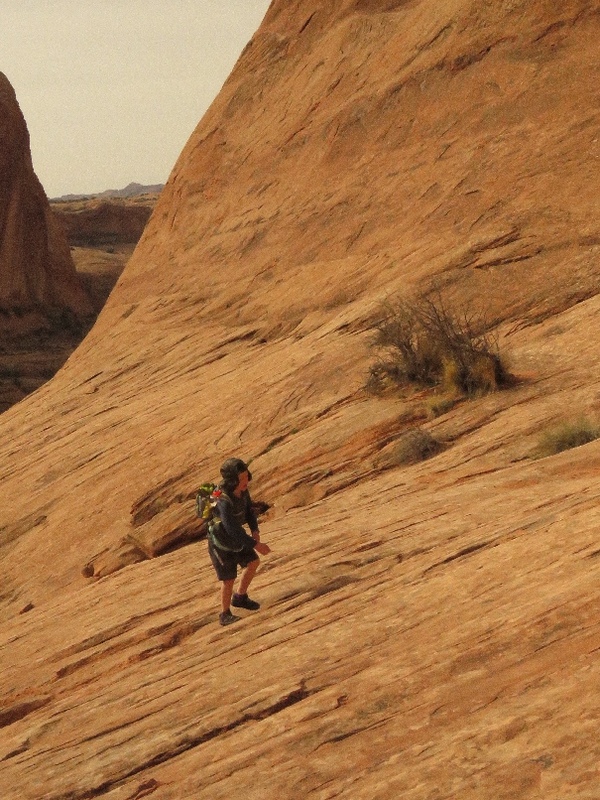 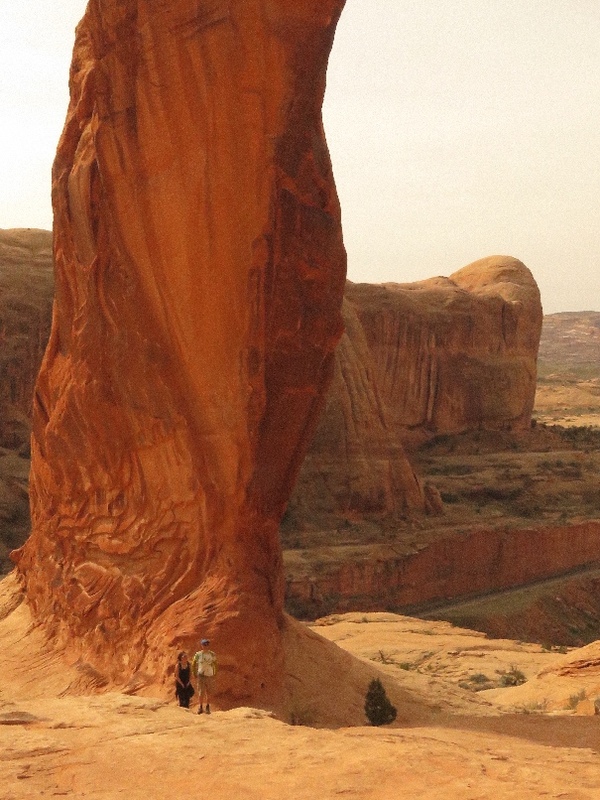 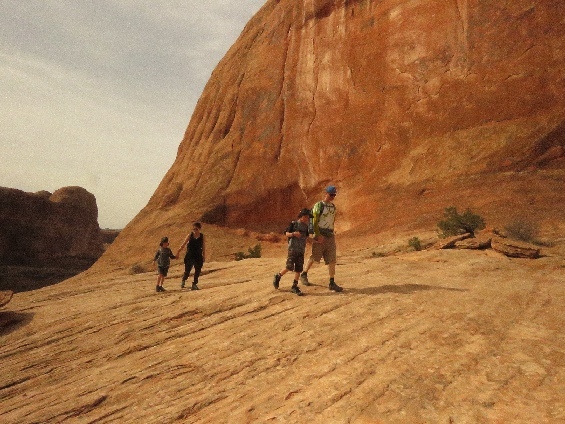 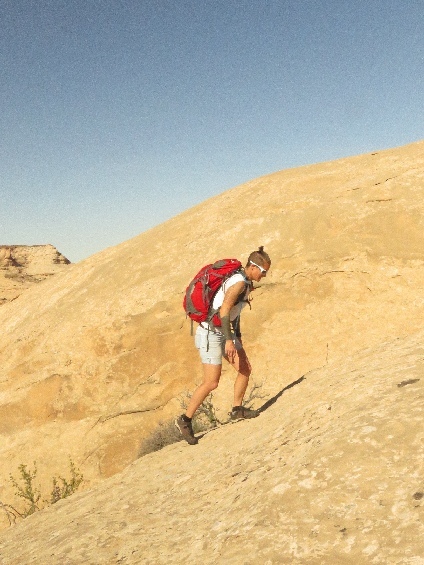 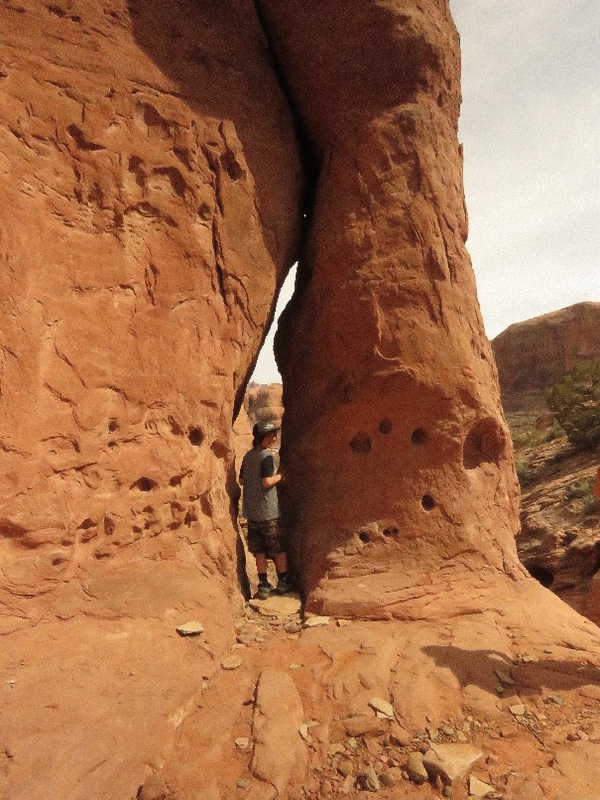 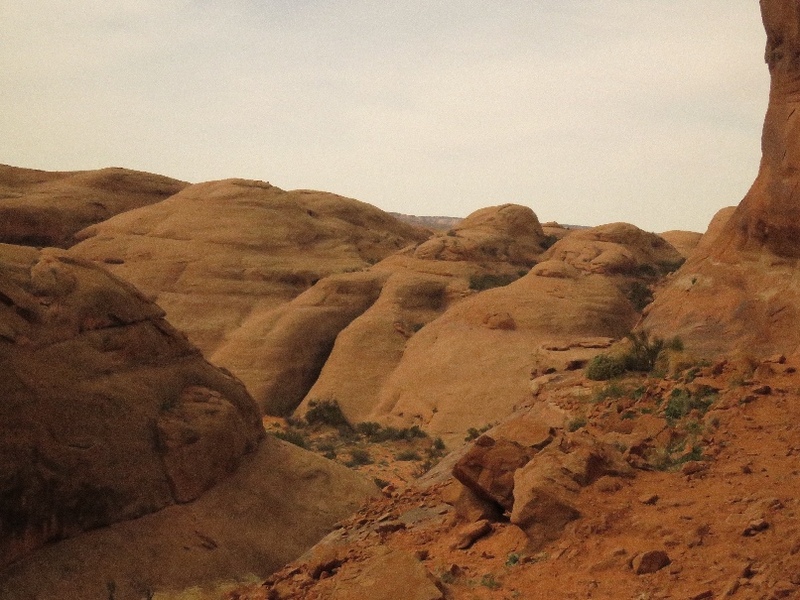 There are many people on the trail and near the Delicate Arch. 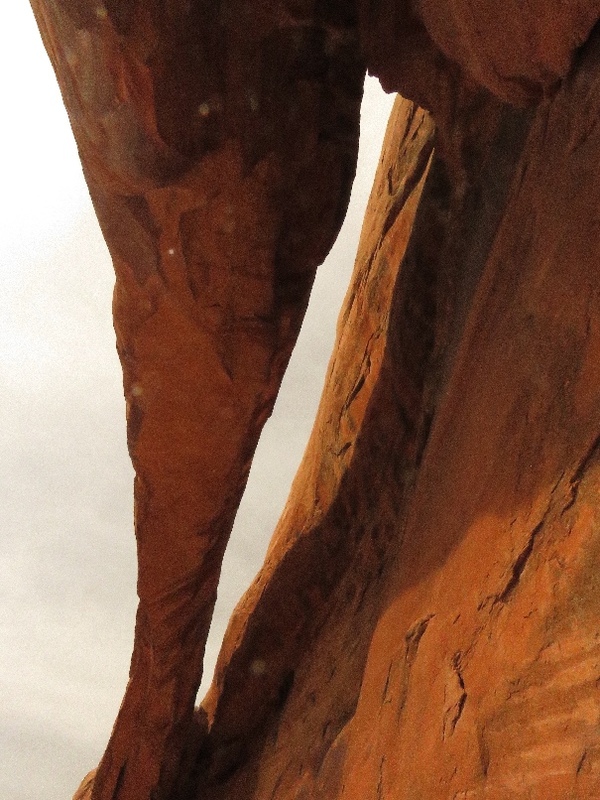 Long line to get under the Delicate Arch, which we skipped. 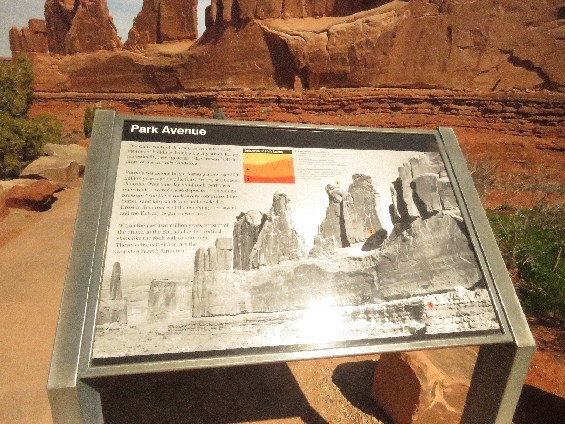 We also stop by at the Windows section, but no parking space, then we stop by to the Park Avenue to enjoy the view. 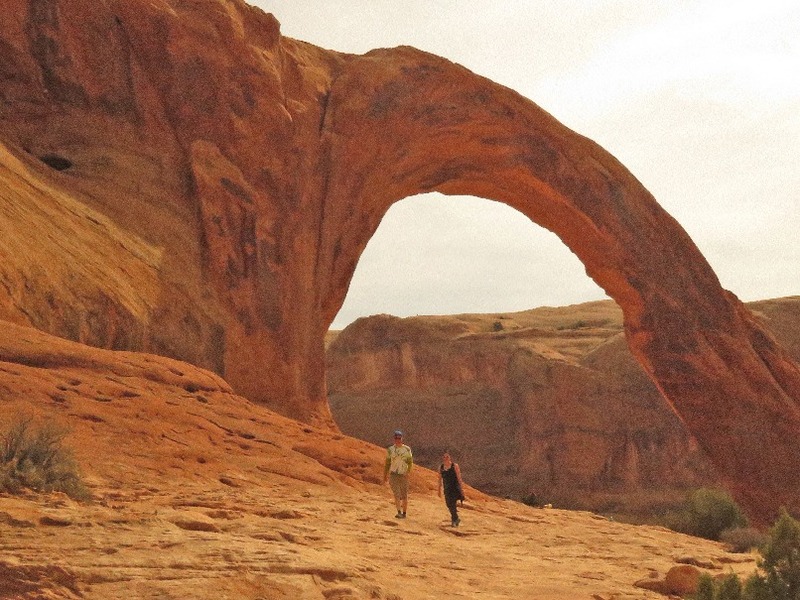 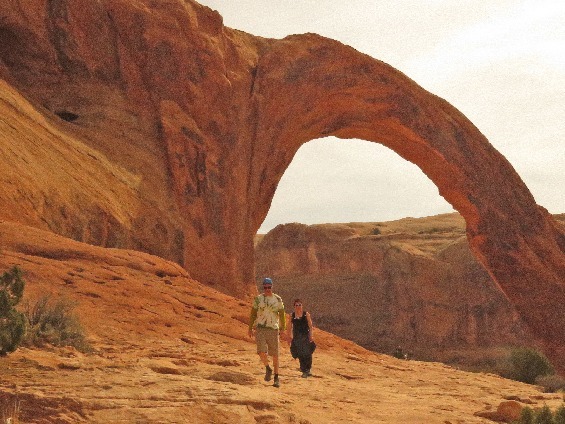 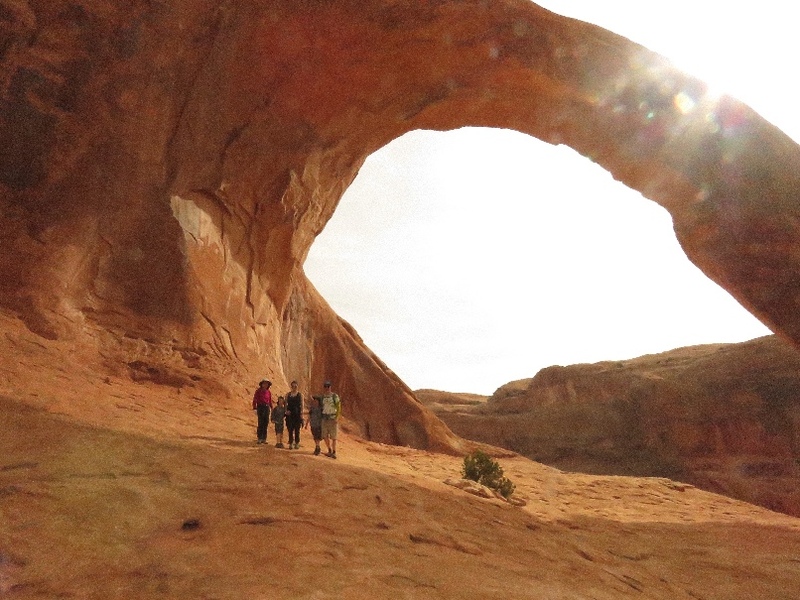 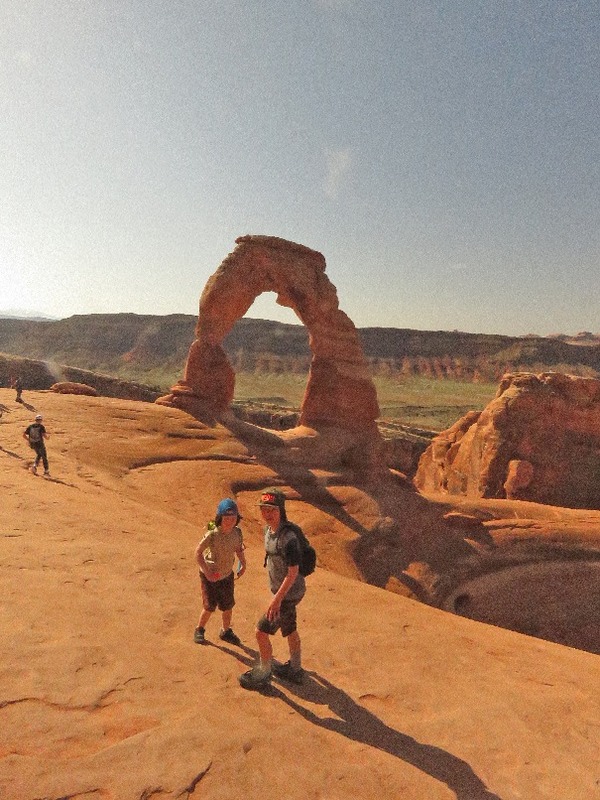 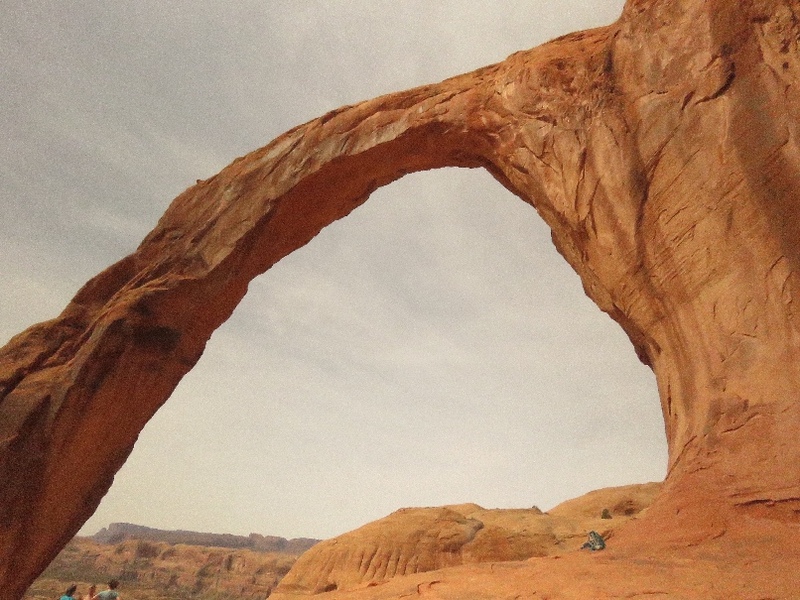 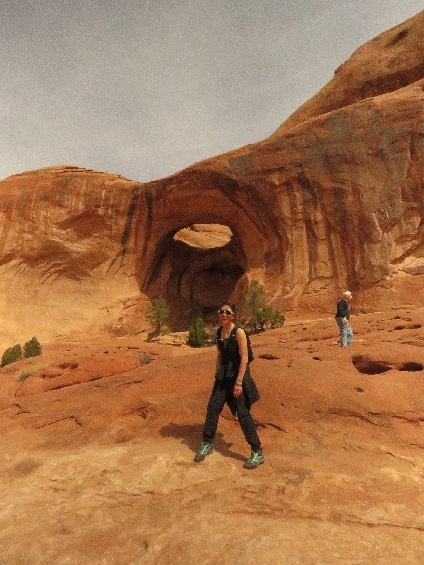 3/26/2019 Corona Arch, Moab, UT - We left home early because worry about parking lot, when we got there, not many cars, however when we got back from hiking, parking lot was full. 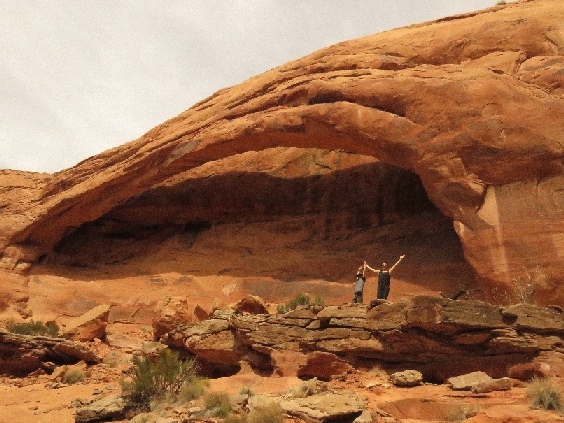 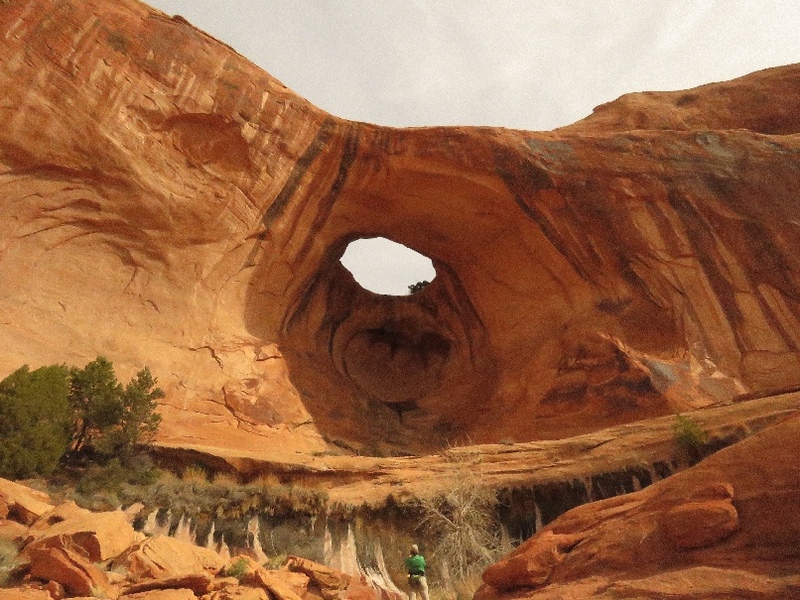 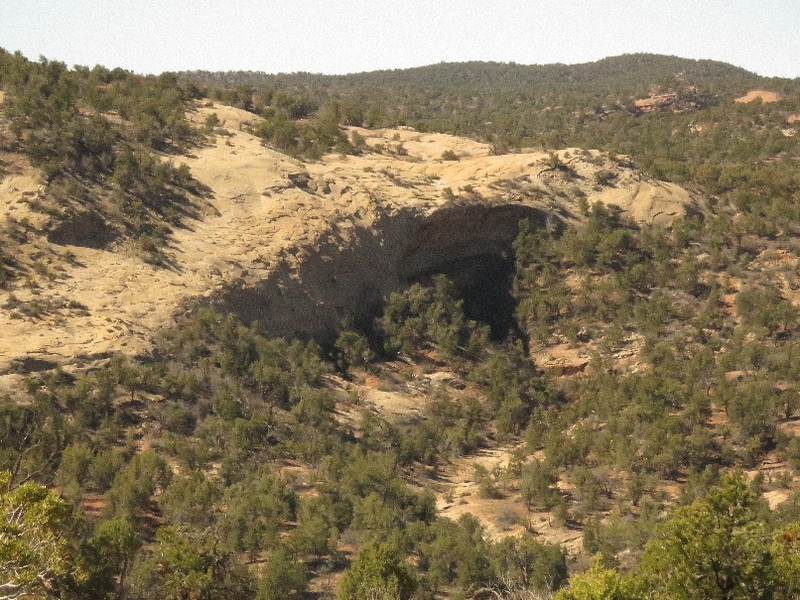 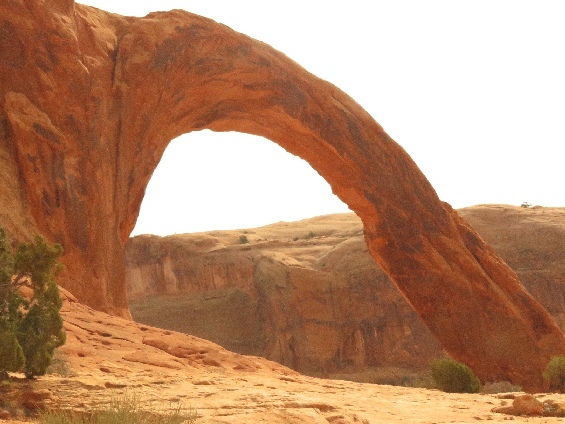 It is a large beautiful 1/4 circle arch, near the Potash Salt Mine railroad. 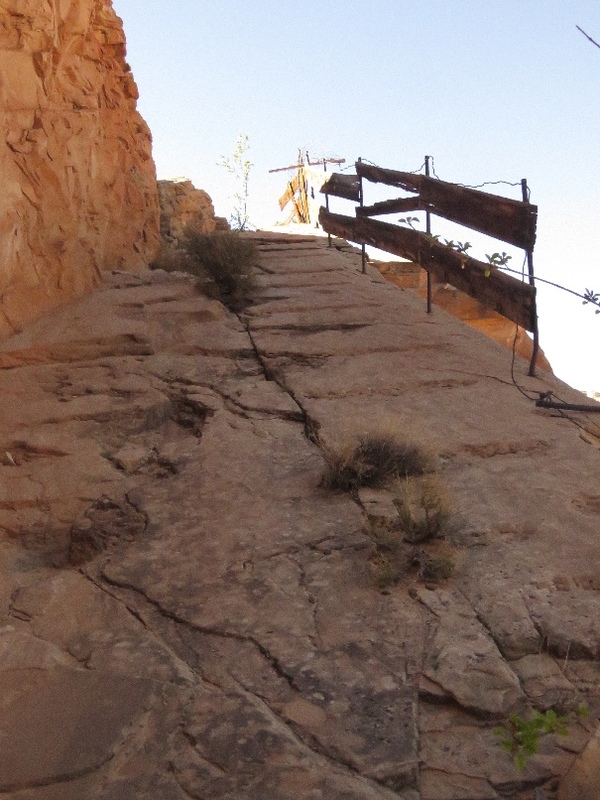 One tricky place is use wire rope and a ladder to climb up the steep slope. We stopped by to the Jug Handle Arch. 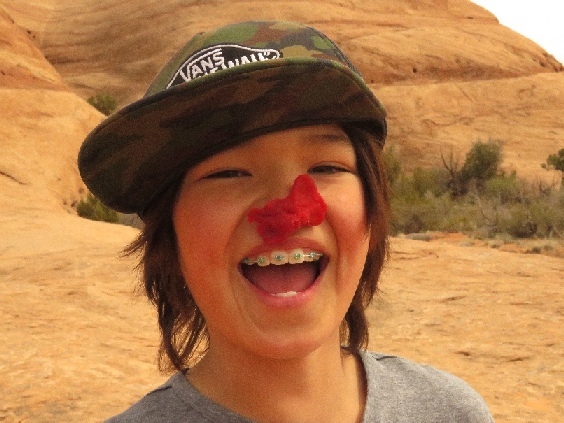 3/26/2019 Poison Spider RA, Moab, UT - Parking lot was almost full, we got a last one, lucky us. 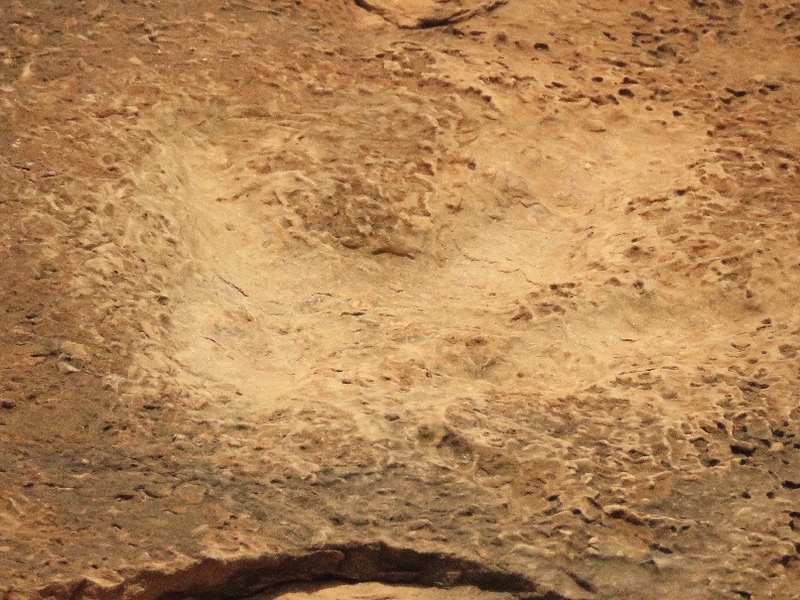 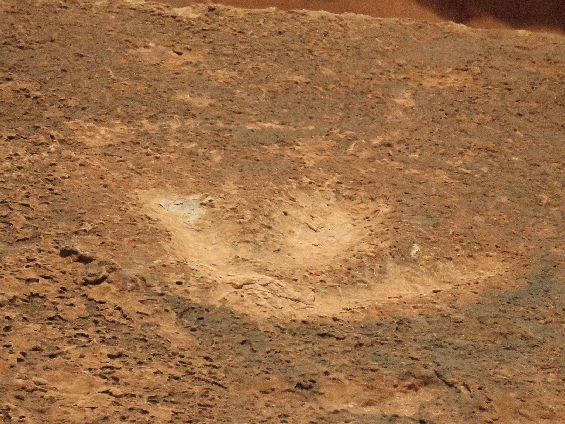 We found not only petroglyphs, we found dinosaur foot prints too. 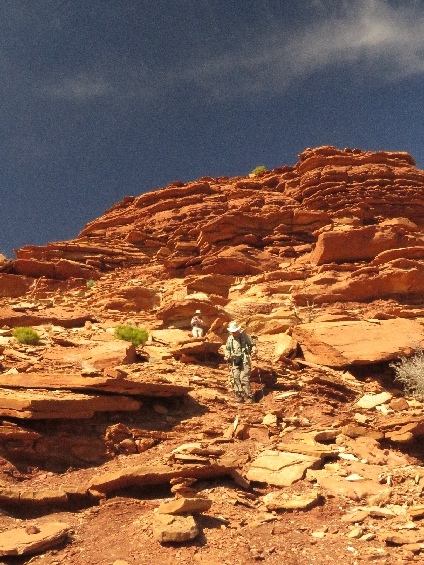 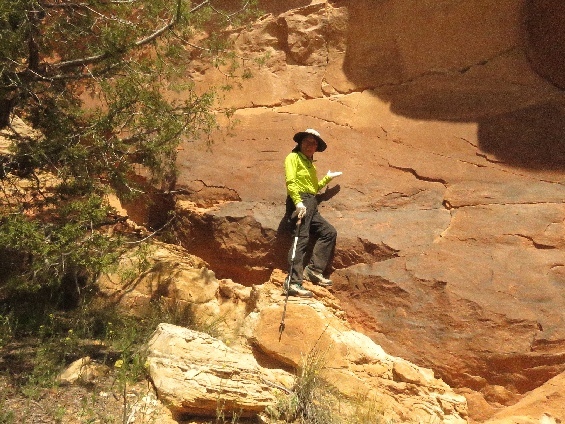 Need to climb up steep hill to reach the petroglyphs panels site. 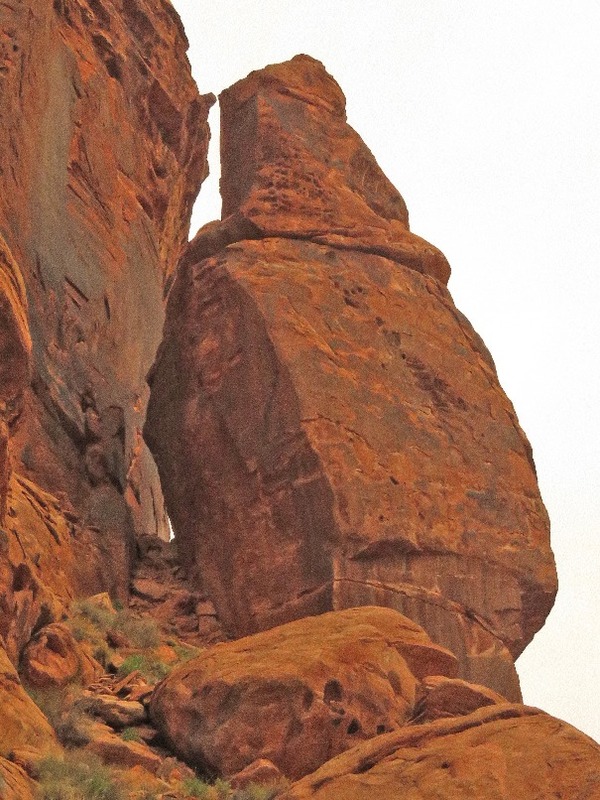 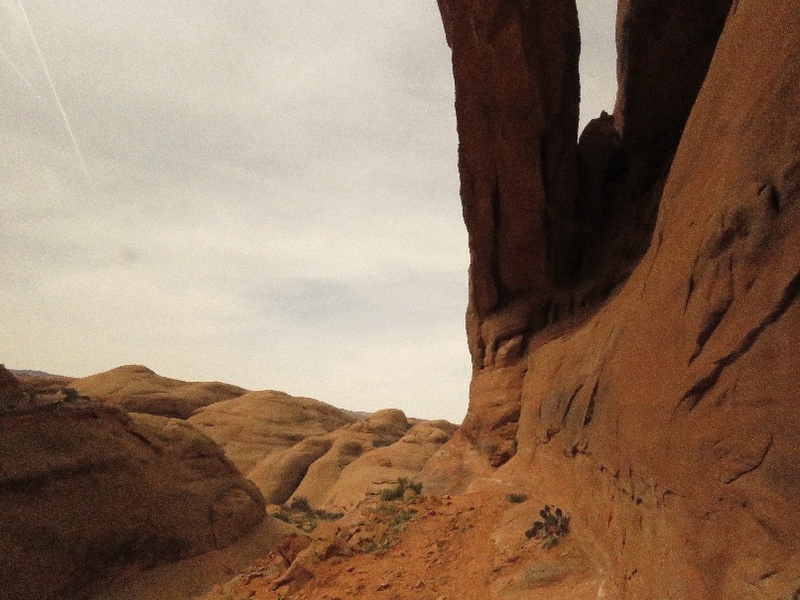 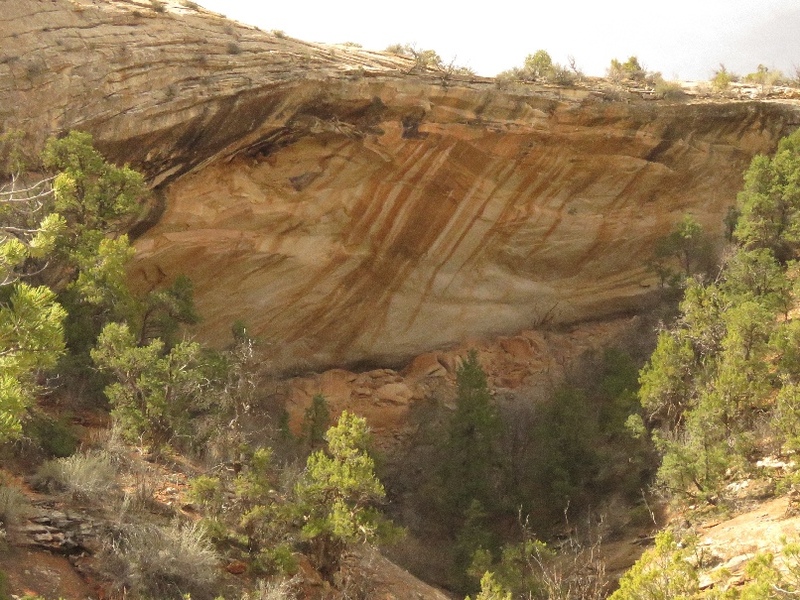 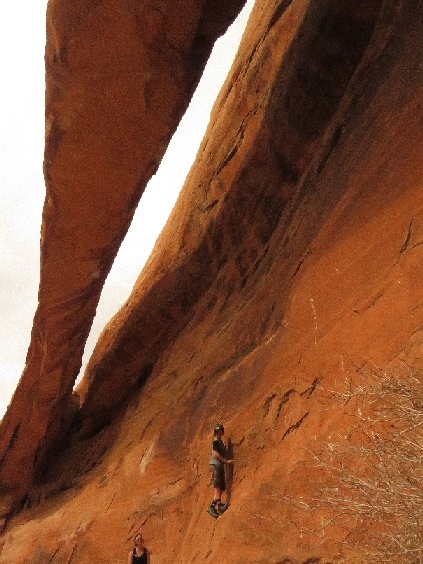 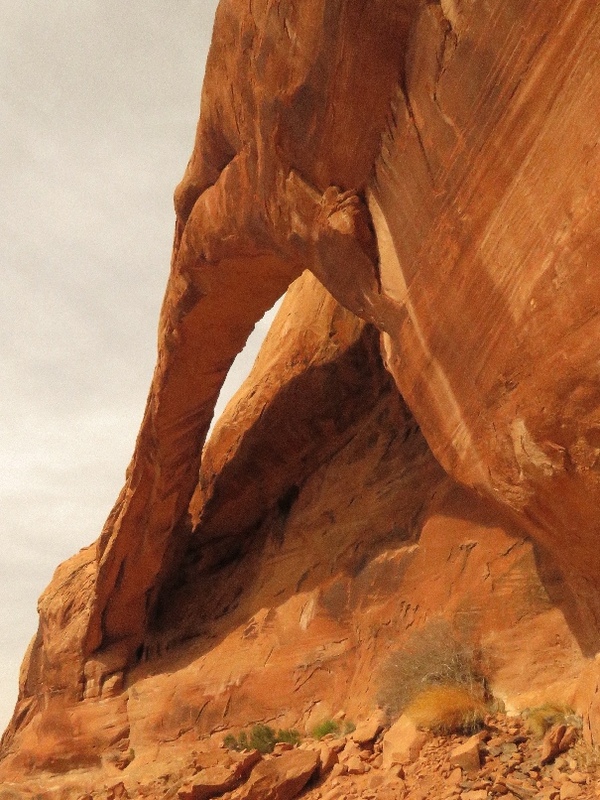 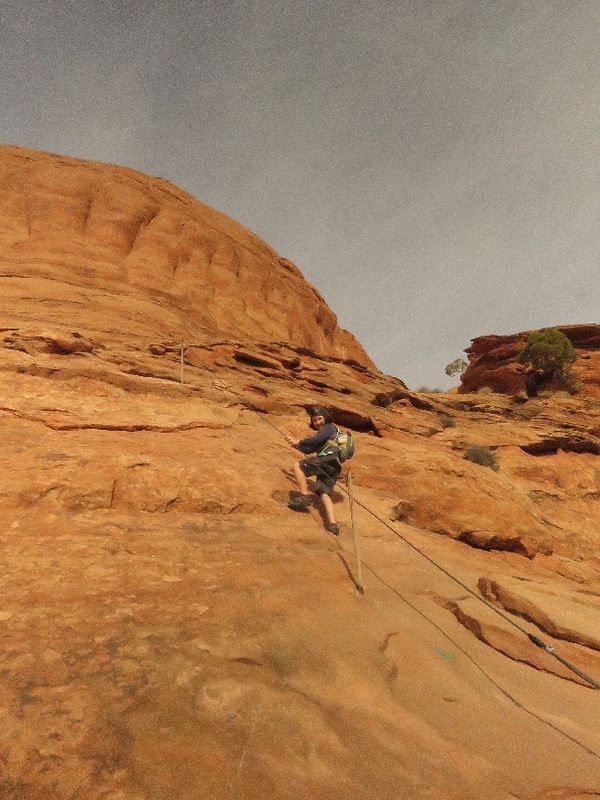 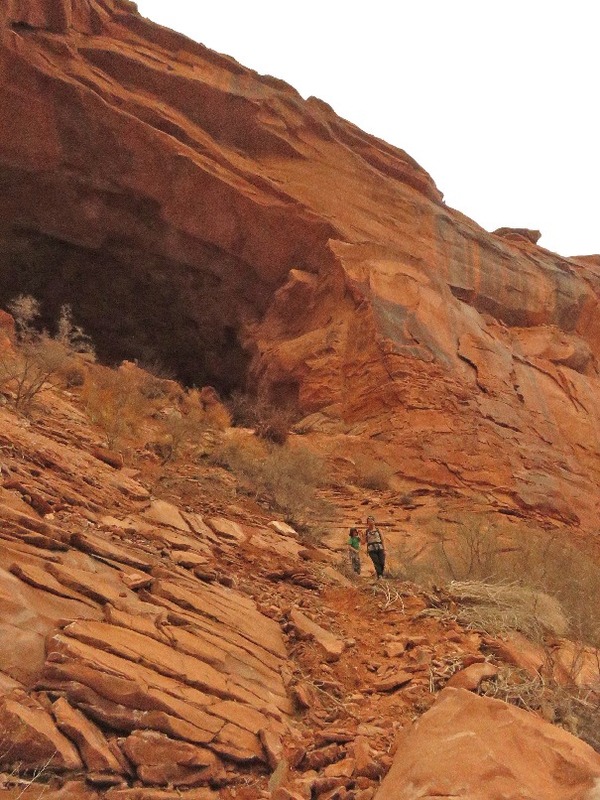 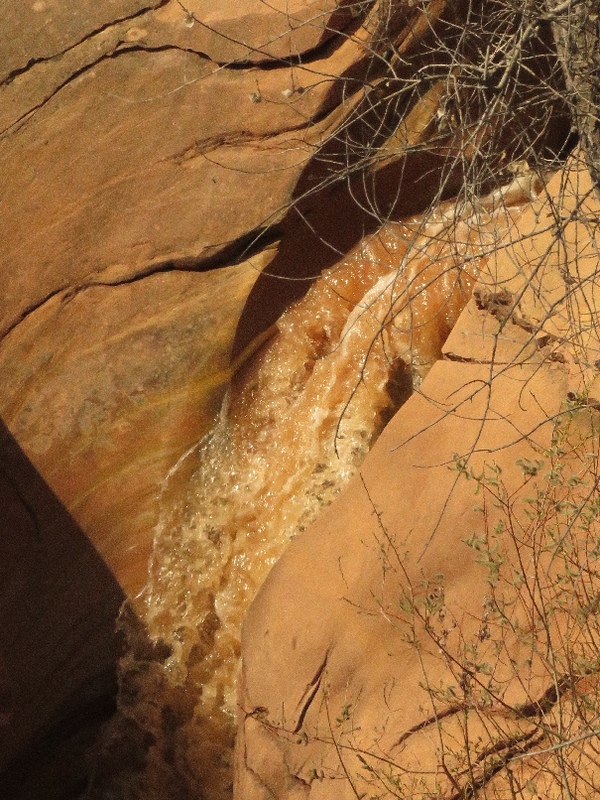 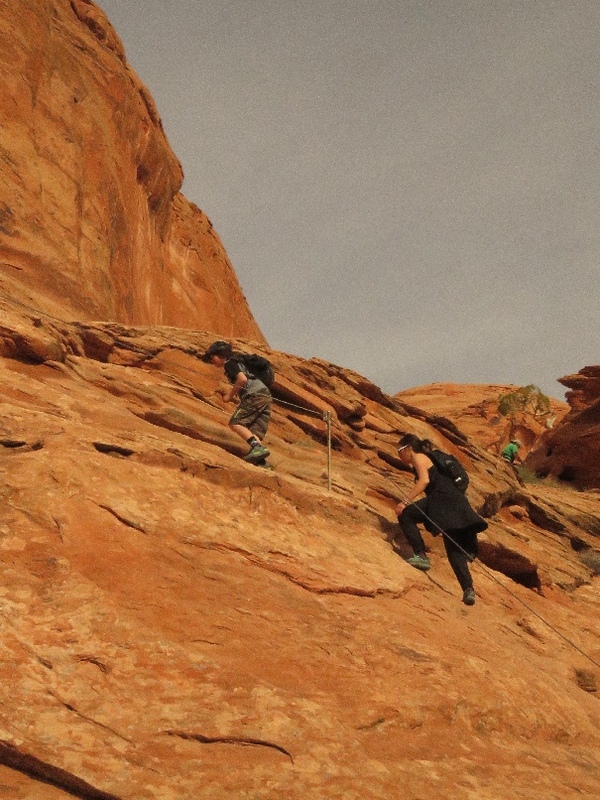 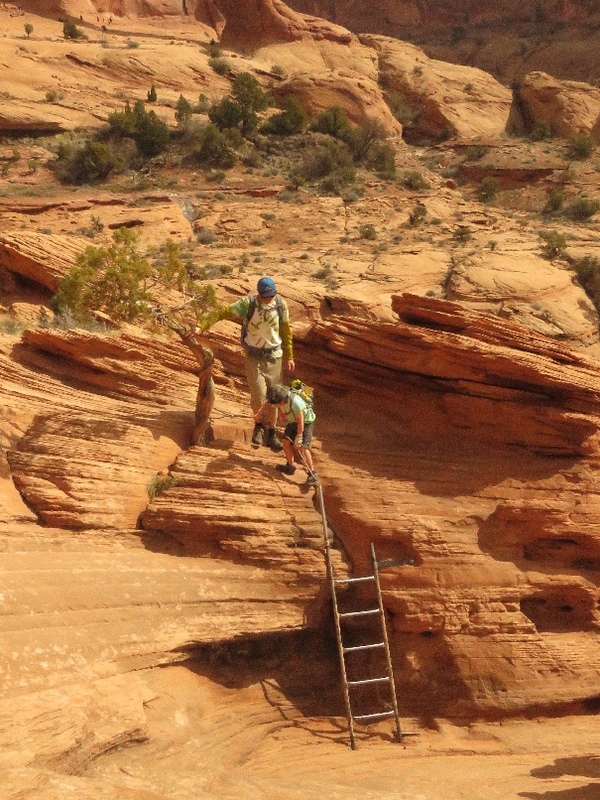 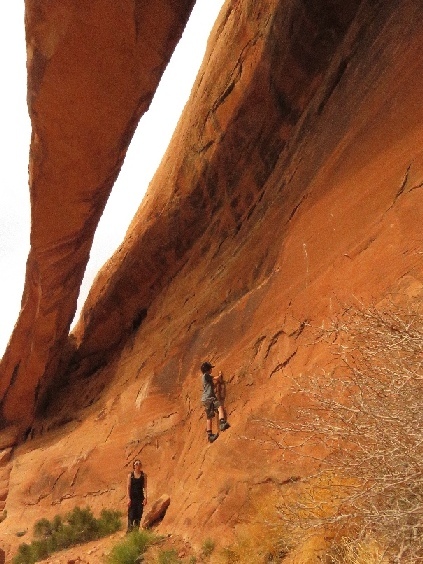 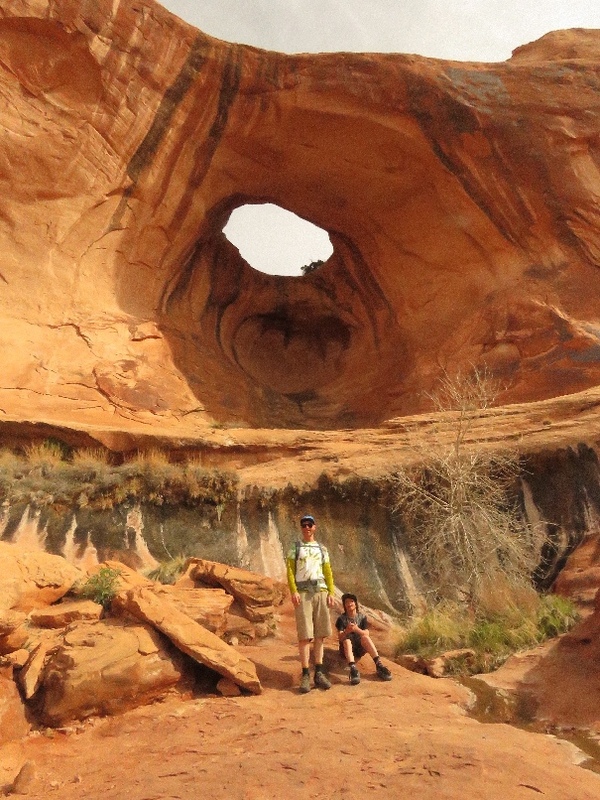 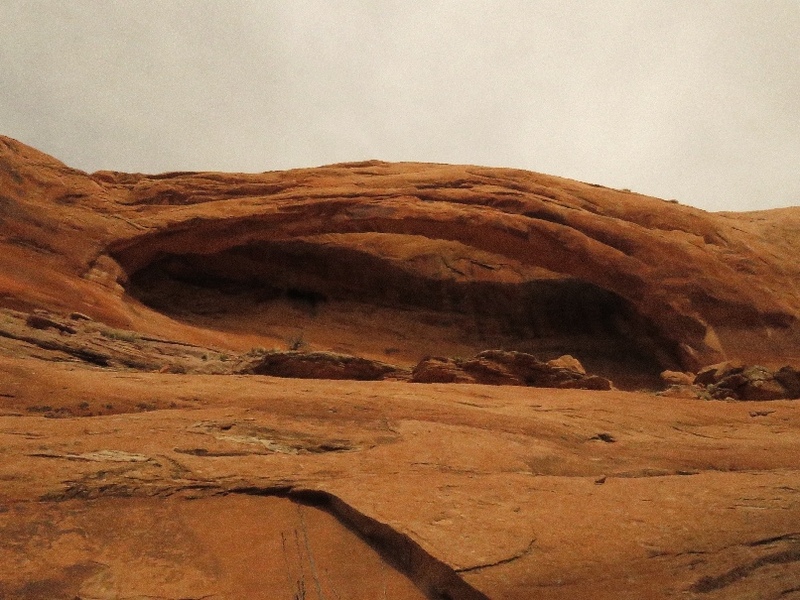 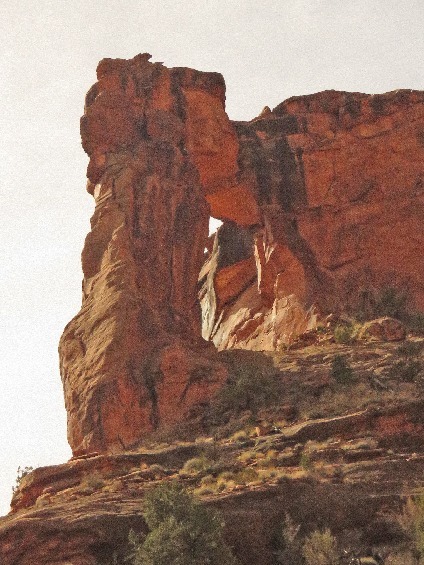 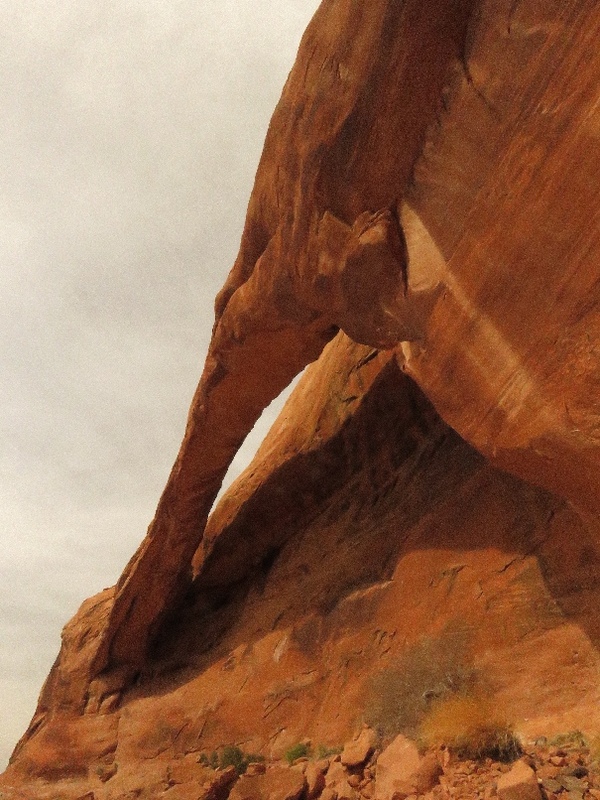 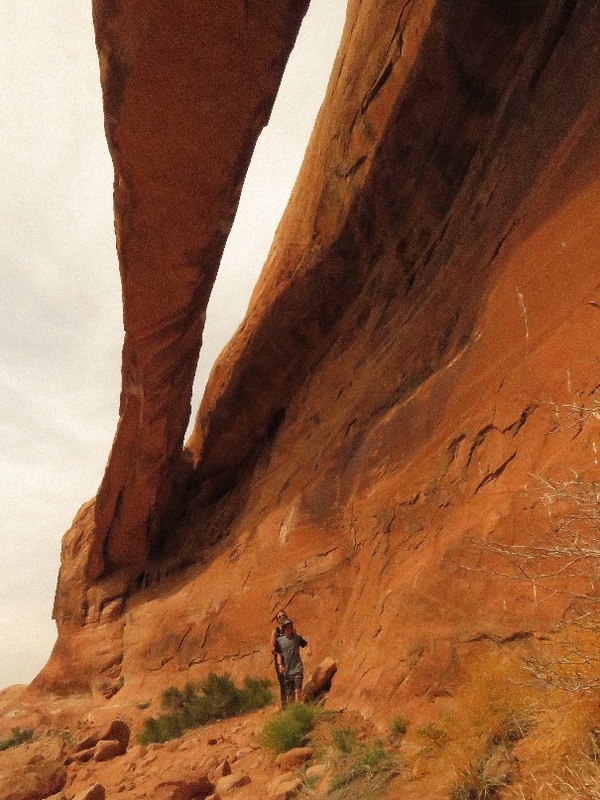 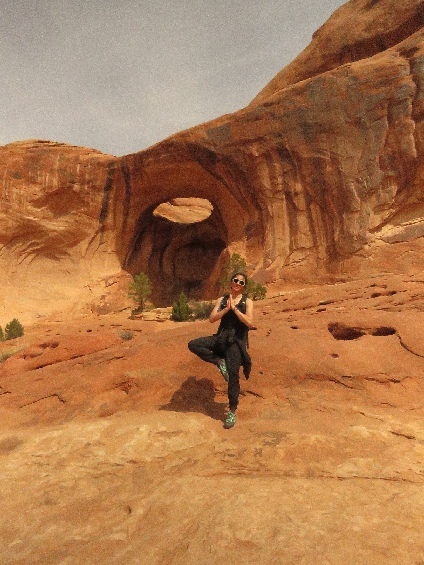 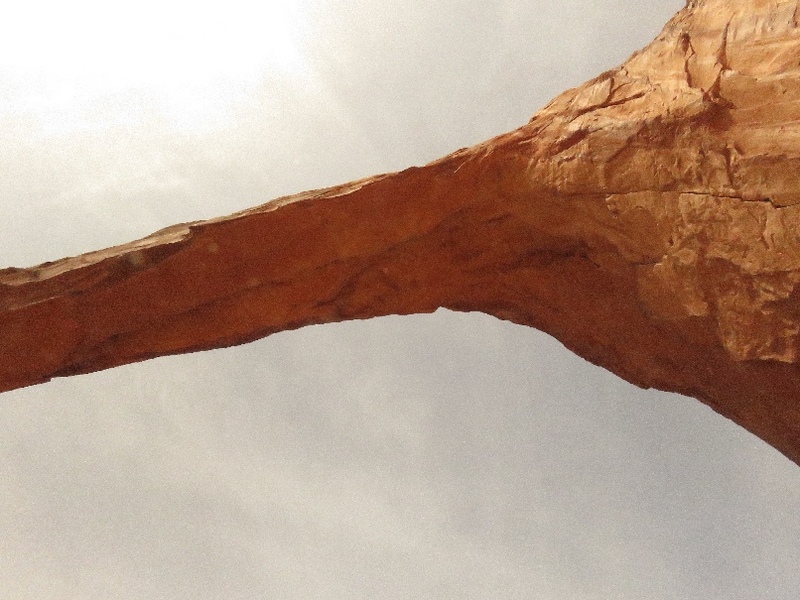 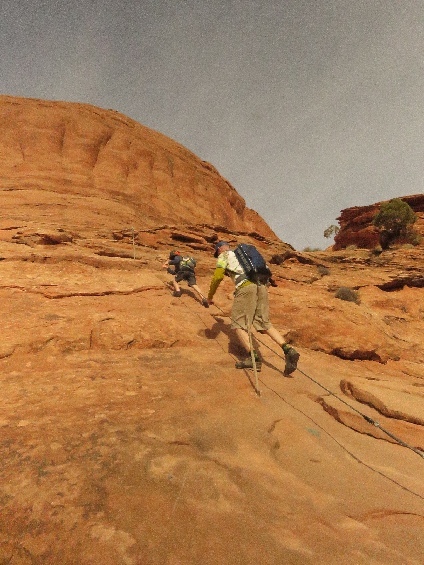 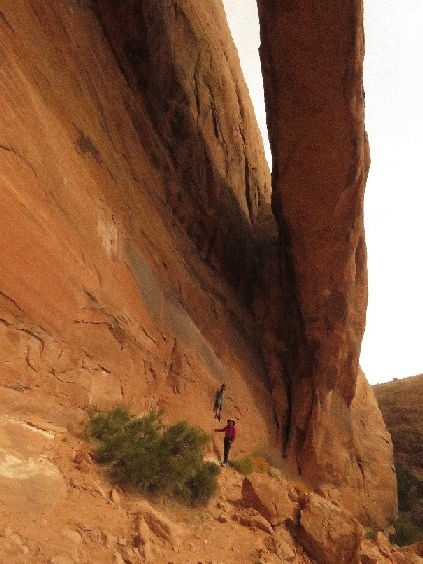 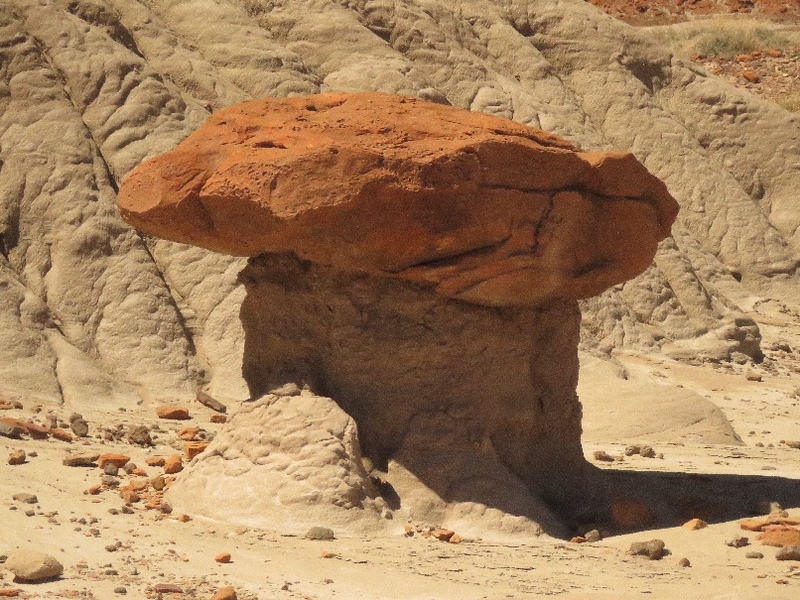 3/26/2019 Longbow Arch, Poison Spider Mesa, Moab, UT - The TH is the same as Poison Spider RA site. Beginning climb up steep short section, which metal handholds were provided. 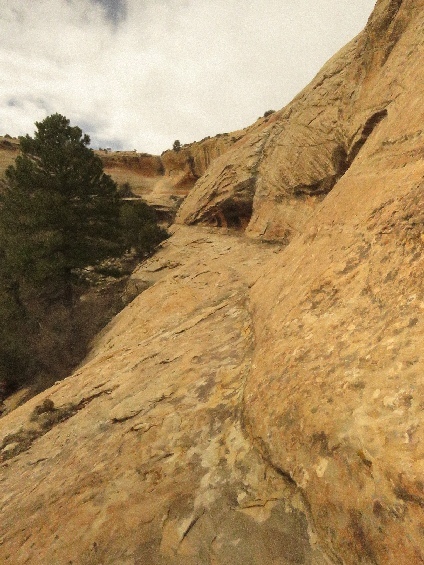 Also steep slope to climb up to the bottom of the arch. 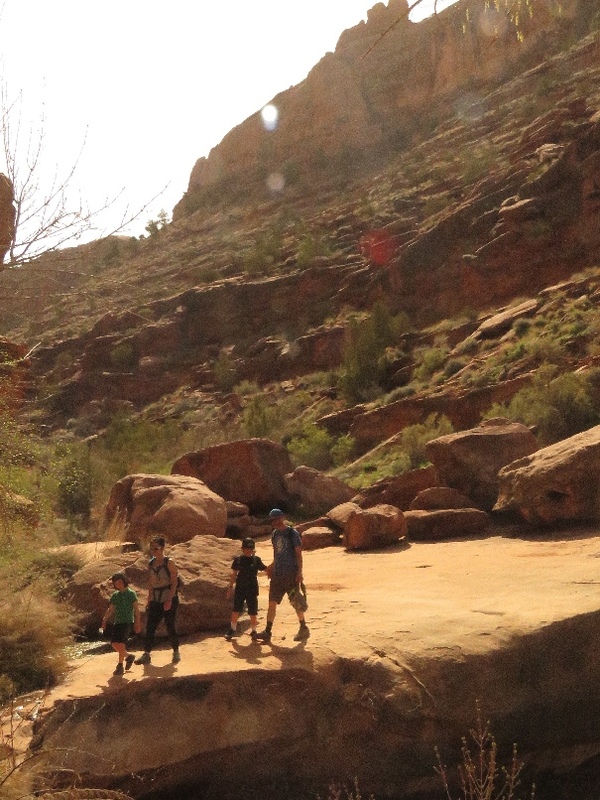 Overall it is a trail hike, good trail for the families. The arch is long and not much space between arch and back wall. 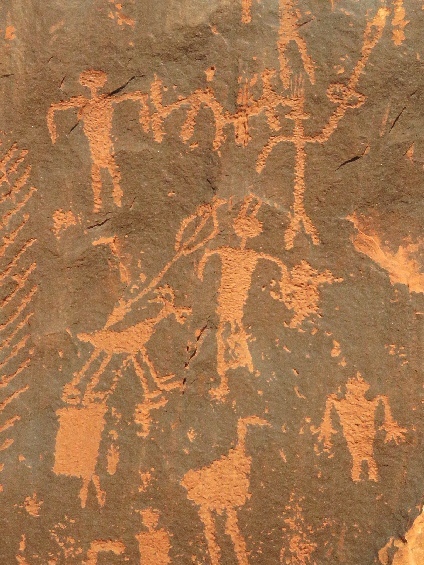 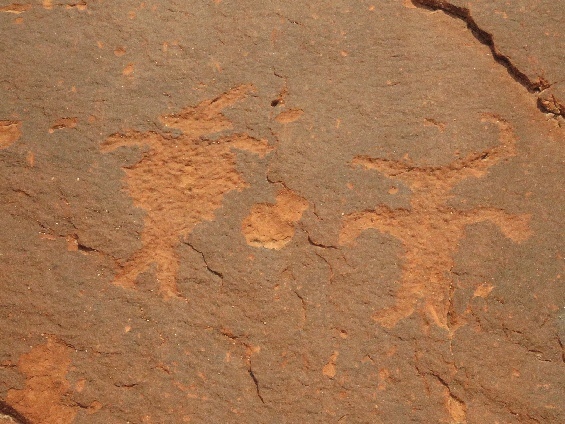 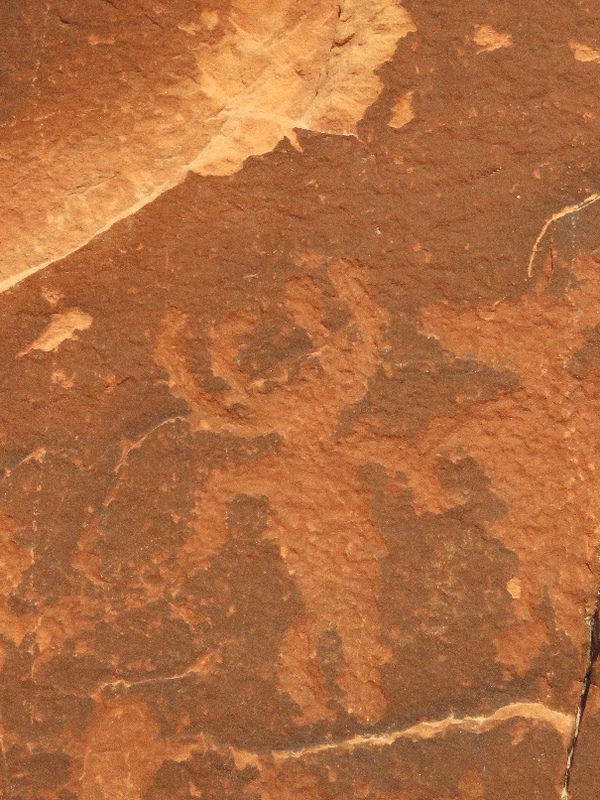 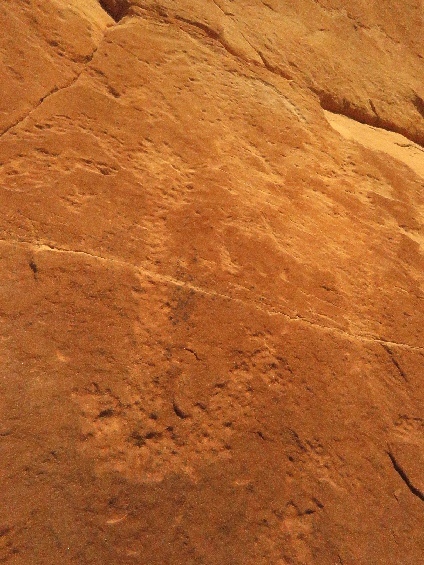 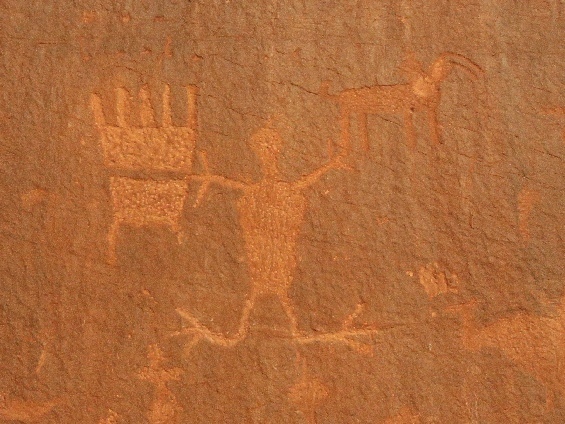 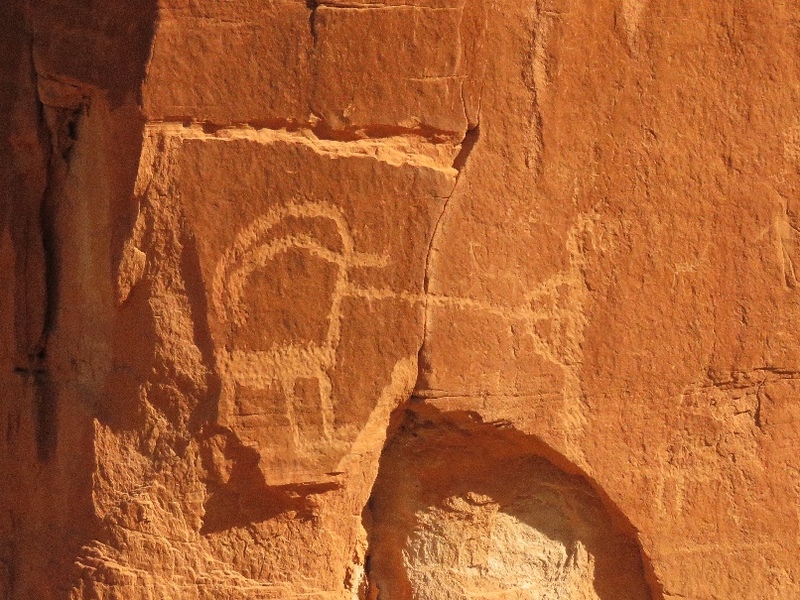 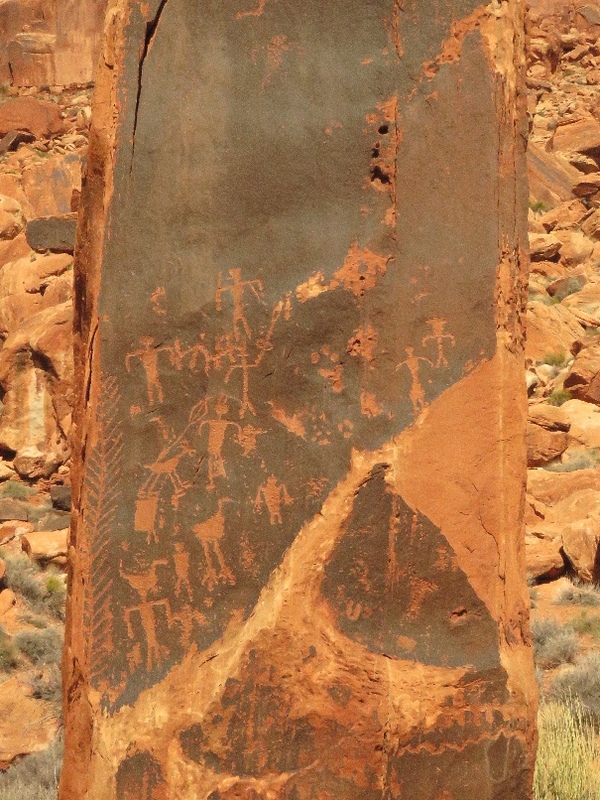 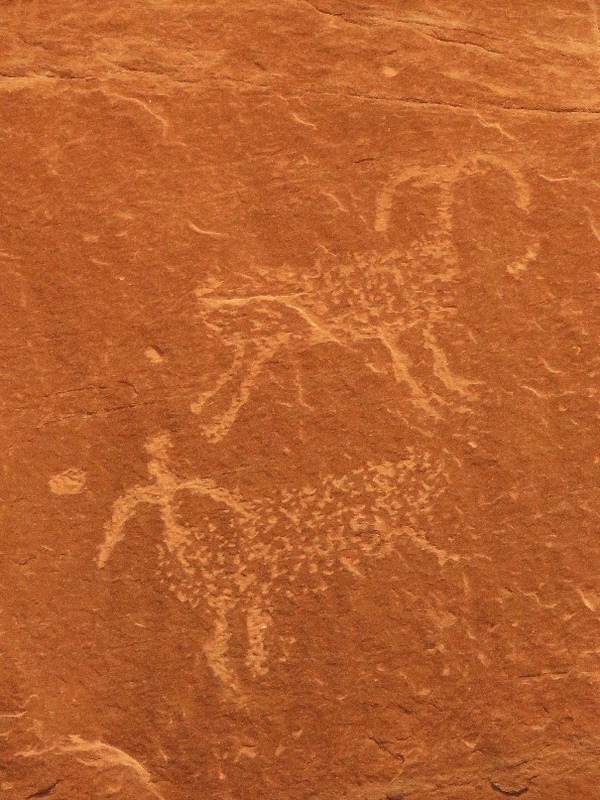 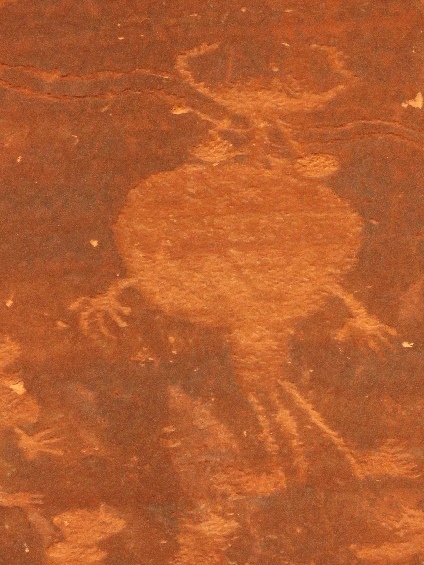 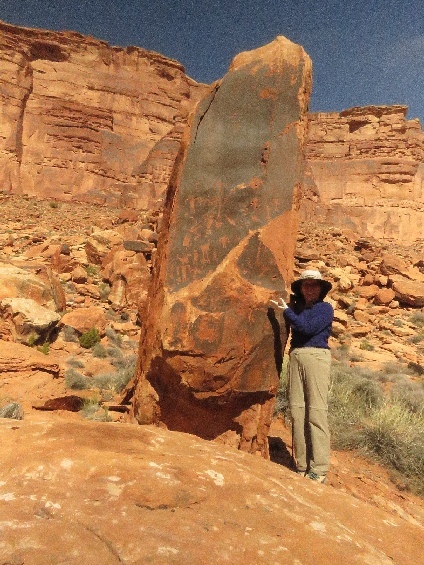 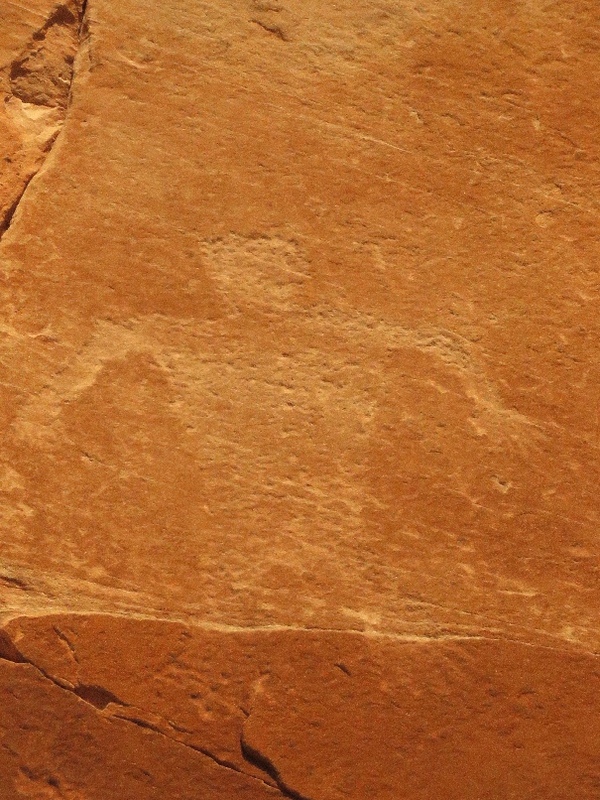 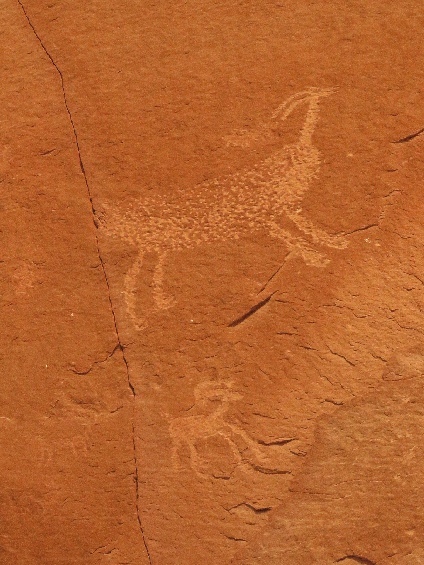 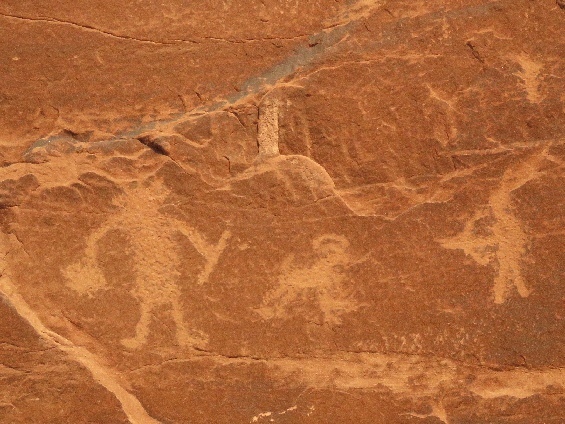 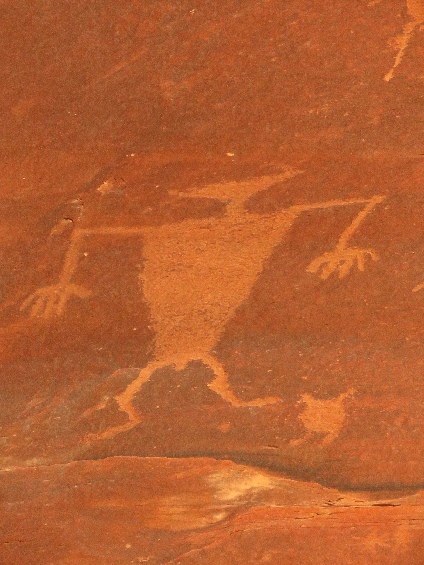 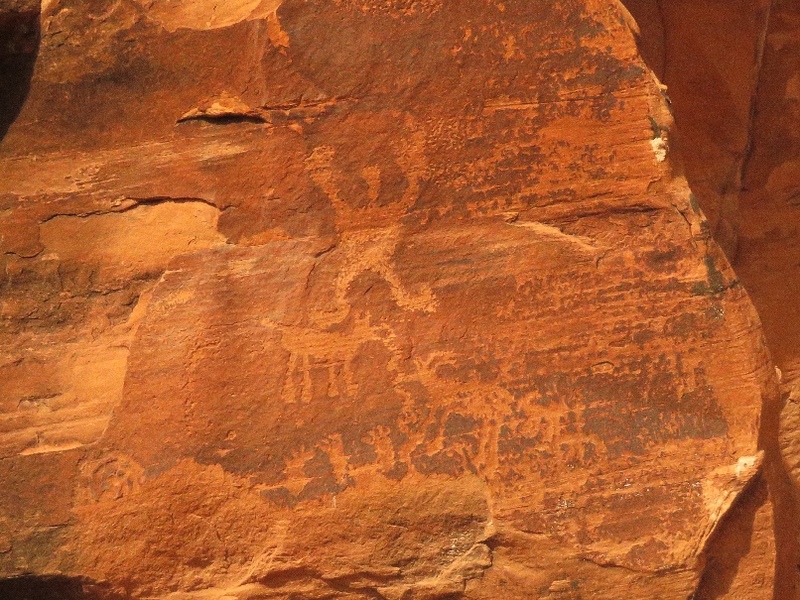 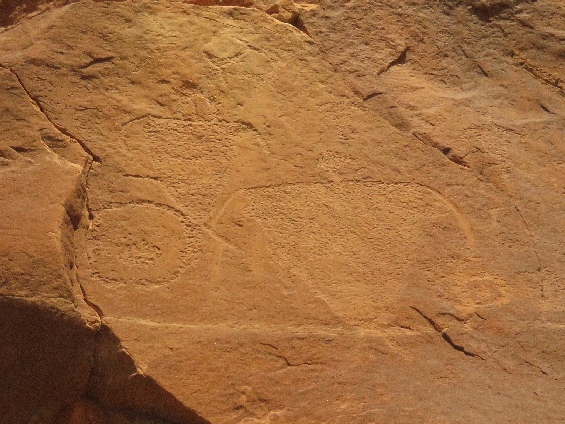 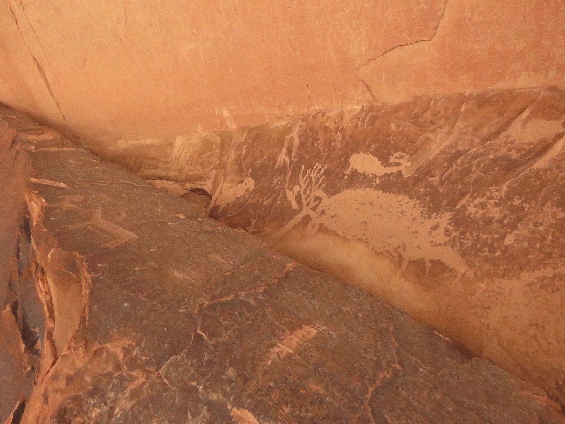 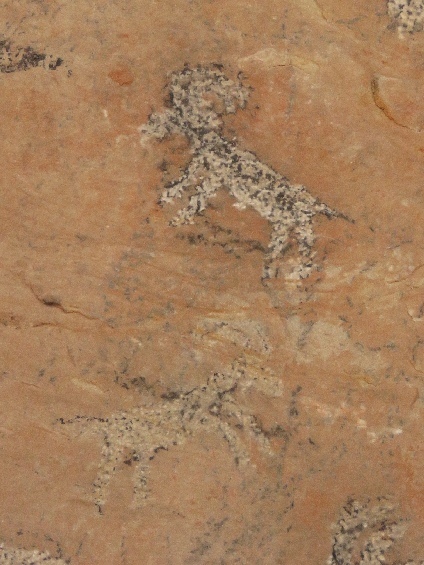 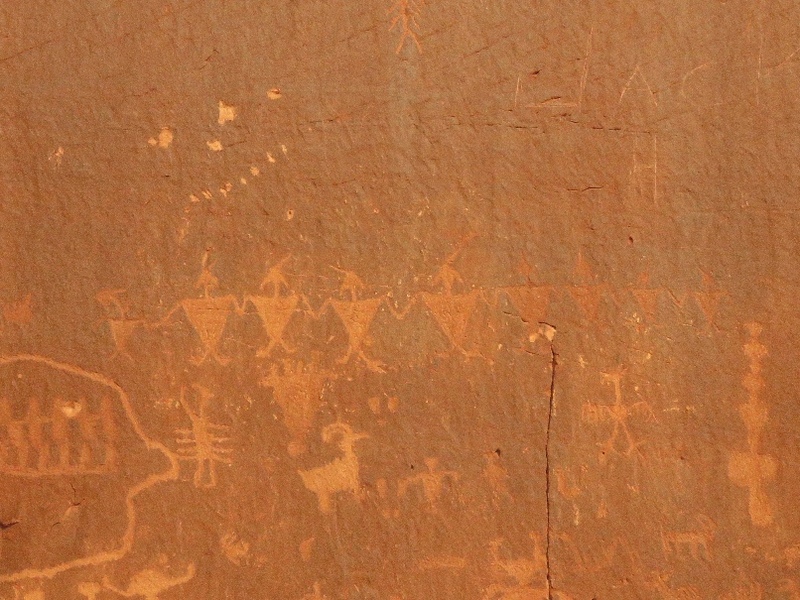 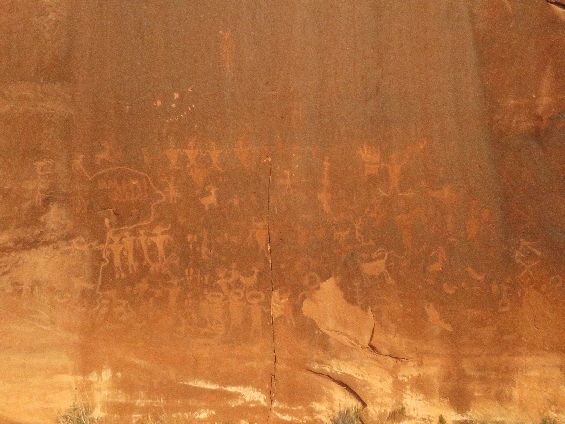 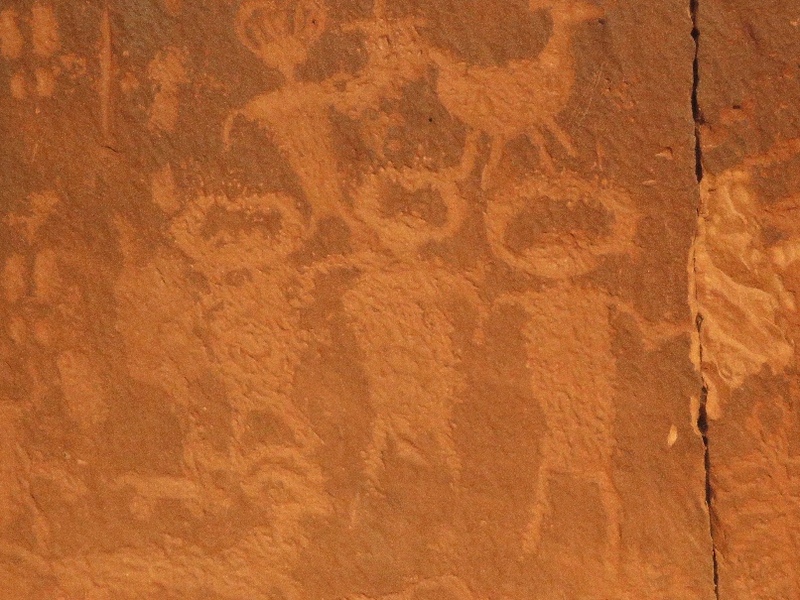 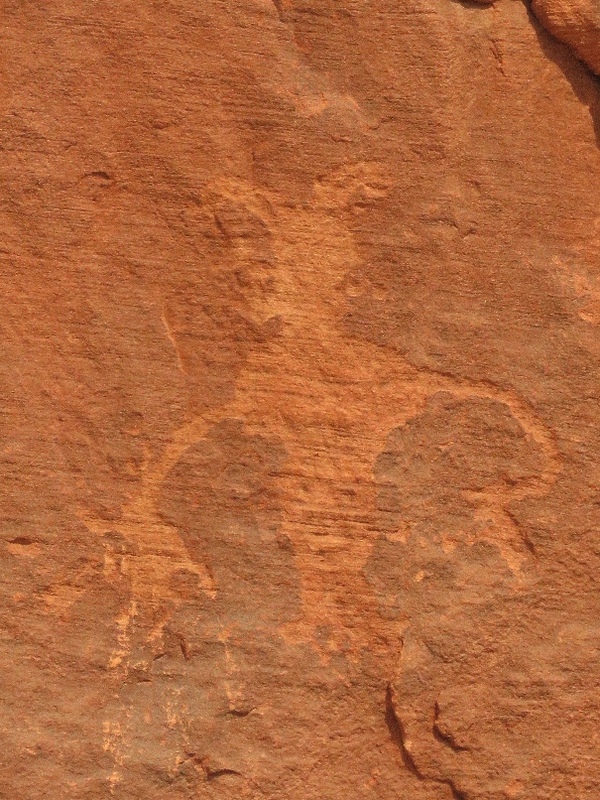 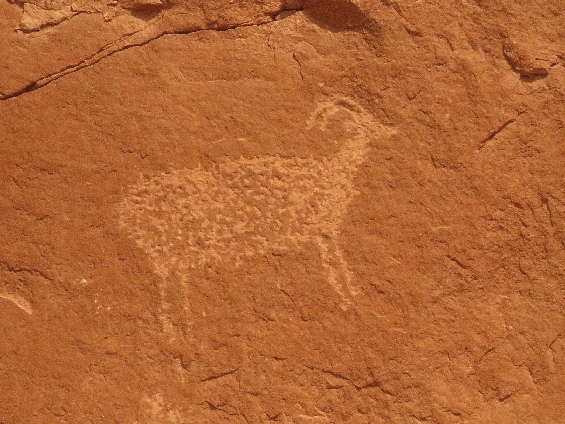 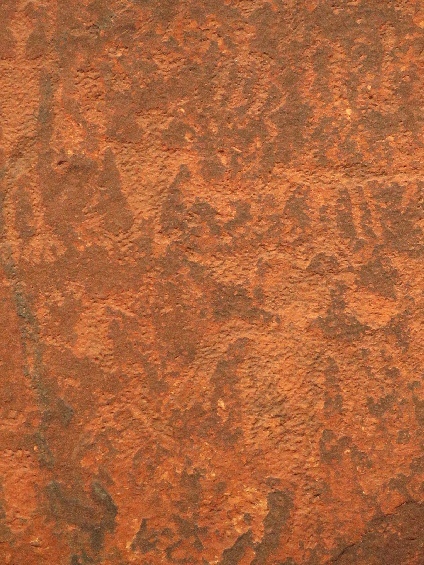 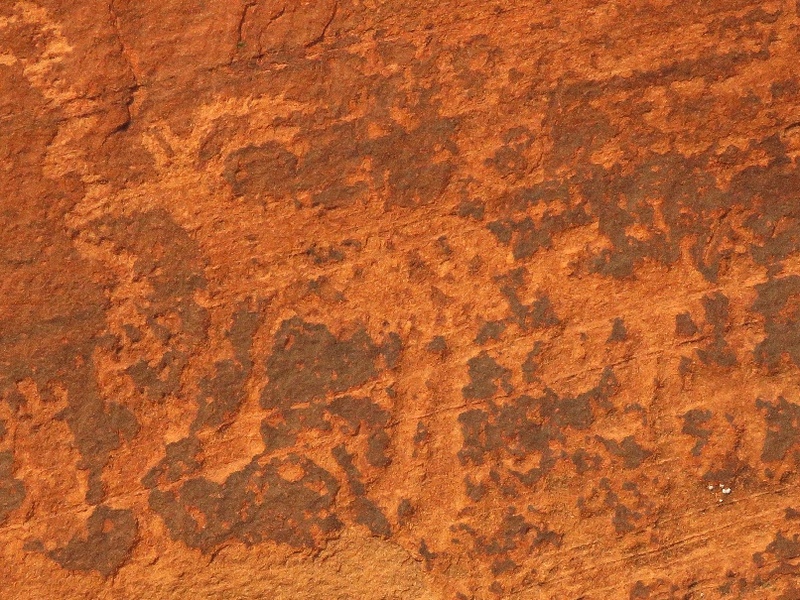 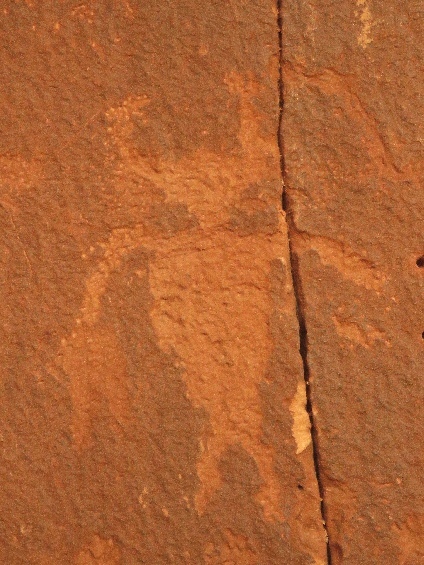 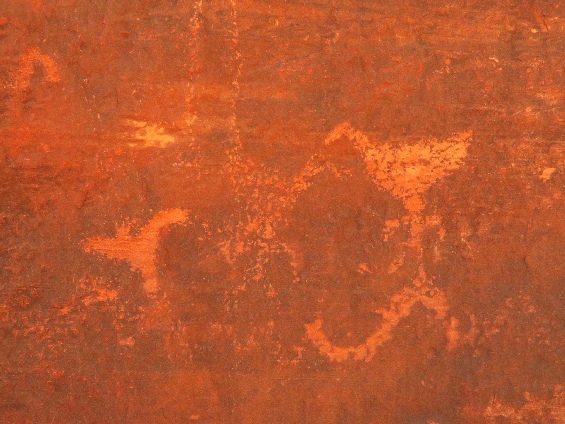 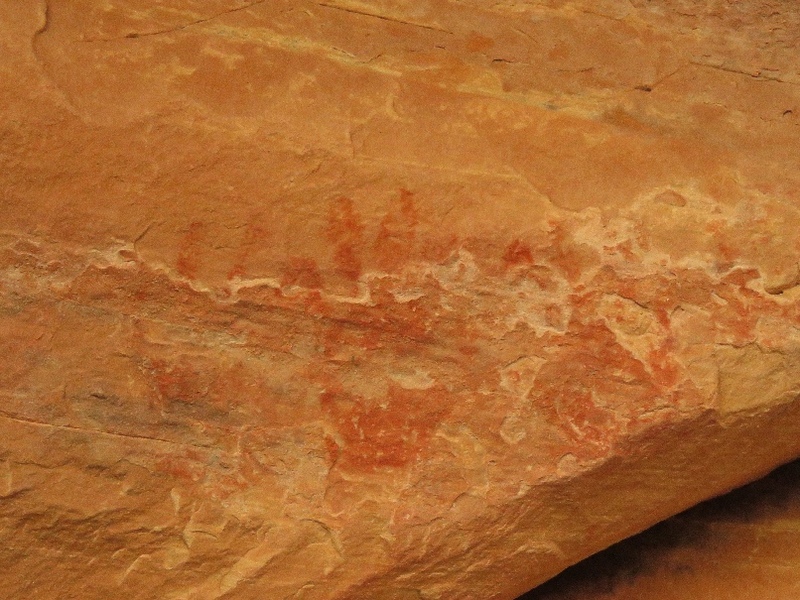 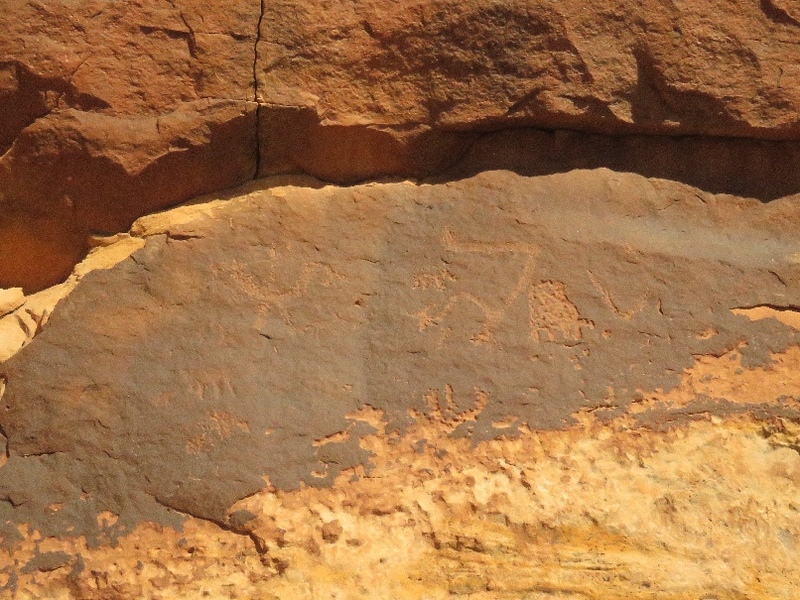 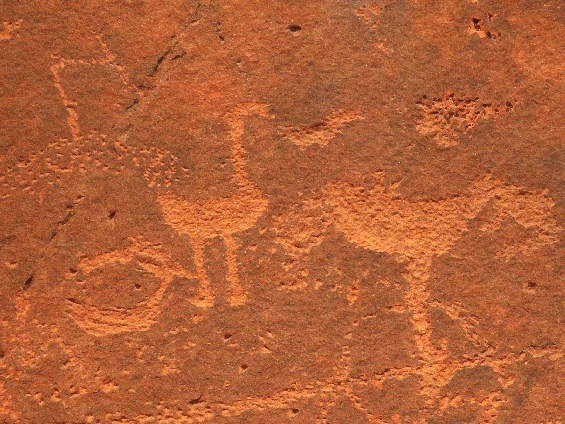 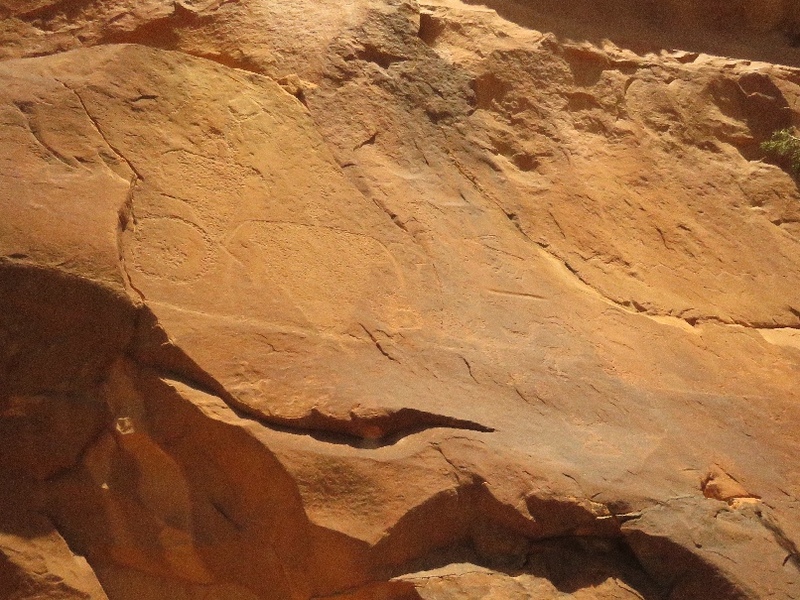 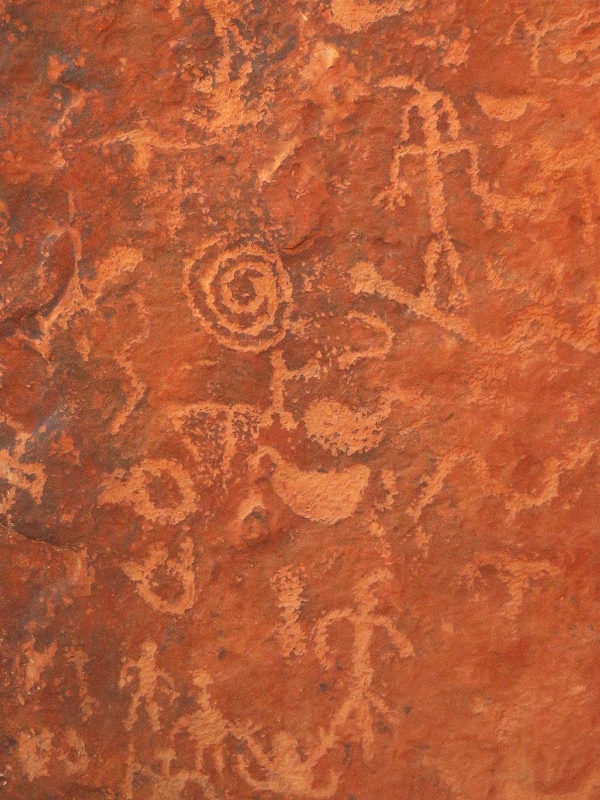 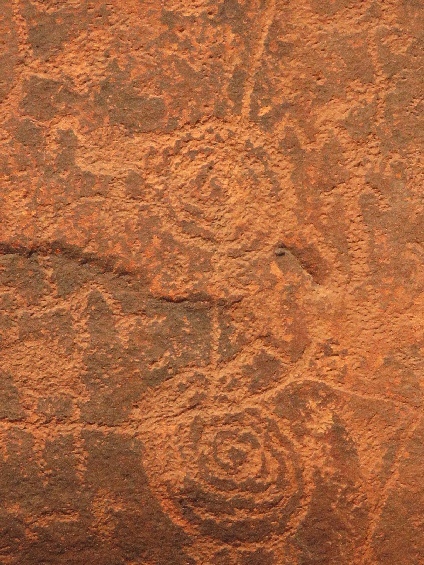 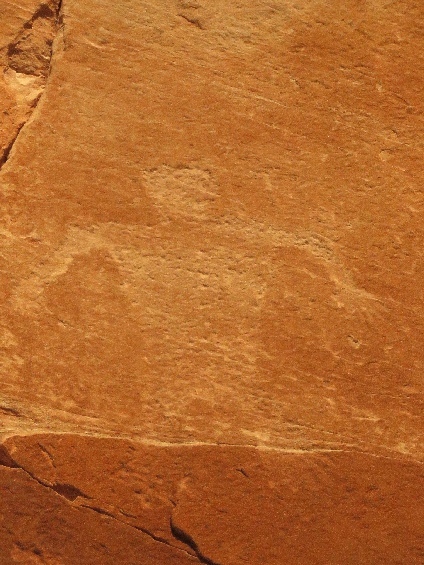 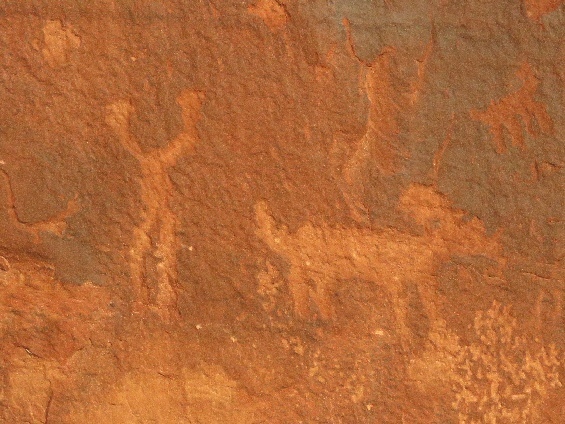 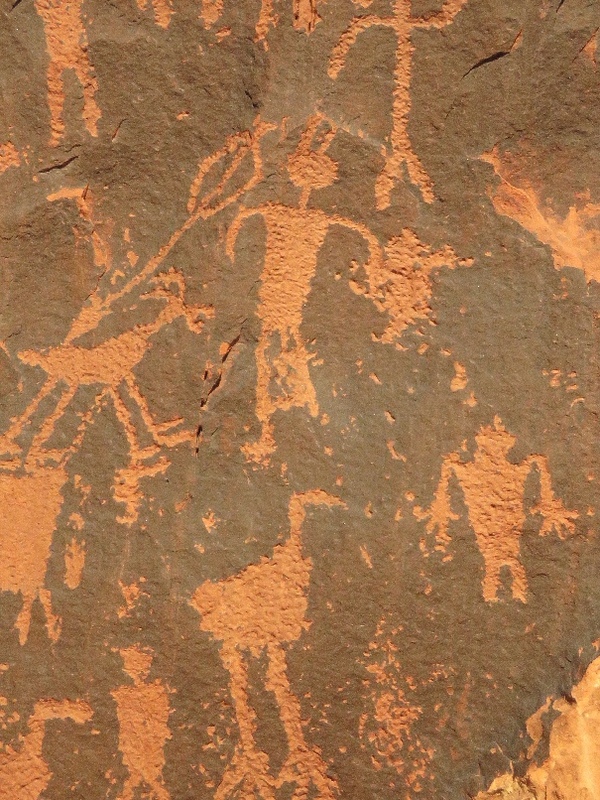 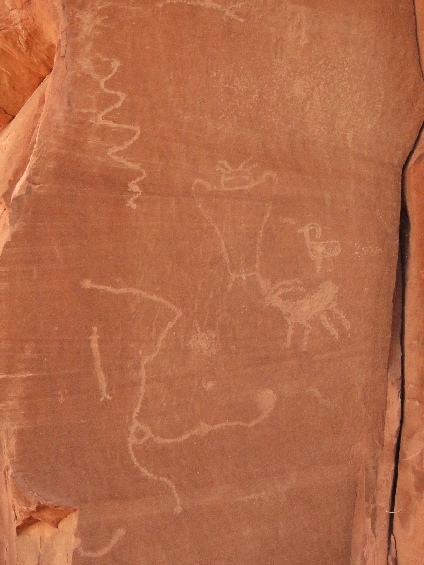 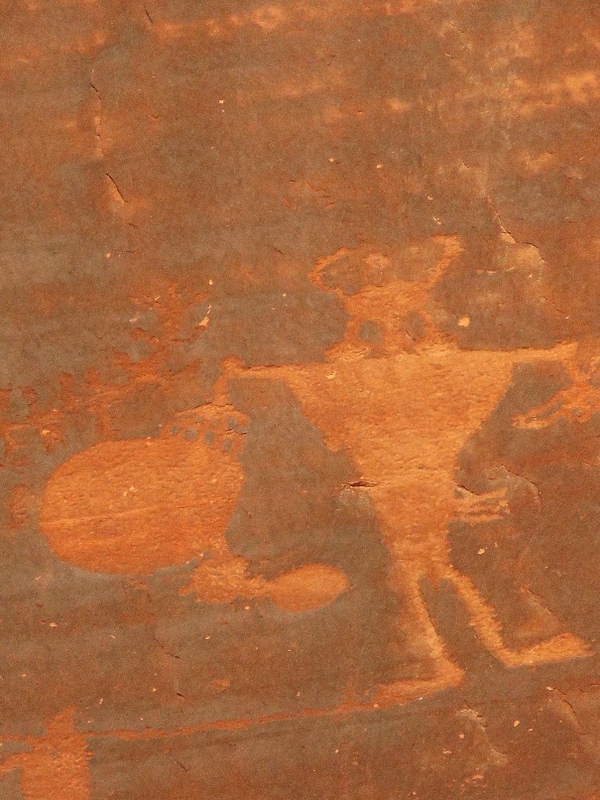 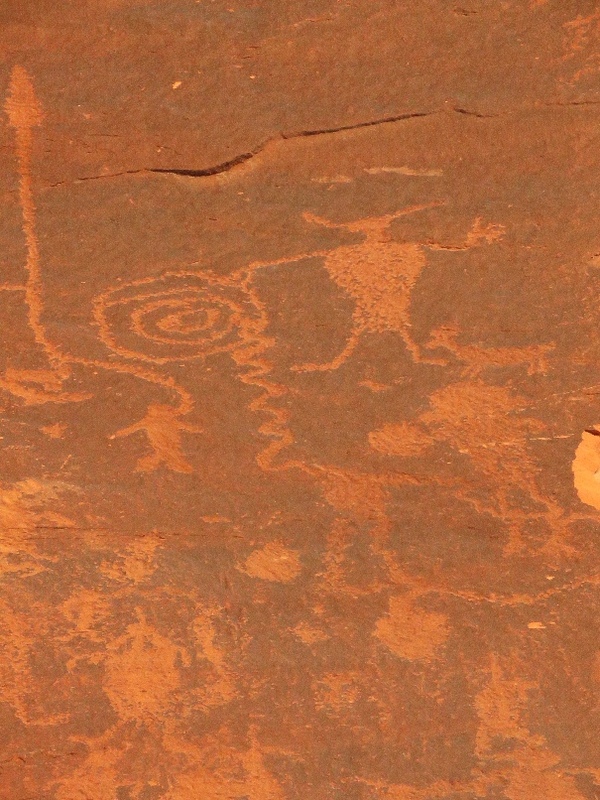 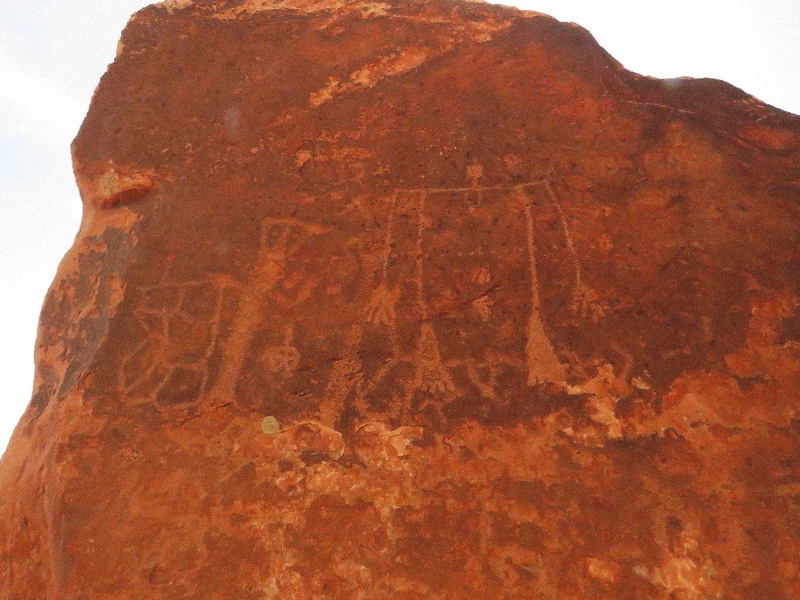 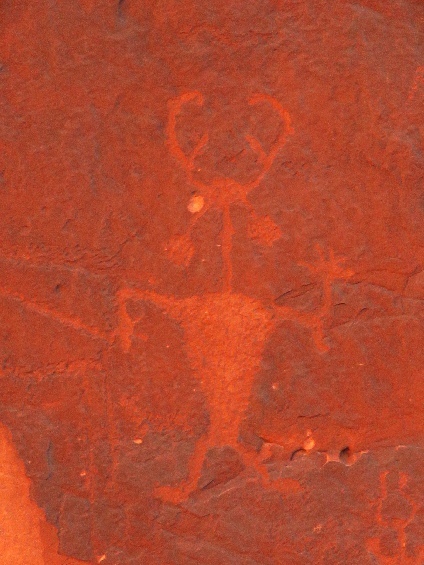 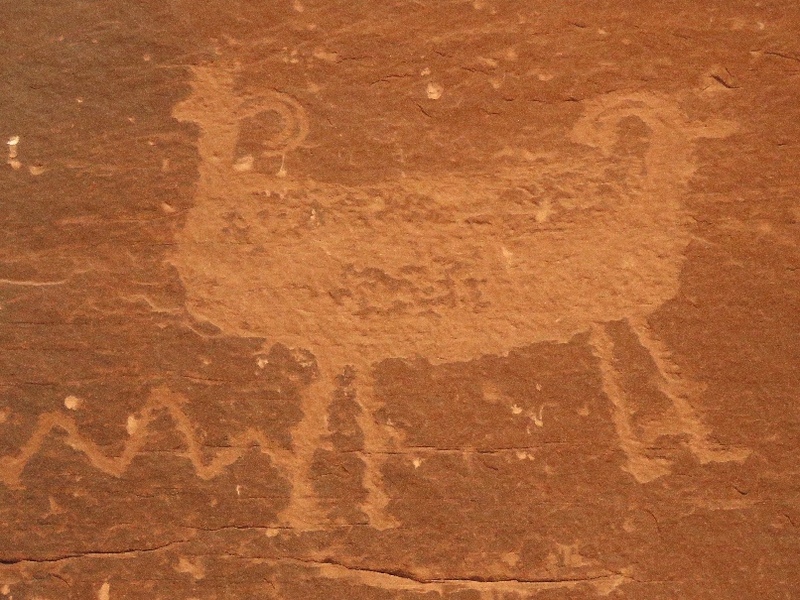 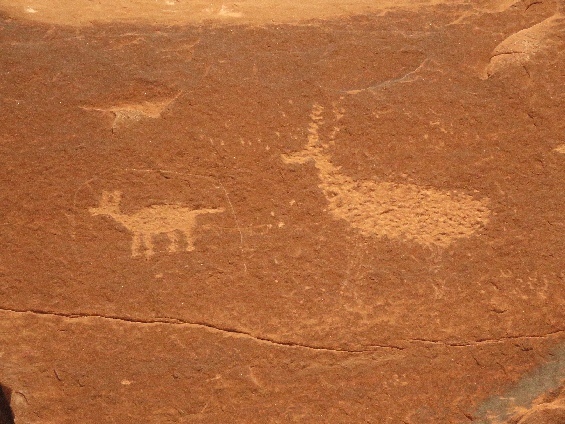 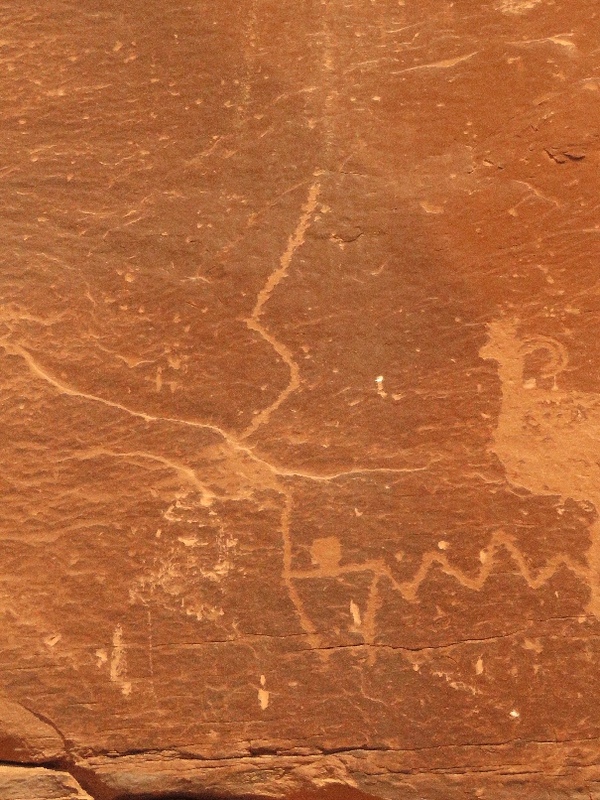 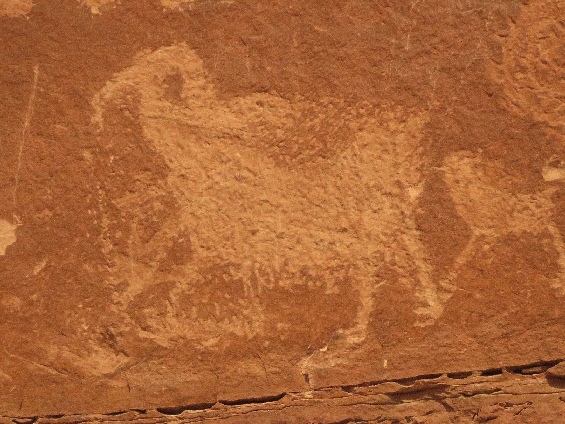 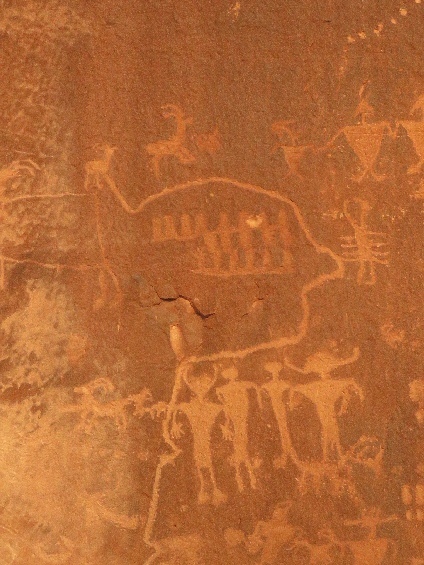 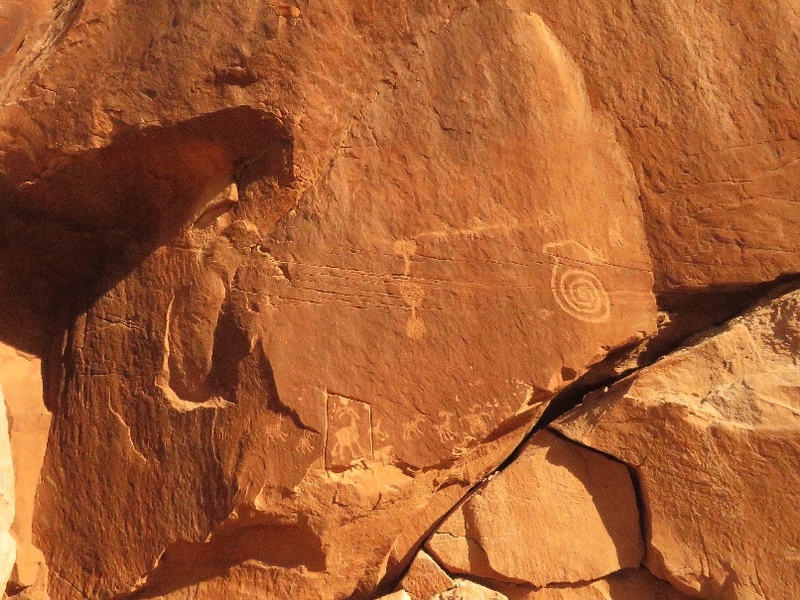 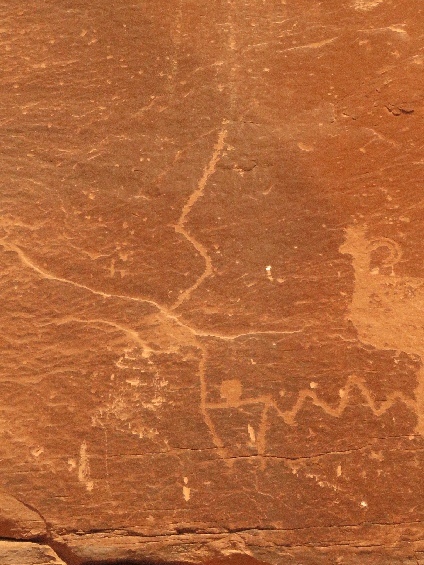 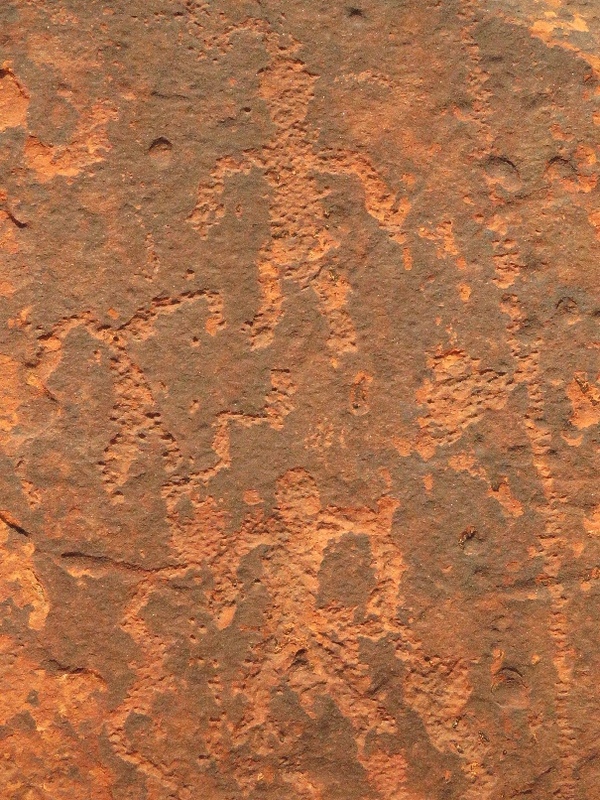 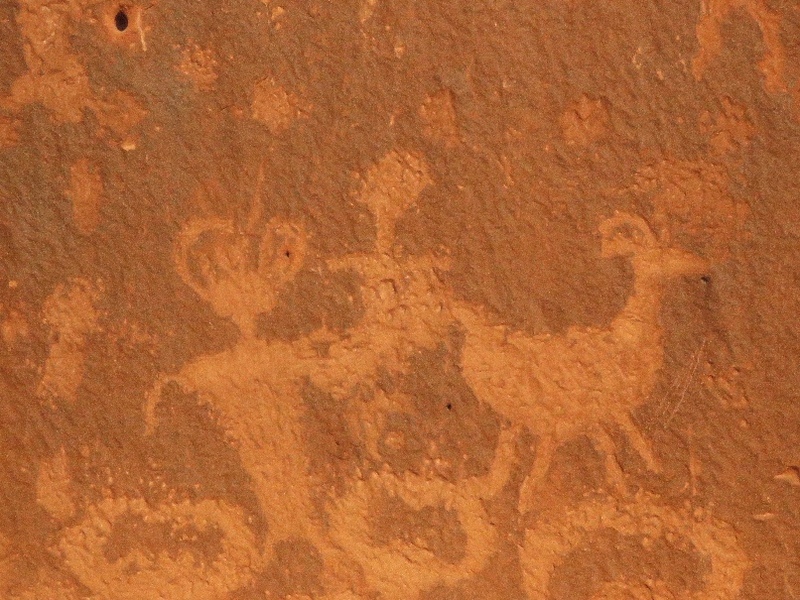 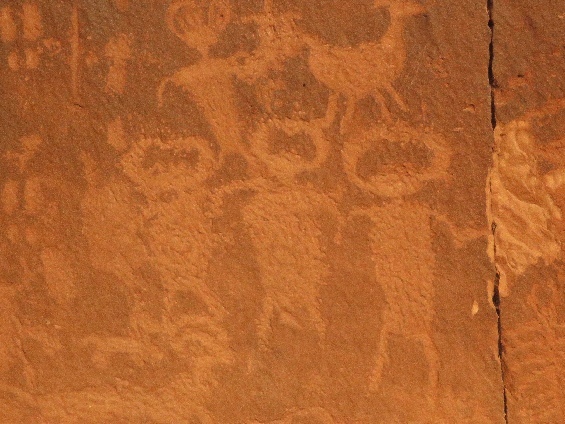 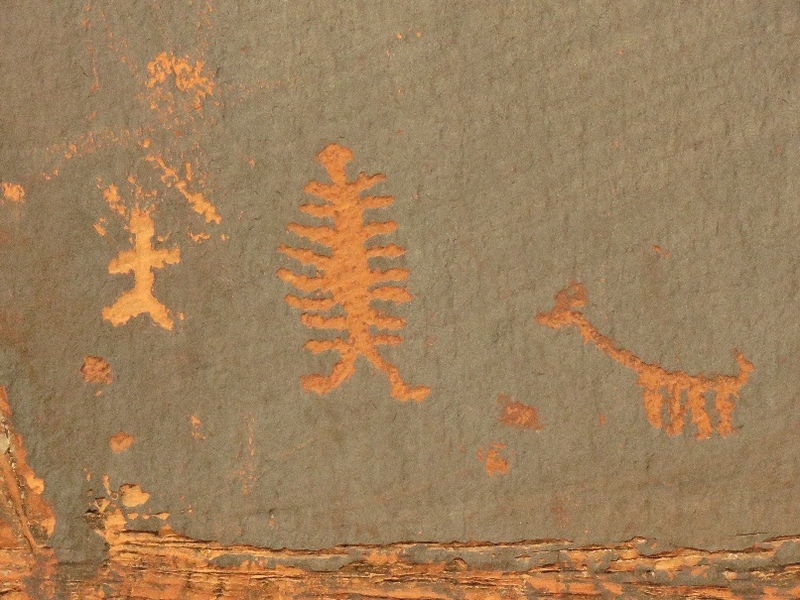 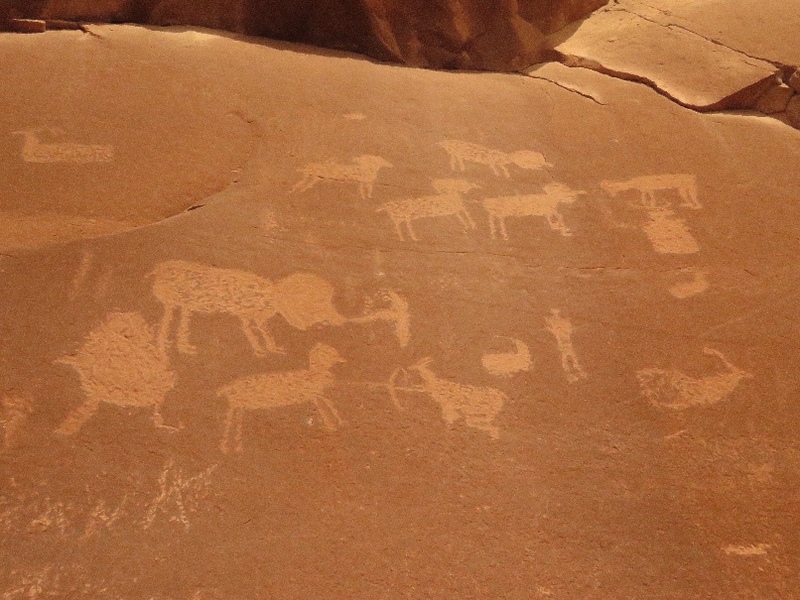 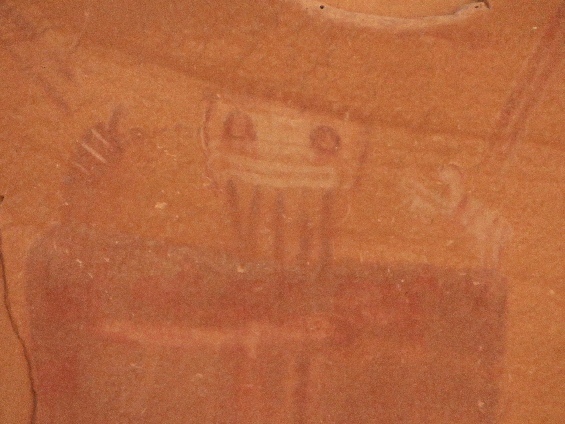 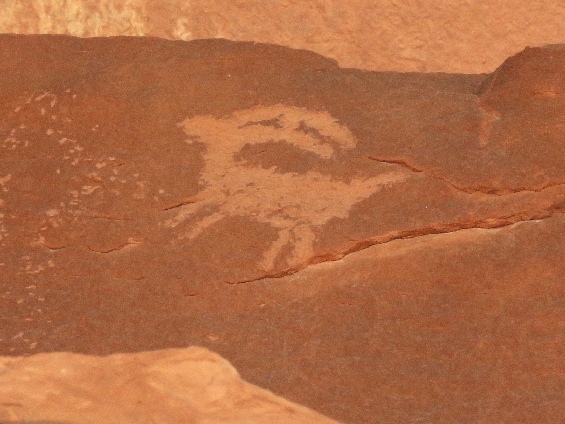 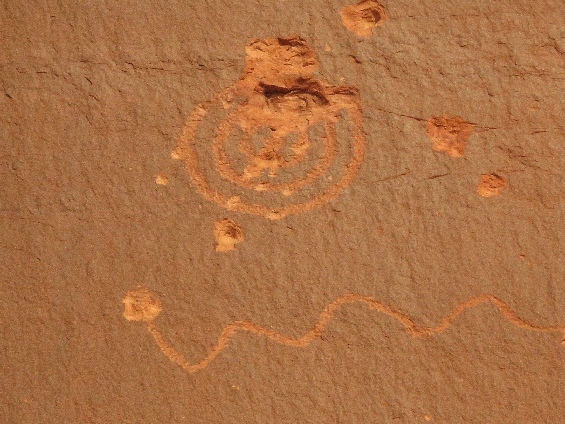 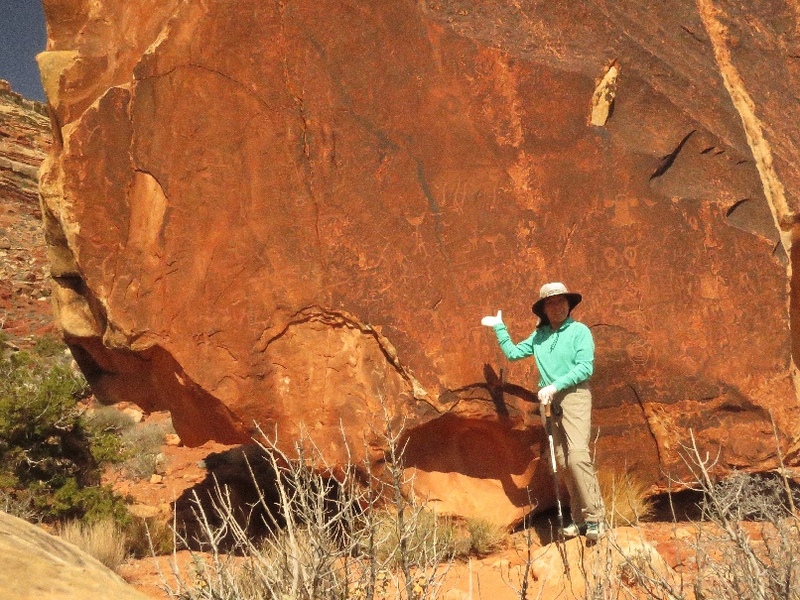 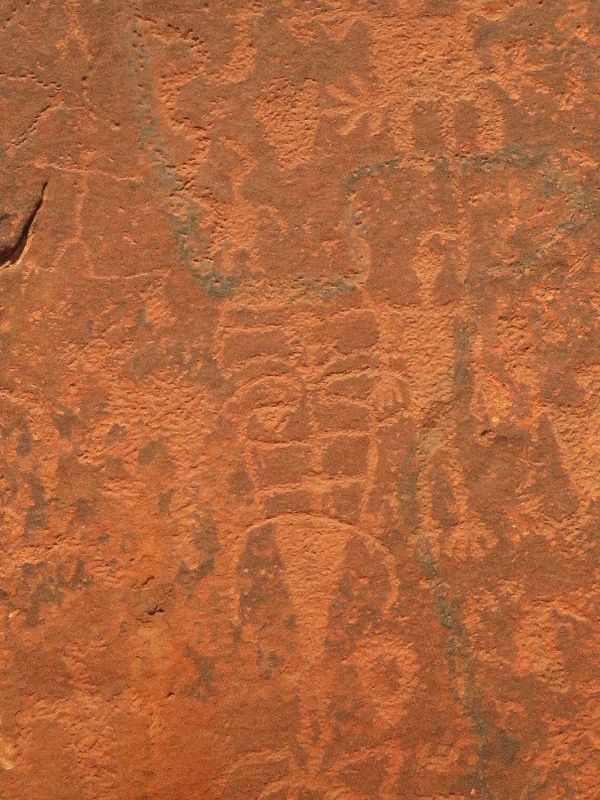 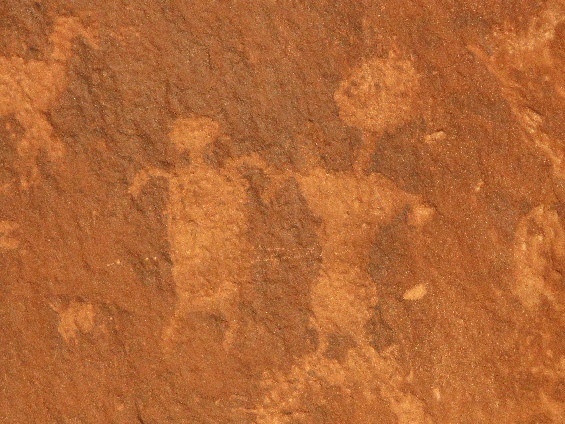 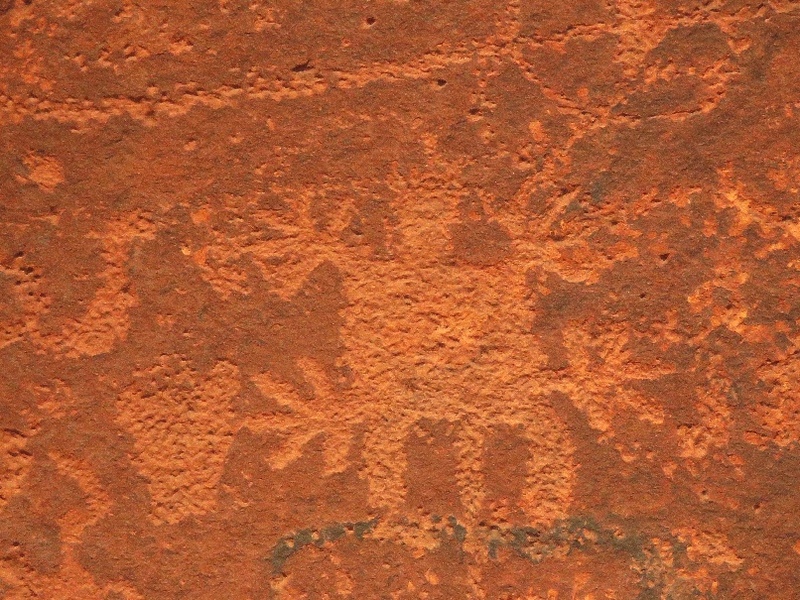 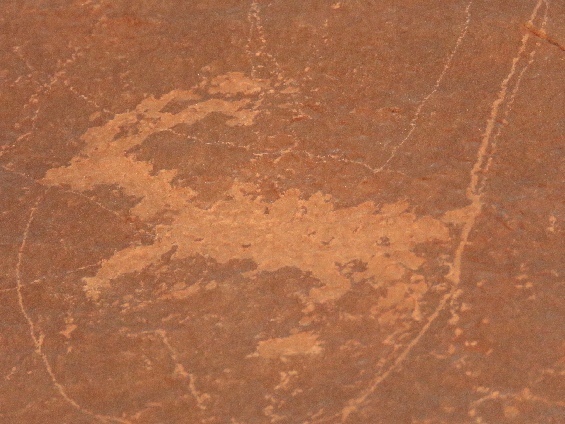 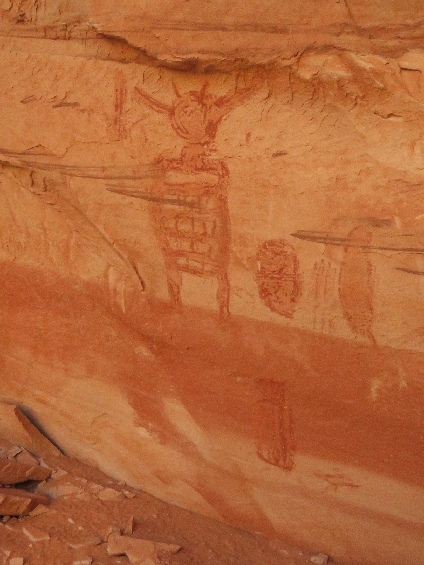 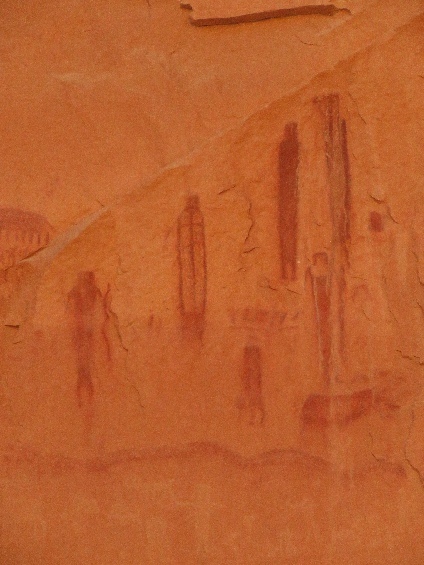 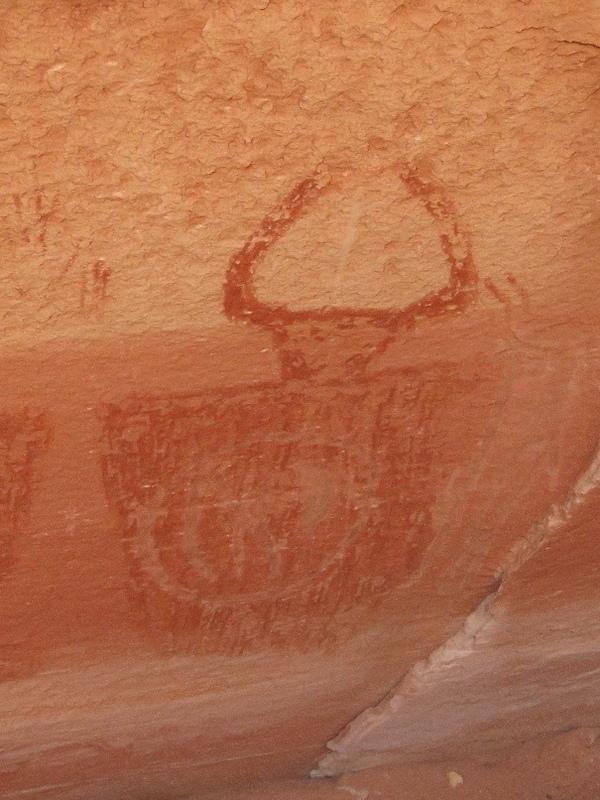 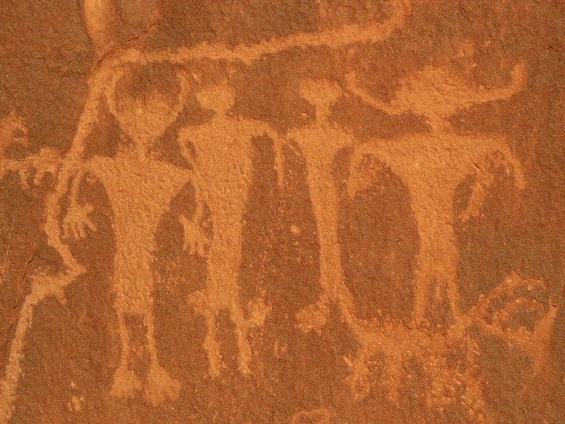 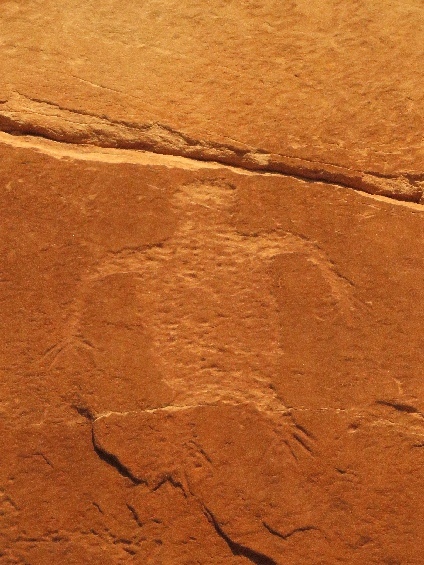 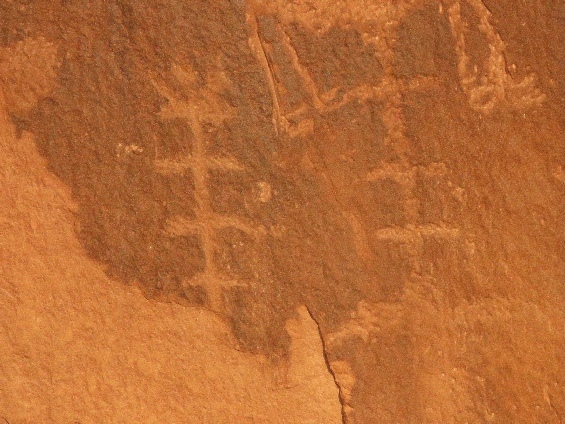 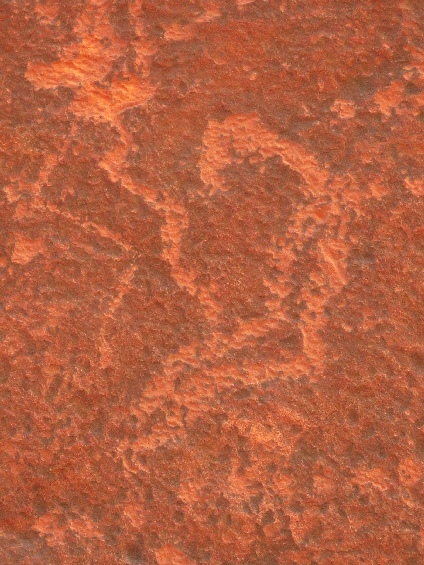 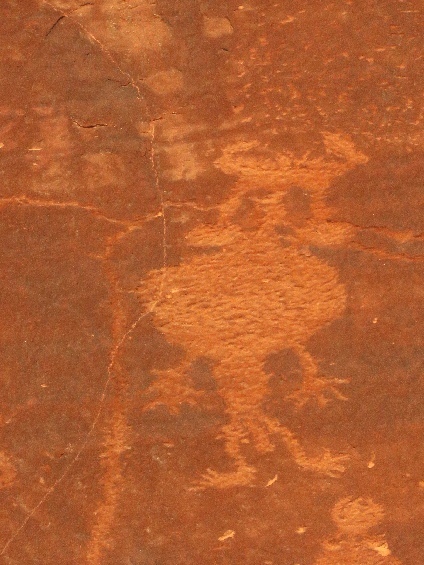 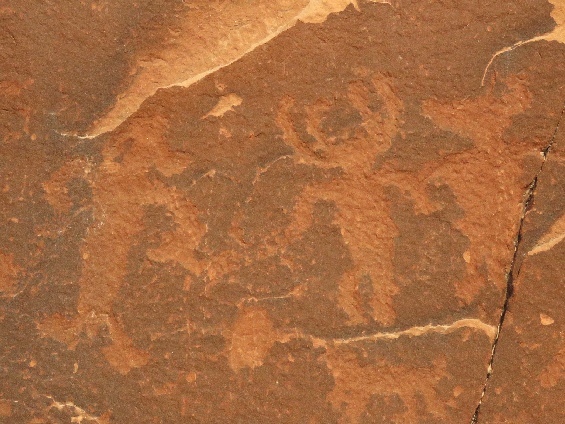 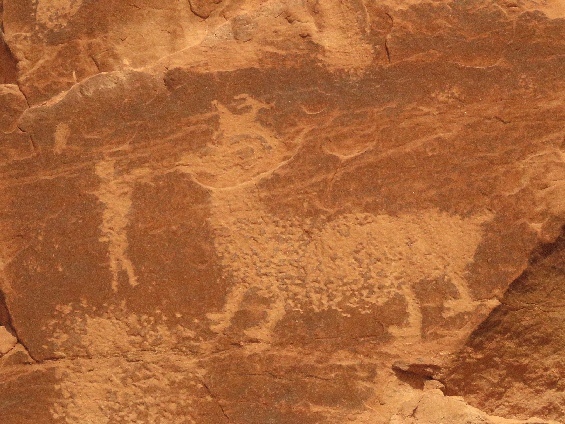 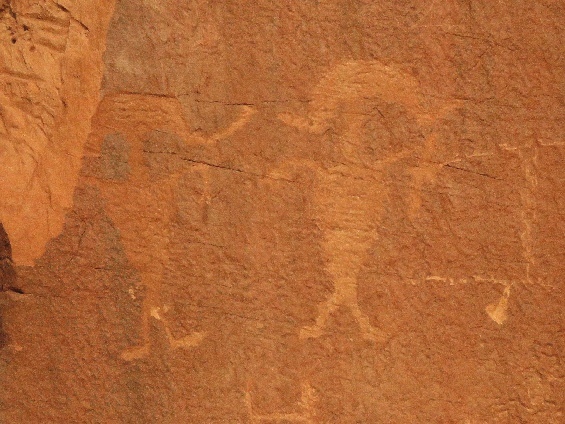 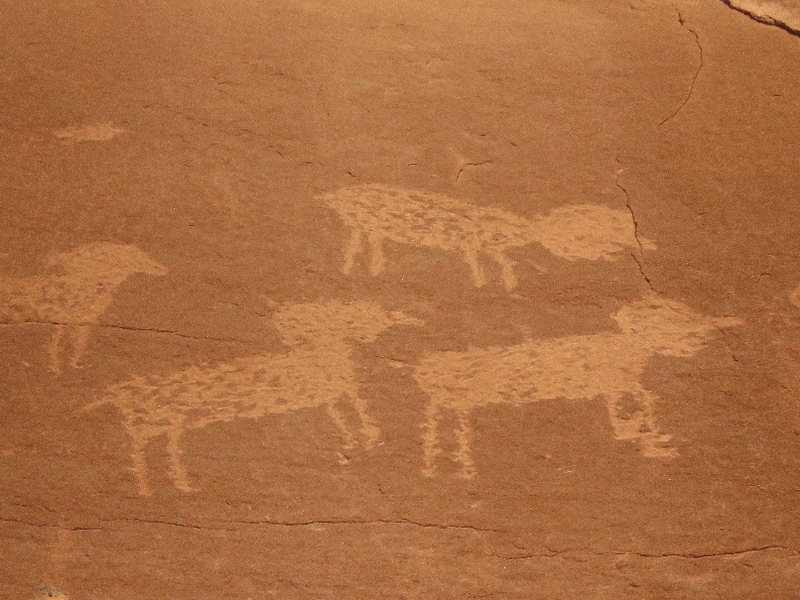 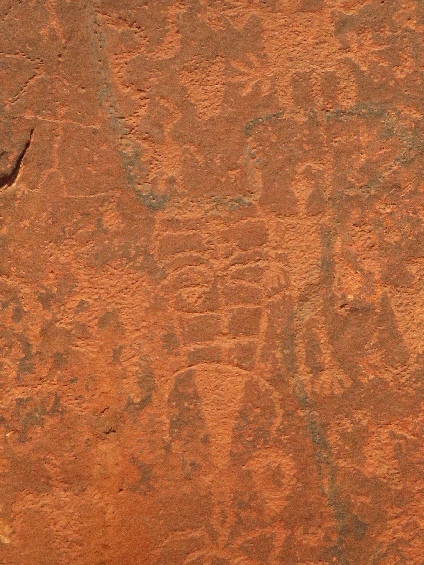 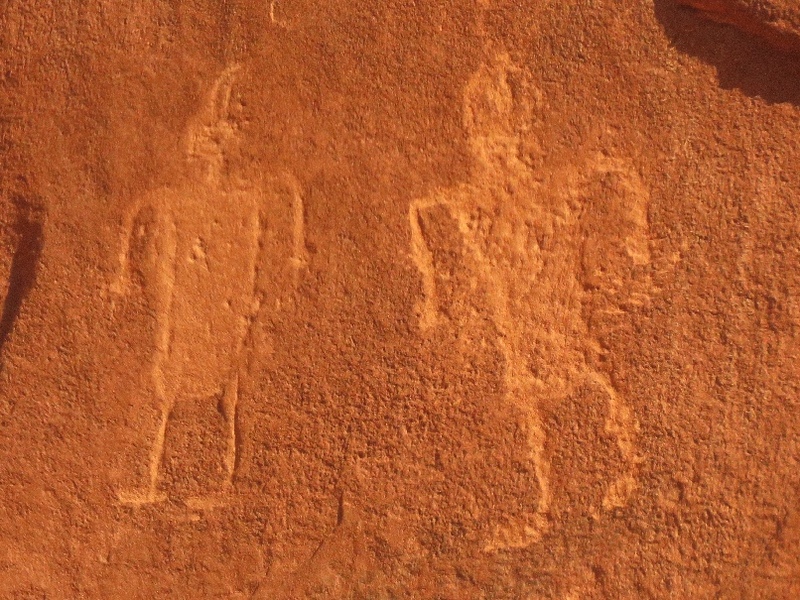 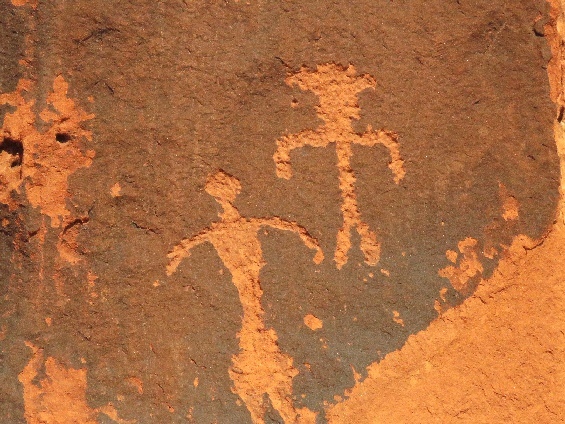 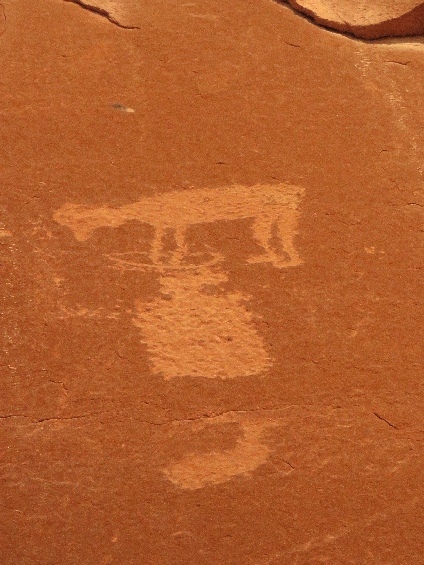 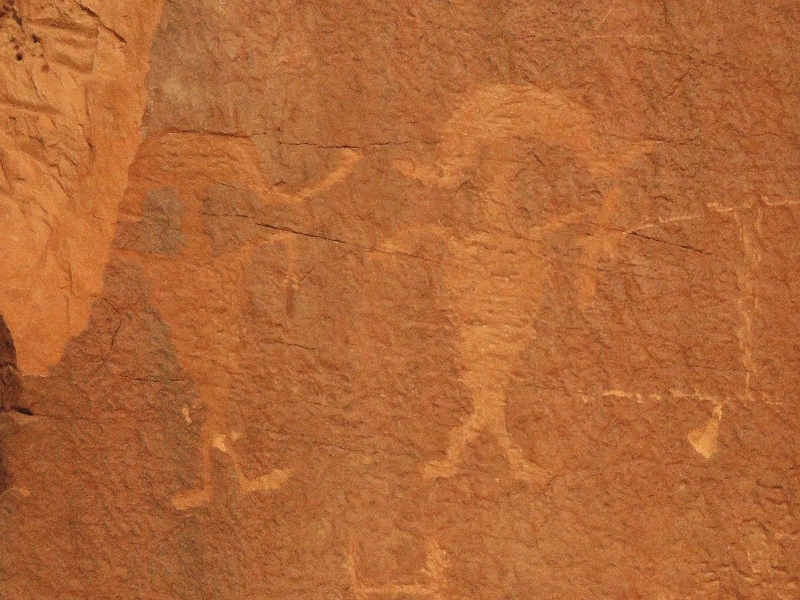 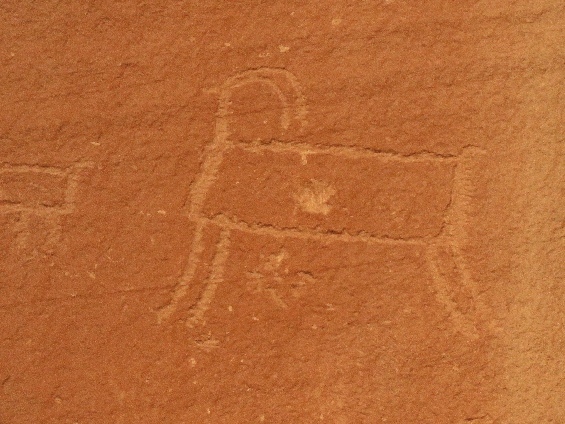 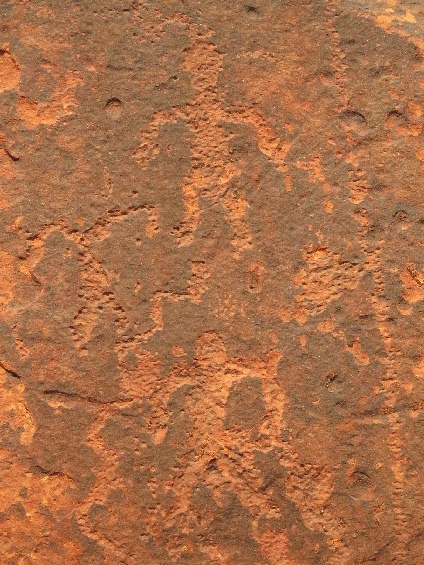 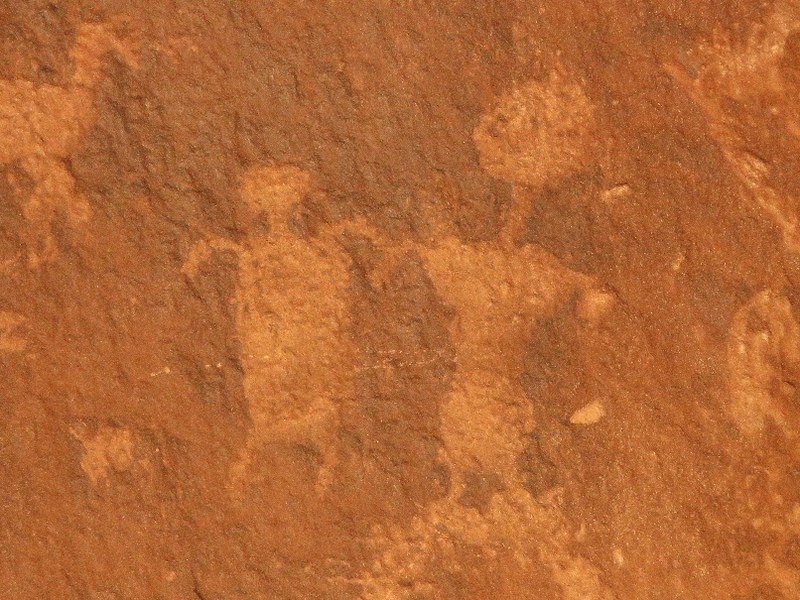 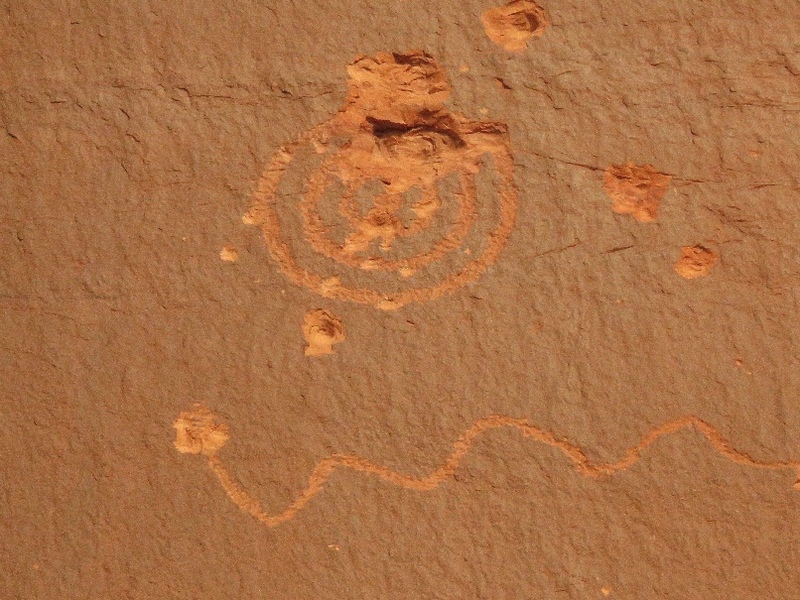 3/27/2019 Courthouse Wash Rock Art Panel, Arches National Park, UT - There are both petroglyphs and pictographs in this site. 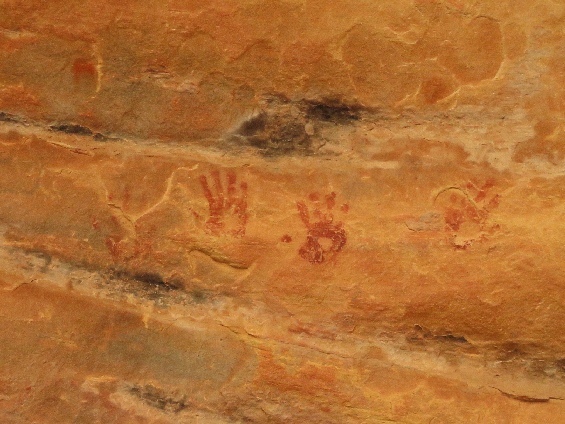 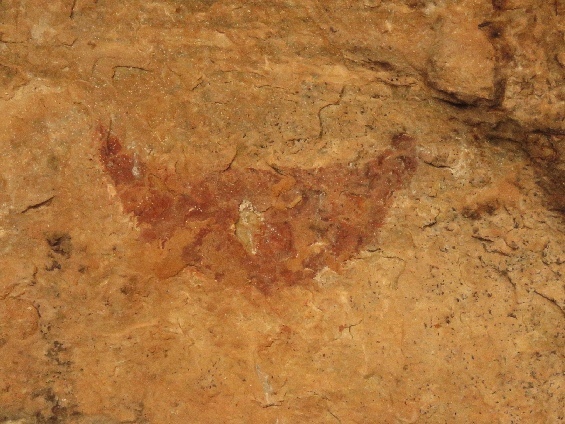 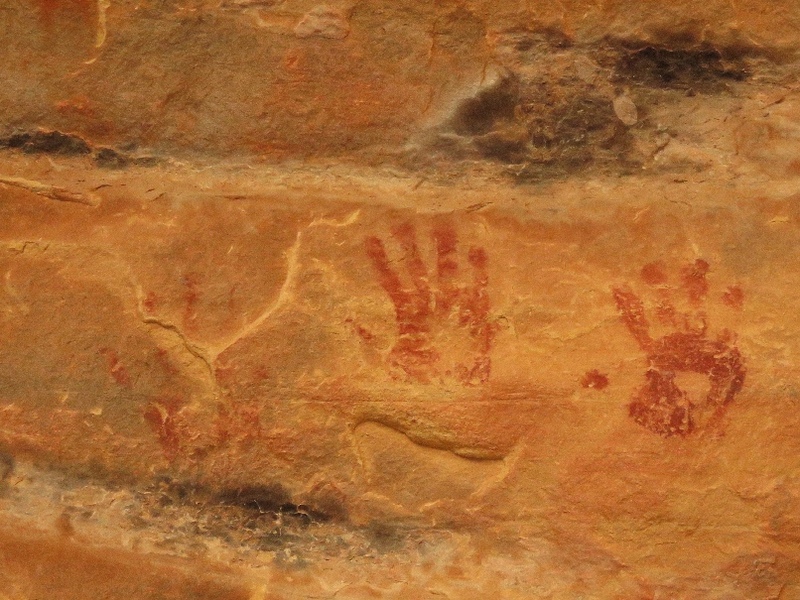 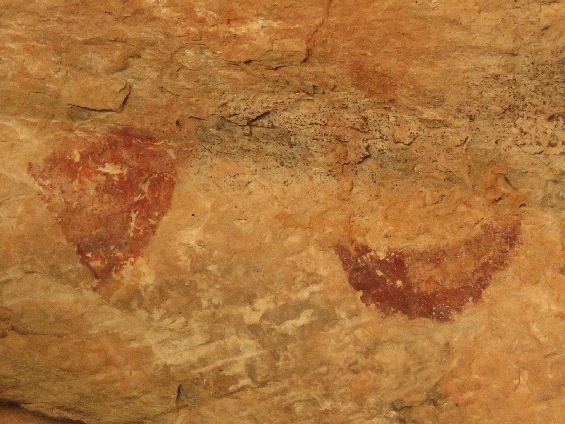 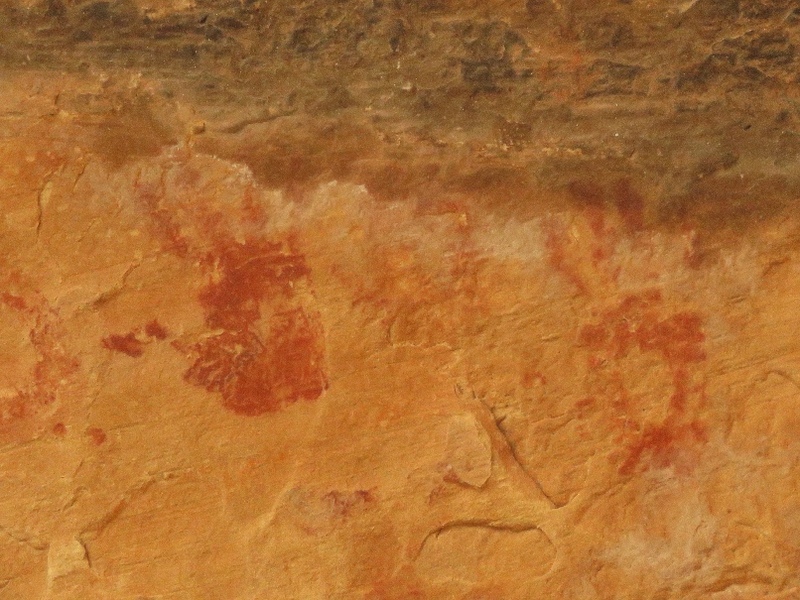 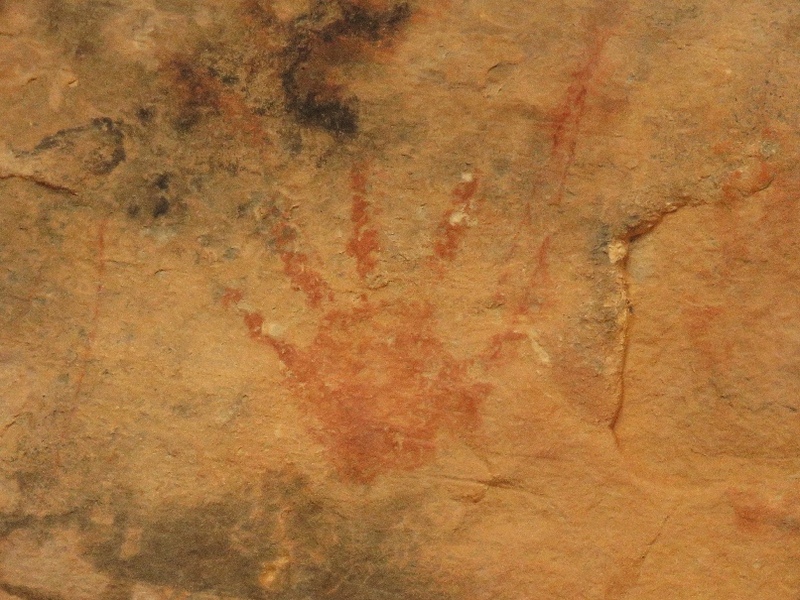 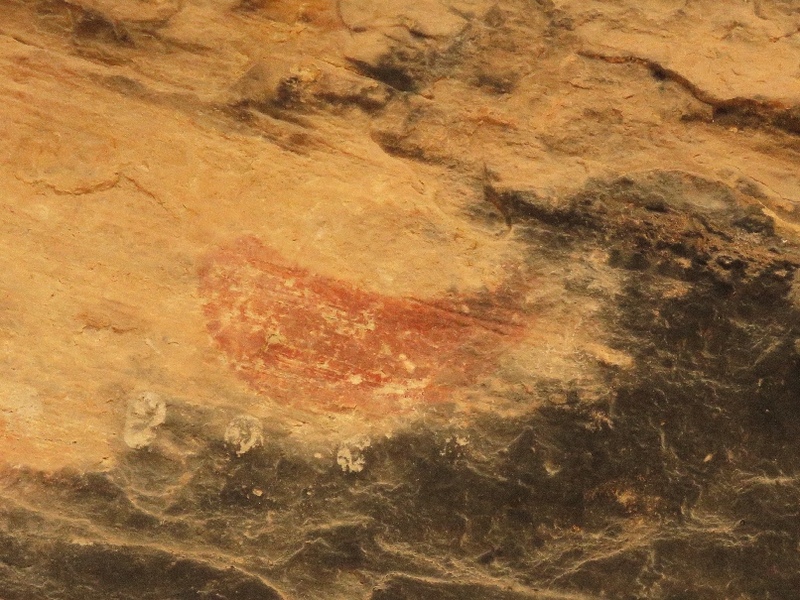 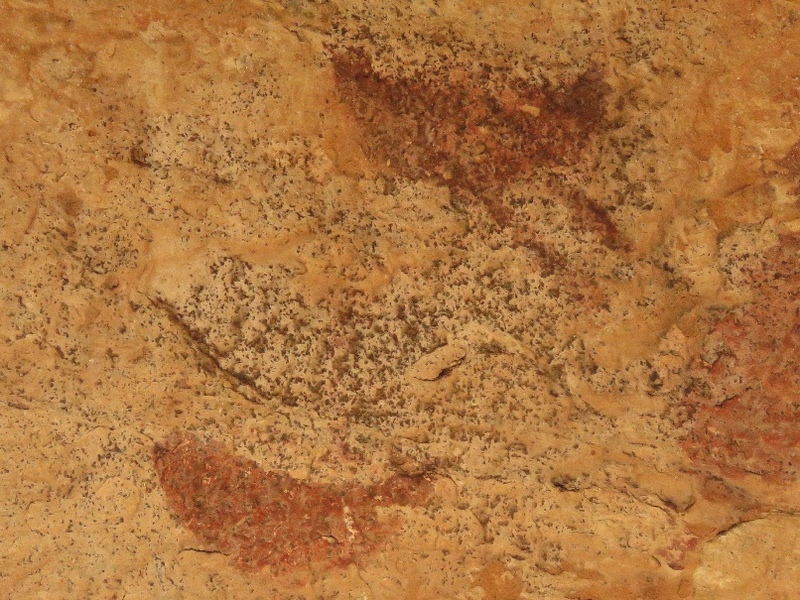 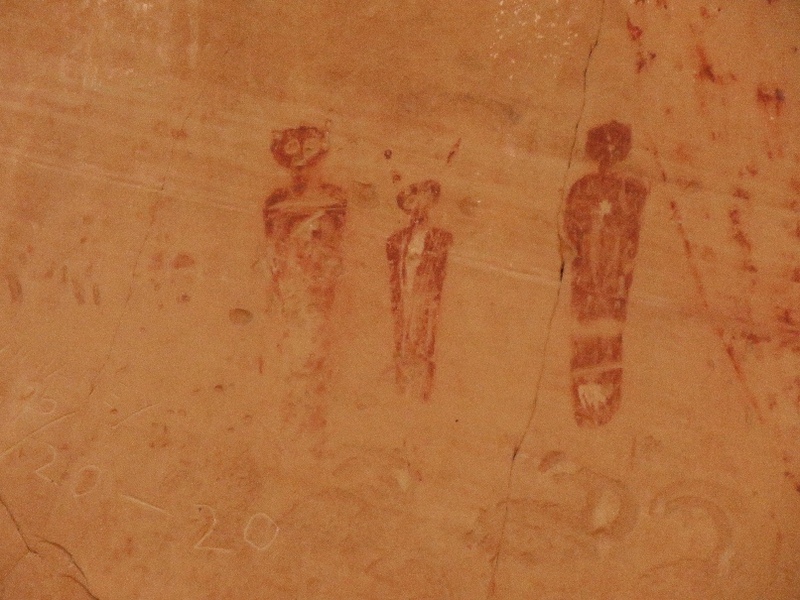 Pictographs are fading out, but still we can see it. From this place, busy highway #191 traffic is just below us. 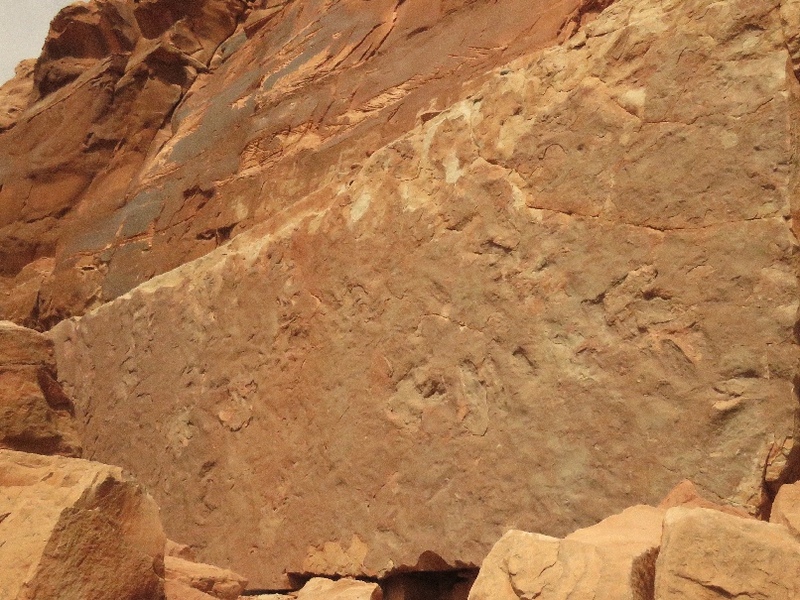 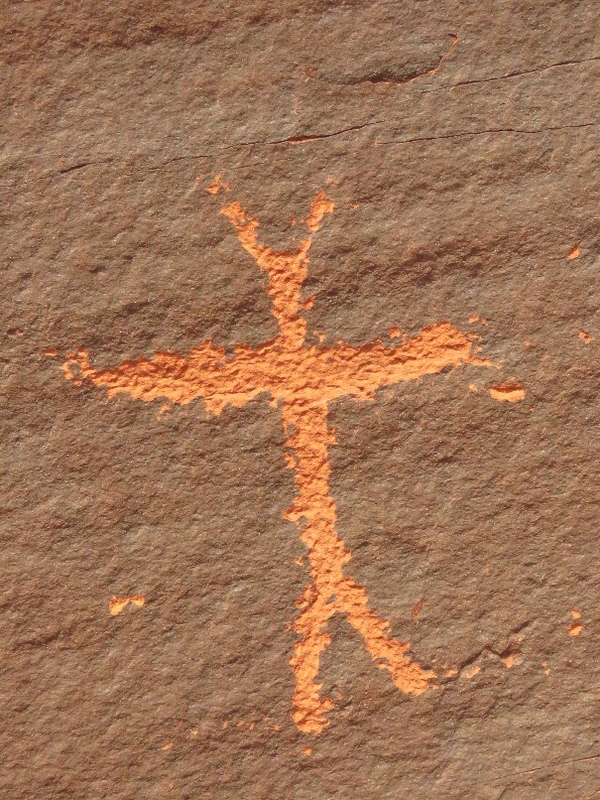 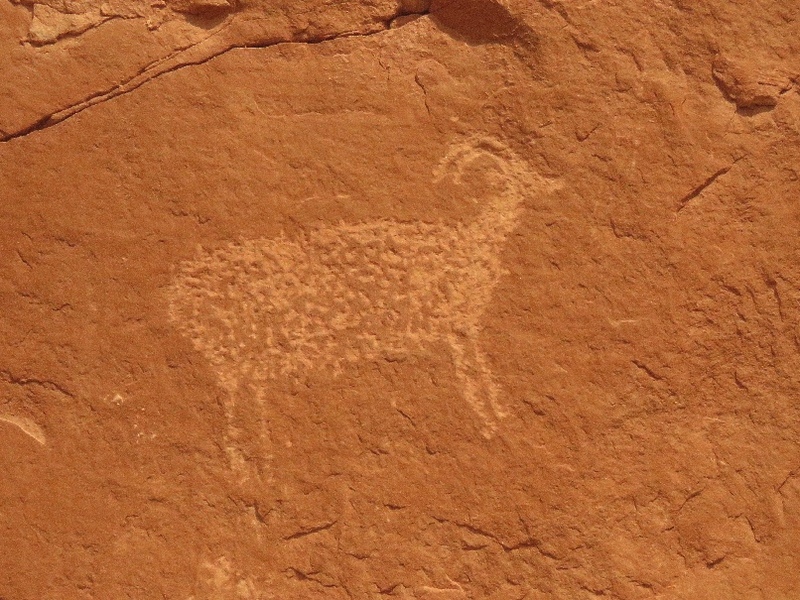 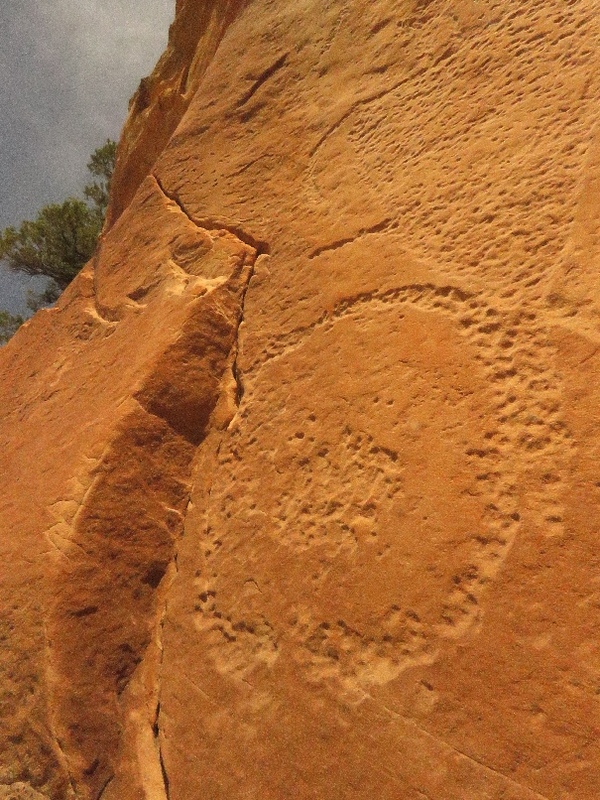 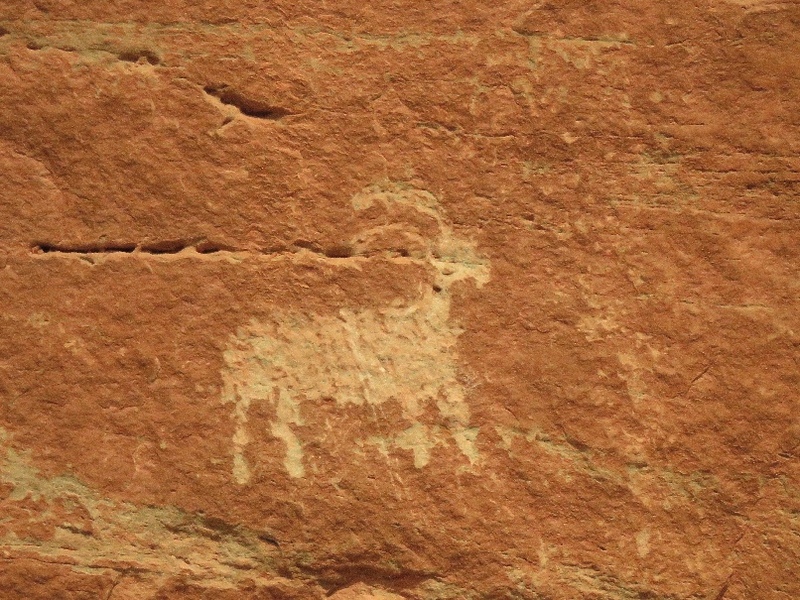 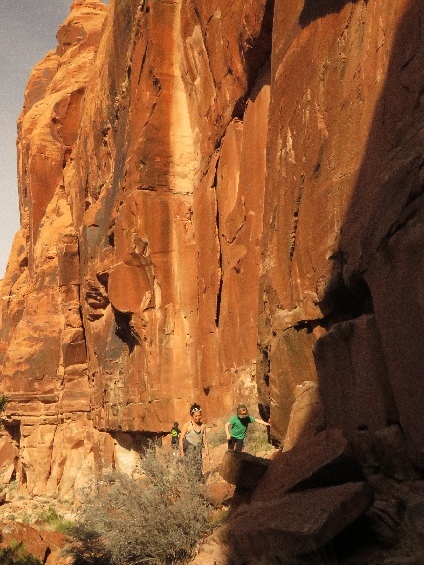 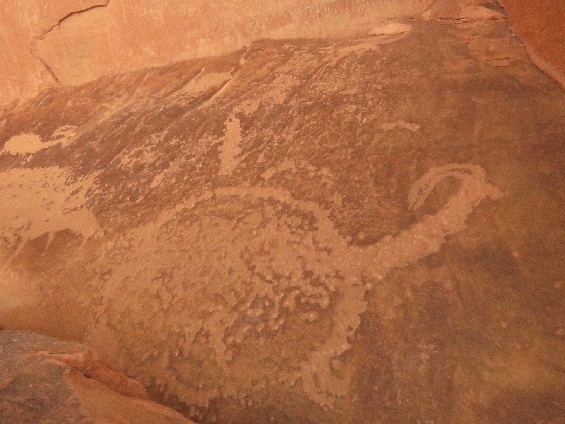 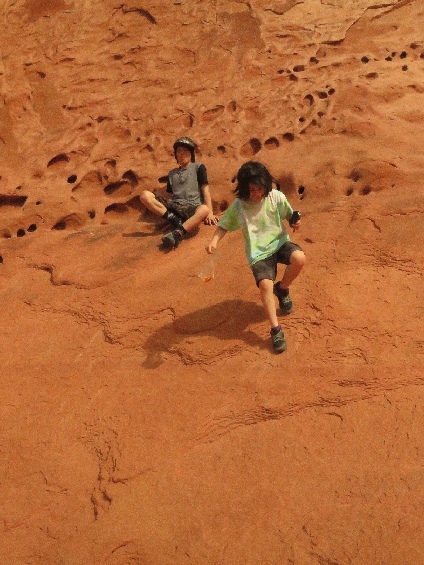 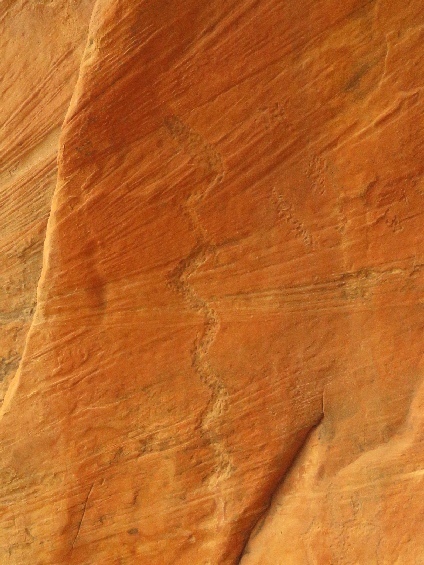 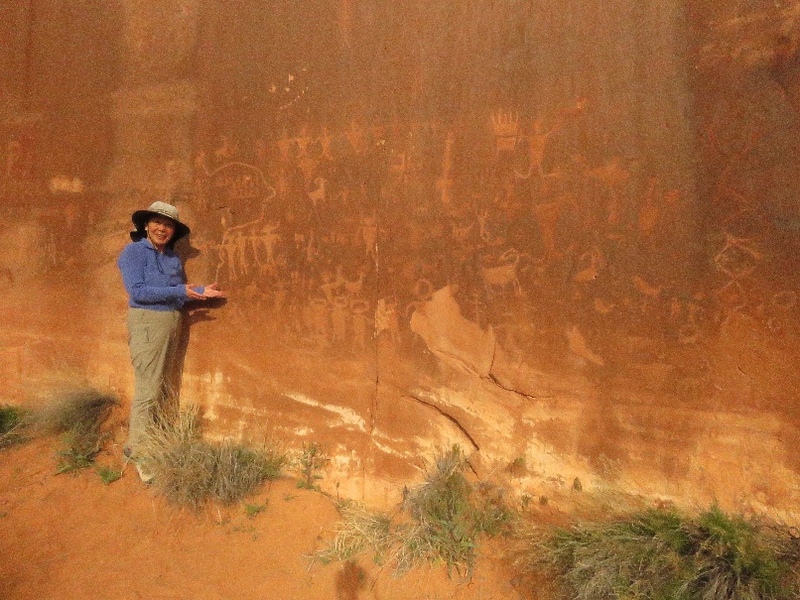 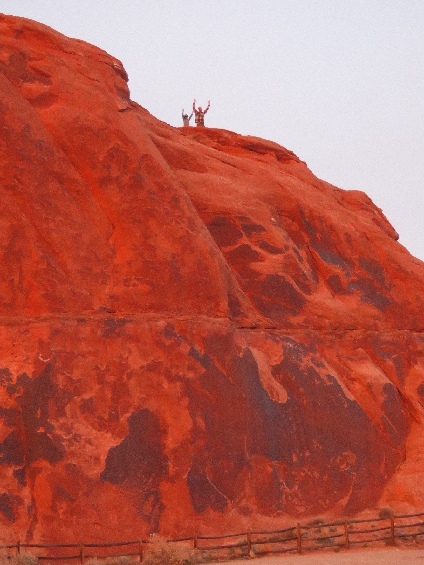 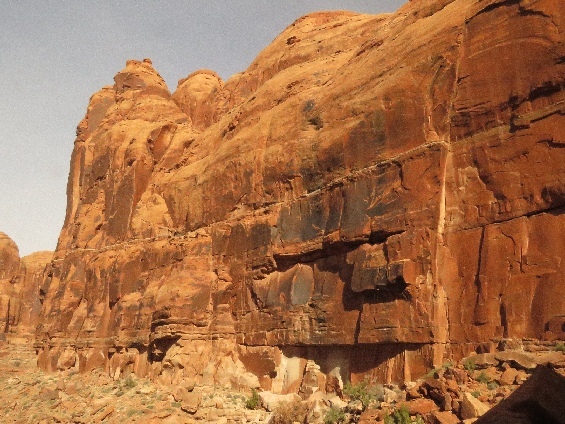 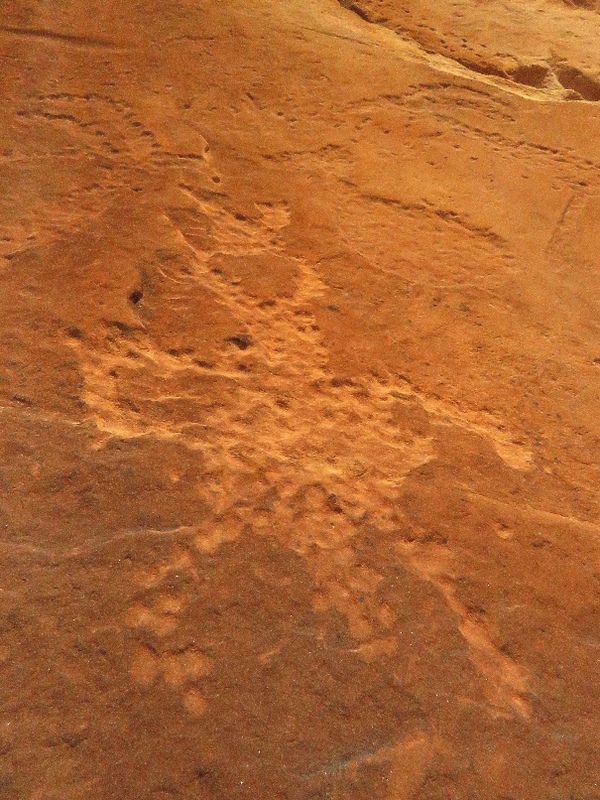 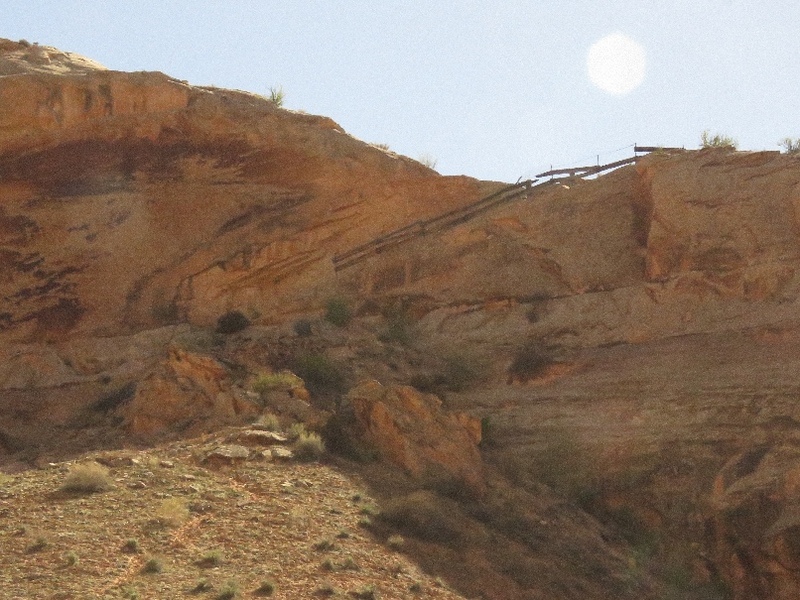 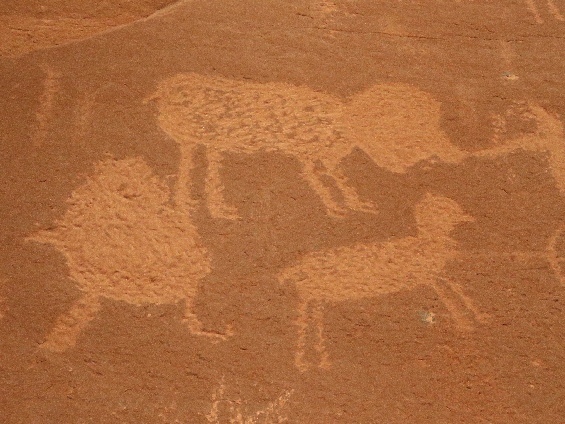 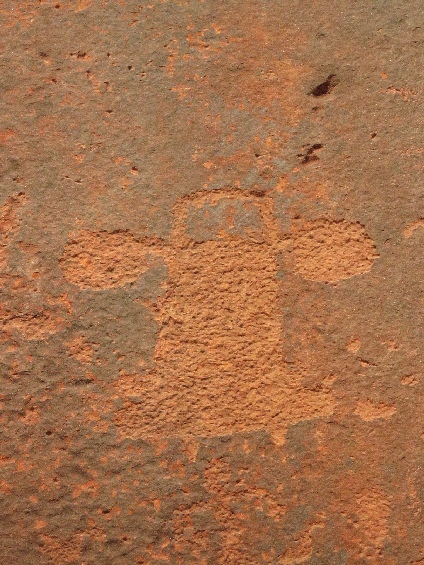 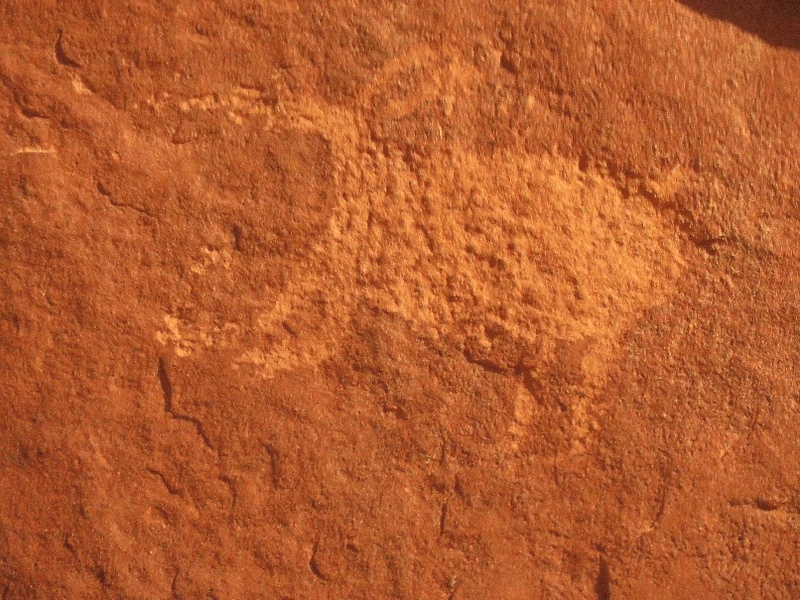 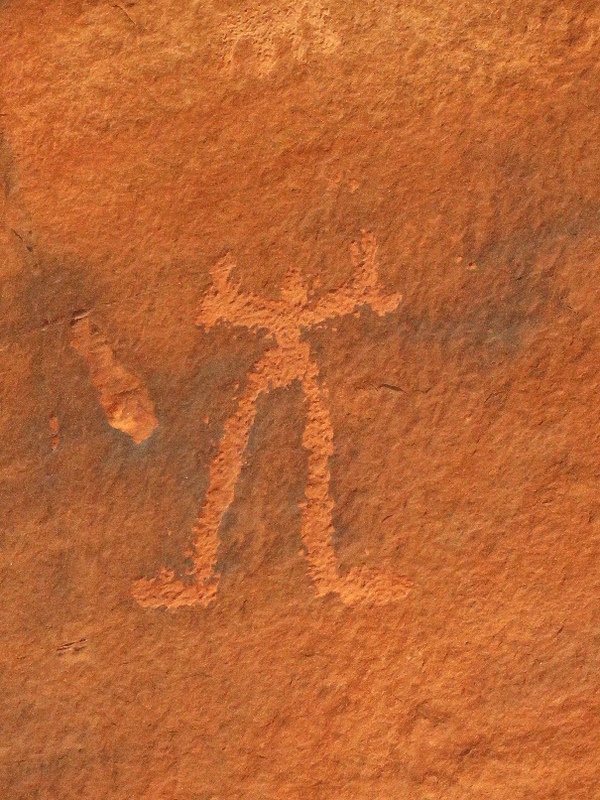 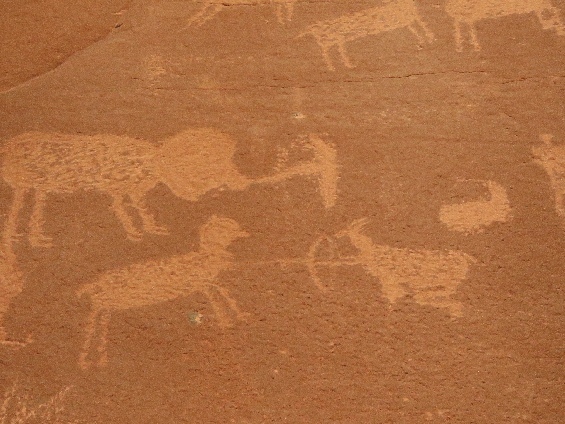 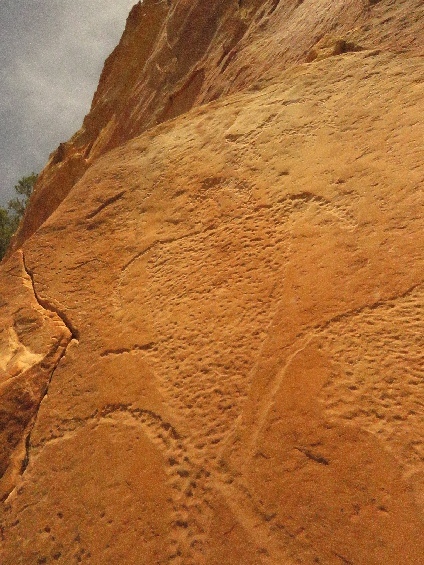 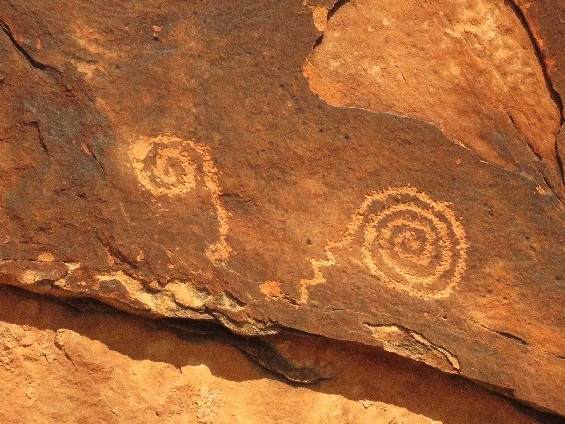 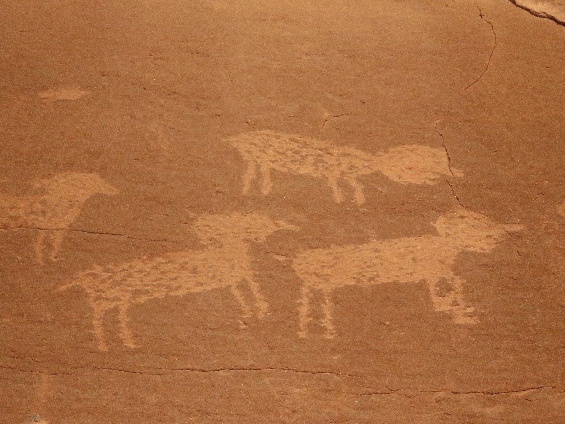 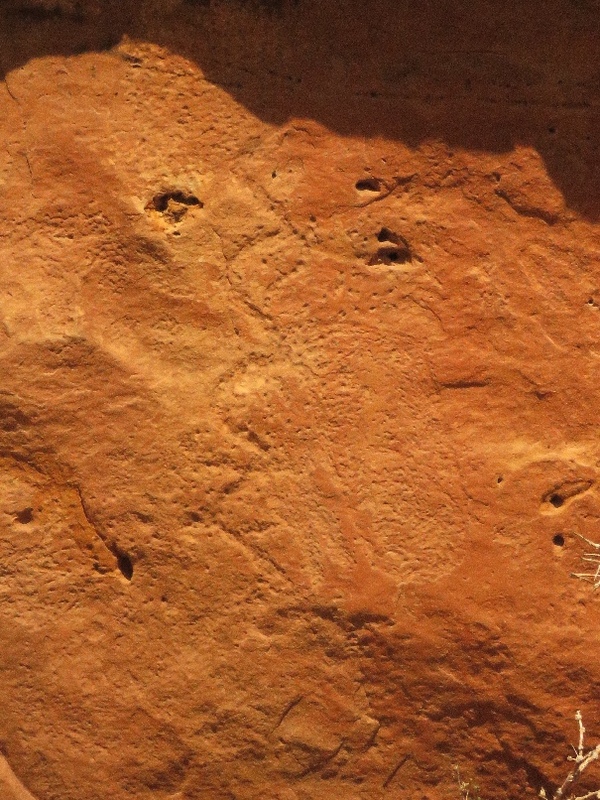 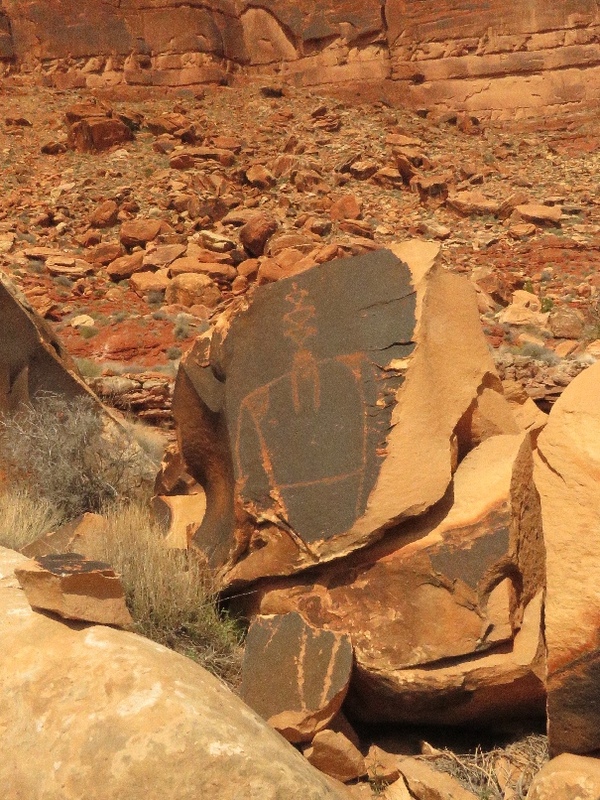 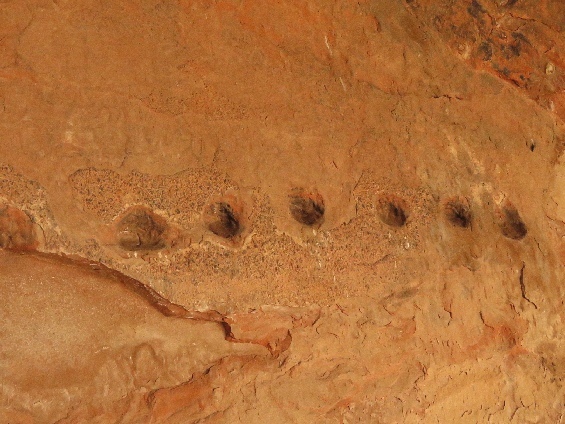 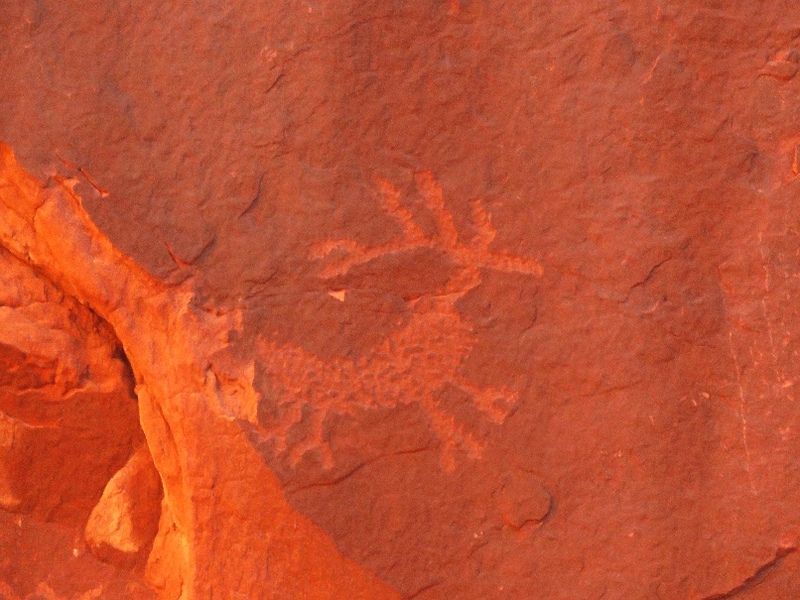 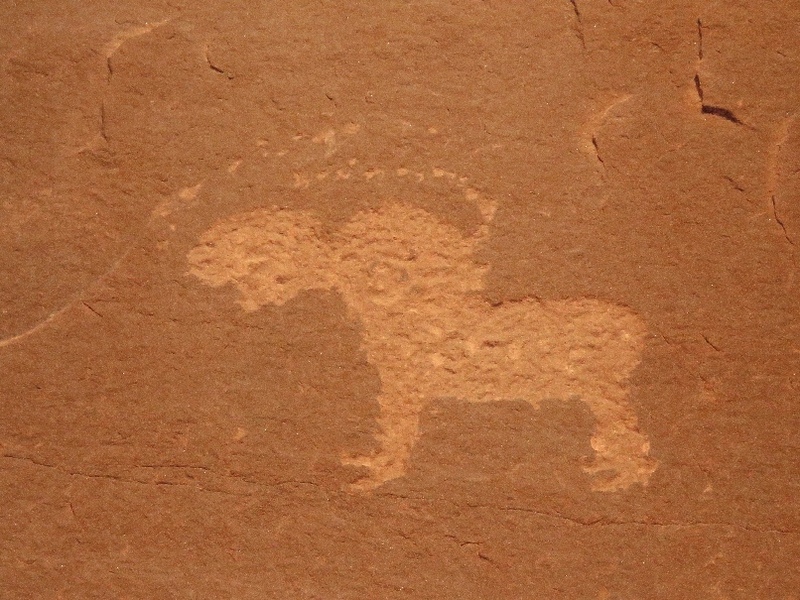 3/27/2019 False Kiva Petroglyphs, Kane Creek Rd, Moab, UT - Trailhead of this place is start from 2nd parking lot after pave end on the Kane Creek road. Hike up the hill and panels are located bottom of the straight up rock wall. 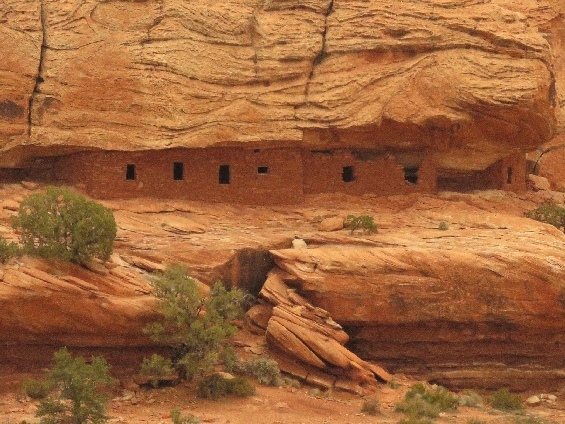 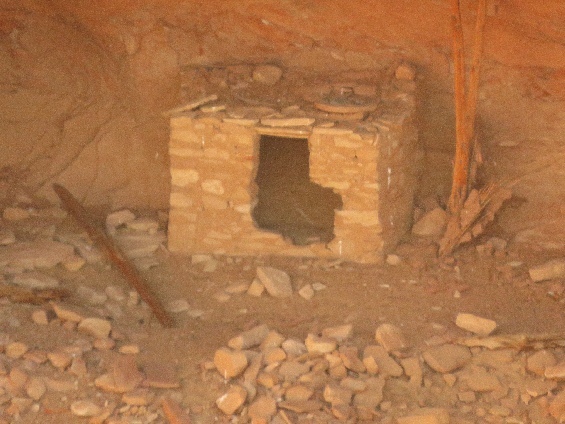 There is a kiva looks like, that the reason called here is False Kiva. 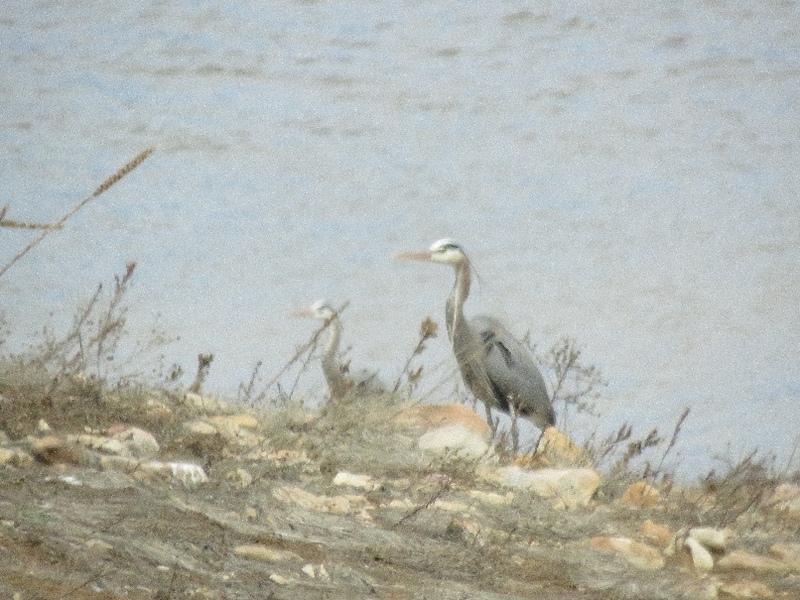 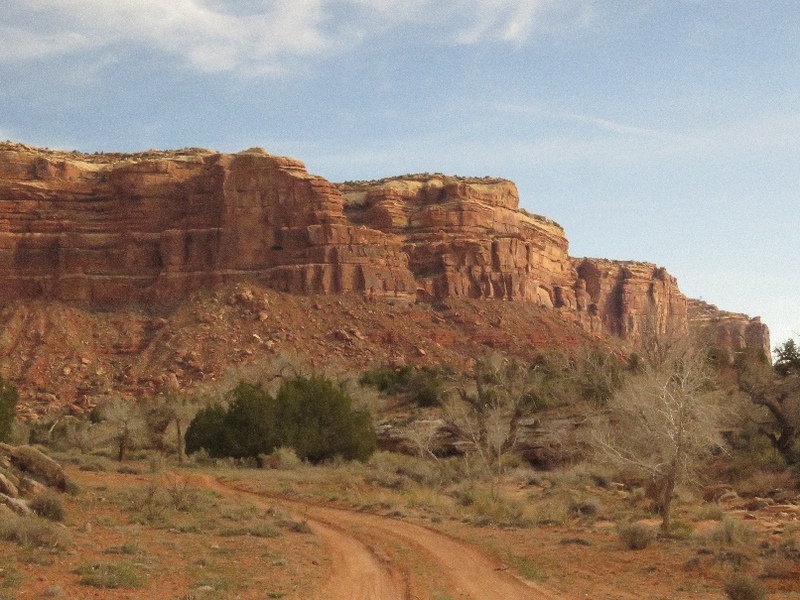 3/27/2019 Hunter Canyon, Moab, UT - There are small parking lot, its fill up quickly. 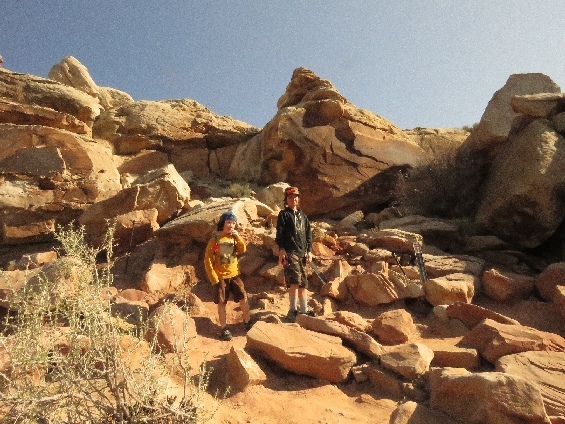 It is kids friendly hiking trail, good for family hike. 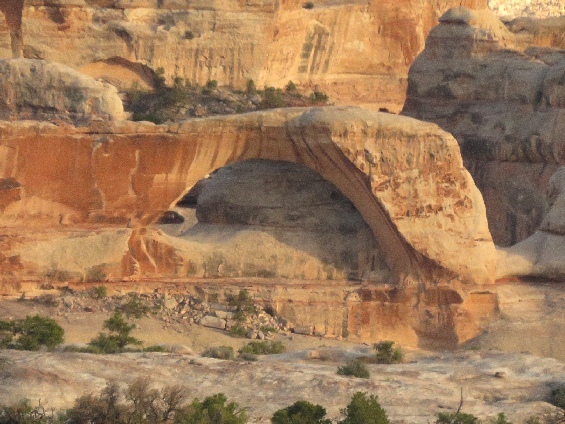 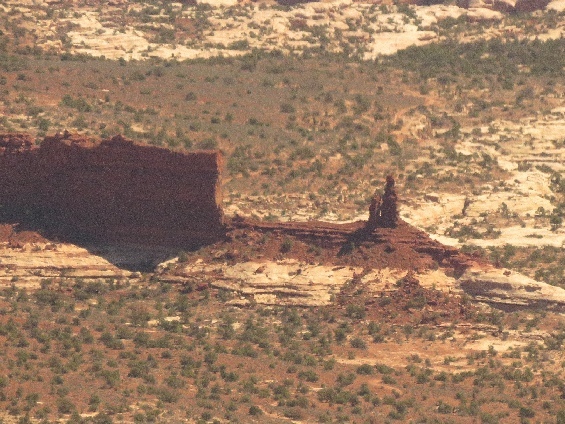 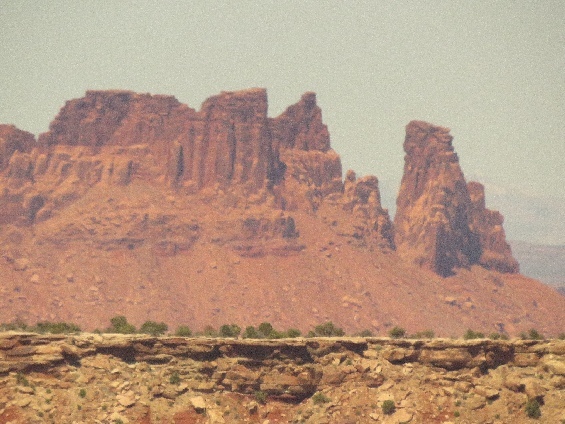 About half mile or so, the Hunter Arch is visible. 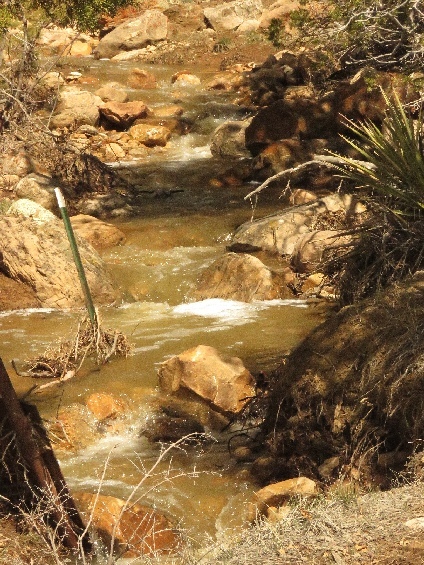 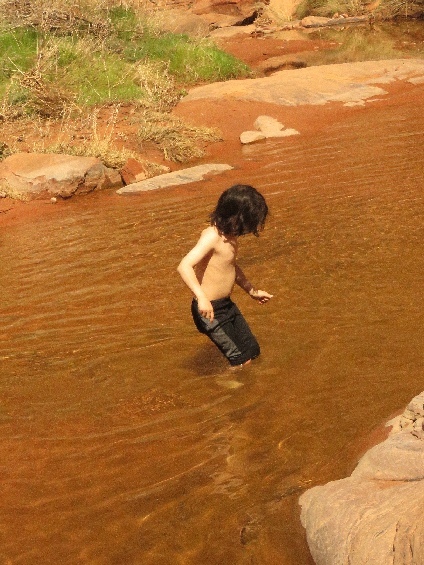 We cross creek numerous times, water level is lower enough to hop the rocks to not get wet. 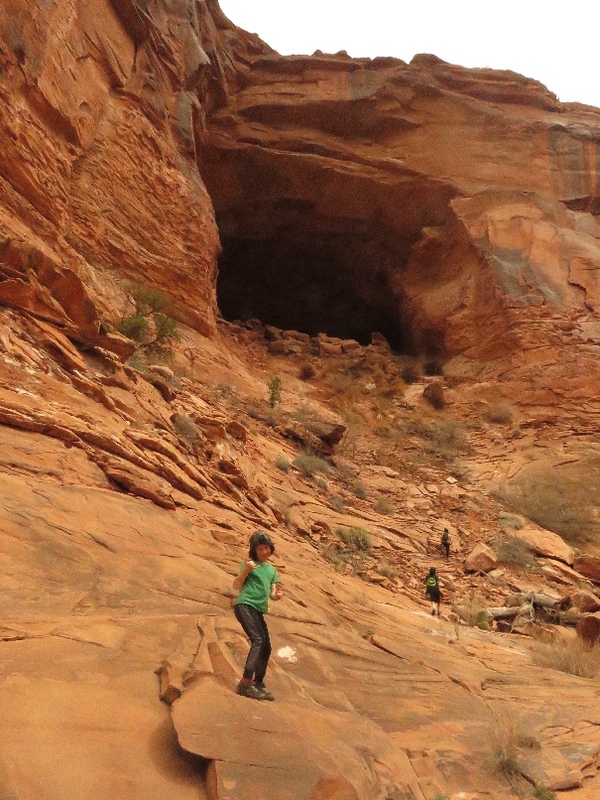 We tried to climb up the cave that located high up, but ground is still wet and muddy some spots, half way up and turn back. 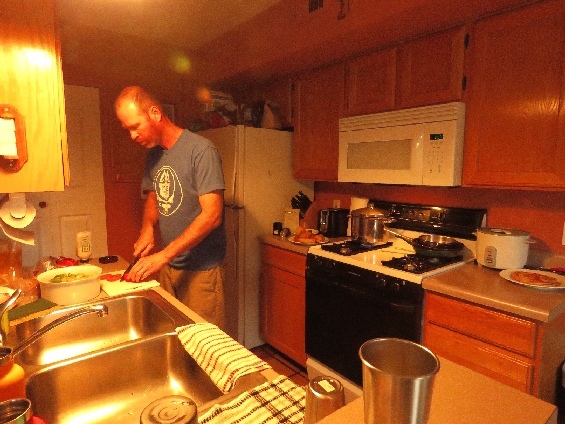 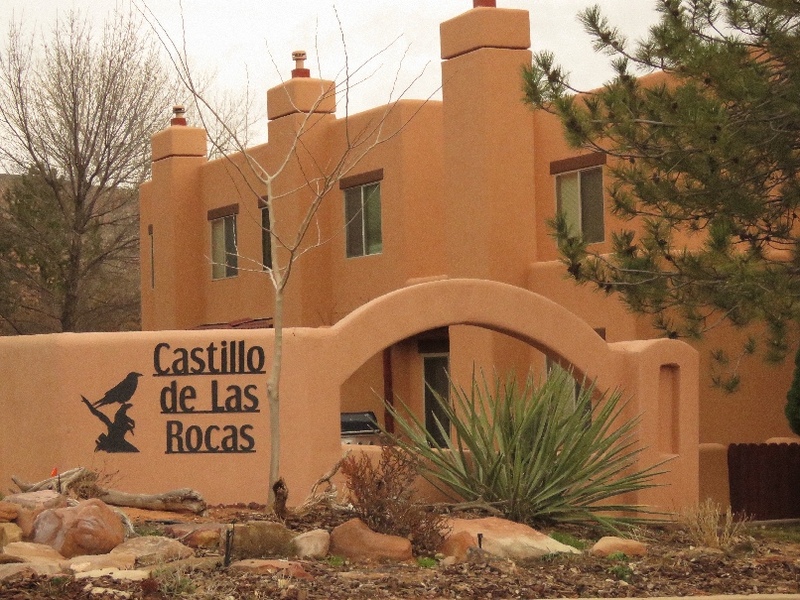 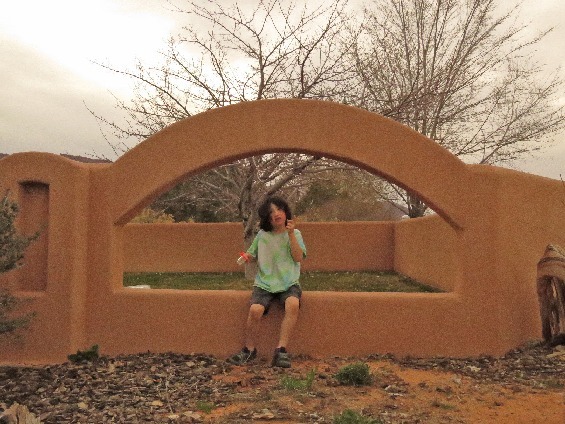 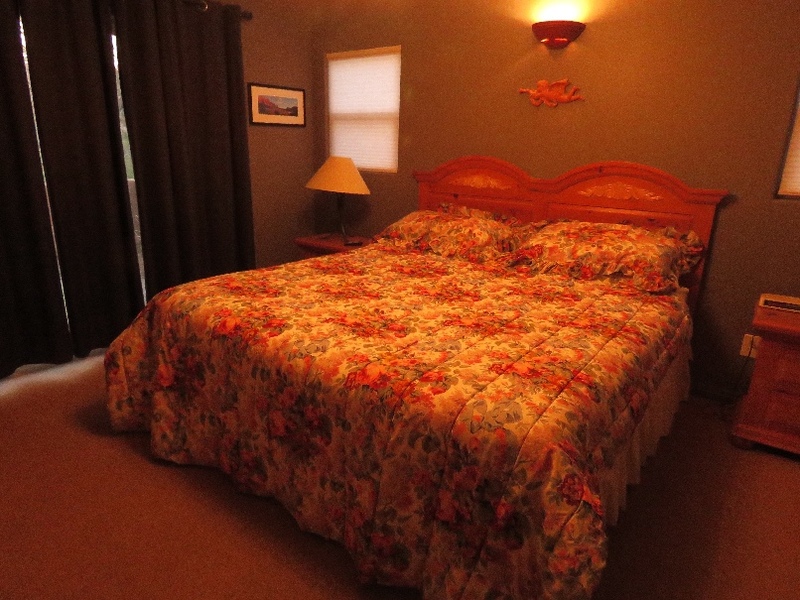 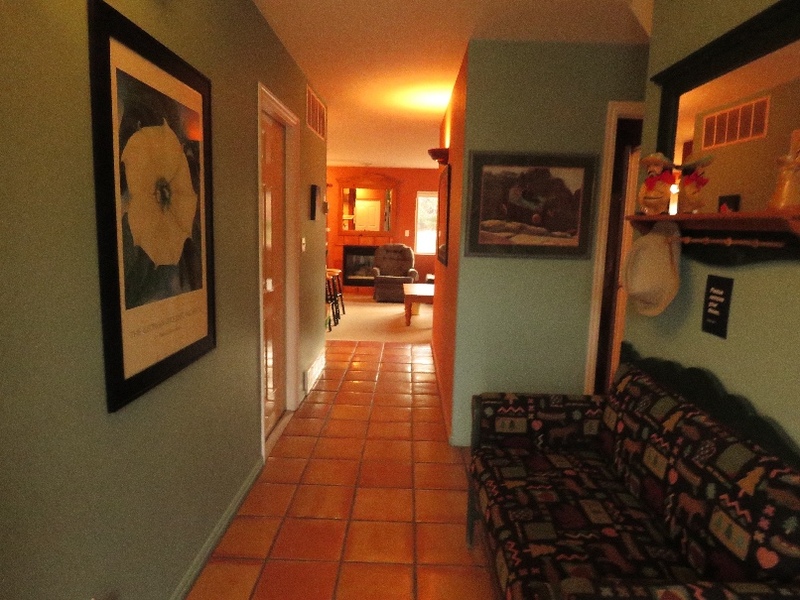 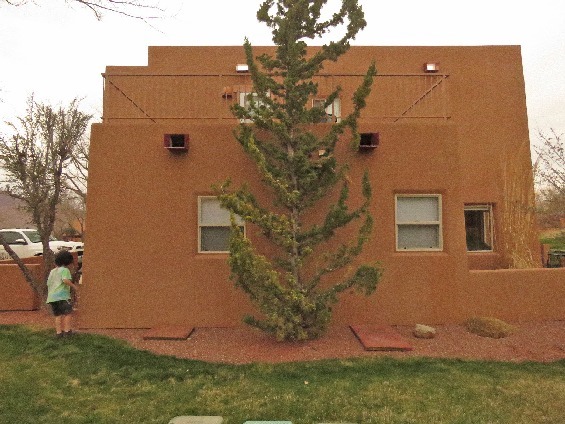 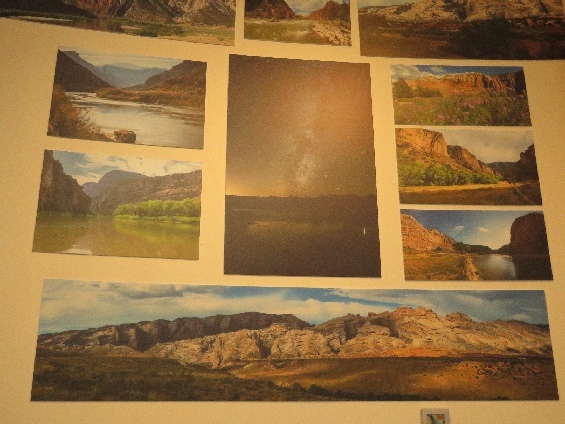 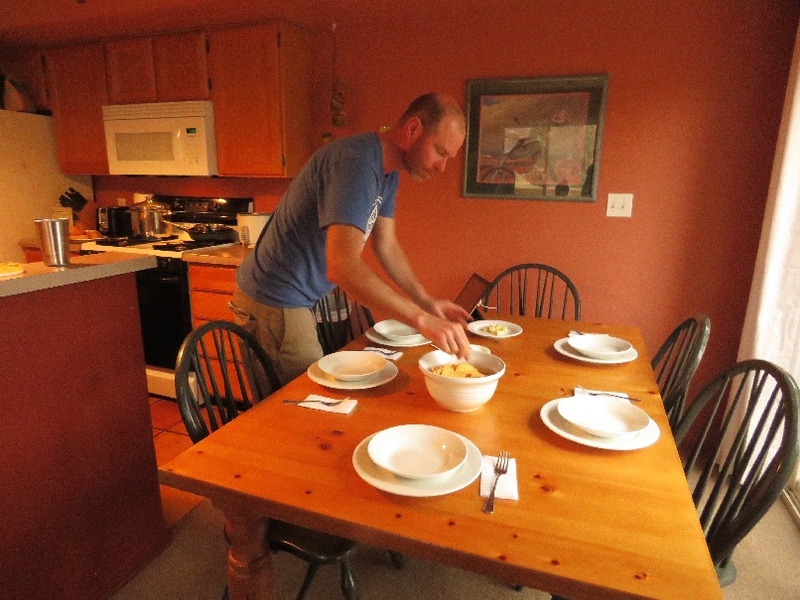 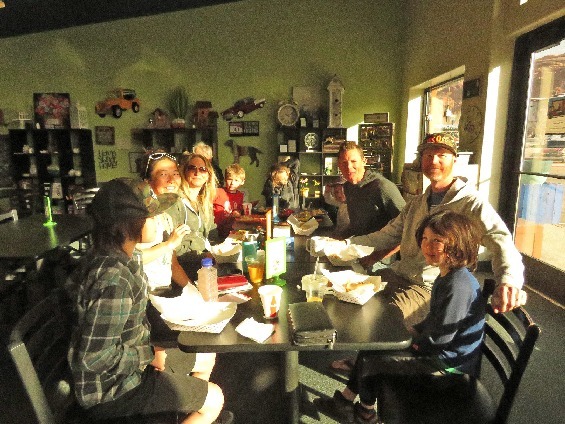 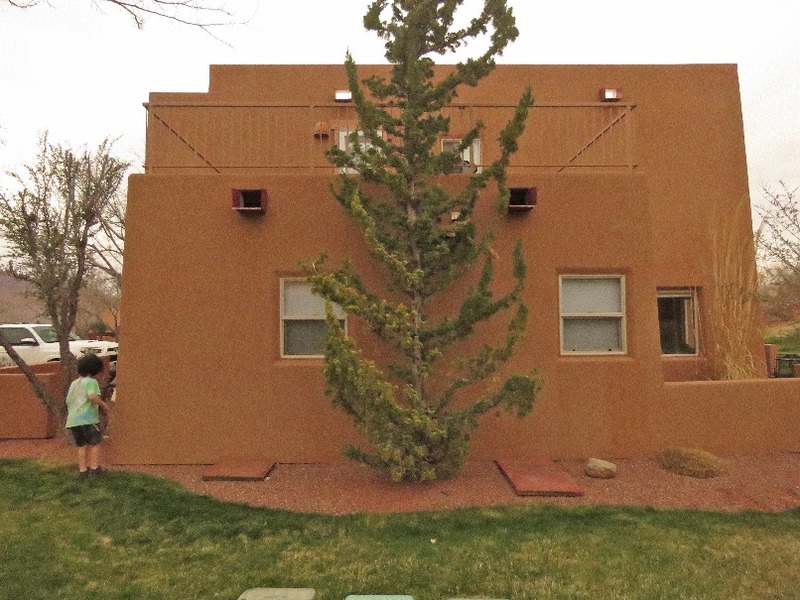 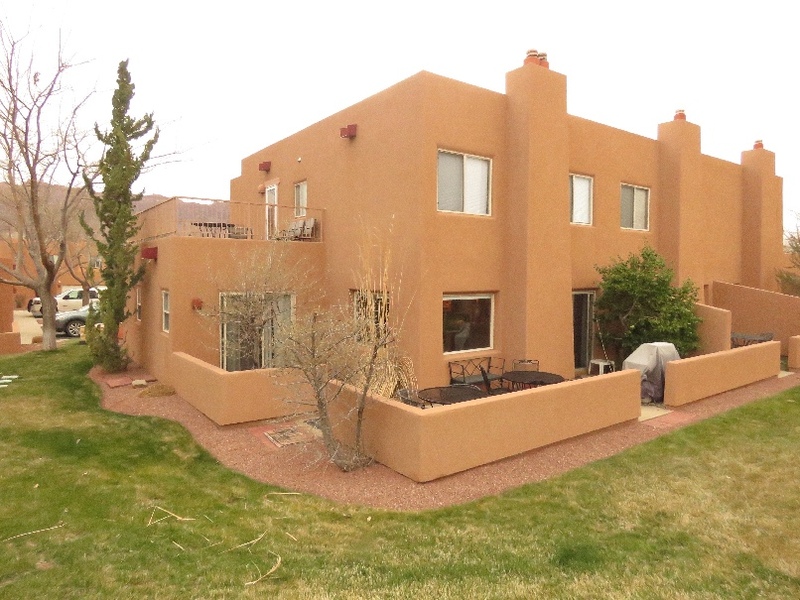 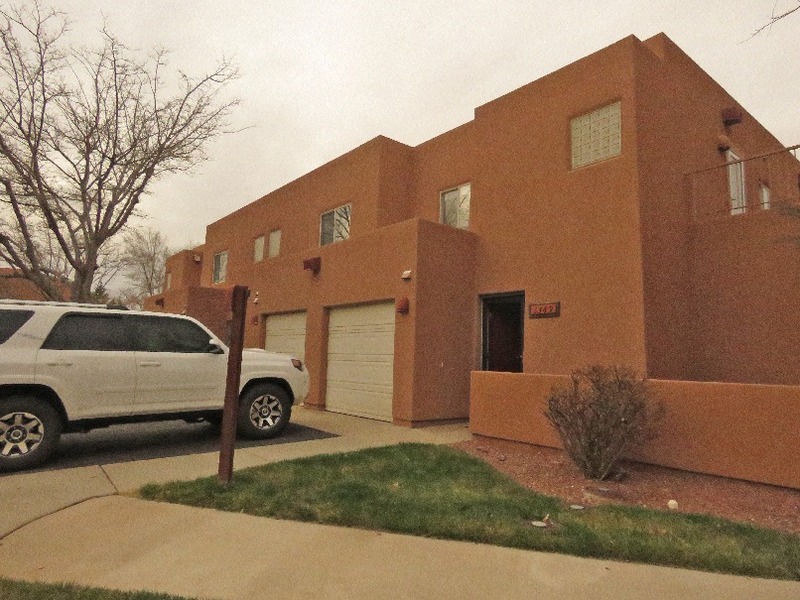 3/27/2019 Moab Stay, UT - We rented a townhouse for few days via airbnb, near the Moab Golf Course. 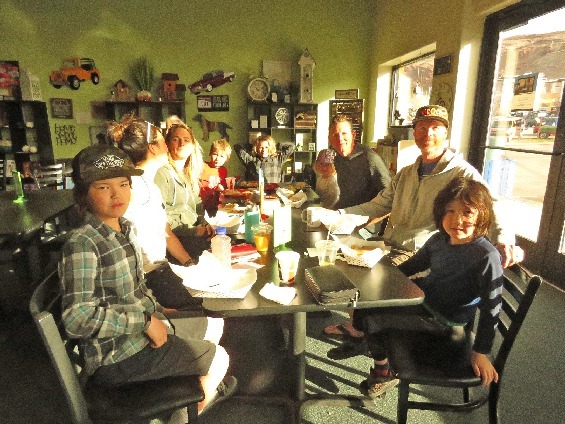 My daughter posted a pic on the Instagram, and her friend family is in town, so we meet them at next morning, what’s a surprise. 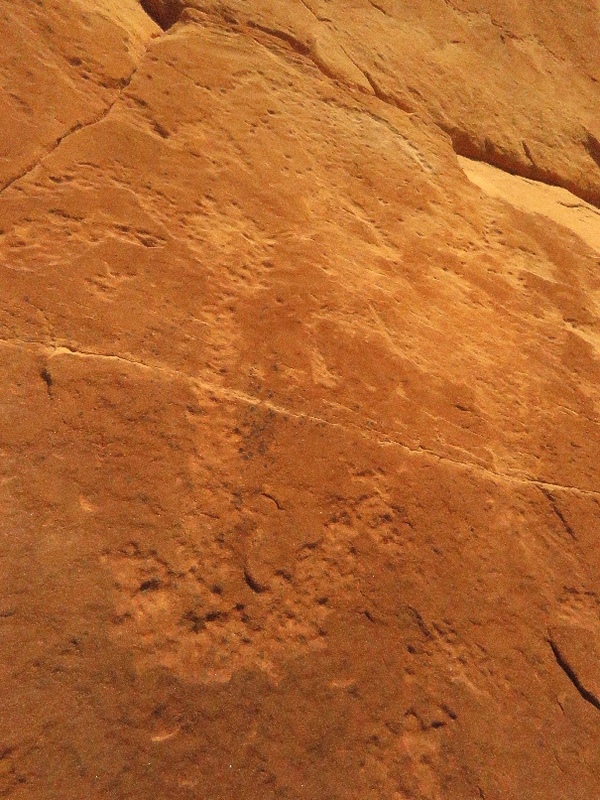 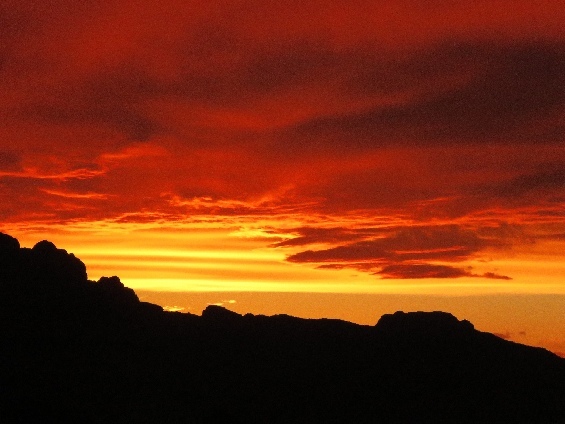 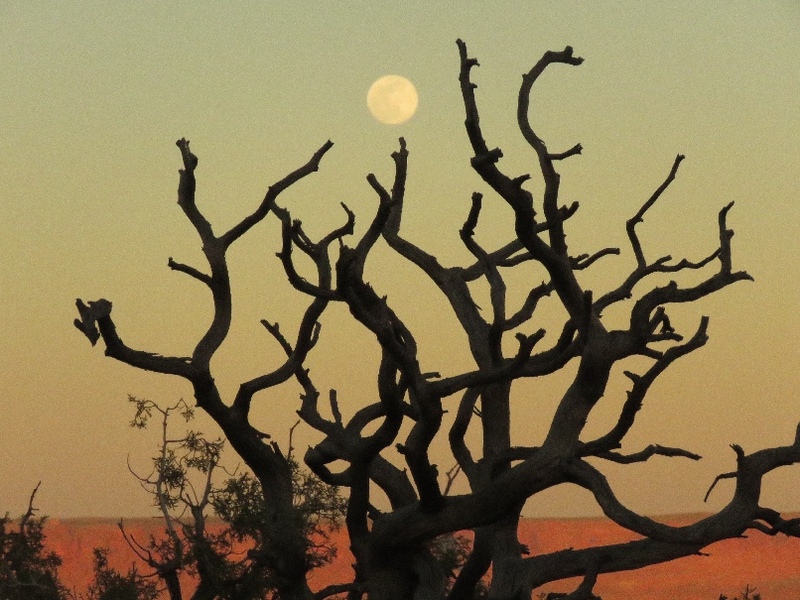 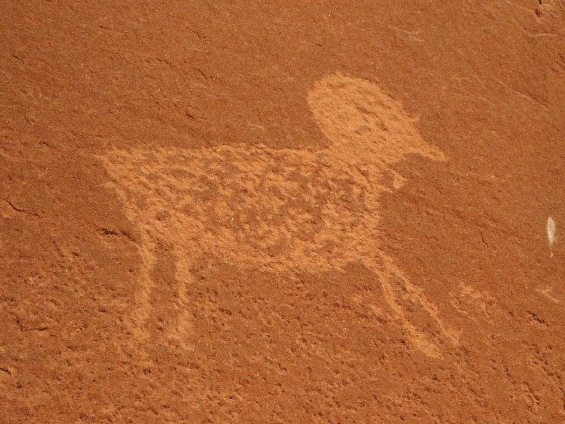 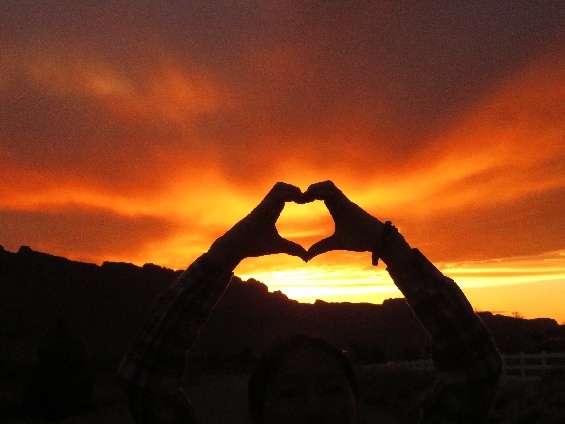 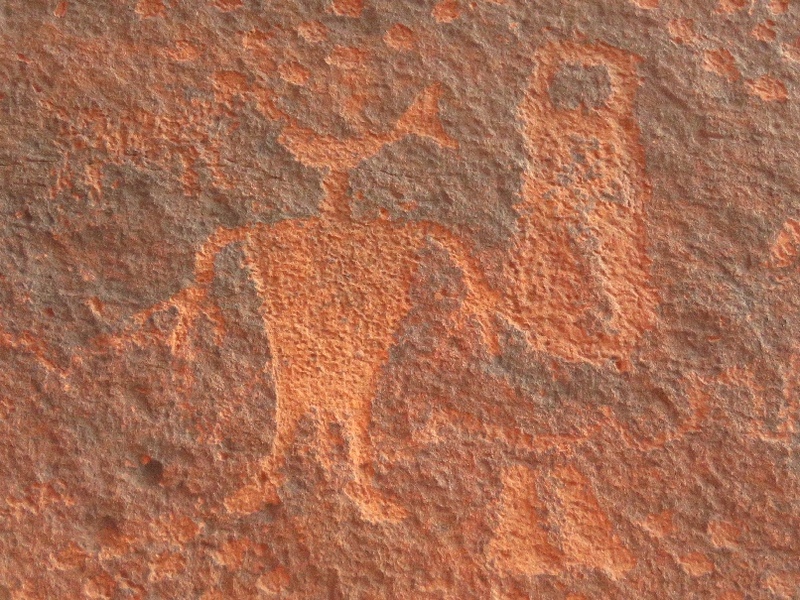 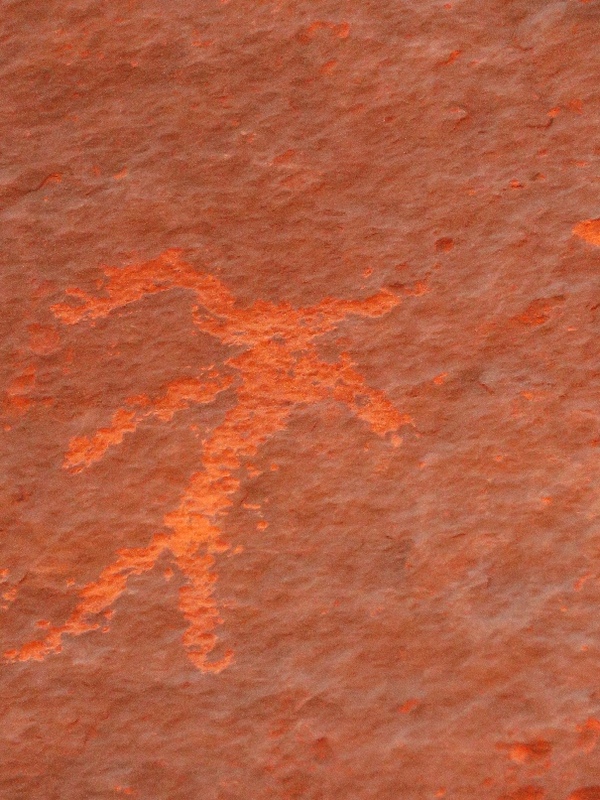 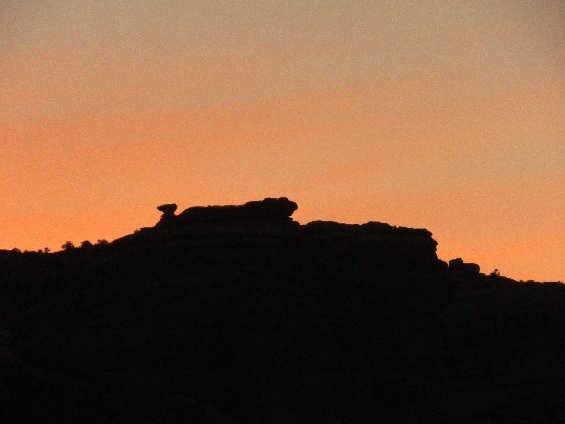 Show the Moab Man petroglyphs panel to Chris, and we saw beautiful sunset. 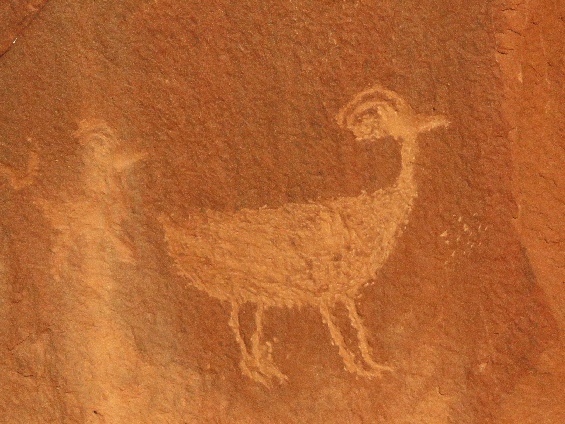 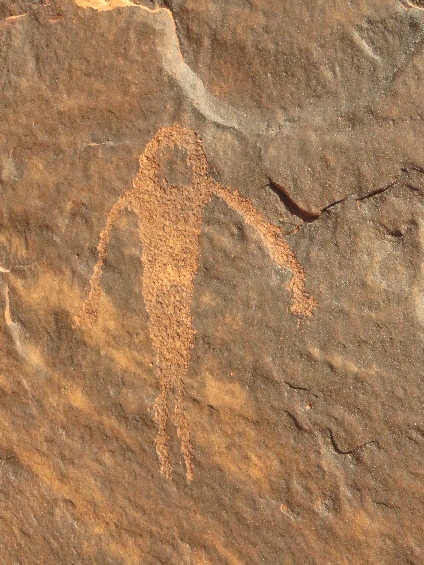 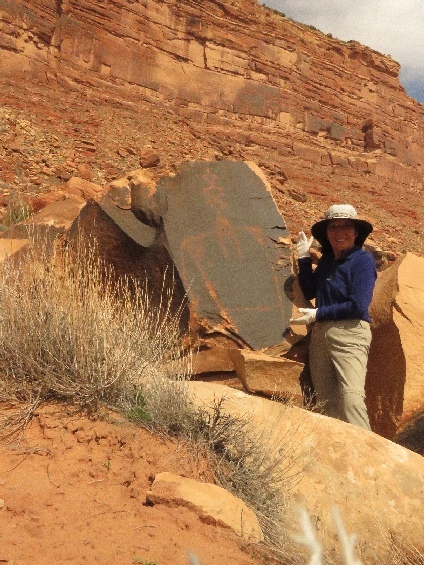 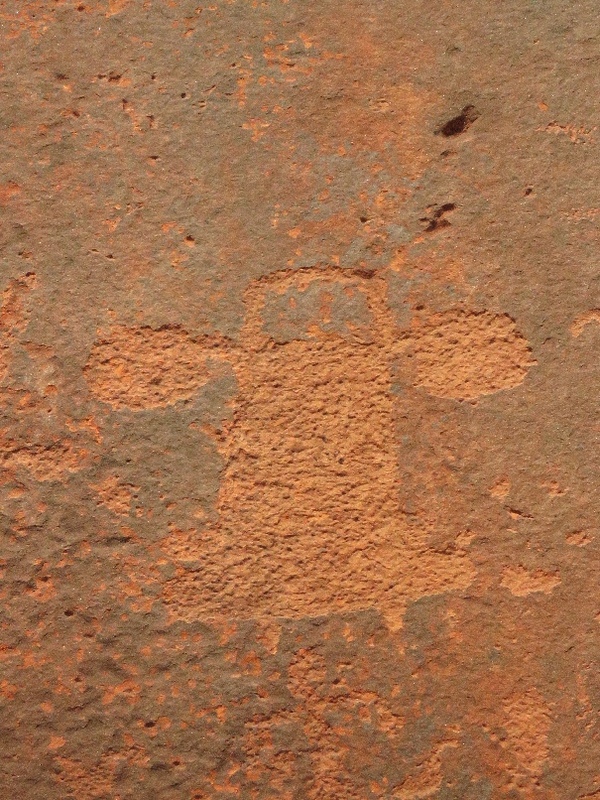 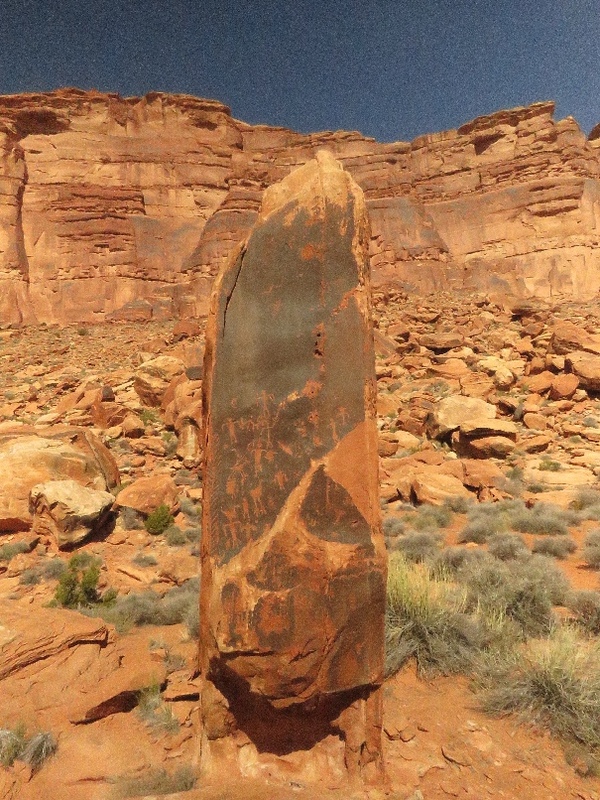 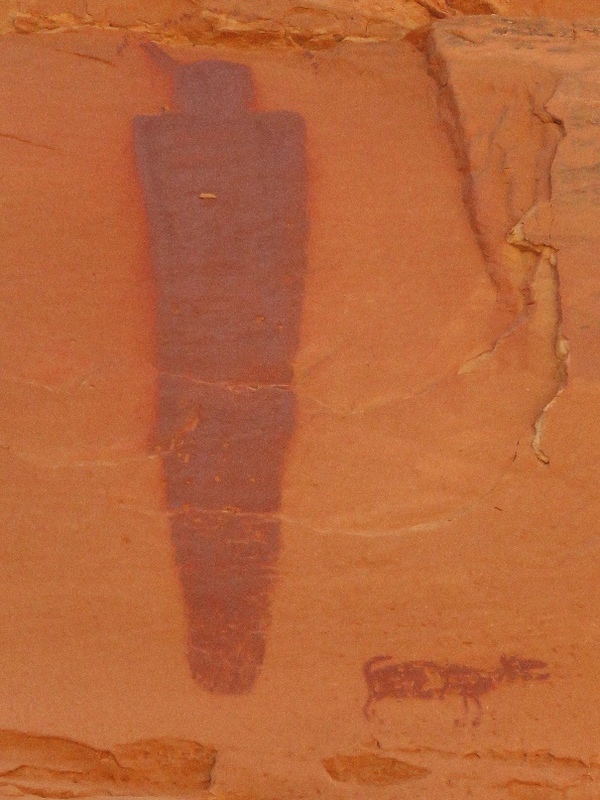 3/28/2019 Potash Road RA, Moab, UT - I have noticed there are some more rock art panels that south of the Big Bear panel on the Potash Road, so that I stopped by. 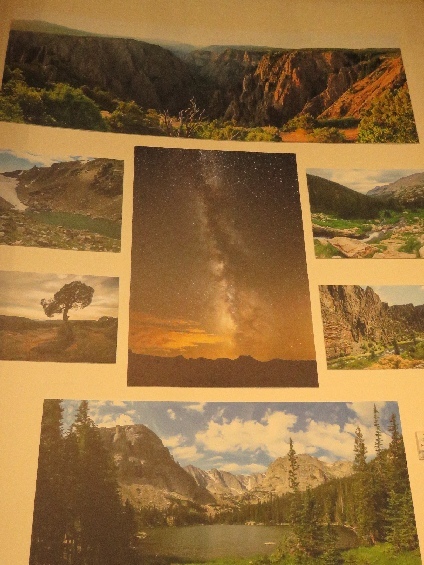 There are few panels that not easy to see, I am glad I found it. 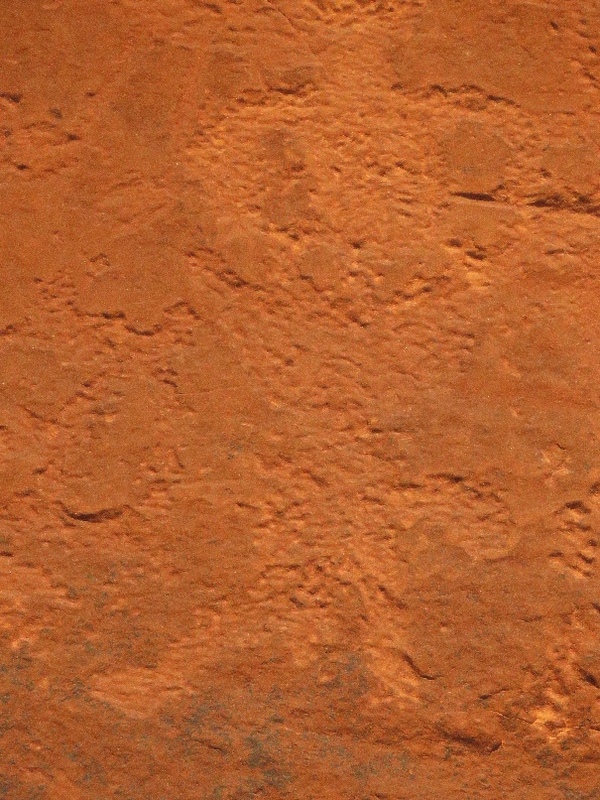 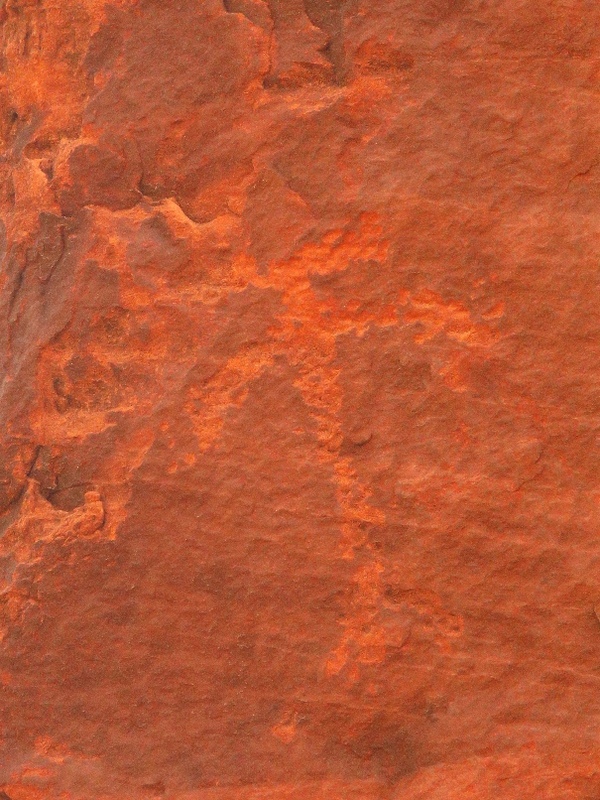 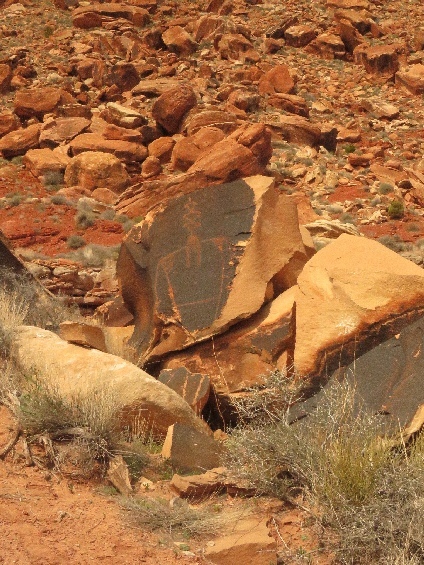 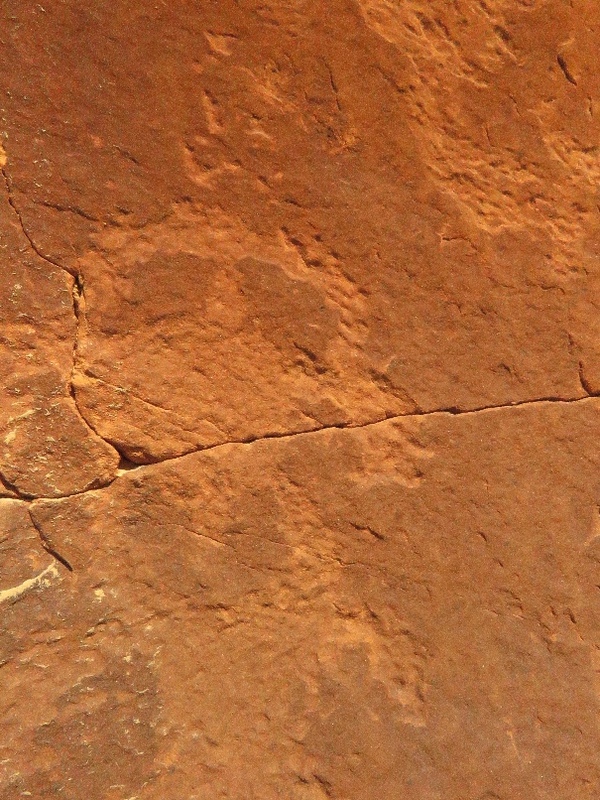 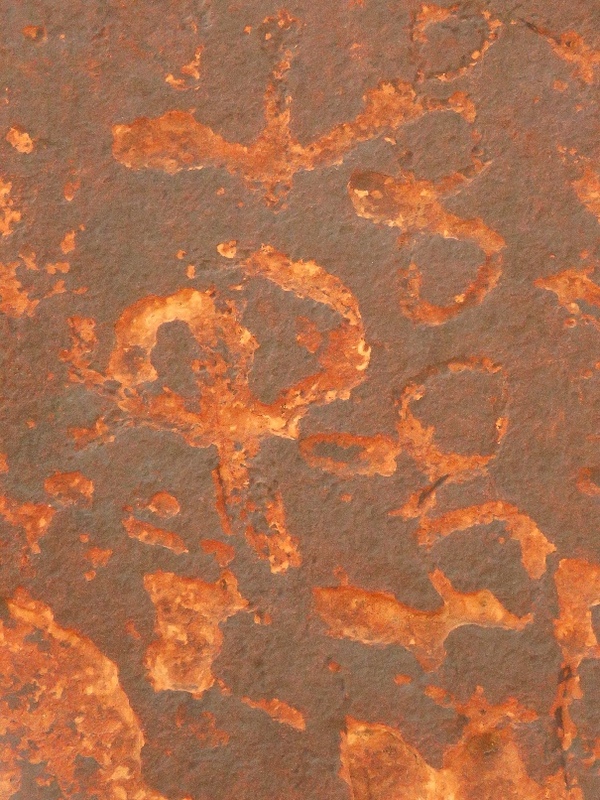 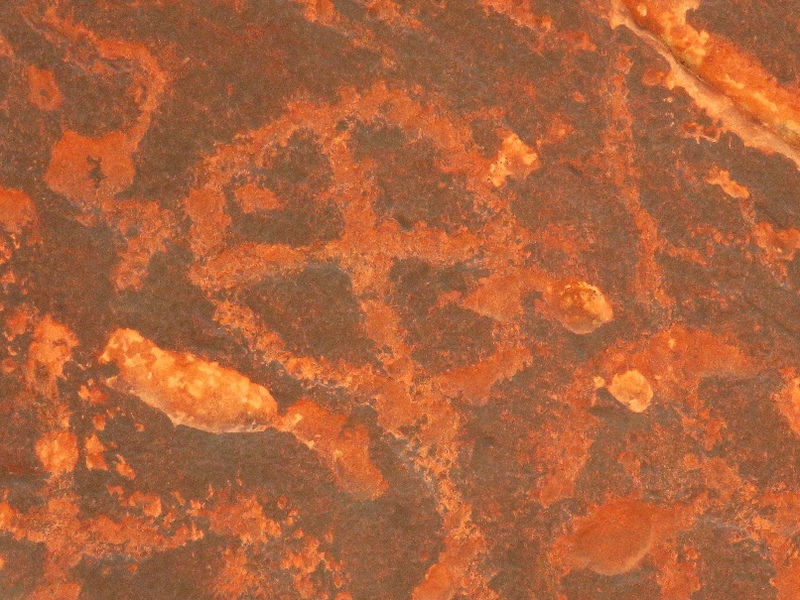 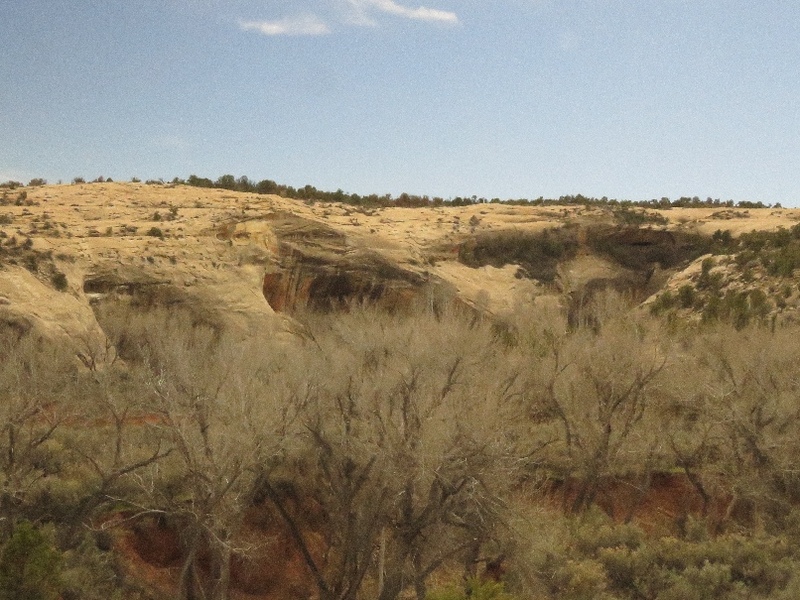 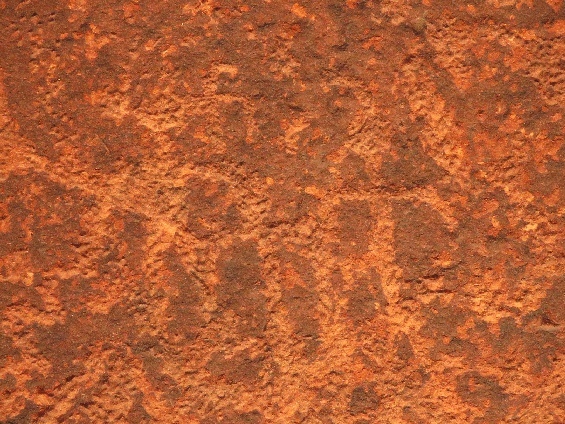 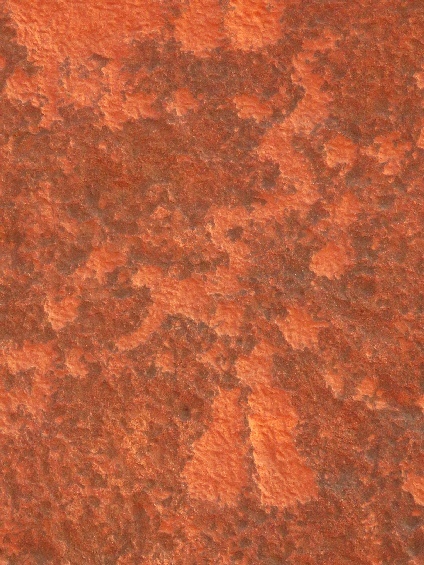 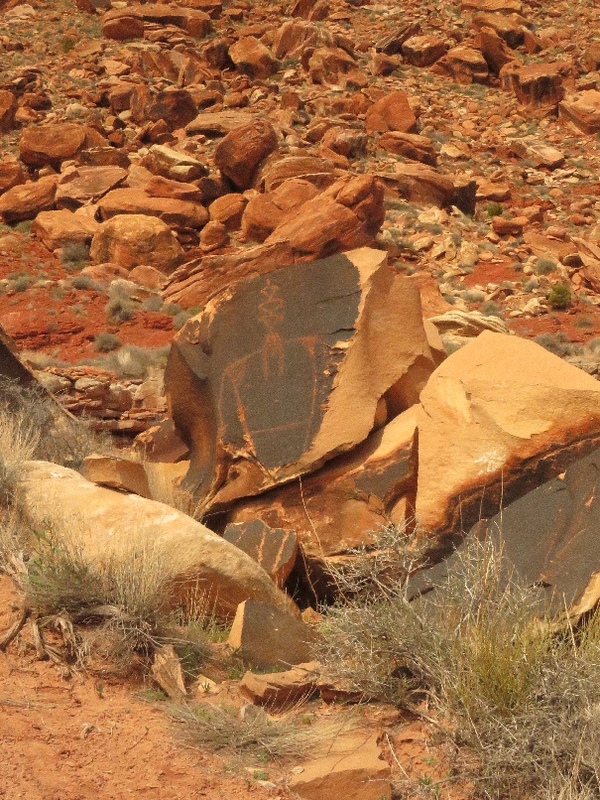 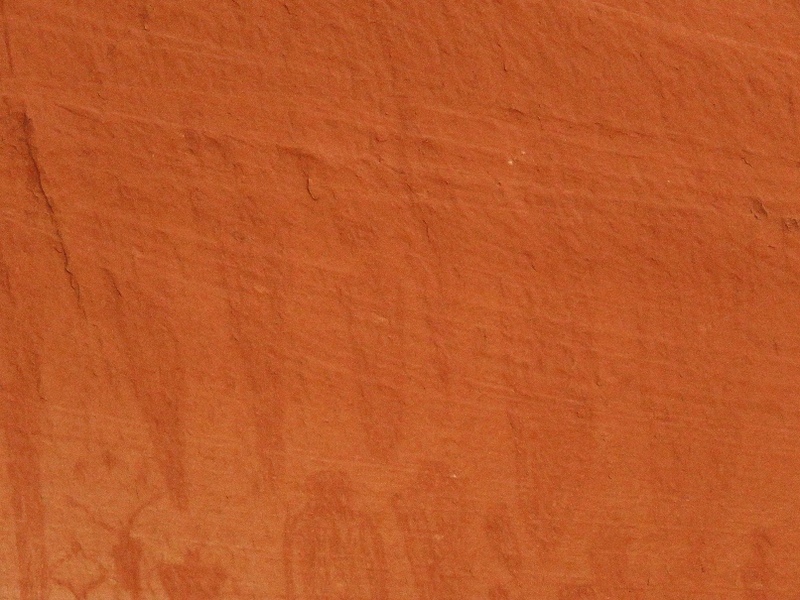 I can see the petroglyphs, but doesn't appear nicely on the photos because of the rock quality, I guess. 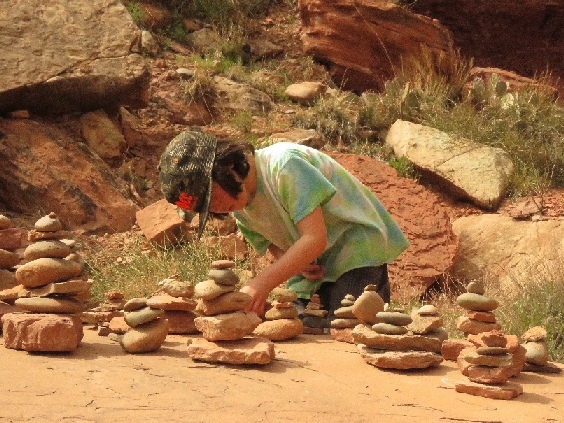 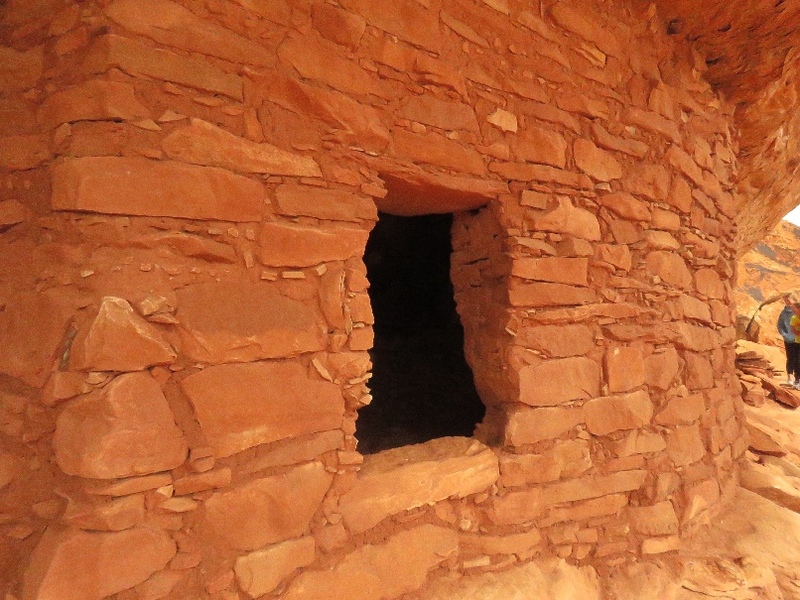 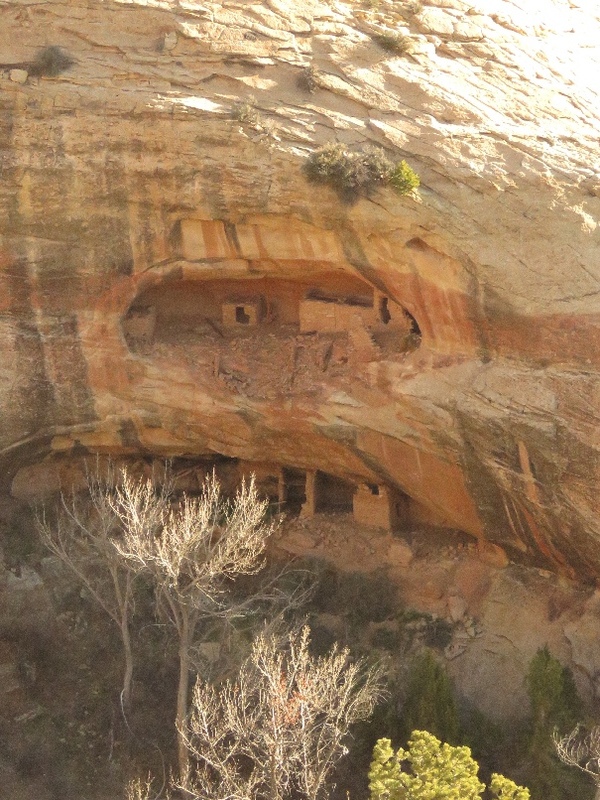 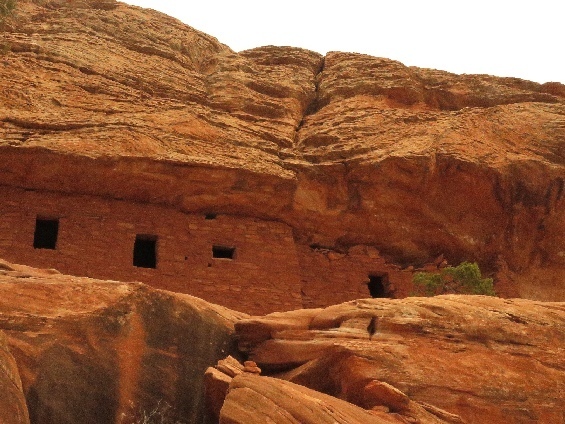 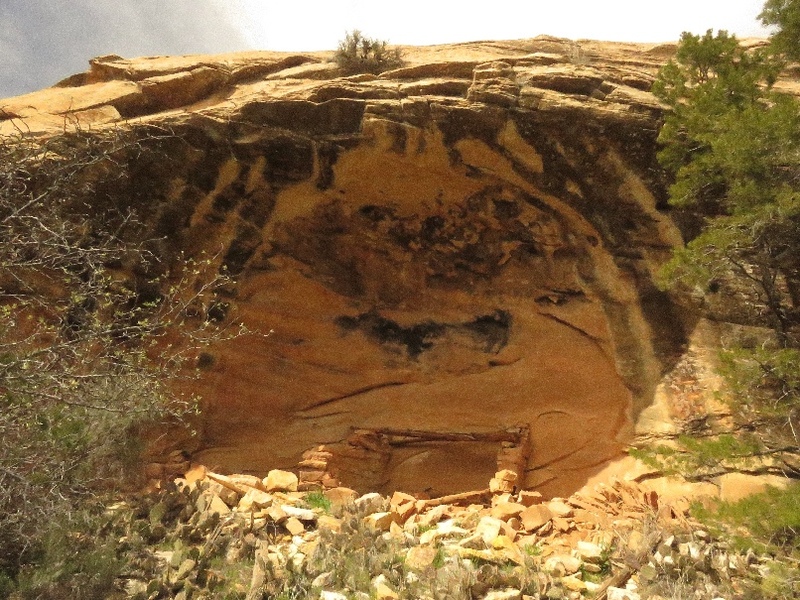 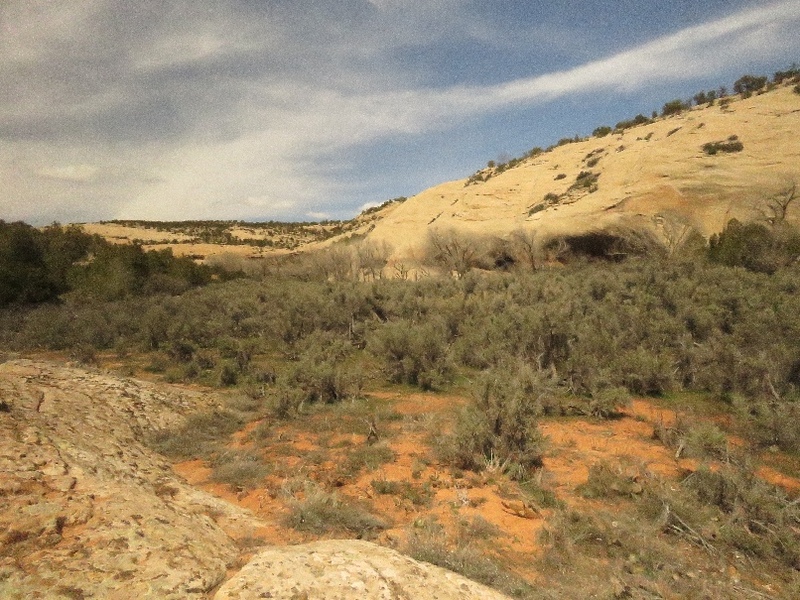 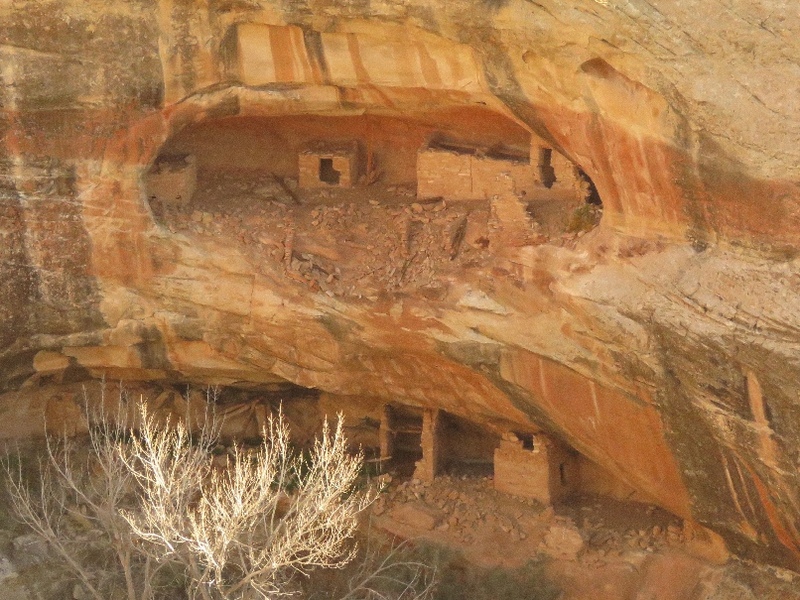 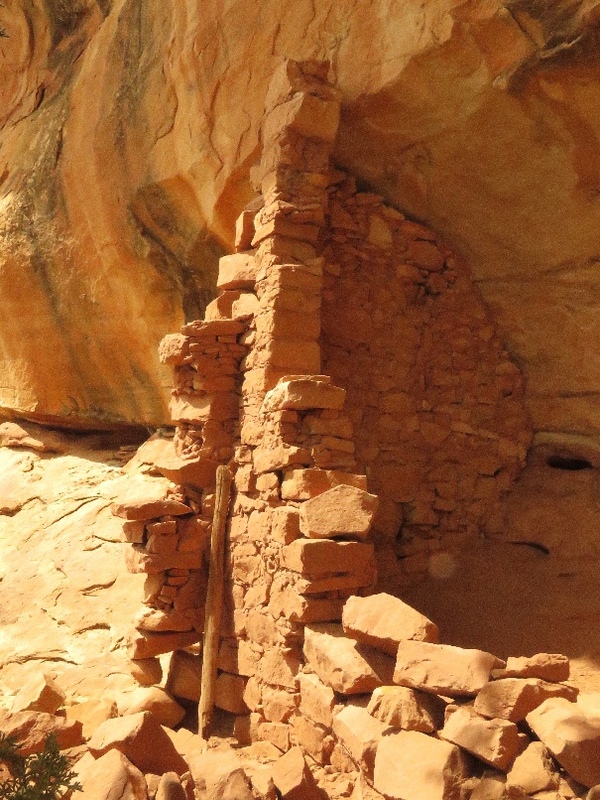 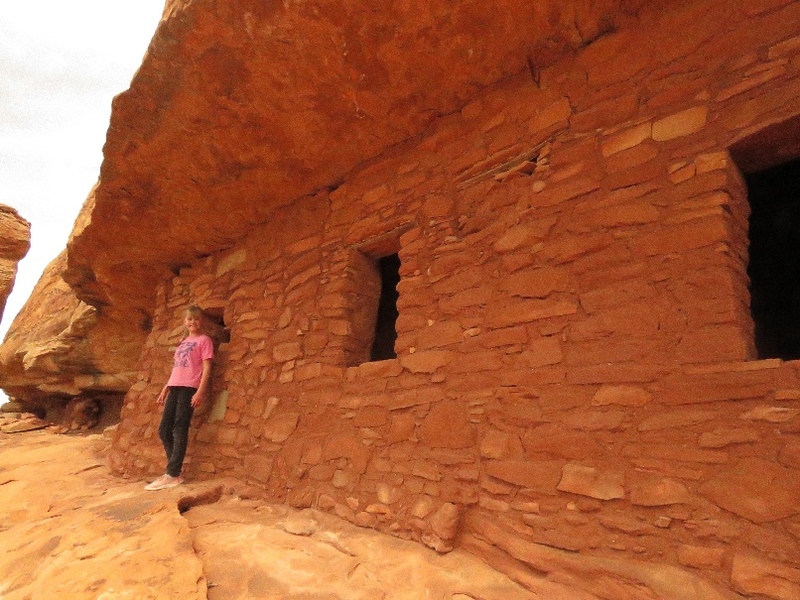 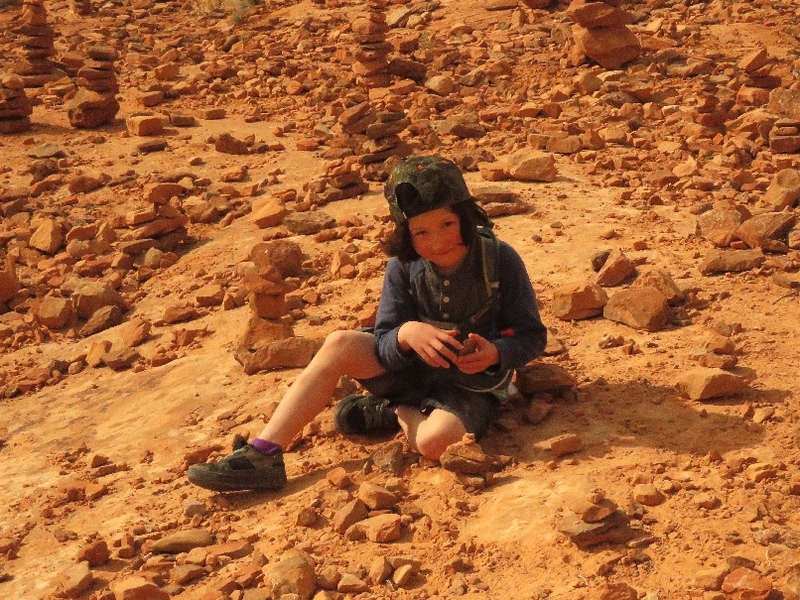 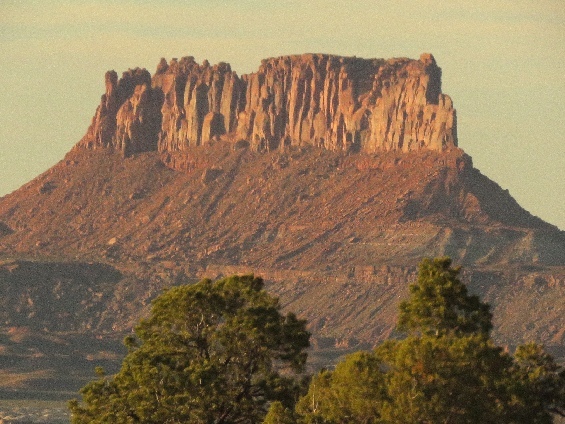 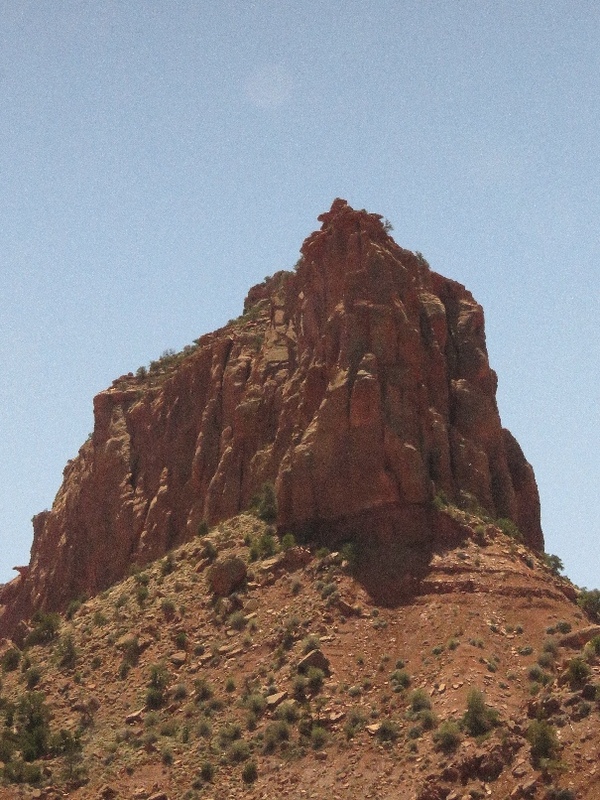 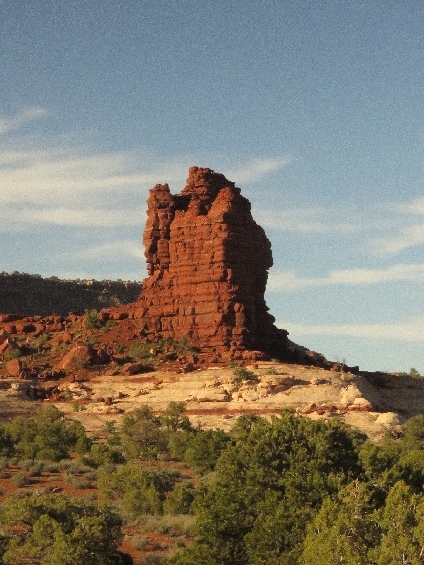 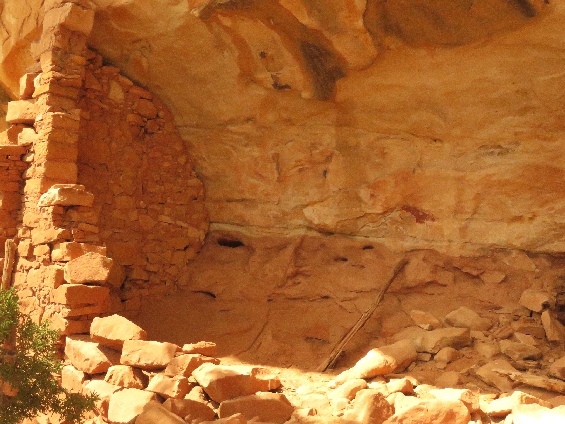 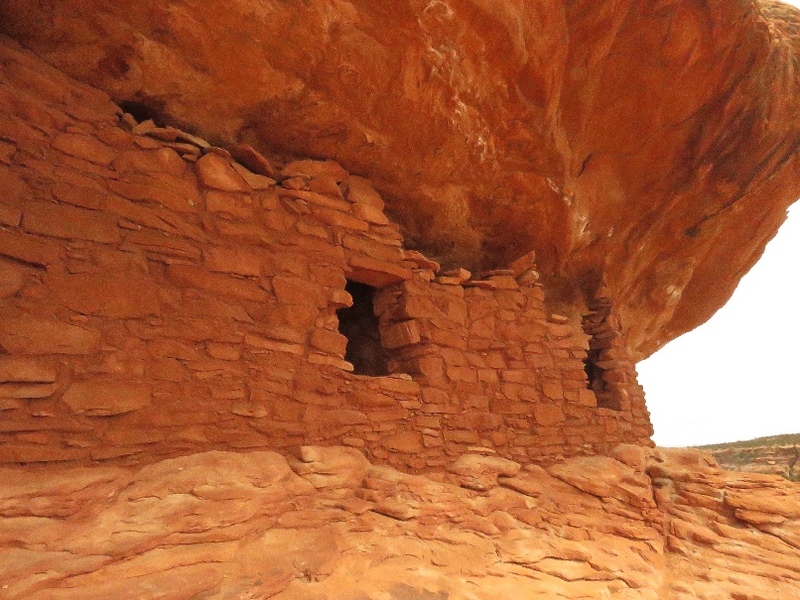 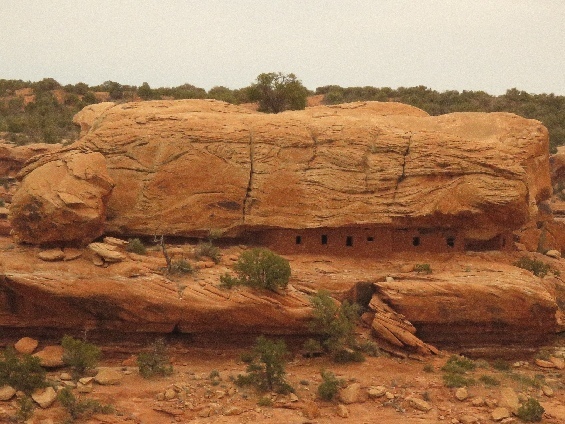 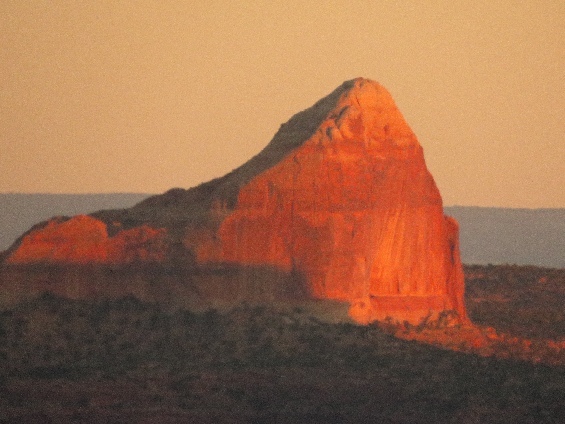 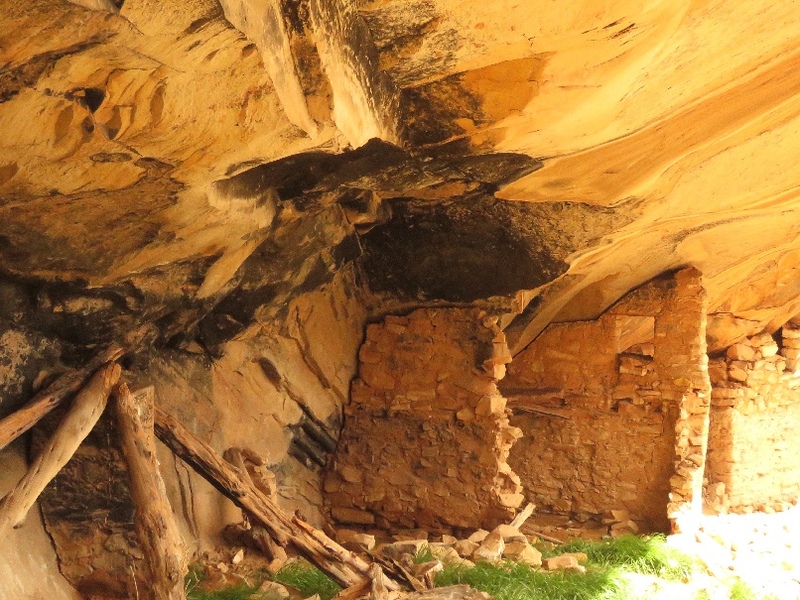 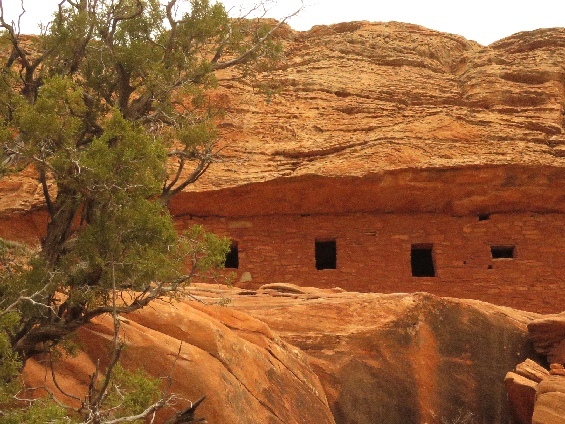 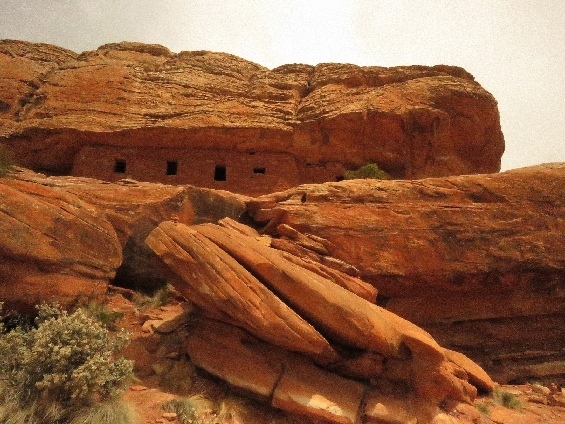 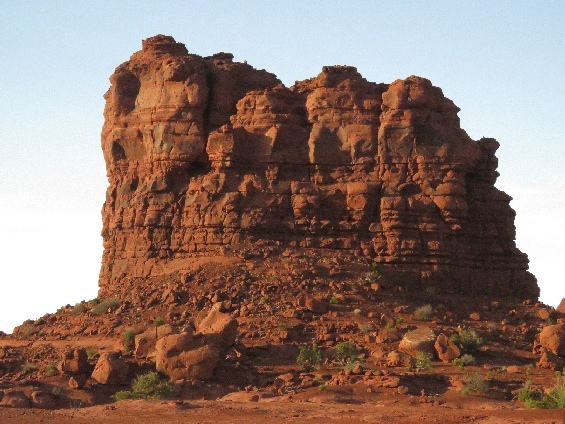 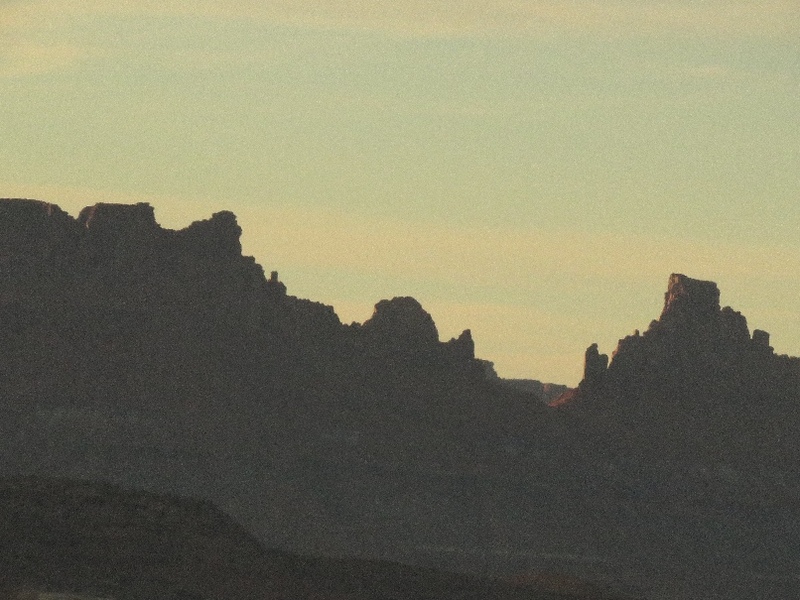 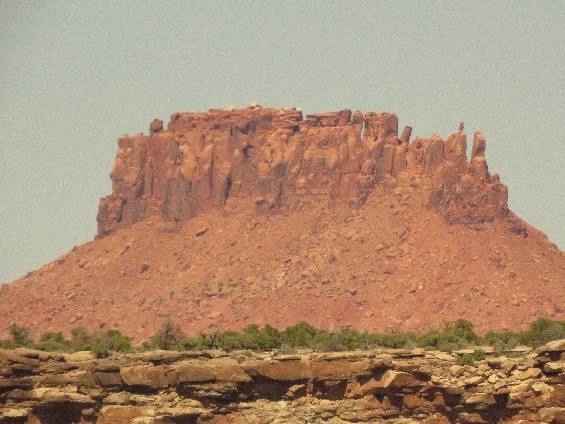 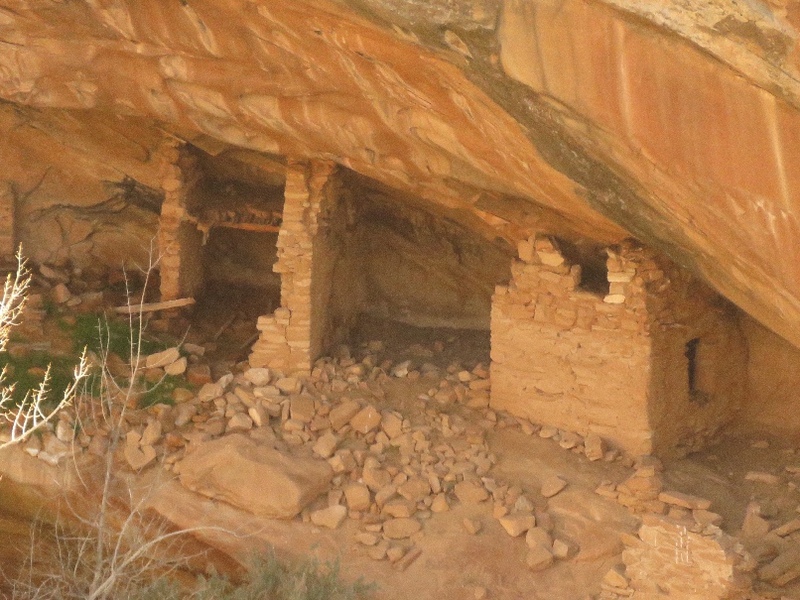 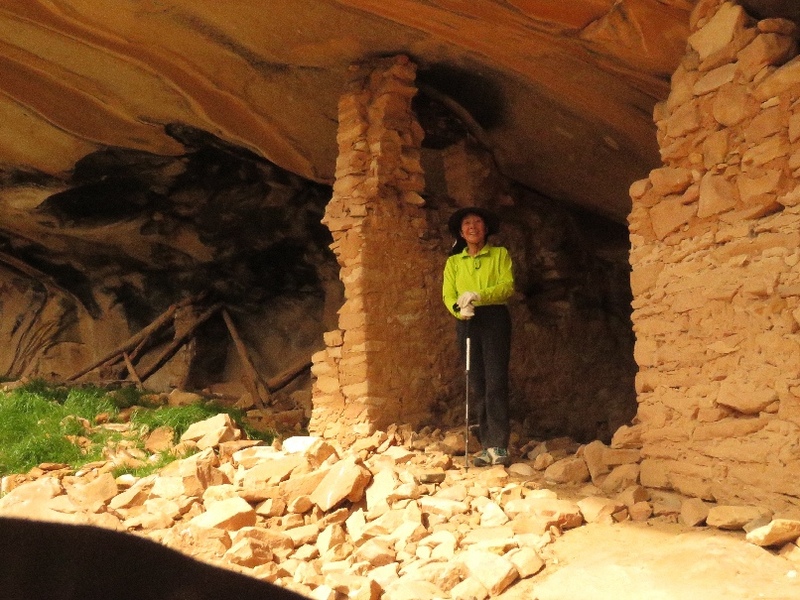 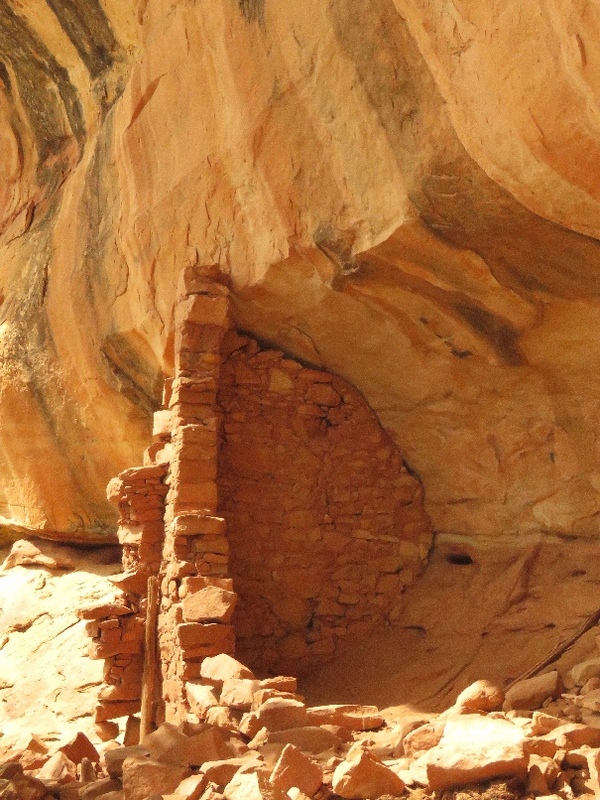 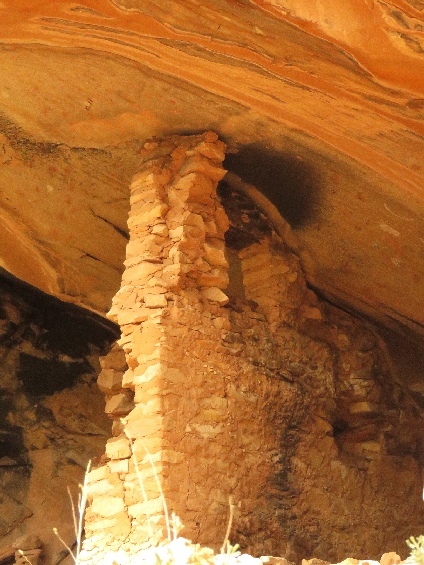 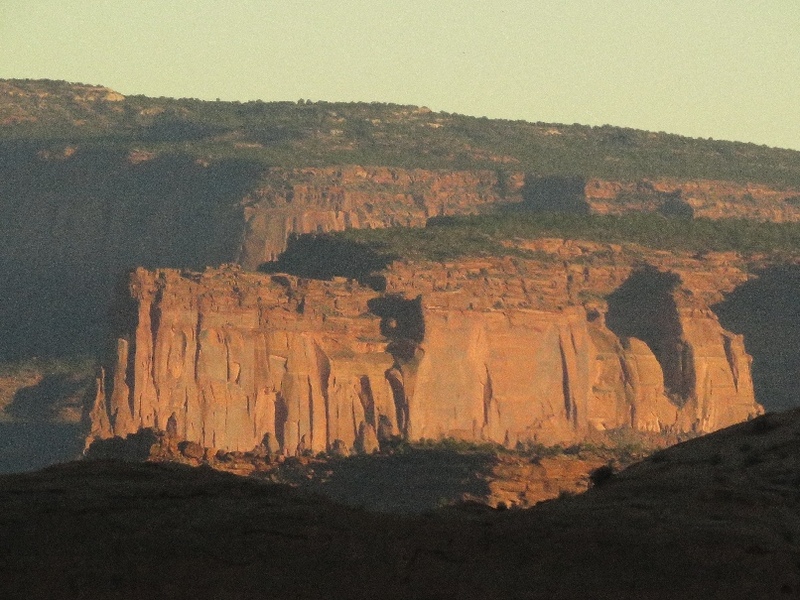 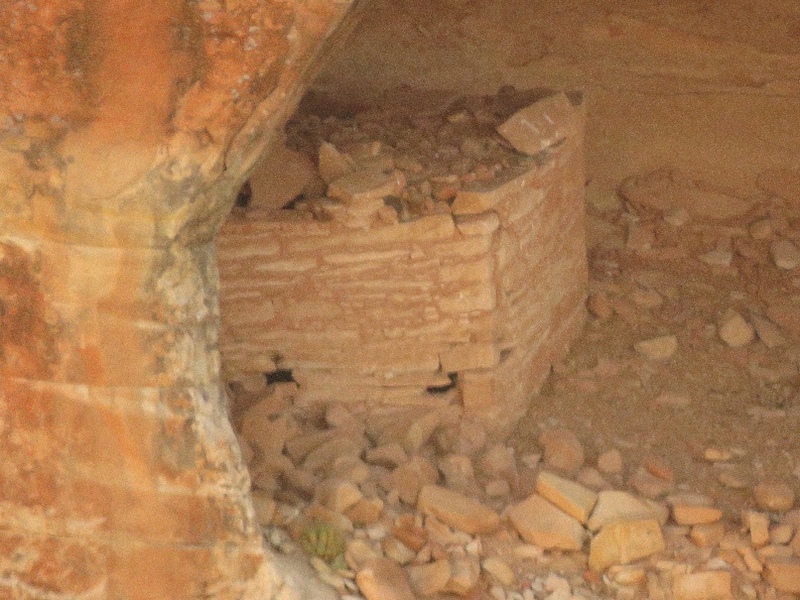 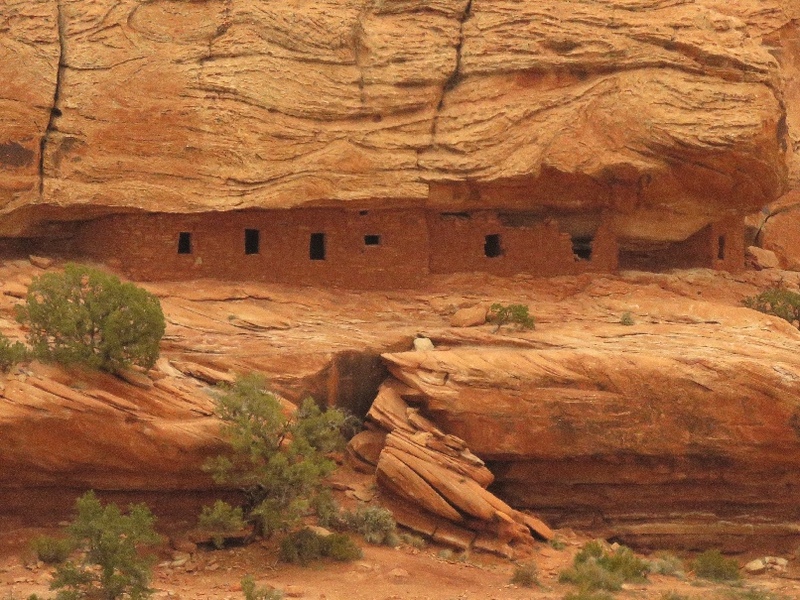 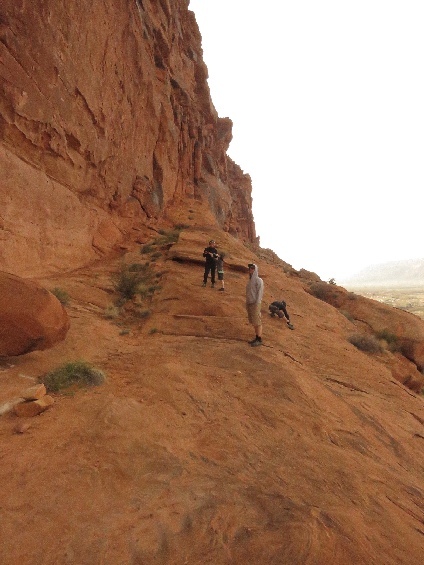 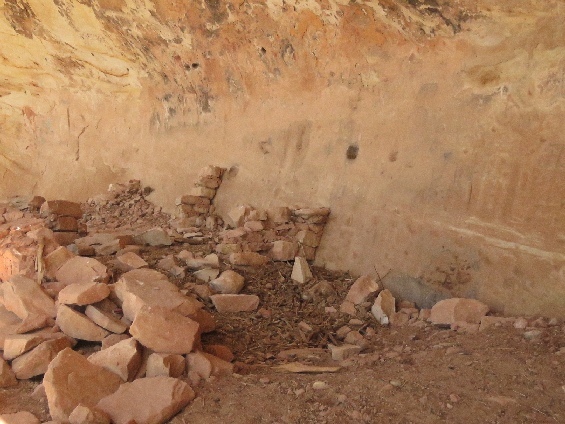 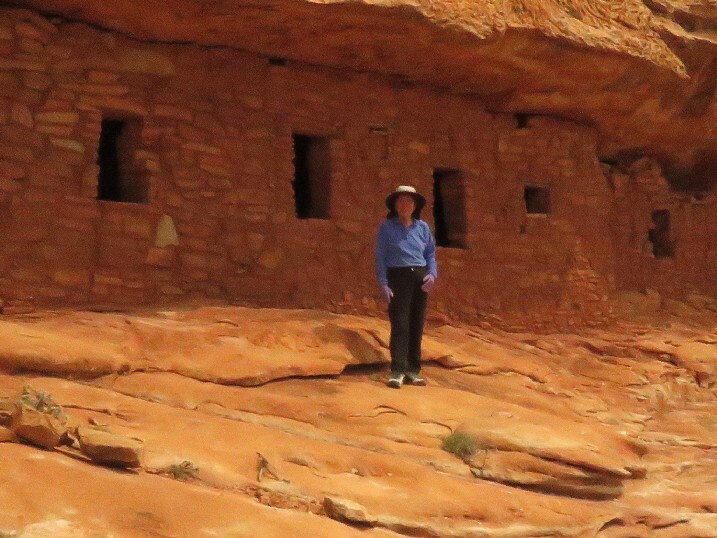 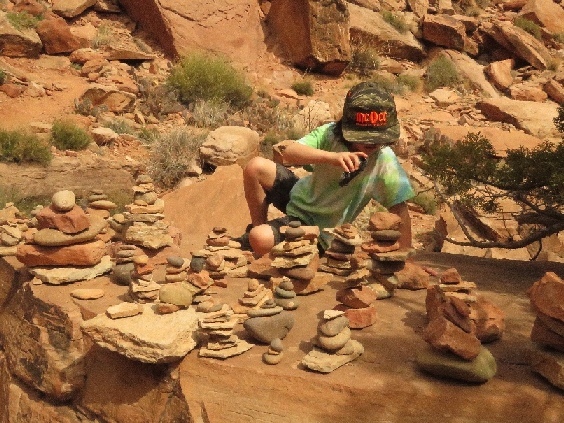 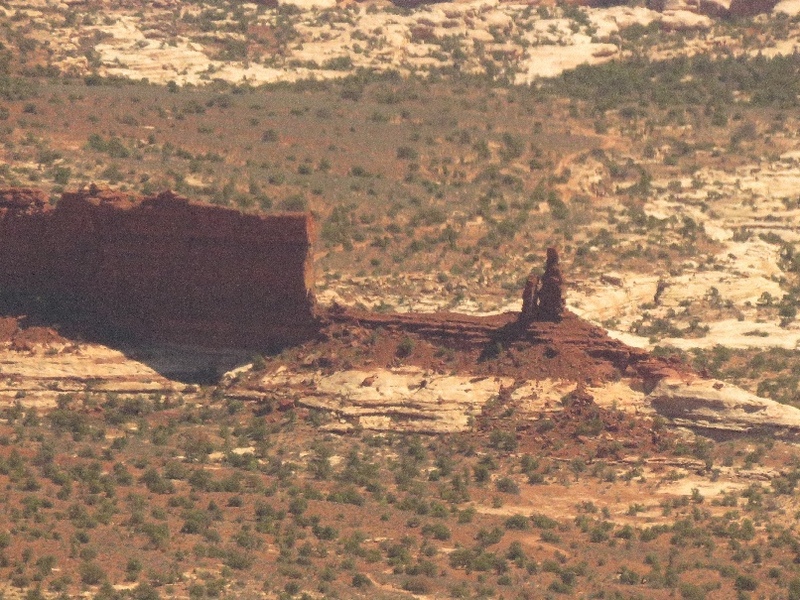 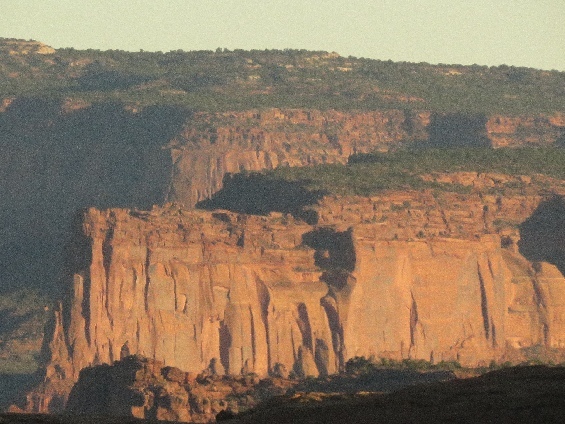 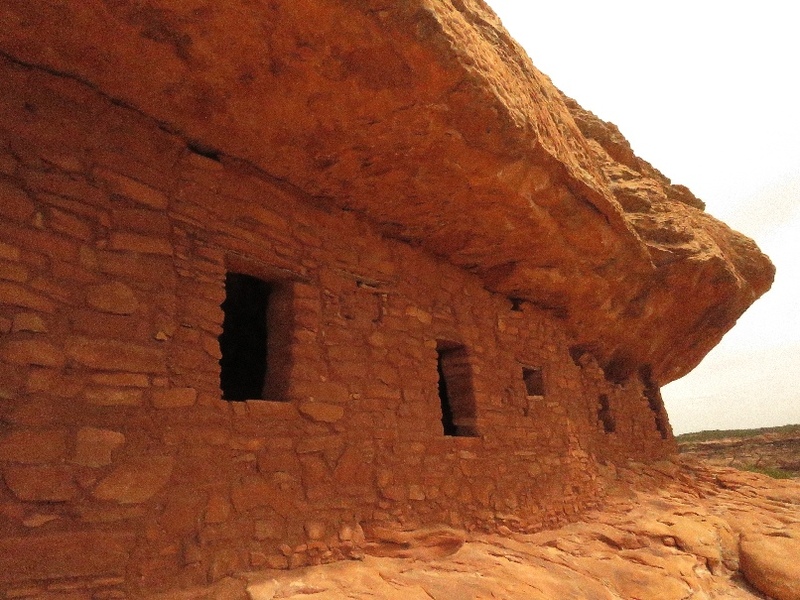 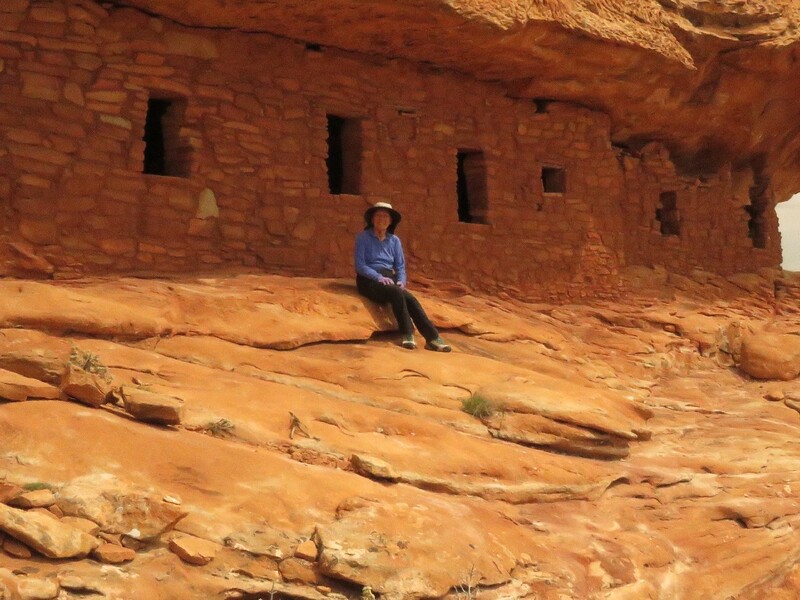 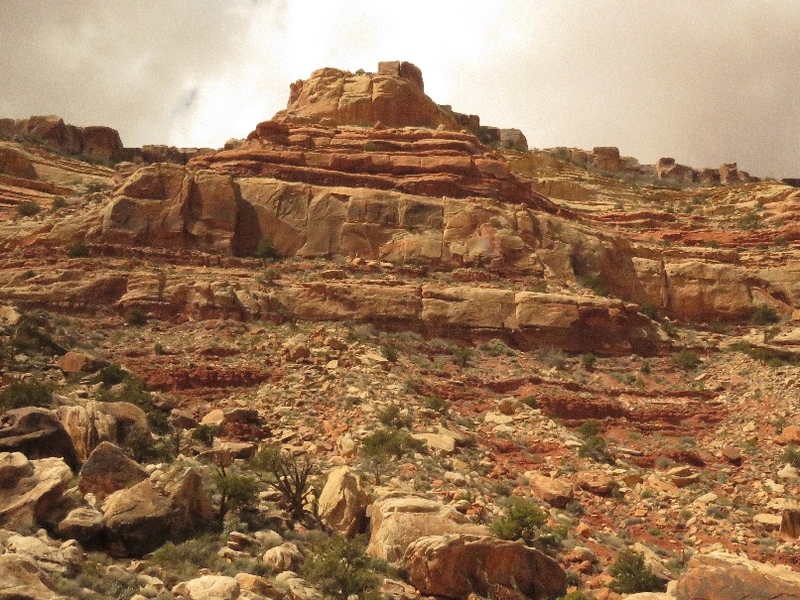 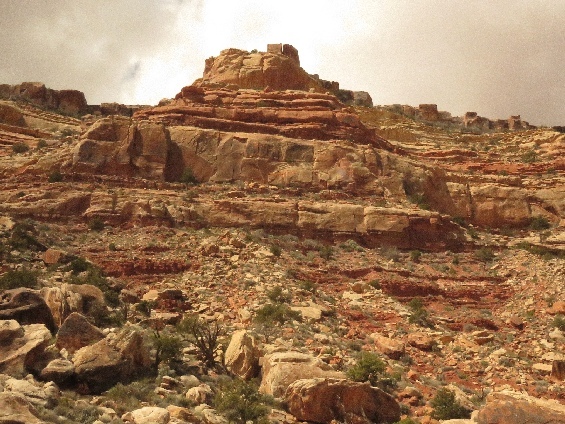 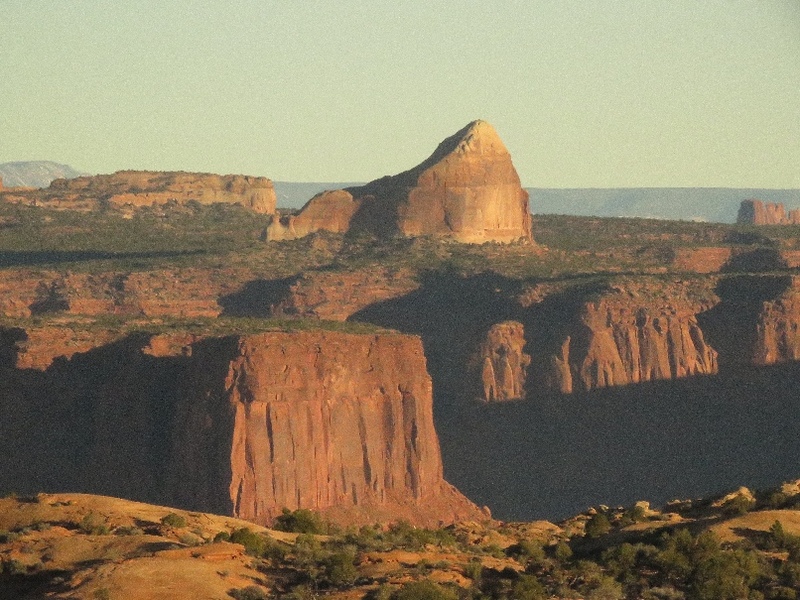 4/2/2019 Citadel Ruin, Cedar Mesa, UT - I did some home works but joined a group, one of the member knows exactly how to get there. 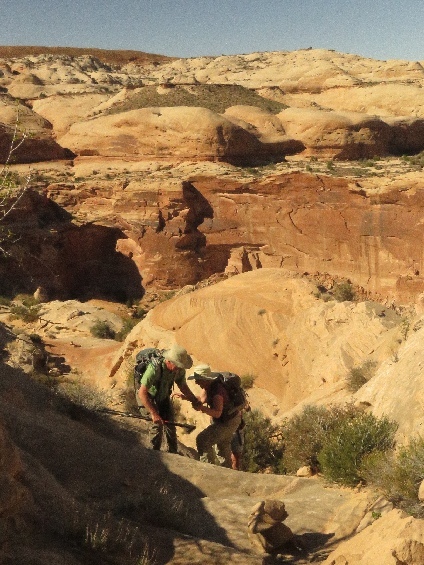 There are more than one way to get to the ruin, we took harder way to get there, we are all good hikers. 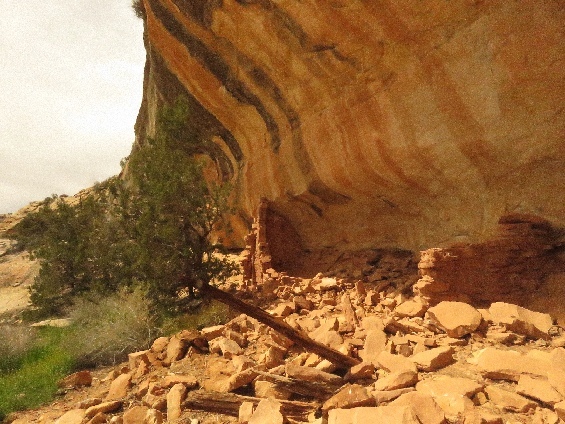 The ruin is located at end of the peninsula and face south, after visited the ruin, I have hiked to the south rim to see the ruin view. 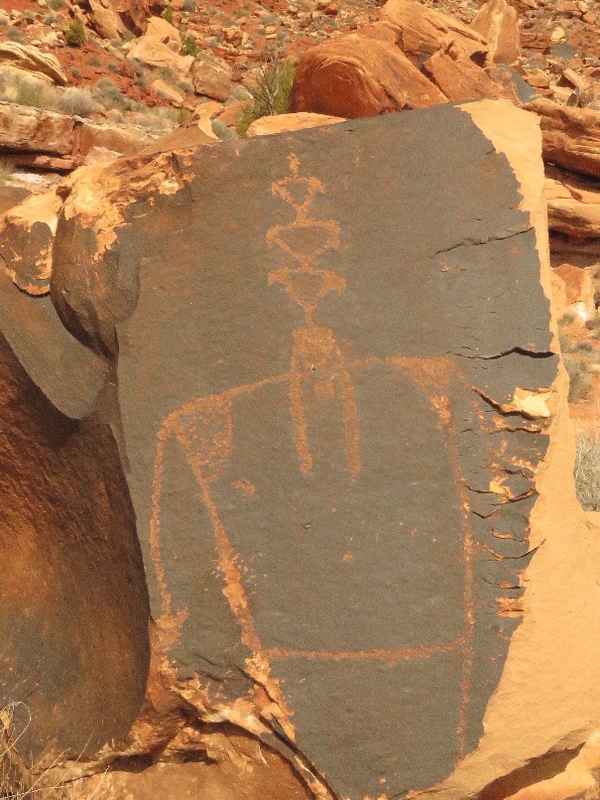 4/3/2019 Cedar Point Rock Art, Cedar Mesa, UT - I saw total eleven rock art panels today, most of are new to me, and some of are I found at last time. Side-way-panel is the most unique panel in this area. 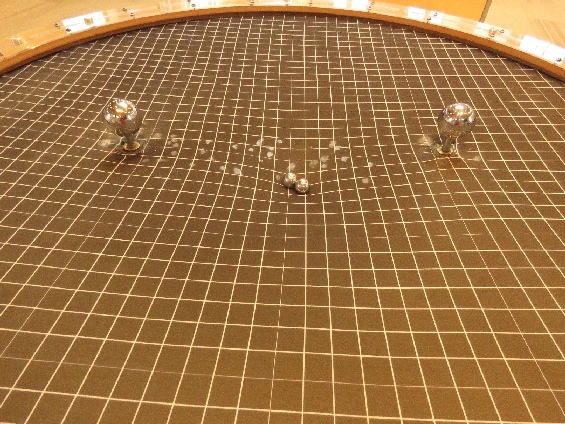 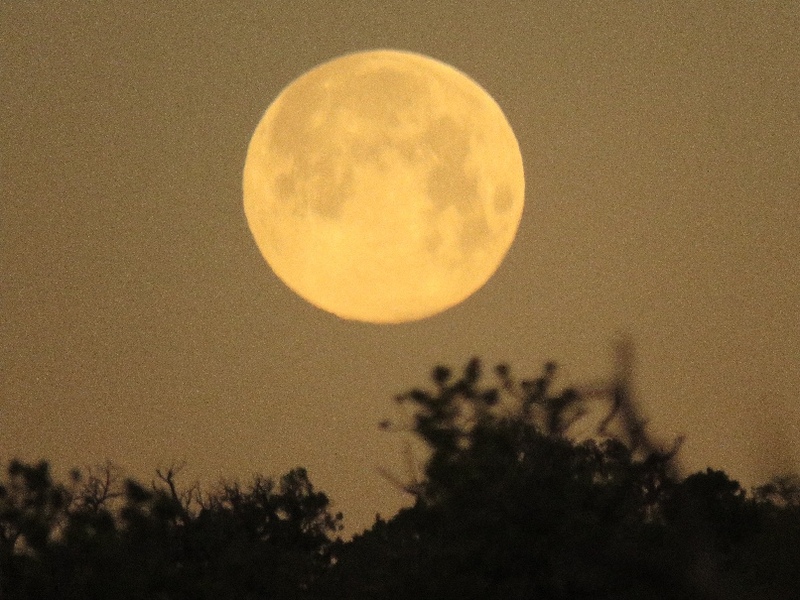 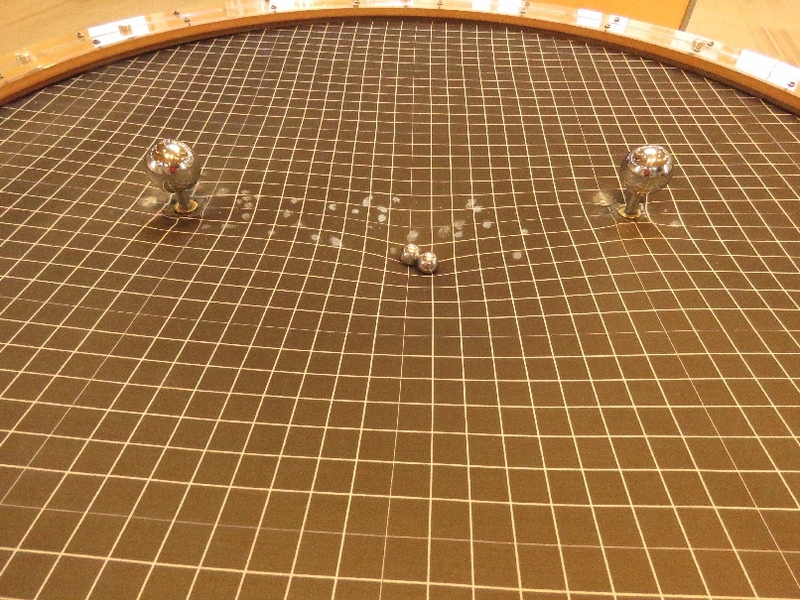 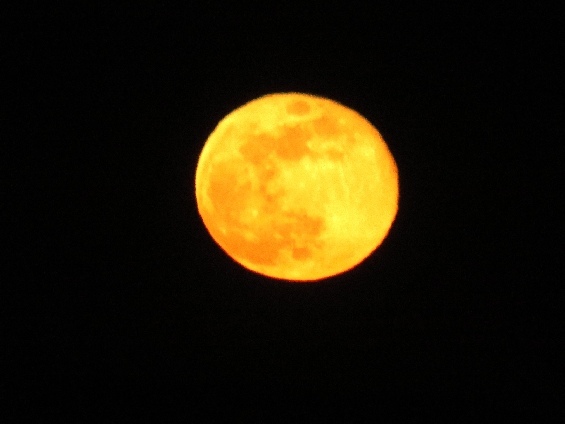 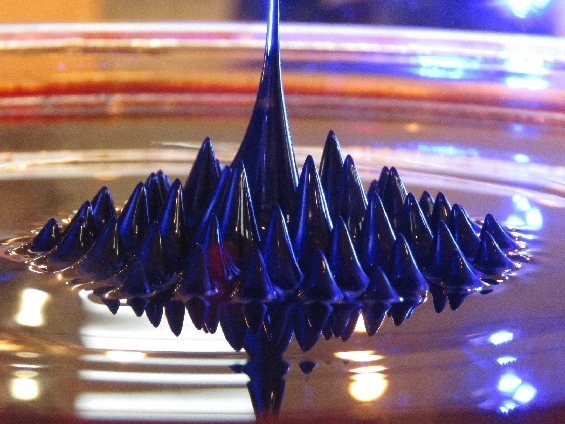 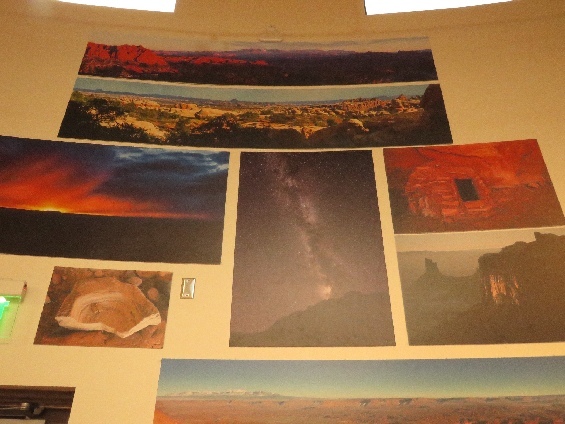 You think photos are side way, but I am posting the right way that the way we can see it. 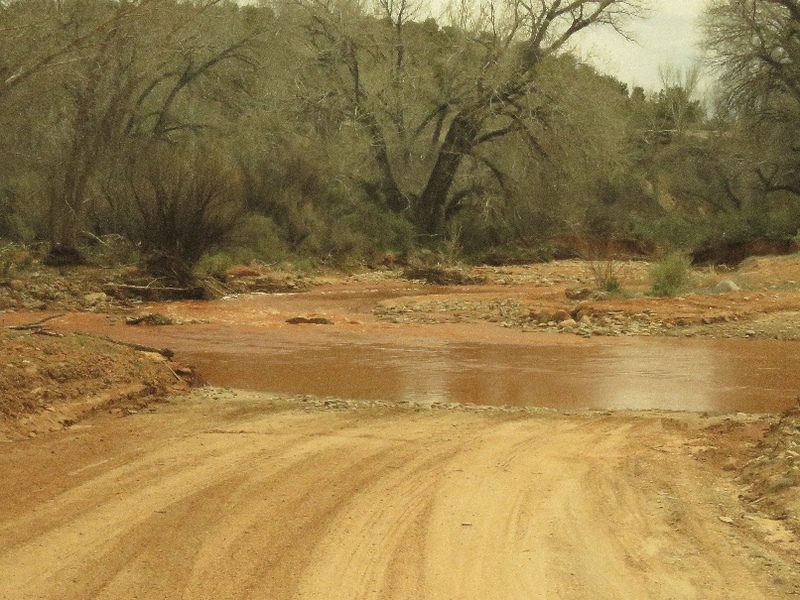 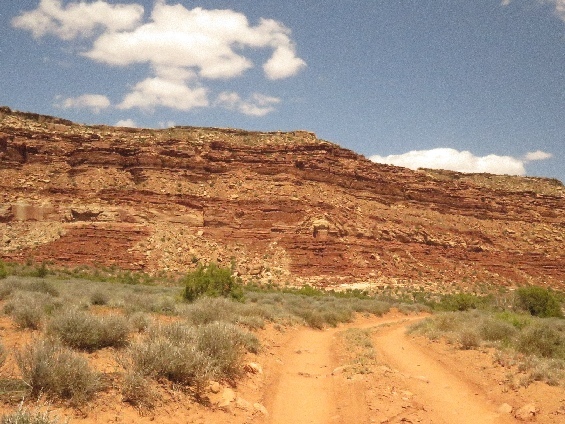 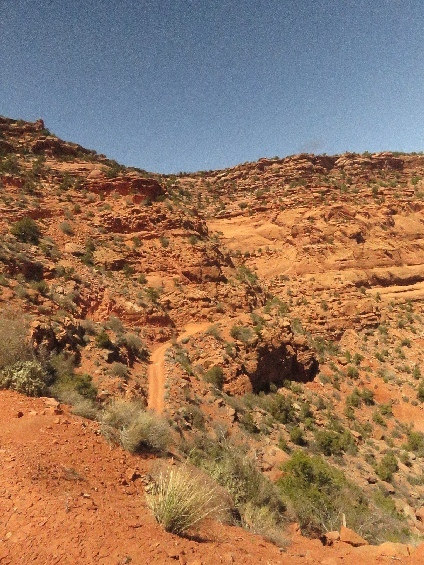 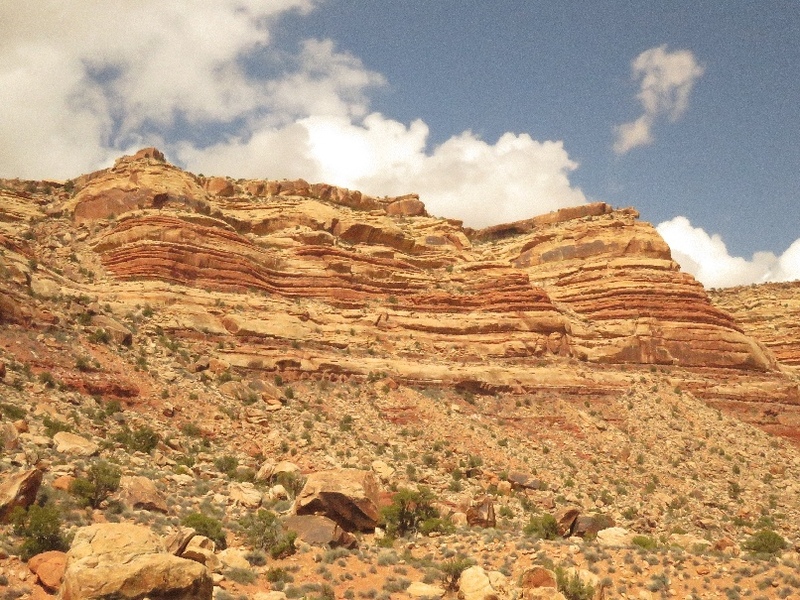 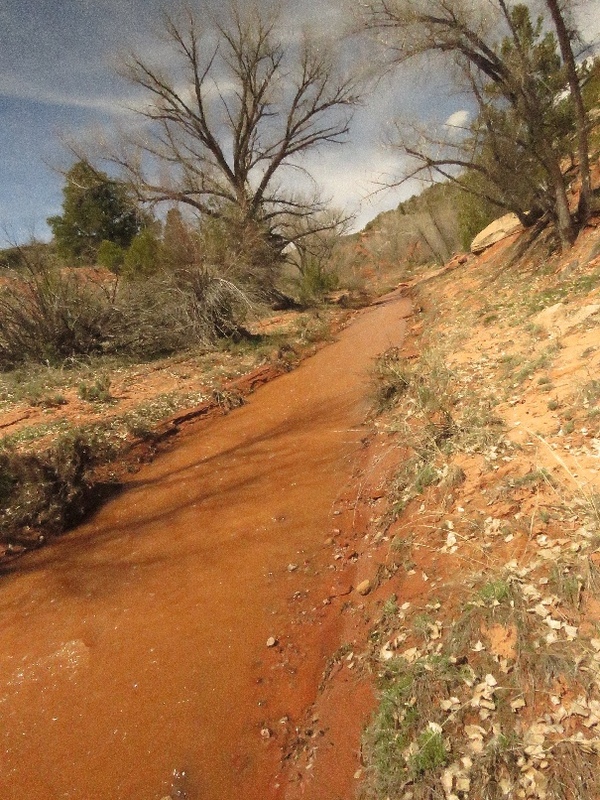 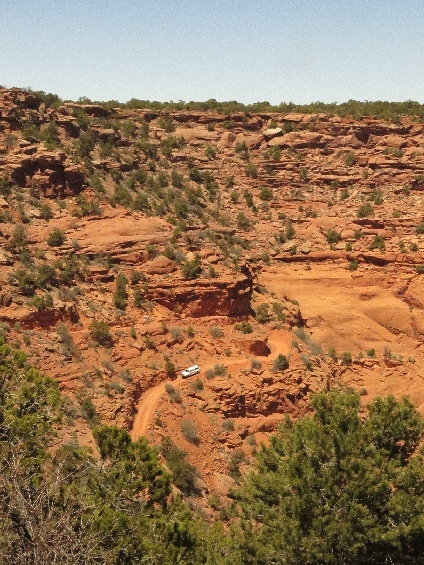 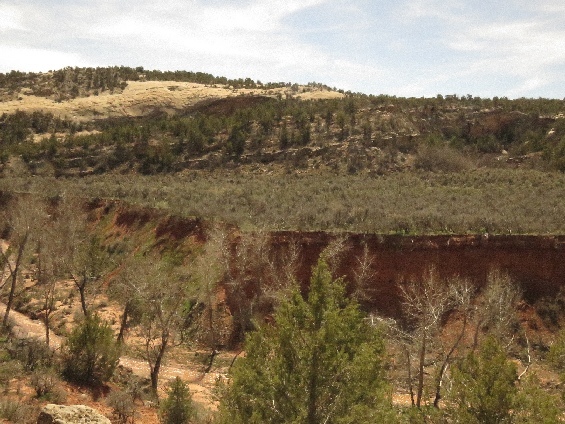 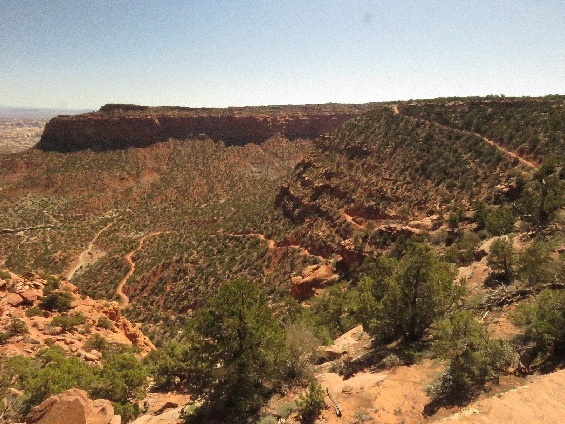 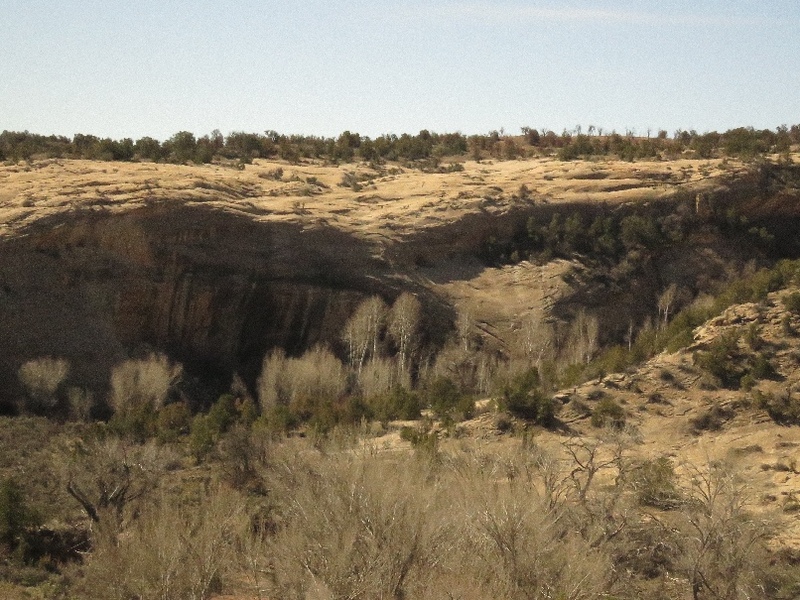 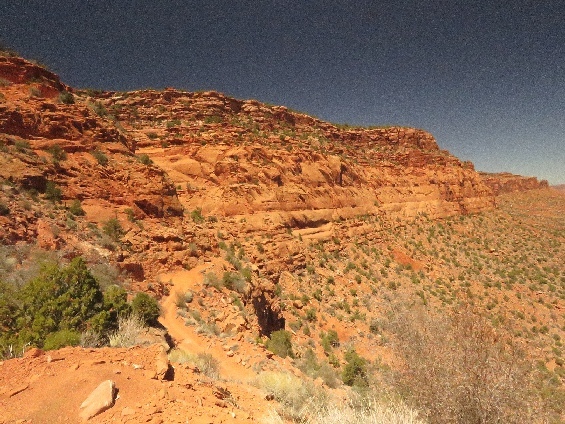 4/3/2019 John’s Canyon, Cedar Mesa, UT - John’s Canyon Road is rough at time-to-time and narrow at place-to-place, some times can see the few hundred feet drop down, the road is one way road all the way, lucky me there was no opposite traffic when I was there. 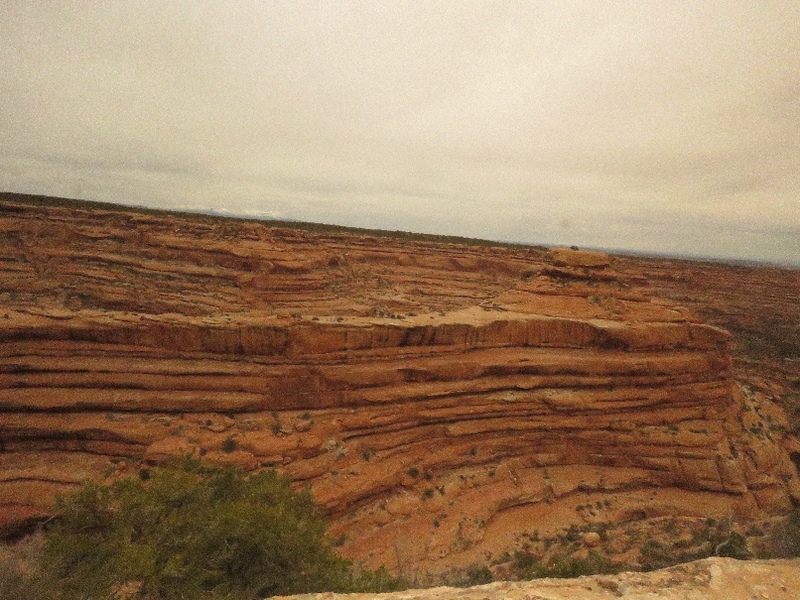 It is beautiful area, just like driving in the Grand Canyon. 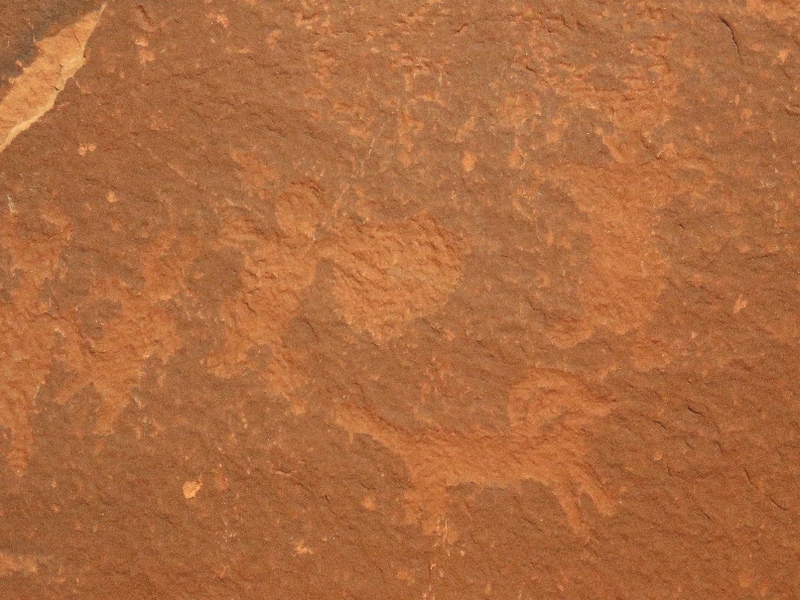 4/4/2019 John’s Canyon RA, Cedar Mesa, UT - I found seven rock art panels today that all new to me. 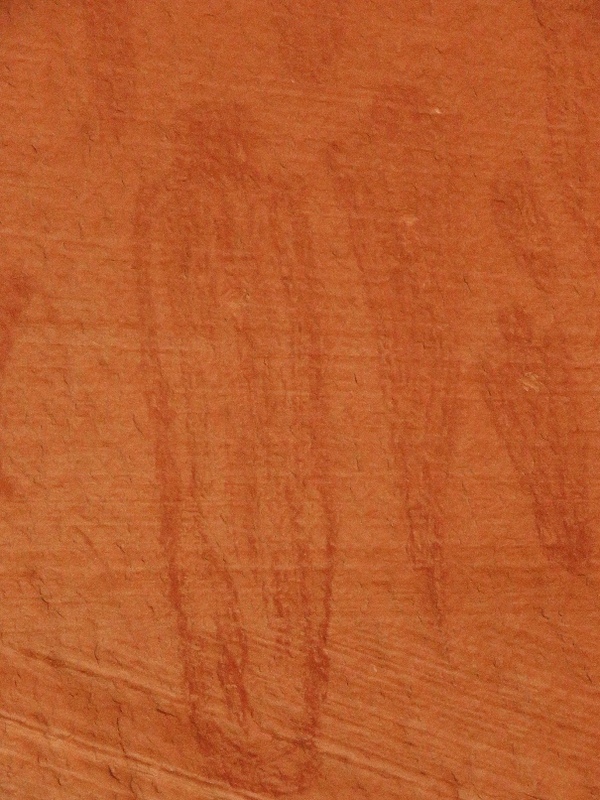 Some panels are very good, some panels are faded out. 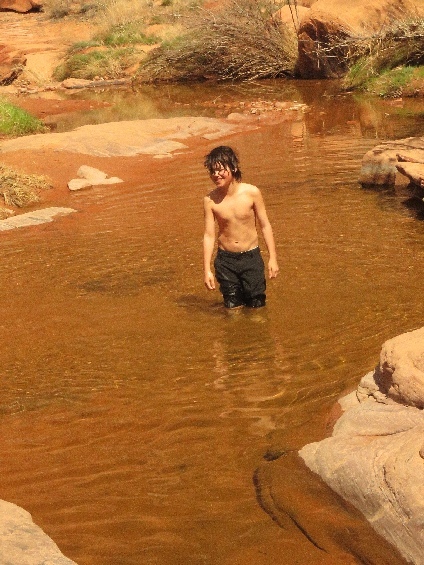 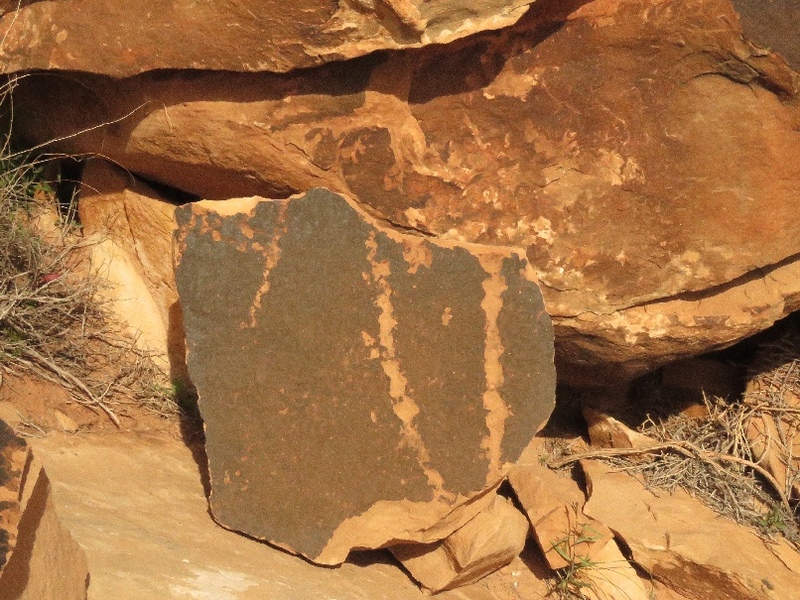 Nice weather, nice view, I enjoyed finding rock art hiking, whenever I found rock art panels, it must be a good hike. 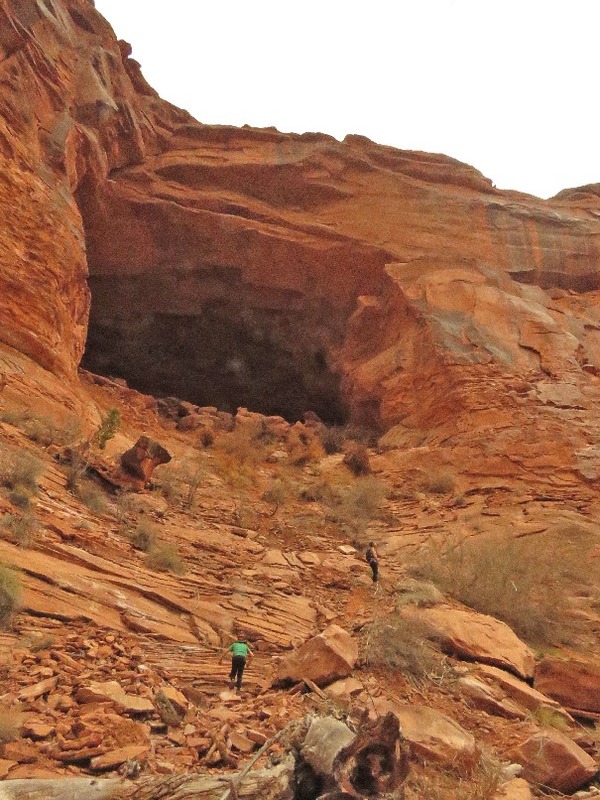 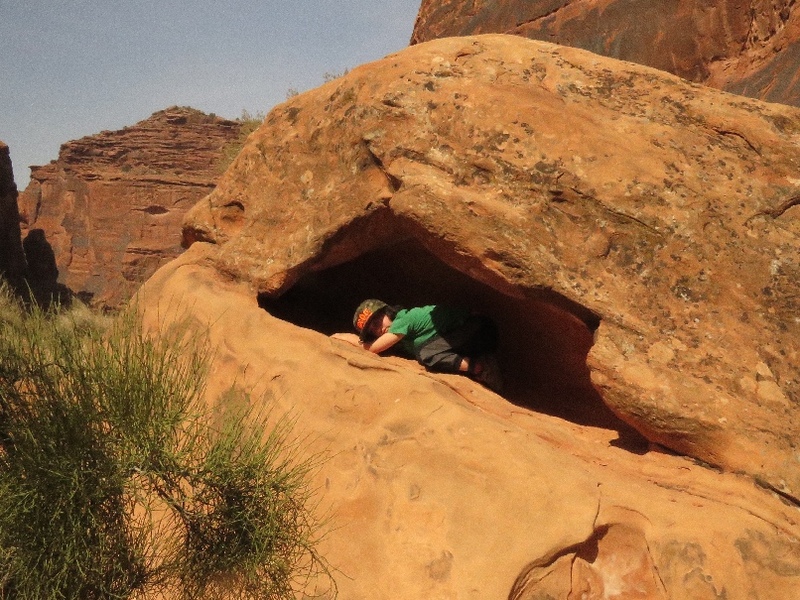 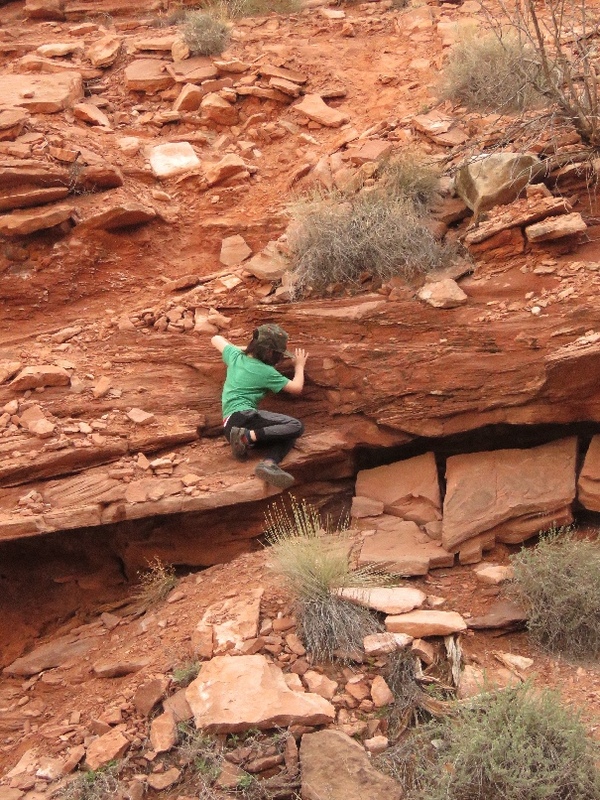 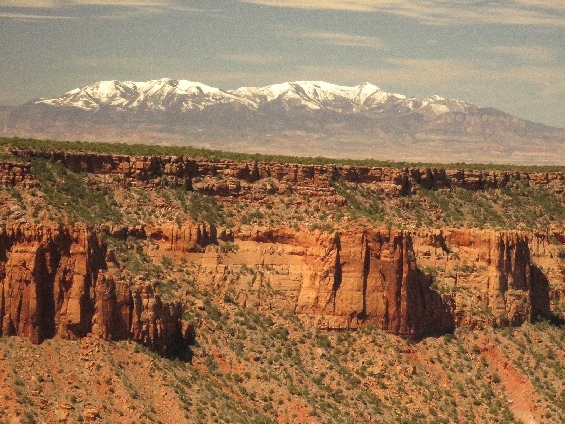 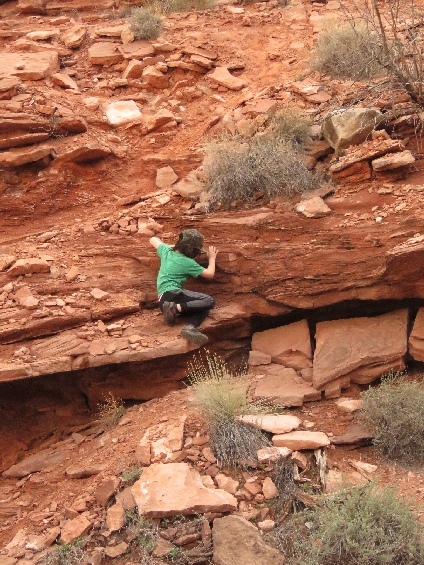 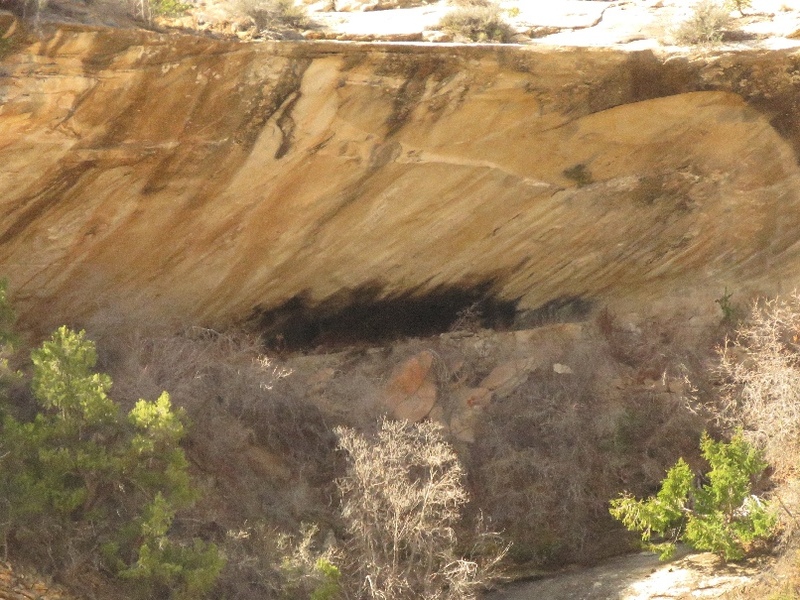 4/7/2019 Cave-7 Search, North Fork Whisker Draw Area, UT - I didn’t know the exact location of the Cave-7, I thought if go there I can find it, I’ve hiked all over there inc up/down the ravine walls many times, but can’t find it. When came back and checked the google, it shows the exact location, I won’t miss it at next time. 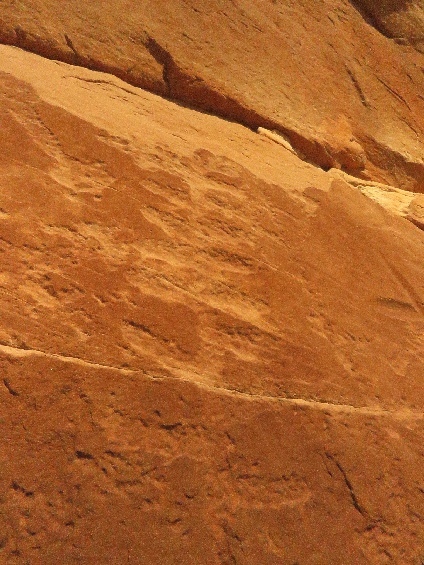 3rd row center, 4th row 2nd from right are Cave-8. 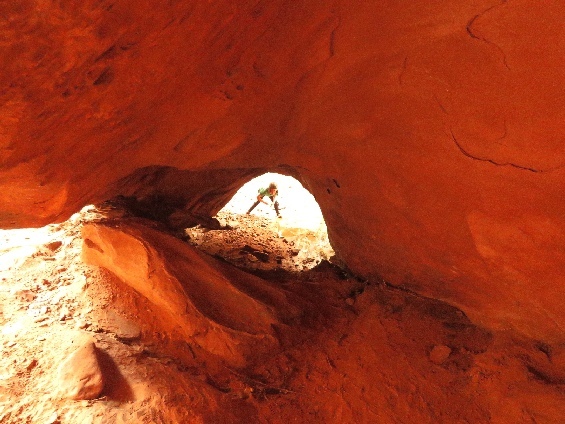 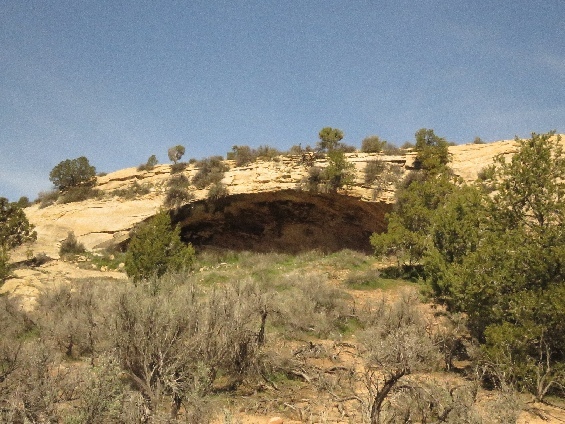 4/7/2019 Cave-9 (Kay Dubbed), North Fork Whisker Draw Area, UT - This cave (alcove) is located just below the trail, where came down the rocky hill. 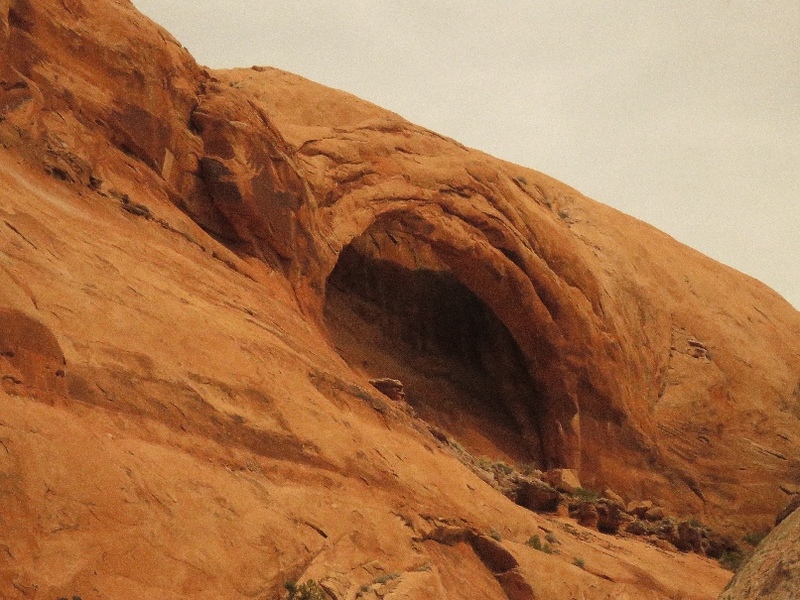 This is the most easiest cave to visit. 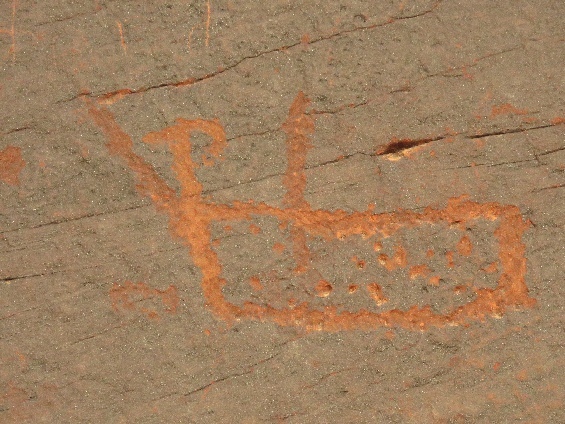 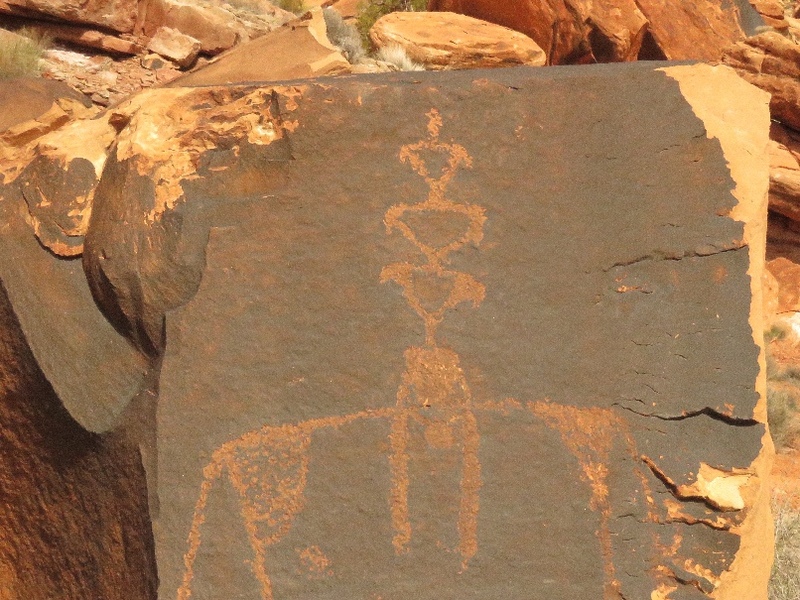 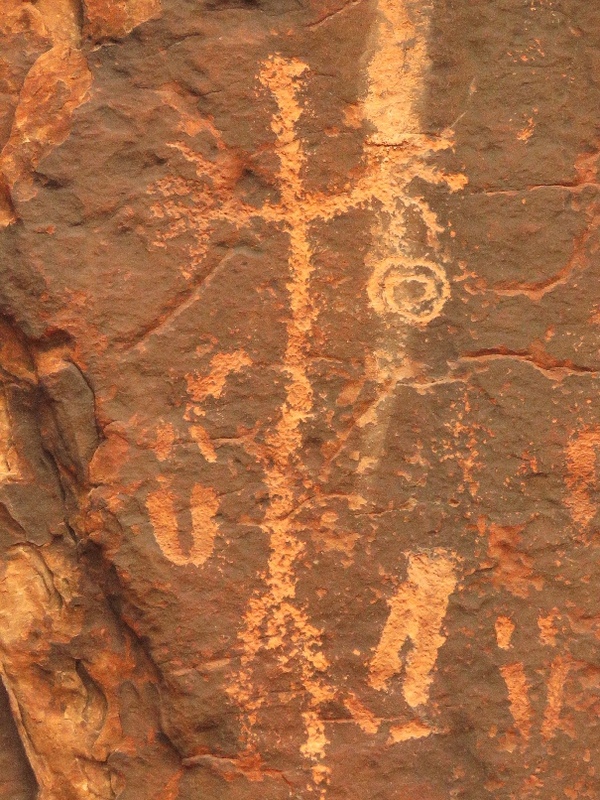 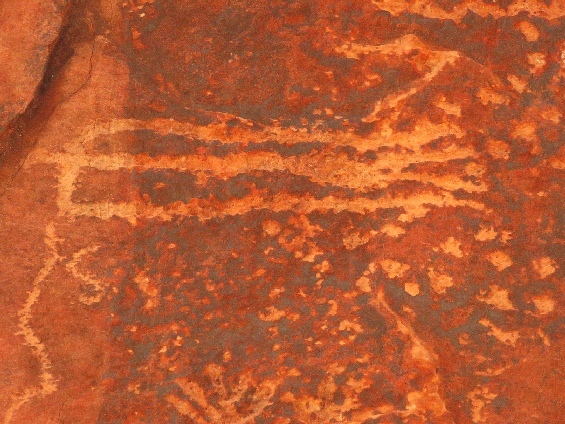 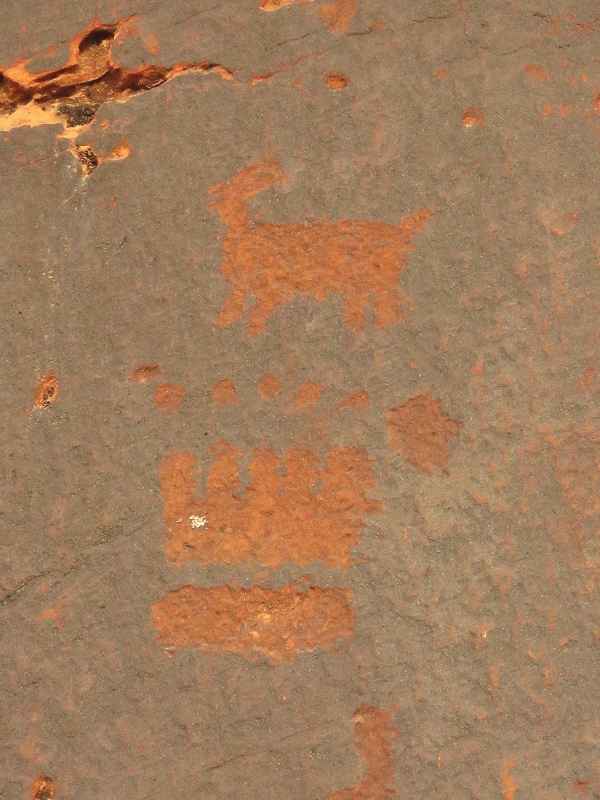 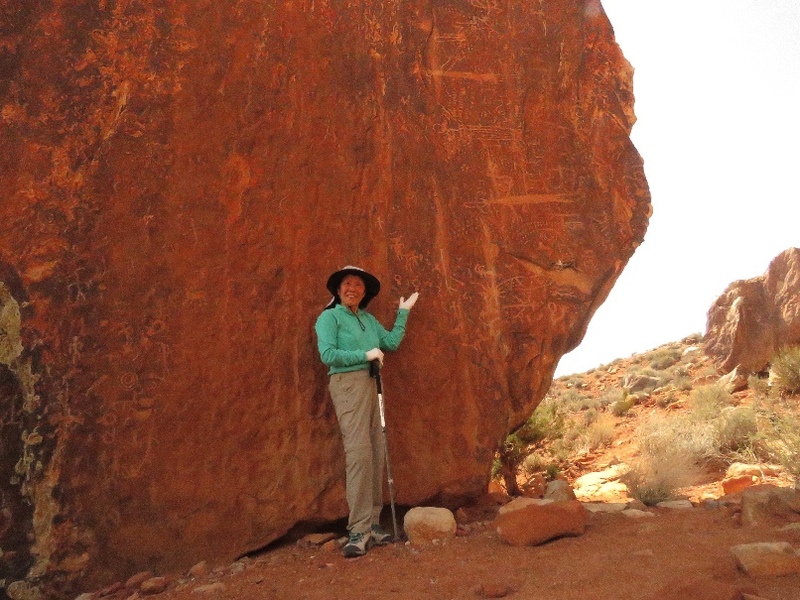 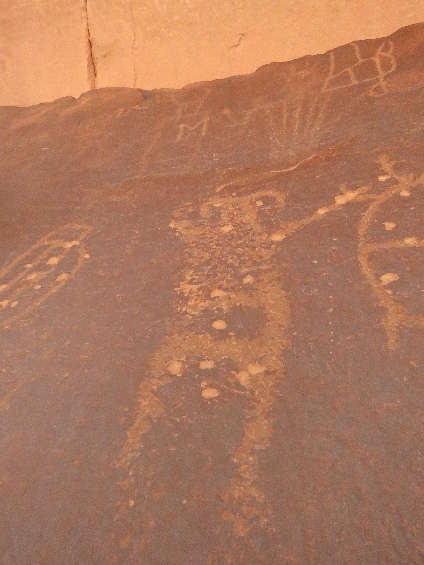 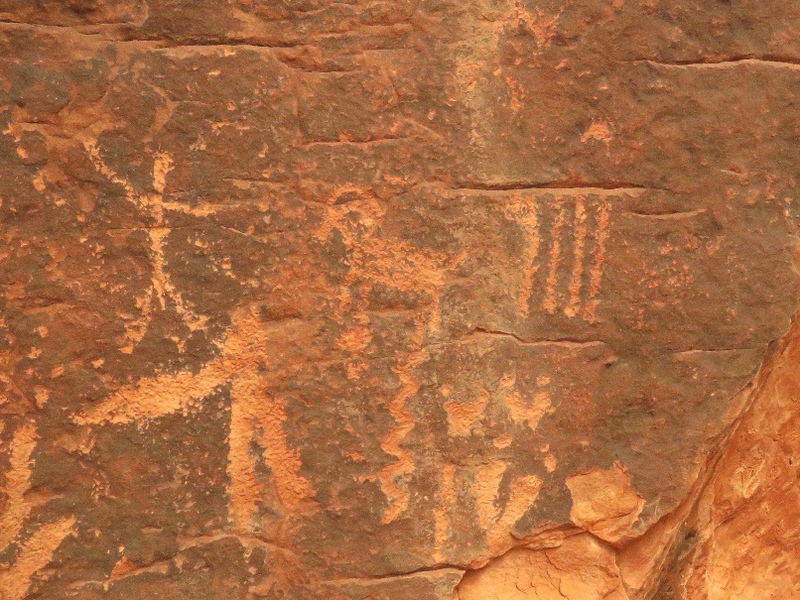 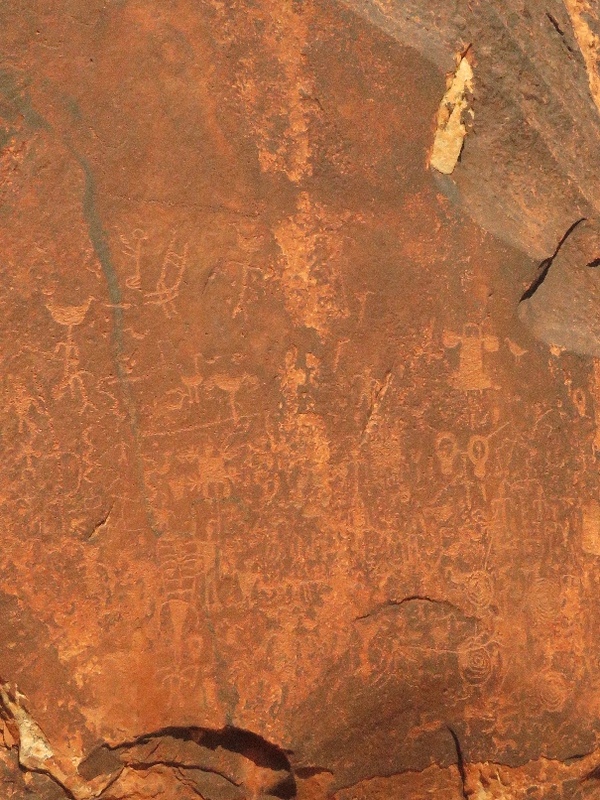 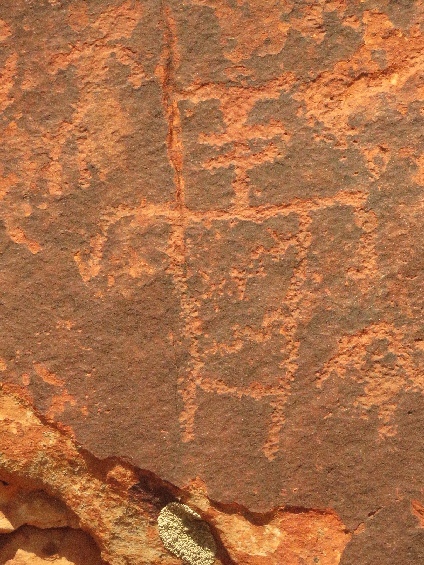 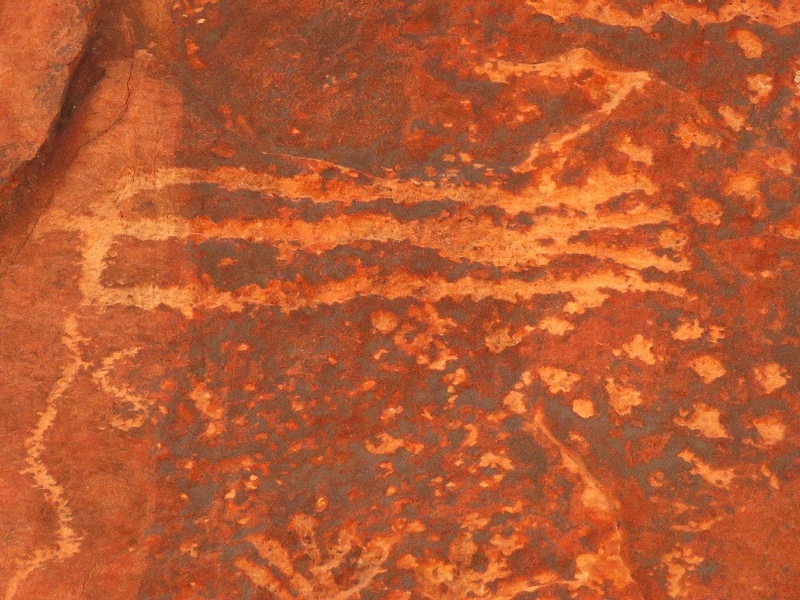 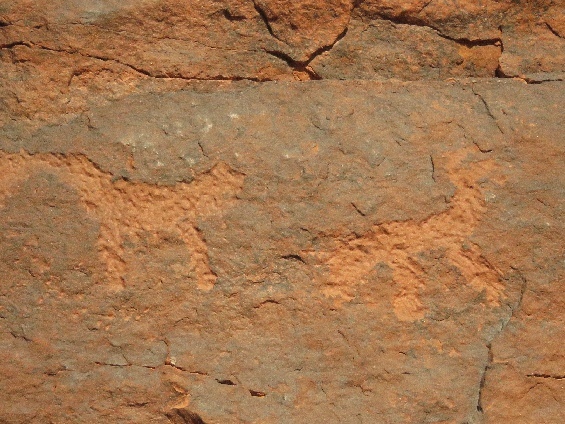 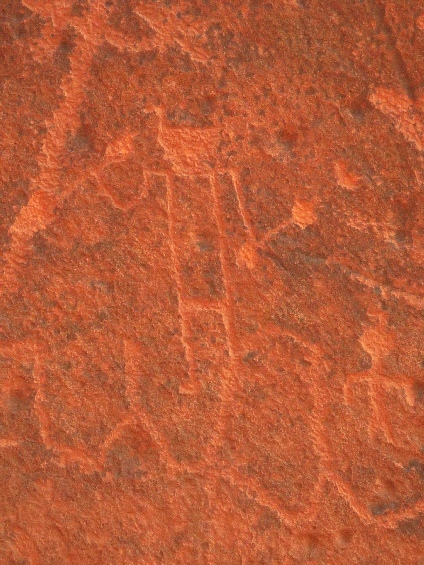 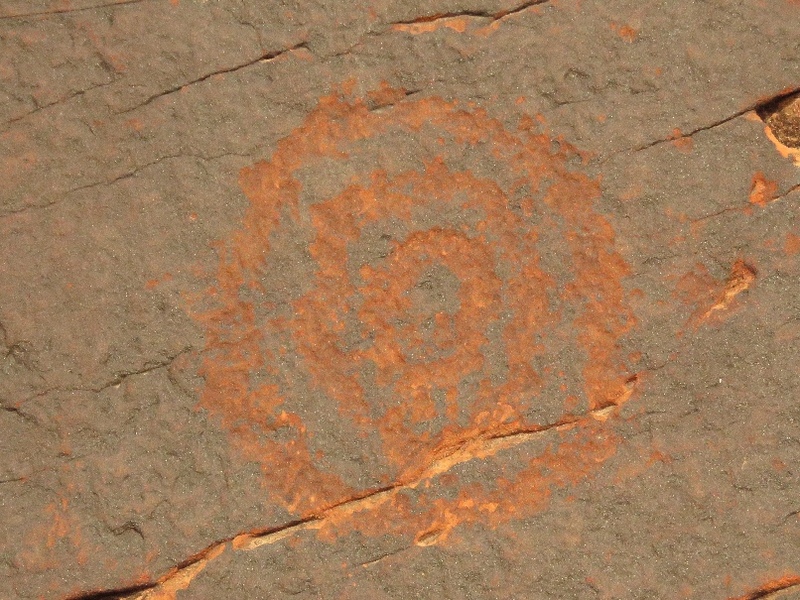 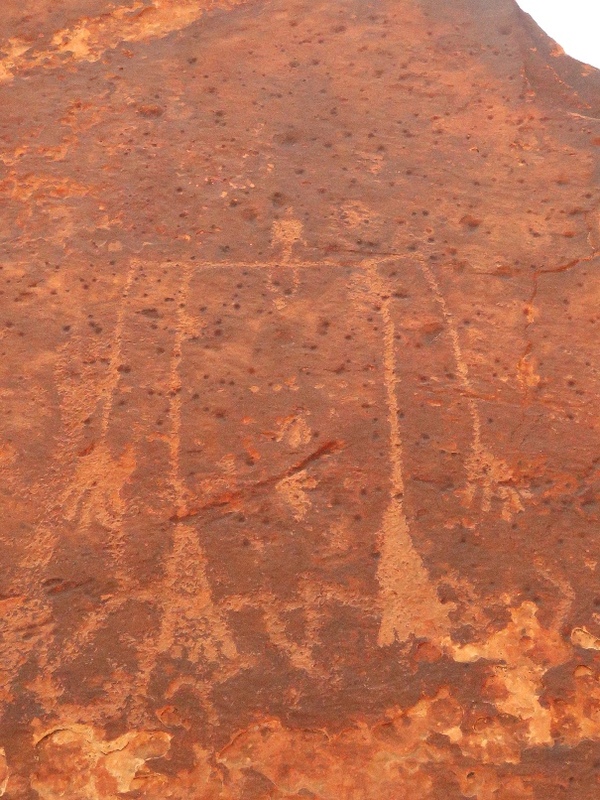 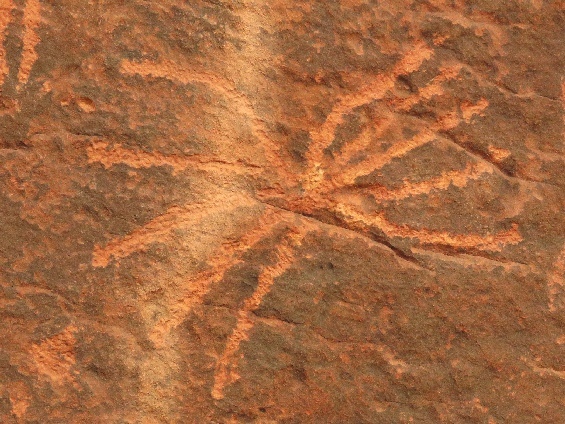 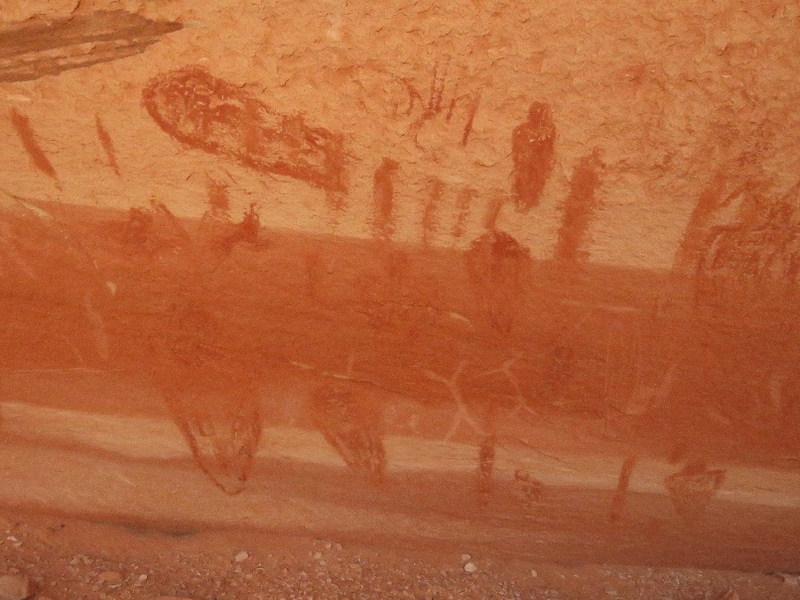 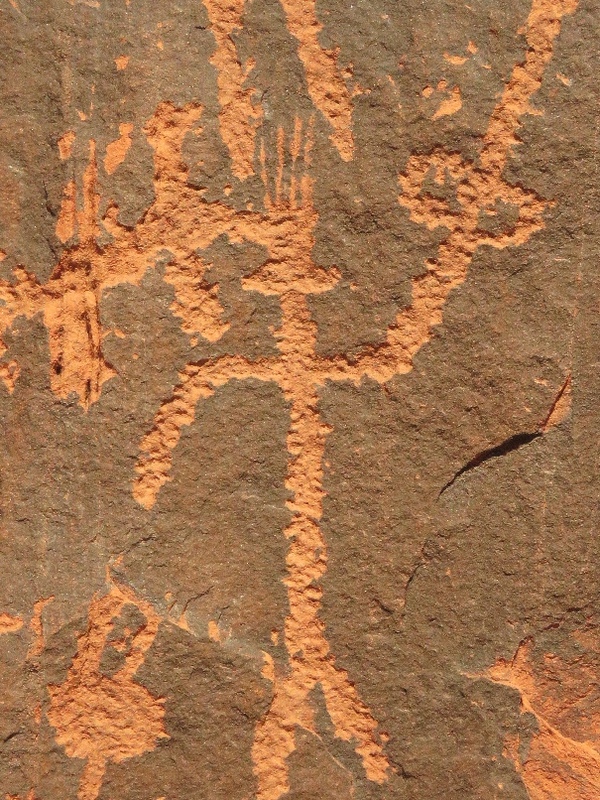 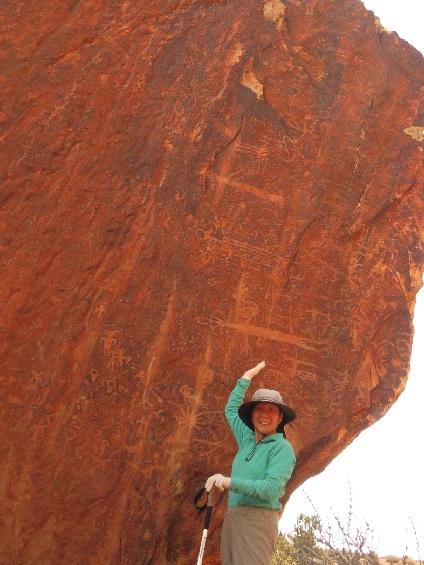 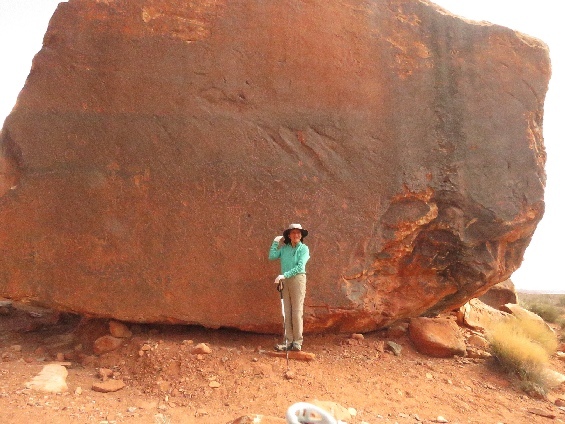 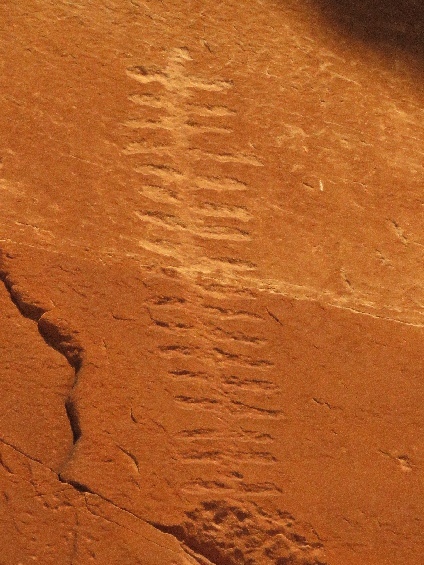 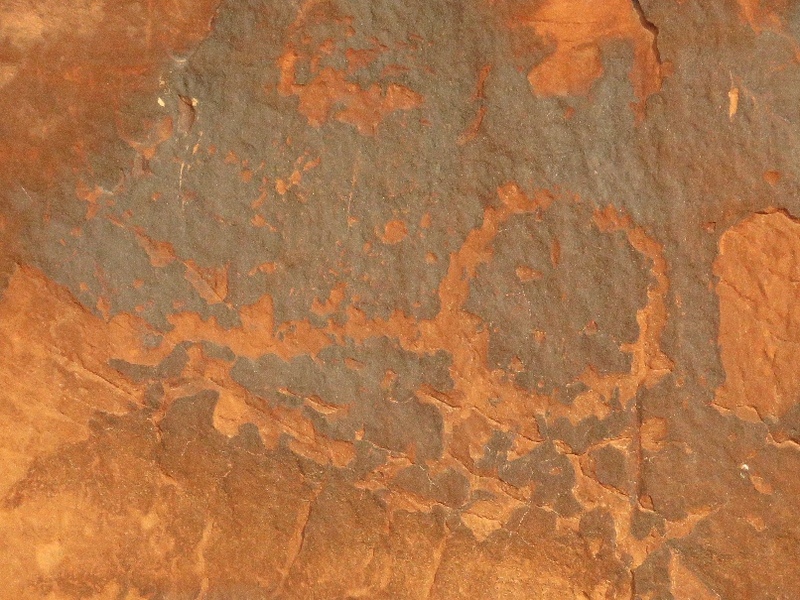 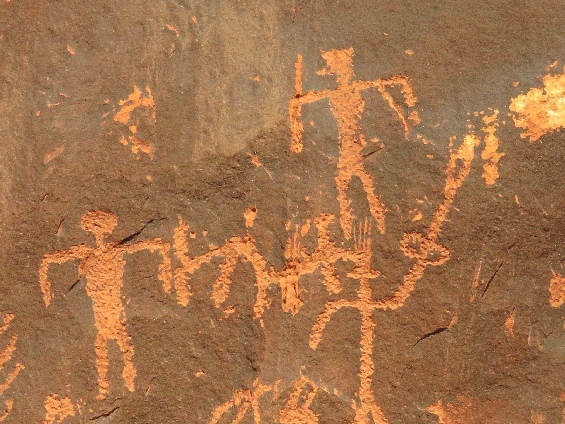 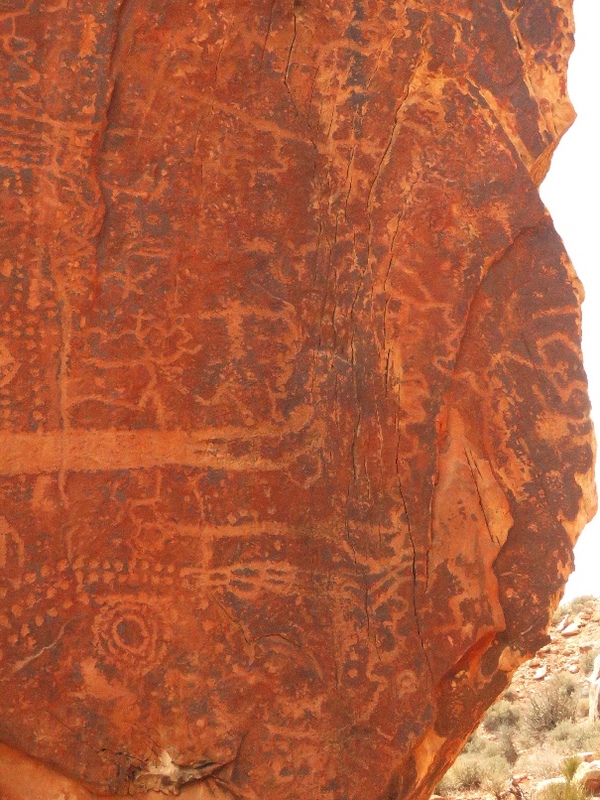 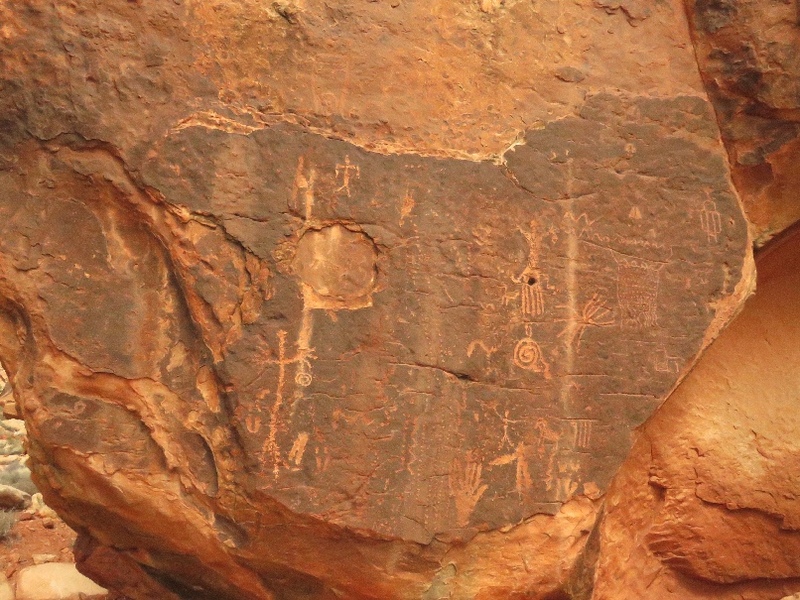 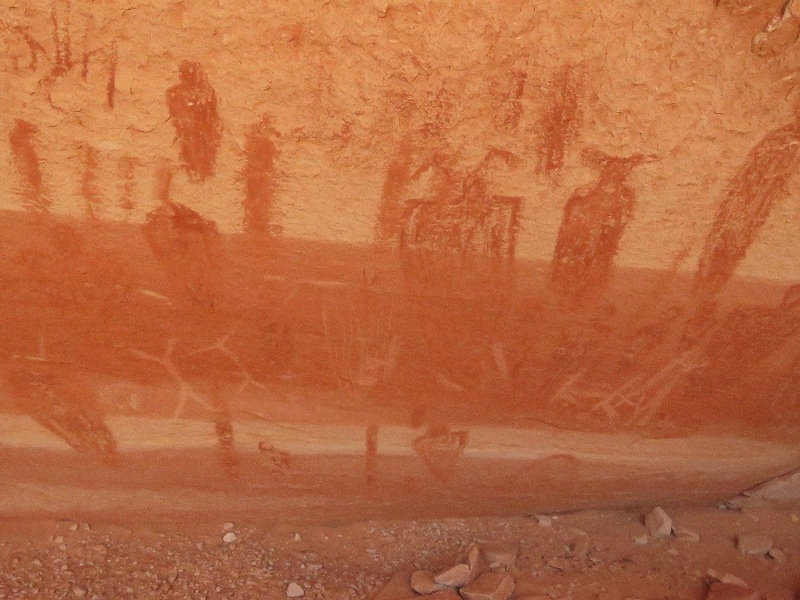 There are few pictographs and petroglyphs, some of are overwriting, I can’t tell it is old or not so old. 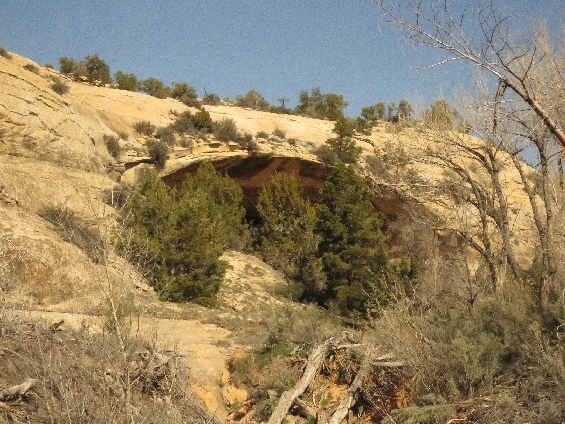 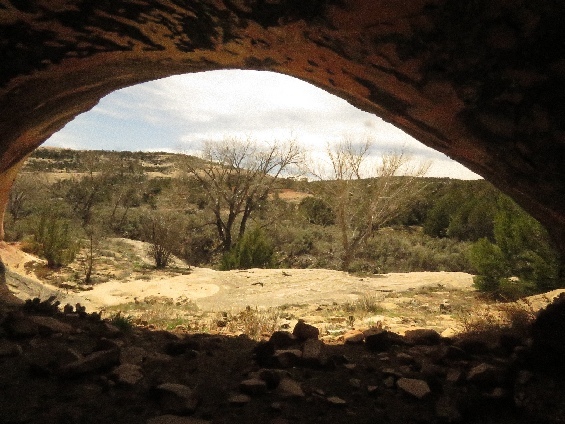 4/7/2019 Cave-10 (Kay Dubbed), North Fork Whisker Draw Area, UT - This area has many caves (actually alcoves, but let’s called caves) but not every caves have ruin or remaining of ruin, I took photos of whichever cave has remaining ruins. 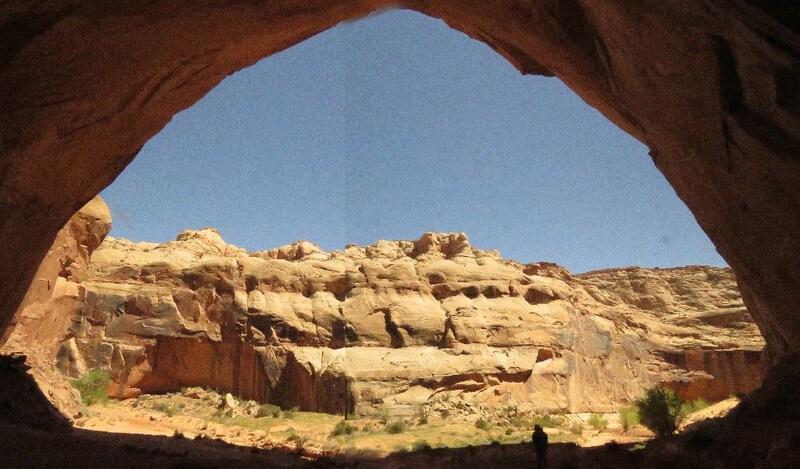 From this cave, view is very nice. 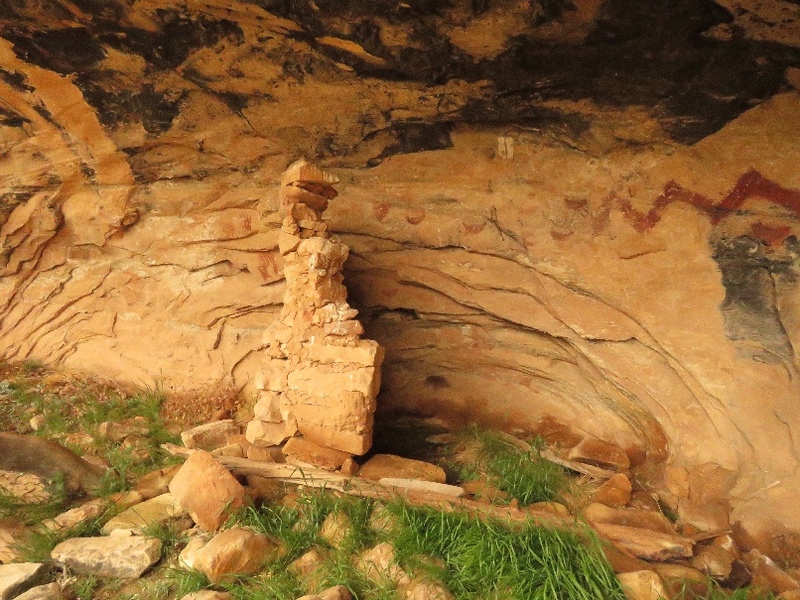 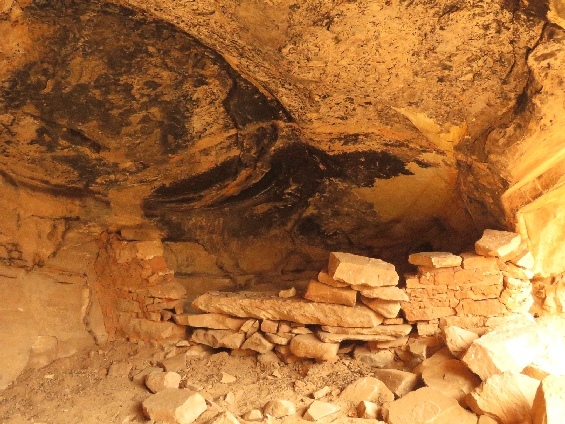 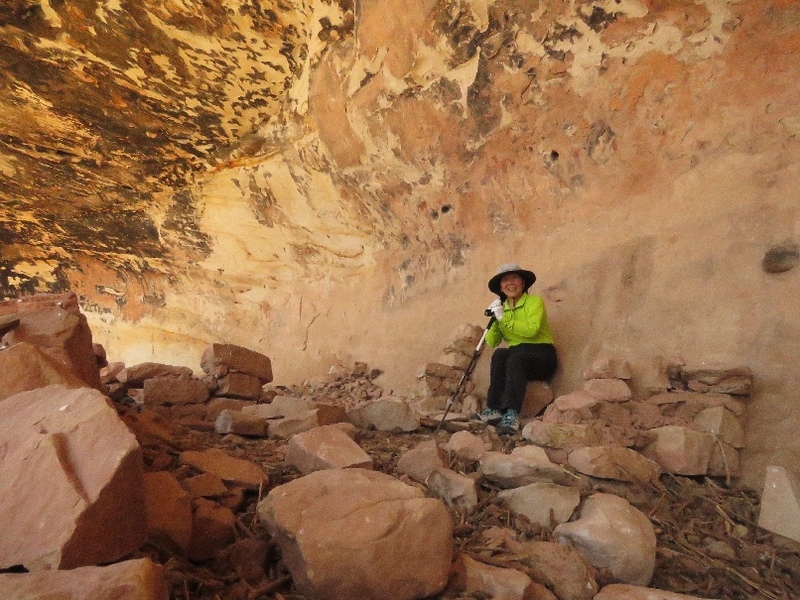 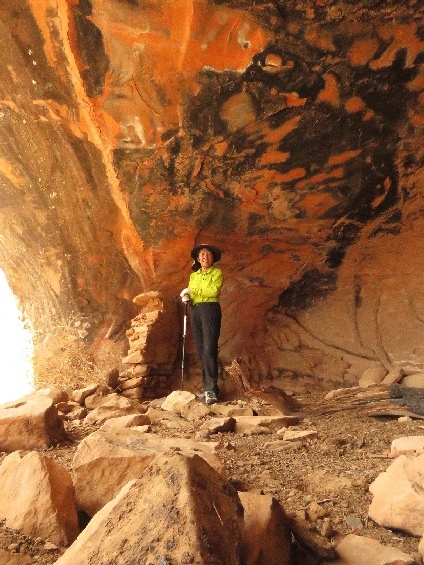 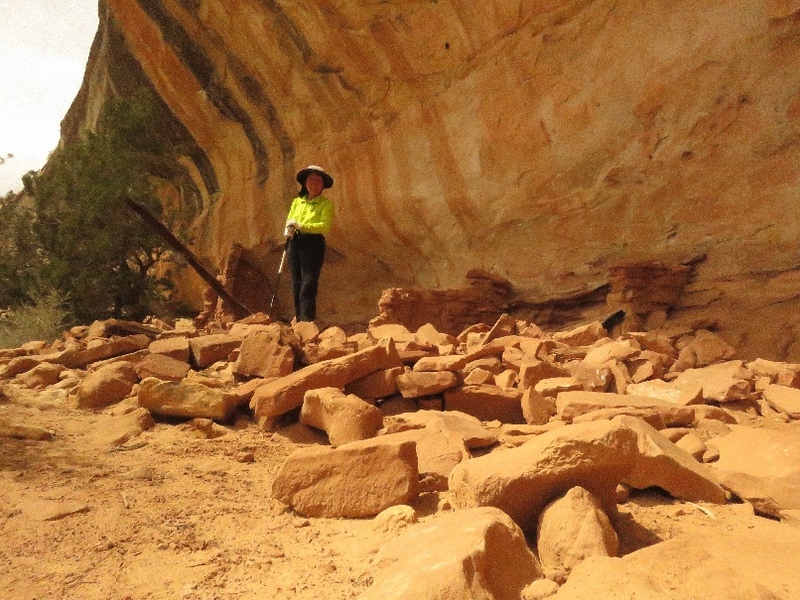 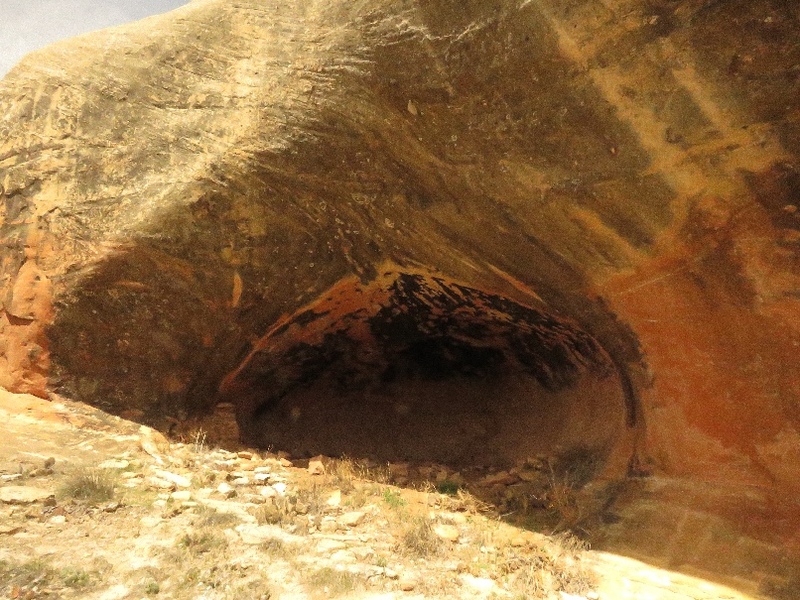 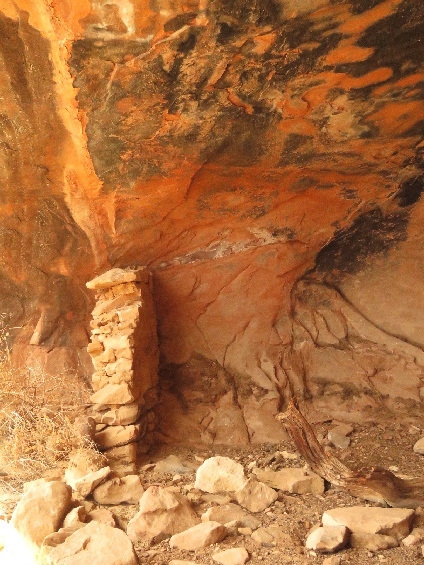 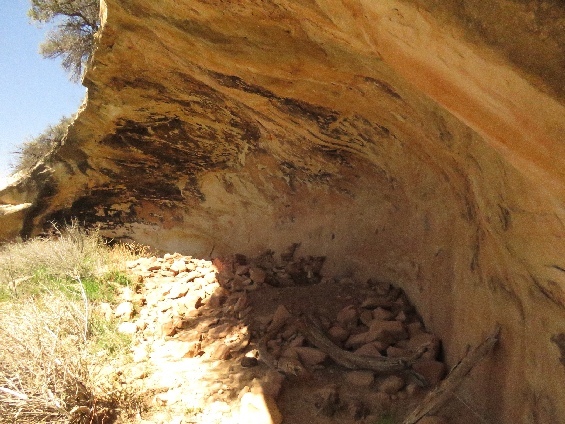 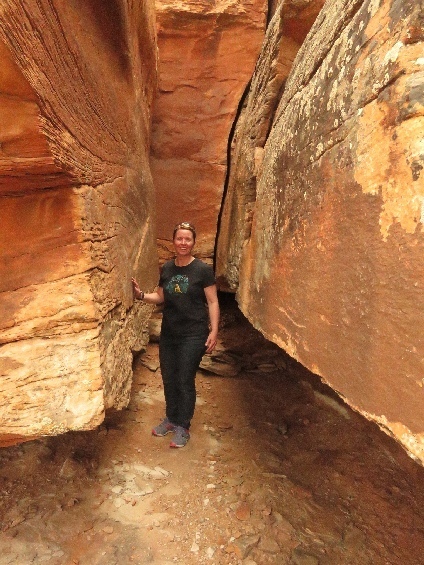 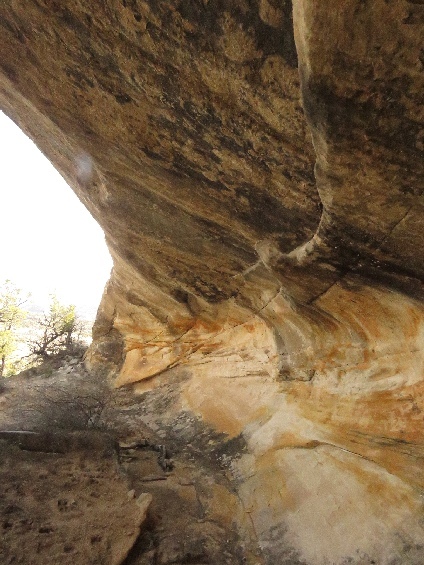 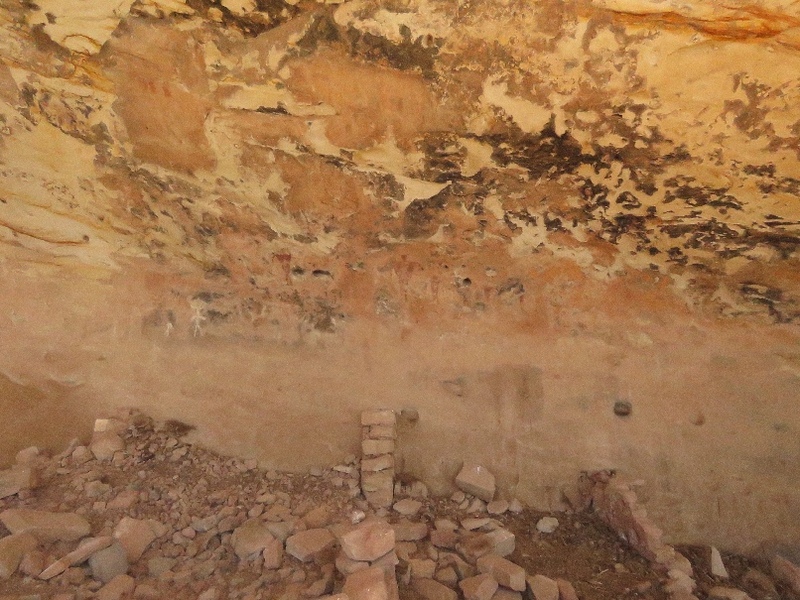 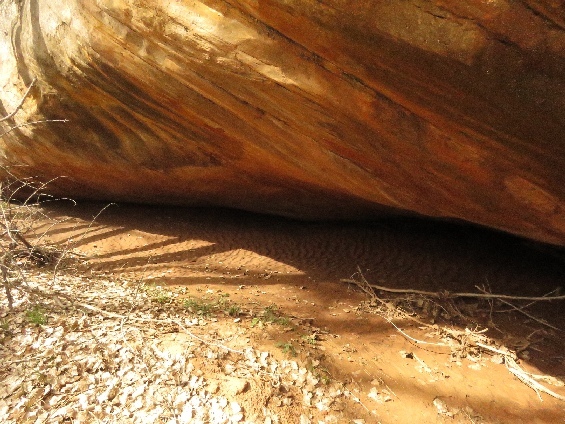 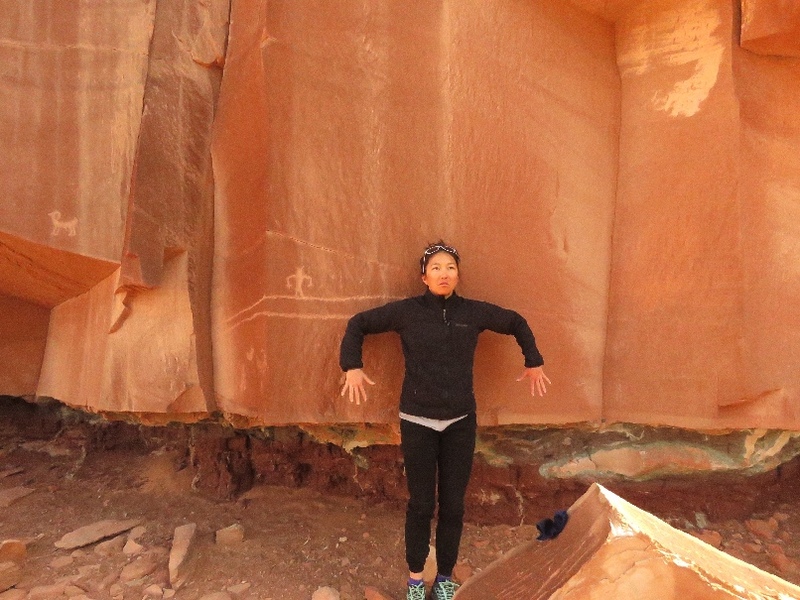 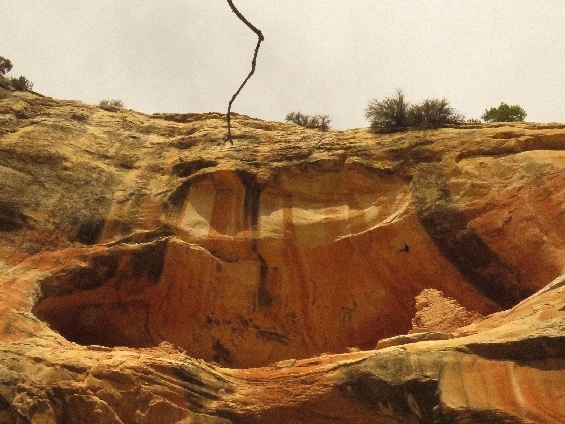 4/7/2019 Cave-11 (Kay Dubbed), North Fork Whisker Draw Area, UT - This is a large size alcove has some ruin remaining, and couple rock art, not many. 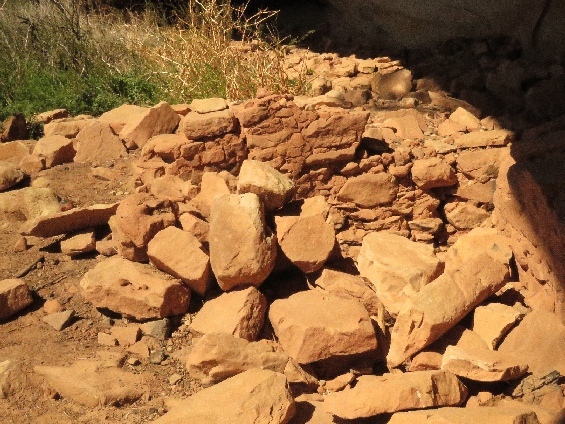 There are many rocks on the ground that building blocks of the ruin. 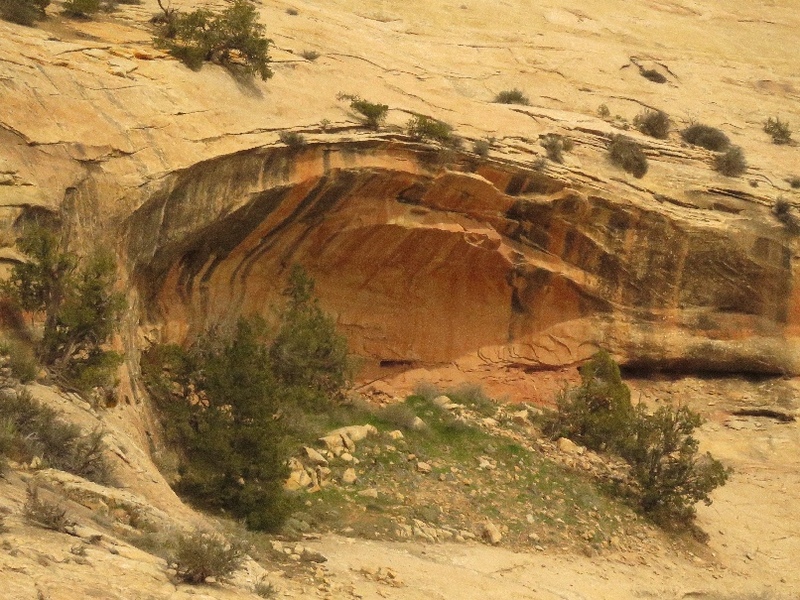 4/7/2019 Cave-12 (Kay Dubbed), North Fork Whisker Draw Area, UT - This alcove is located higher side of the cliff, and not far from the Over and Under Ruin. 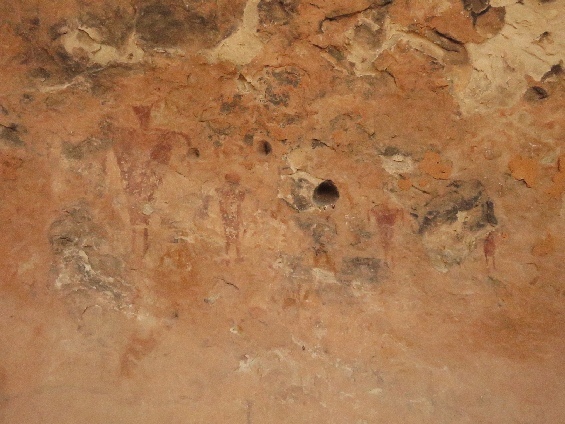 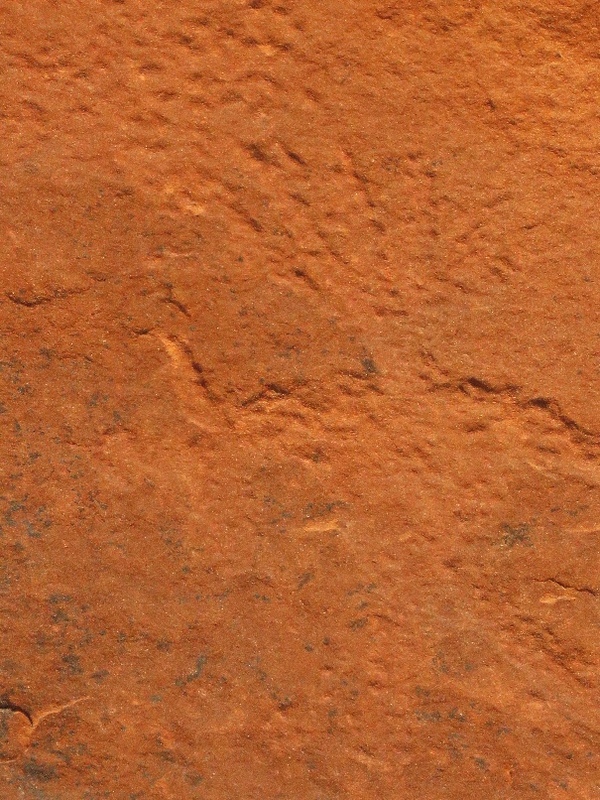 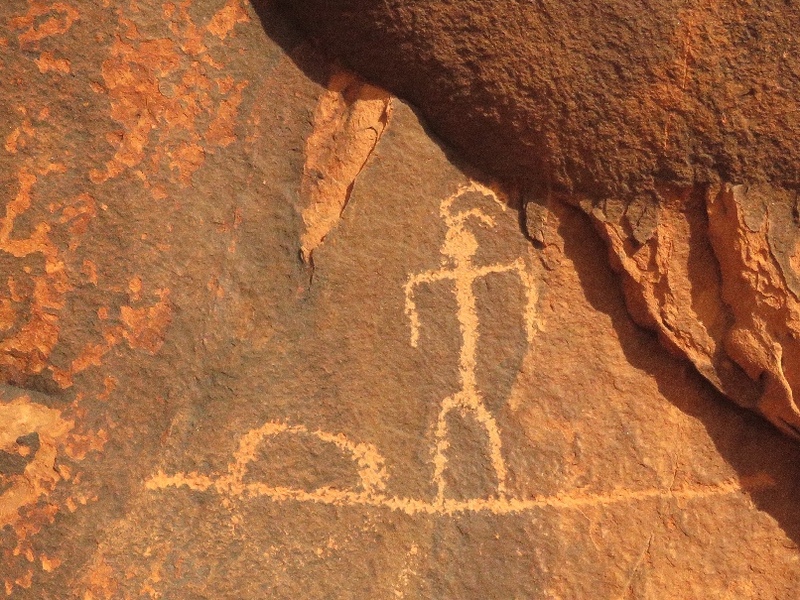 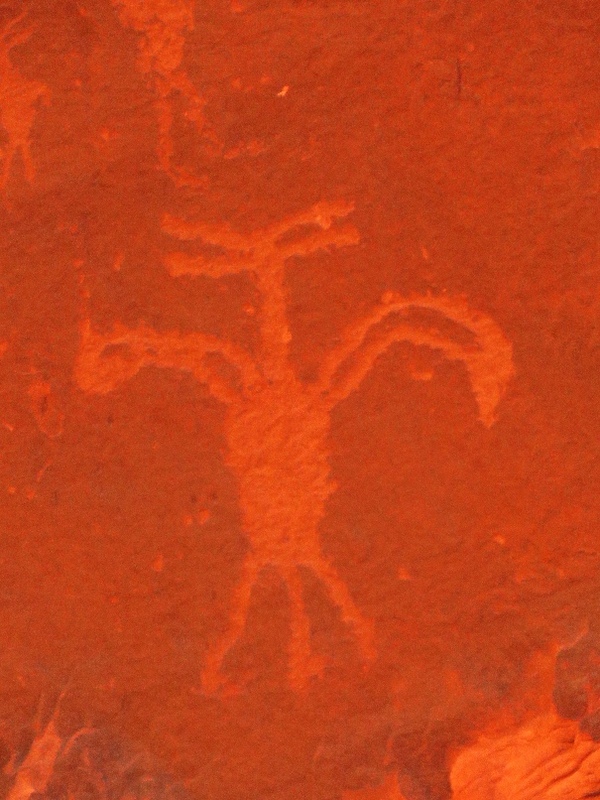 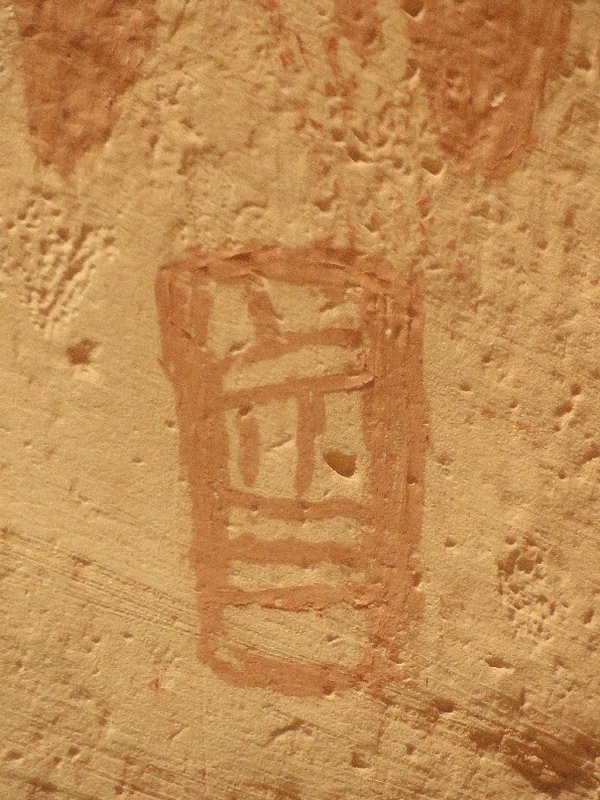 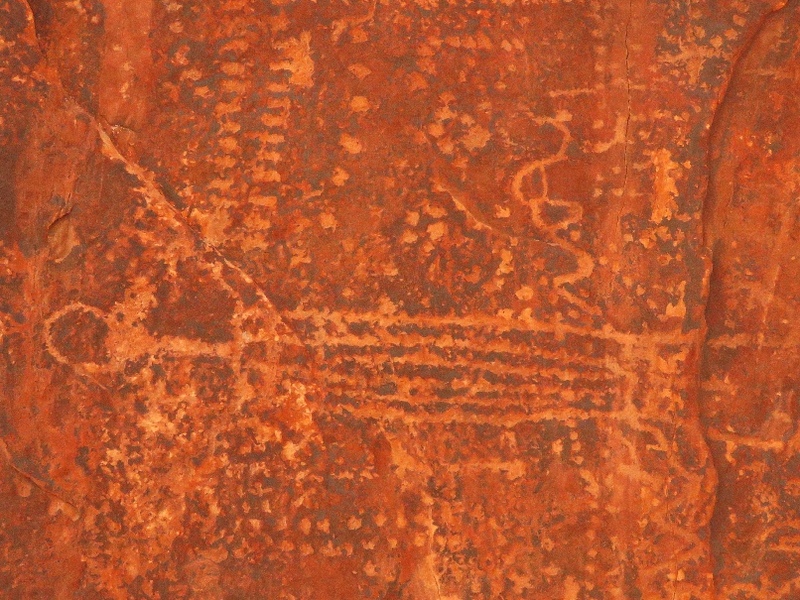 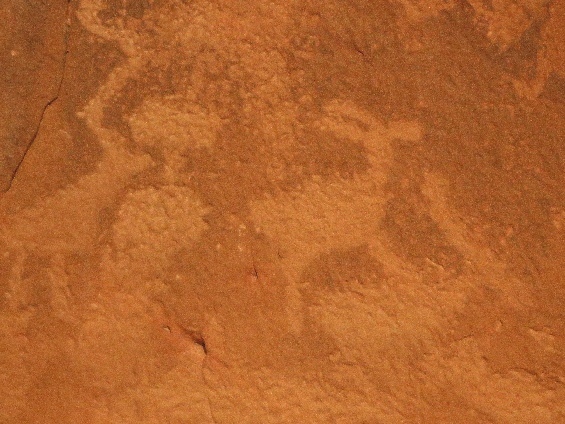 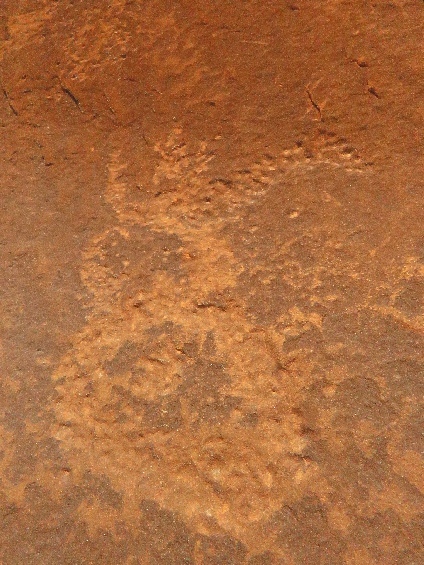 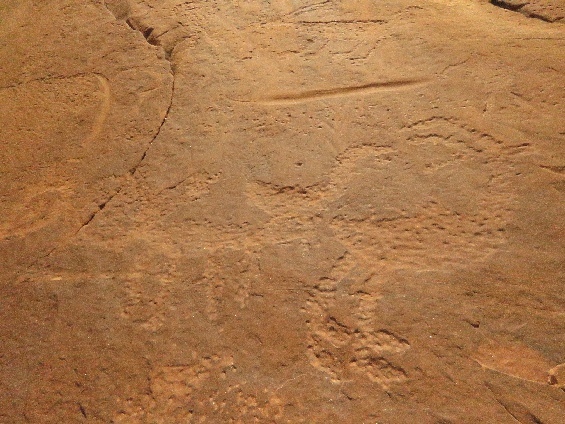 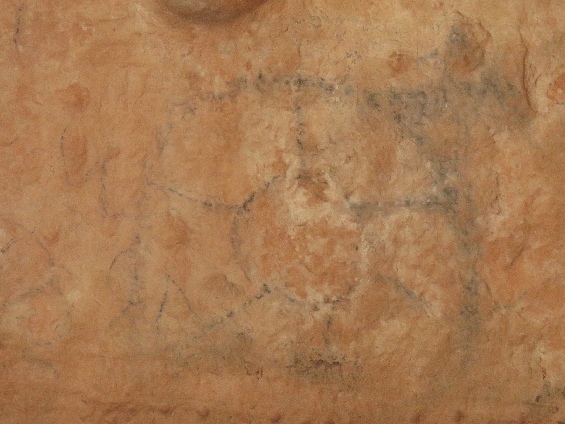 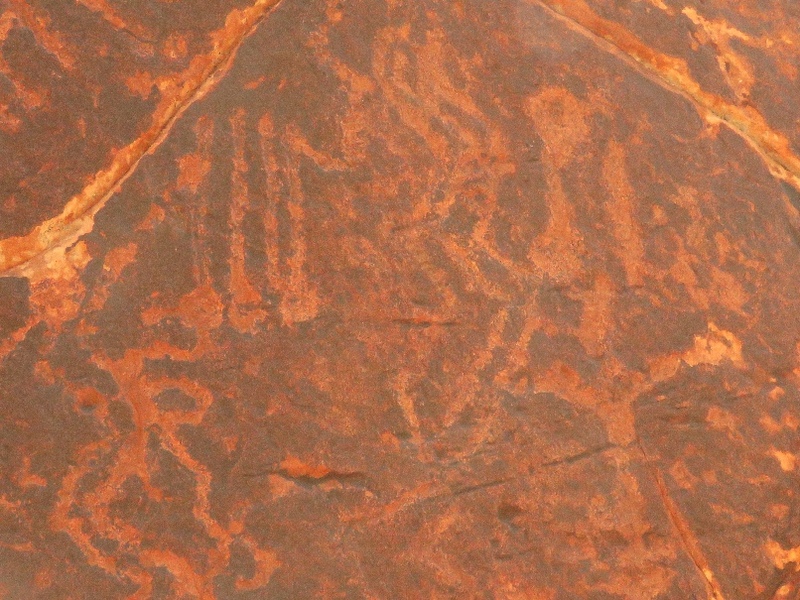 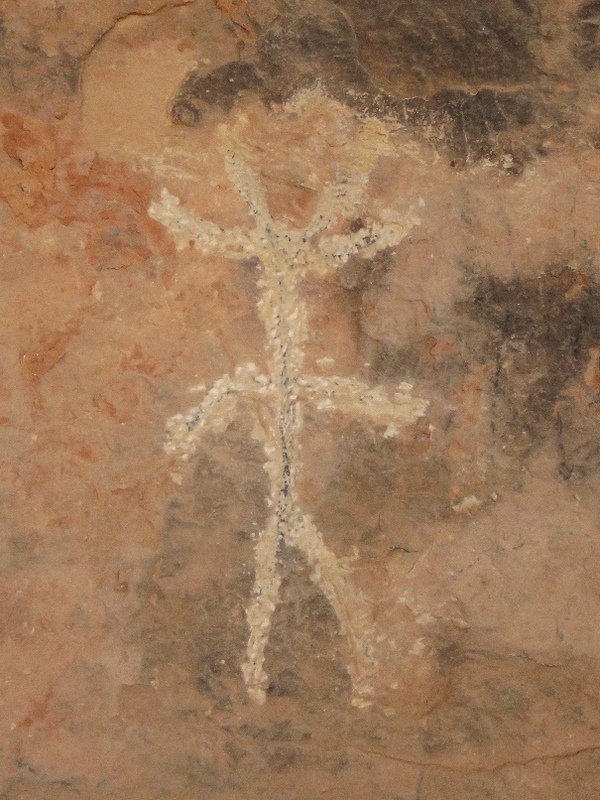 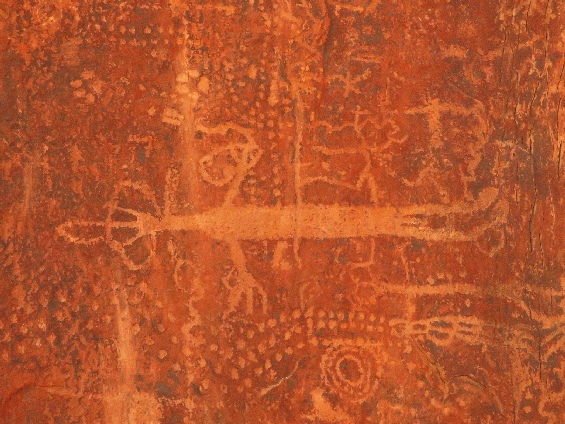 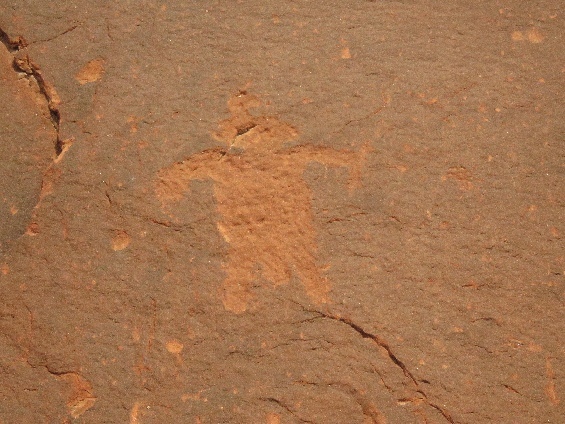 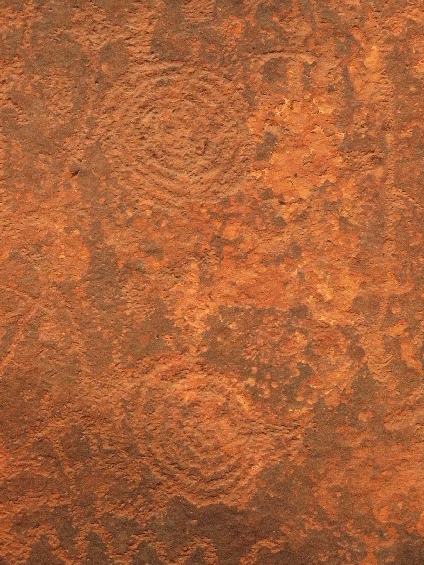 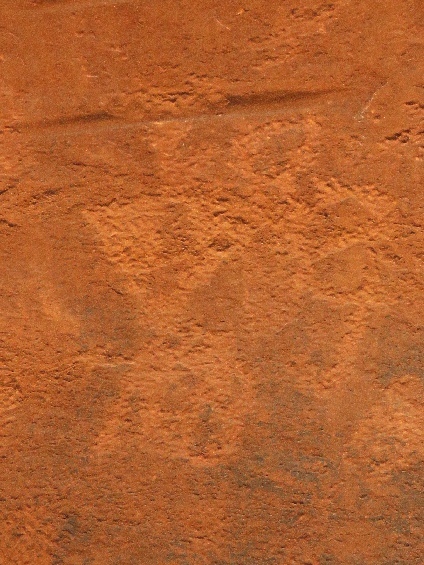 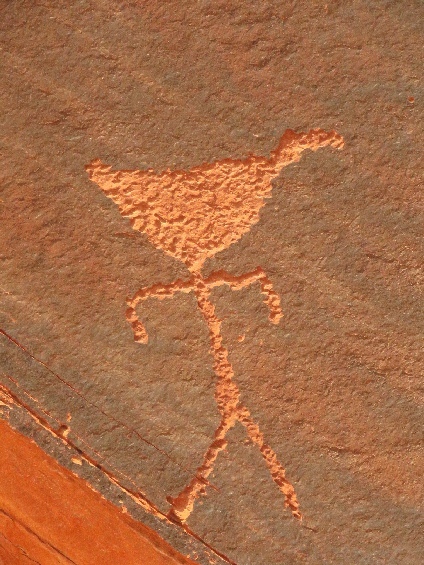 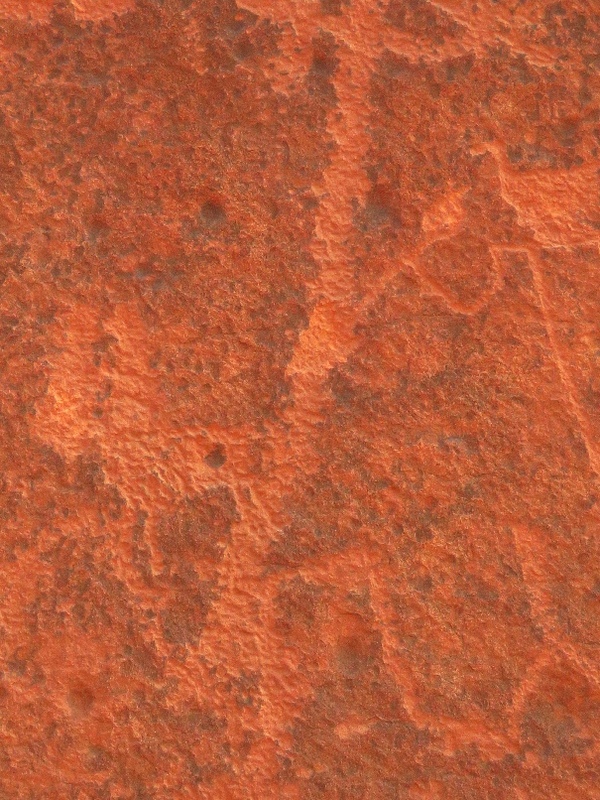 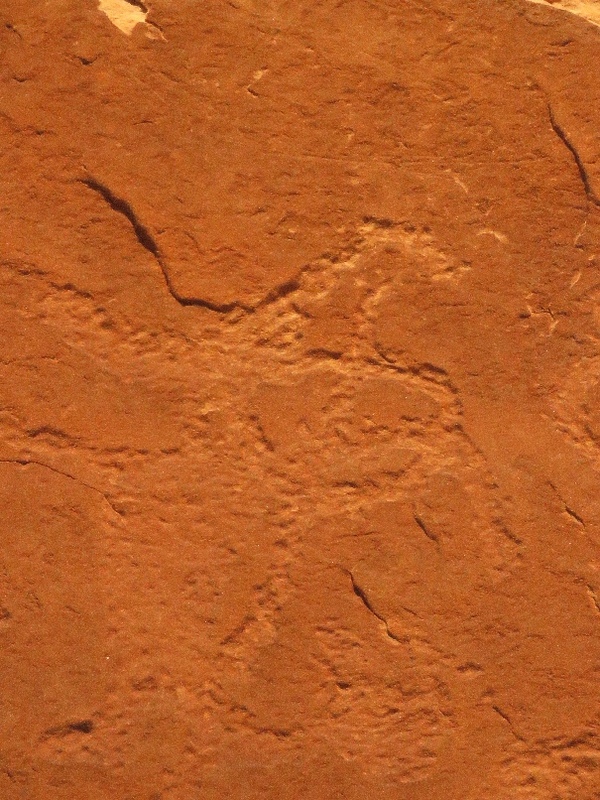 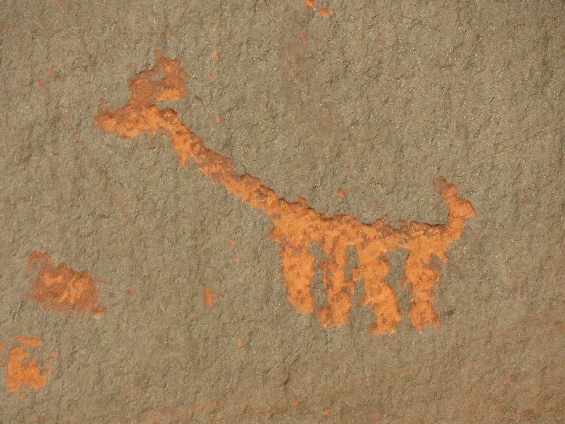 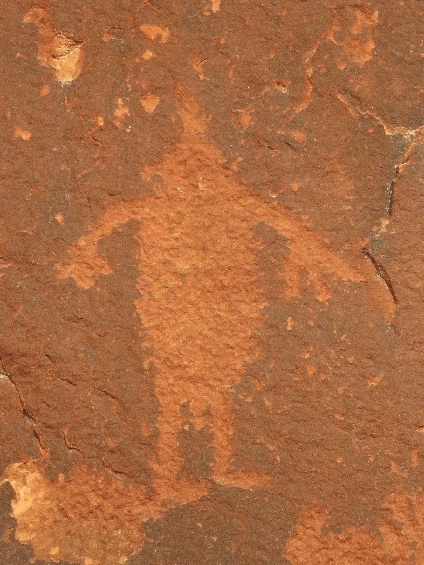 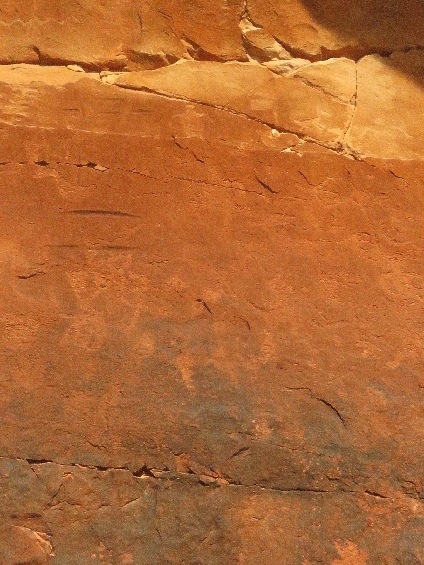 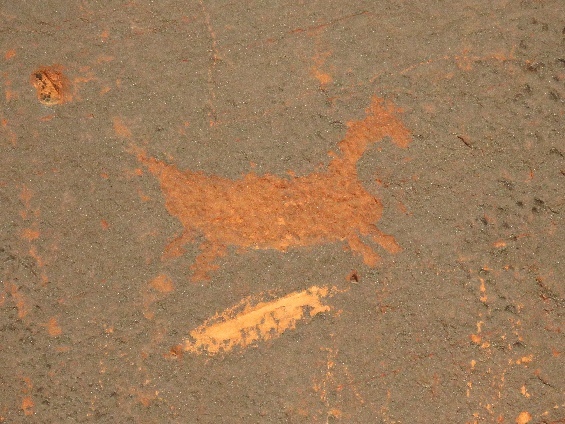 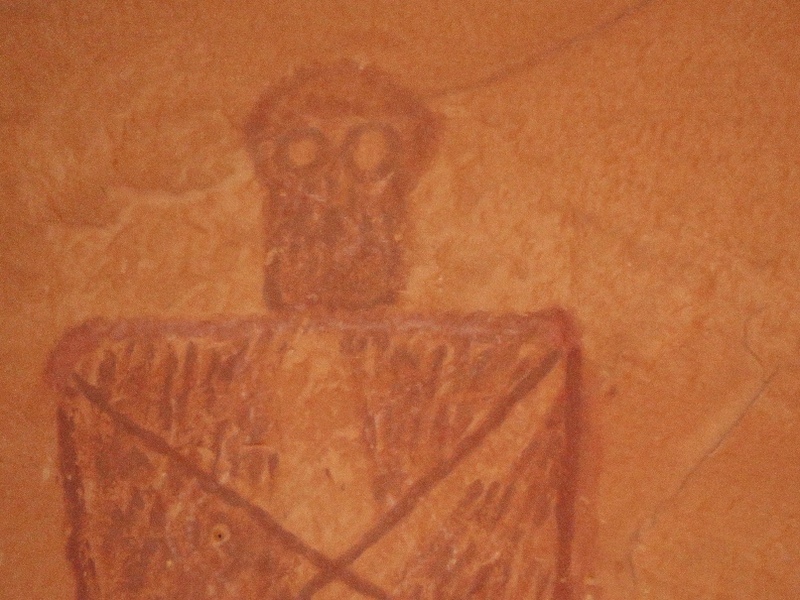 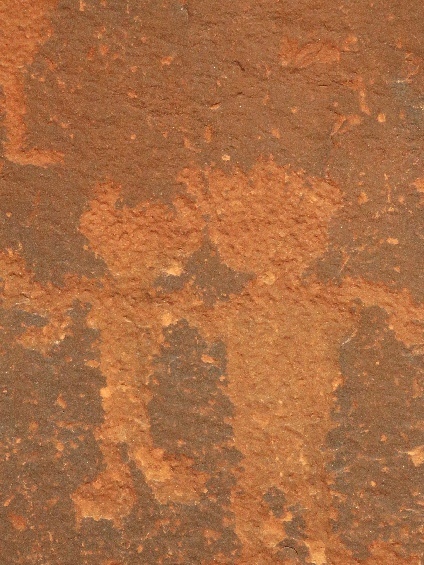 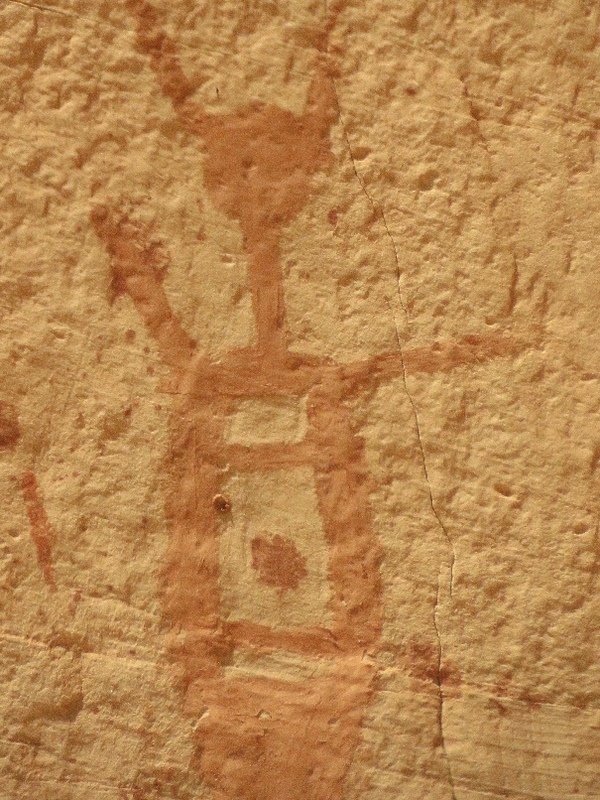 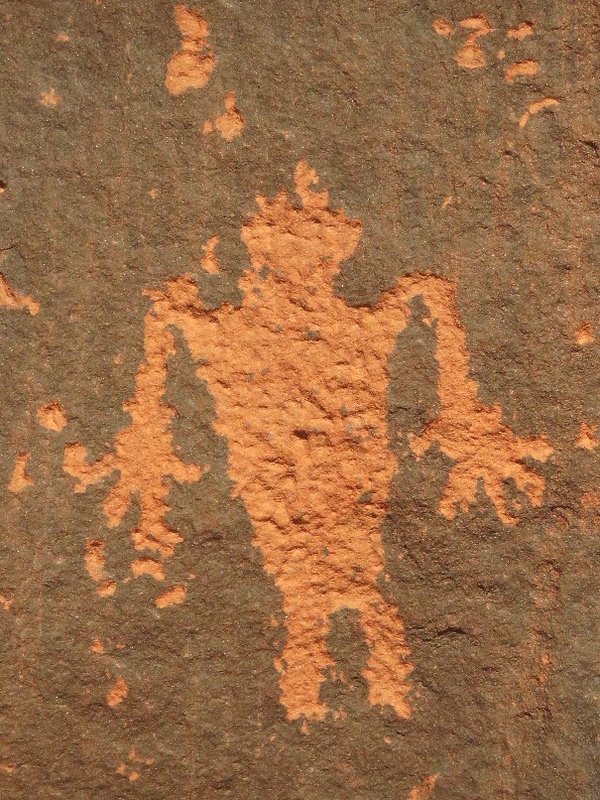 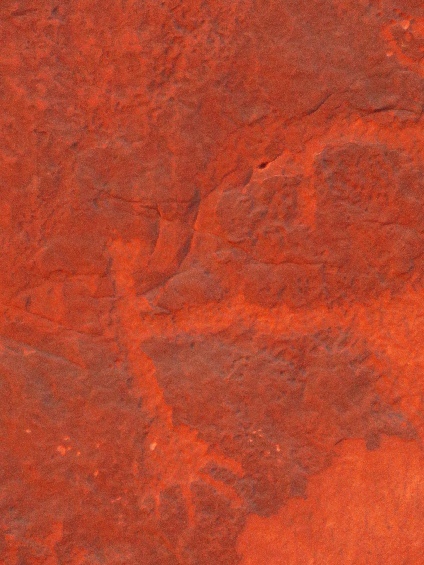 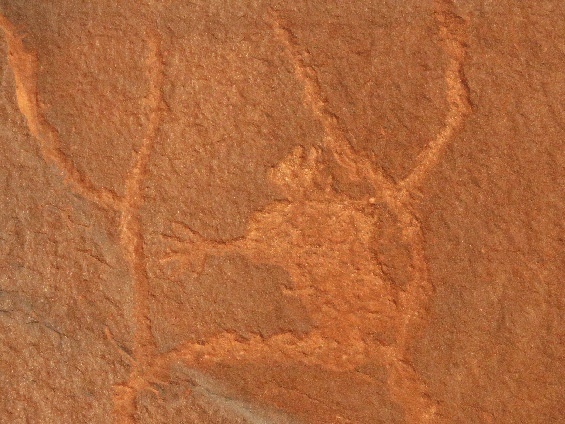 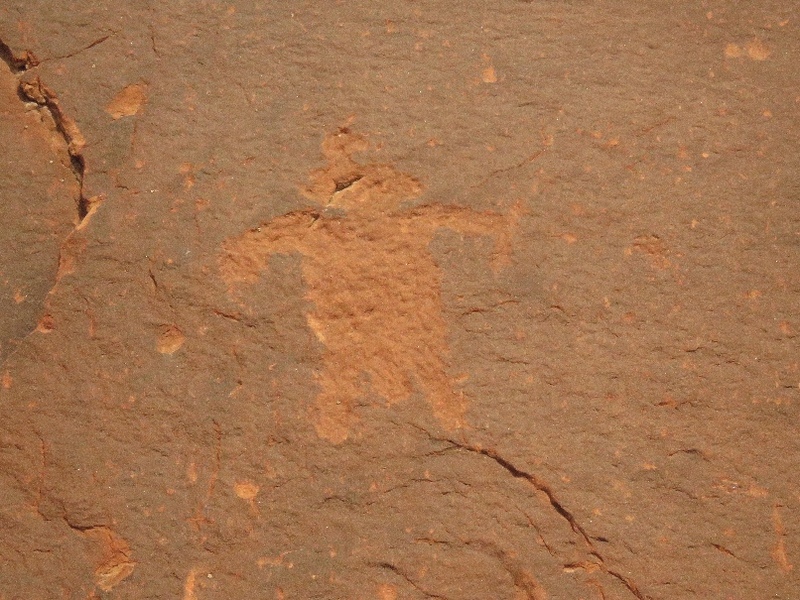 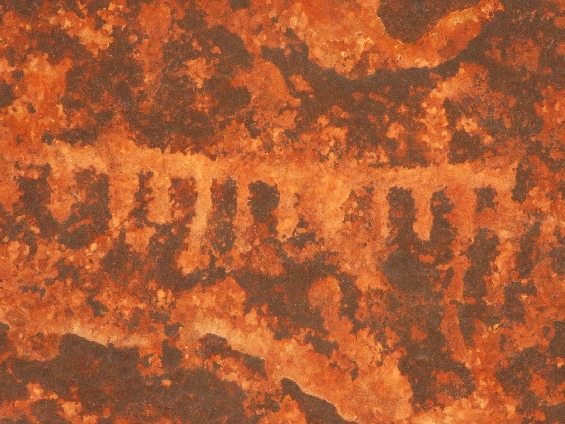 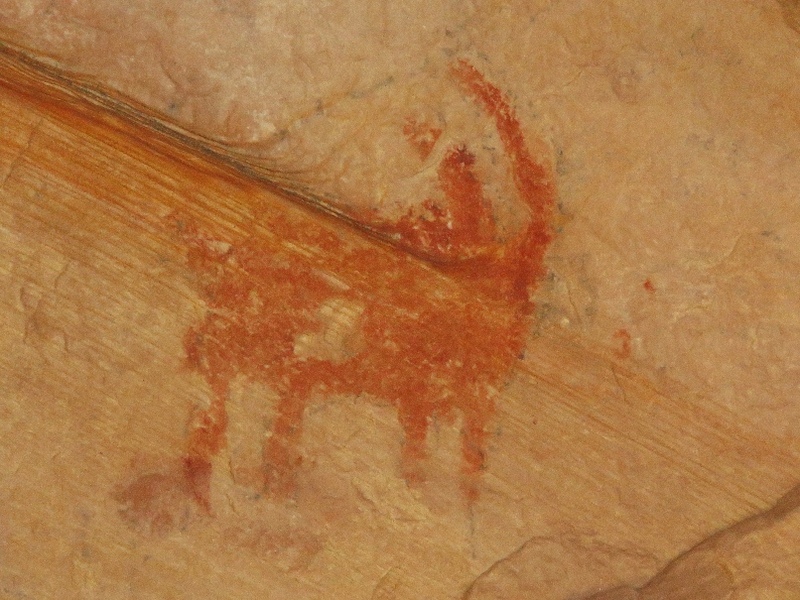 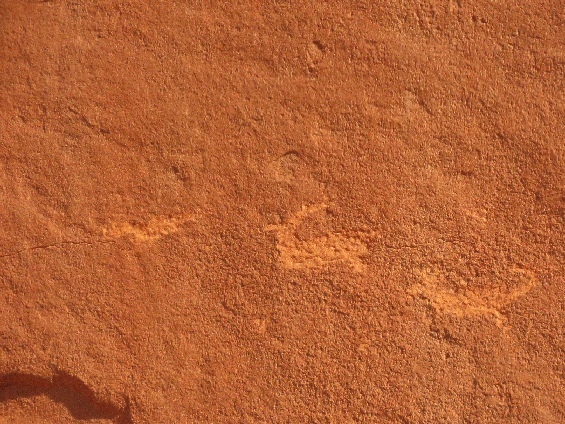 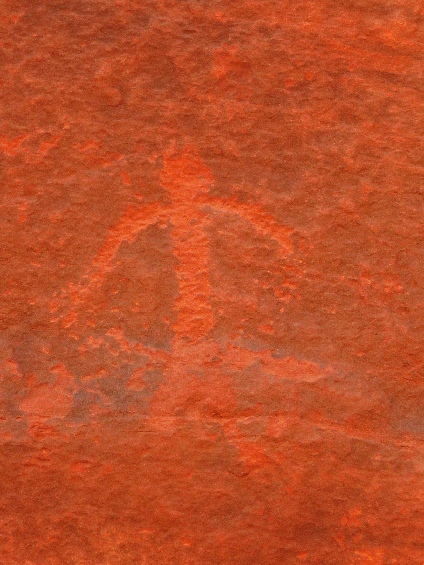 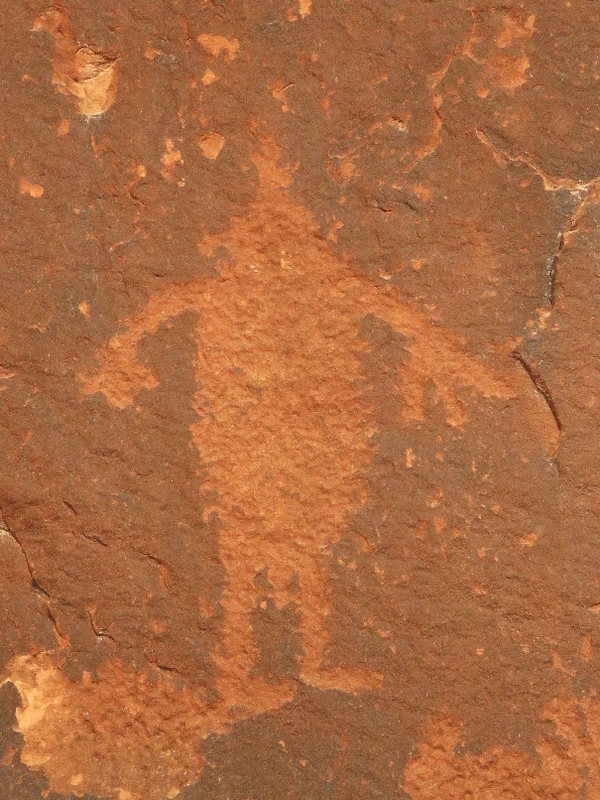 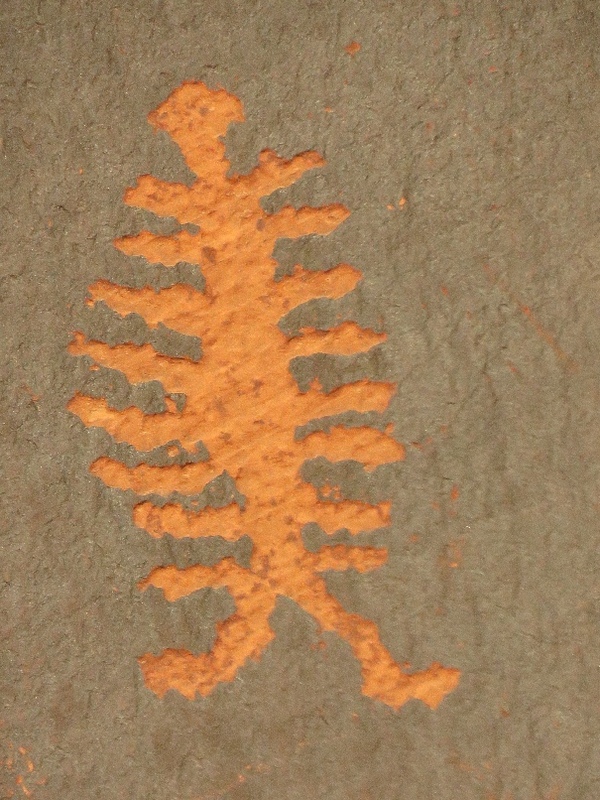 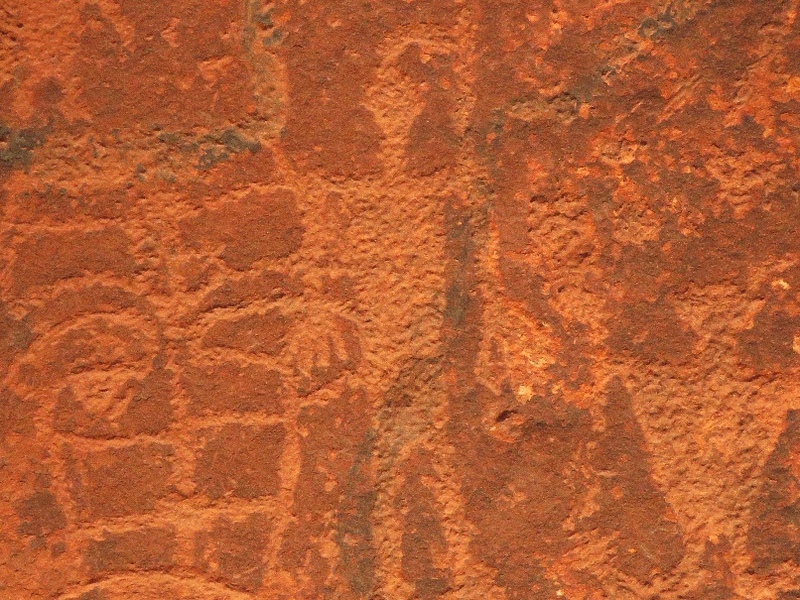 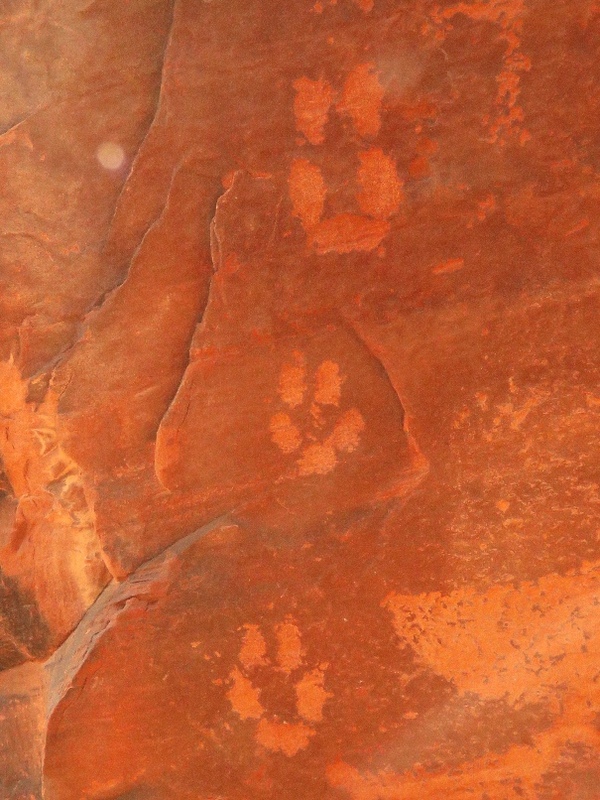 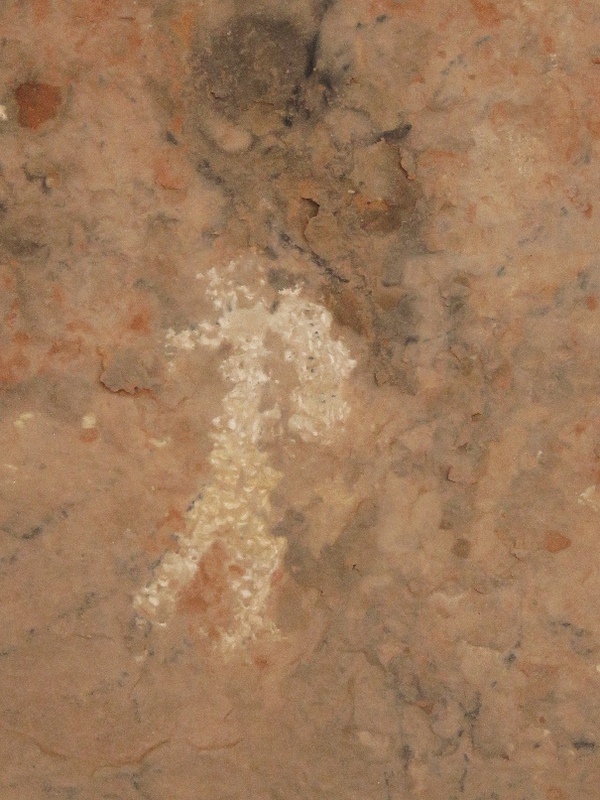 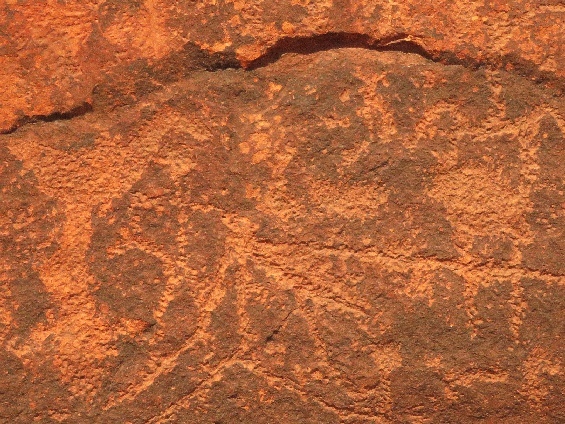 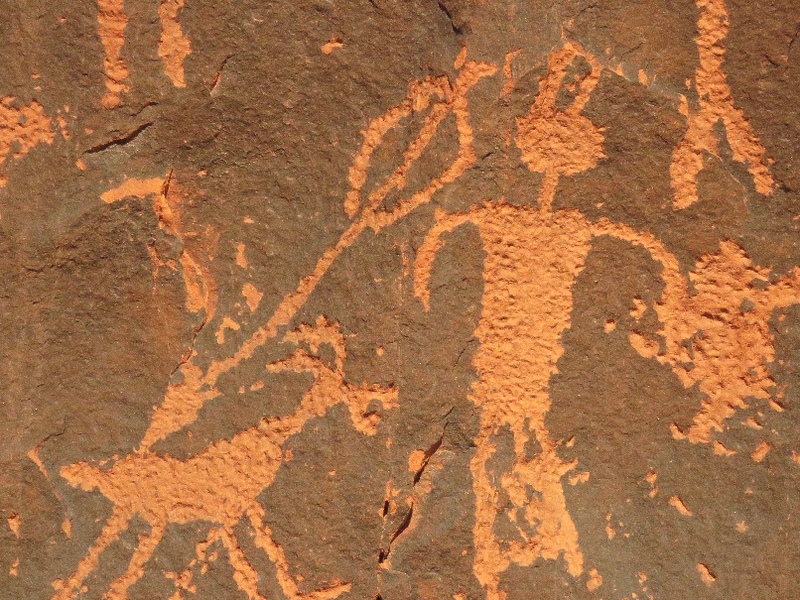 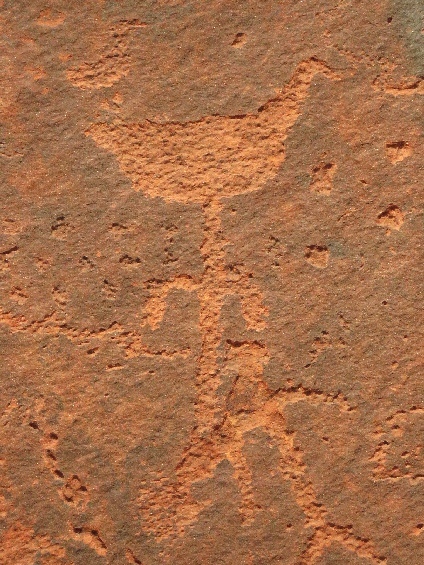 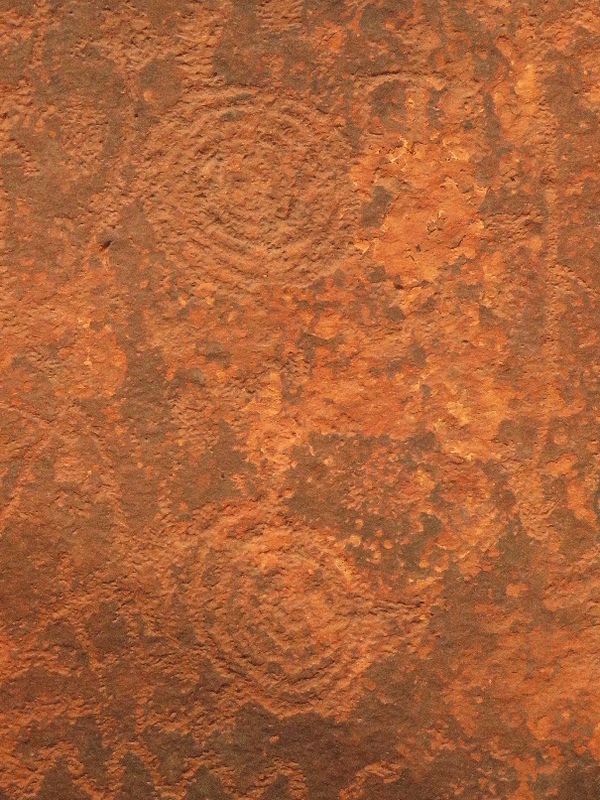 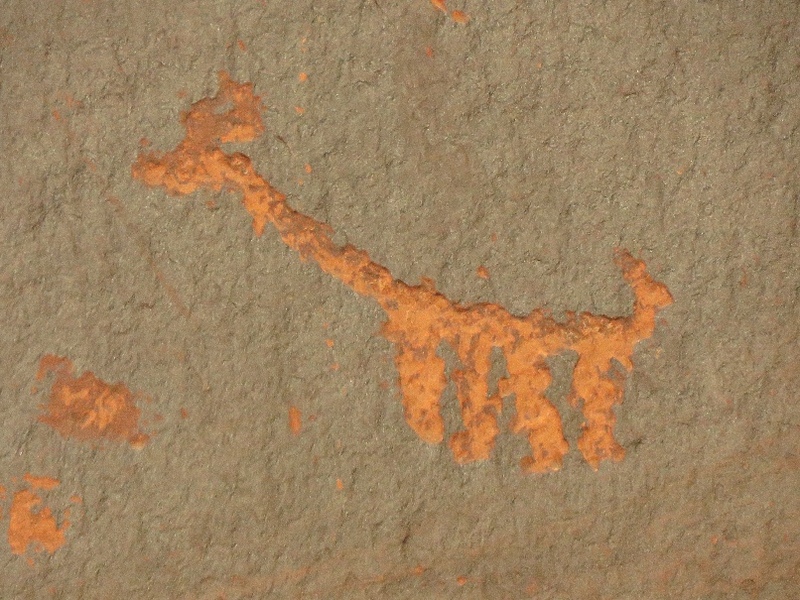 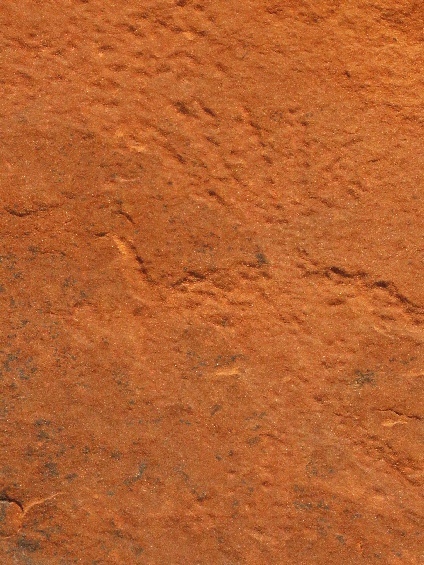 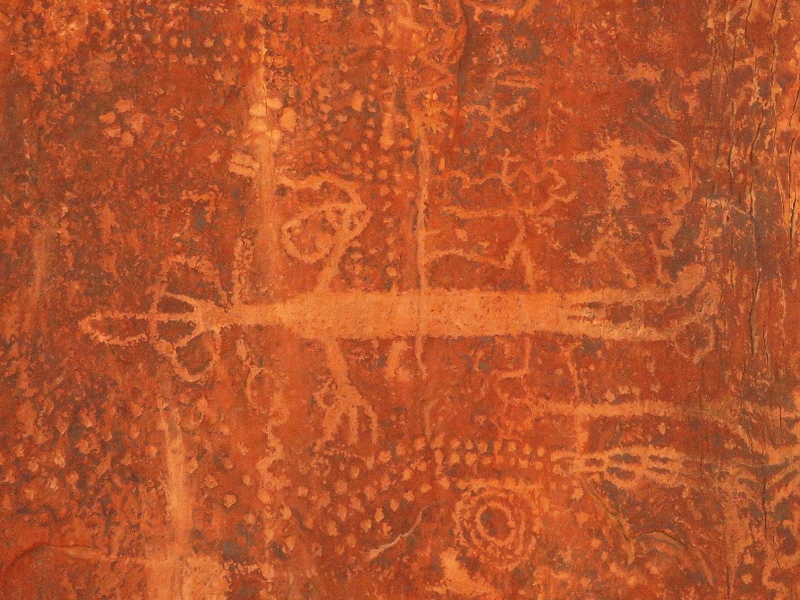 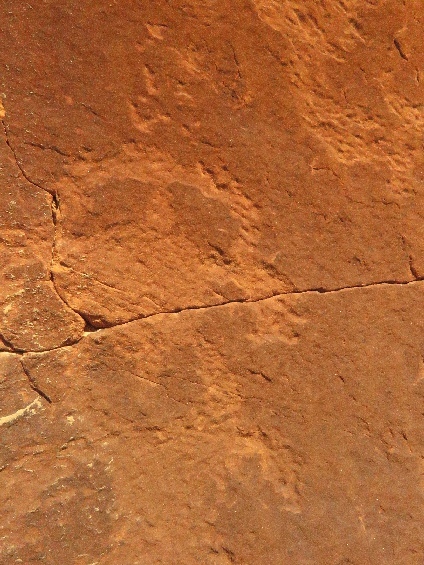 There are a few petroglyphs and pictographs on the wall. 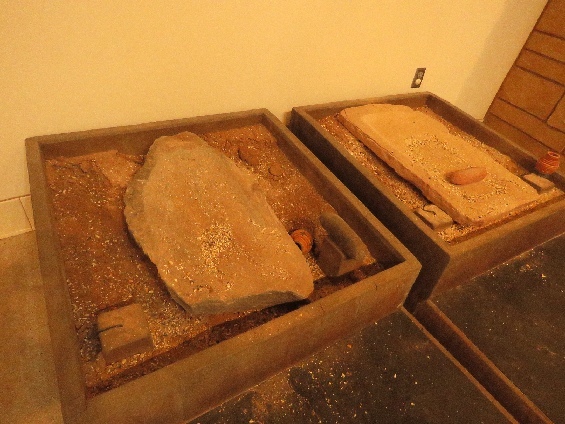 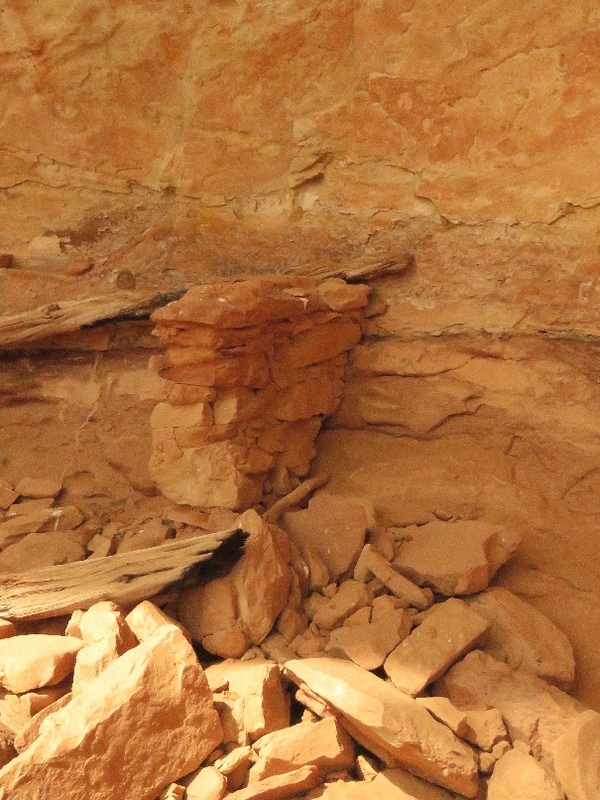 At the center of the alcove, there is some remaining ruins and building blocks of ruins are scattered on the ground. 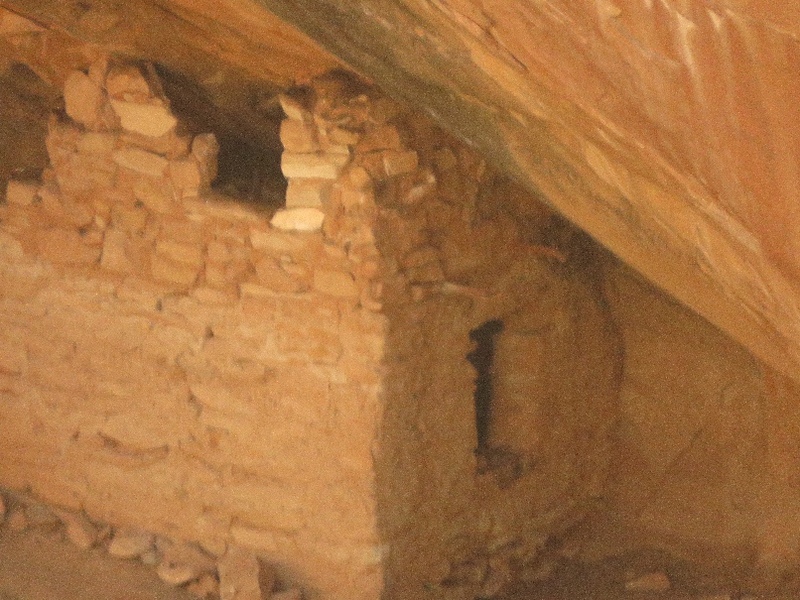 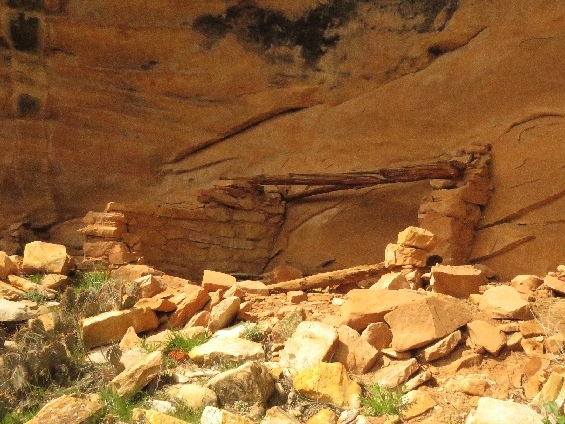 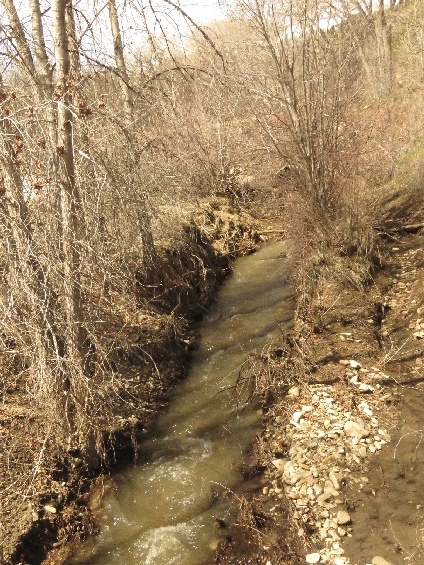 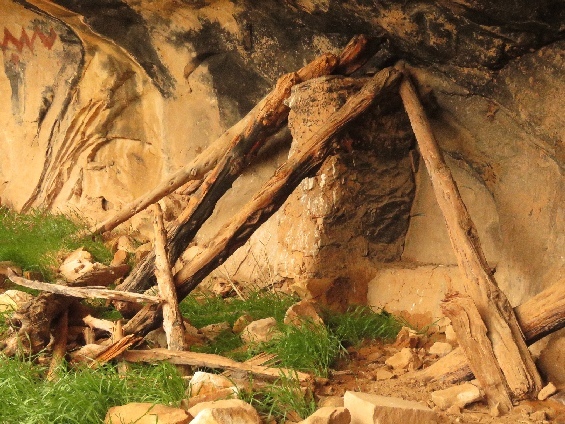 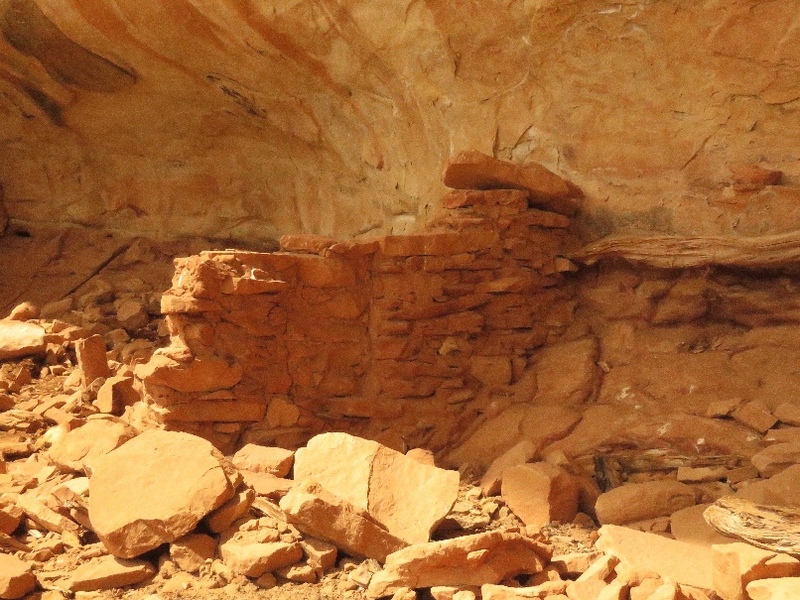 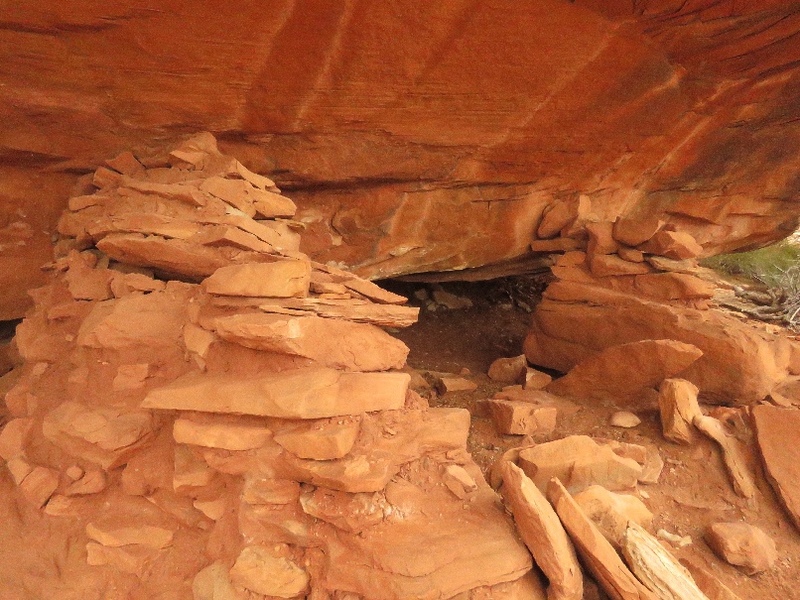 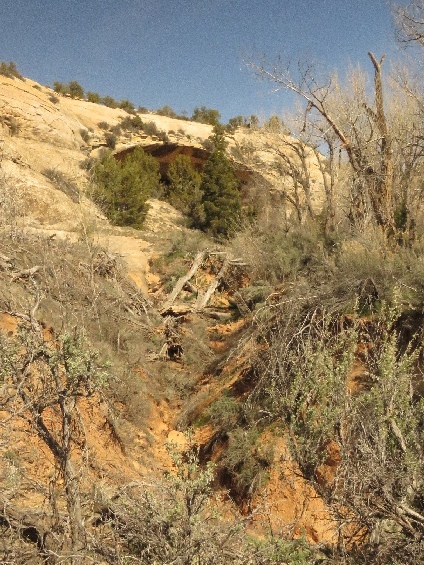 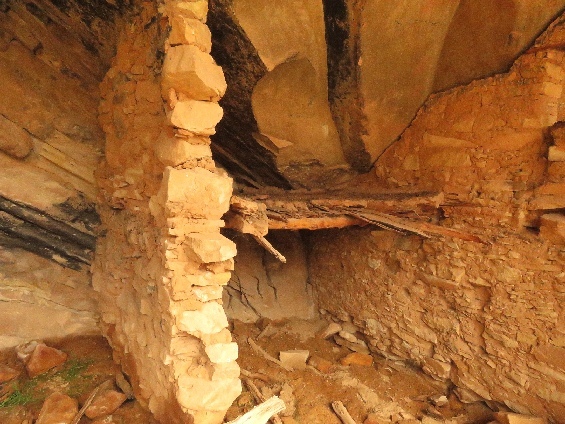 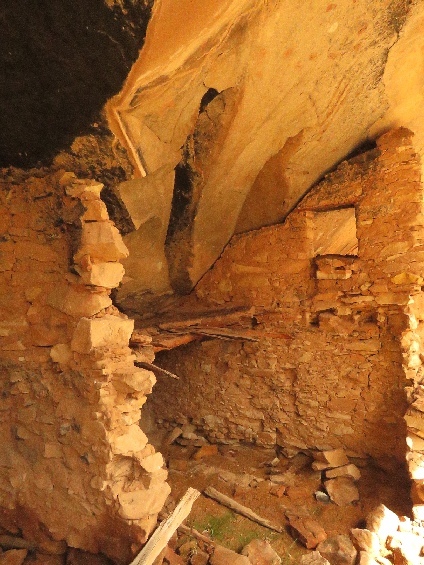 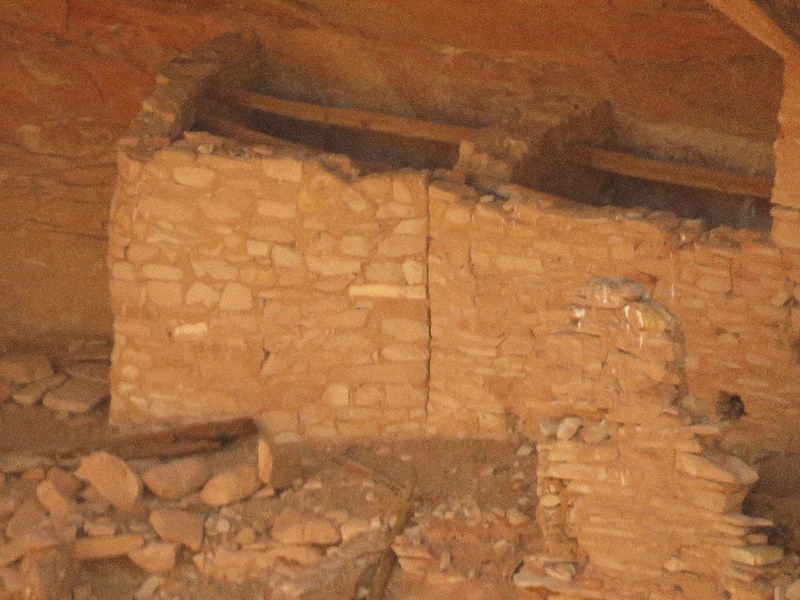 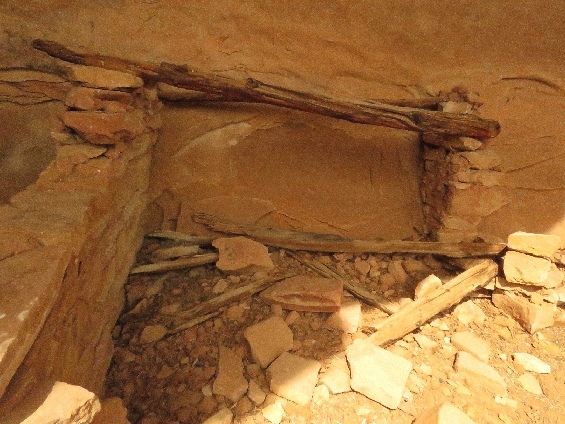 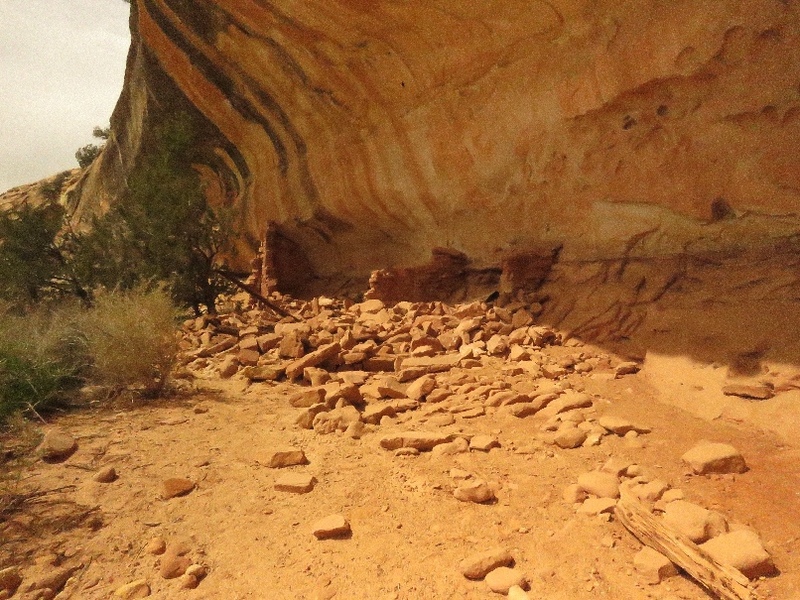 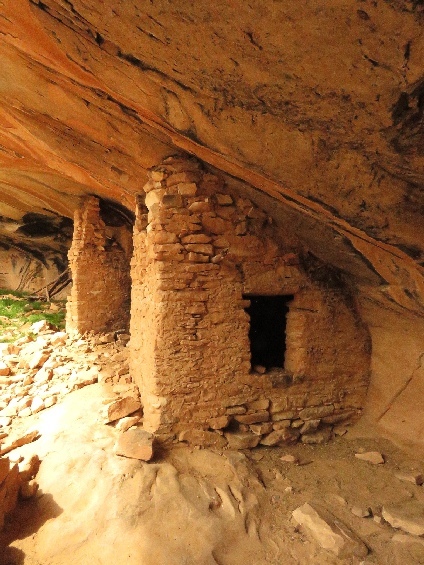 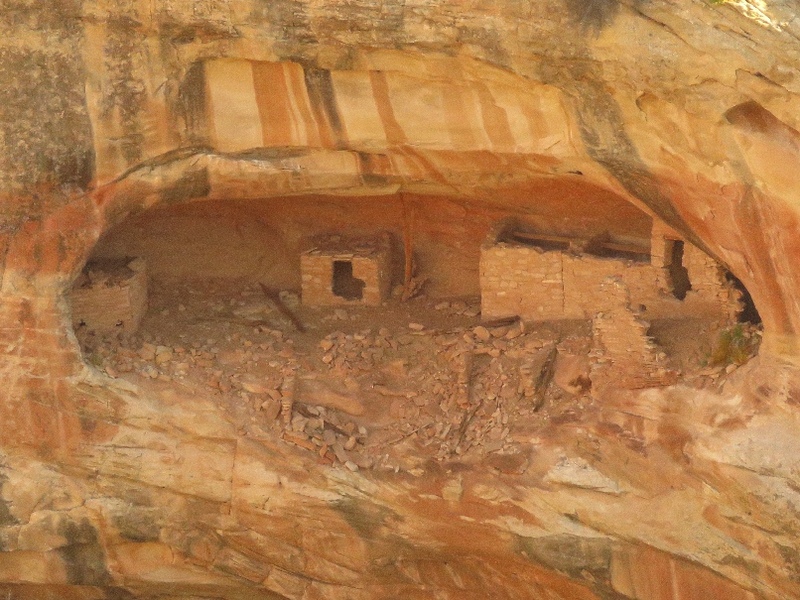 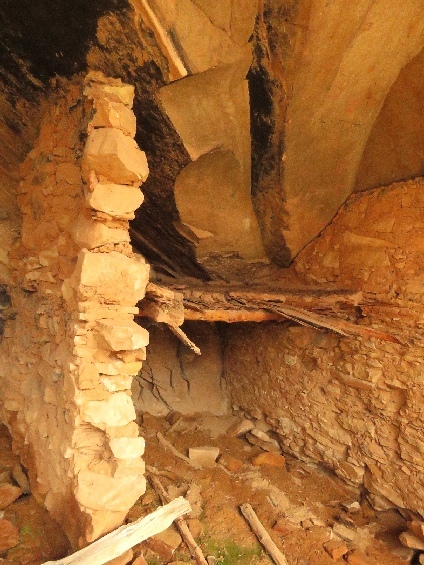 4/7/2019 Over and Under Ruins, North Fork Whisker Draw Area, UT - This ruins are located at the end of the side canyon from the North Fork Whisker Draw. 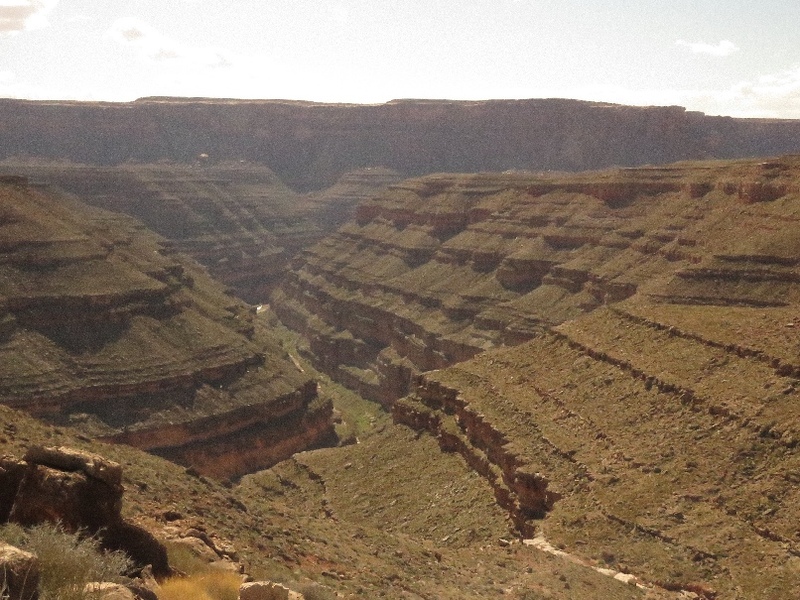 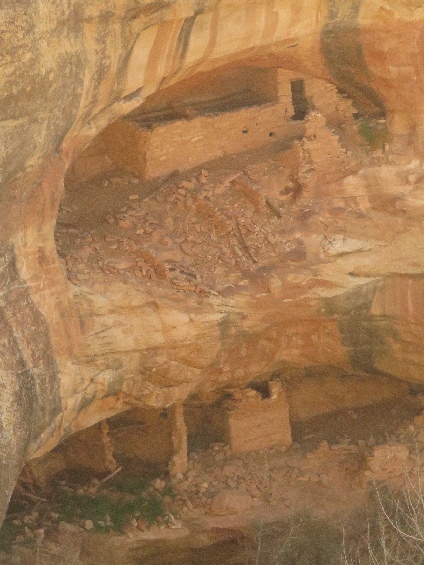 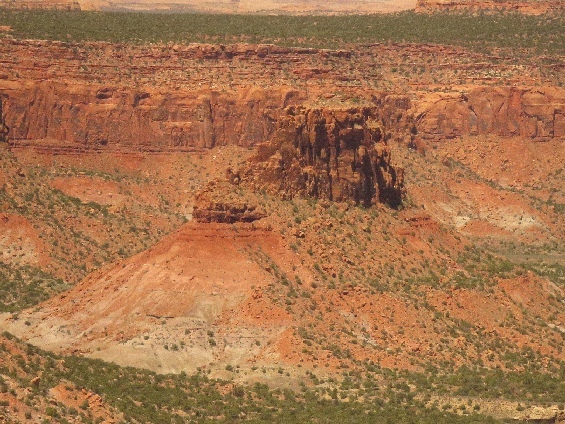 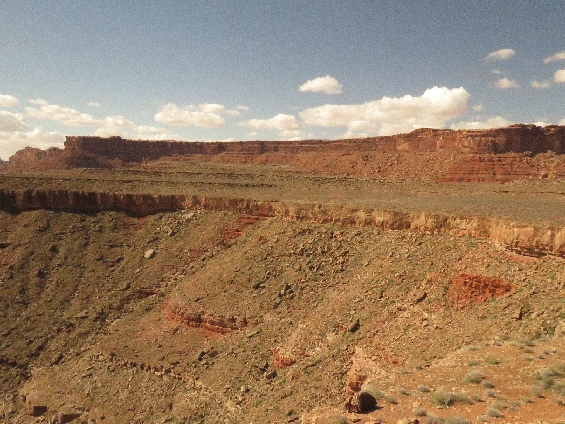 I took photos from the atop of the cliff that across the canyon, also I took photos of close look of Under site ruins. There is no way me to go to the Over site of ruins. 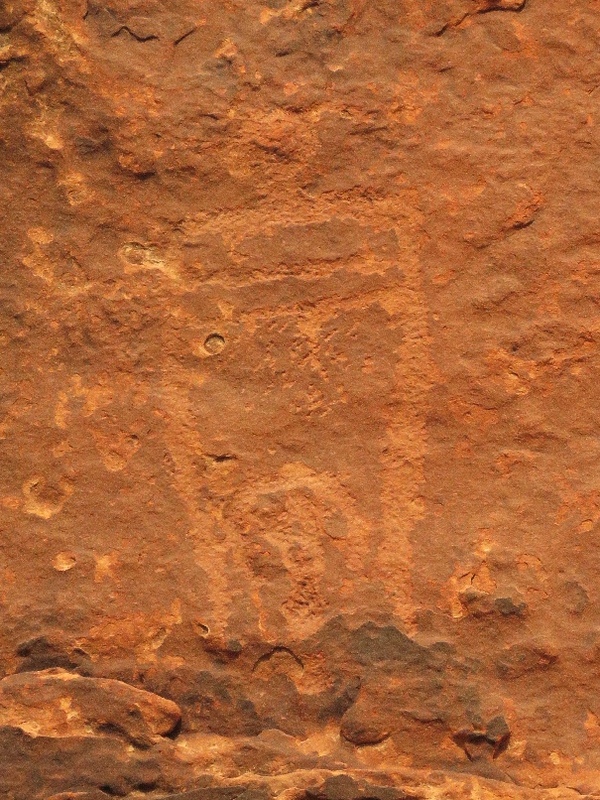 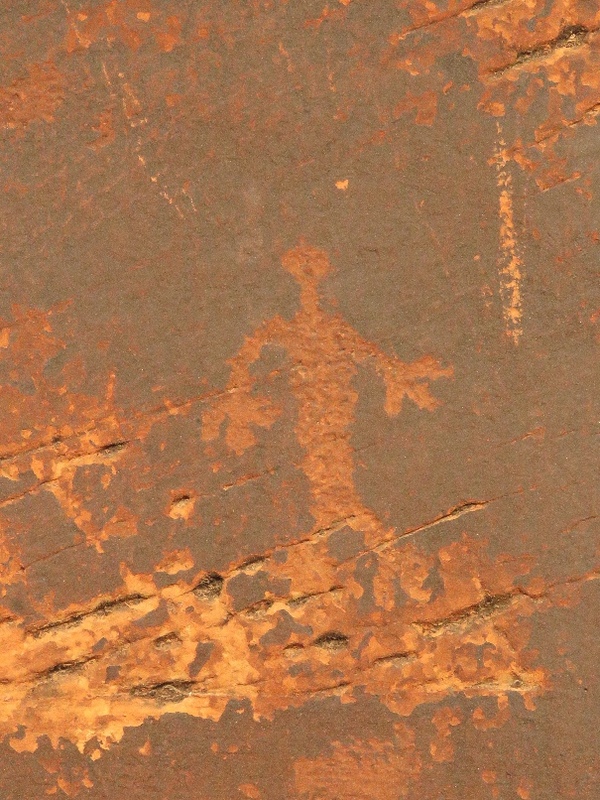 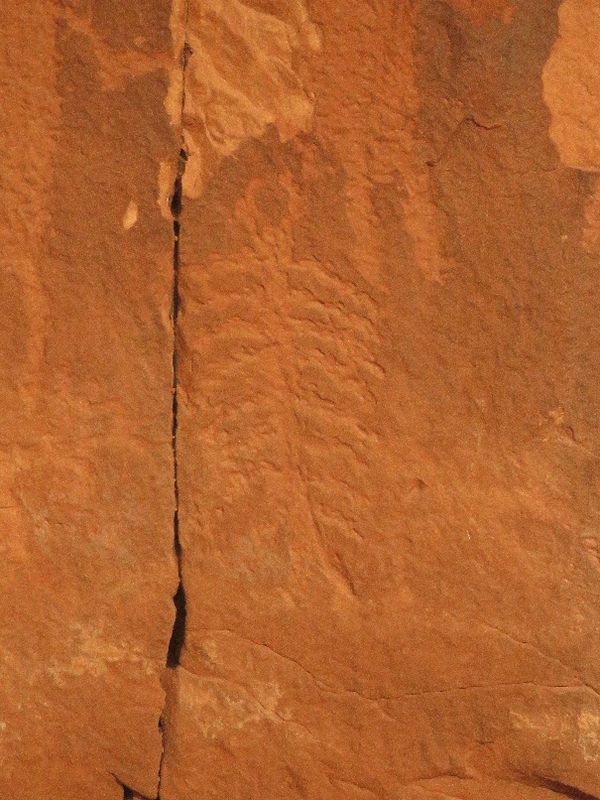 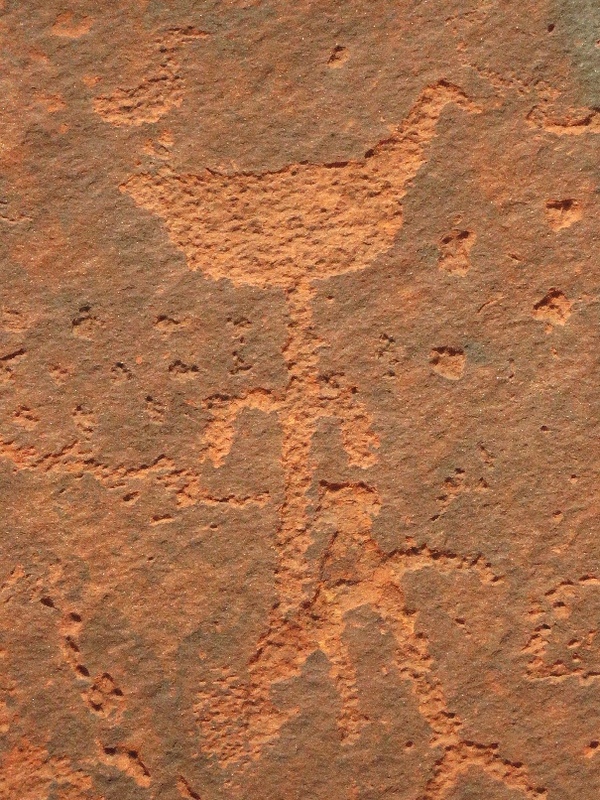 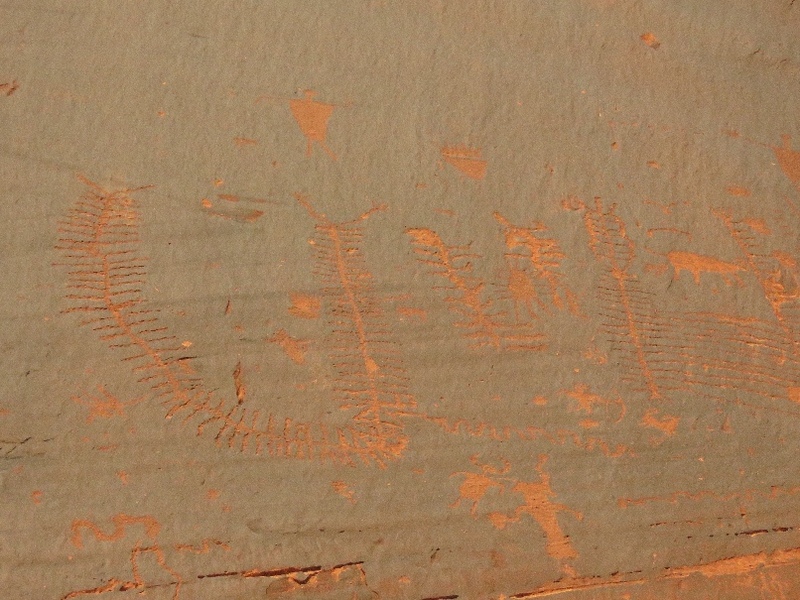 4/8/2019 North Fork Whisker Draw Rock Art Panel, UT - I was lucky to find this panel. 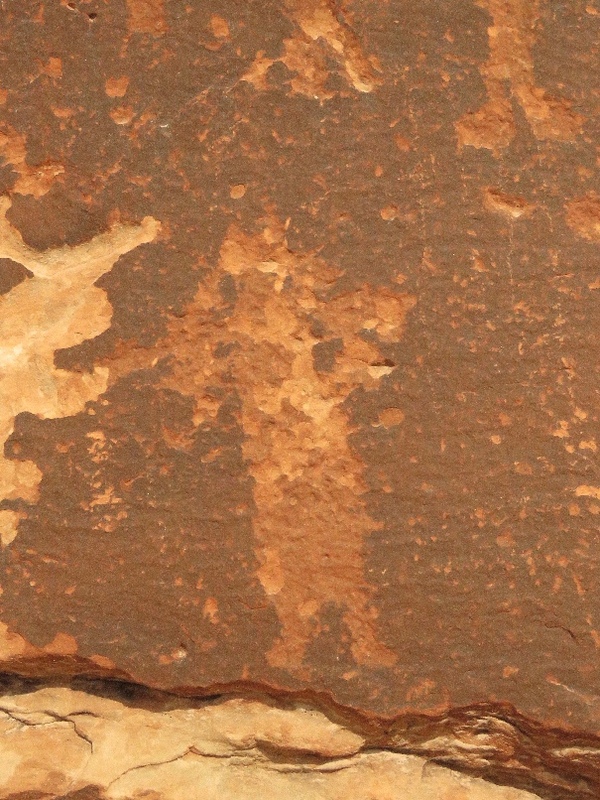 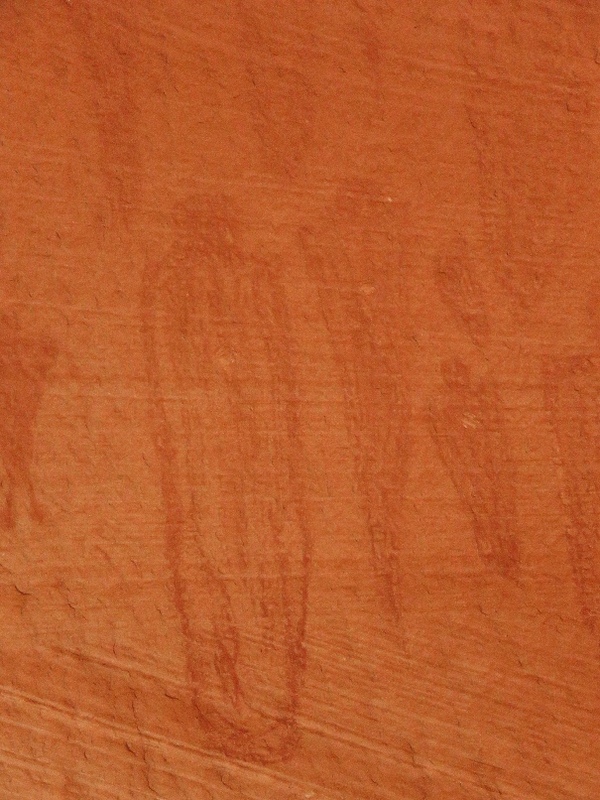 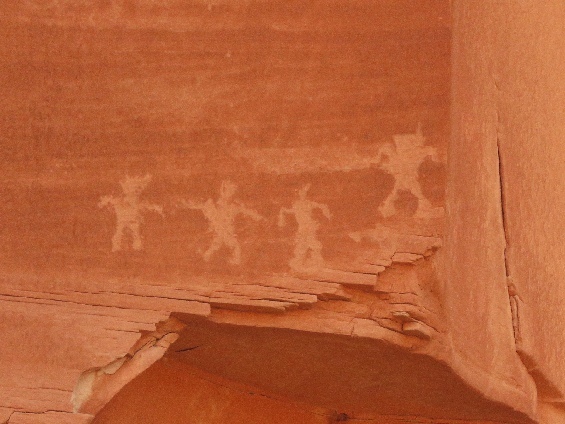 There are many petroglyphs figures on the panel and I can see those, unfortunately doesn’t come out right on the photos because the rock quality and fading out. 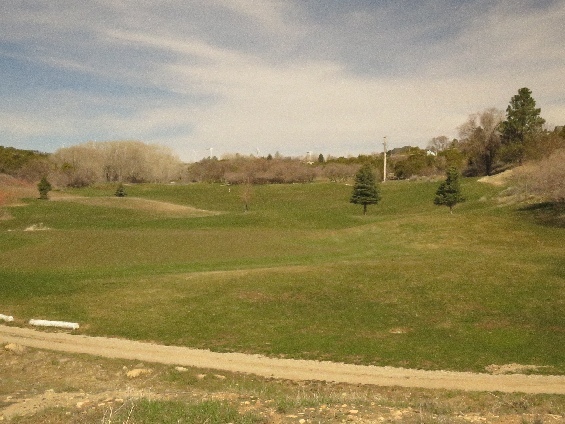 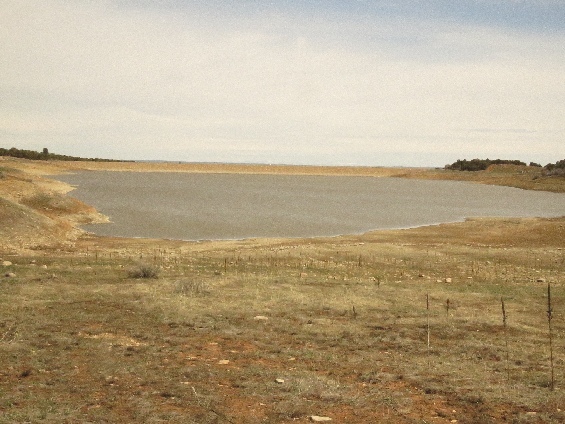 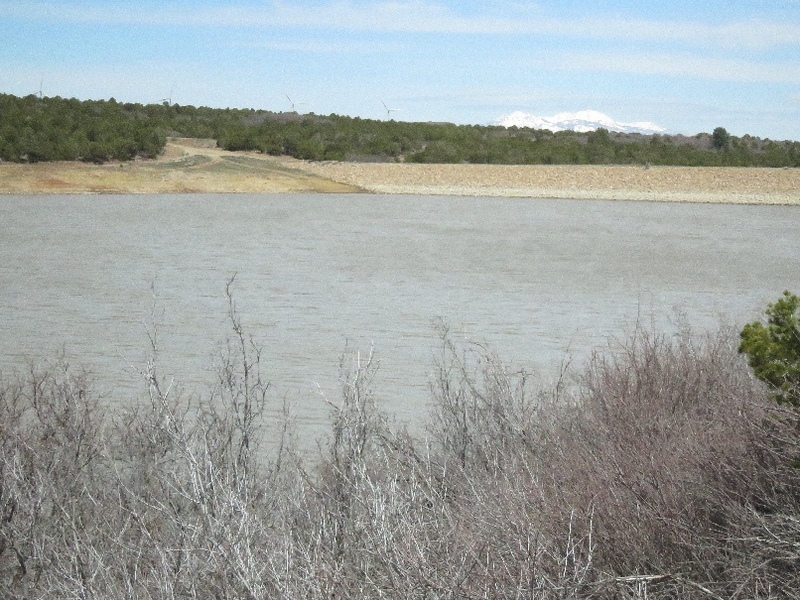 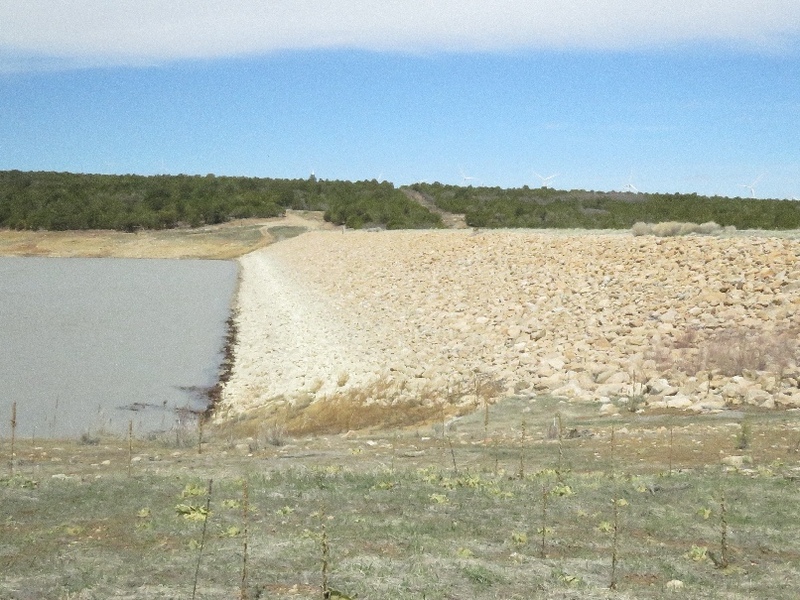 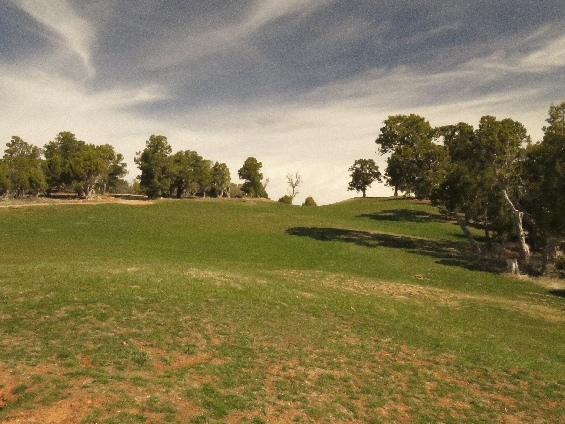 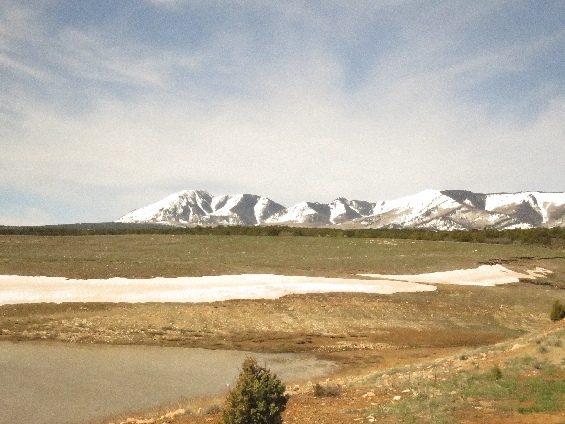 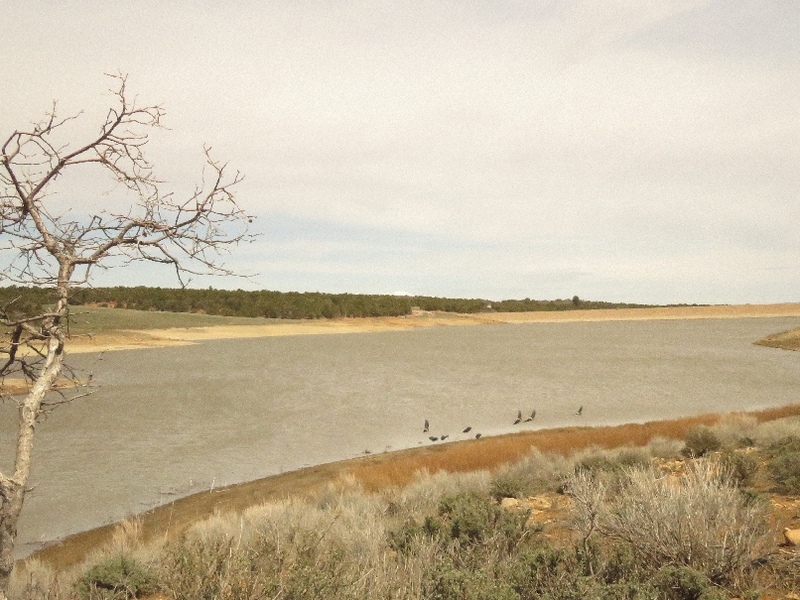 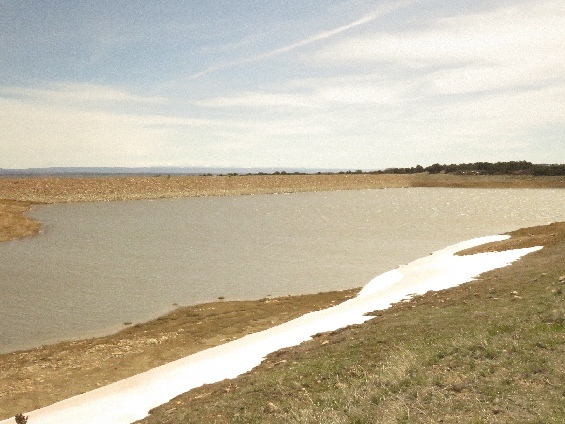 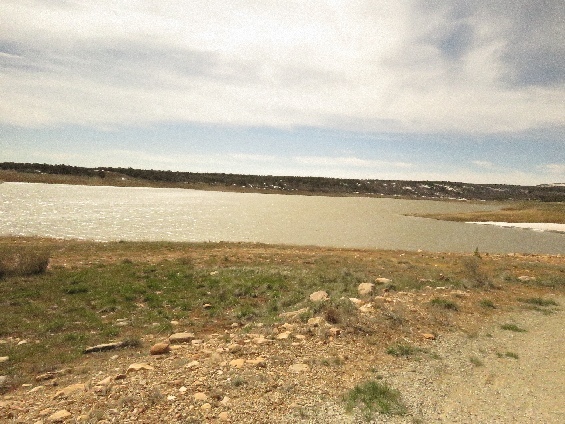 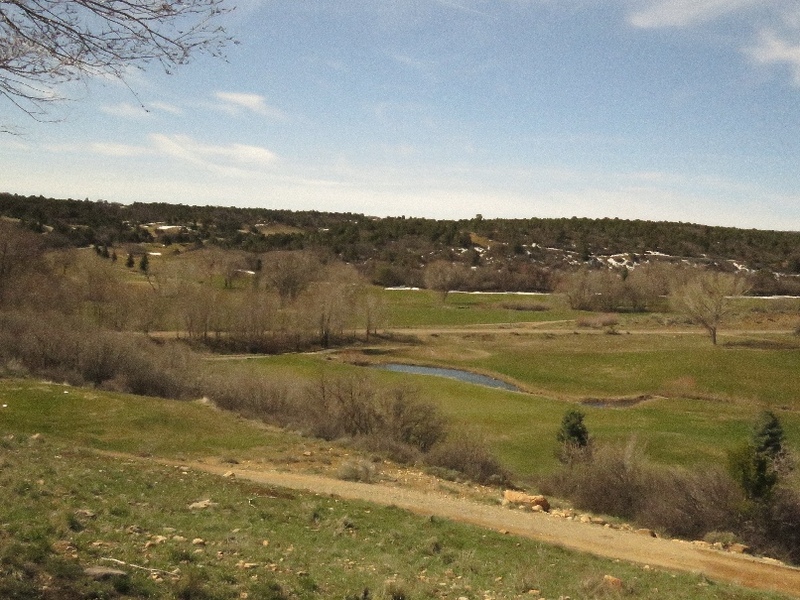 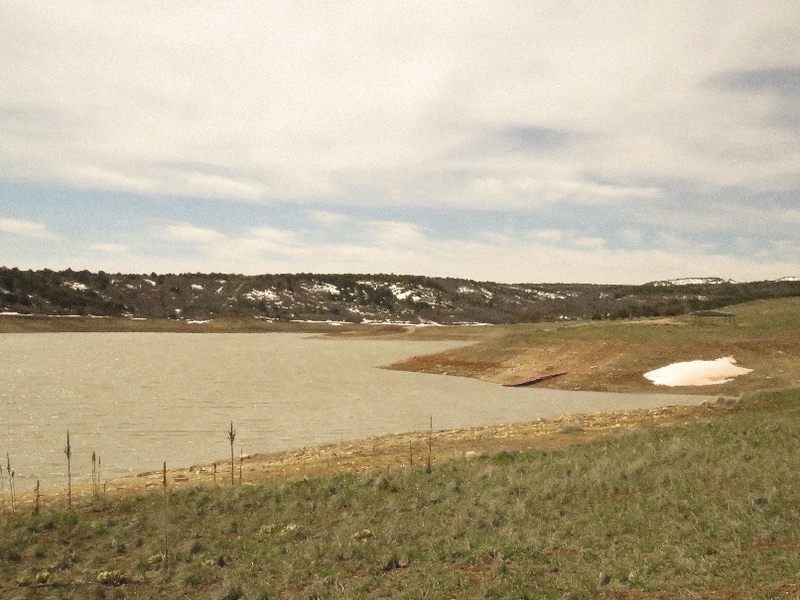 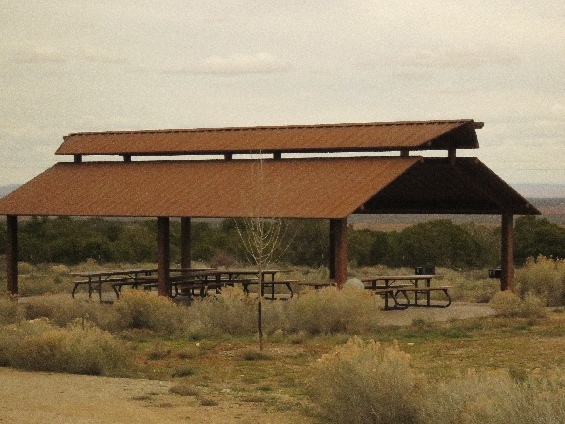 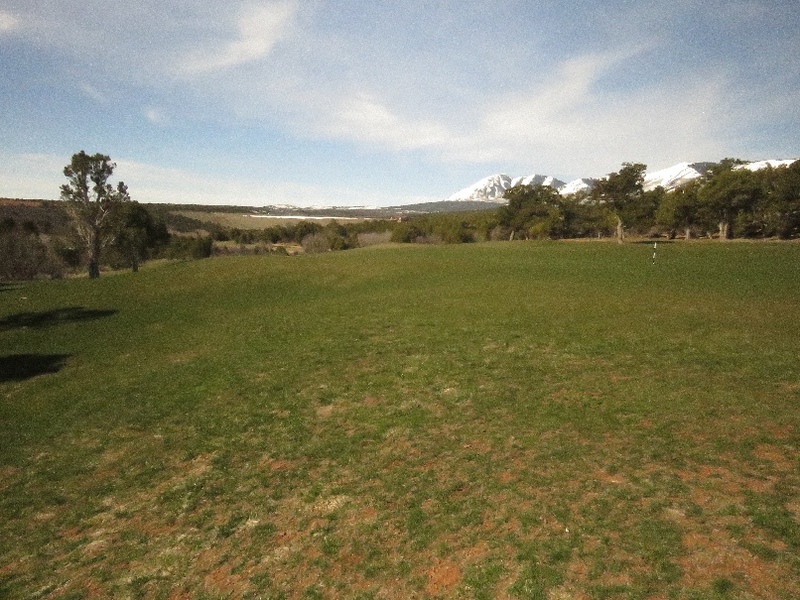 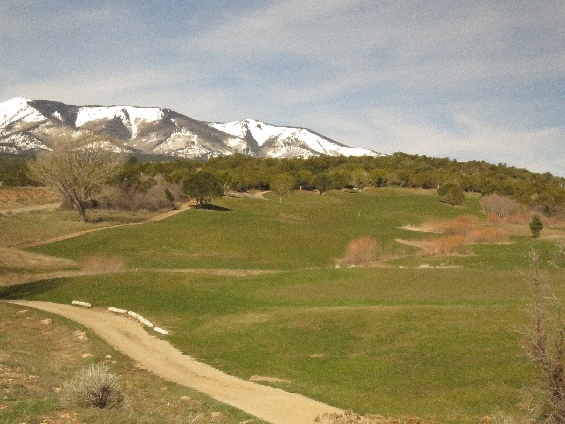 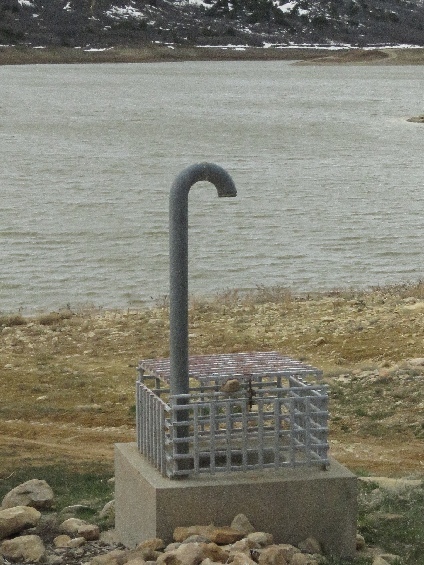 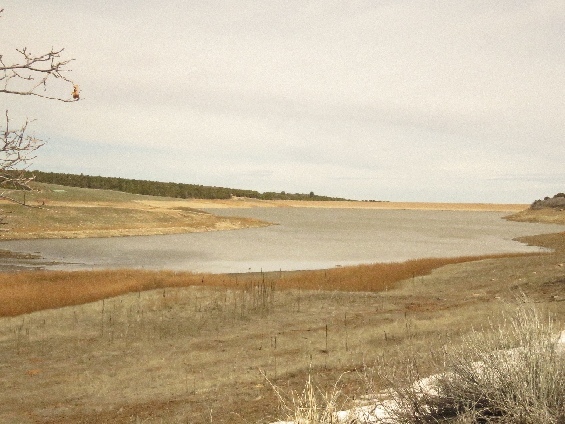 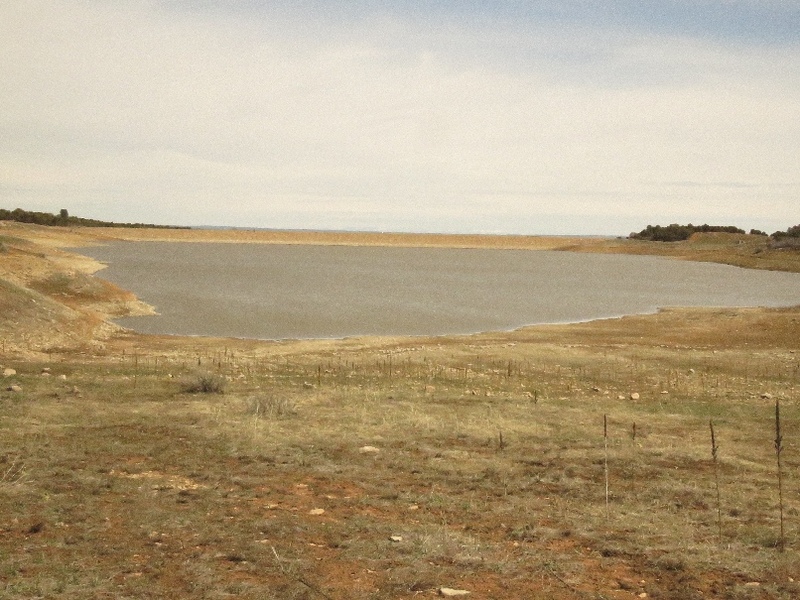 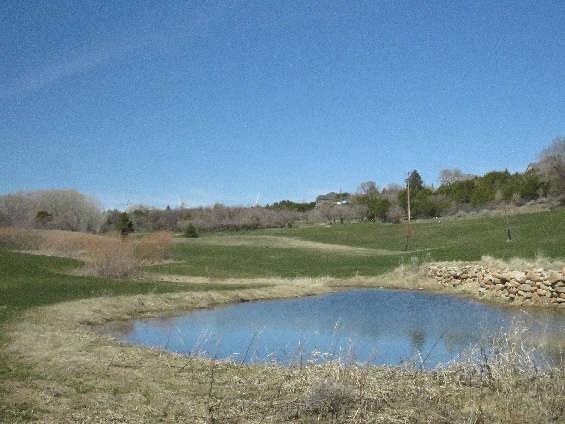 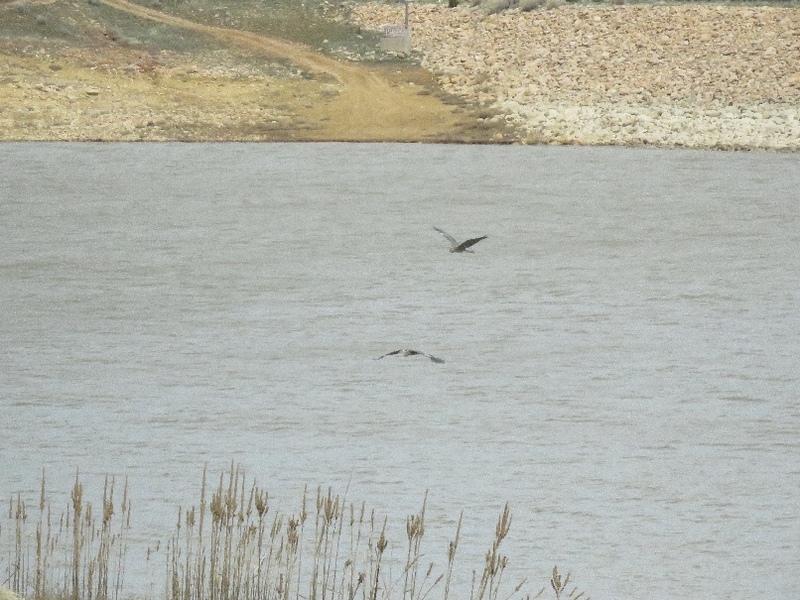 4/14/2019 Hideout Golf Course, Monticello, UT - This public golf course is located south end of the town and between highway #191 and Lloyd Lake, just below the lake dam. Green fee for adult is $30 for 18 hole, $18 for 9 hole, season pass is $400. Winter is close for season. 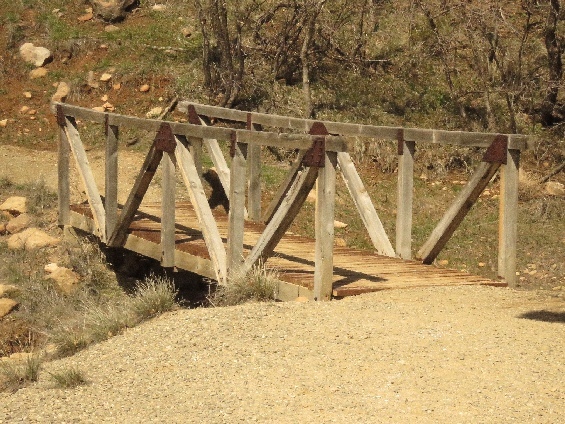 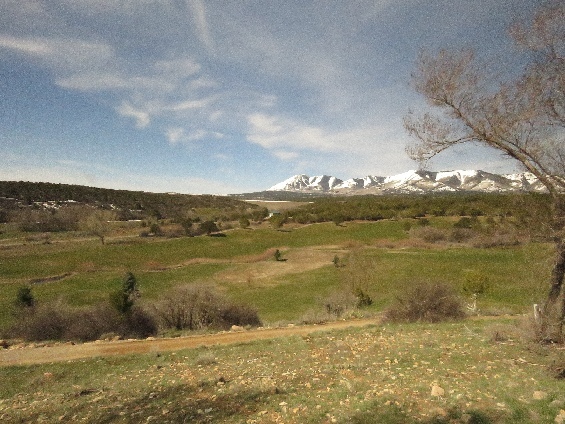 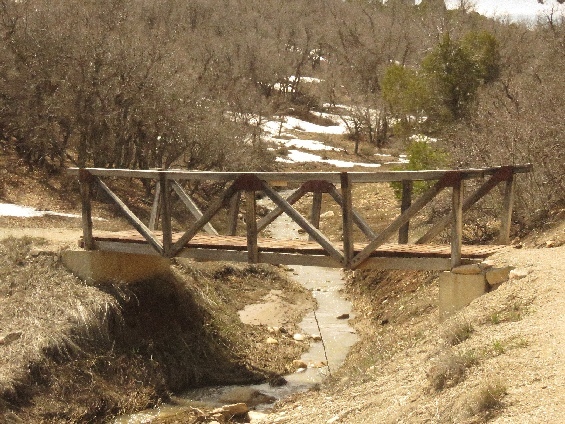 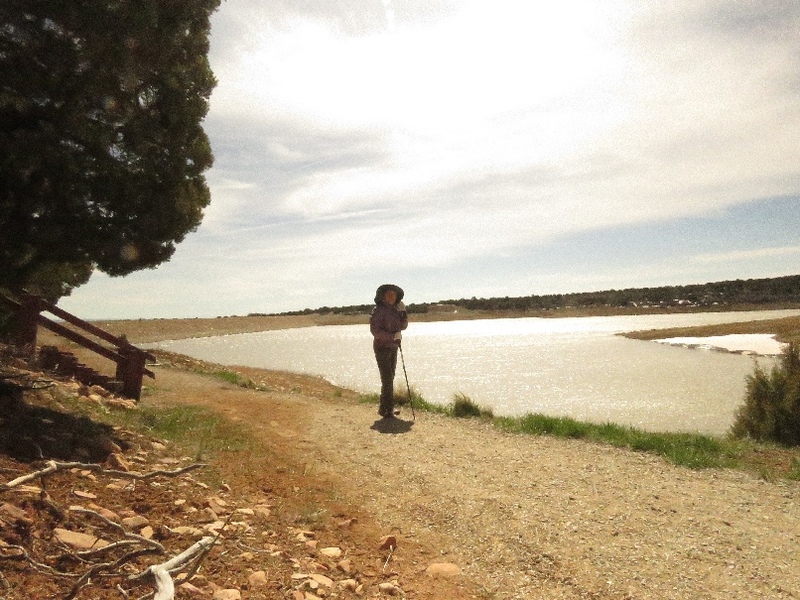 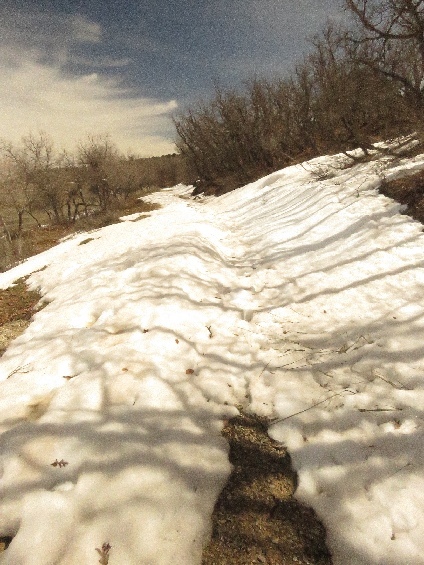 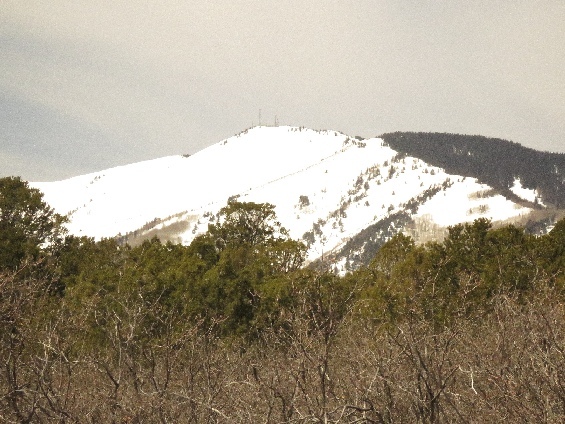 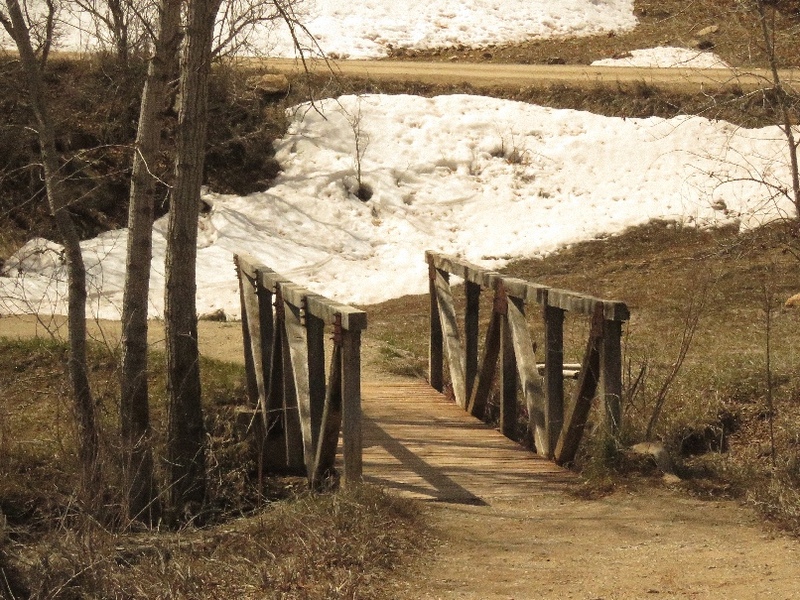 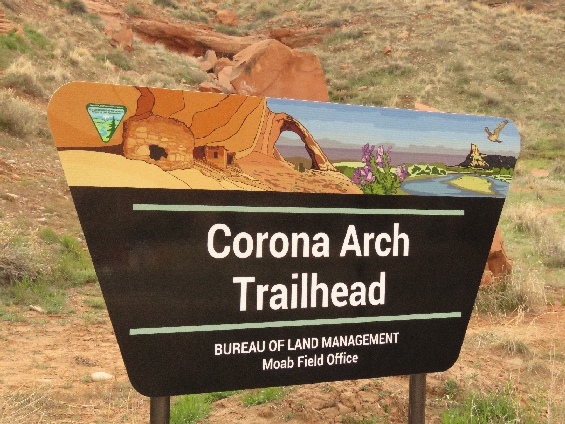 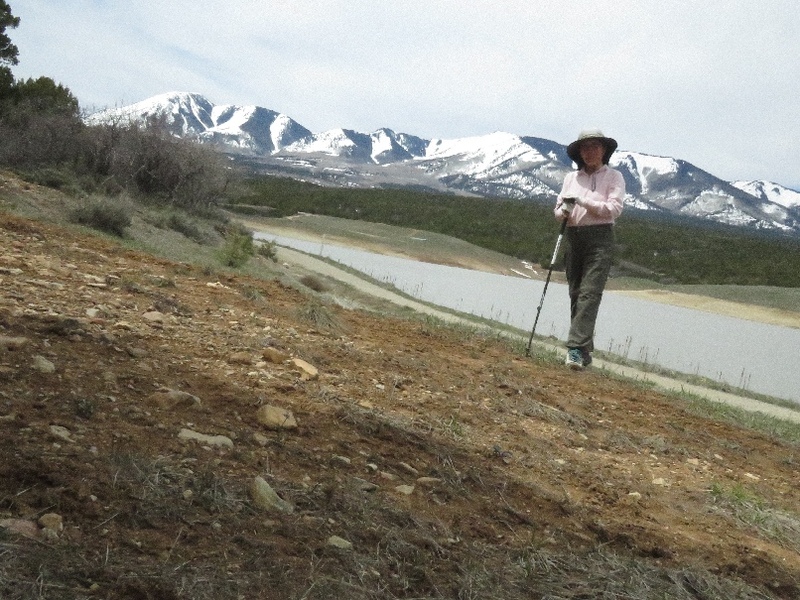 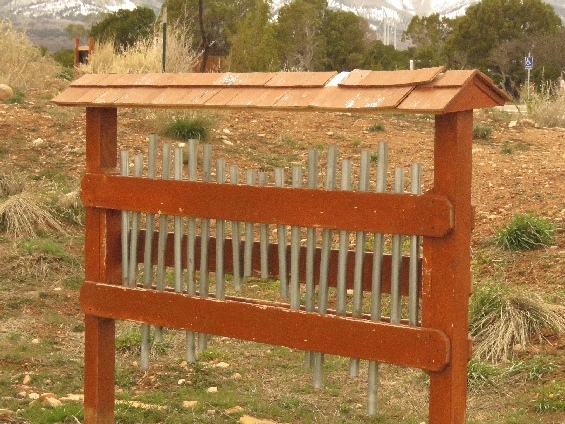 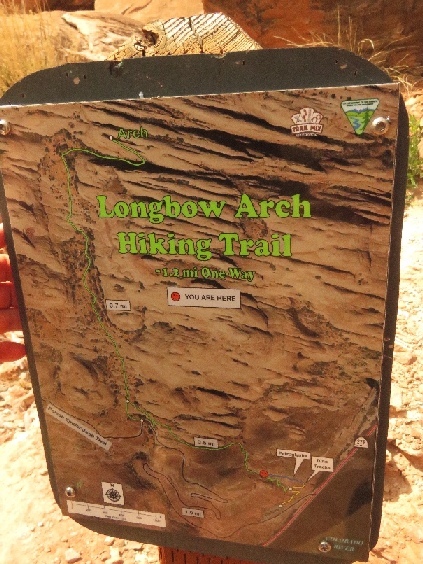 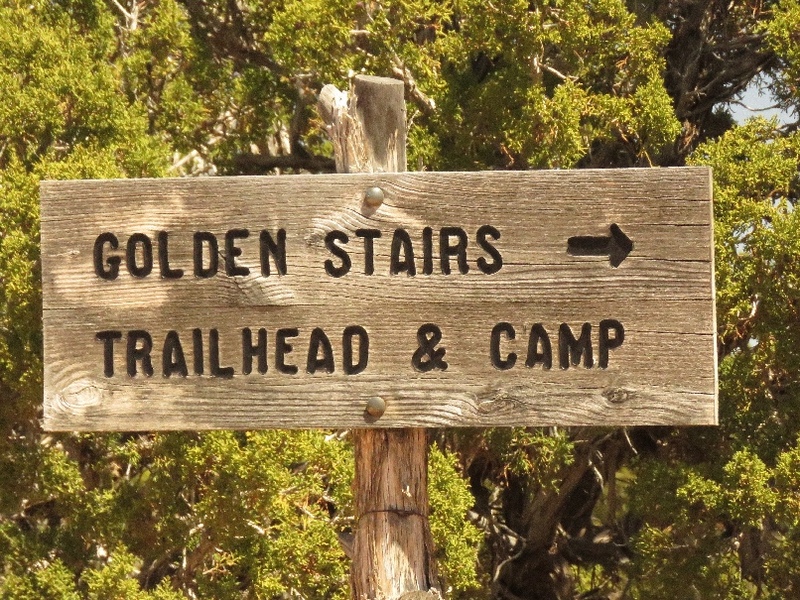 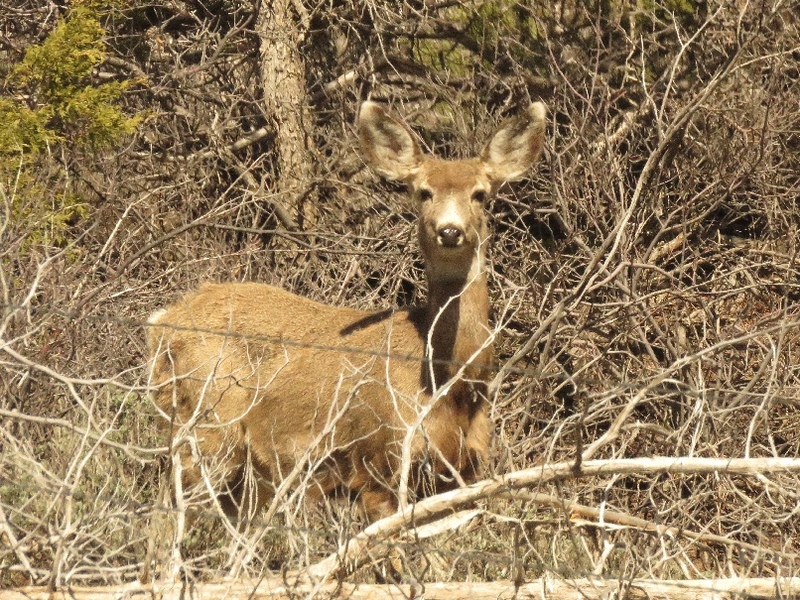 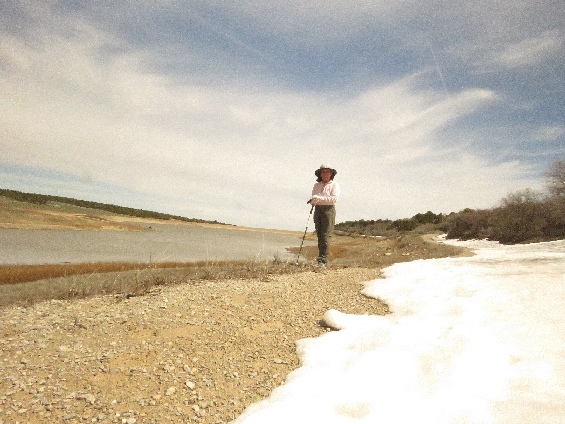 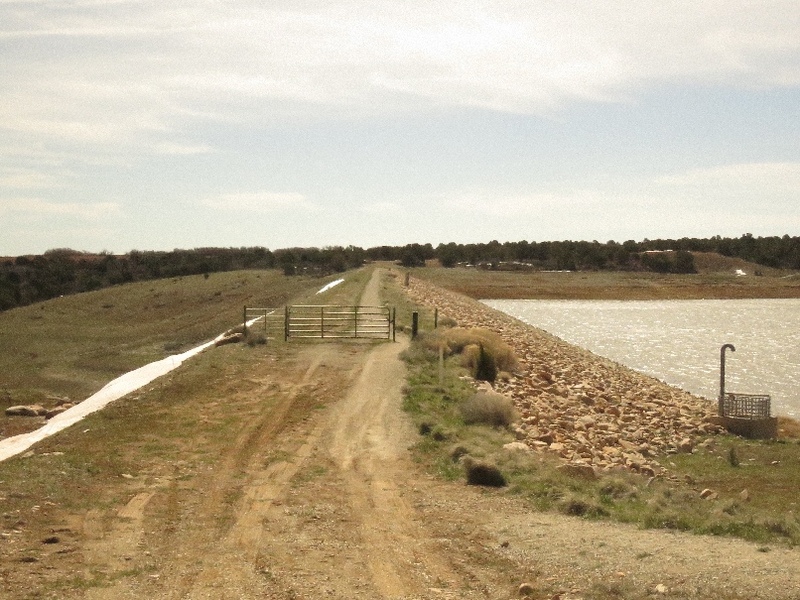 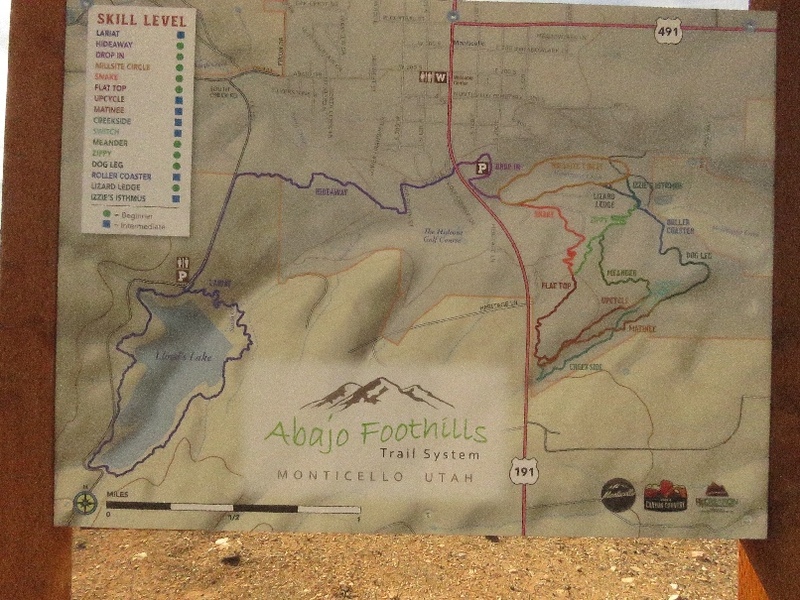 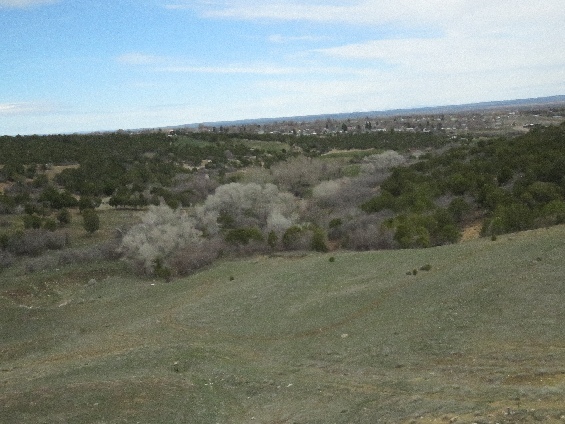 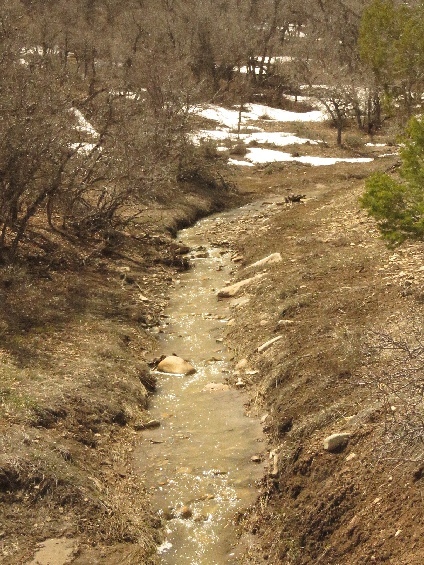 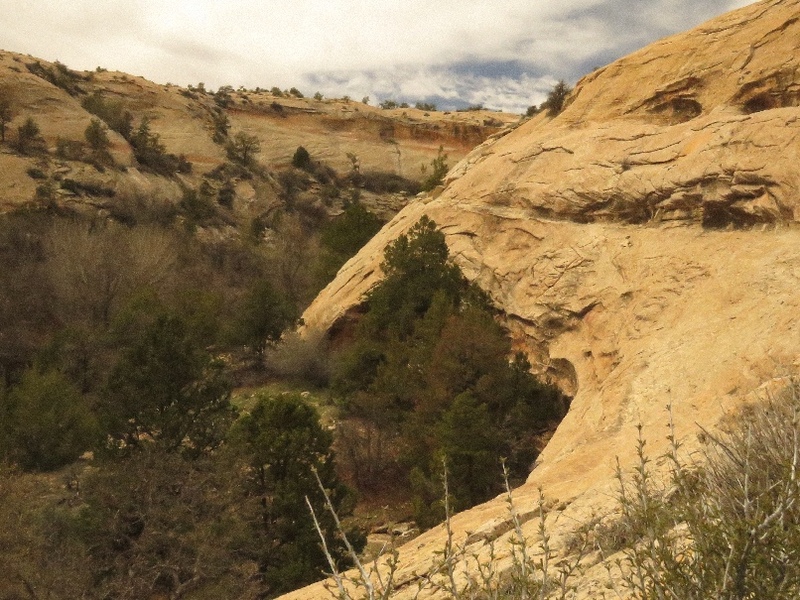 4/14/2019 Lloyd Lake Loop Hike, Monticello, UT - This route is a part of the Abajo Foothill Trail System in Monticello. 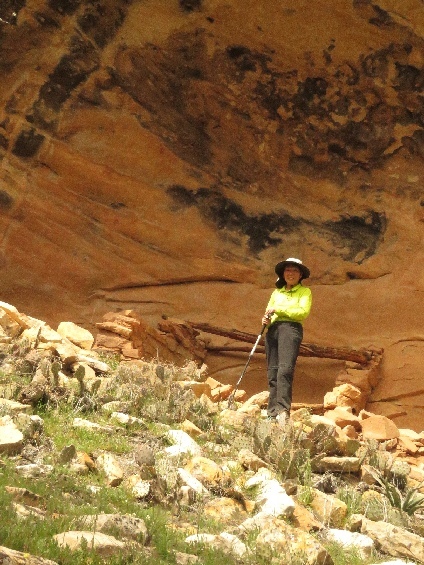 I have hiked about 6 mile round trip. The trail is go through the golf course that confusing because not enough sign to show where is the hiking trail. 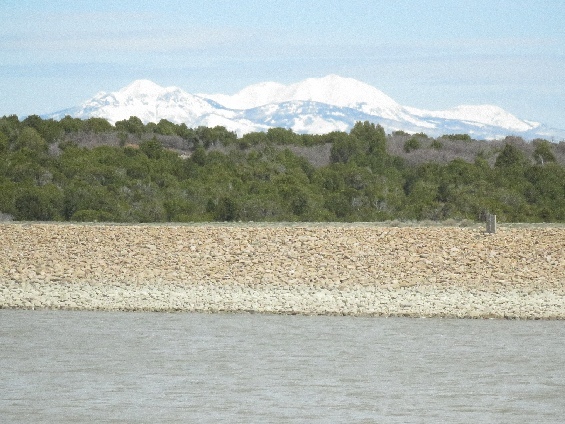 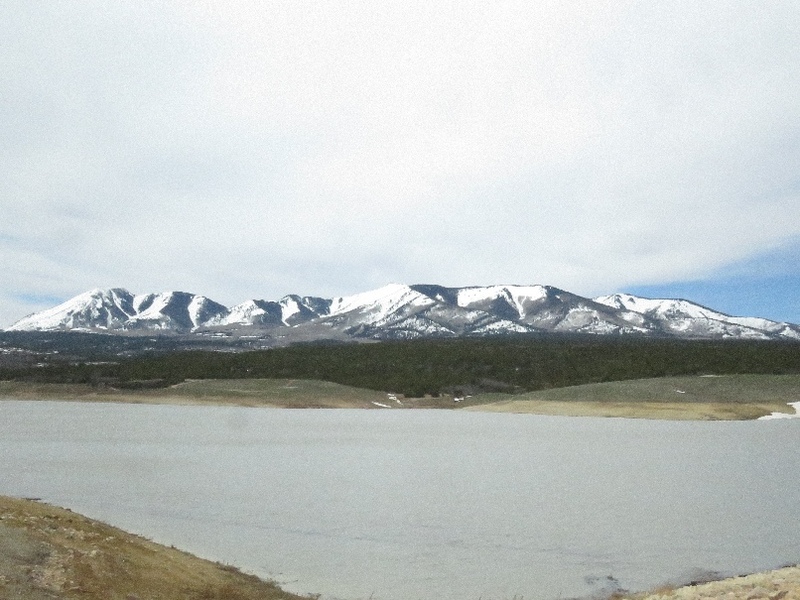 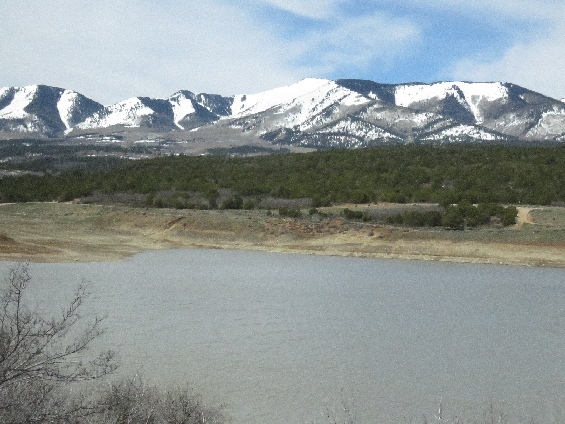 Snow covered Abajo Mountain range is beautiful from the Lloyd lake. 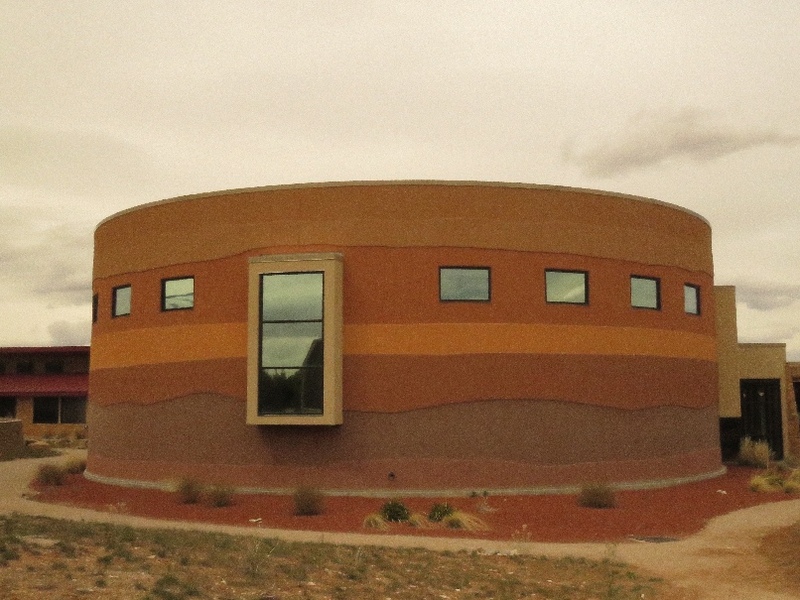 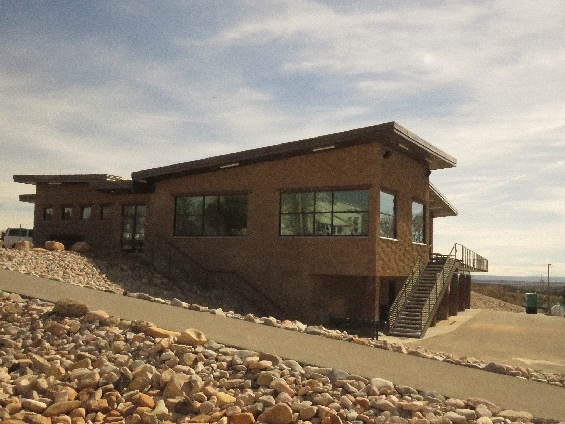 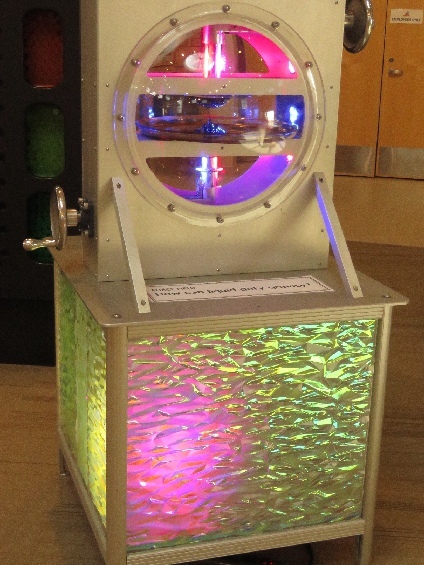 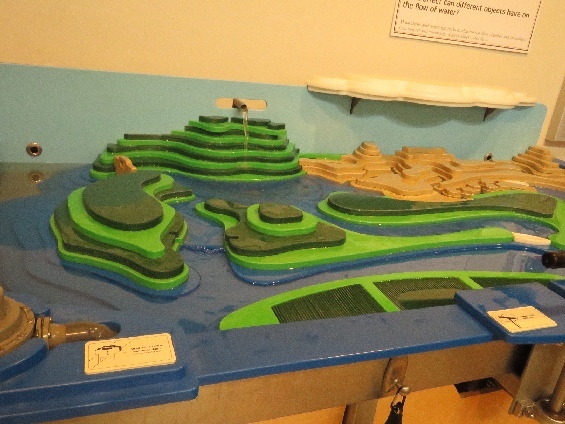 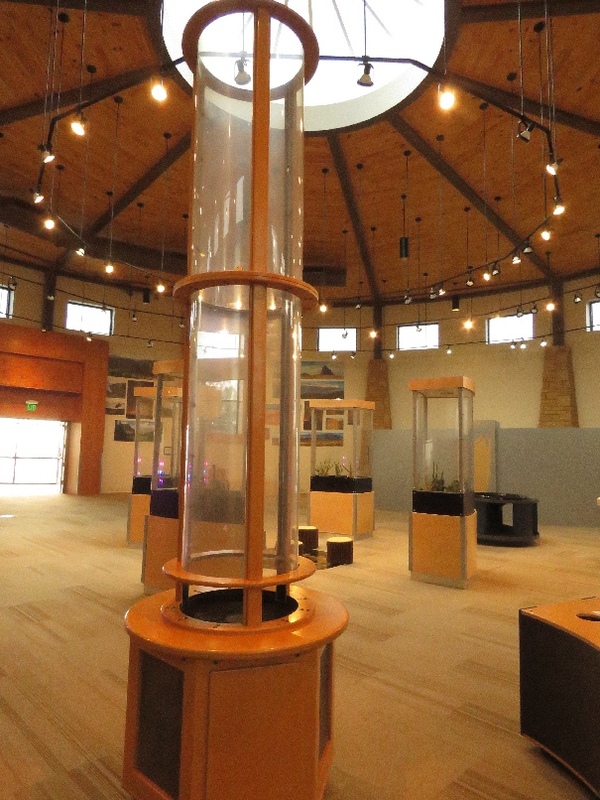 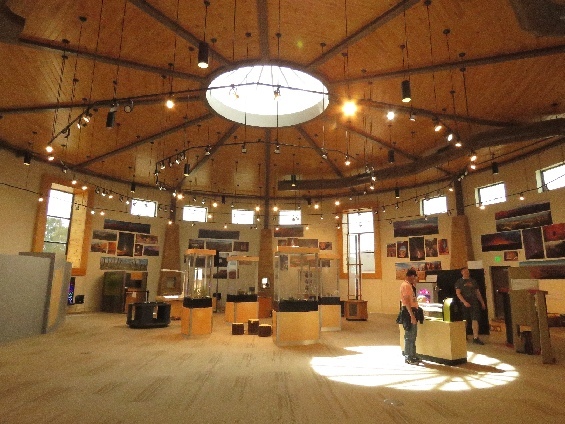 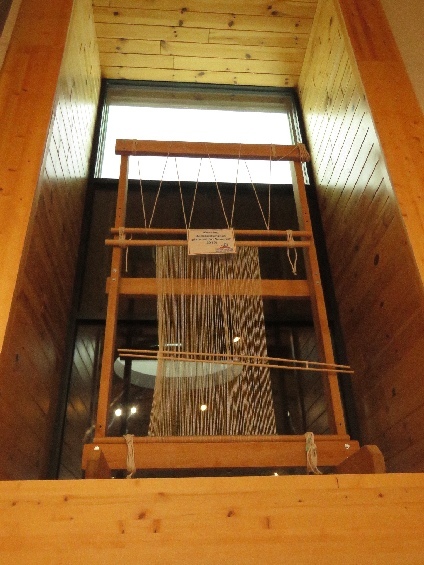 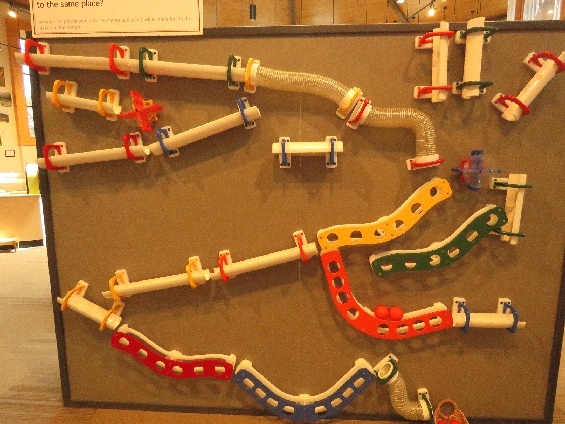 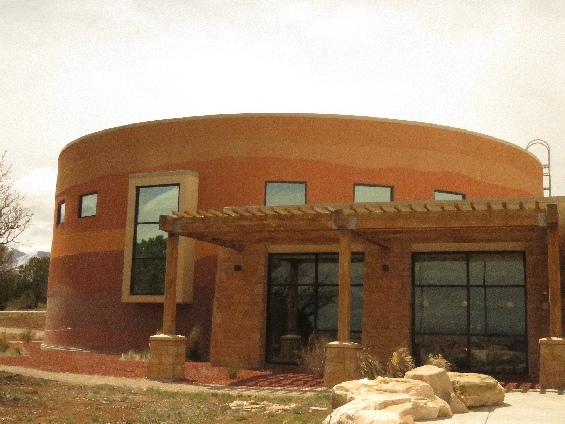 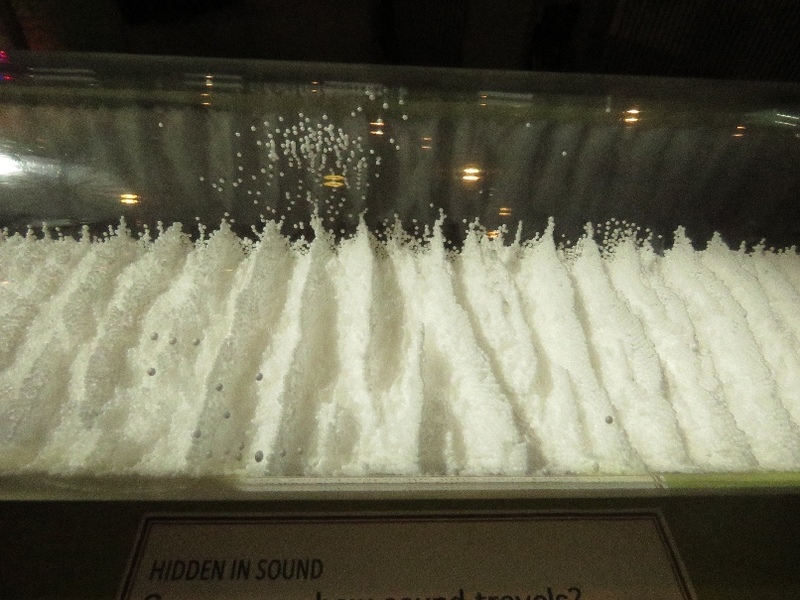 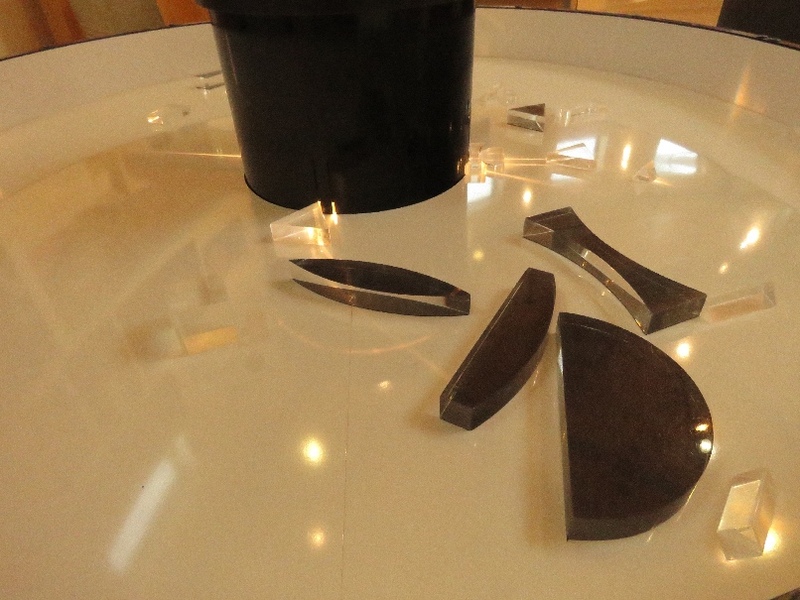 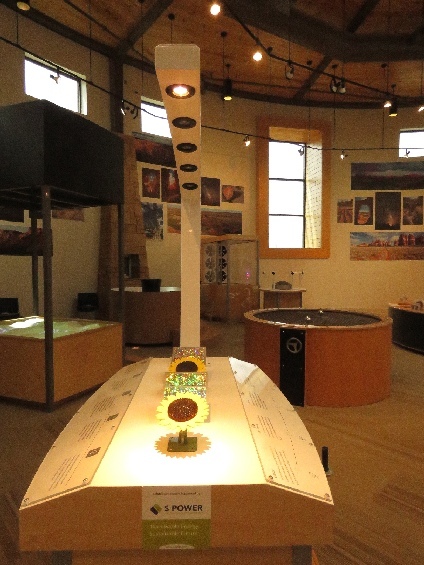 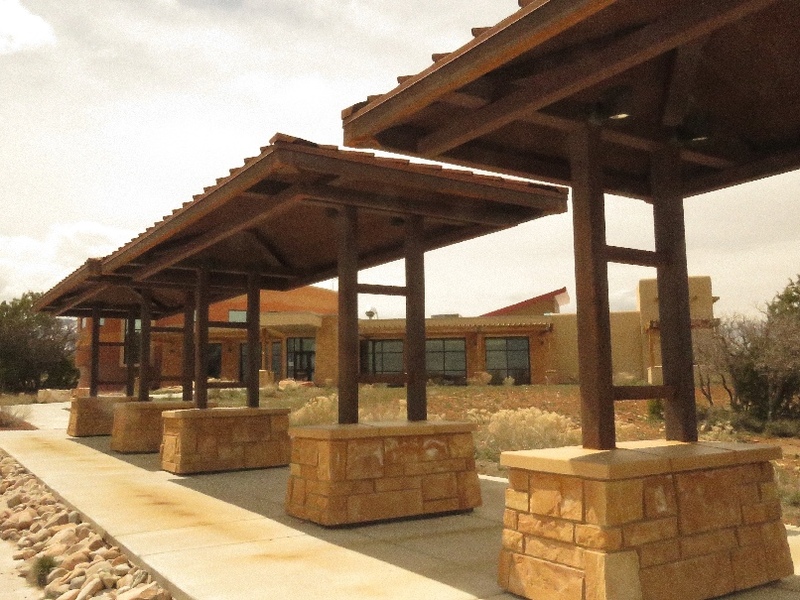 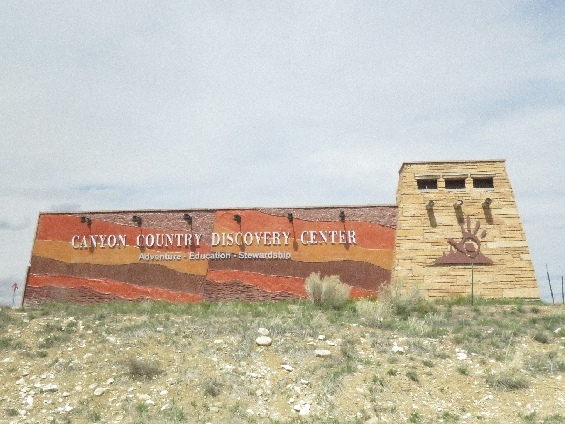 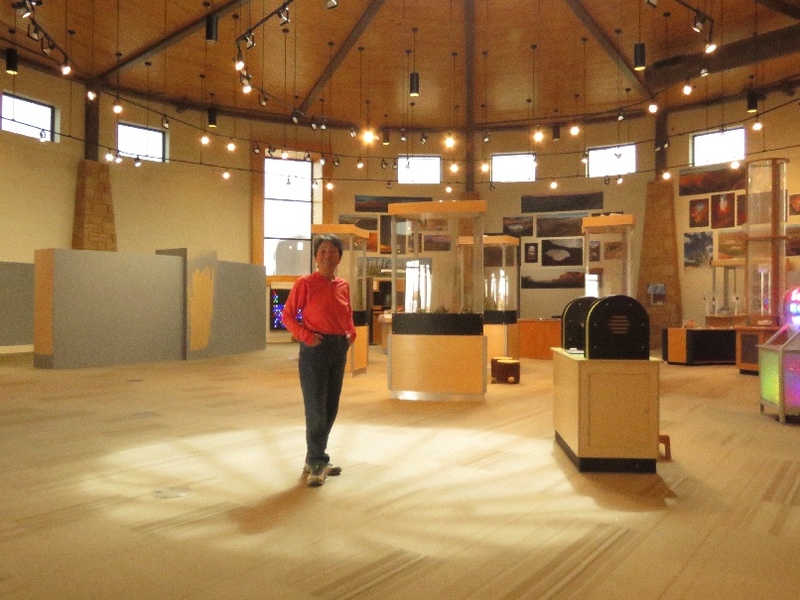 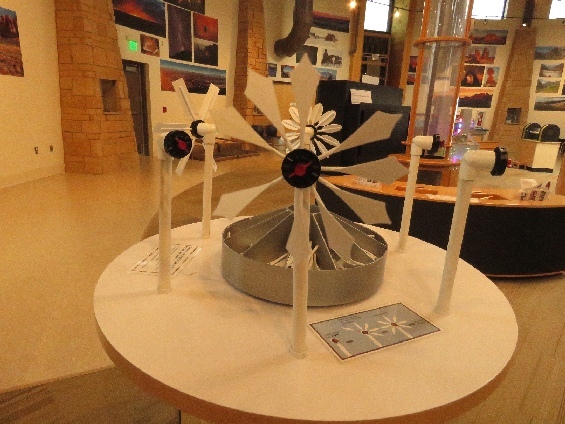 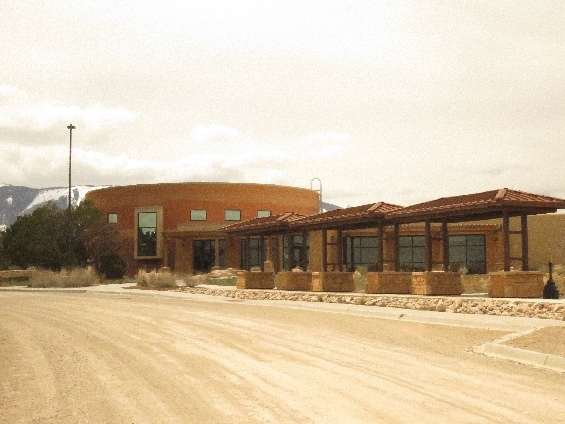 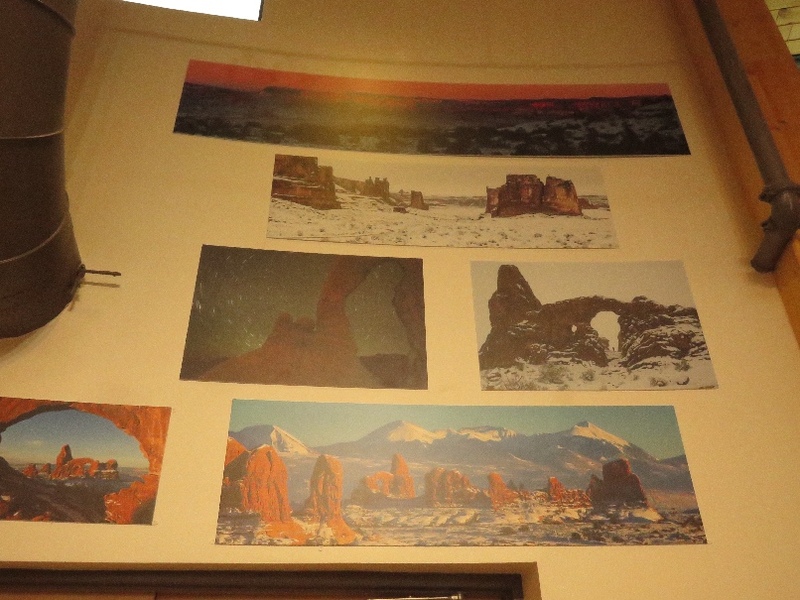 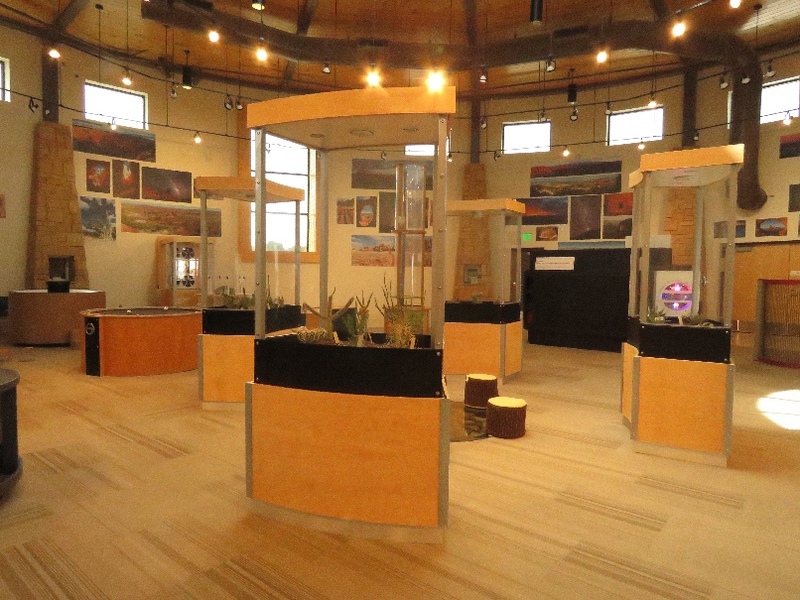 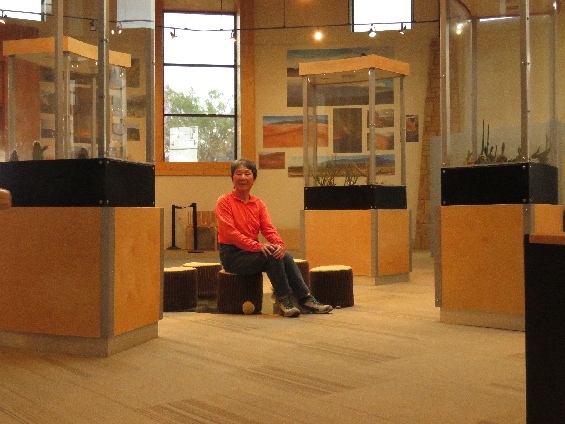 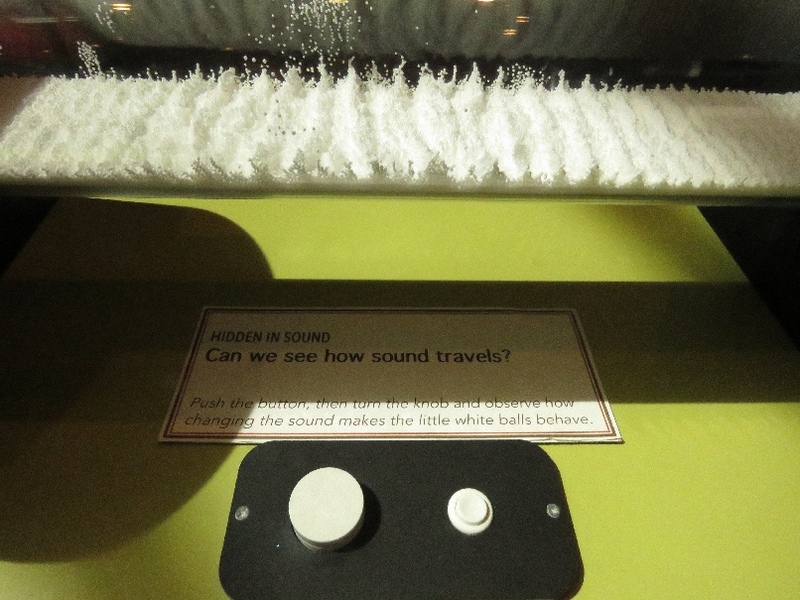 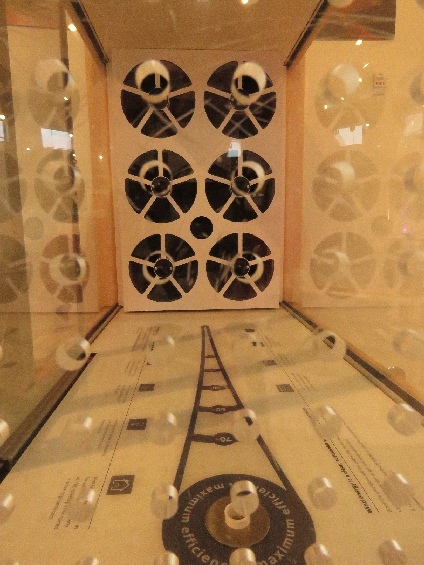 4/16/2019 Canyon Country Discovery Center, Monticello, UT - In one large circular room, there are some hands-on learning stations, actually we can touch and play it. 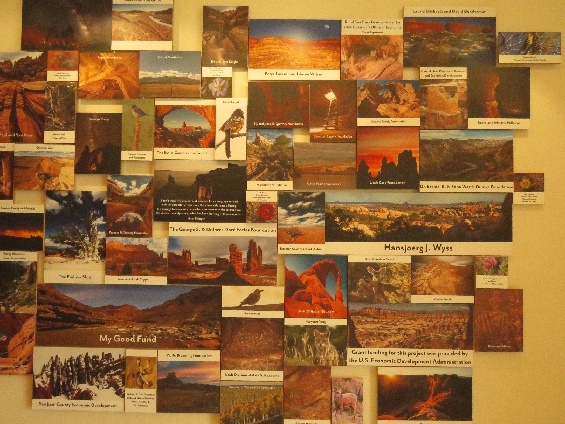 It was fun to play any one of those, but not enough, wish they have many more. 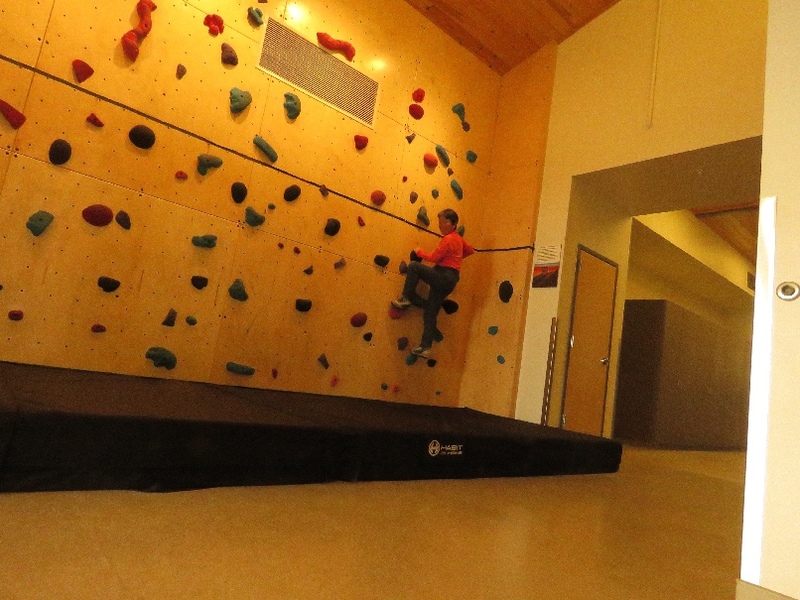 I thought this place is for small kid to learn, but not only kid, we adults can learn too. 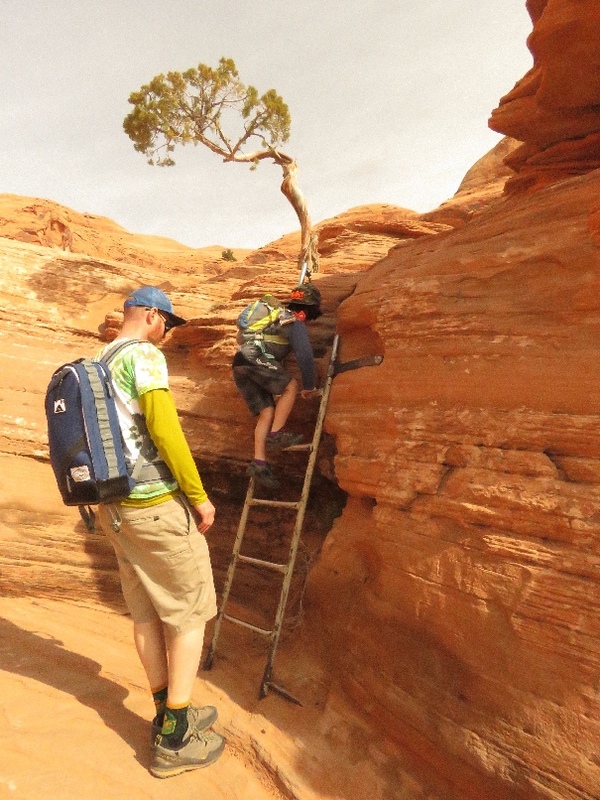 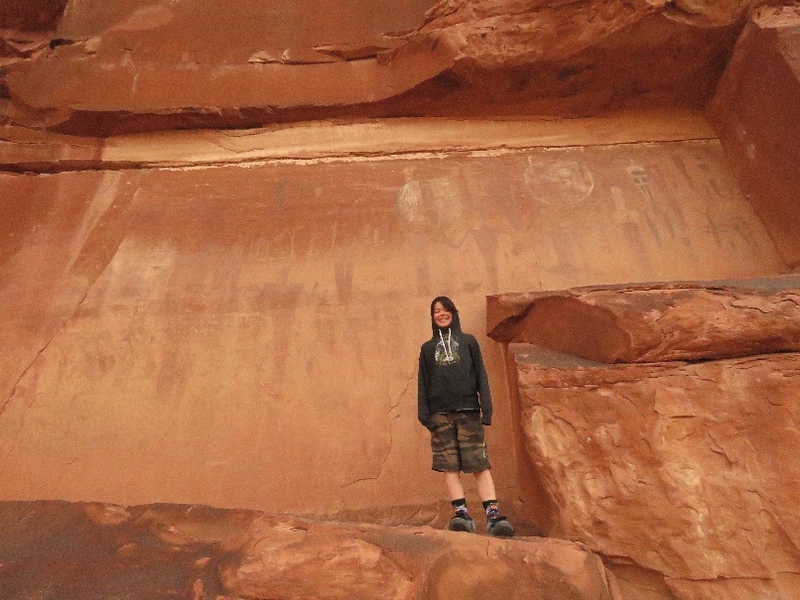 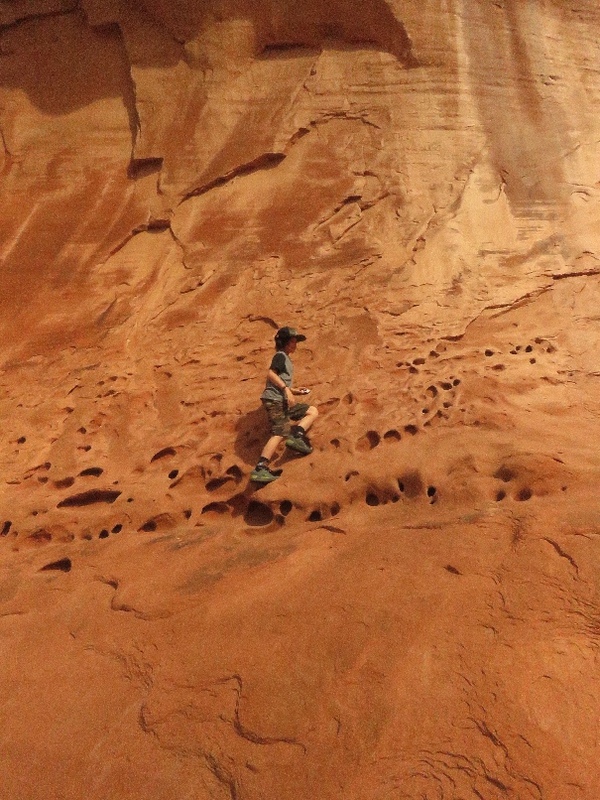 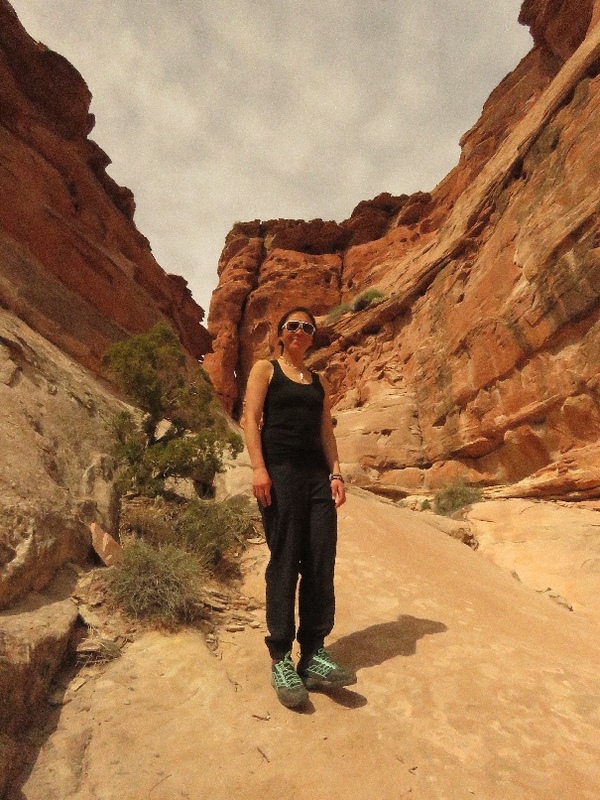 4/18/2019 Horseshoe Canyon, Maze Tour (Day 1), Canyonlands National Park, UT - I’ve joined the Maze 4 days Tour offered by NAVTEC, Moab. 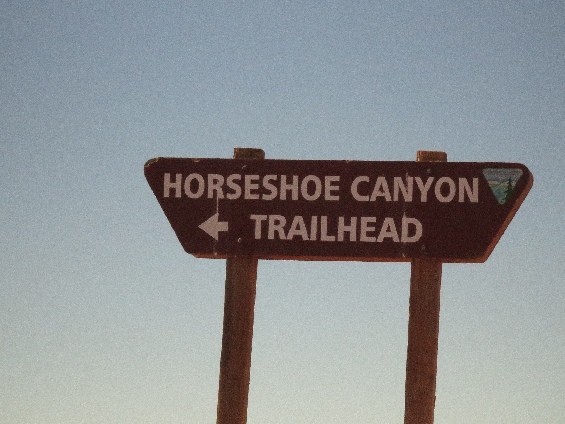 This is my 2nd time to visit this particular part of the Horseshoe Canyon. 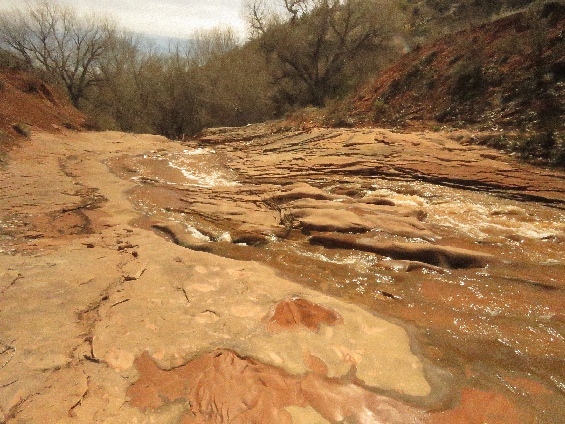 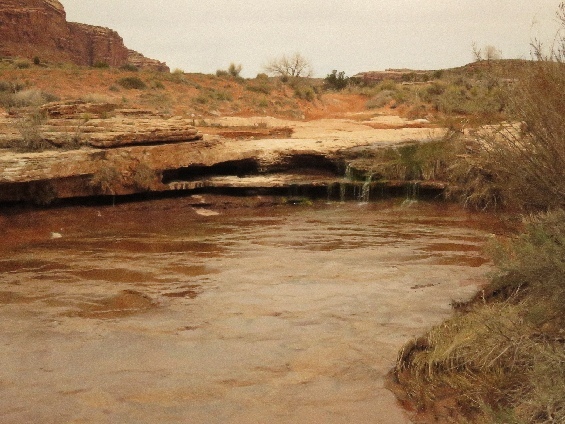 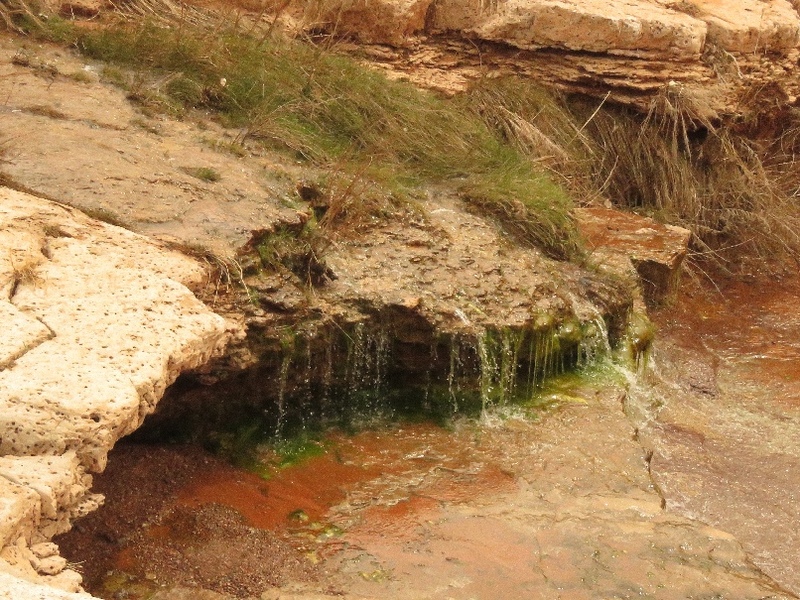 At this time, there is water, not much, on the bottom of the canyon floor. The trail is well marked by cairns and foot steps. It is large but very quiet canyon. 4/18/2019 High Gallery, Maze Tour (Day 1), Canyonlands National Park, UT - This place is located in the Horseshoe Canyon, first pictographs panel we can see after hike down to the bottom of the canyon. 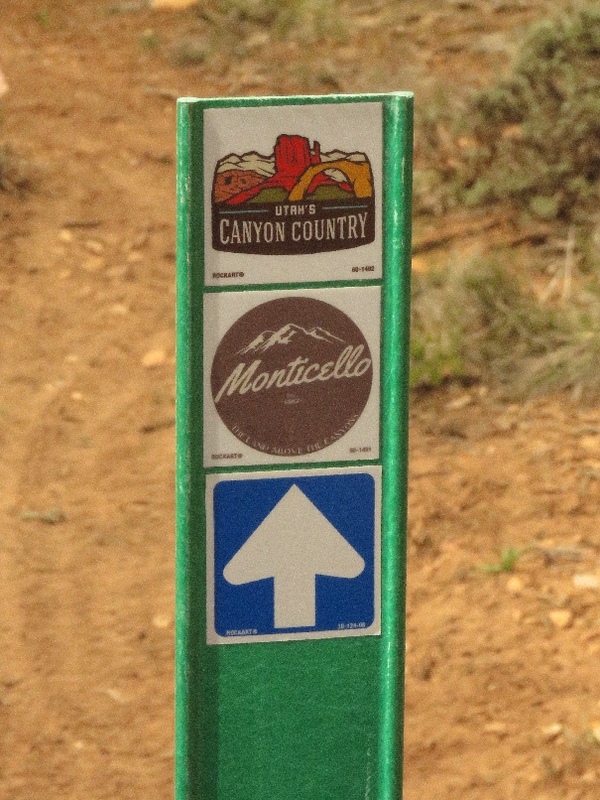 The panel is located high up and trail to go up close to panel is closed. 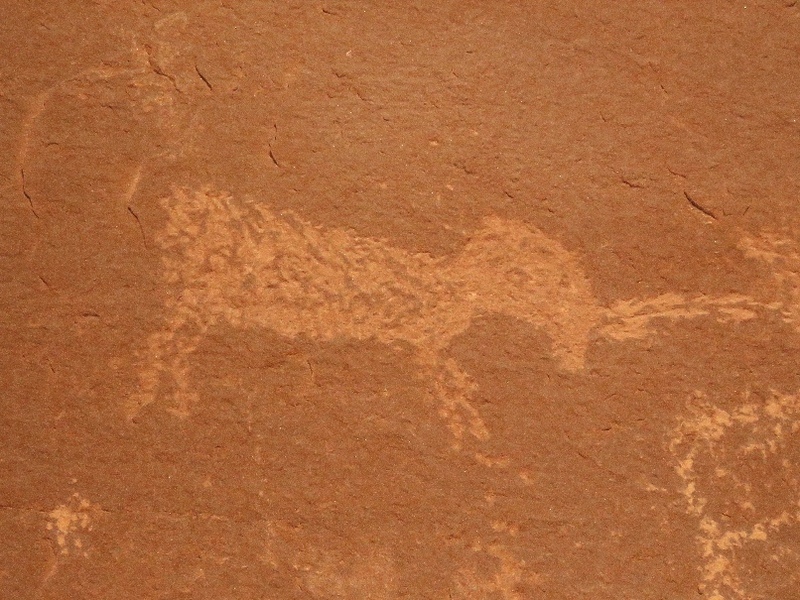 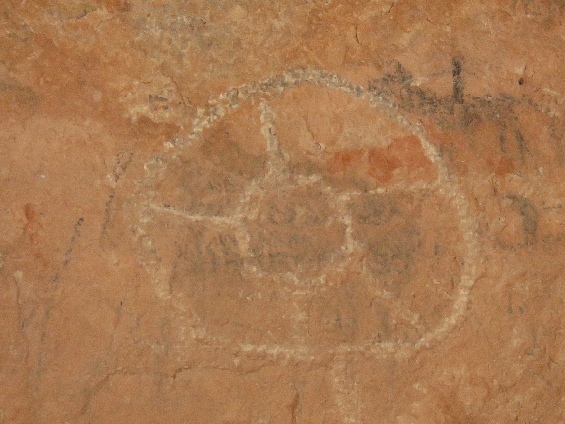 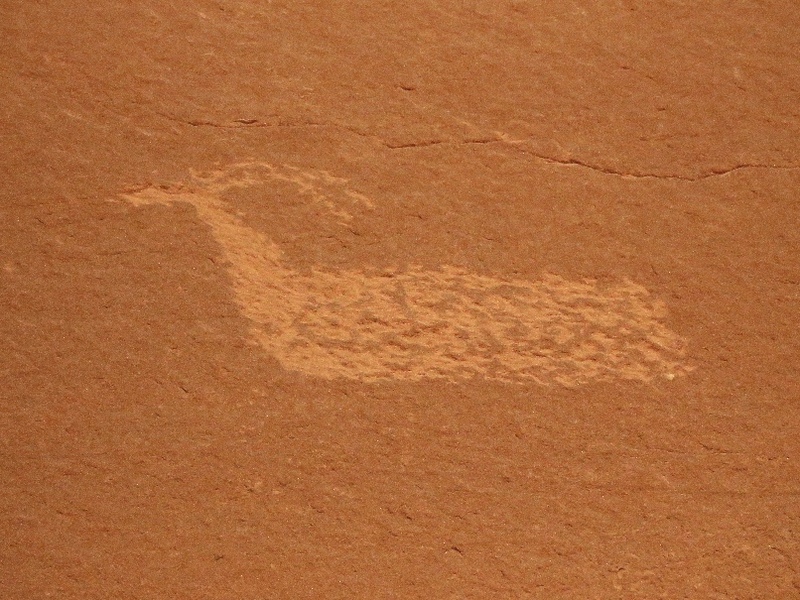 4/18/2019 Horseshoe Shelter, Maze Tour (Day 1), Canyonlands National Park, UT - This pictographs panel is located little south from the High Gallery, but opposite/west side of the canyon. 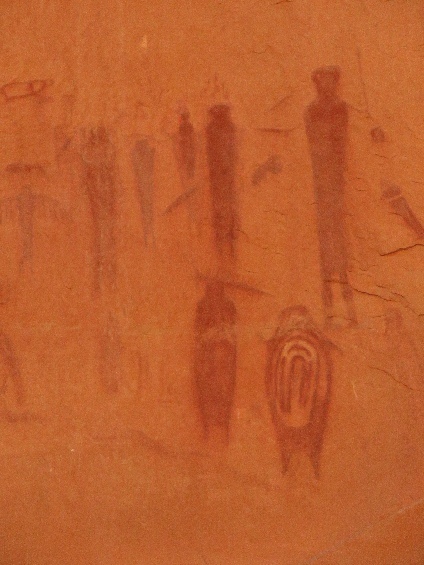 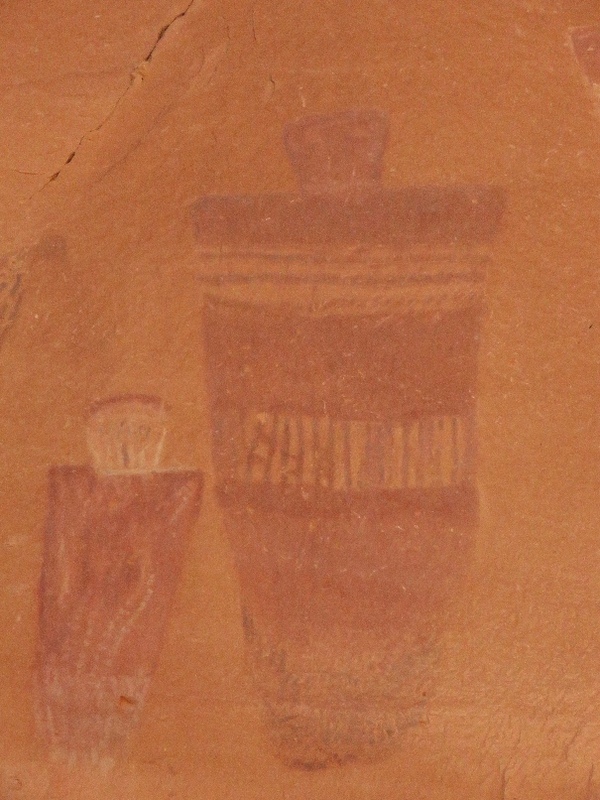 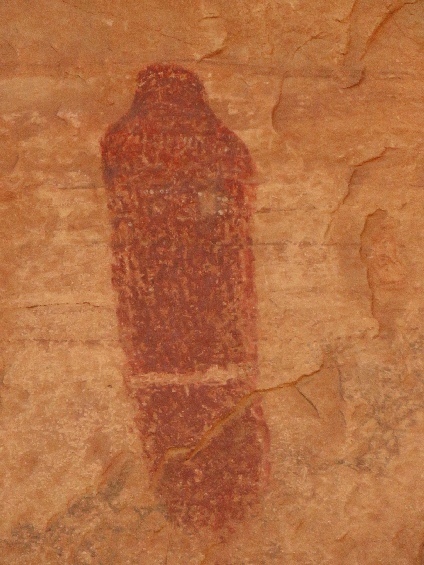 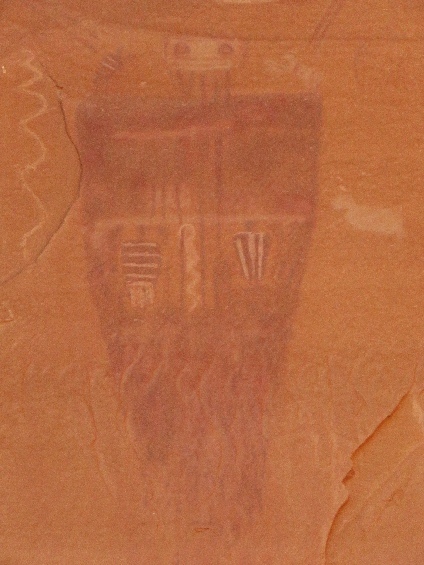 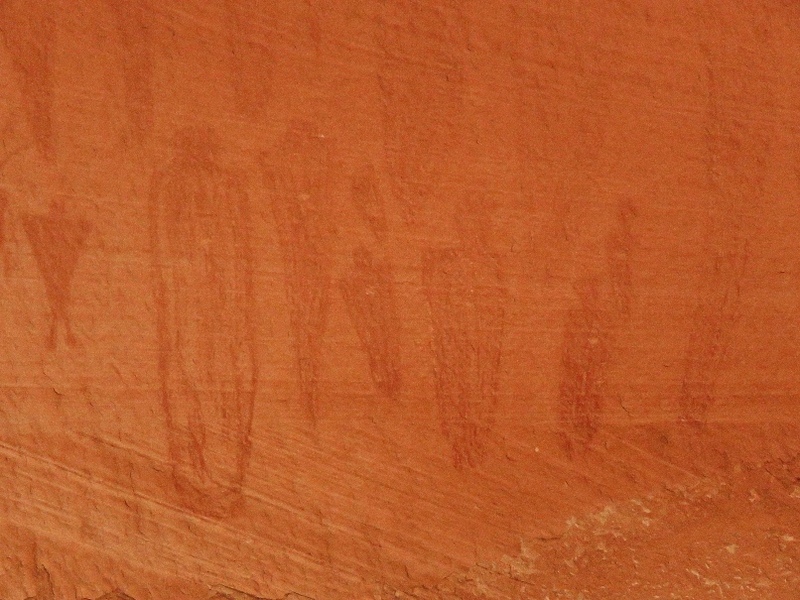 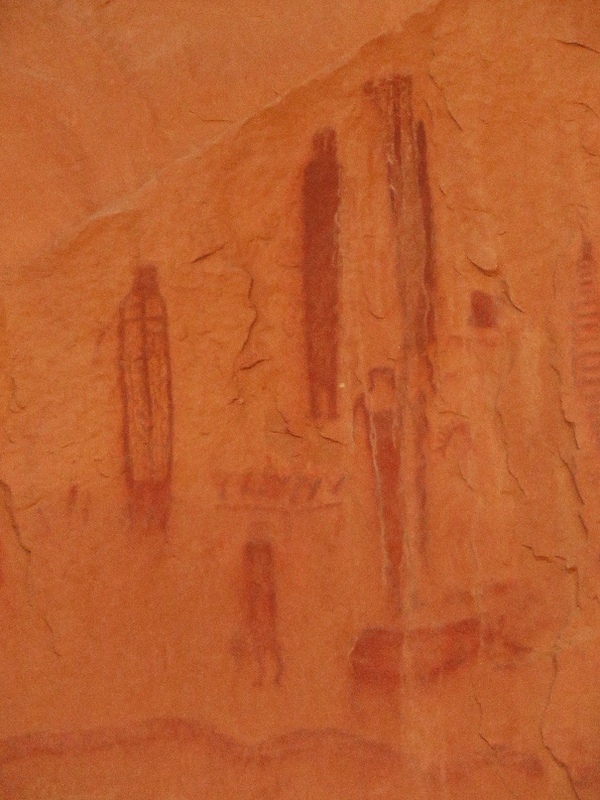 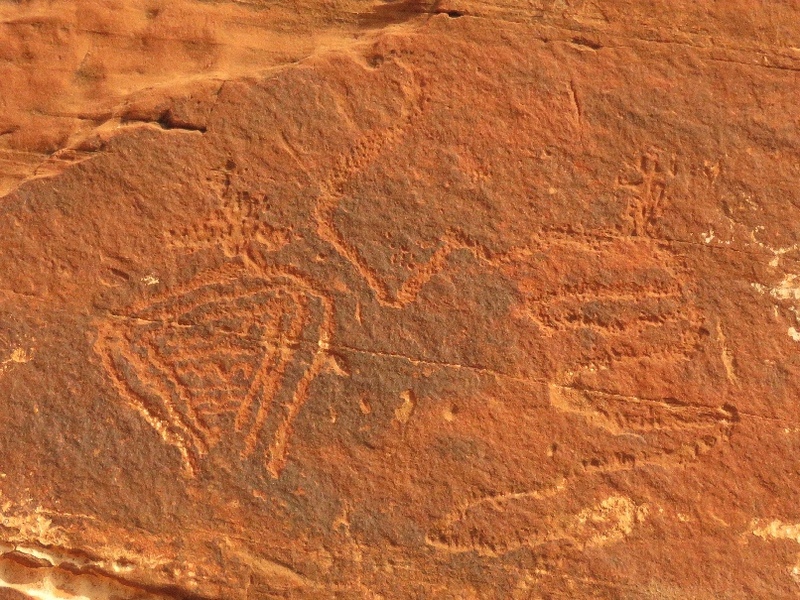 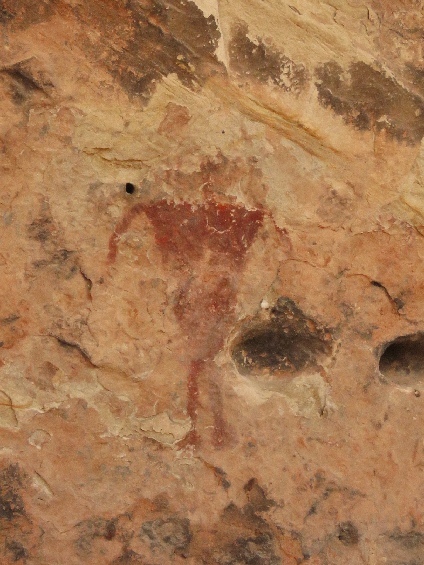 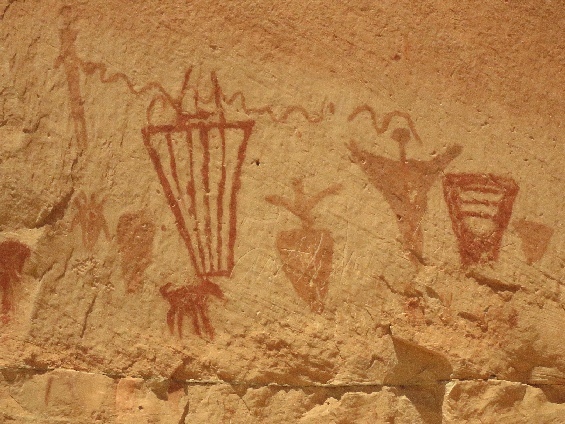 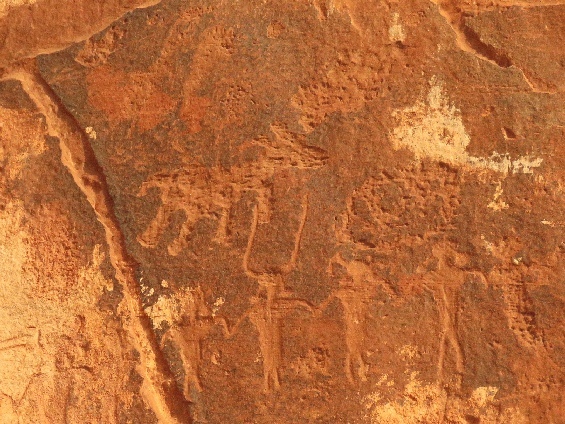 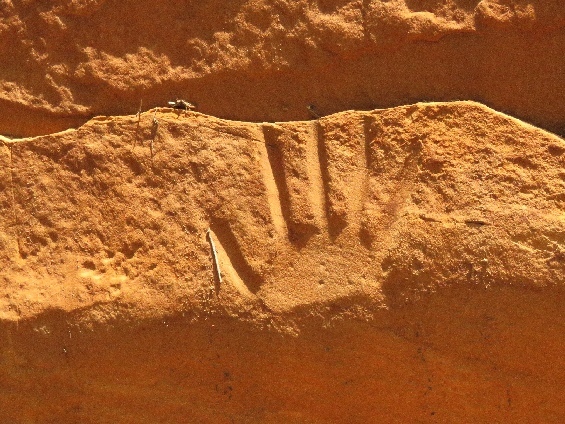 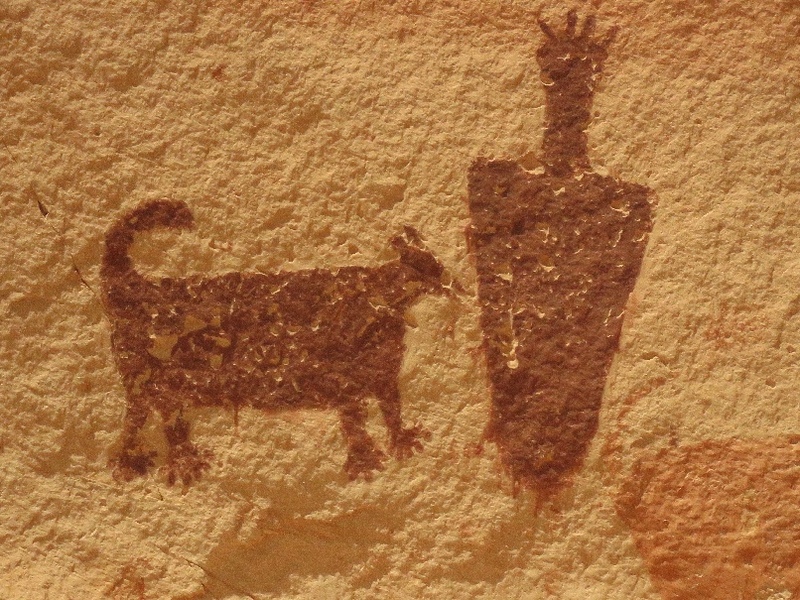 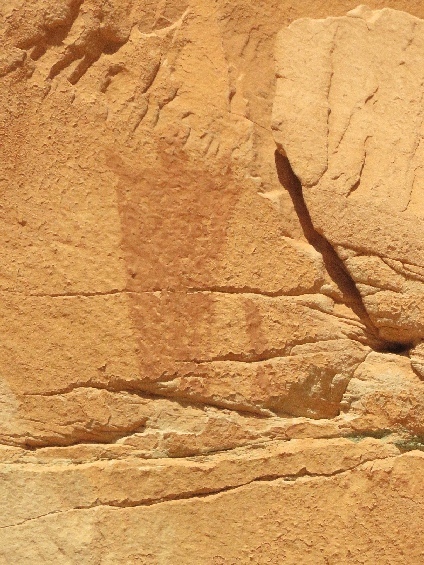 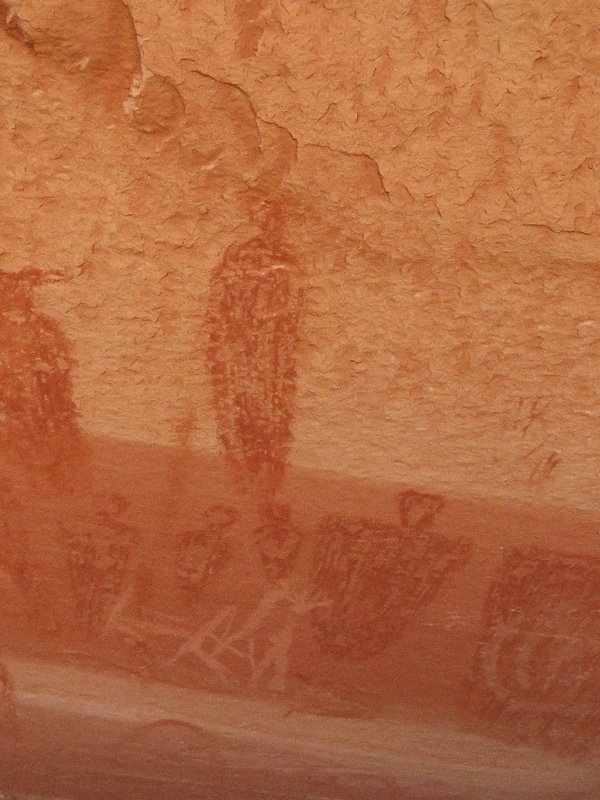 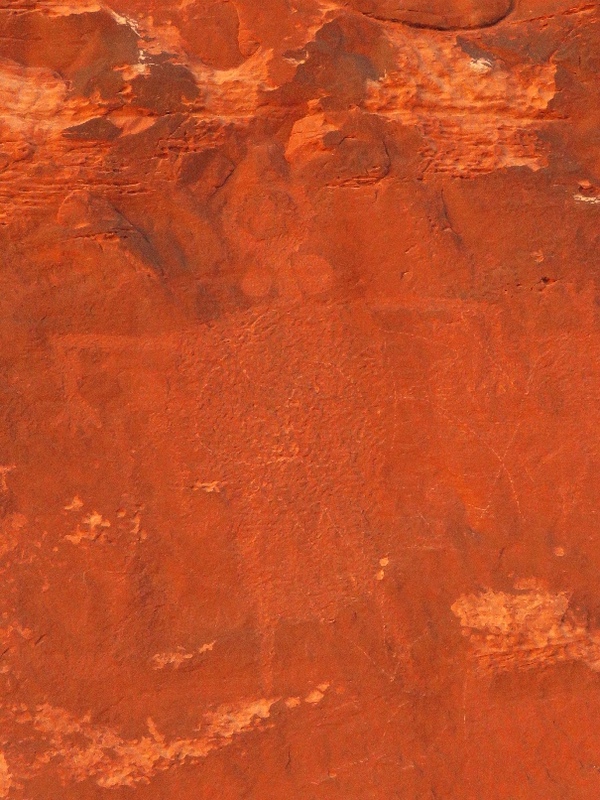 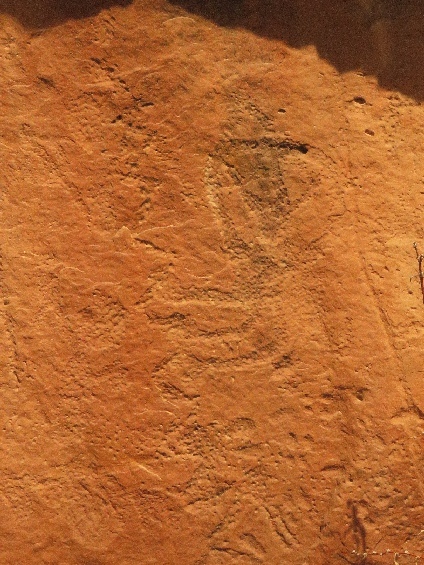 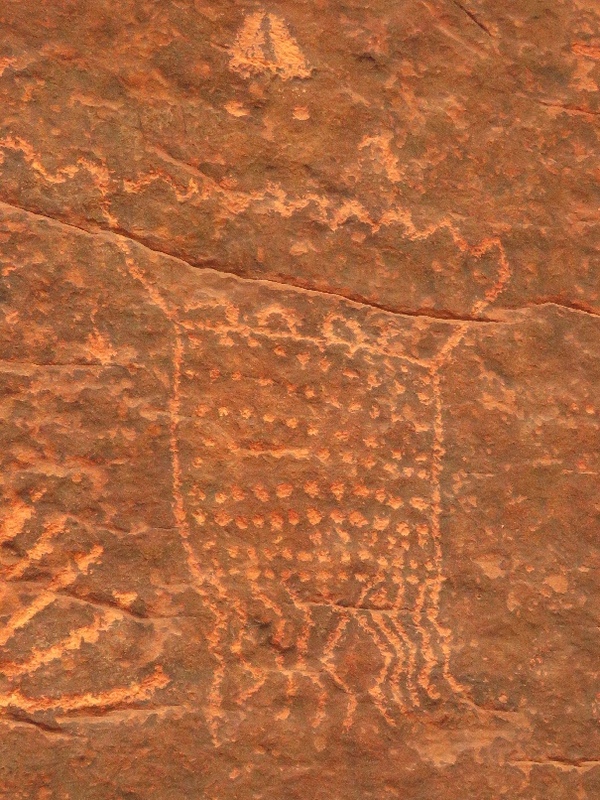 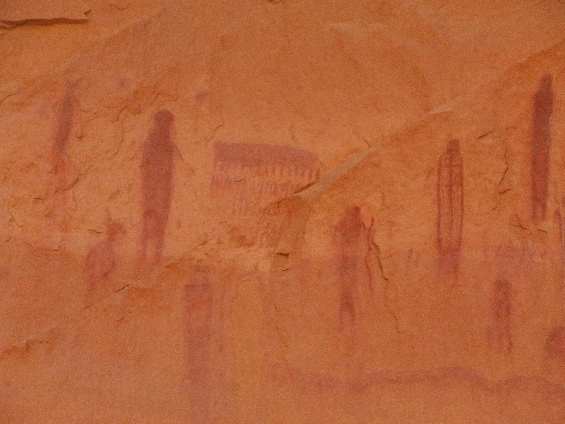 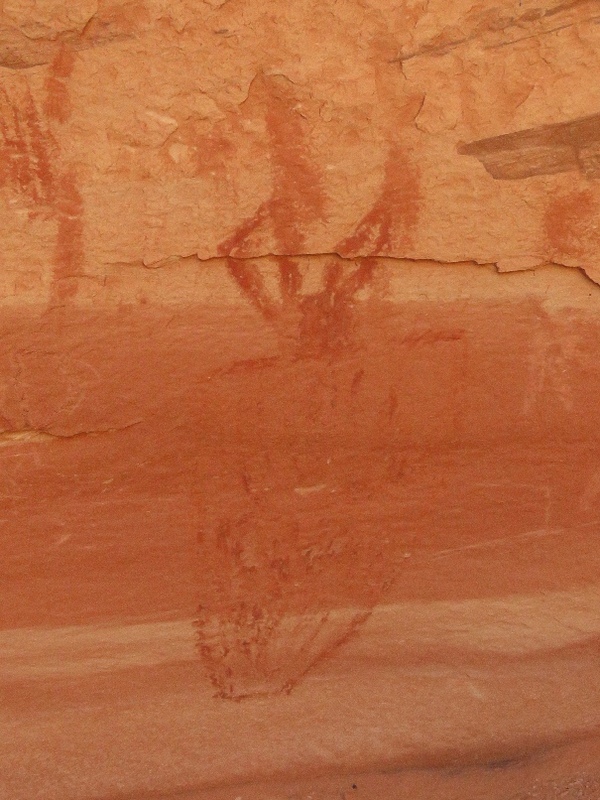 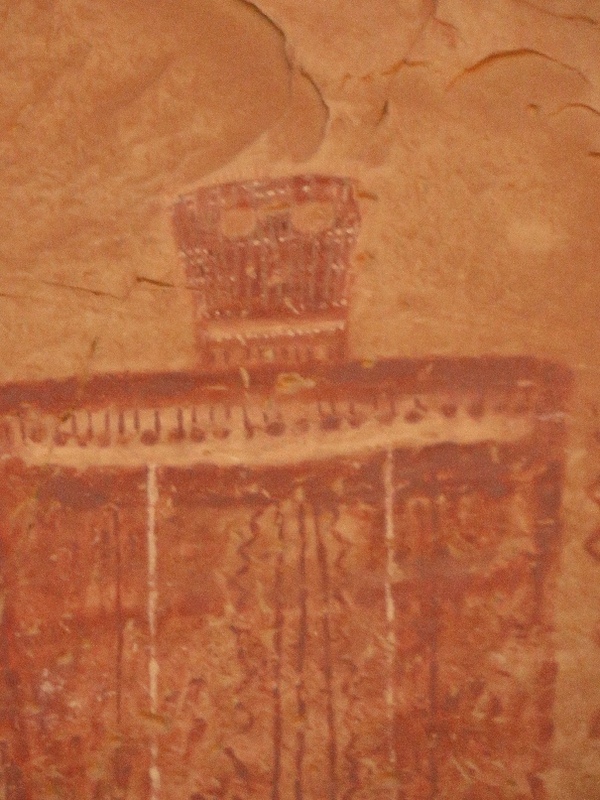 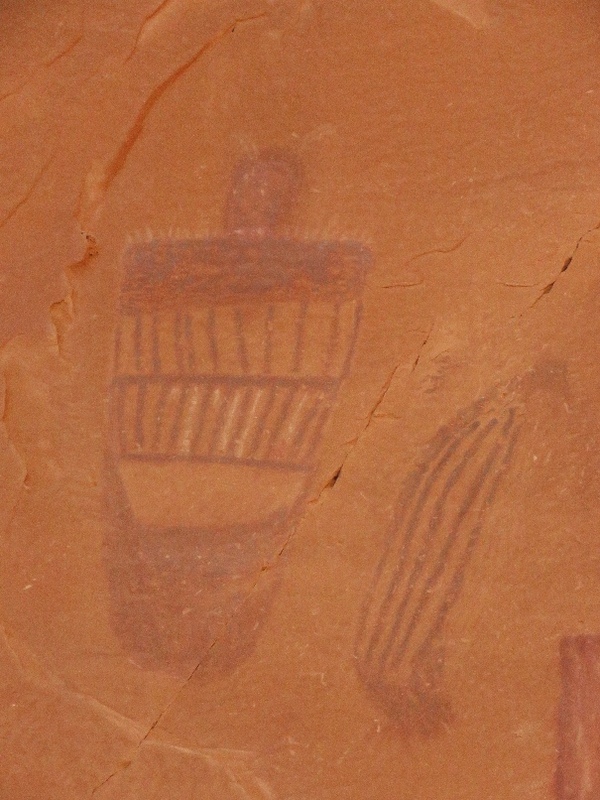 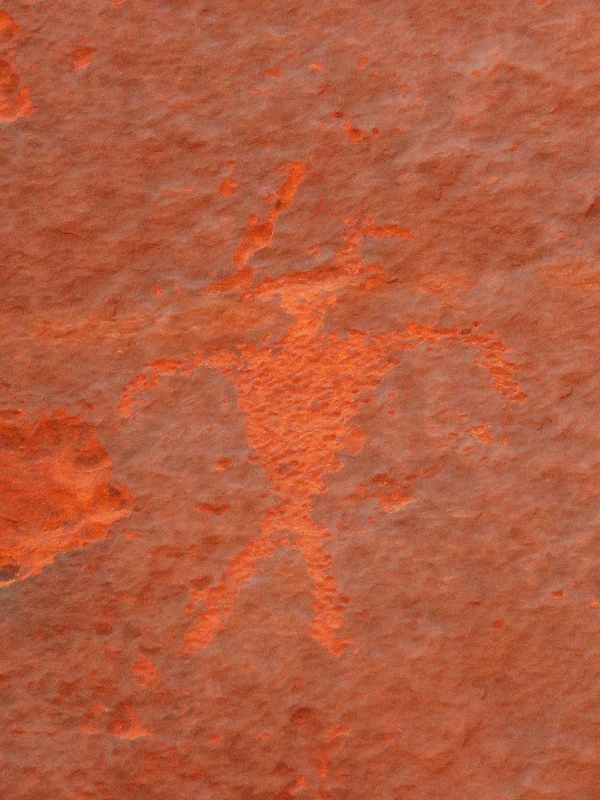 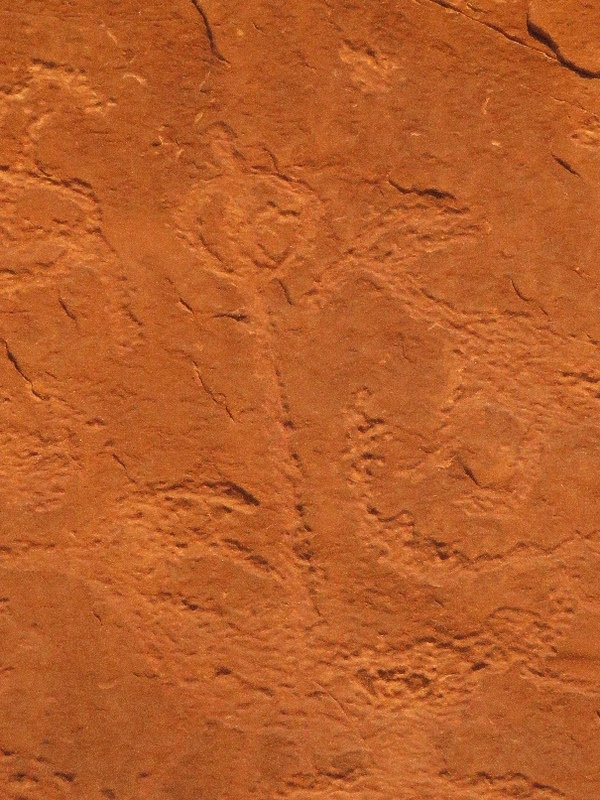 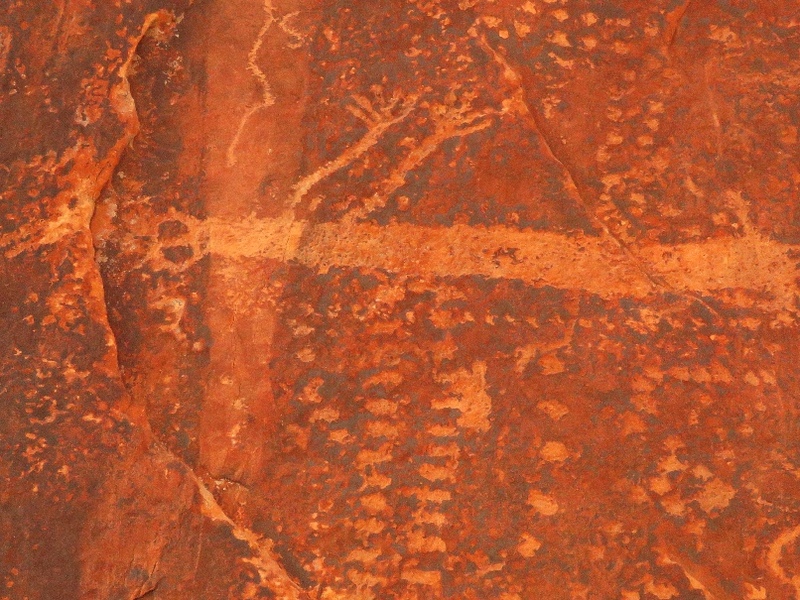 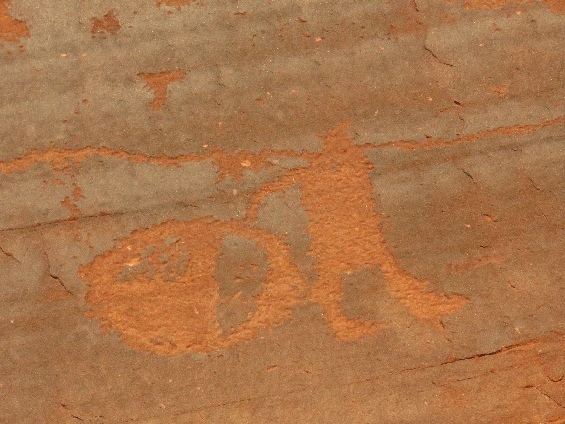 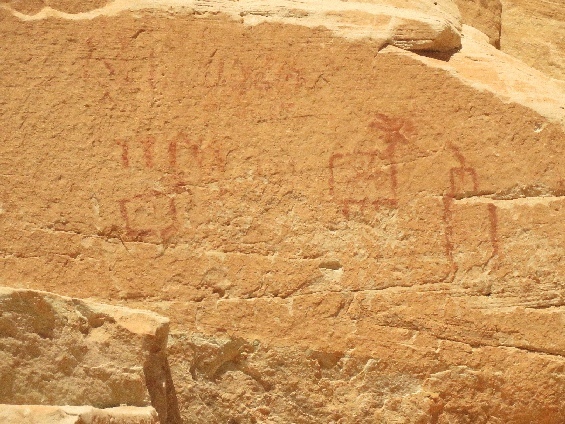 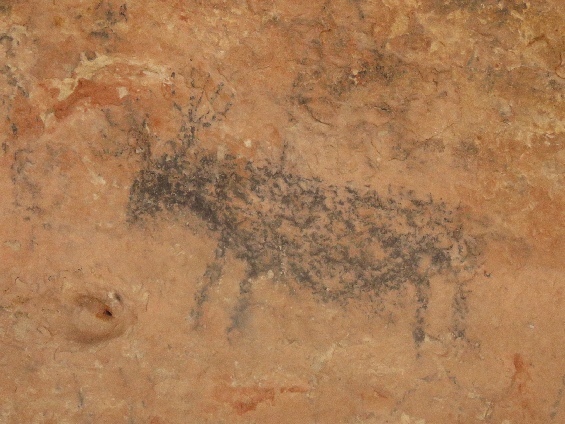 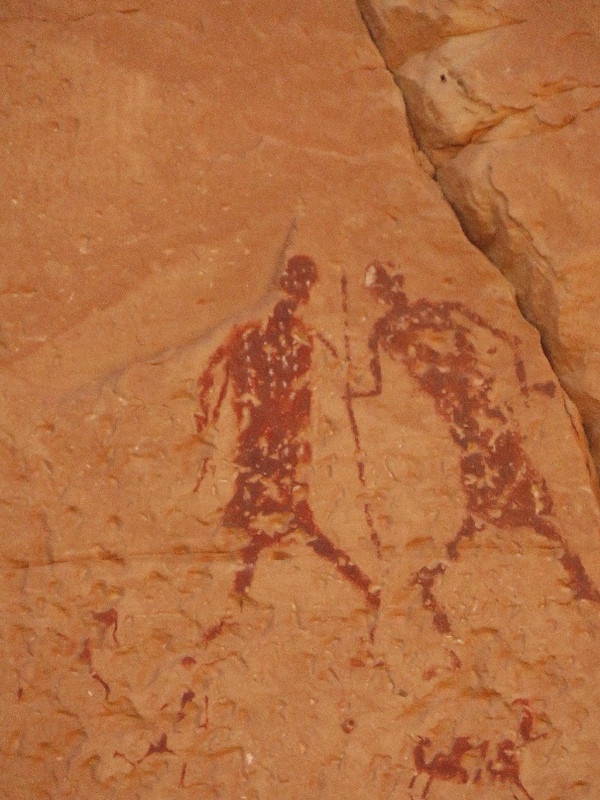 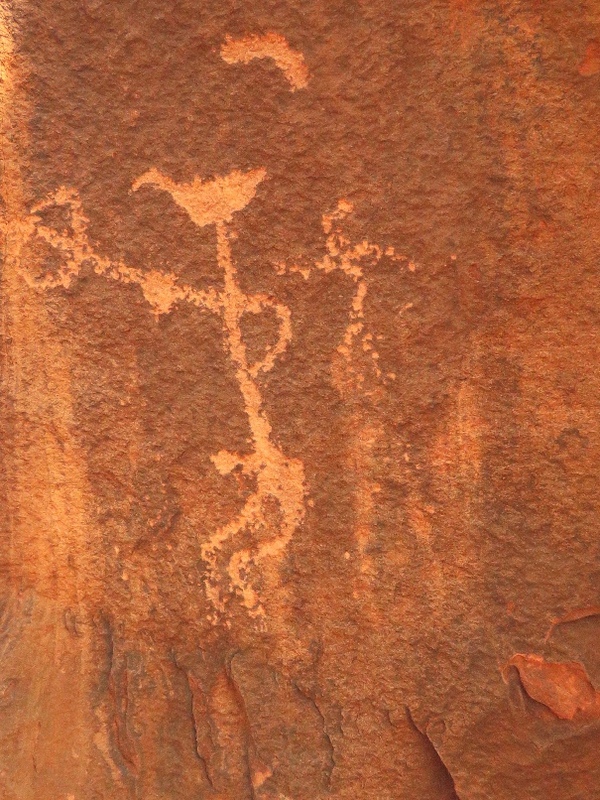 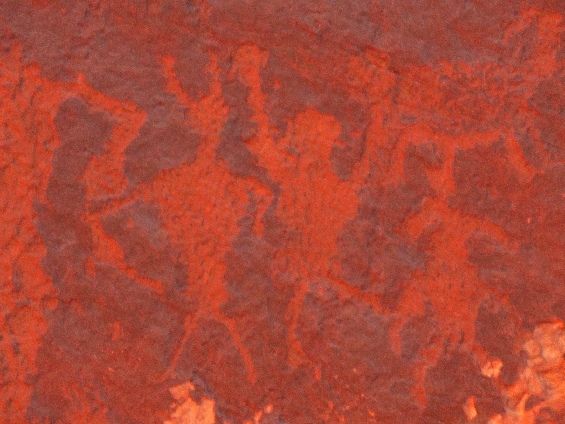 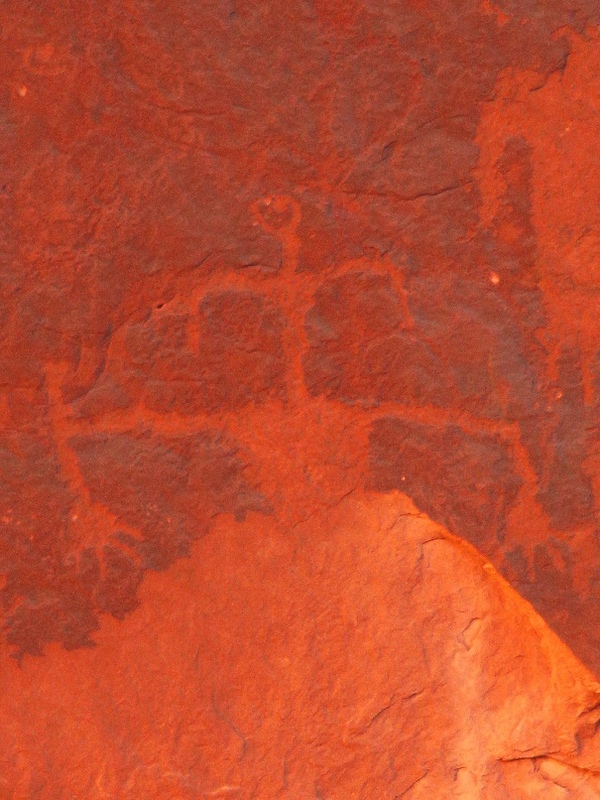 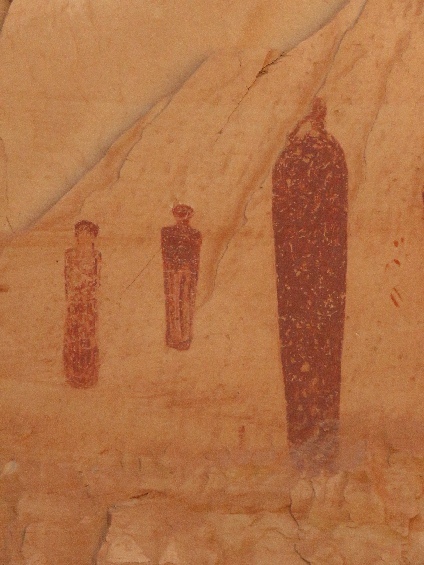 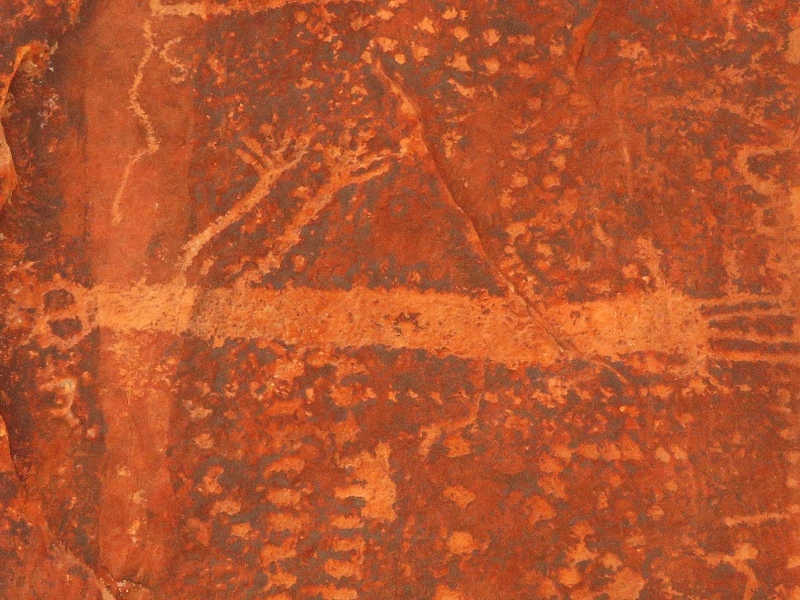 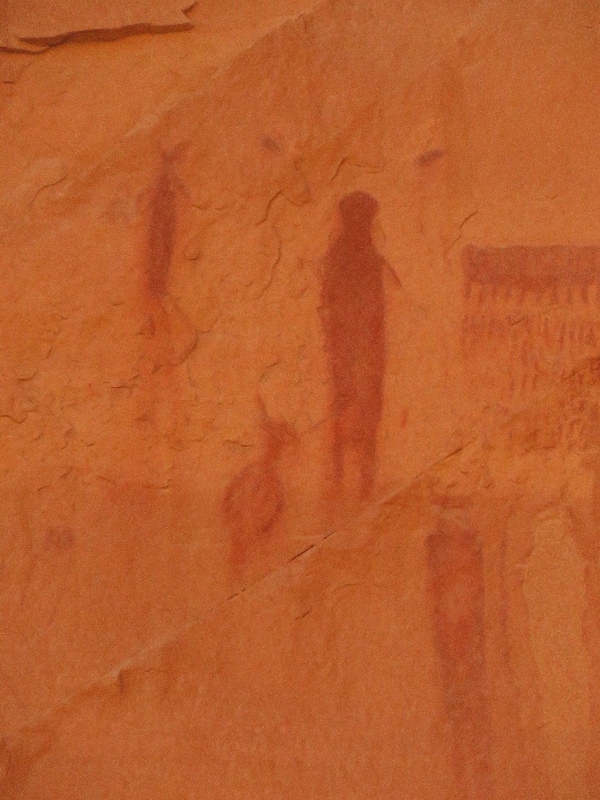 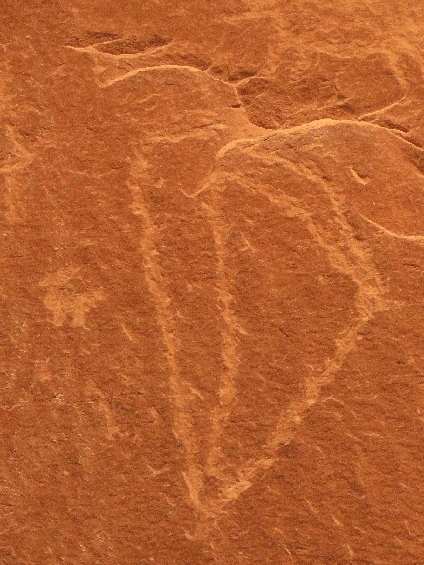 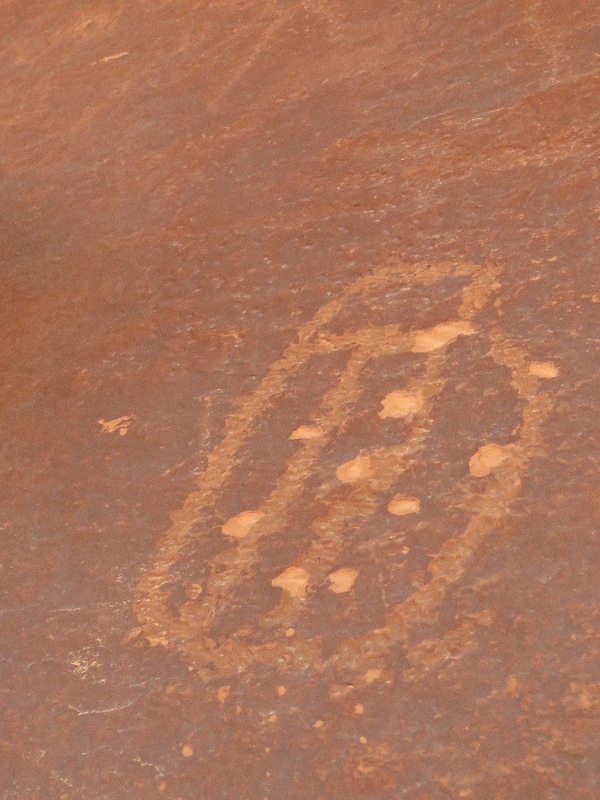 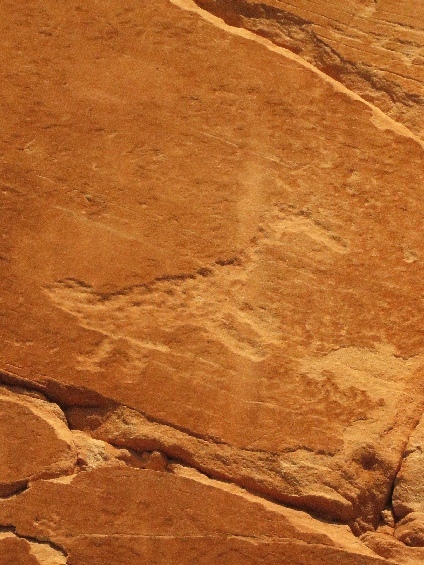 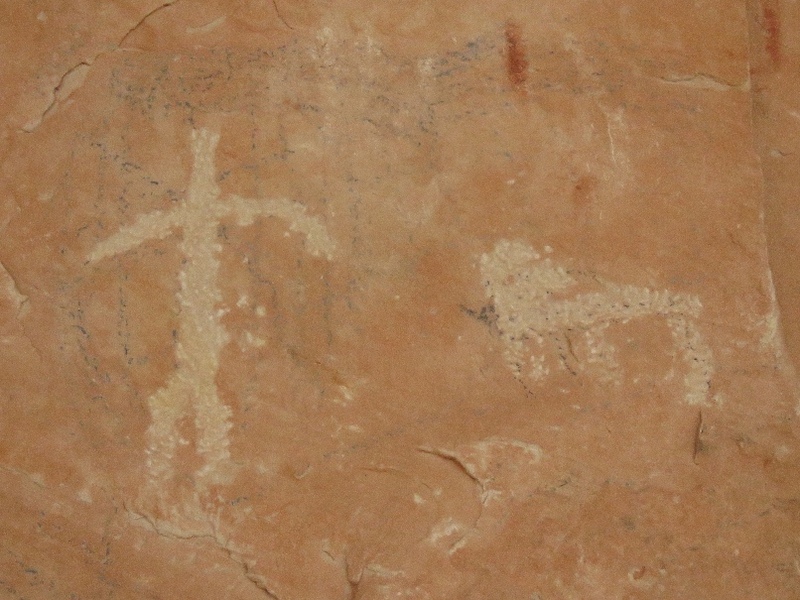 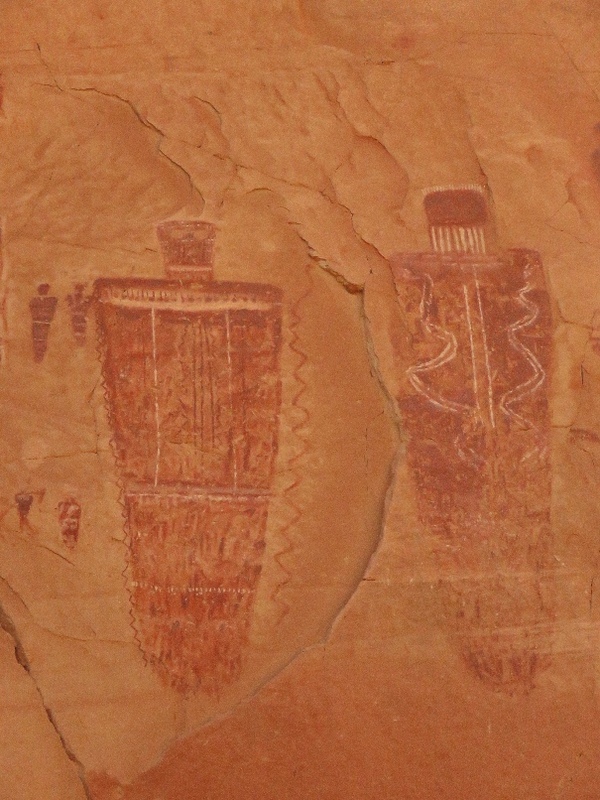 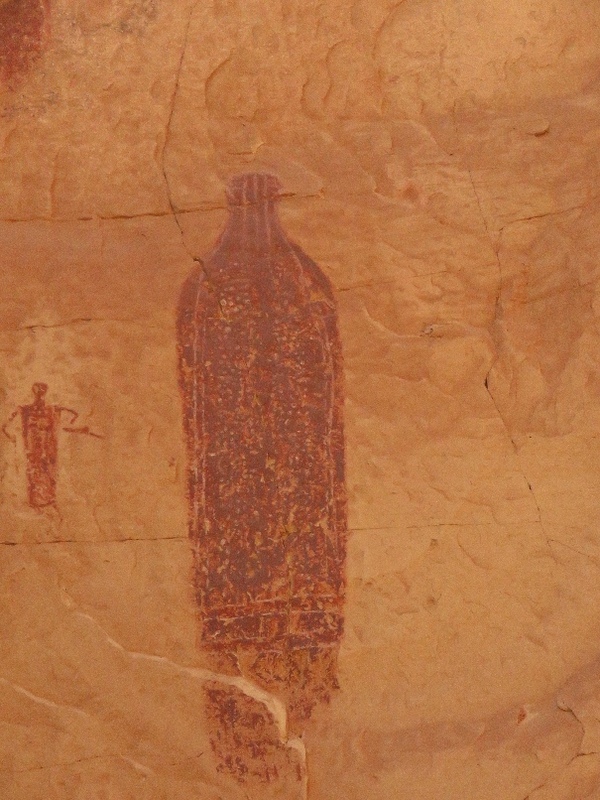 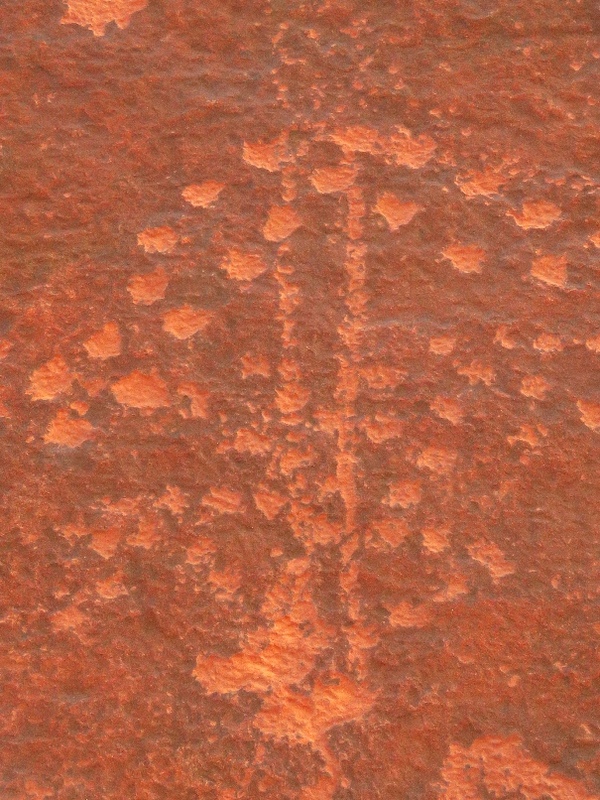 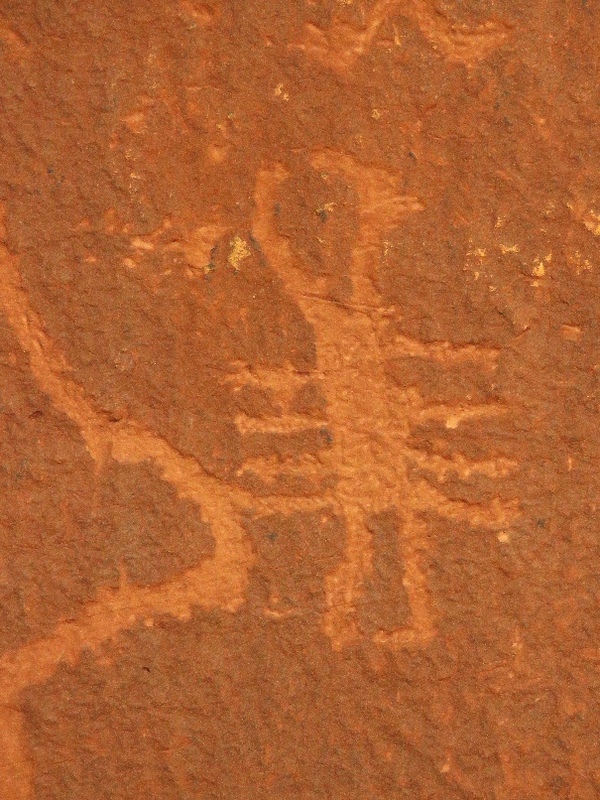 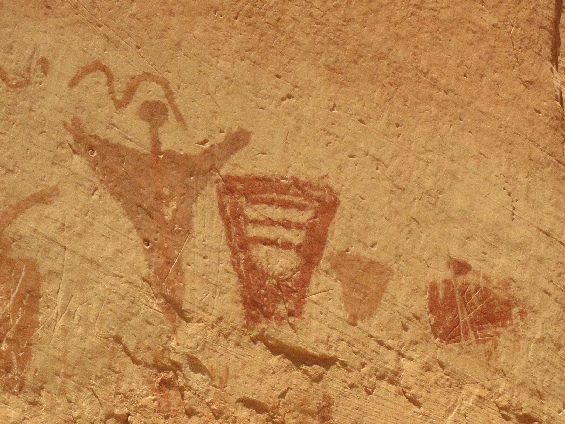 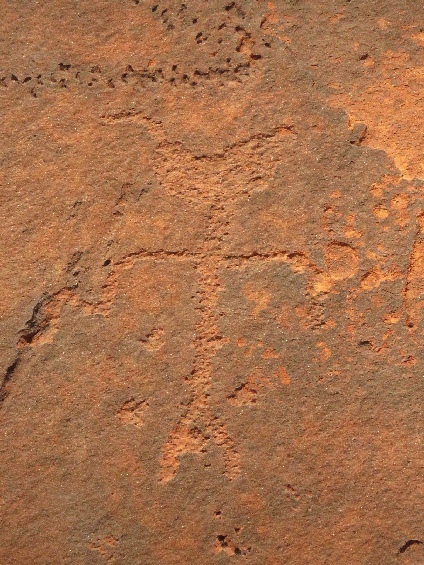 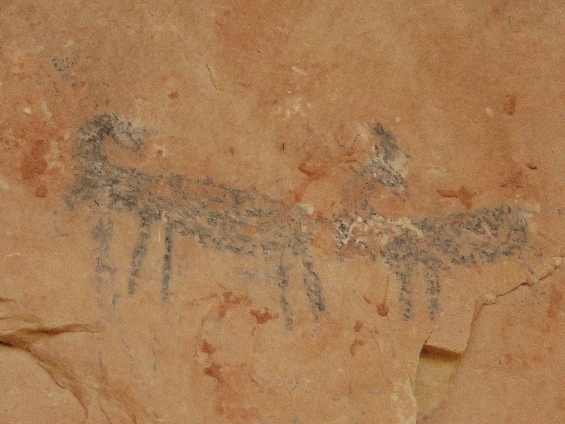 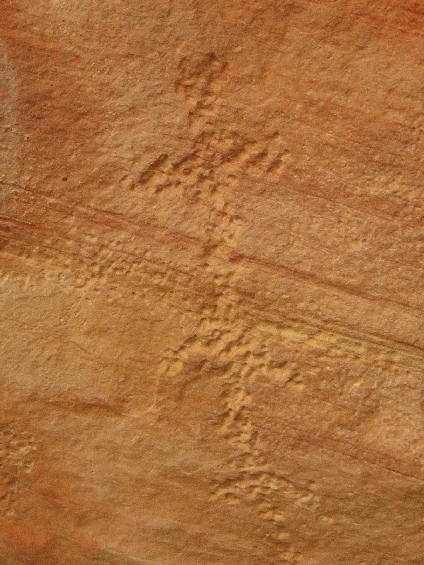 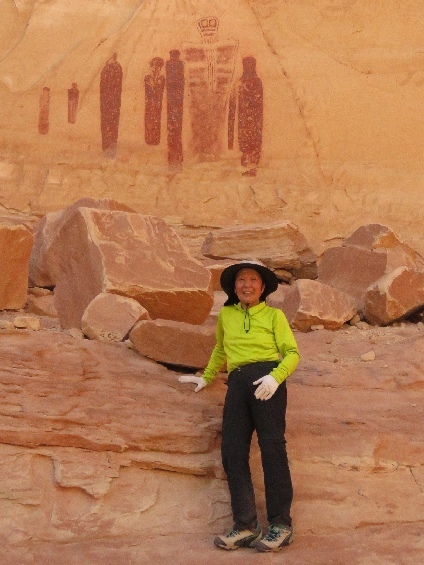 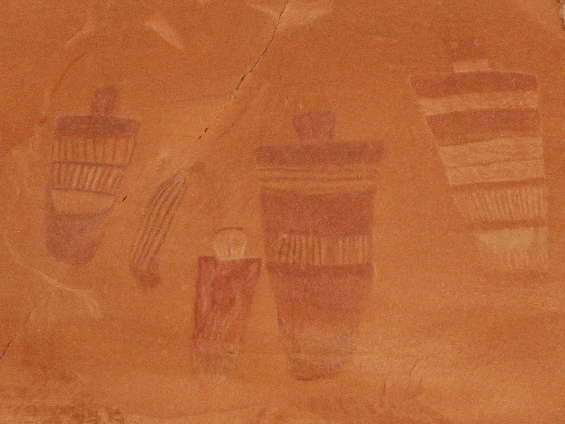 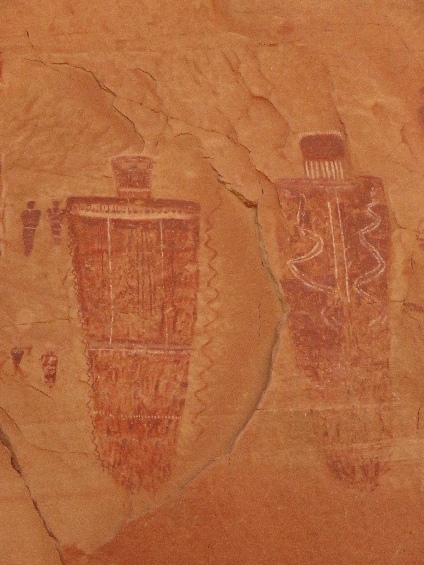 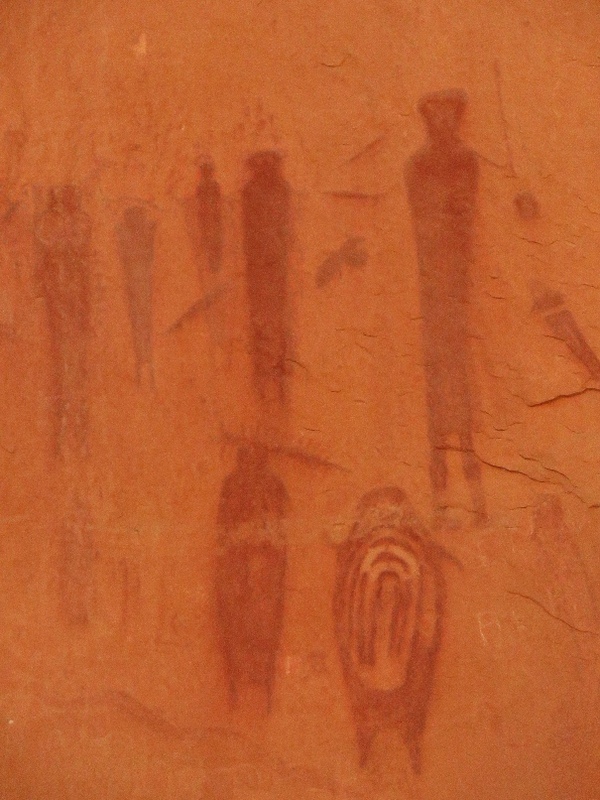 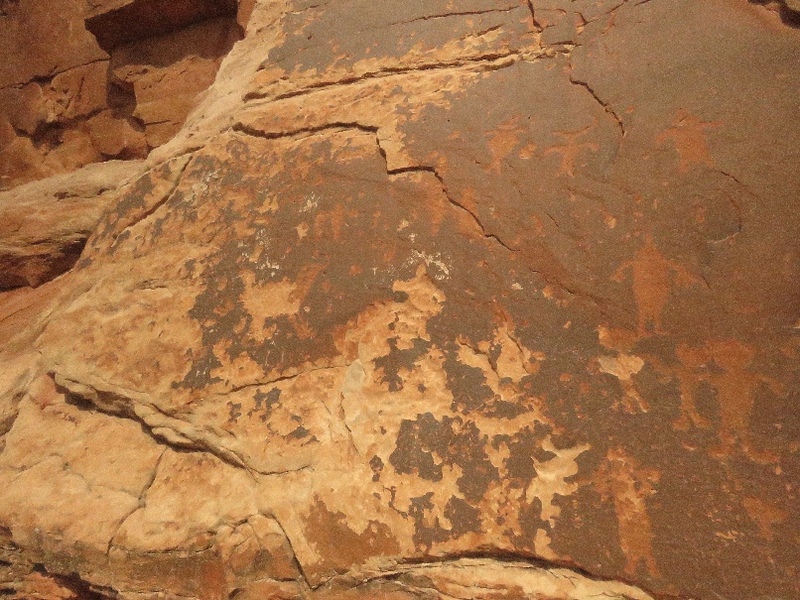 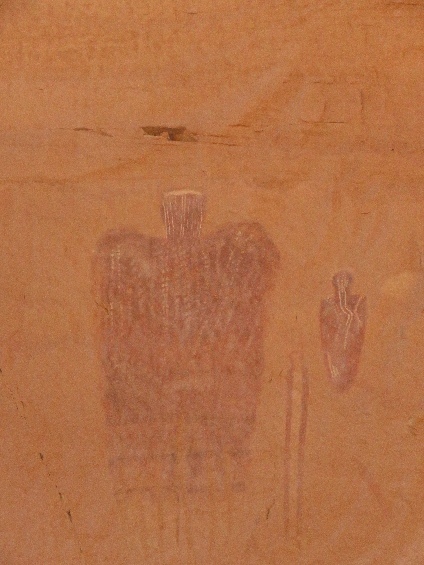 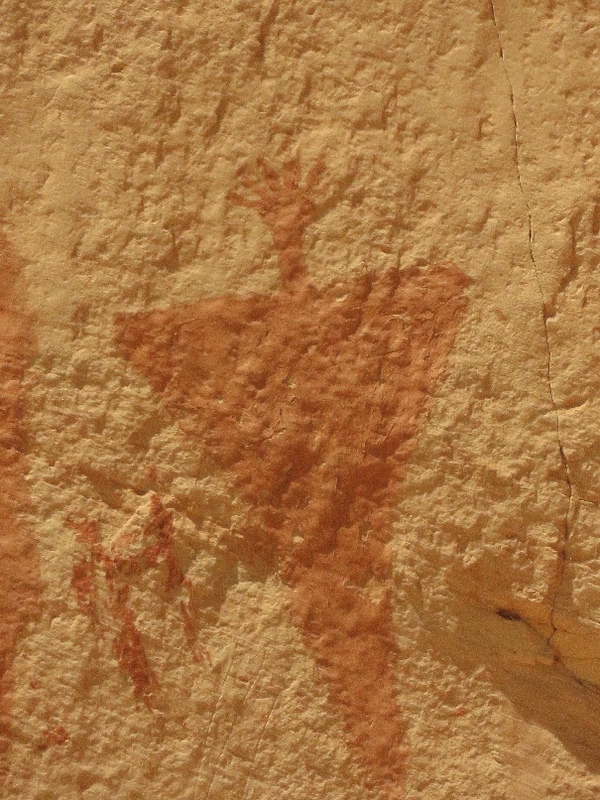 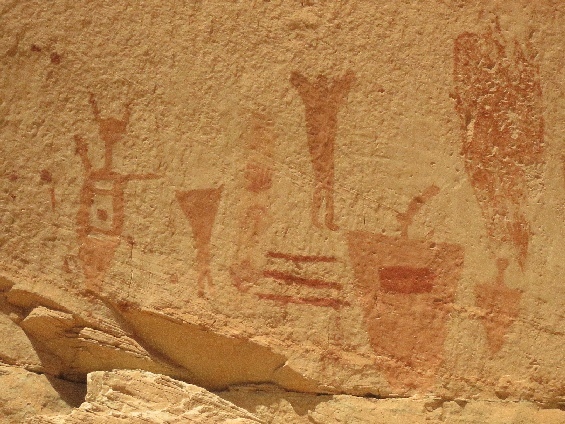 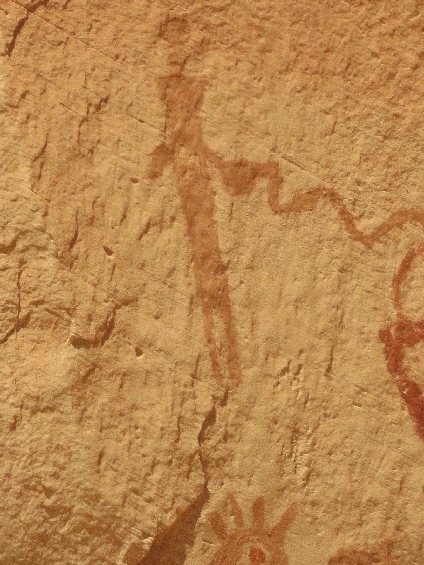 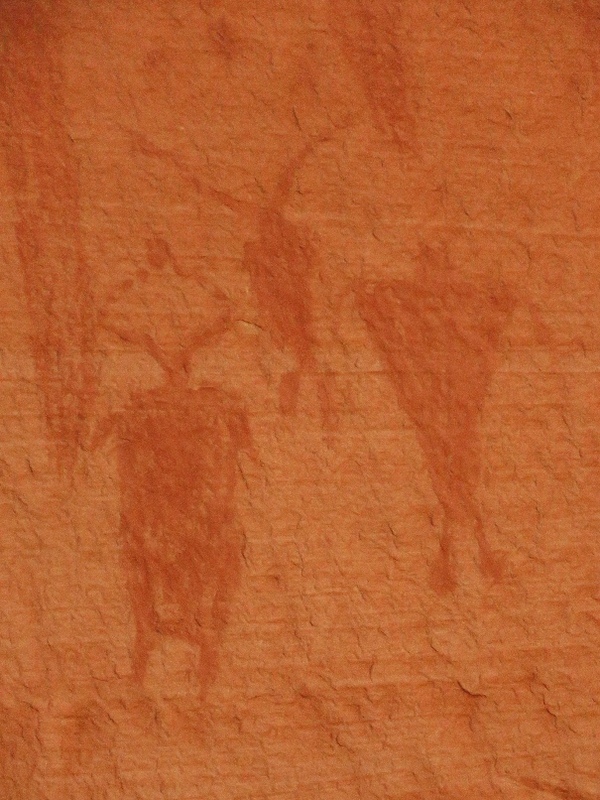 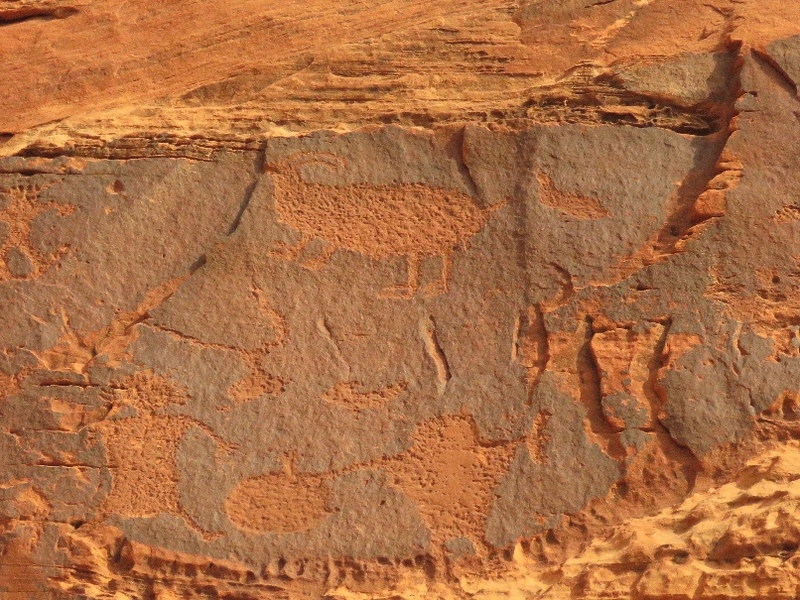 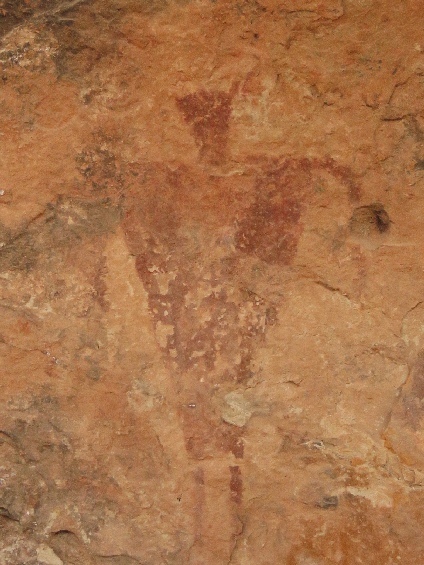 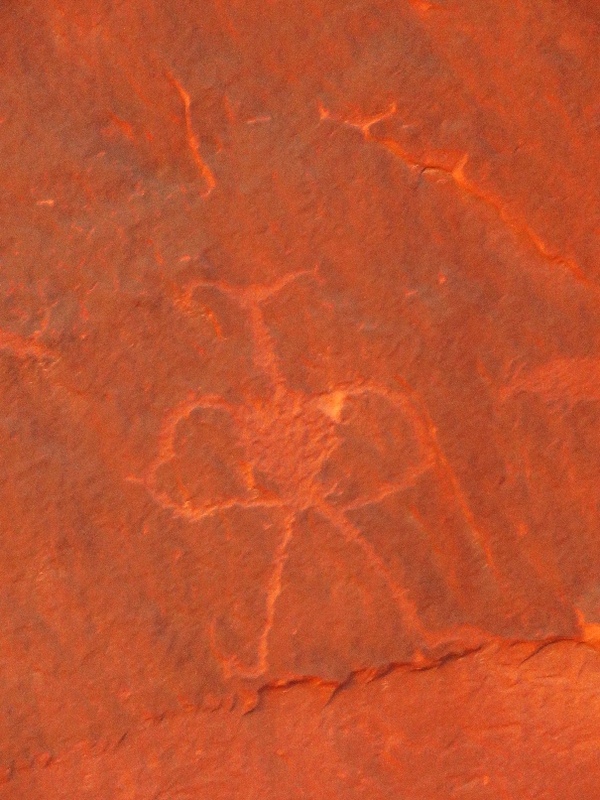 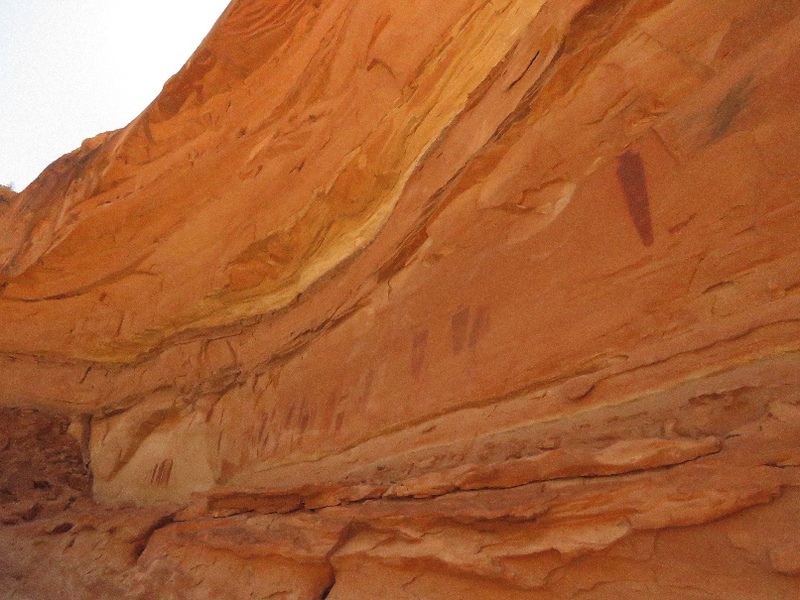 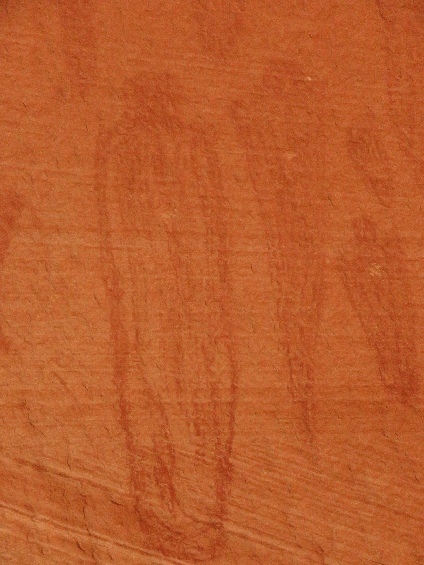 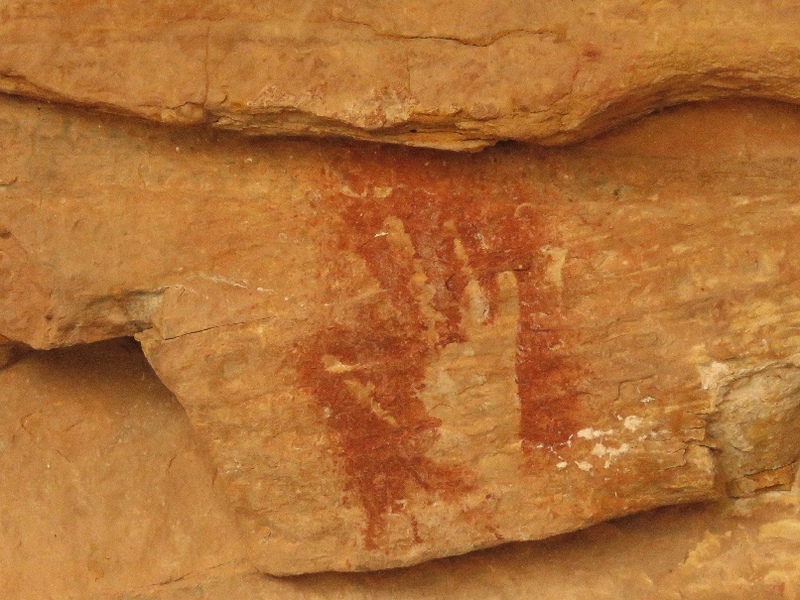 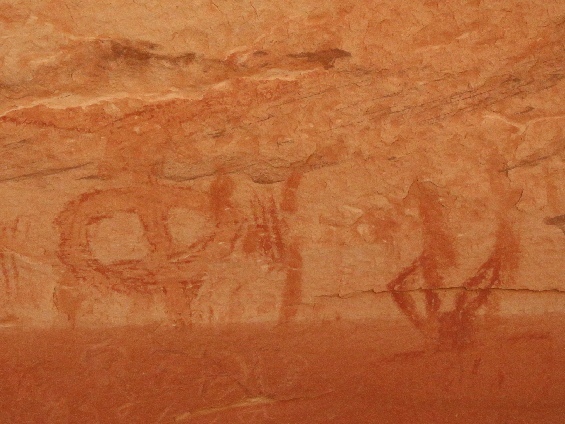 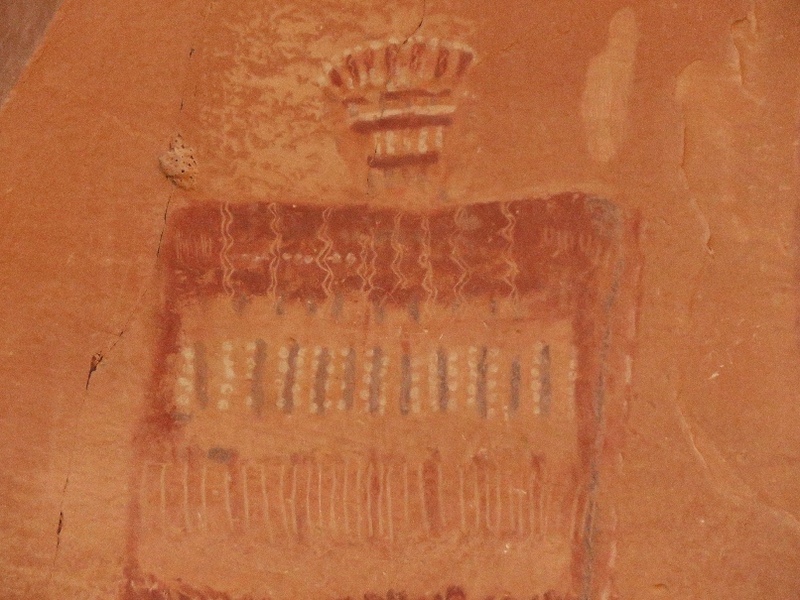 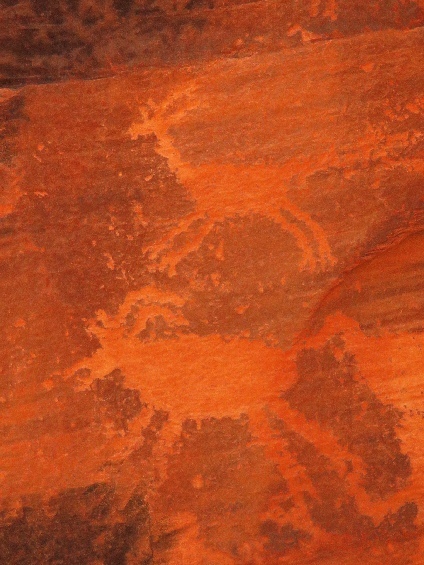 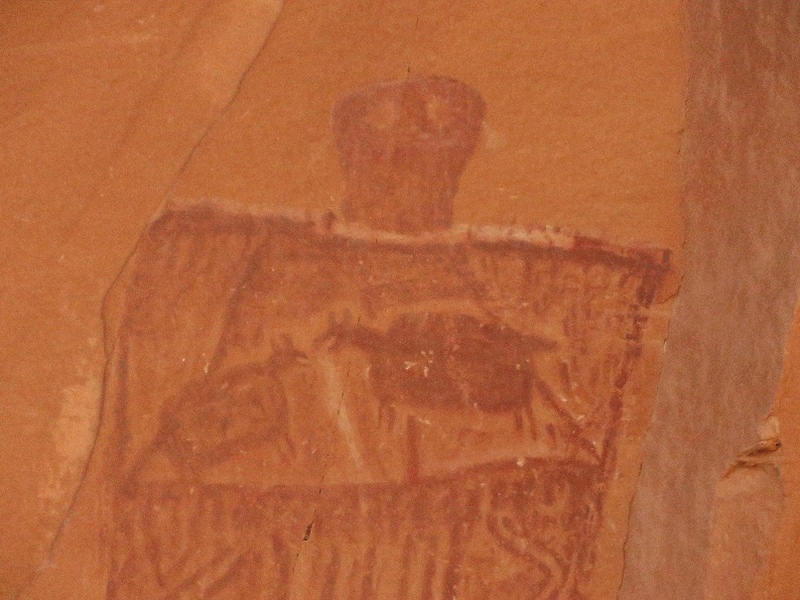 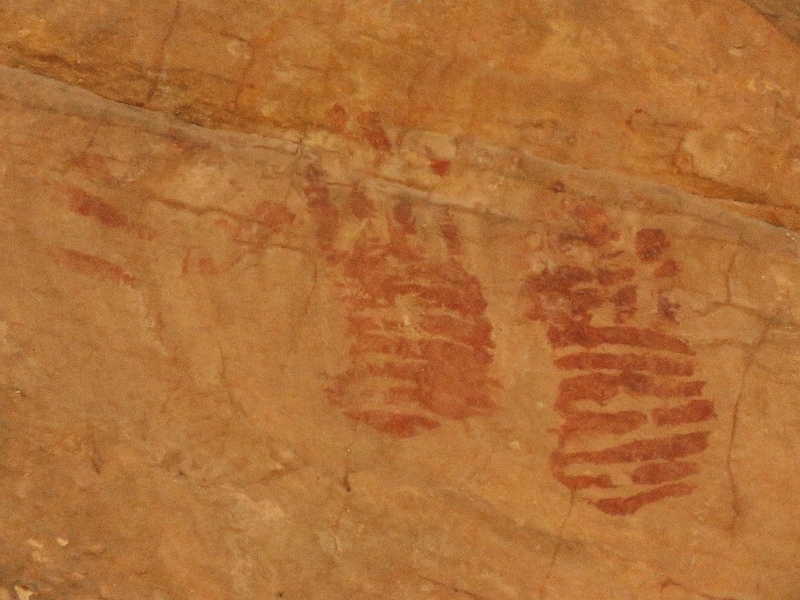 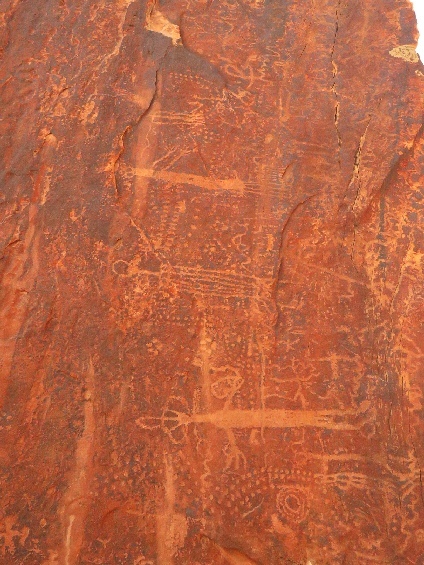 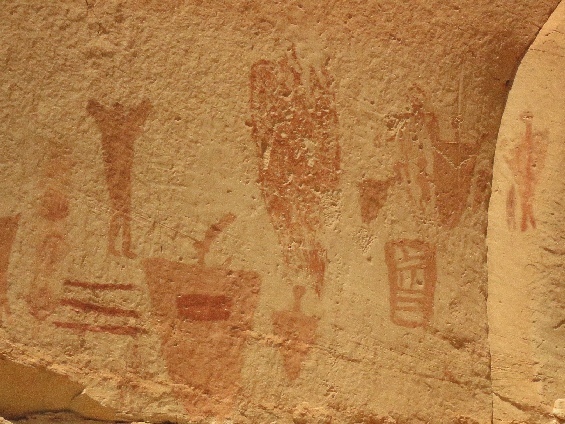 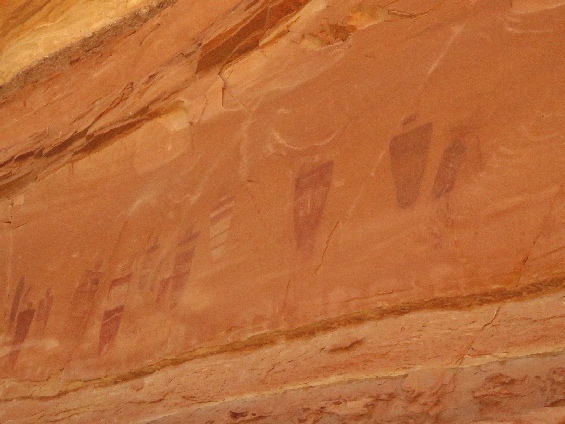 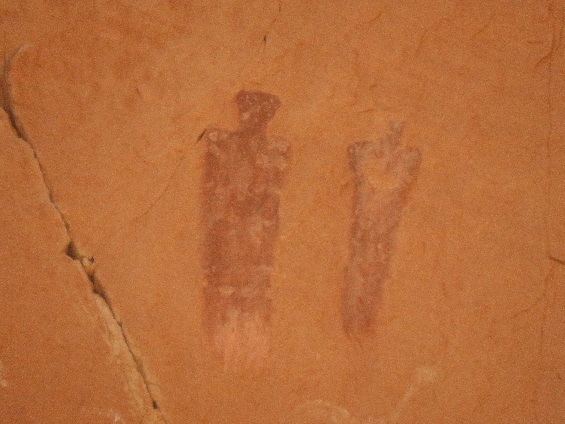 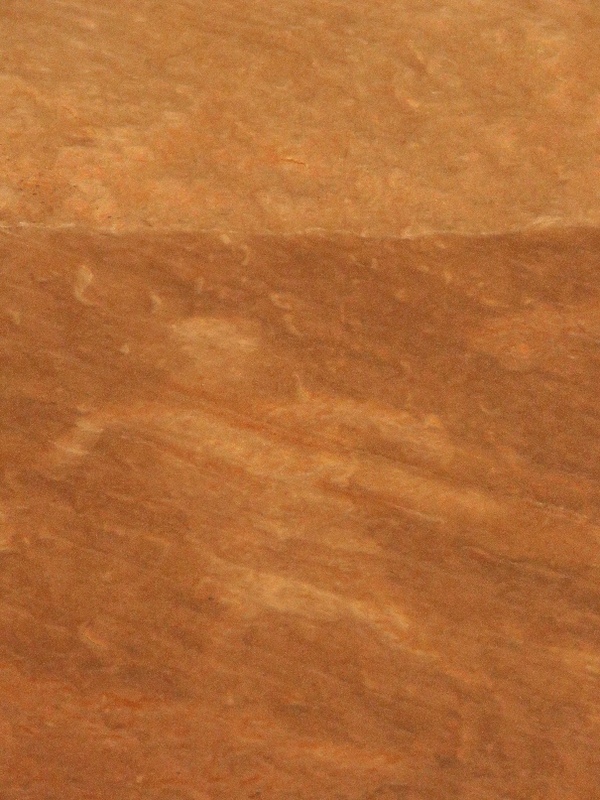 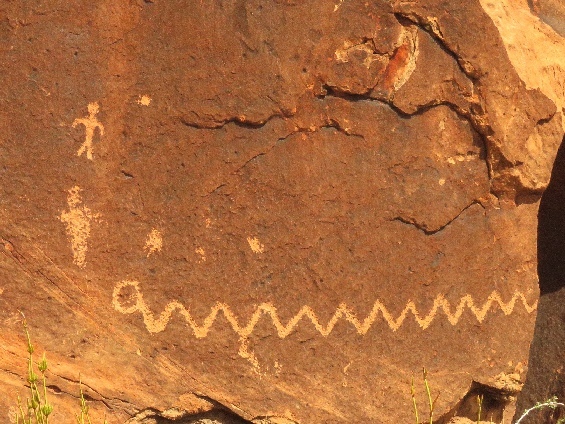 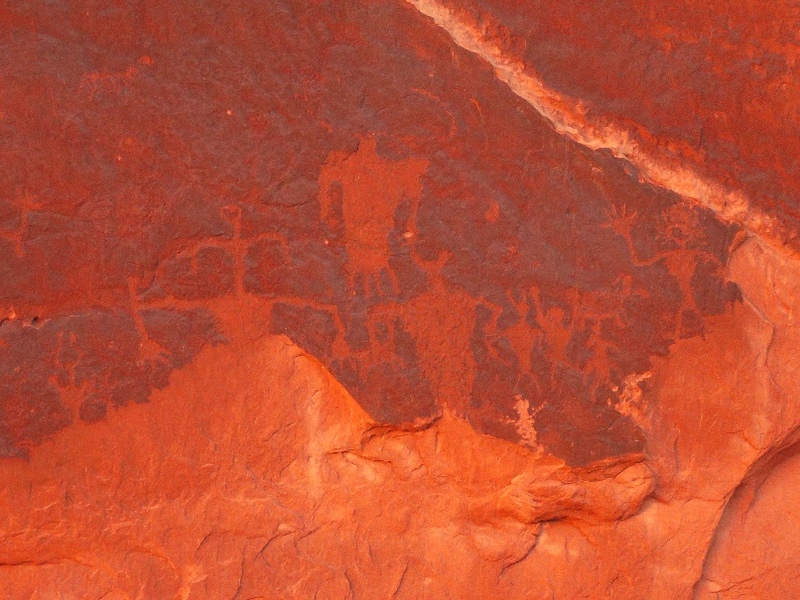 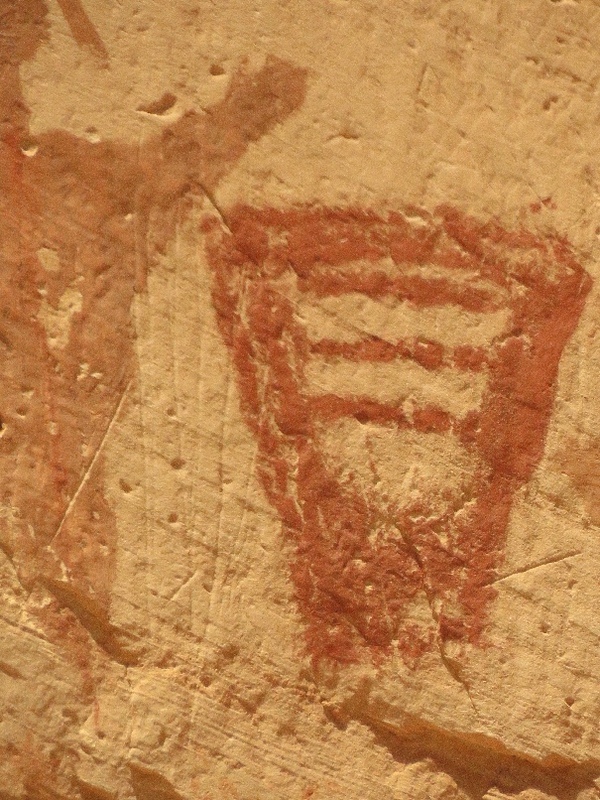 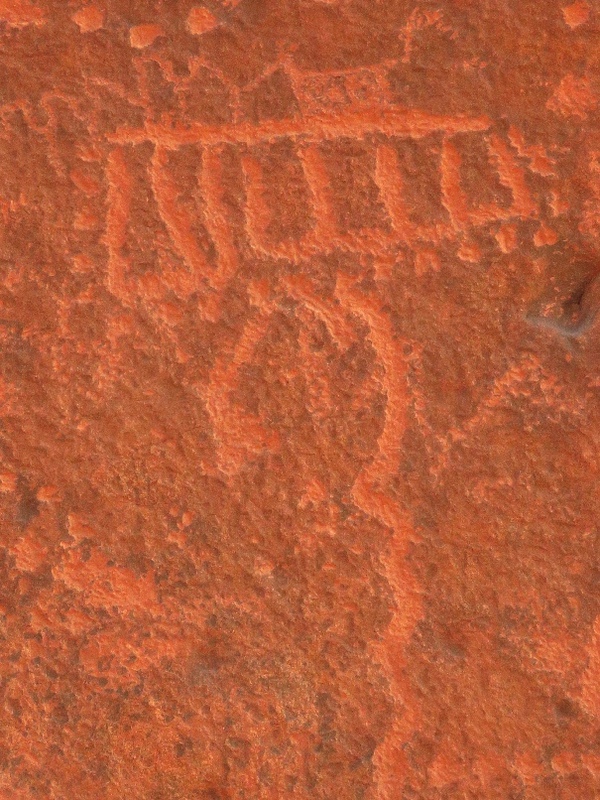 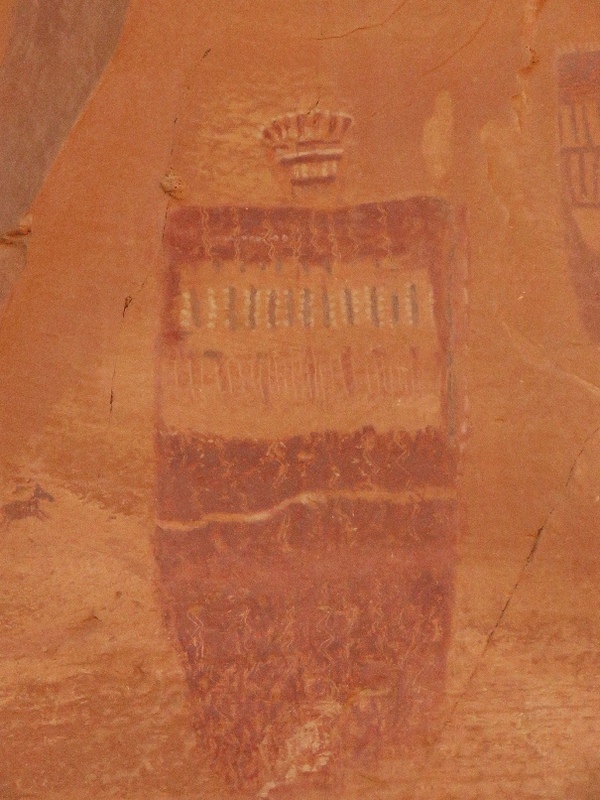 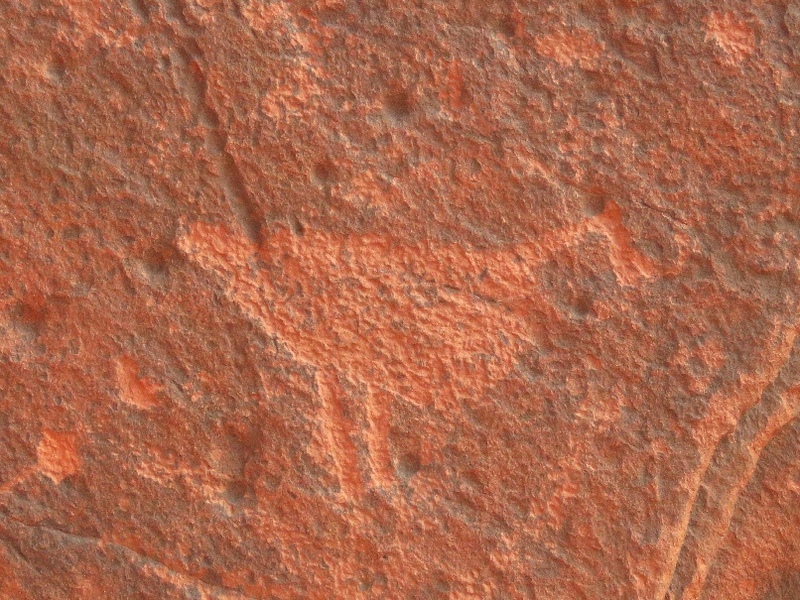 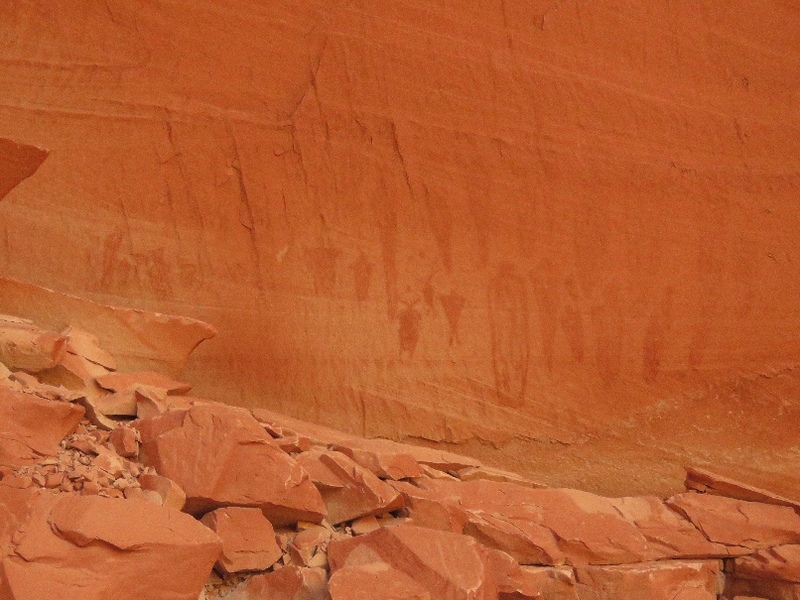 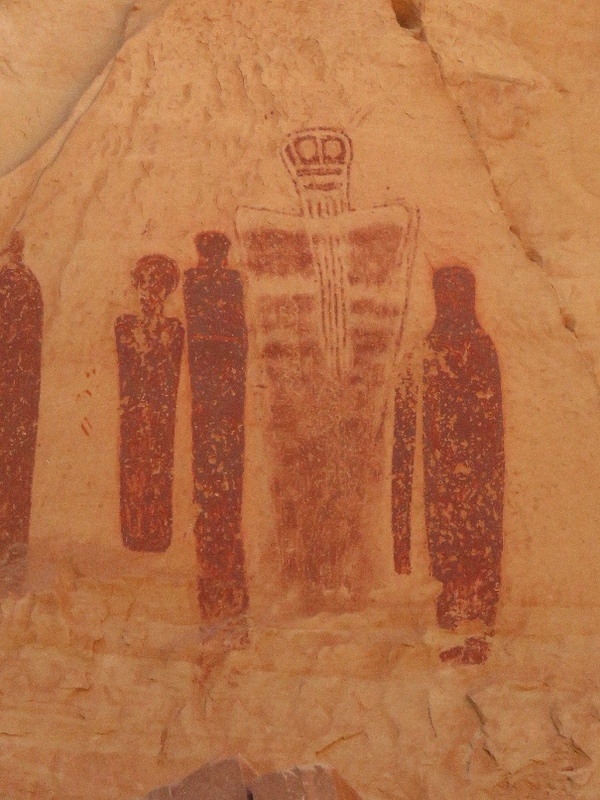 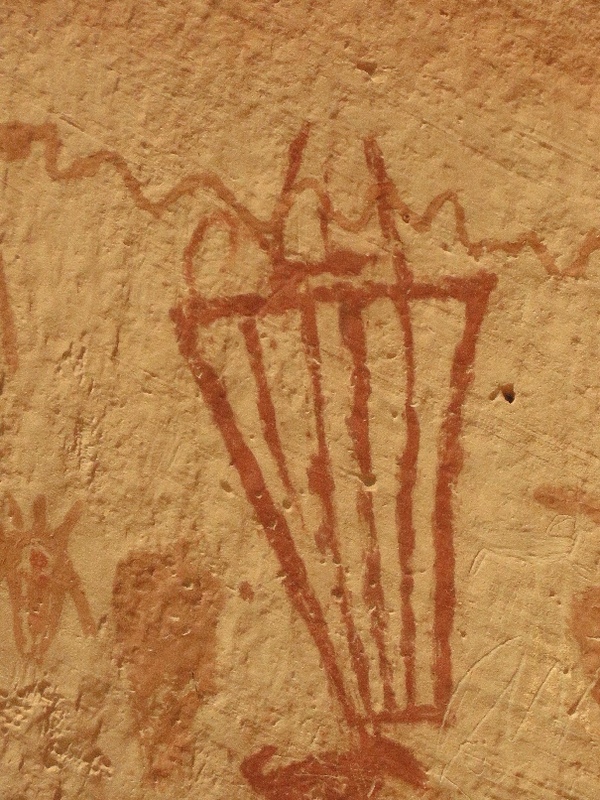 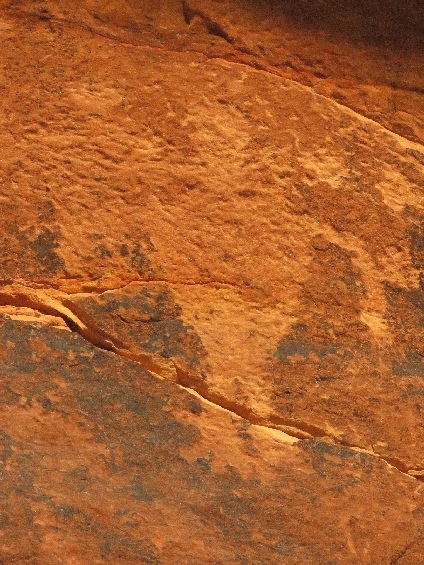 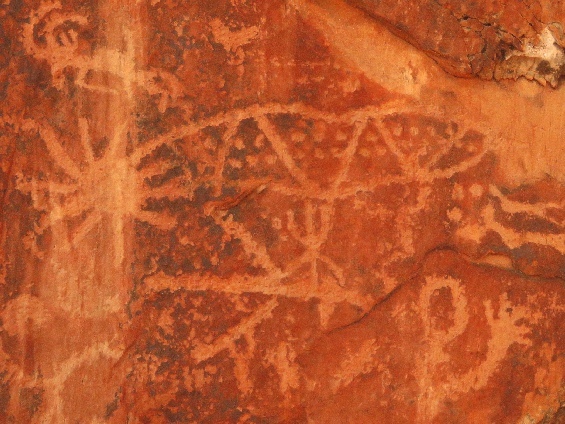 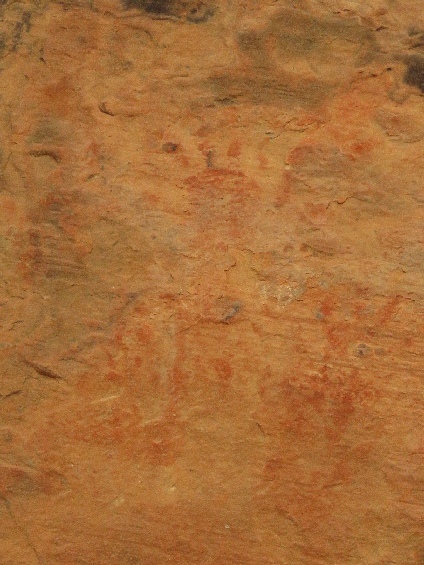 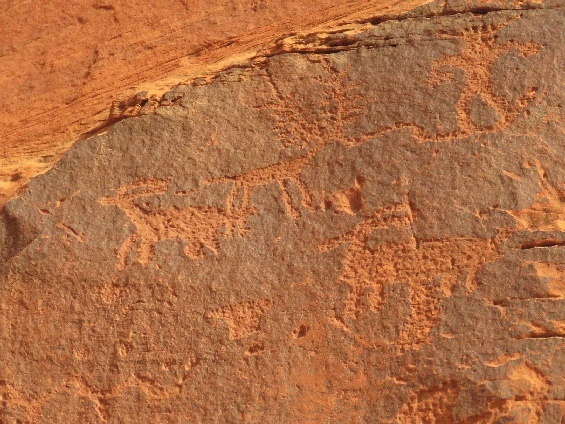 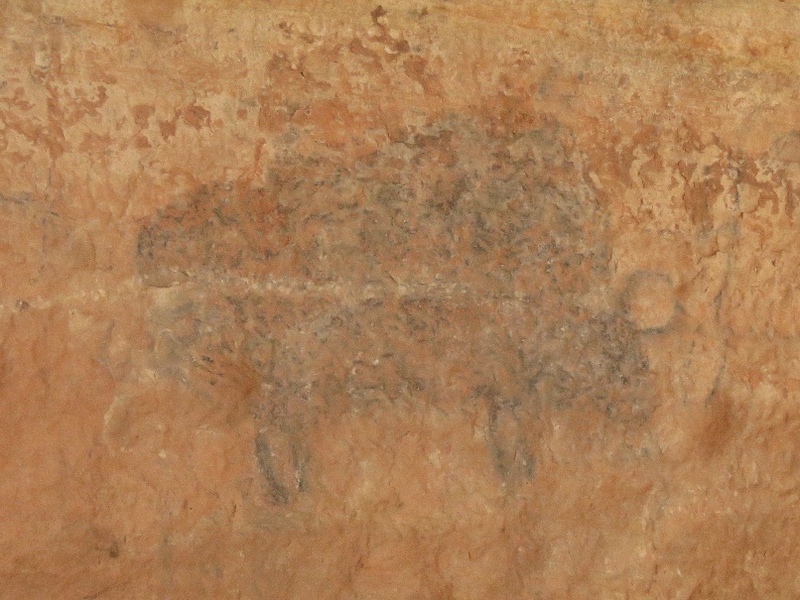 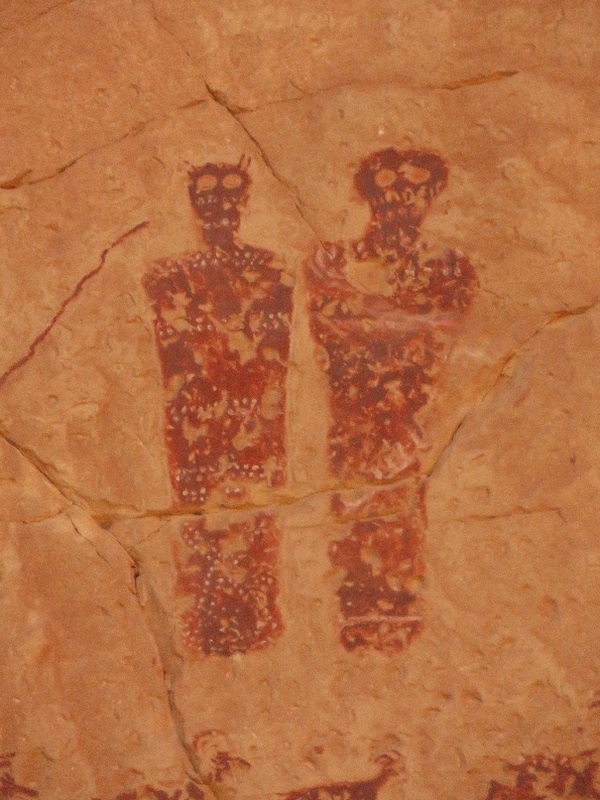 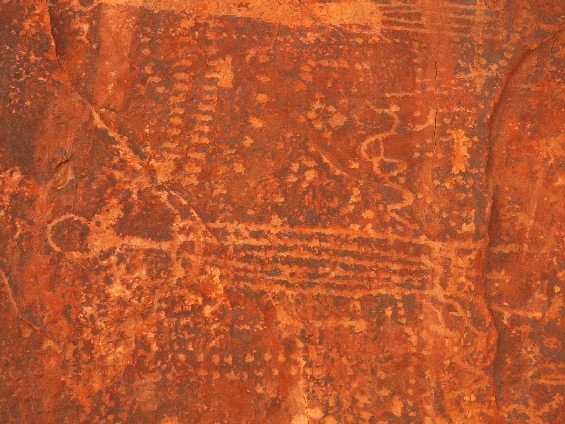 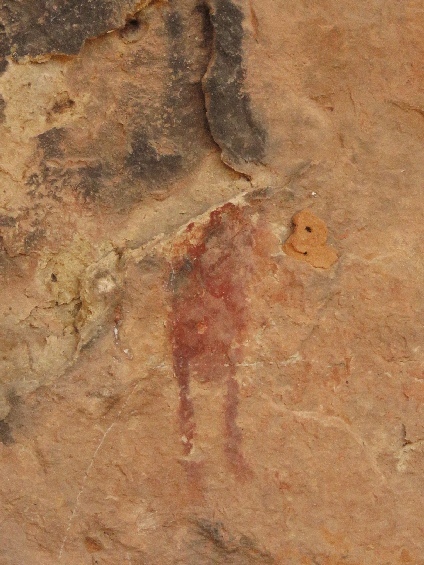 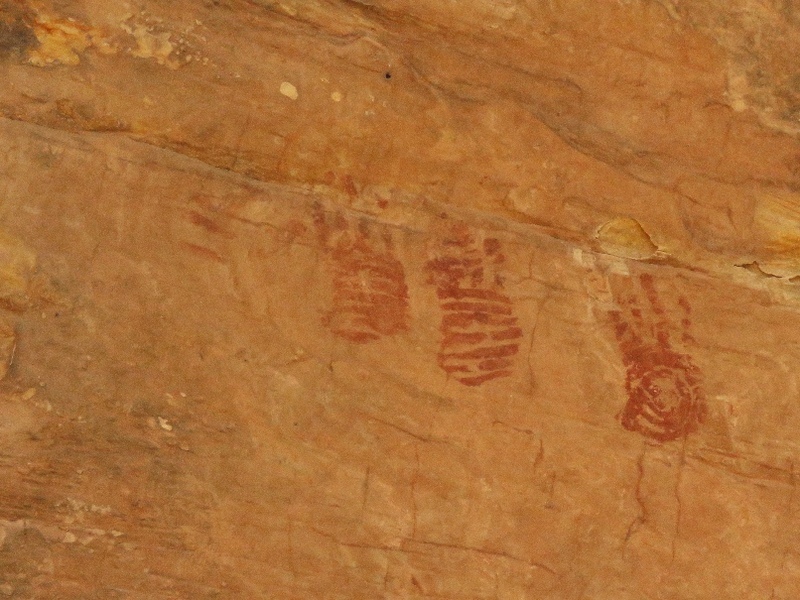 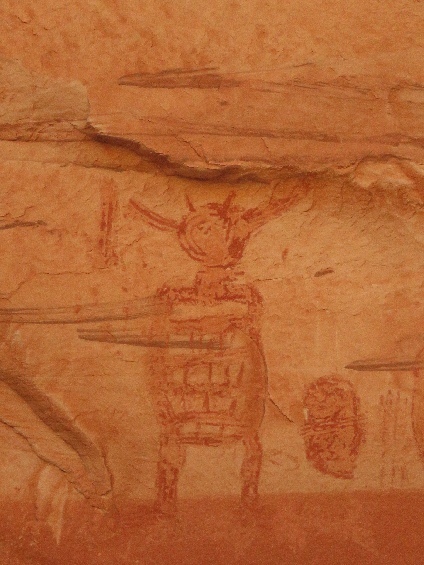 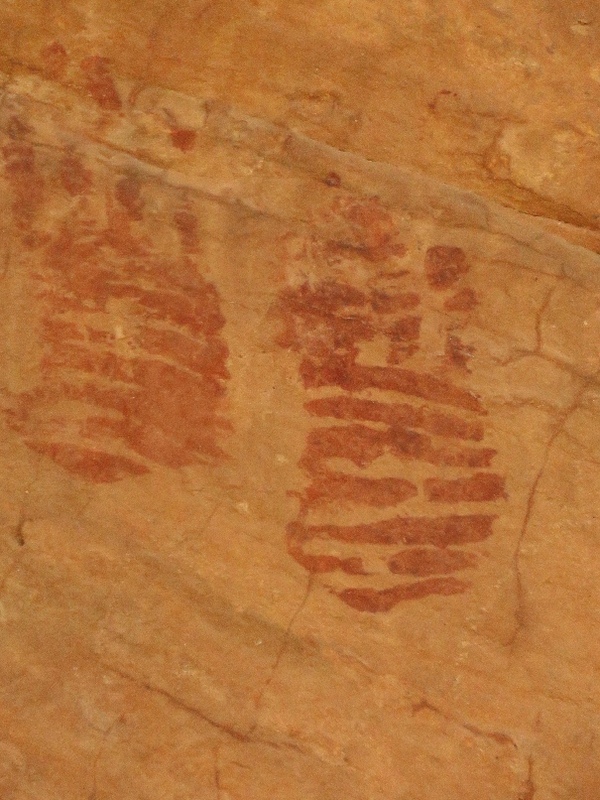 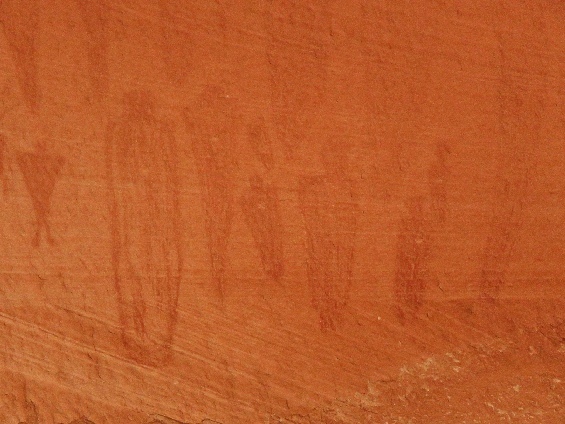 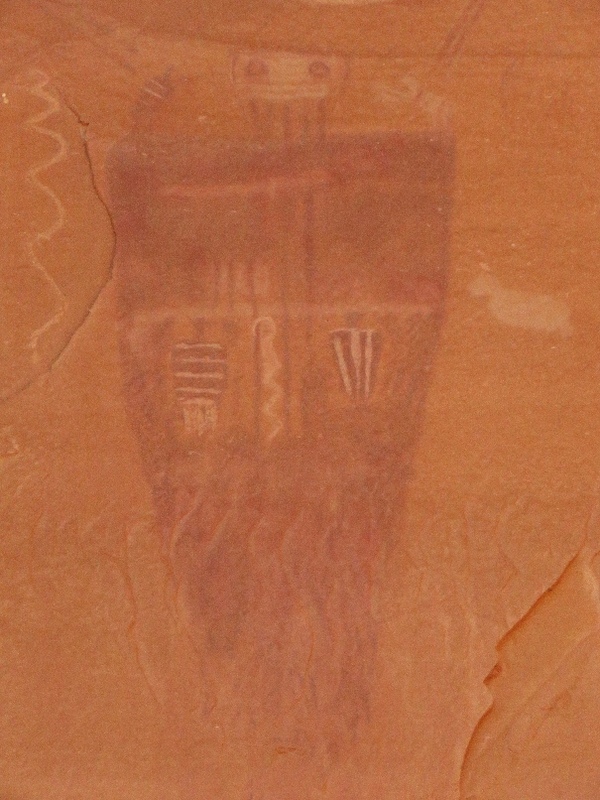 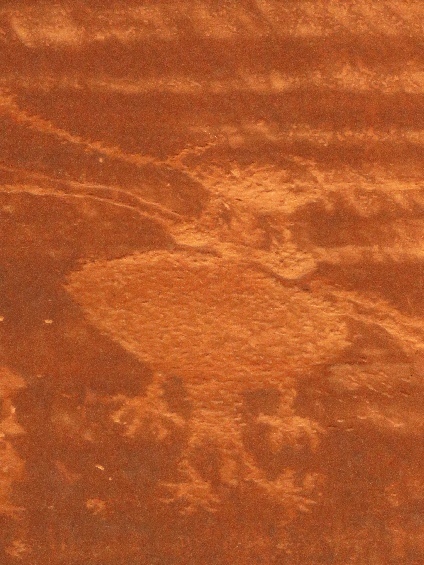 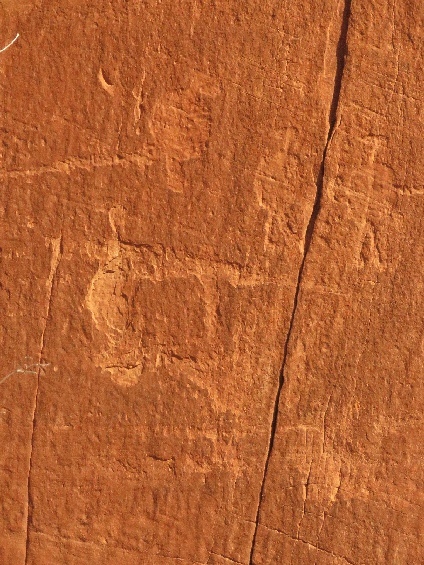 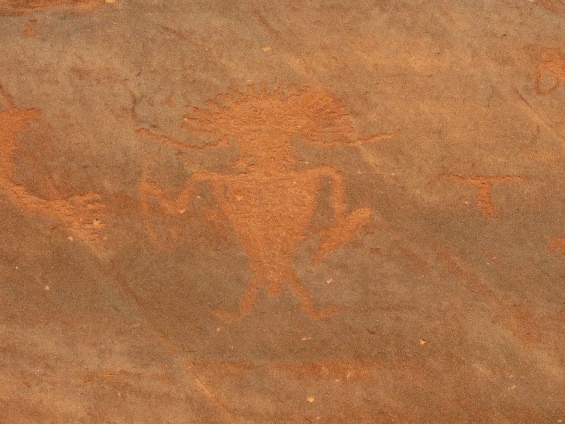 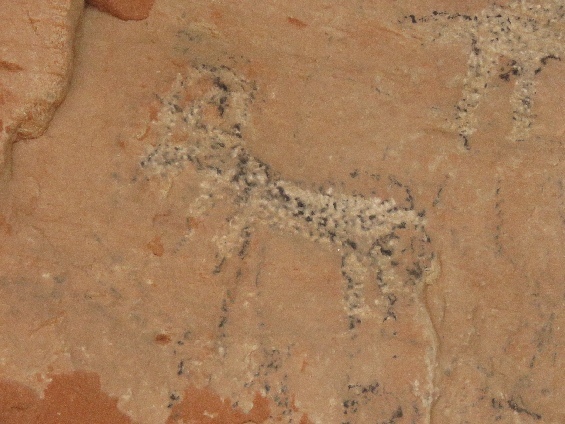 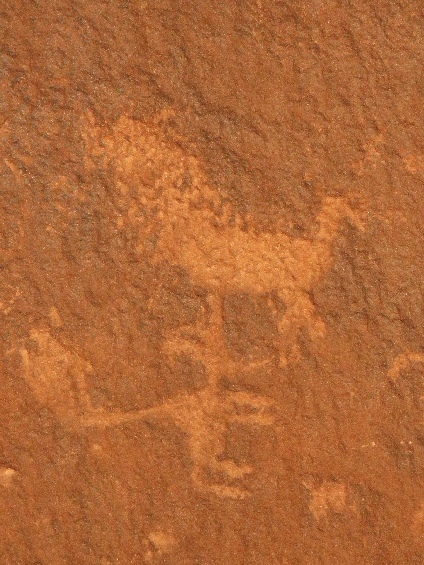 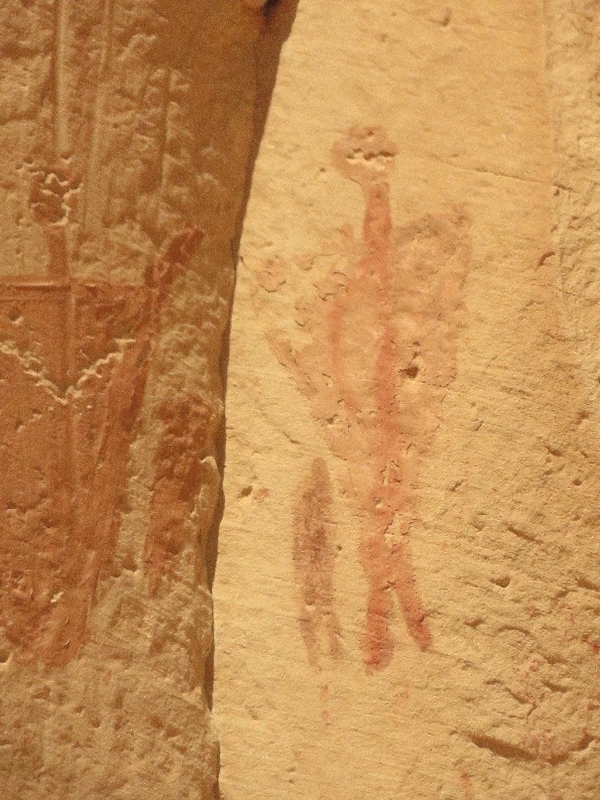 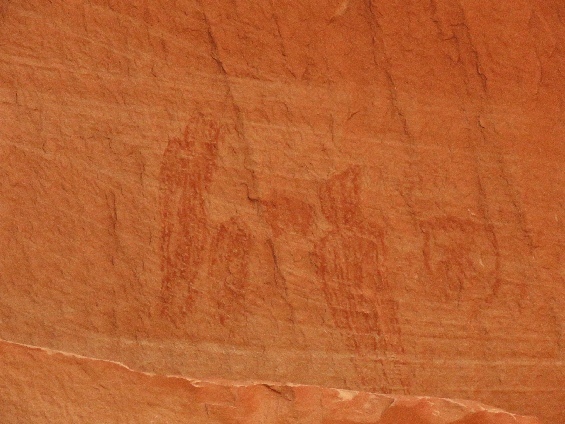 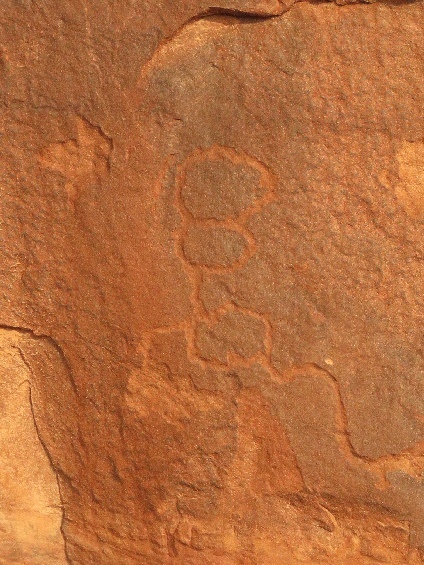 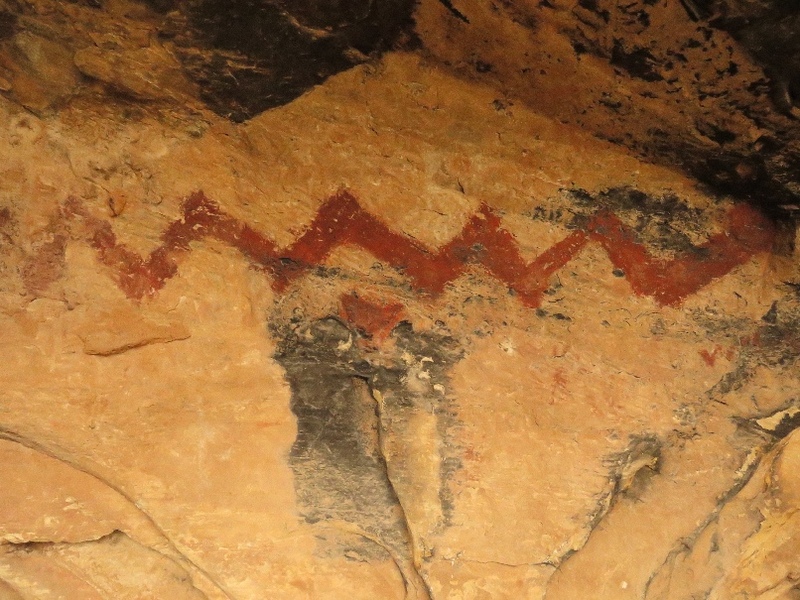 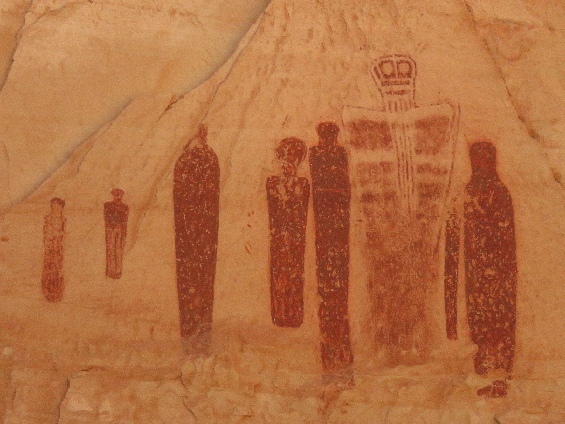 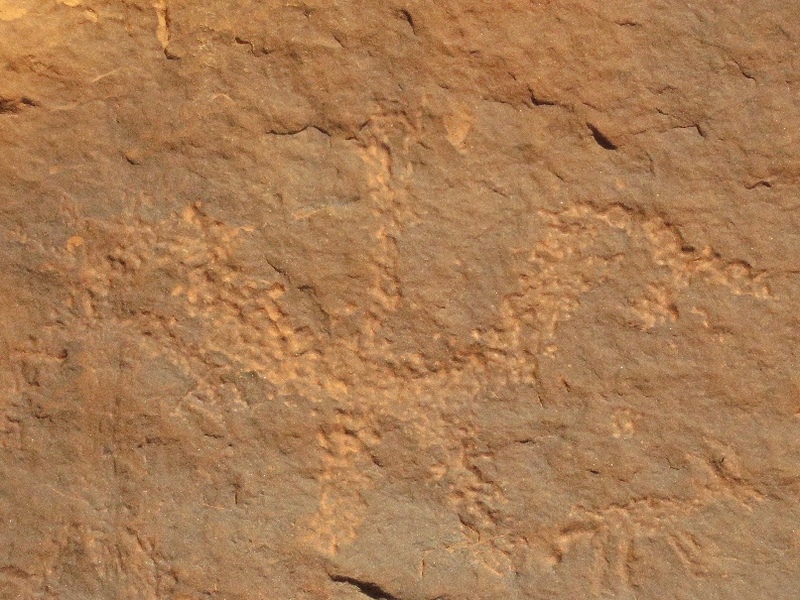 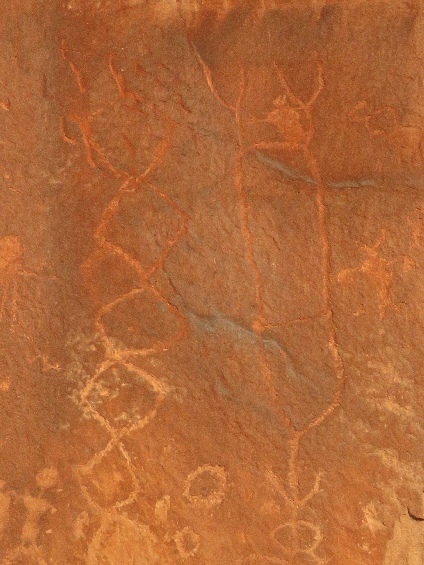 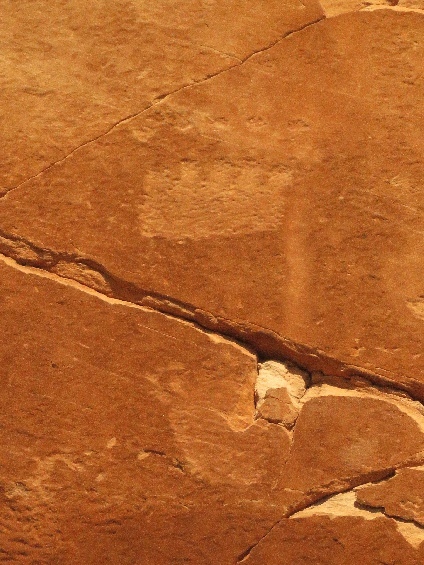 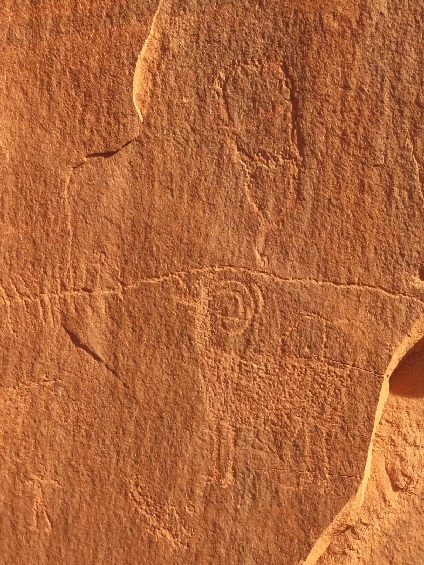 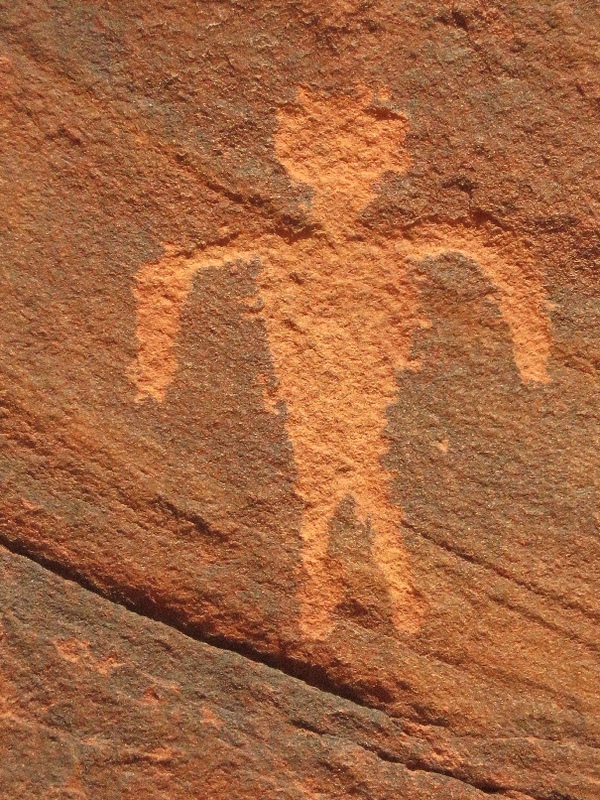 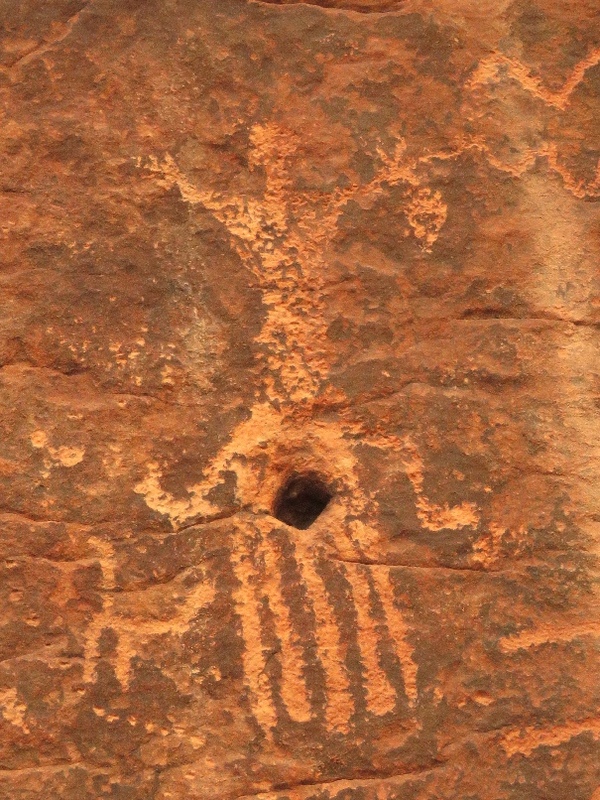 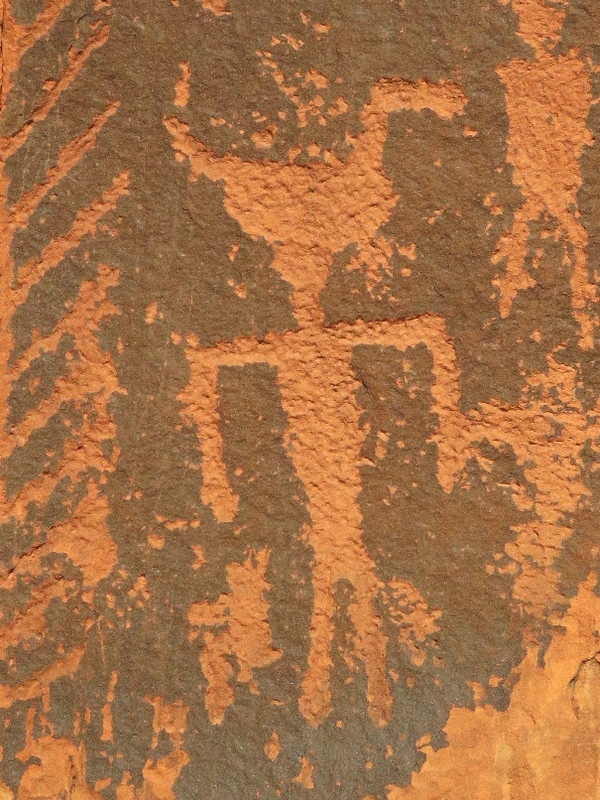 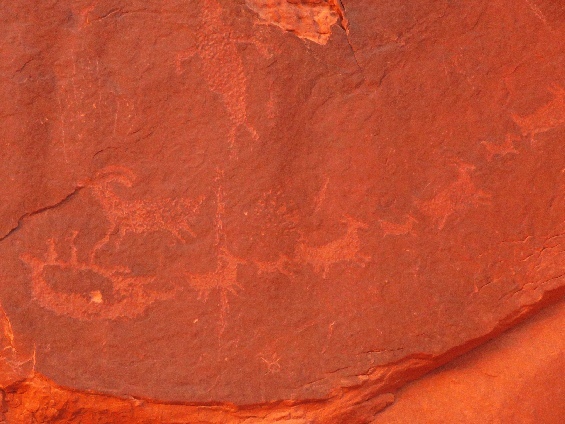 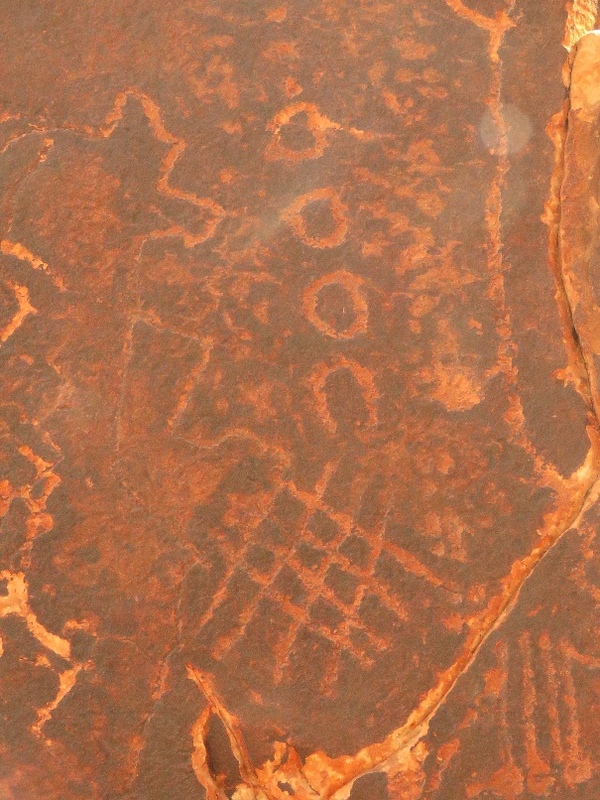 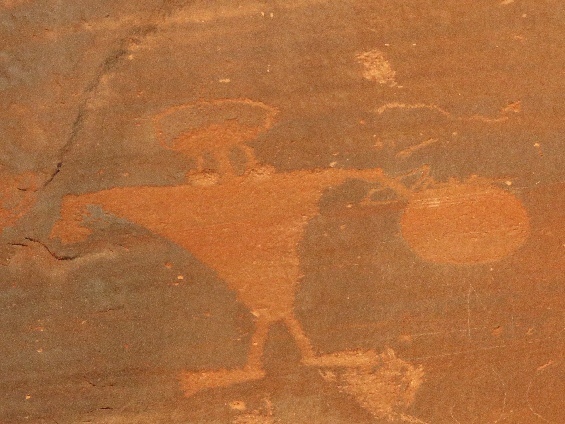 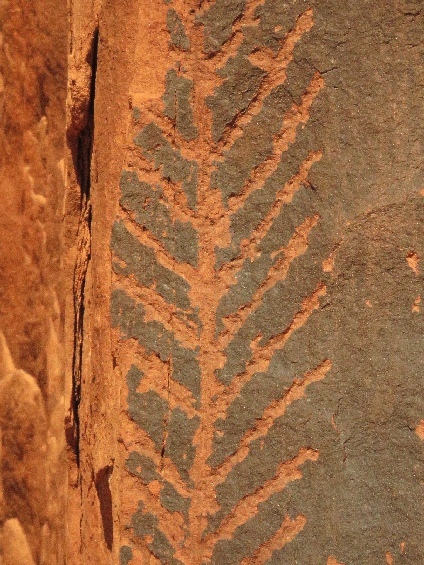 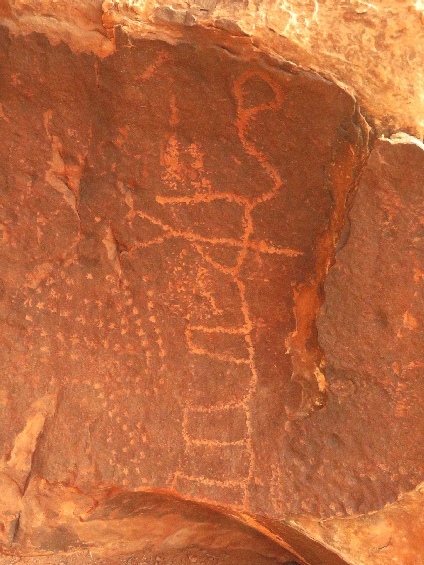 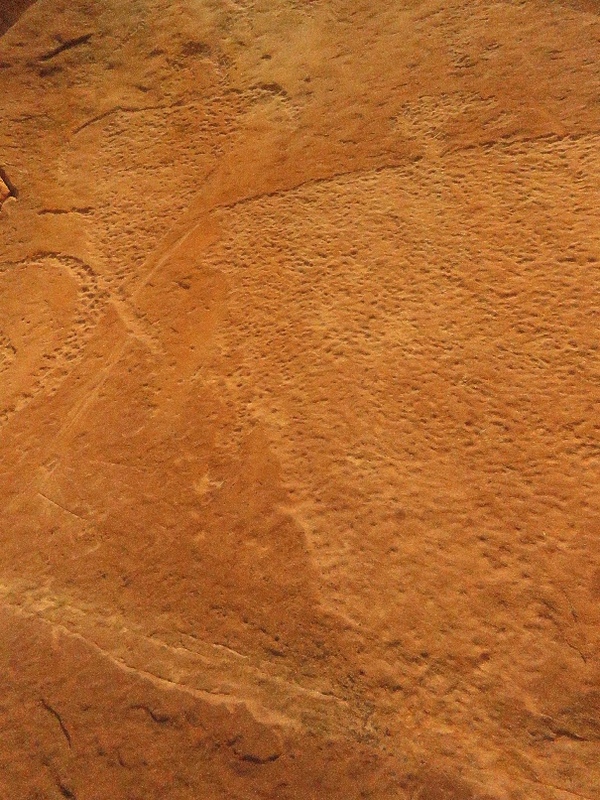 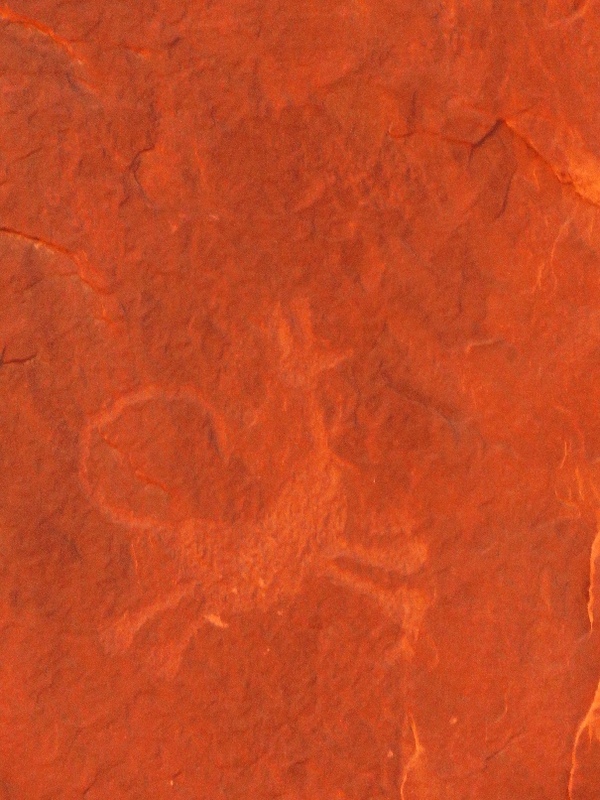 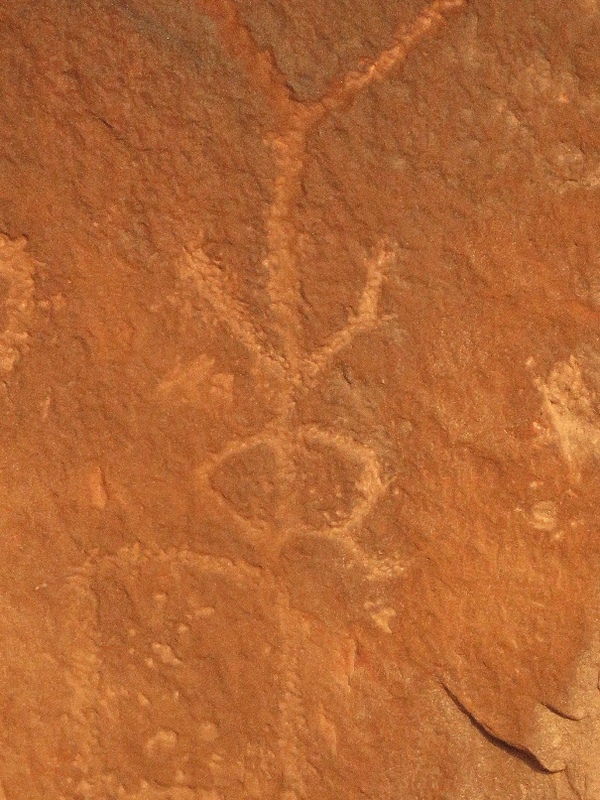 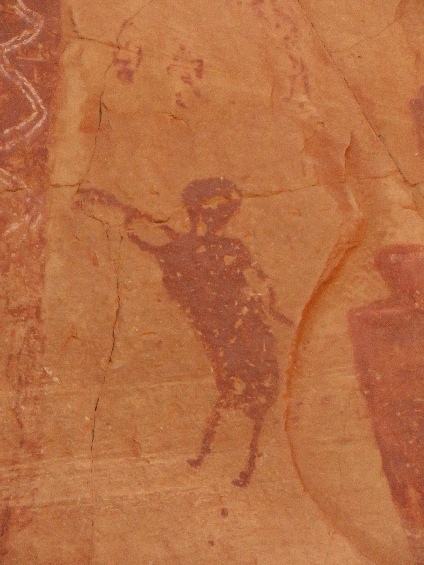 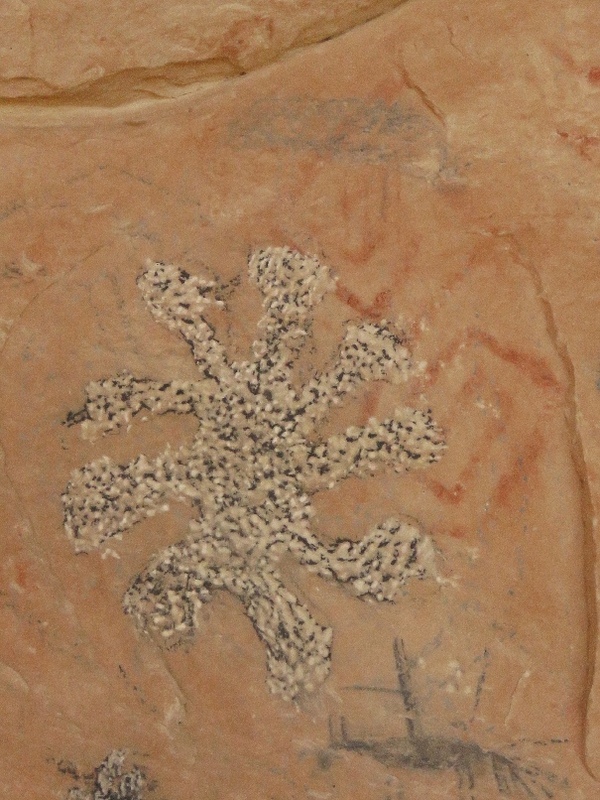 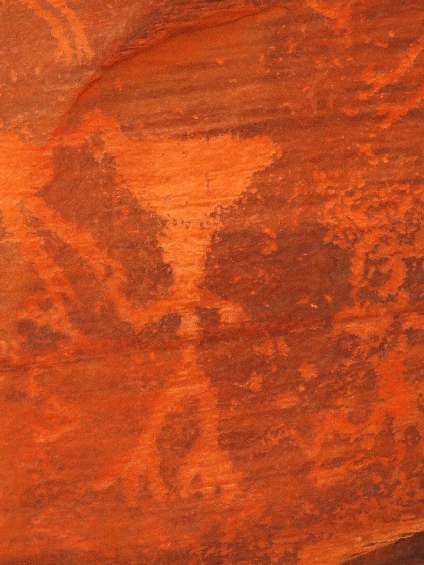 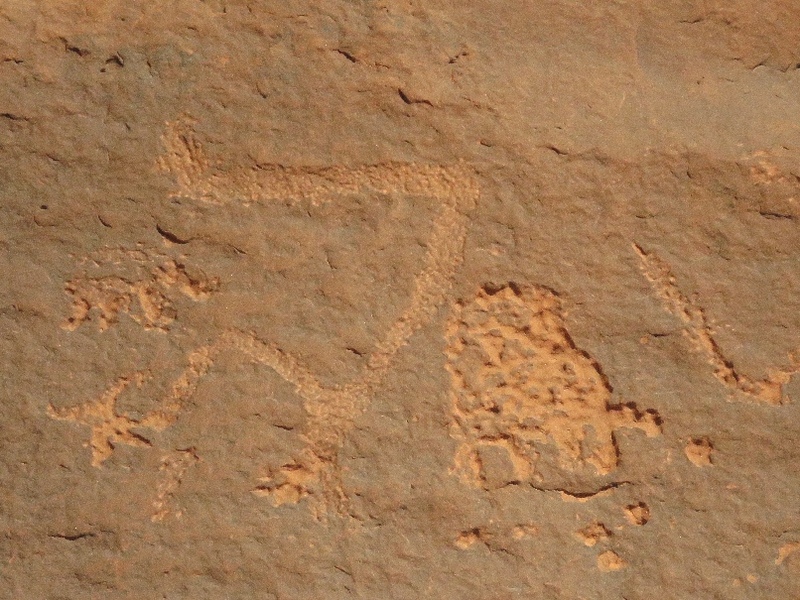 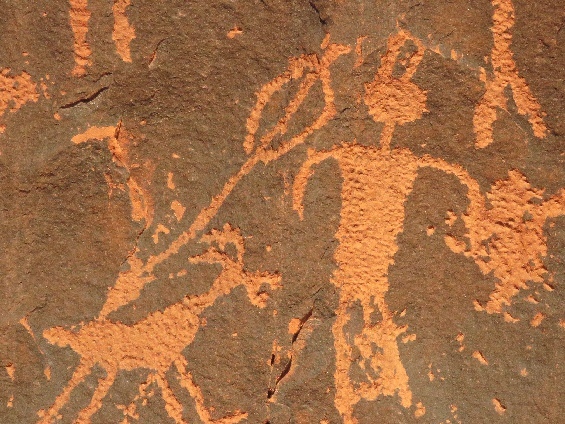 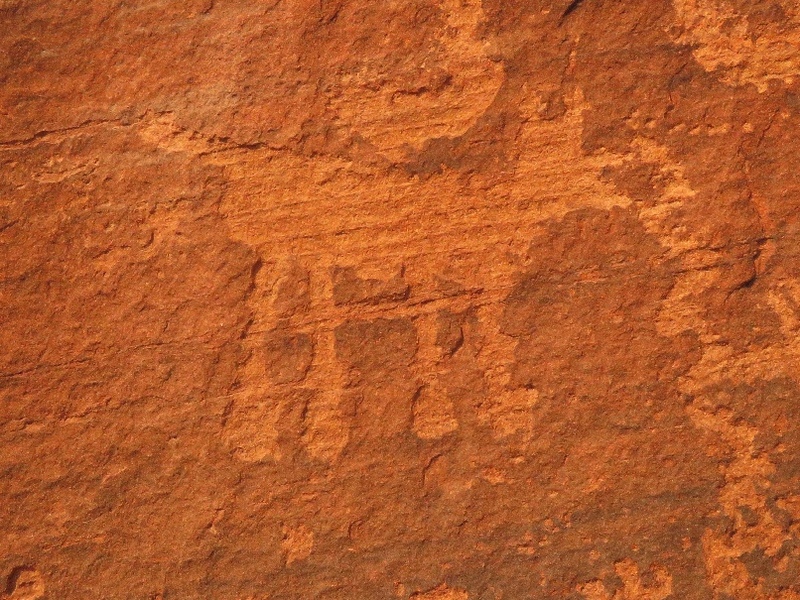 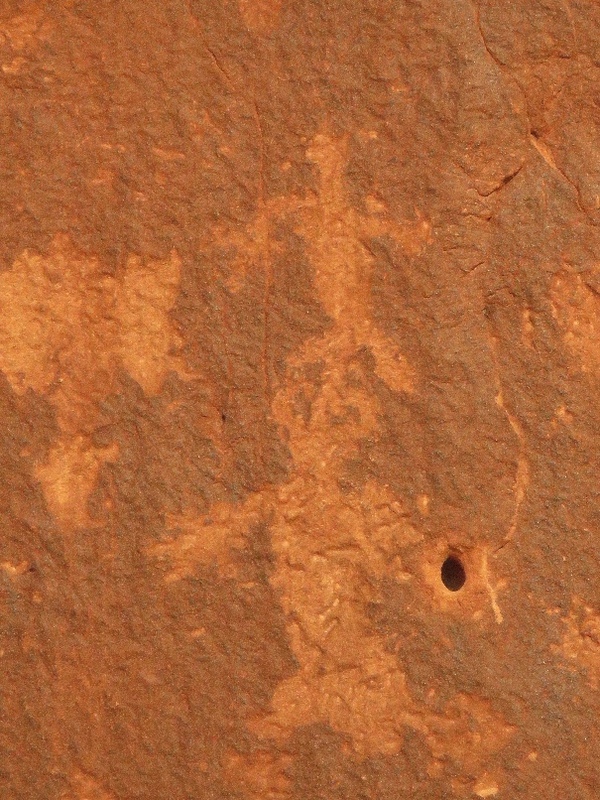 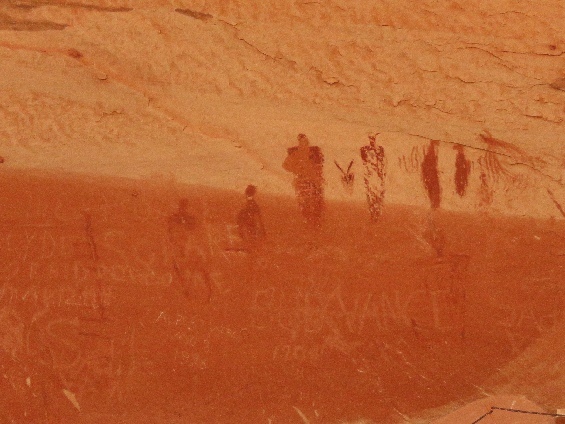 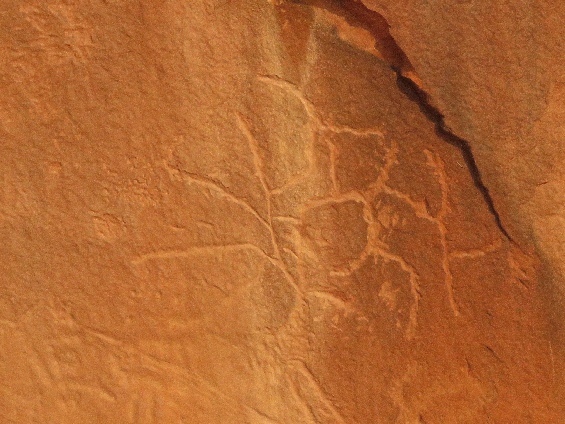 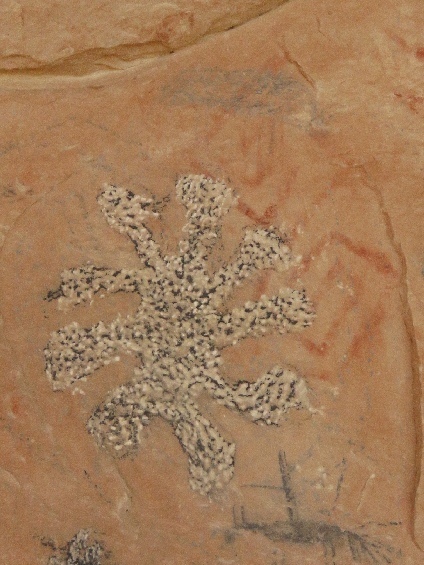 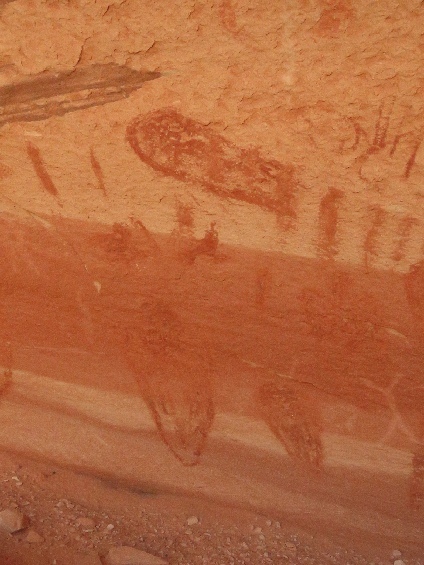 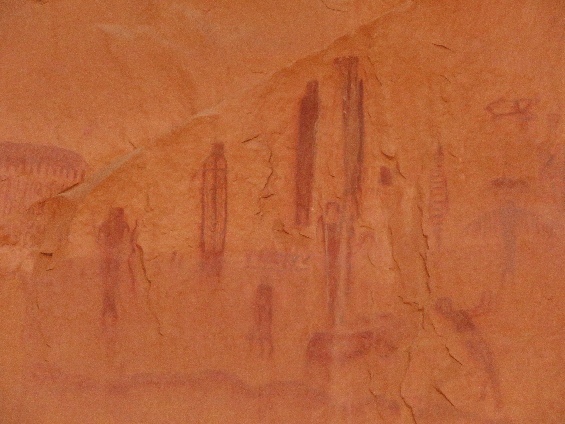 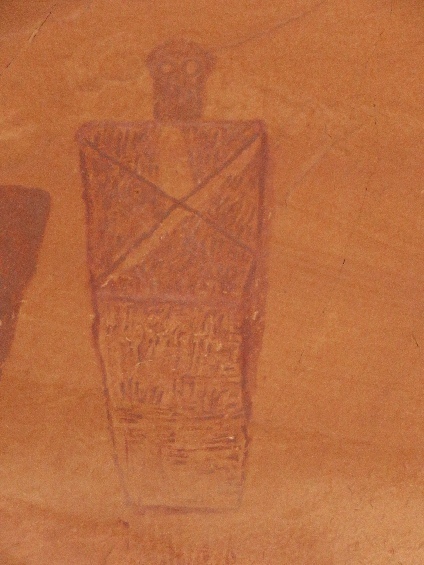 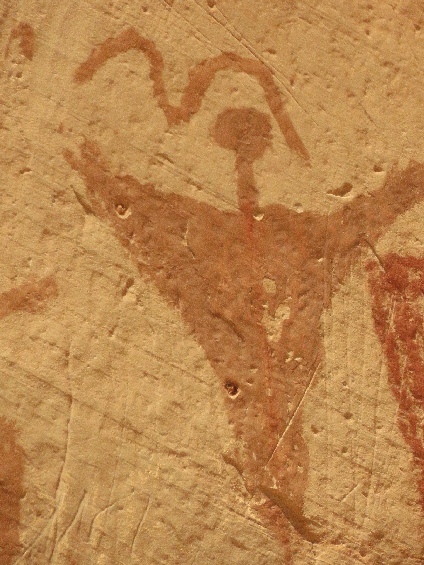 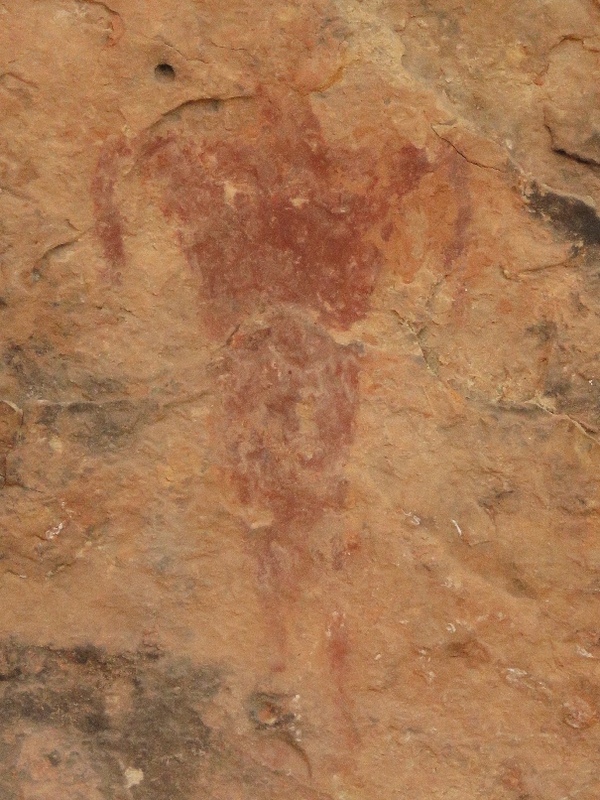 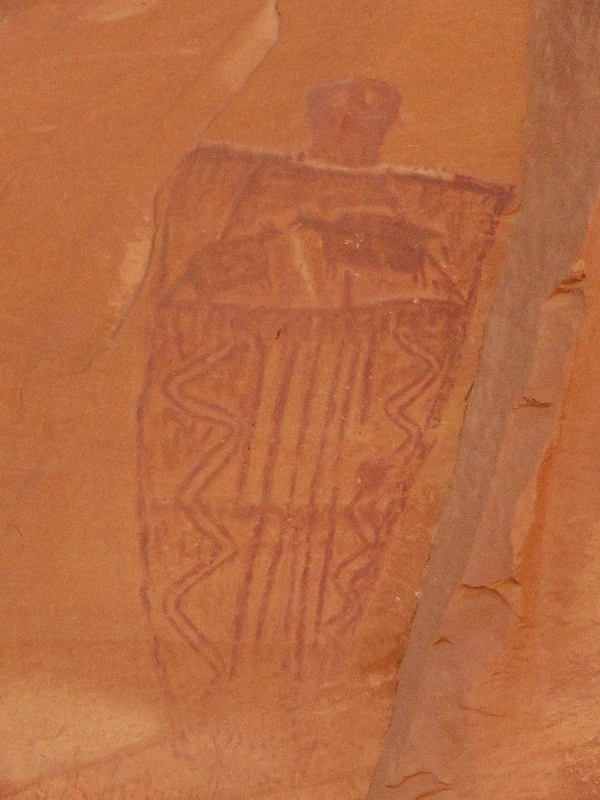 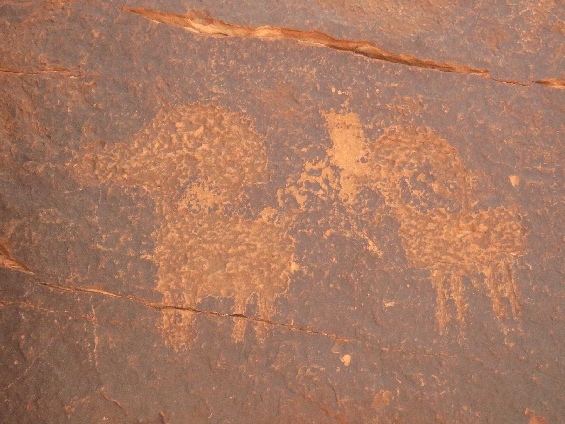 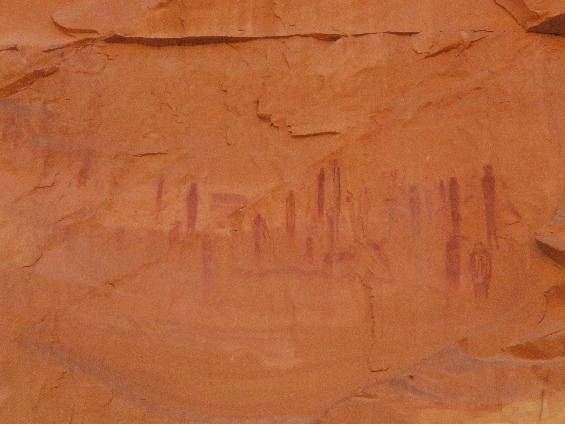 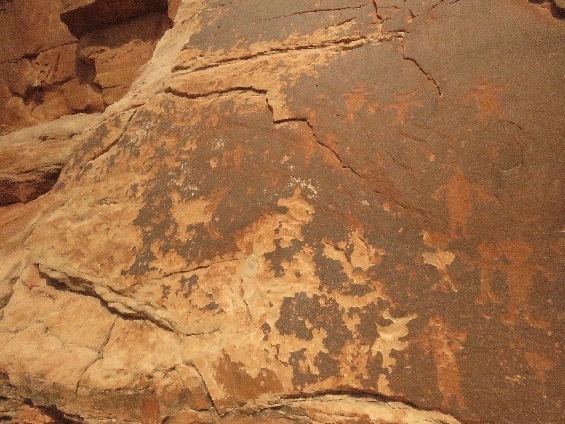 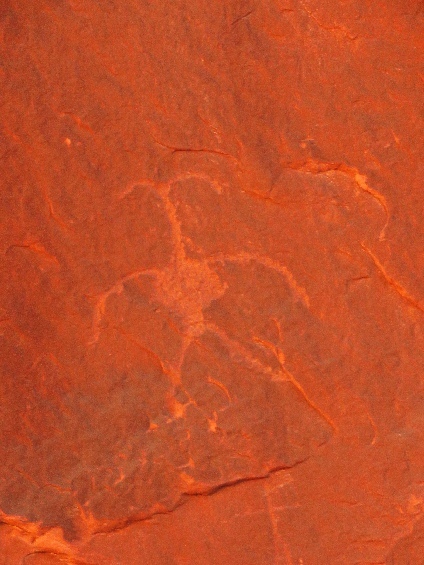 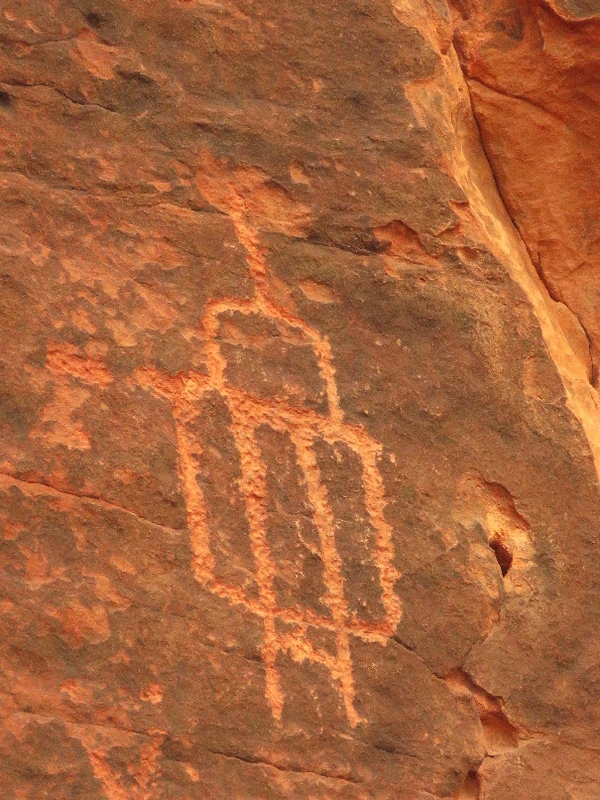 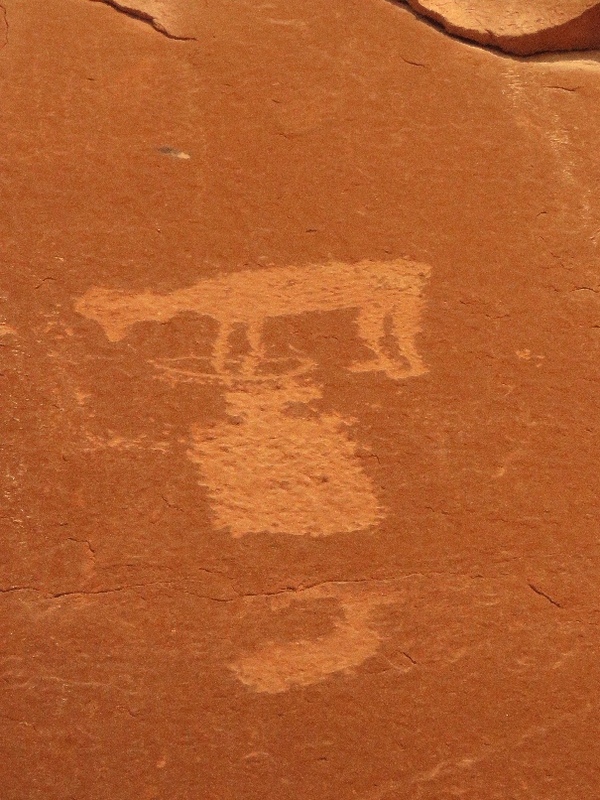 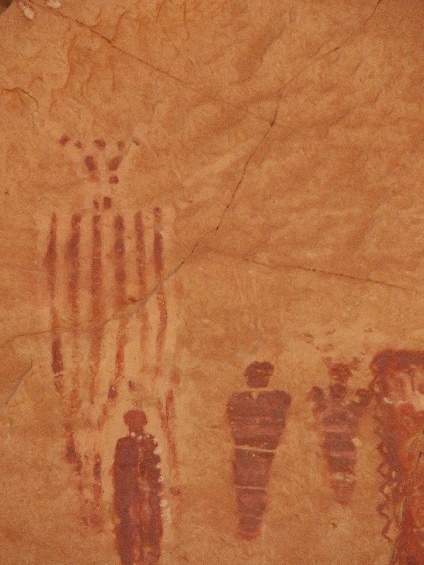 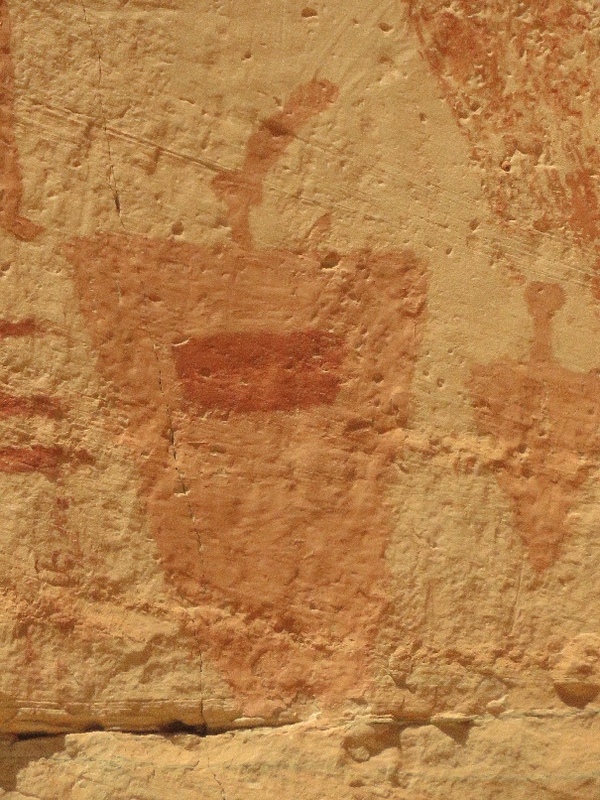 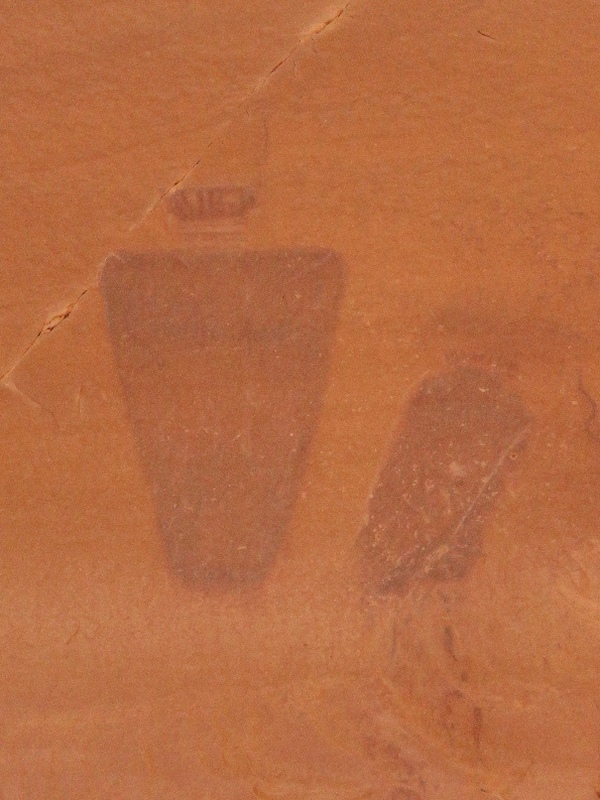 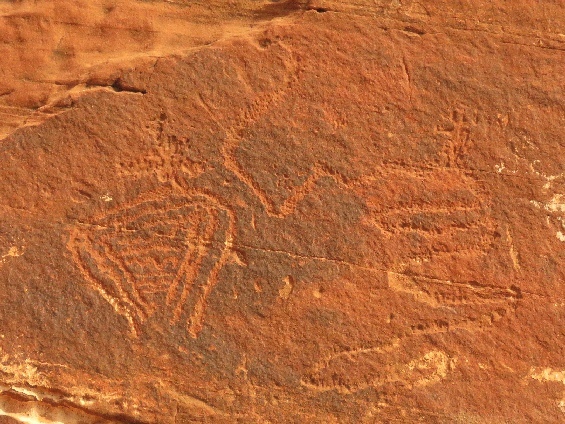 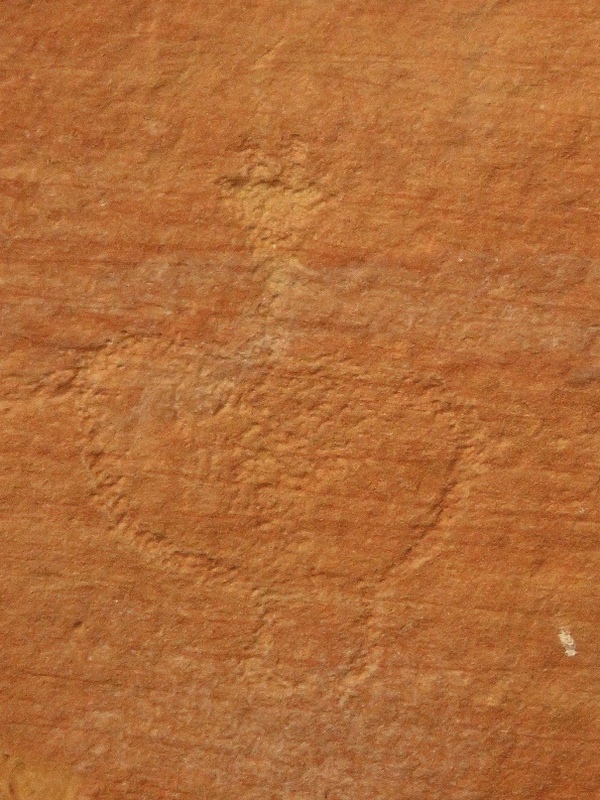 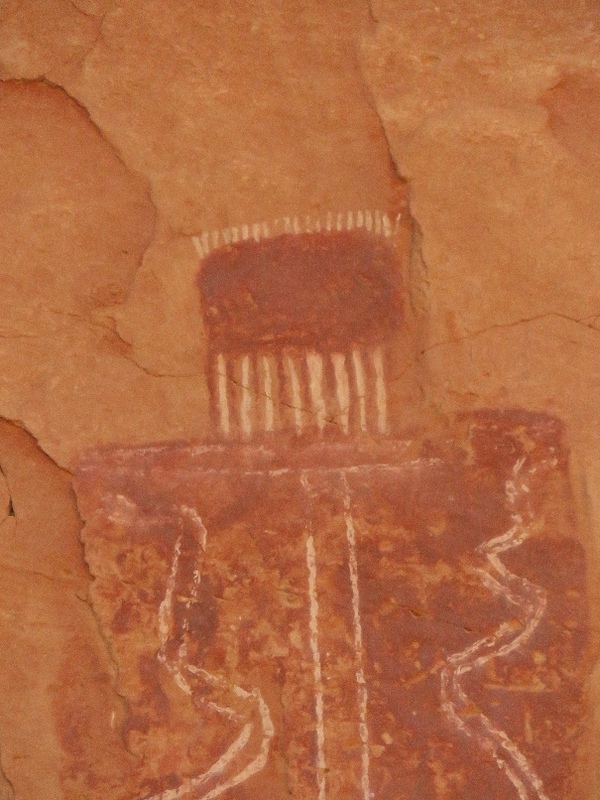 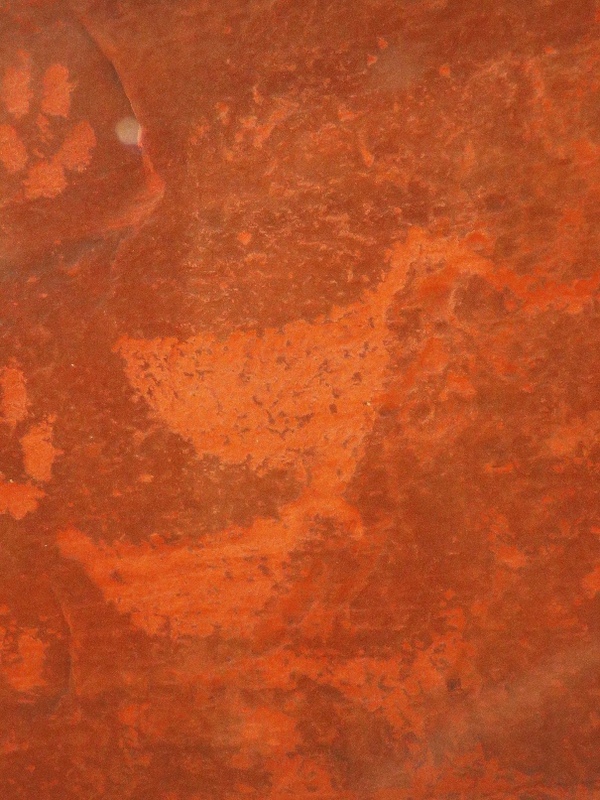 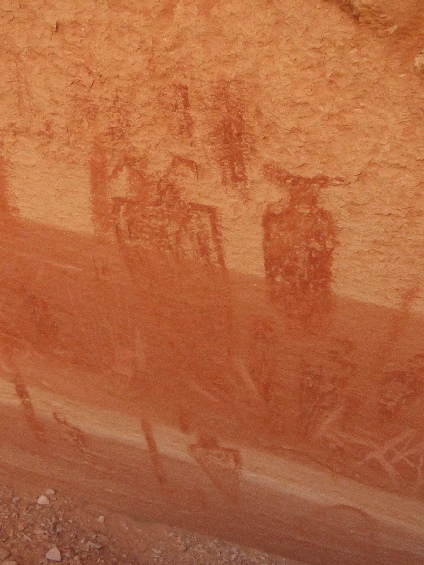 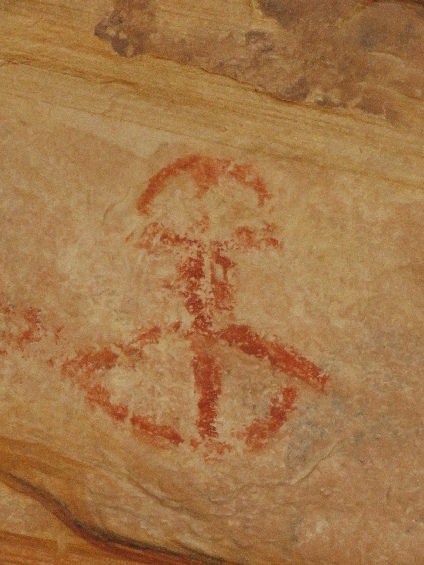 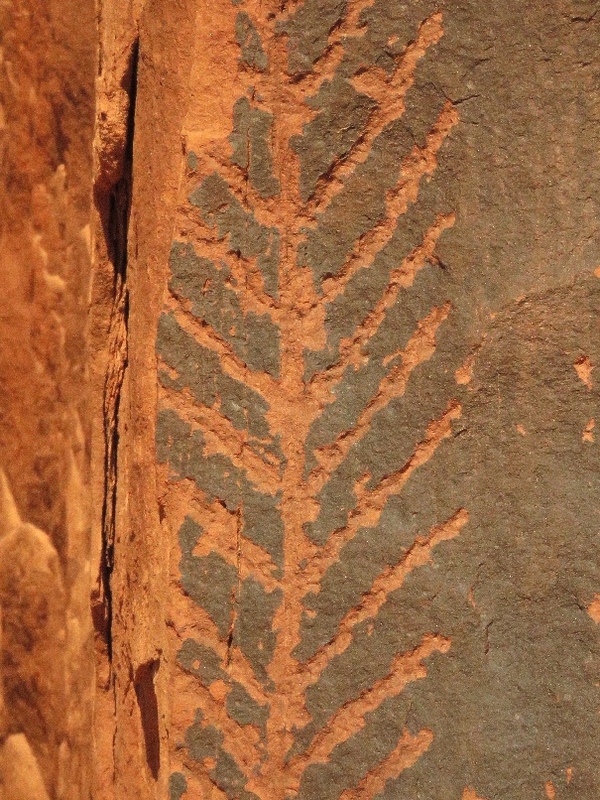 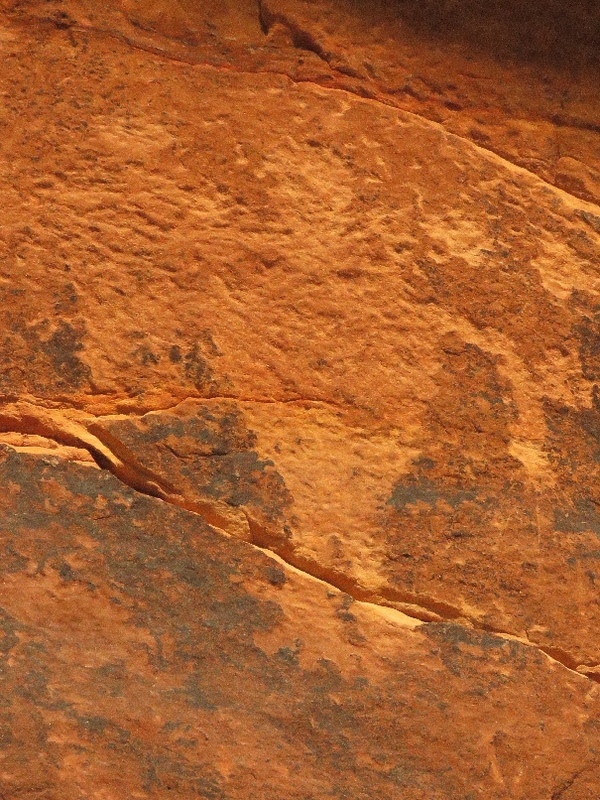 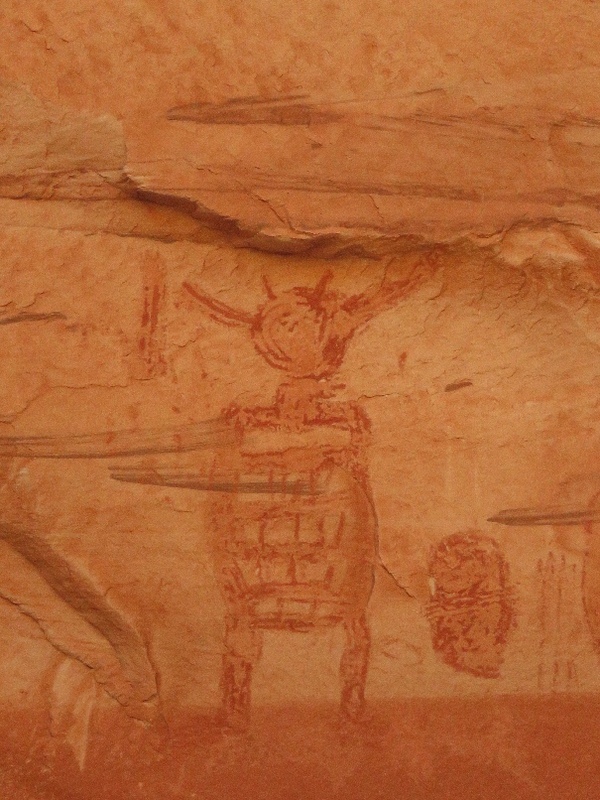 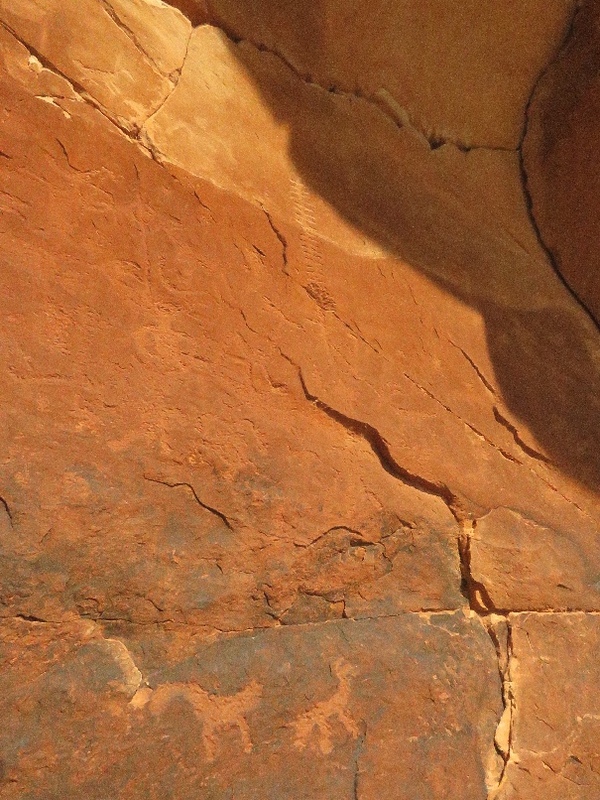 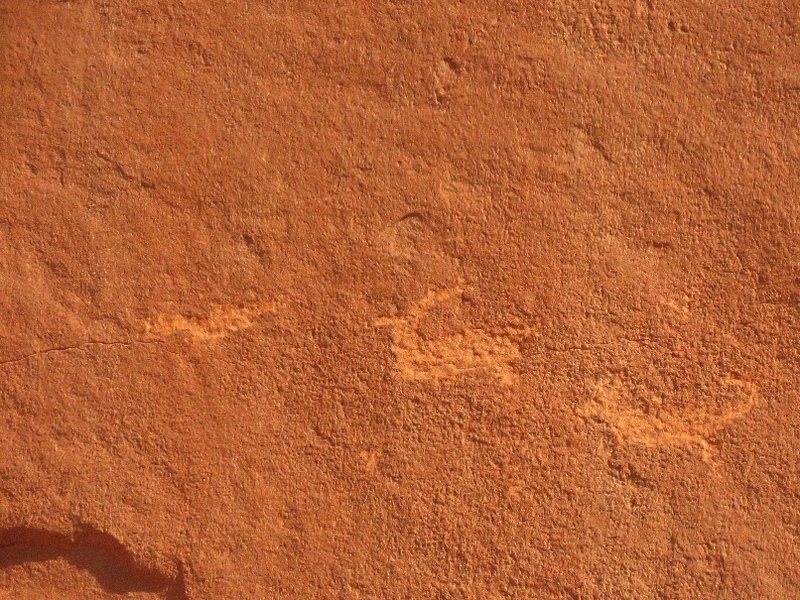 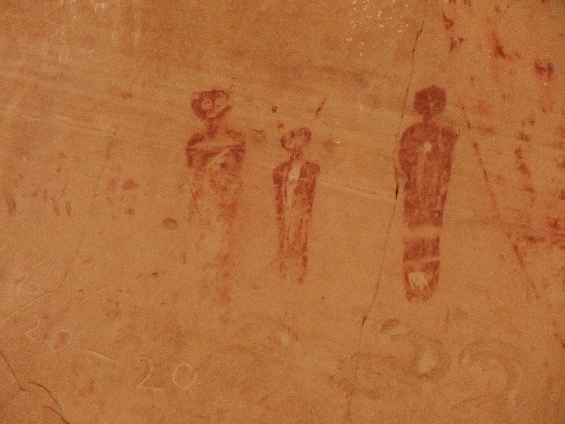 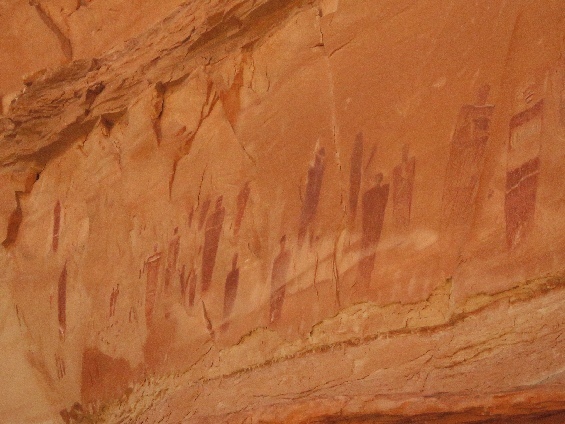 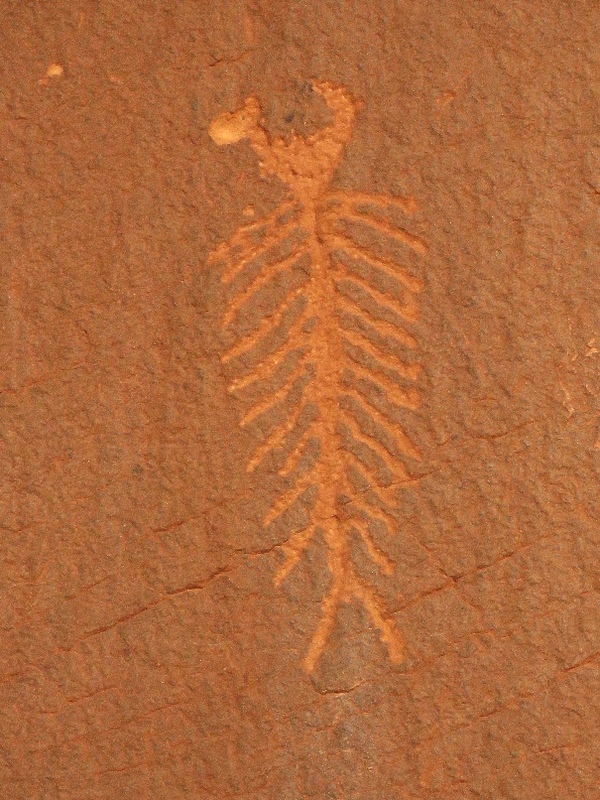 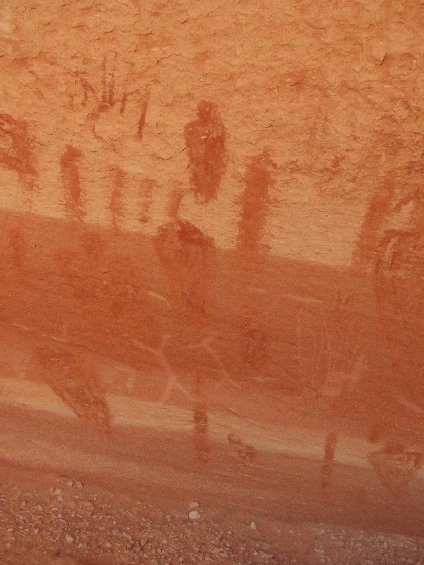 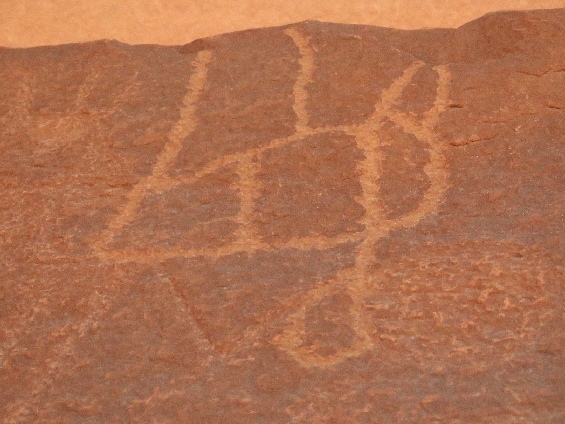 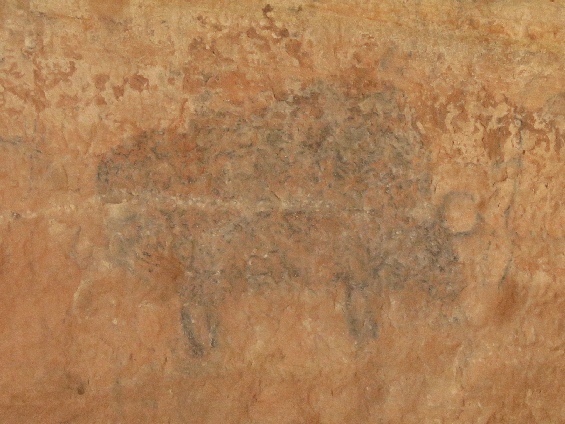 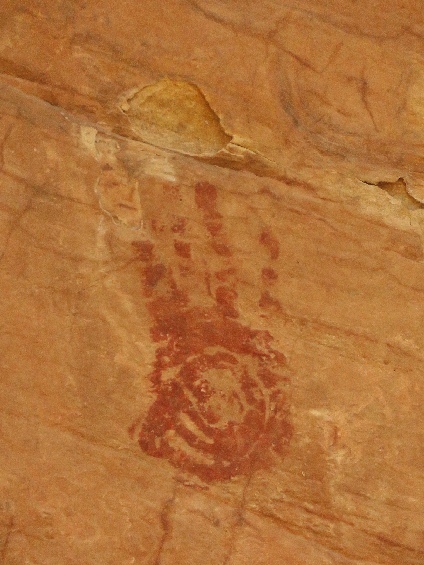 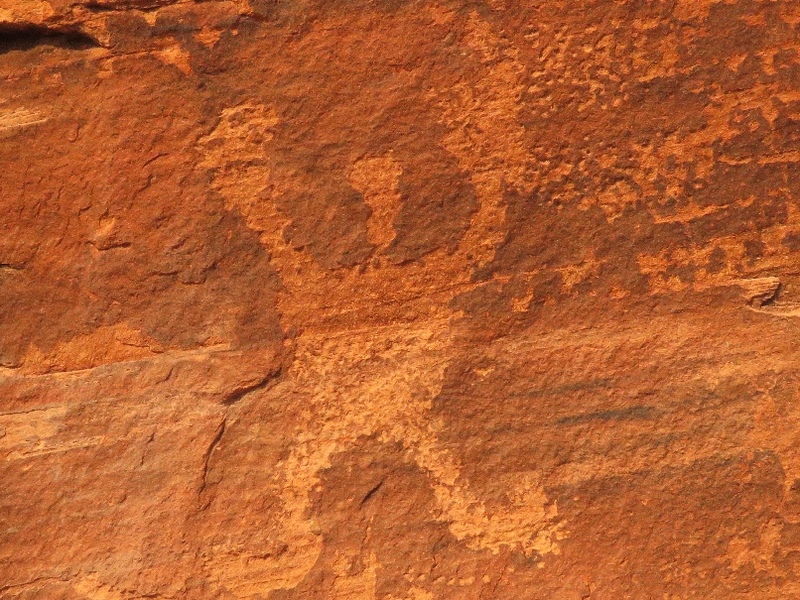 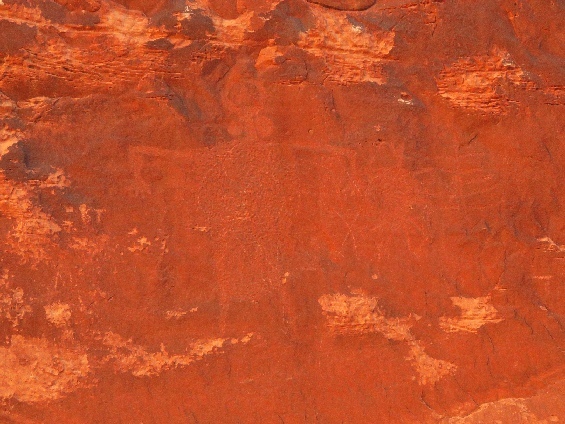 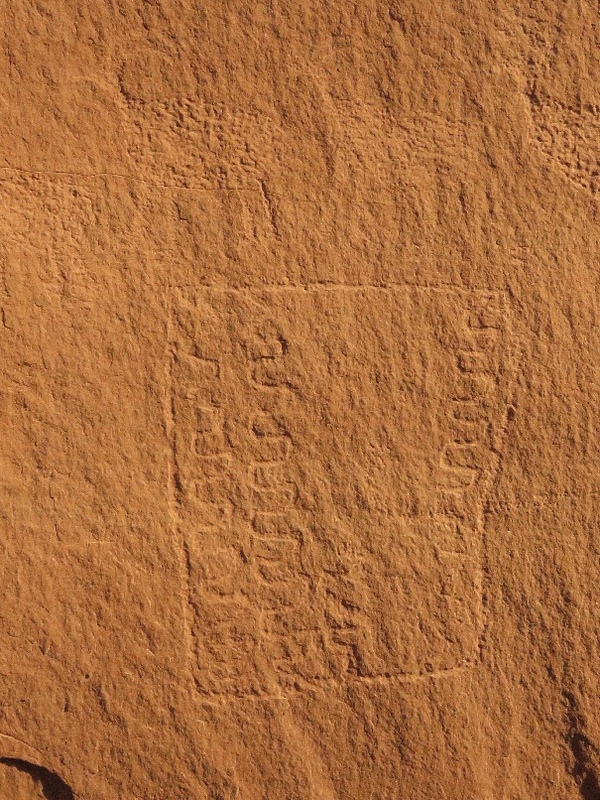 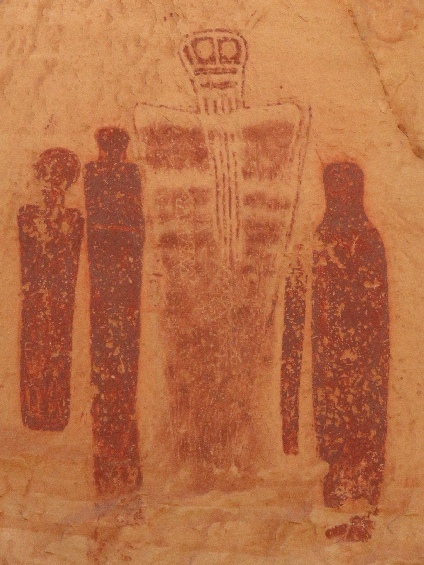 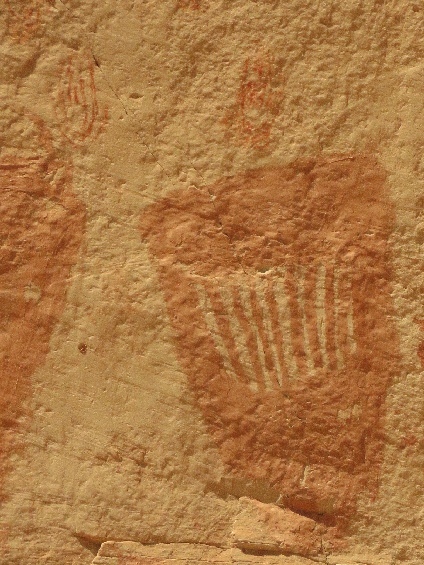 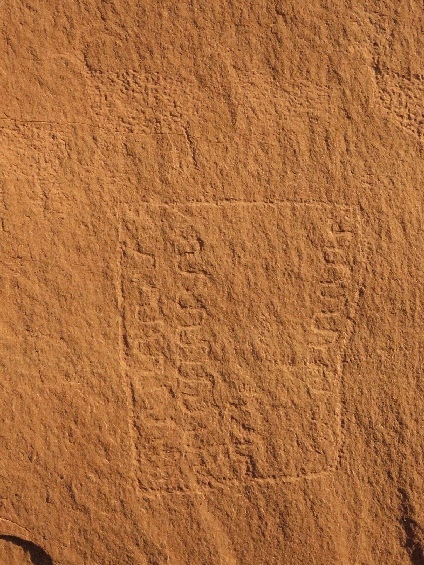 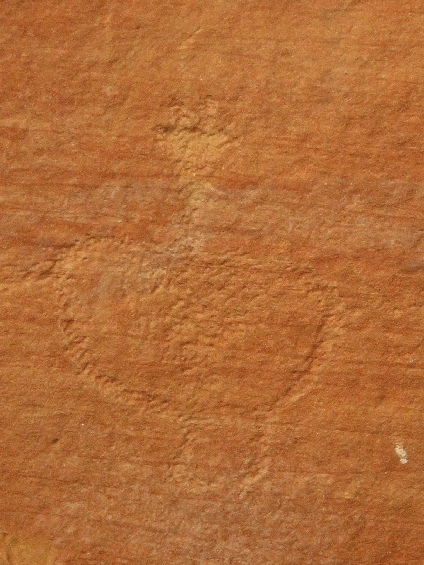 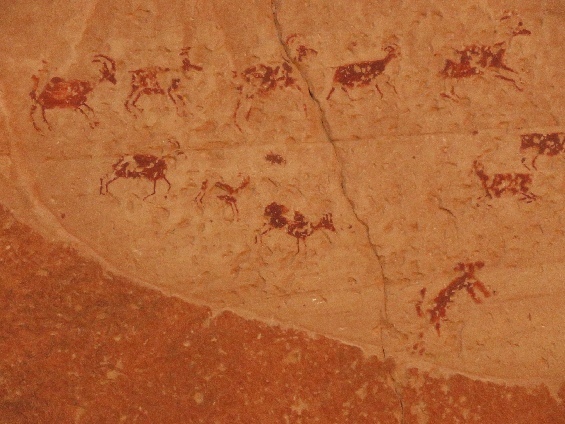 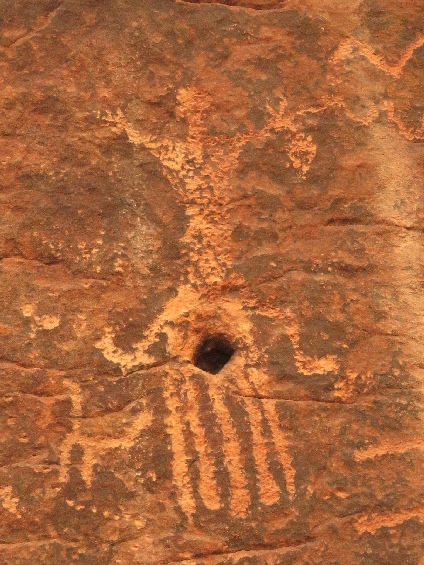 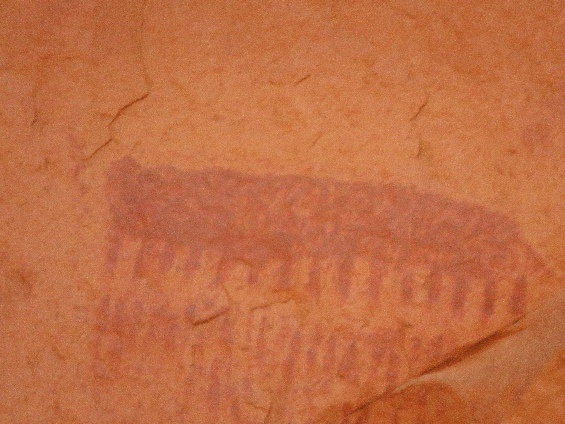 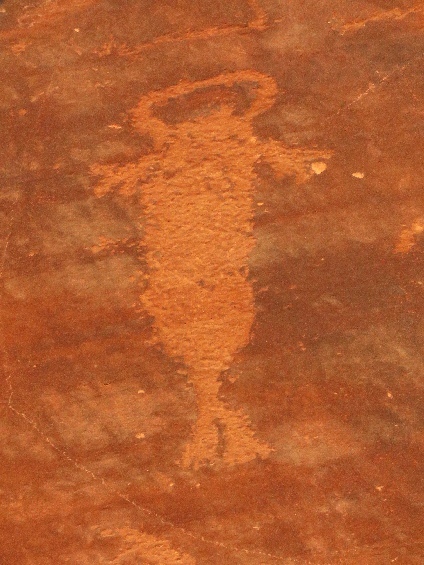 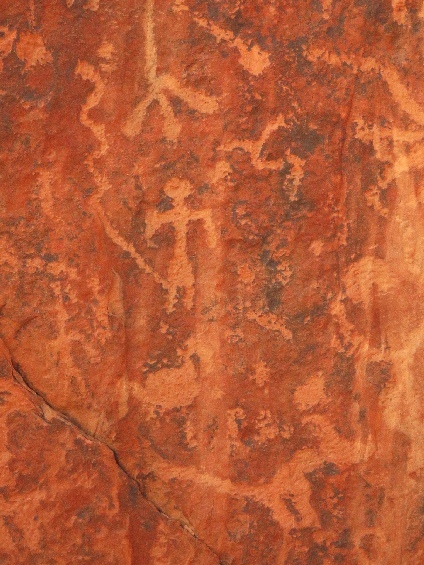 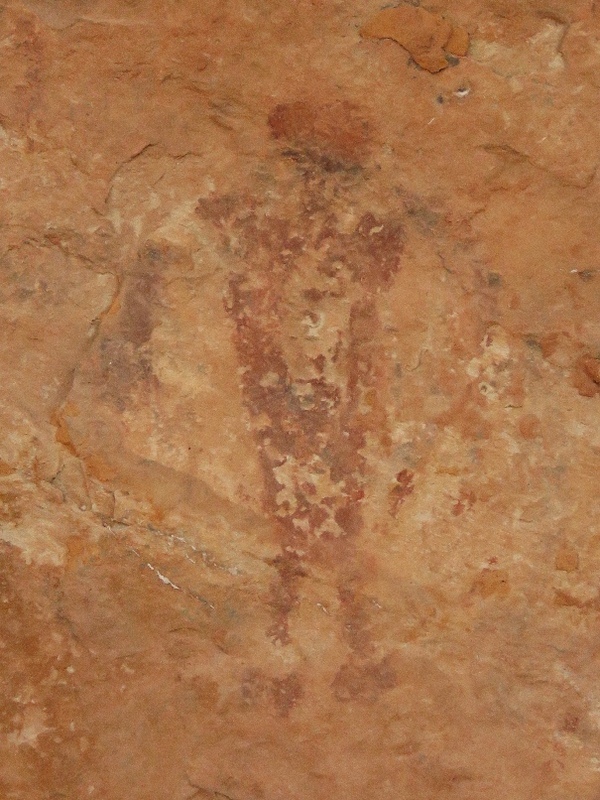 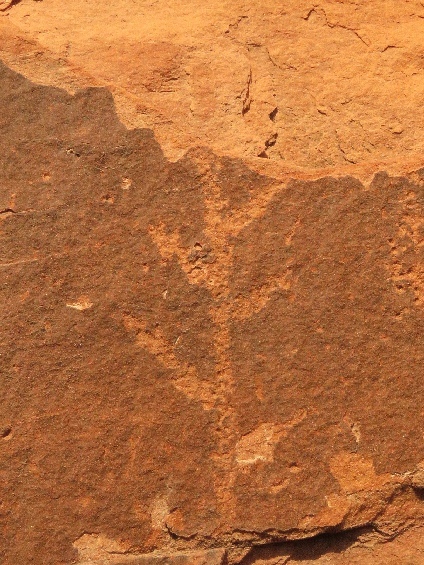 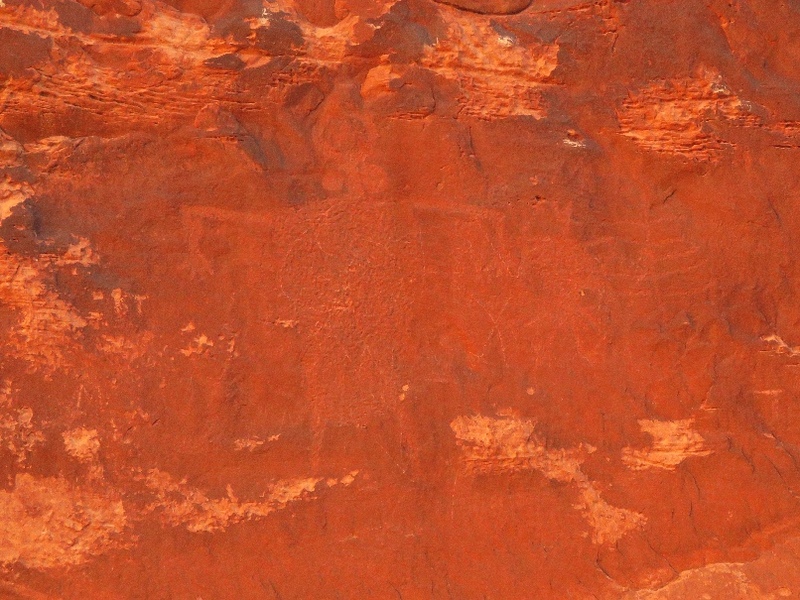 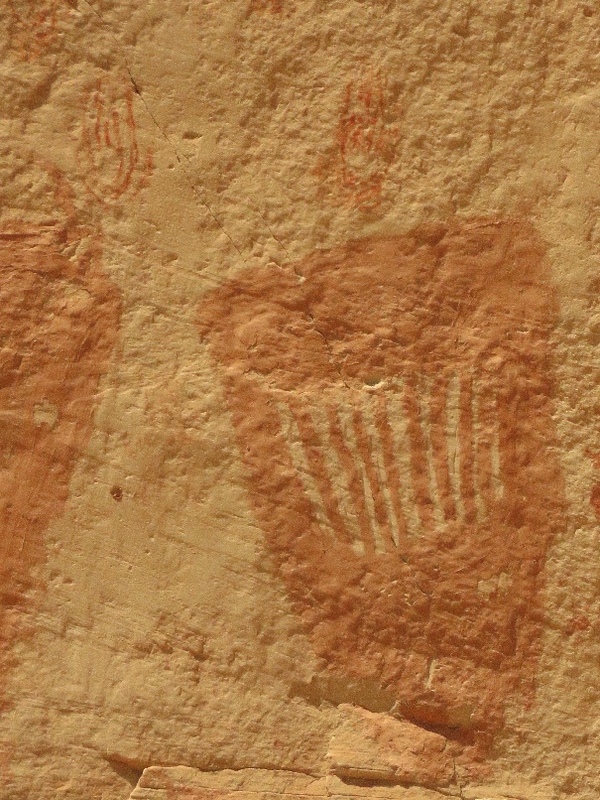 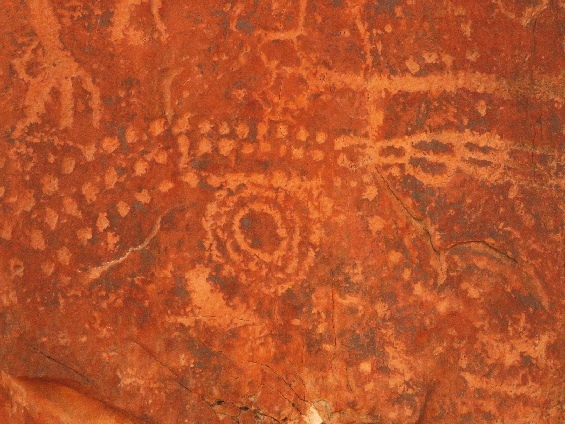 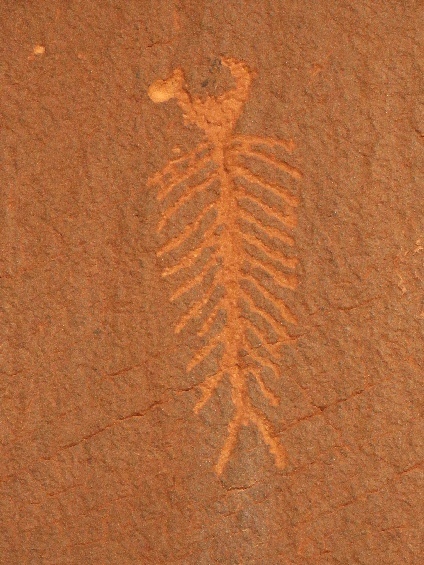 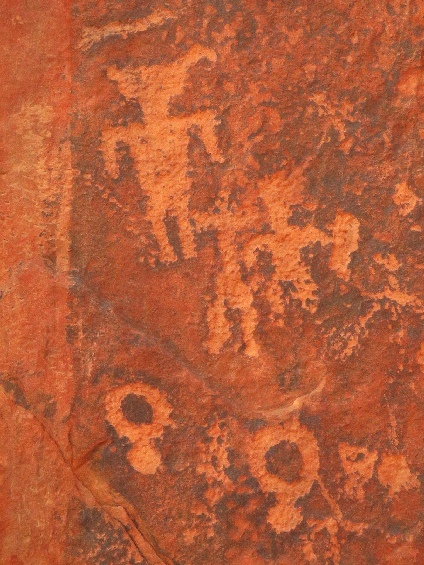 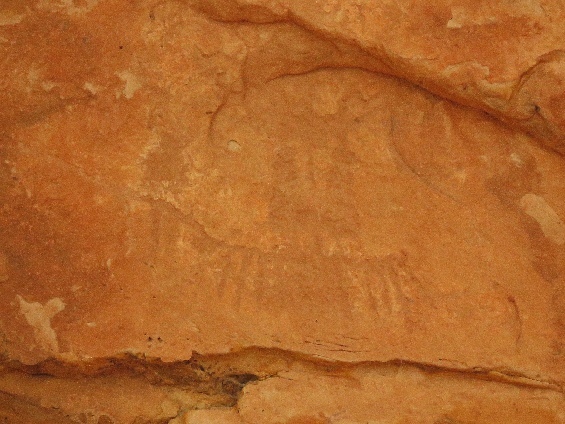 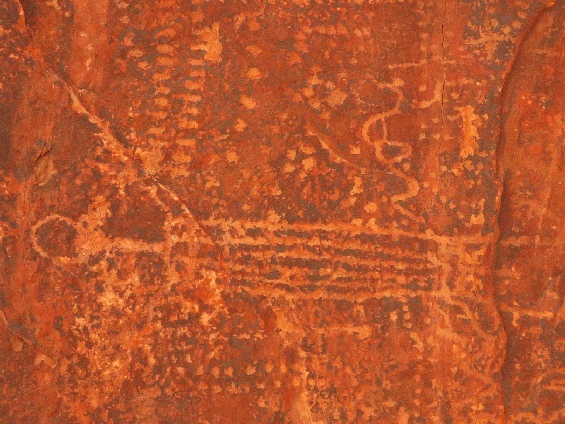 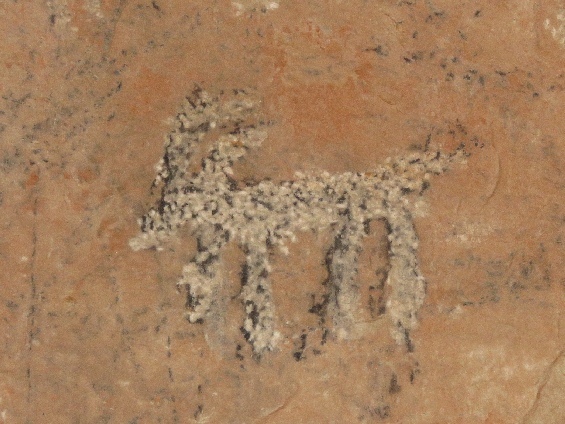 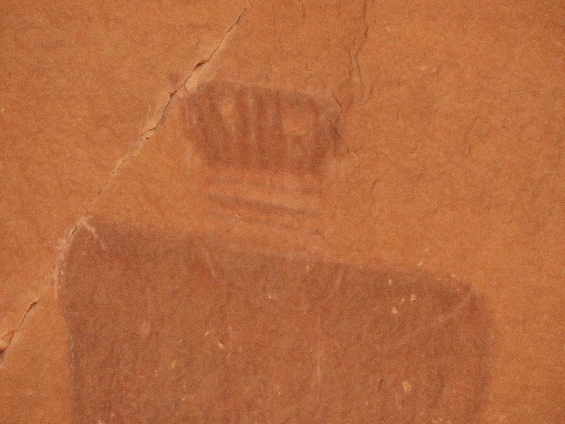 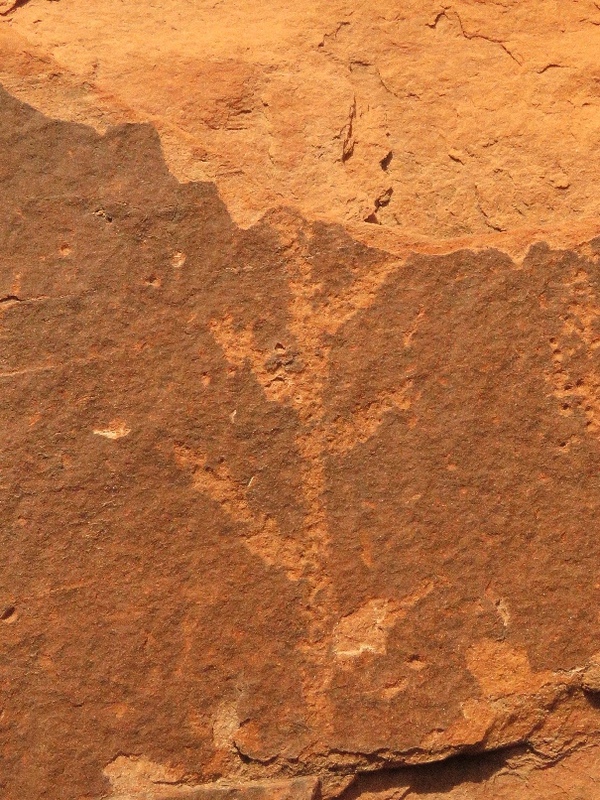 Pictographs style is different from all other panels in the Horseshoe Canyon. 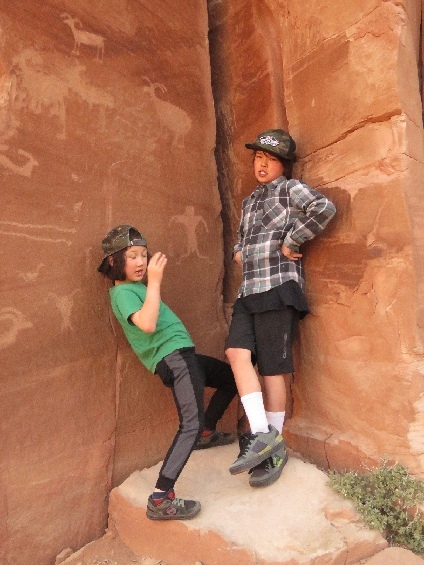 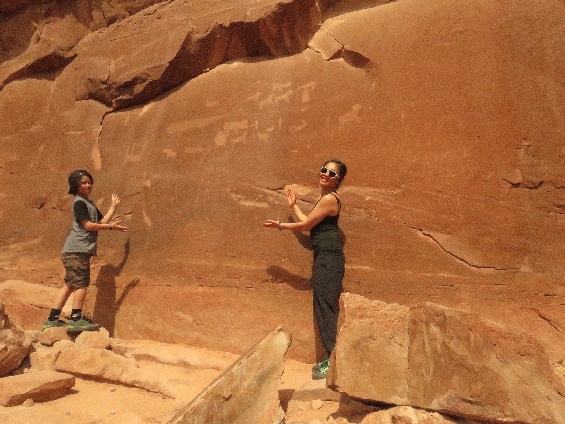 4/18/2019 Alcove Gallery, Maze Tour (Day 1), Canyonlands National Park, UT - The pictographs panels are located in the large alcove. 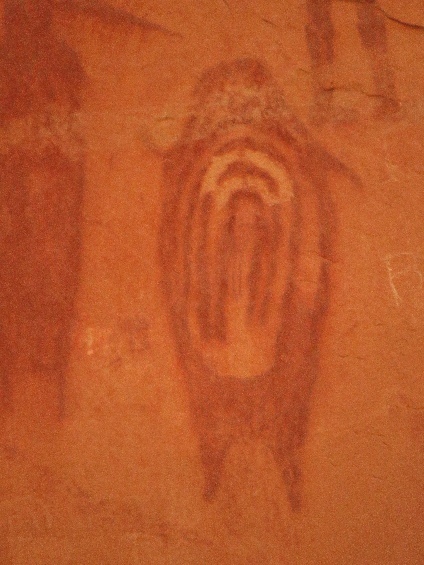 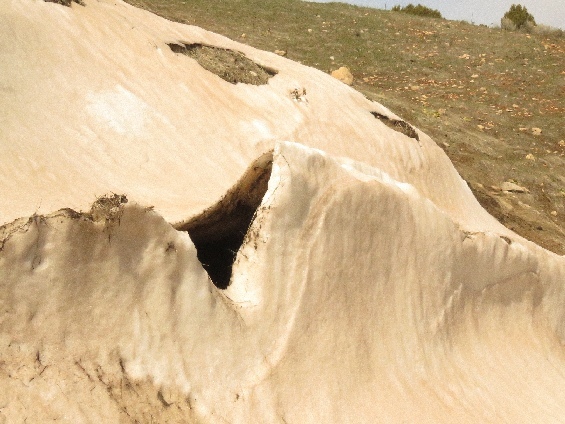 It is located between Horseshoe Shelter and Great Gallery. 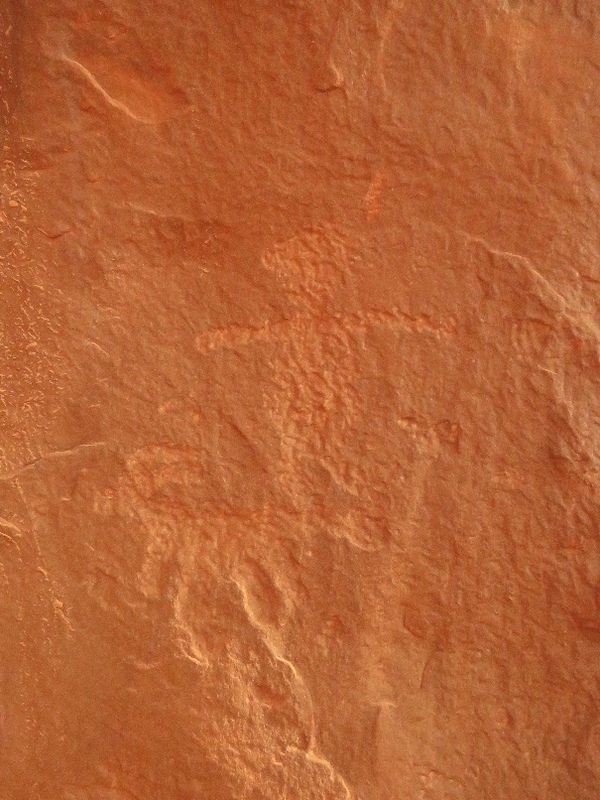 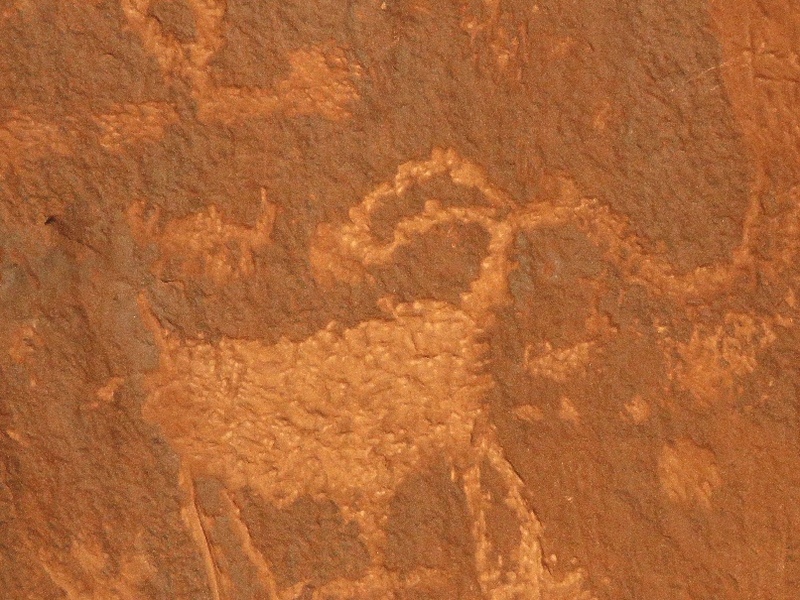 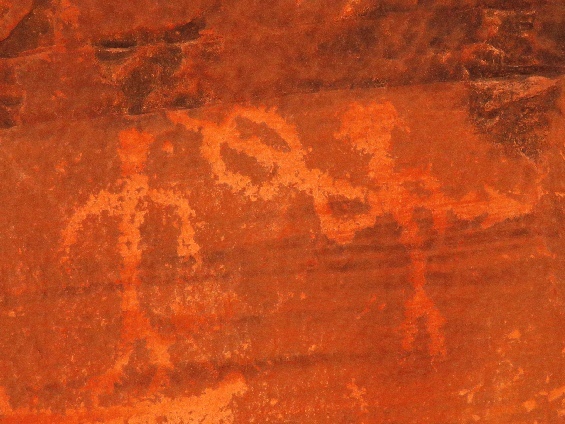 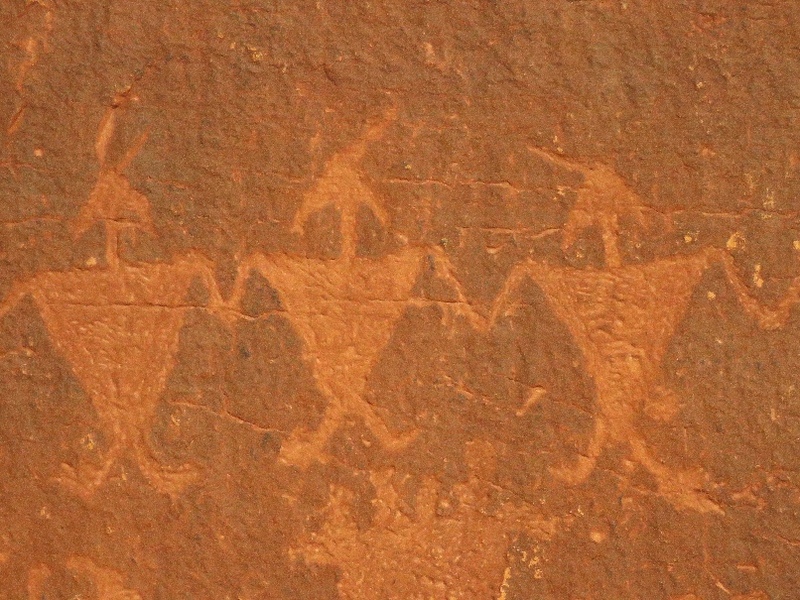 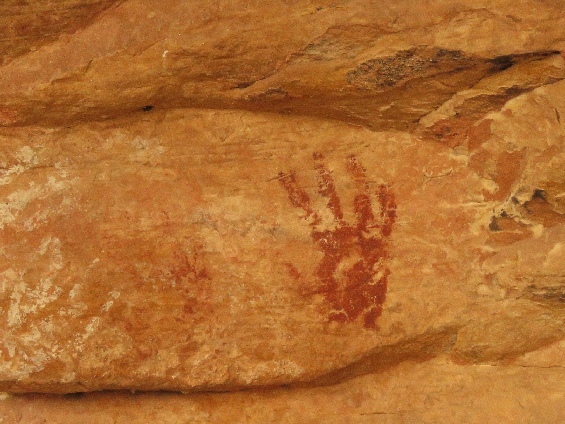 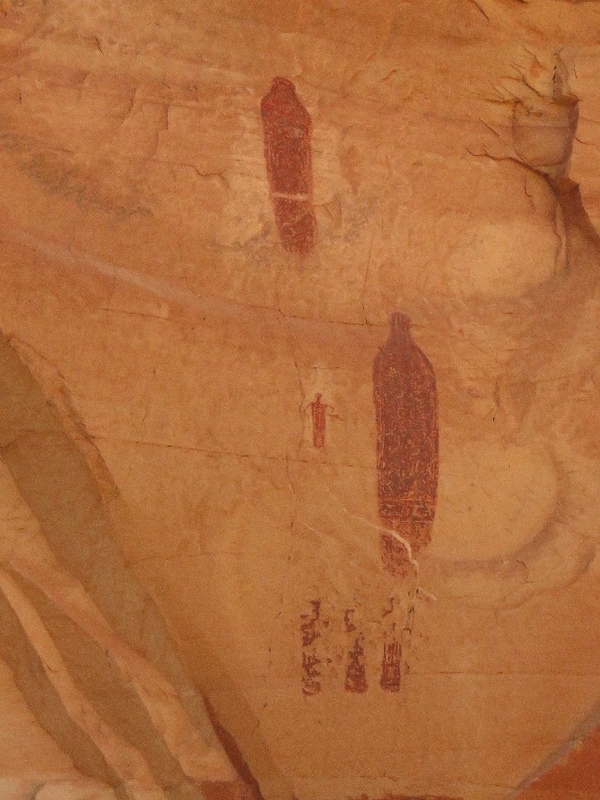 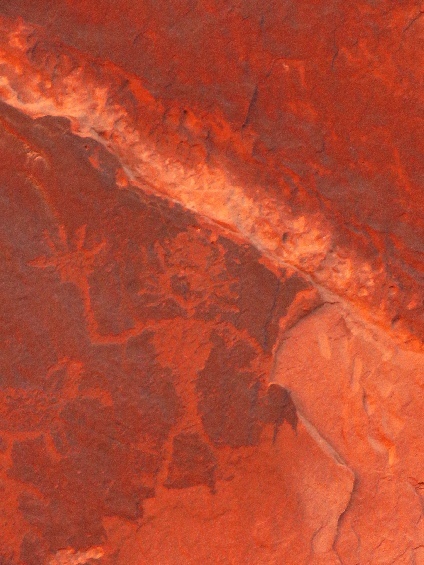 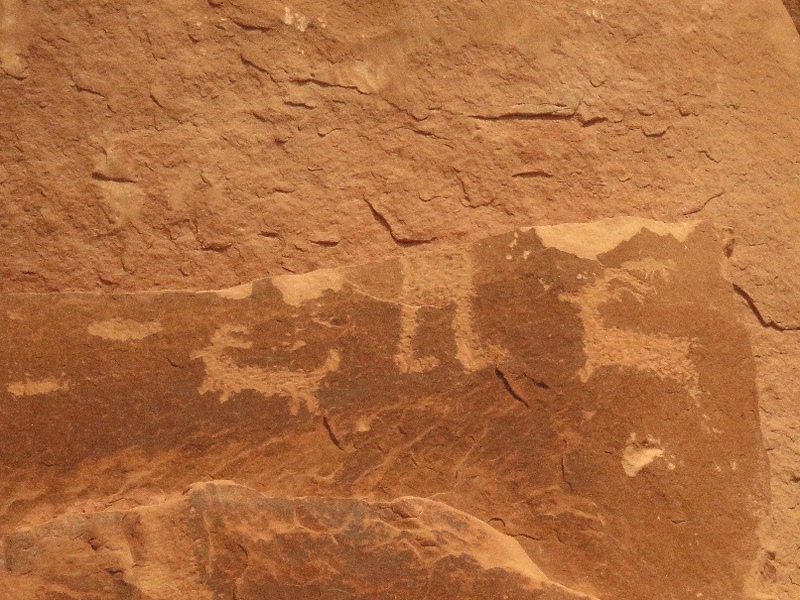 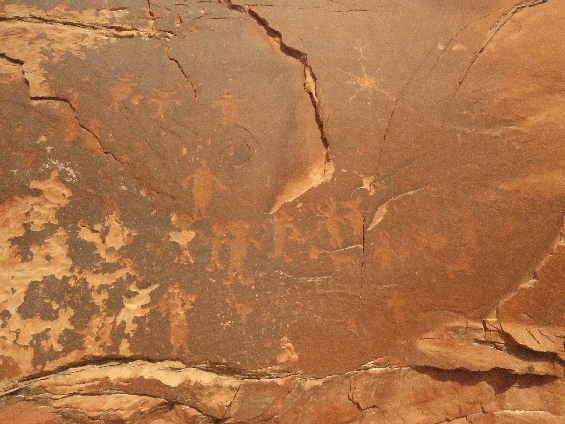 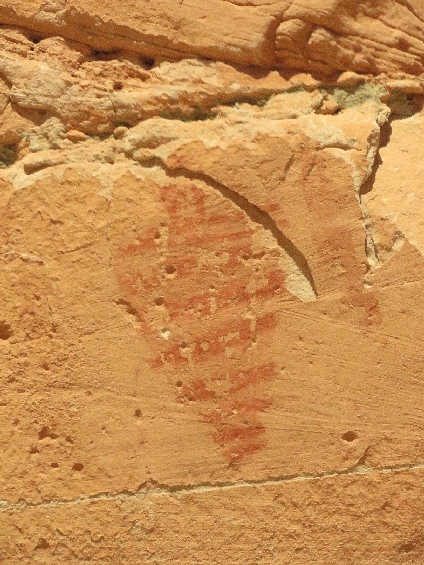 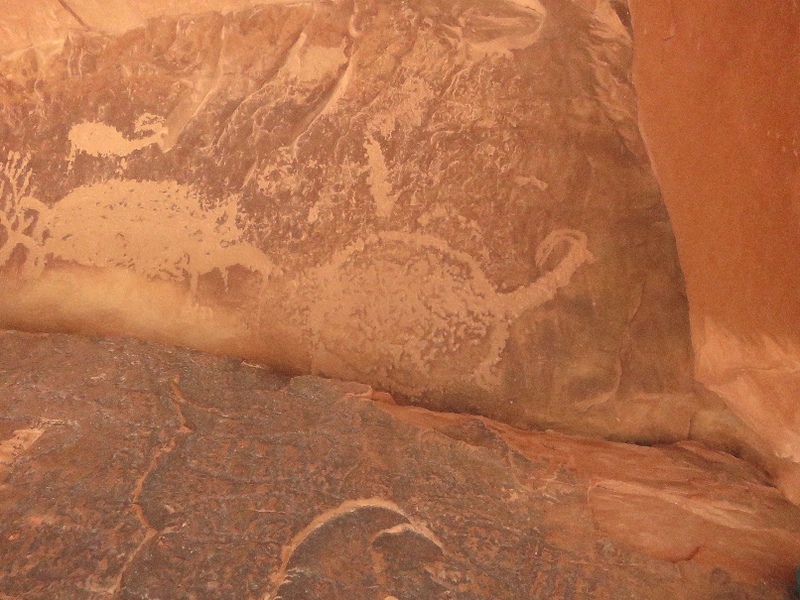 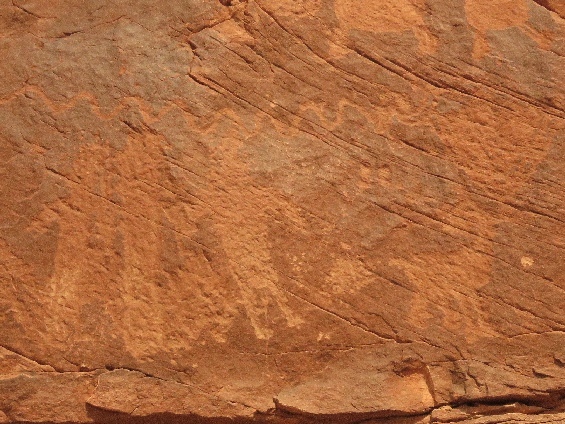 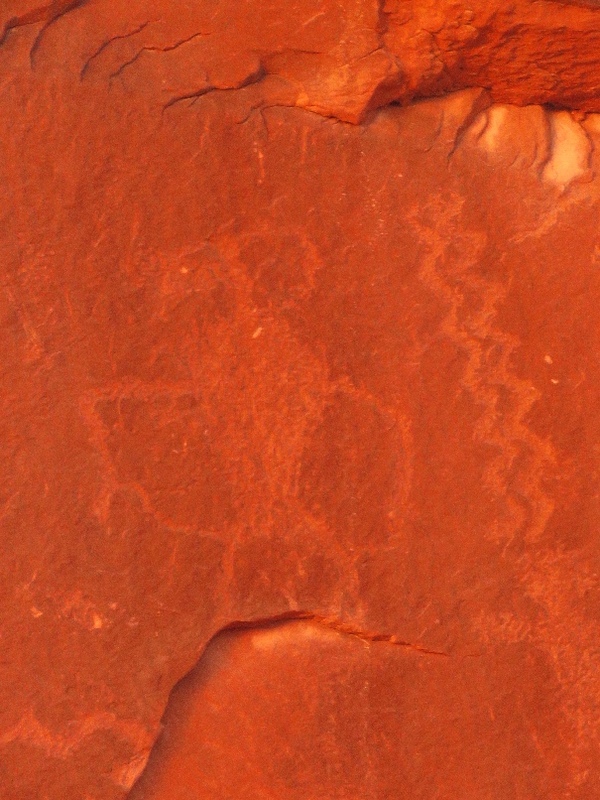 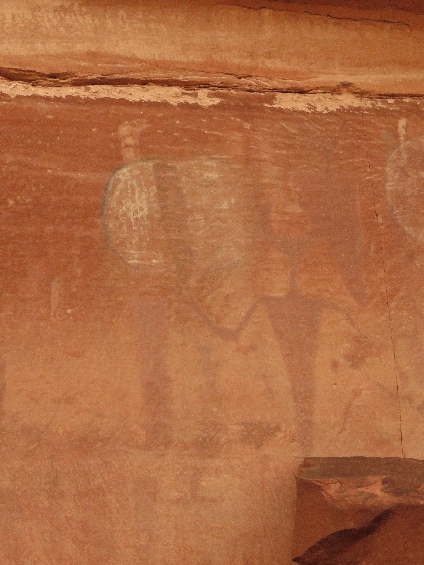 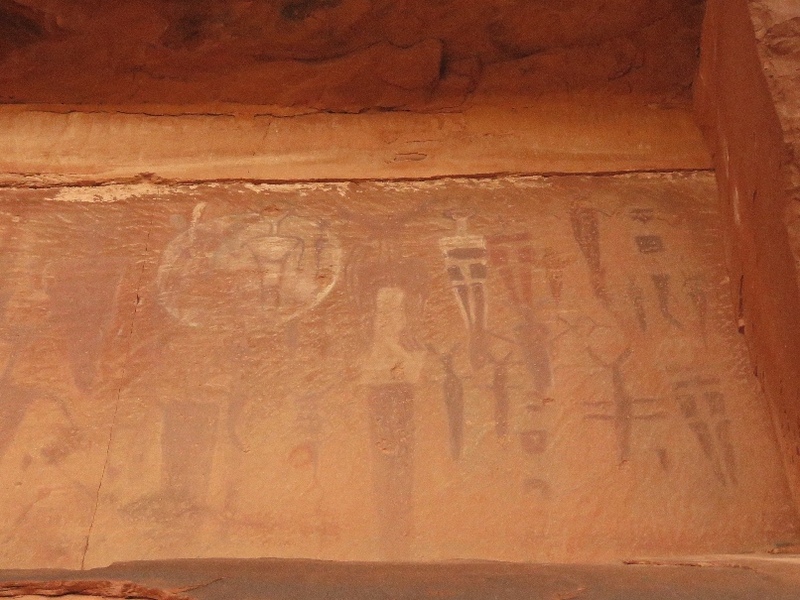 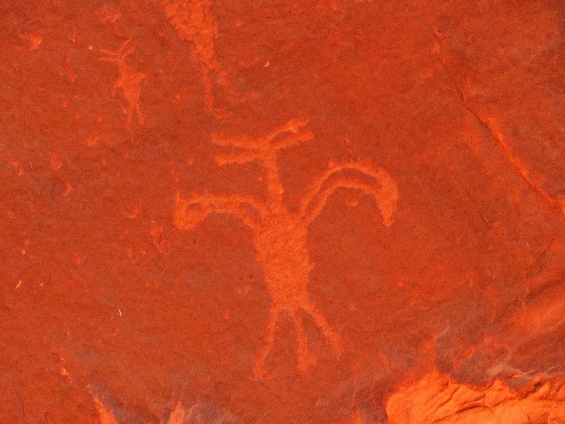 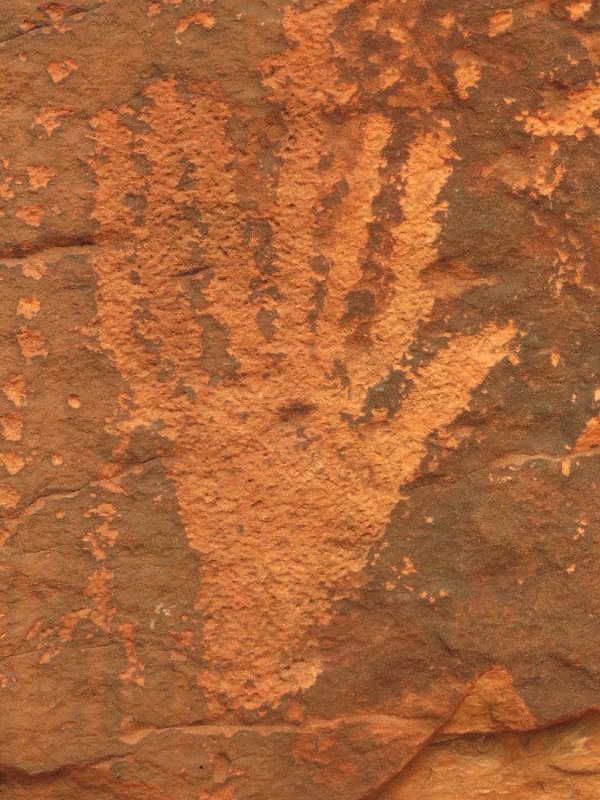 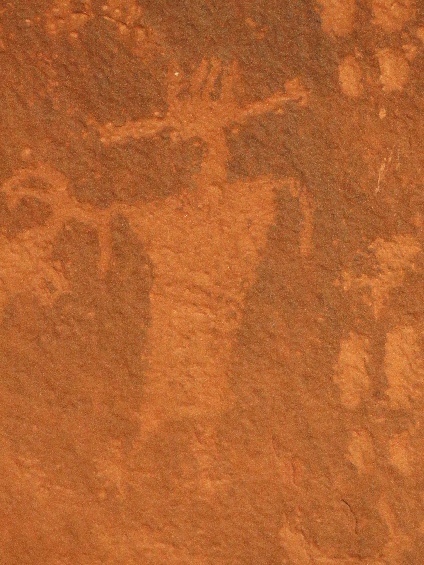 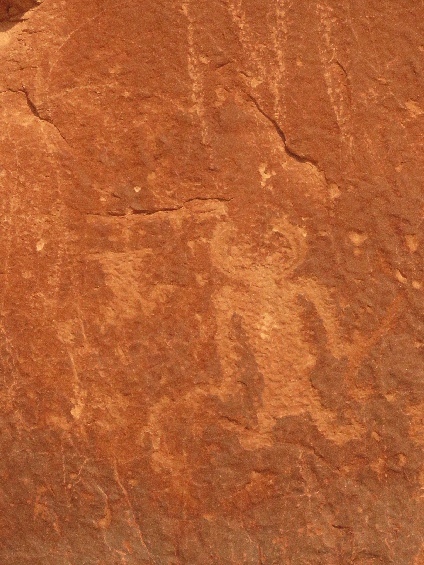 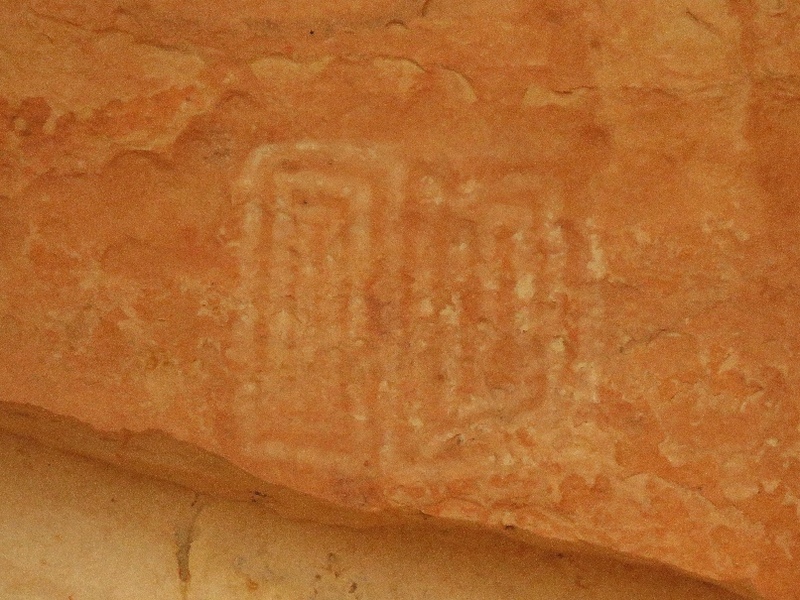 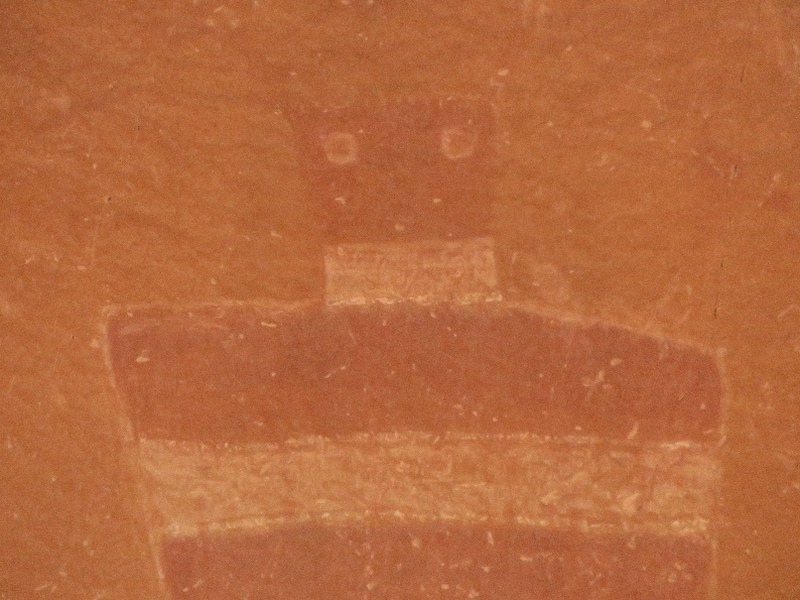 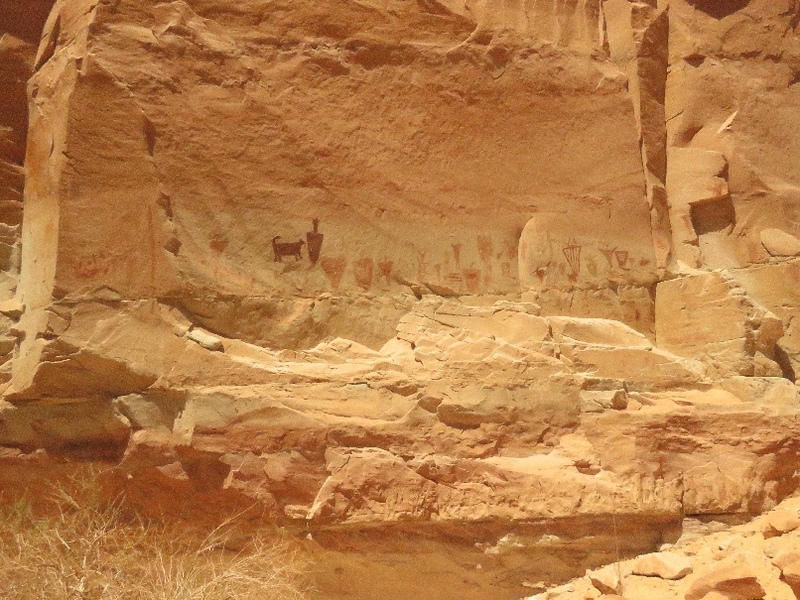 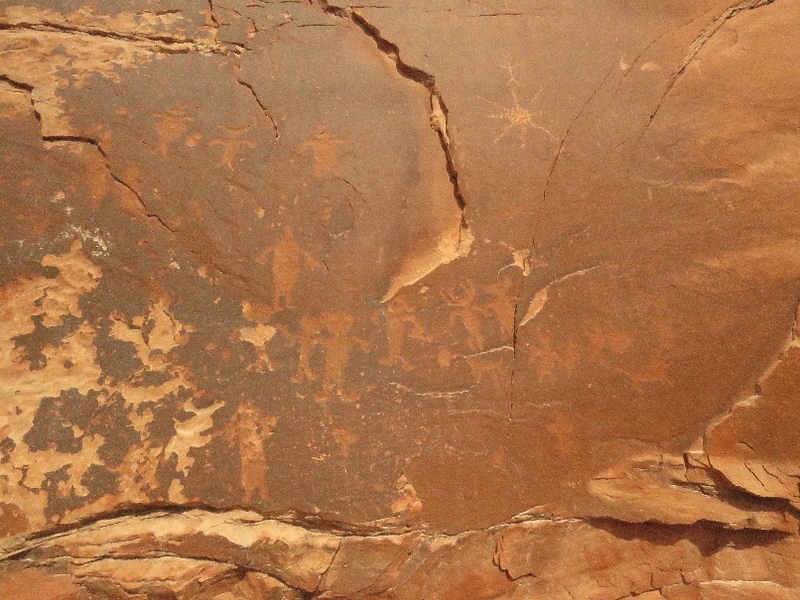 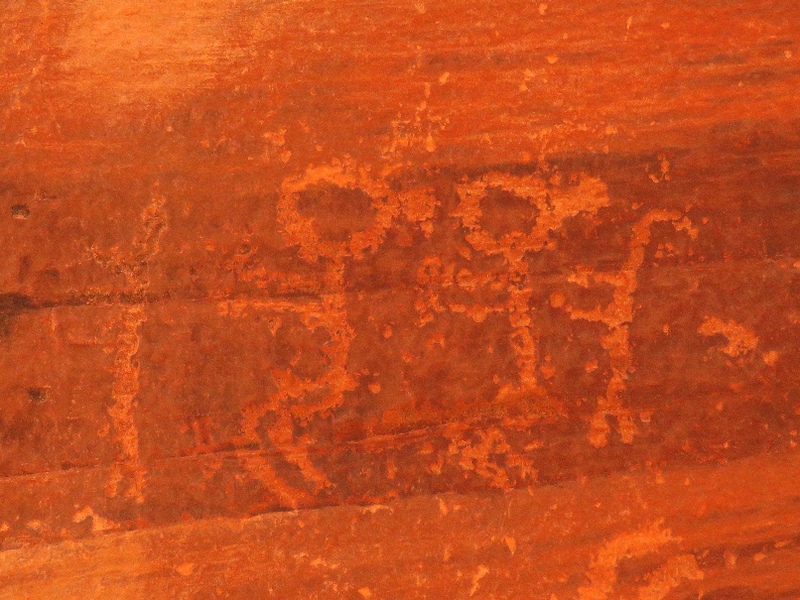 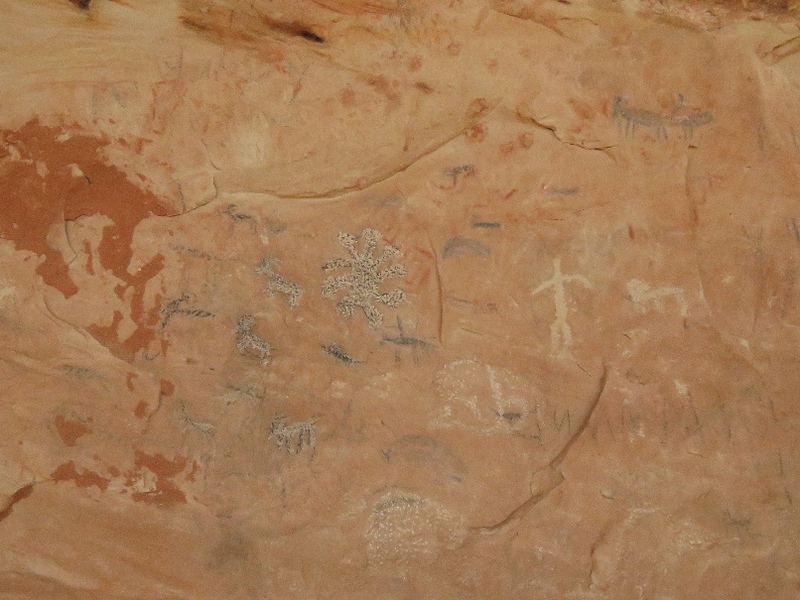 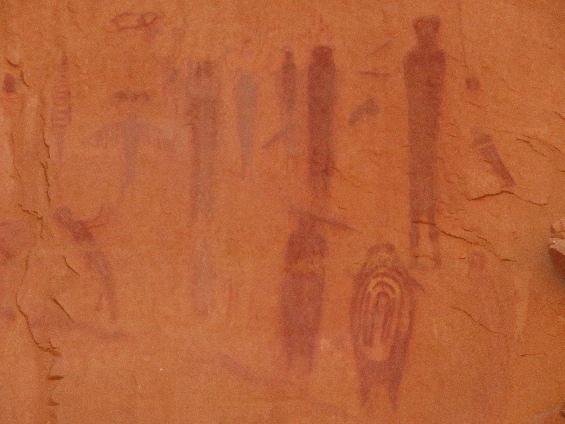 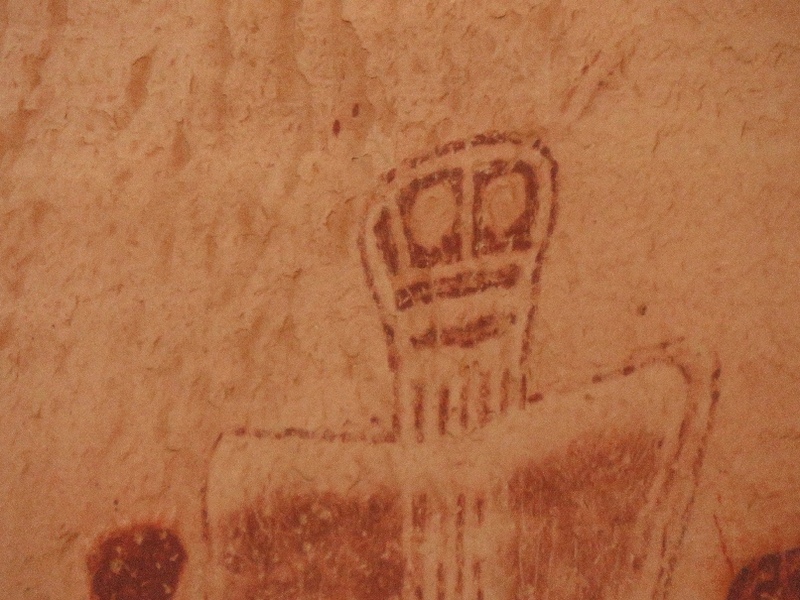 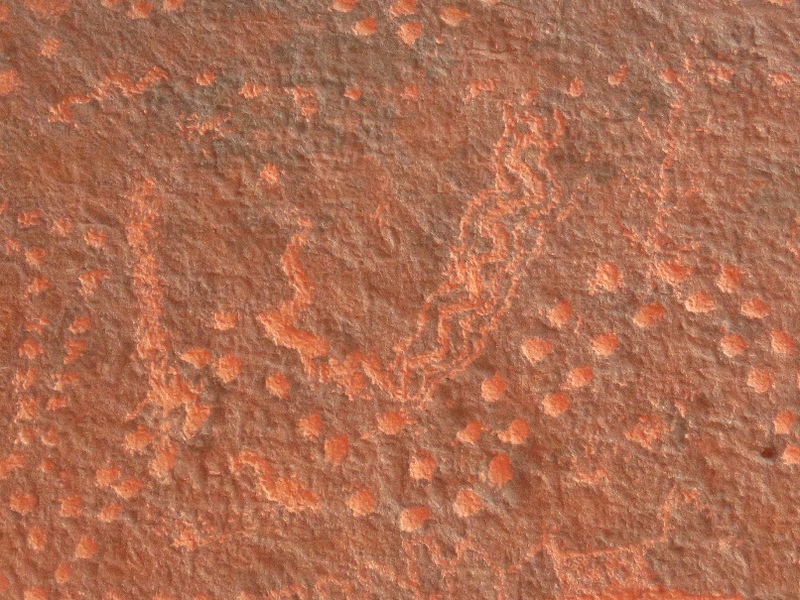 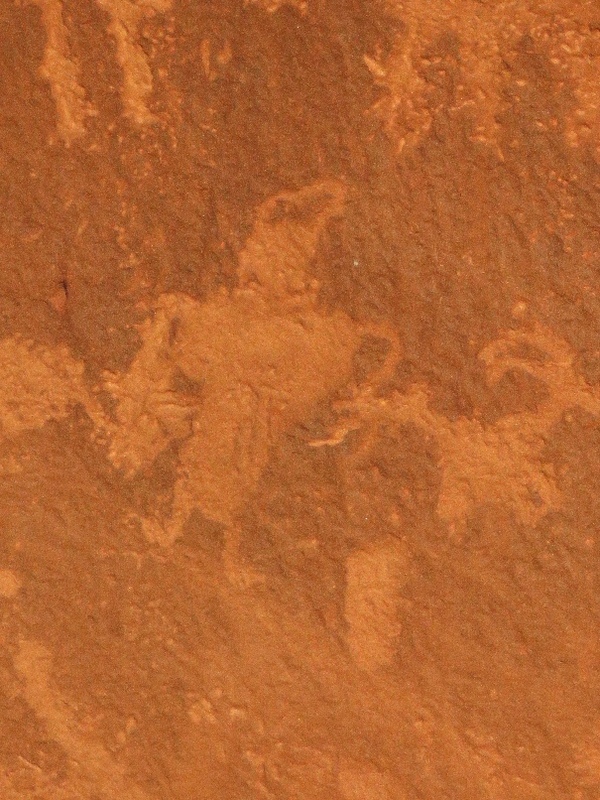 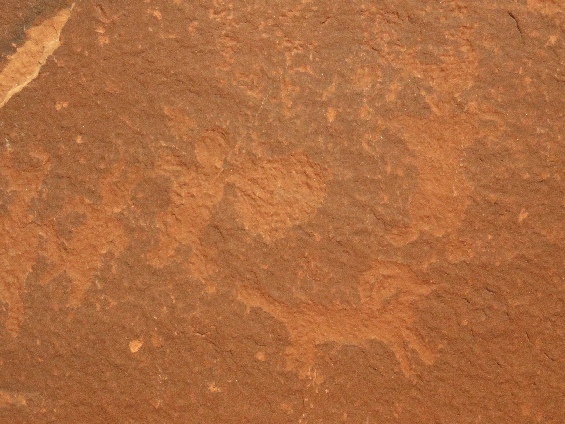 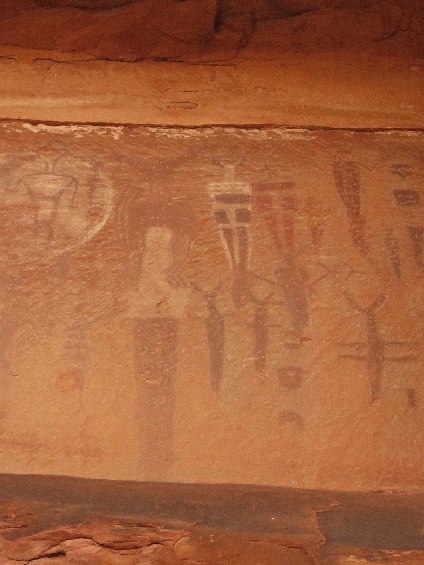 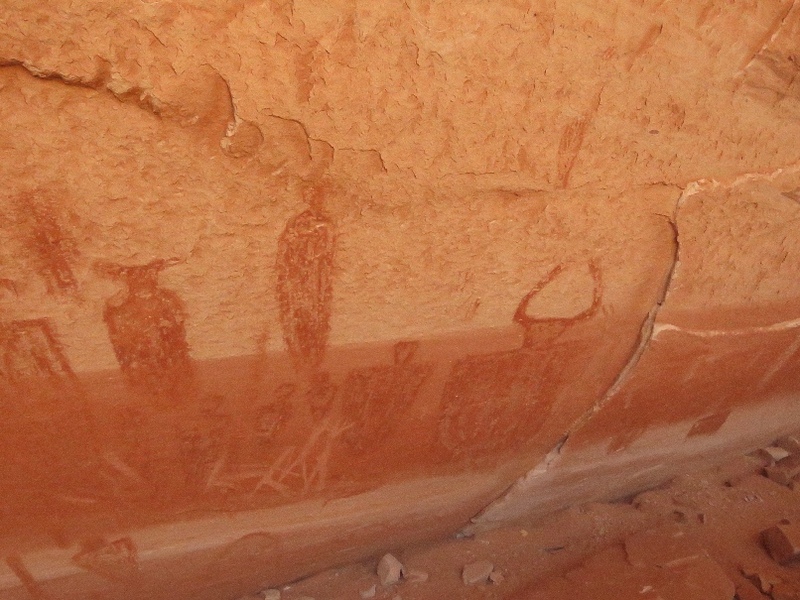 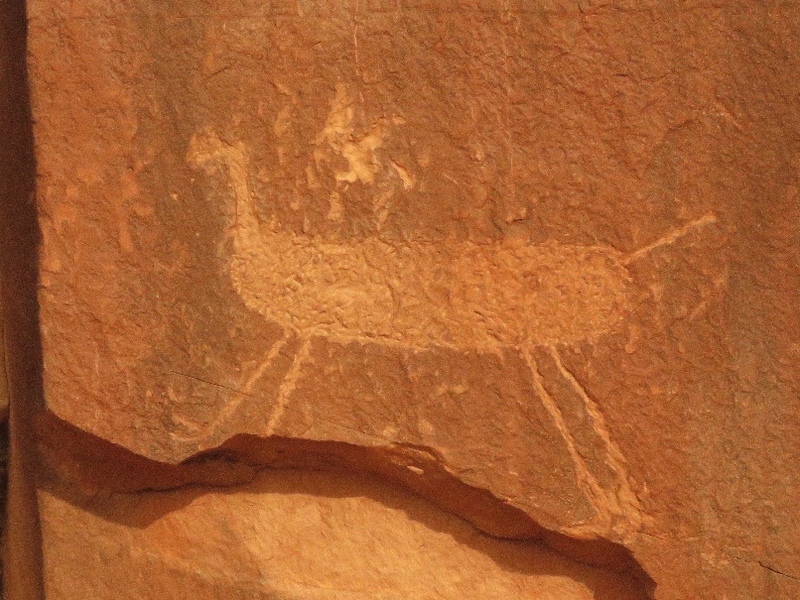 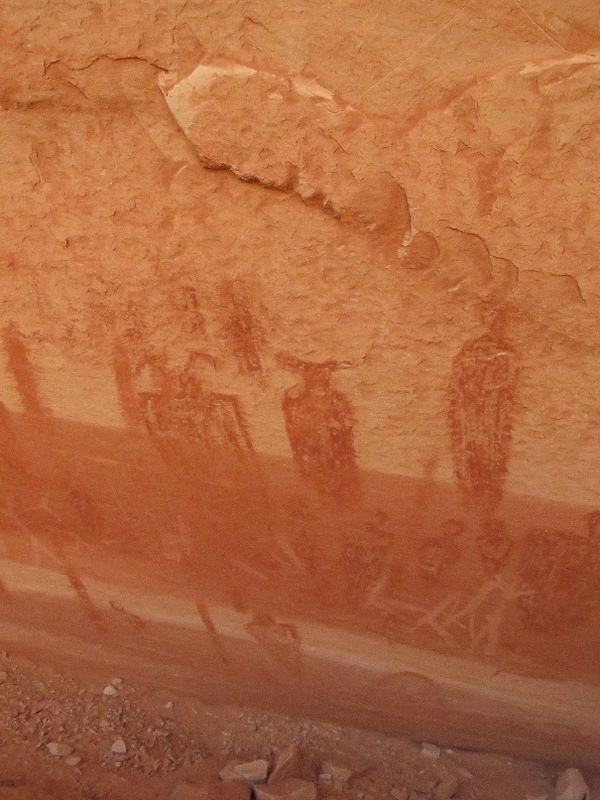 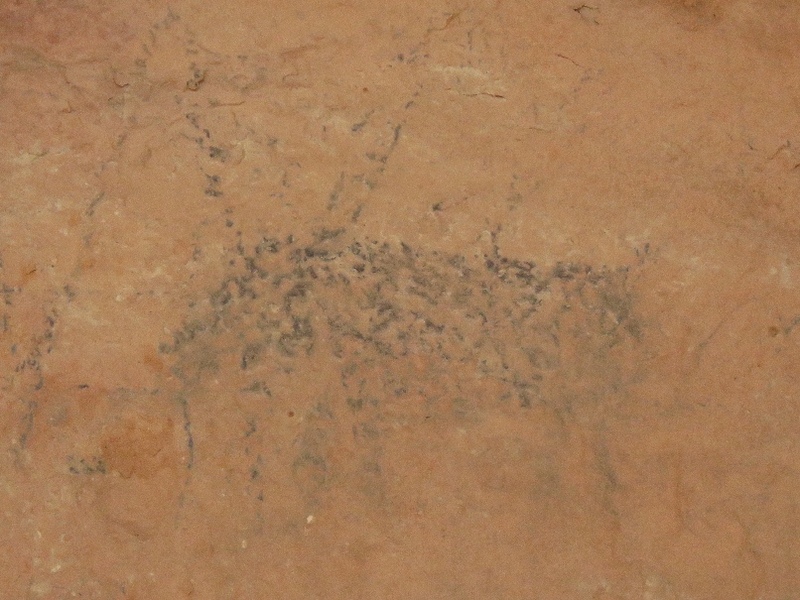 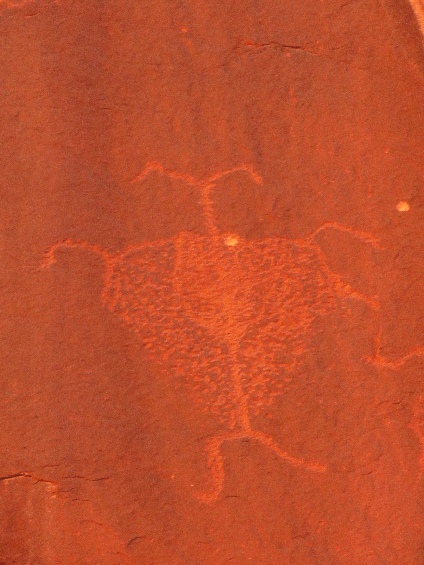 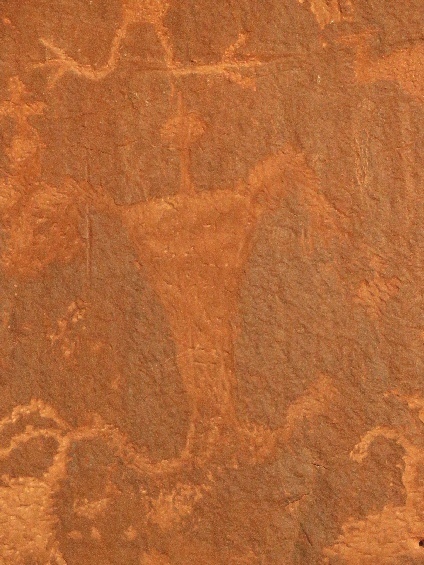 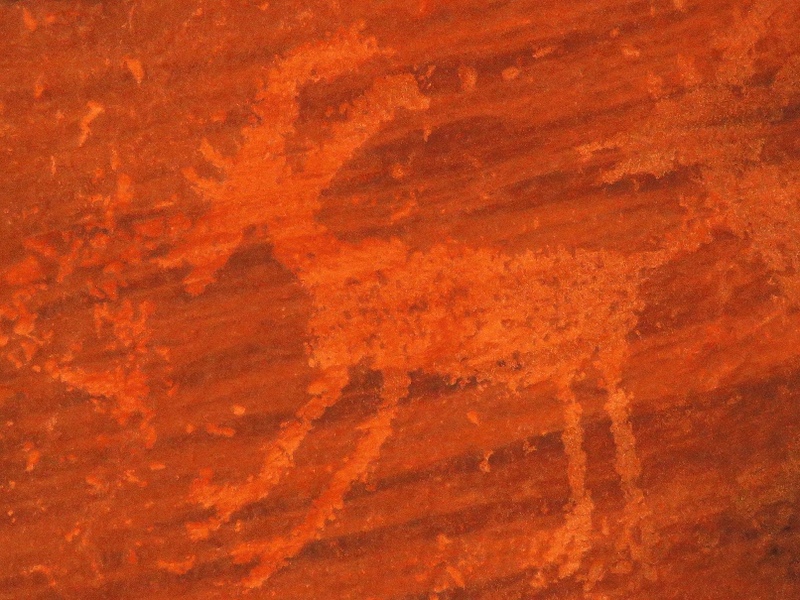 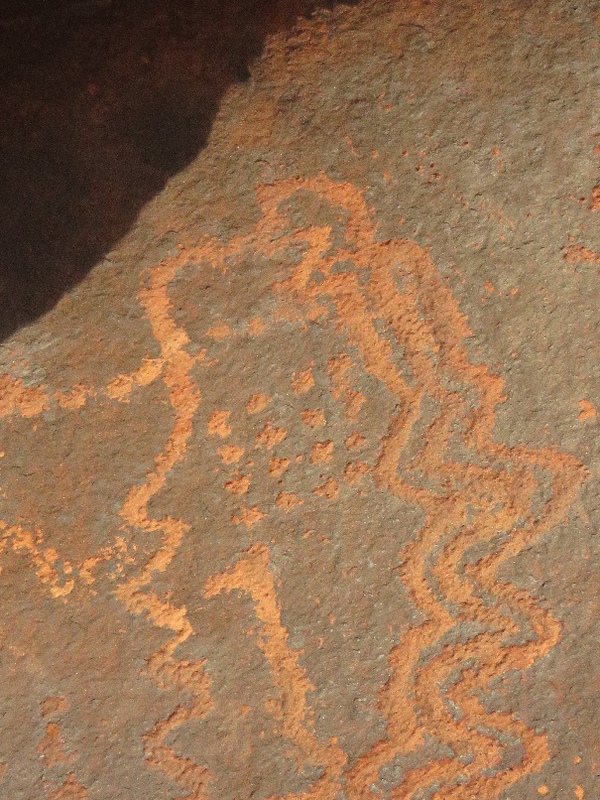 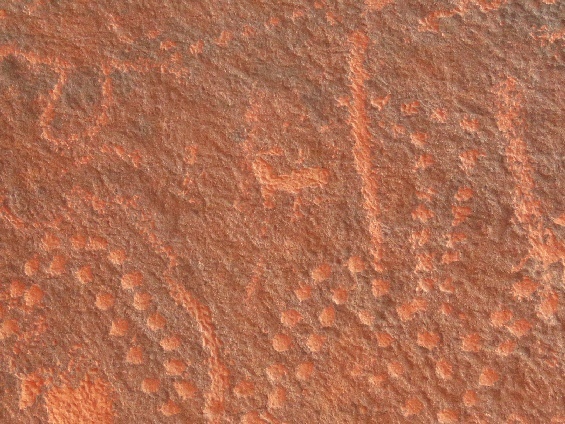 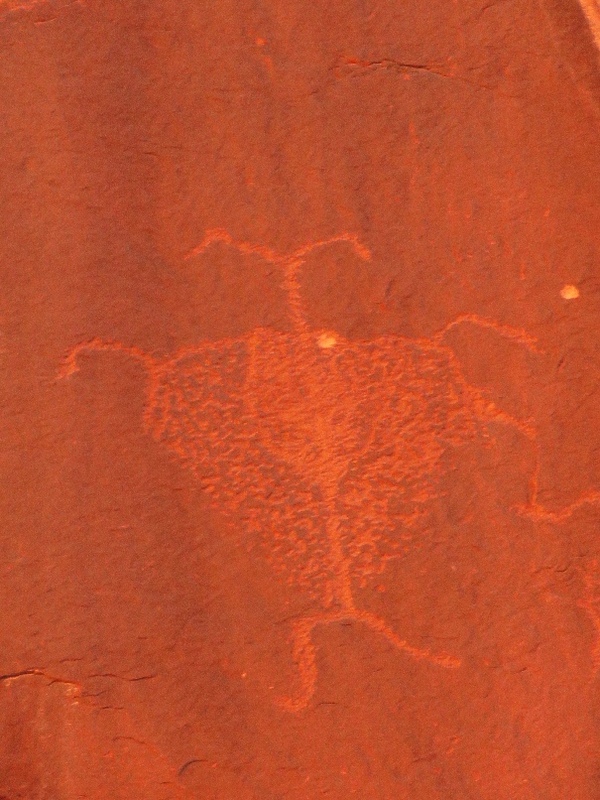 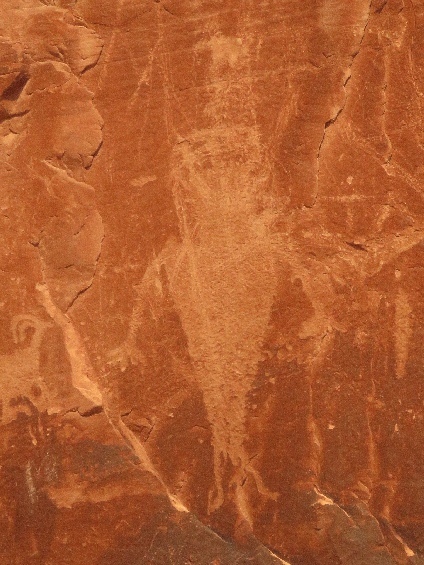 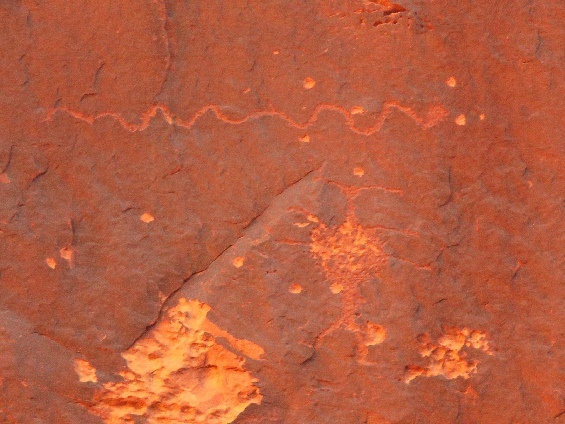 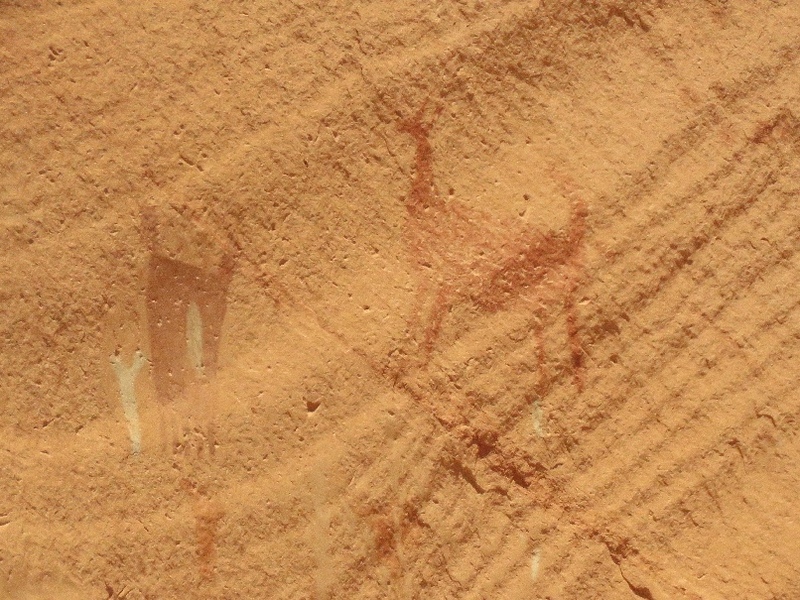 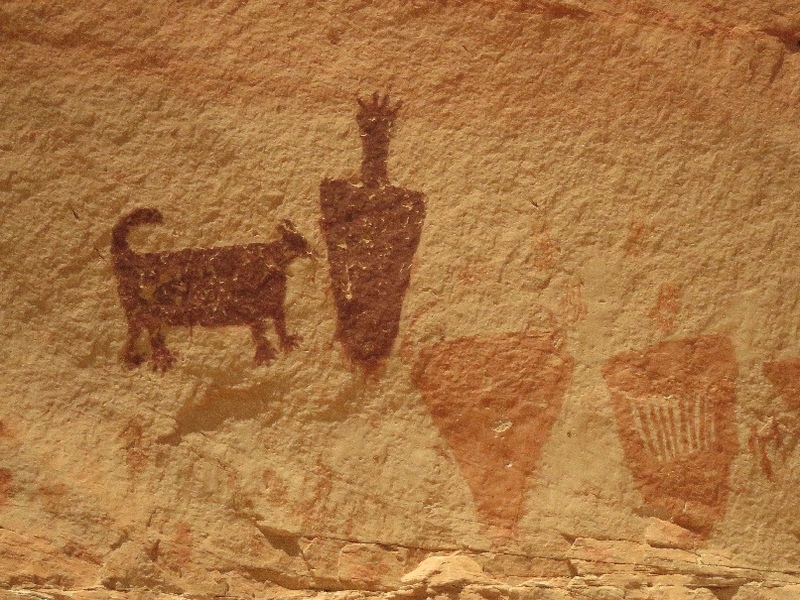 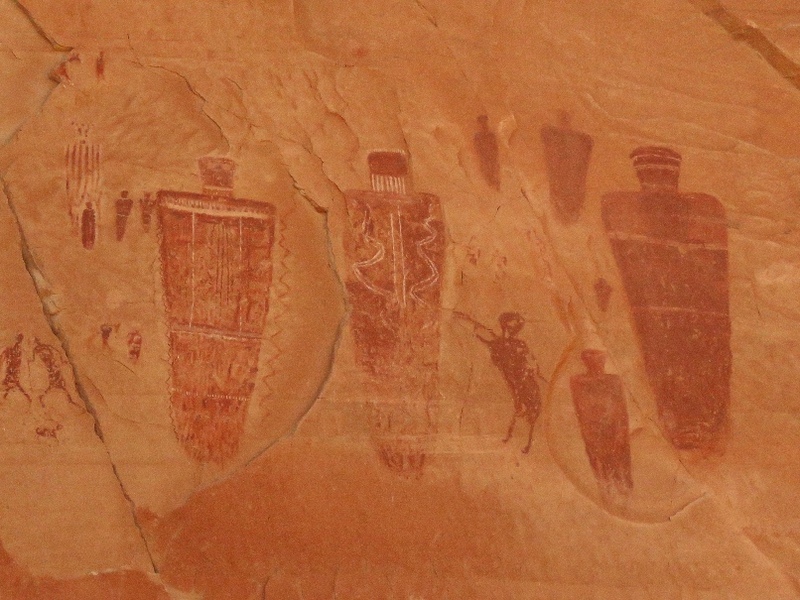 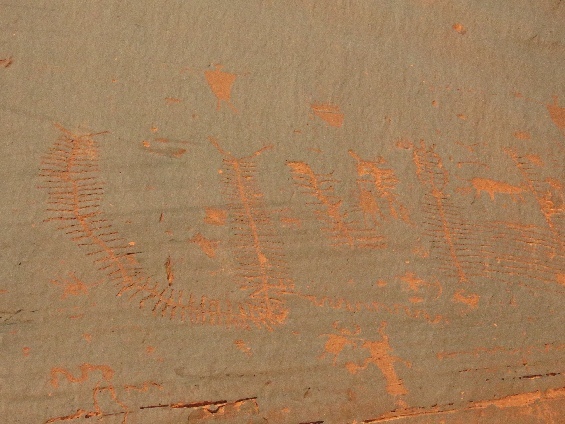 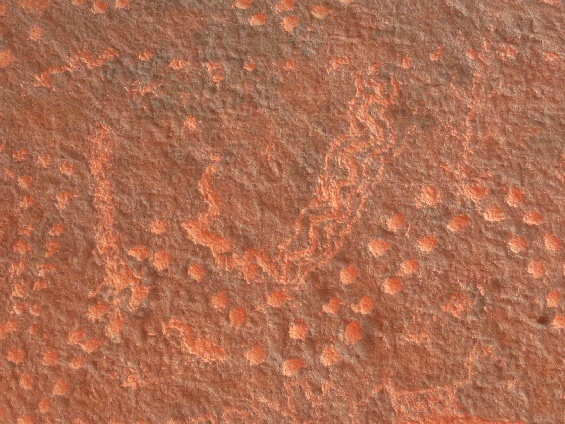 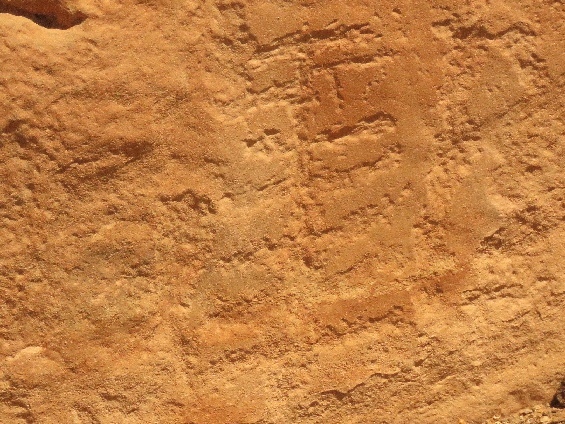 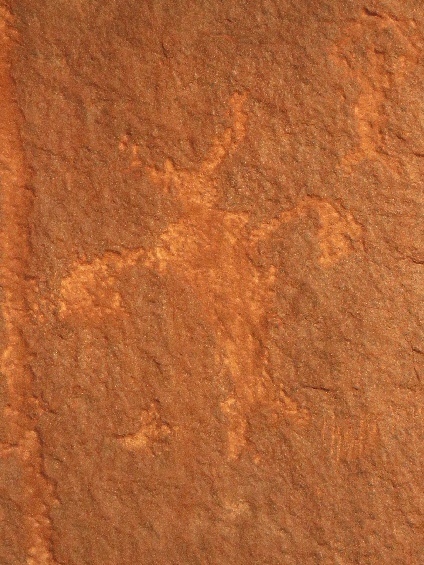 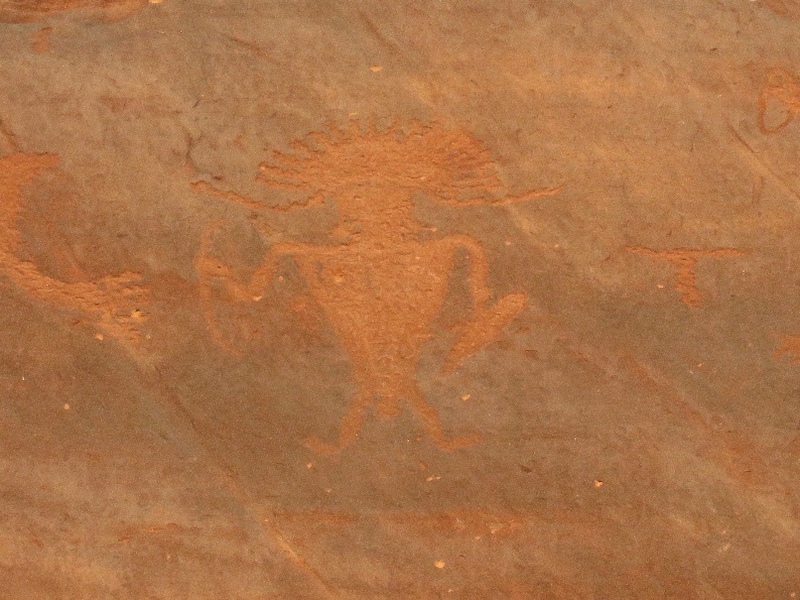 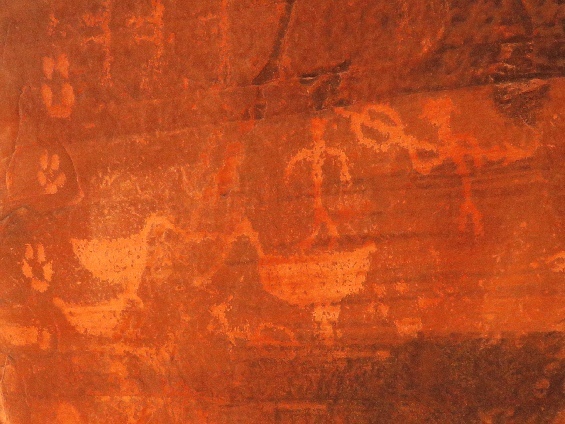 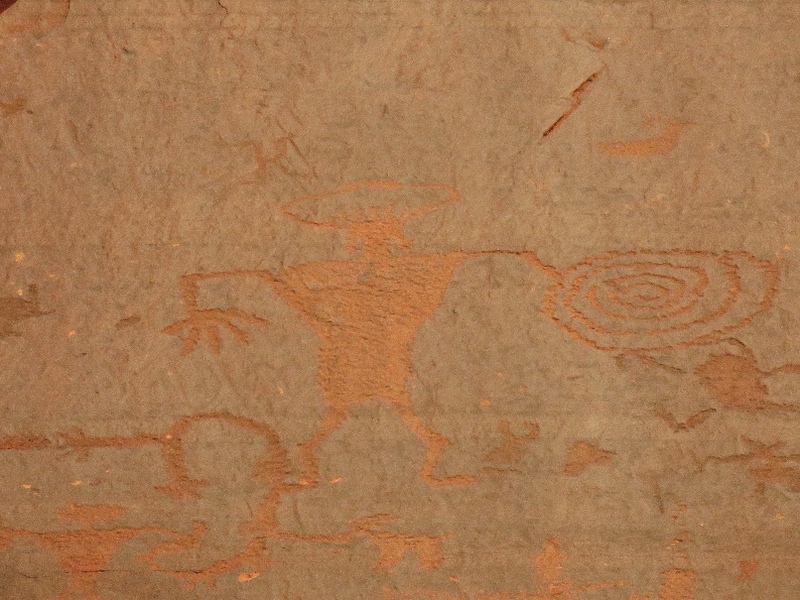 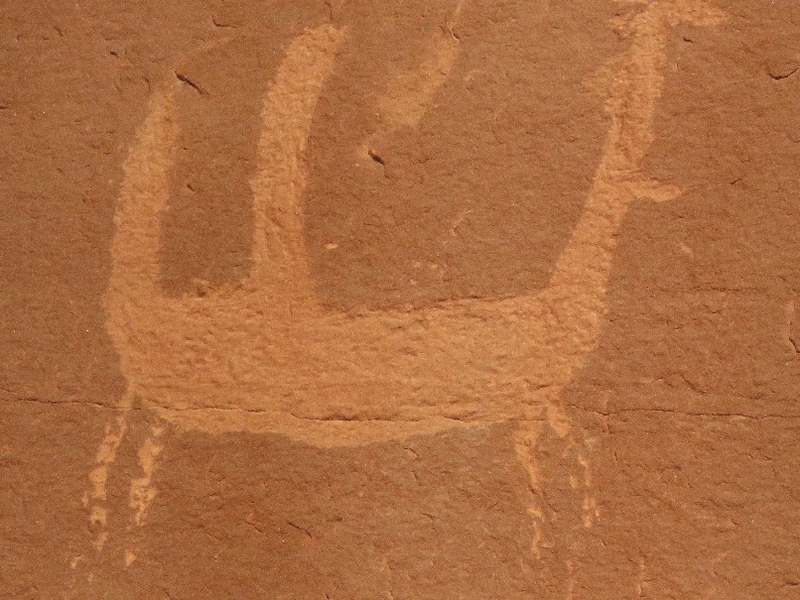 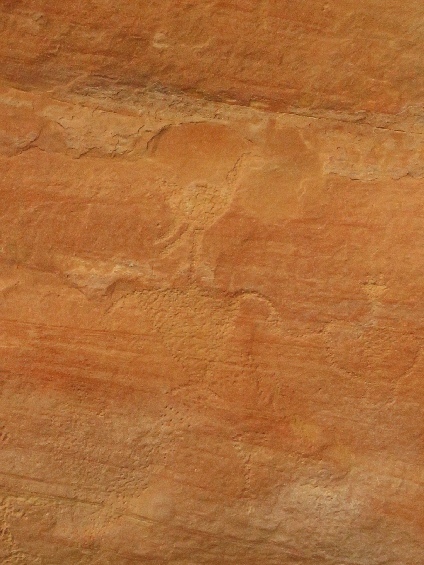 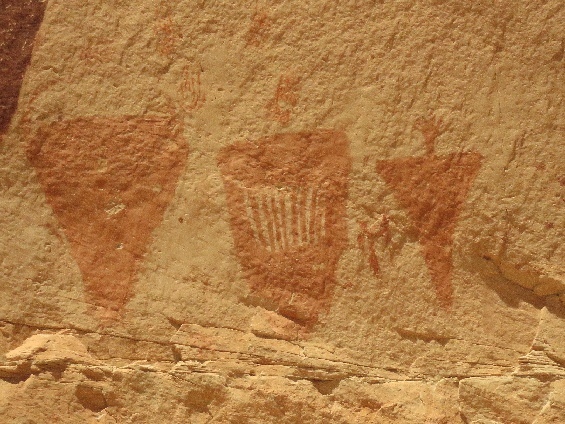 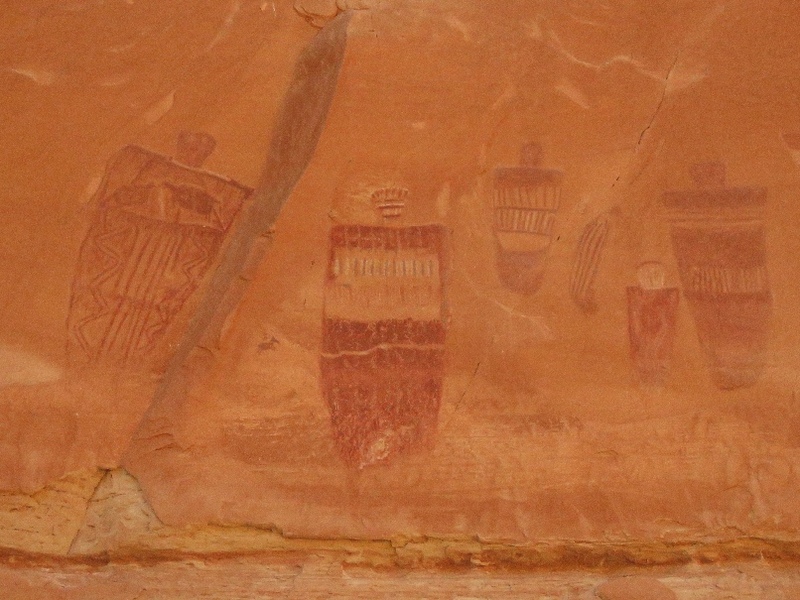 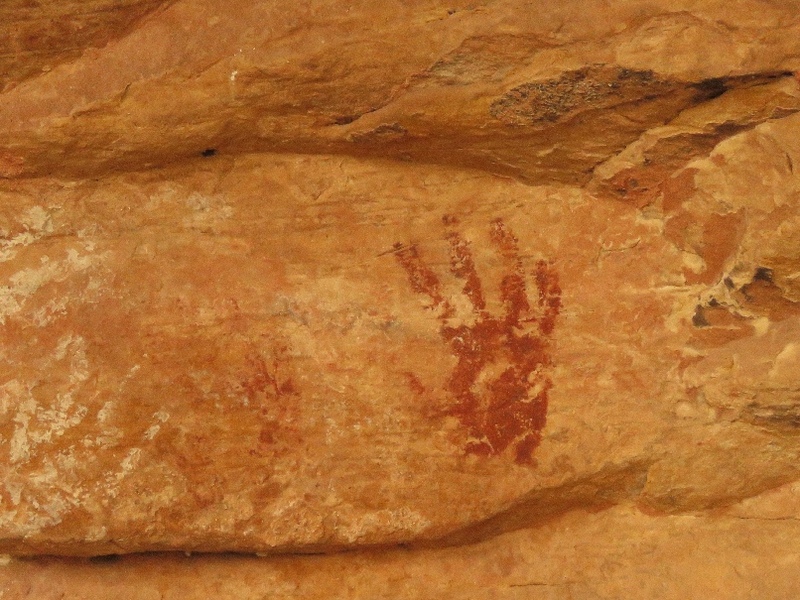 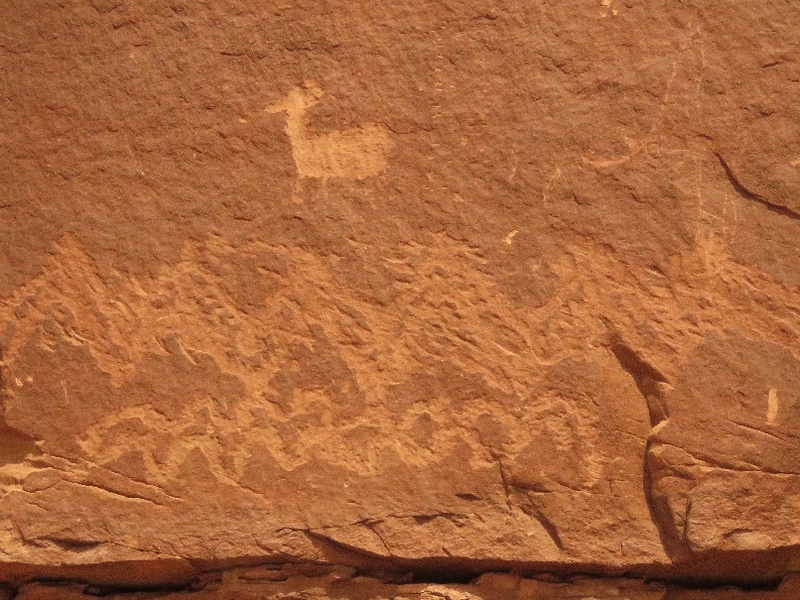 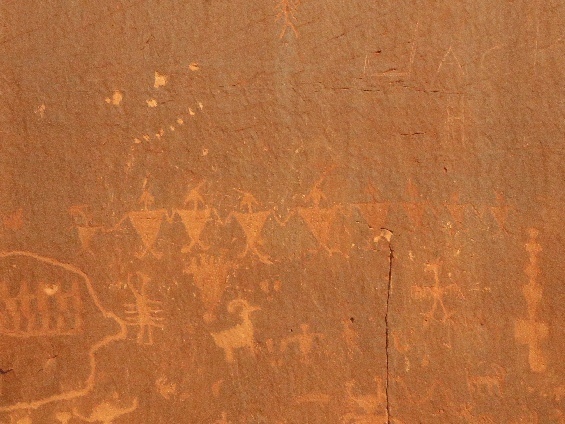 4/18/2019 Great Gallery, Maze Tour (Day 1), Canyonlands National Park, UT - This is the high light of the pictographs panel in the Horseshoe Canyon (formerly known as Barrier Canyon). 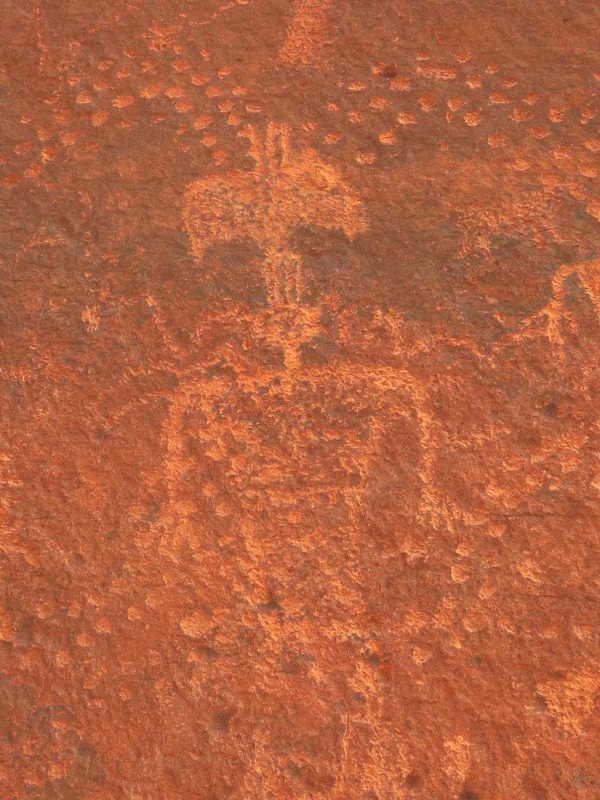 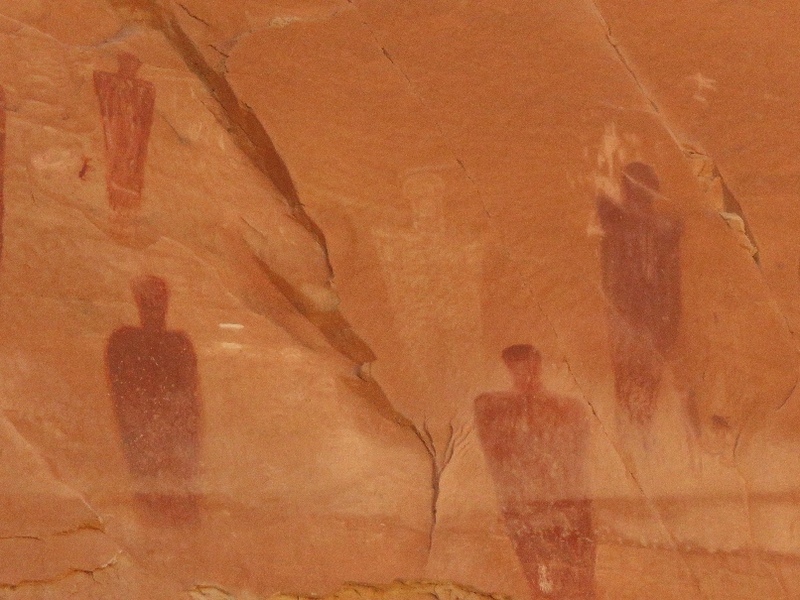 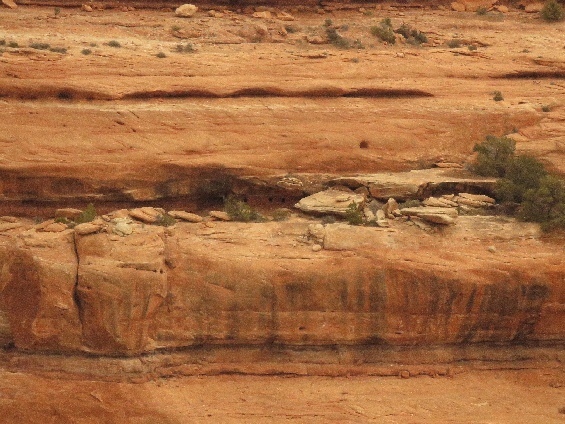 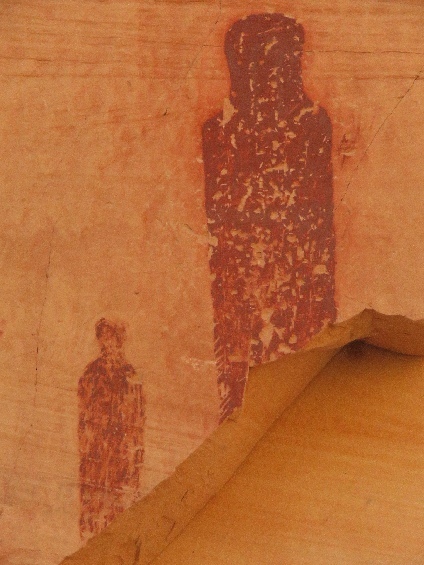 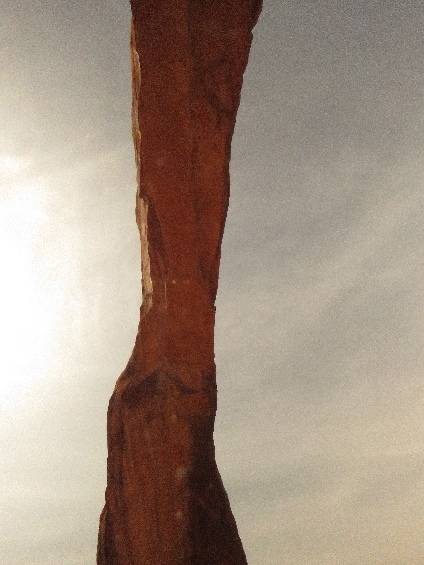 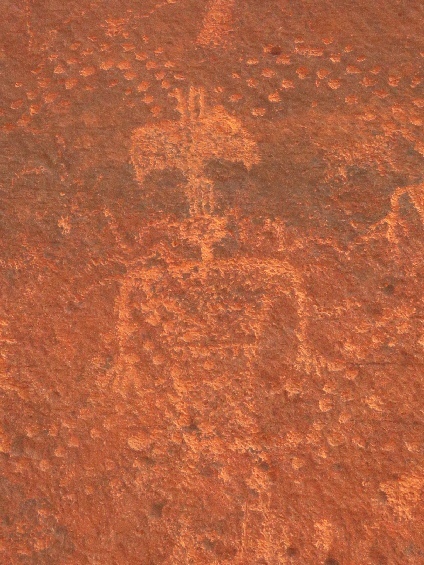 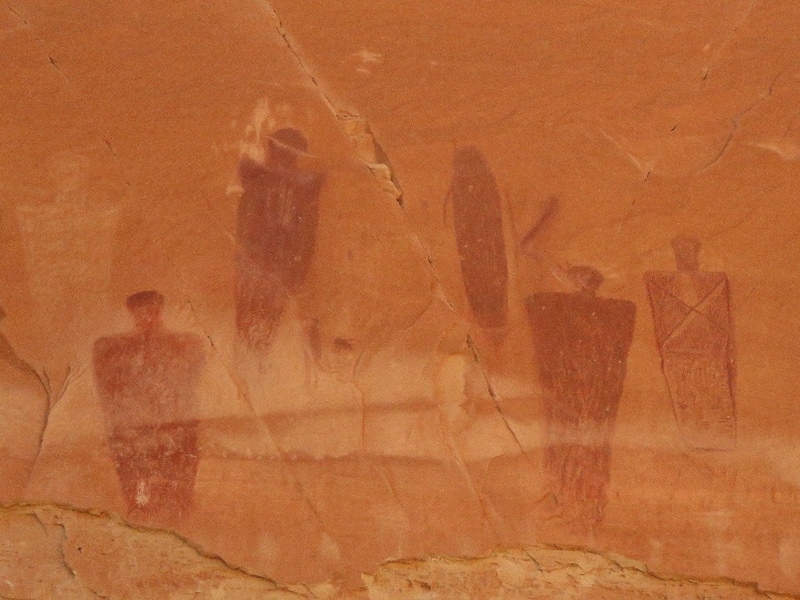 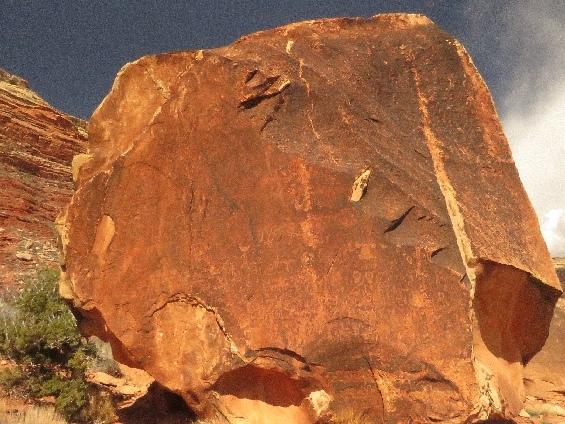 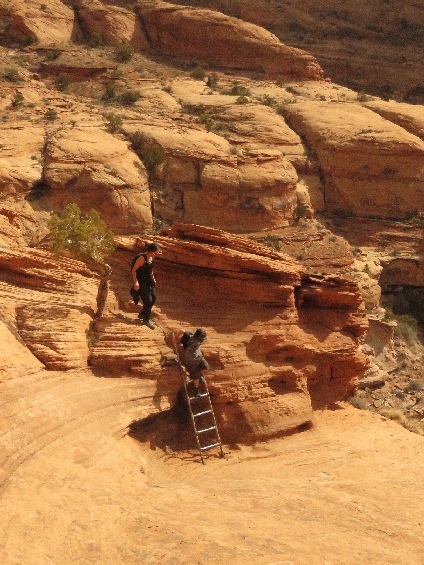 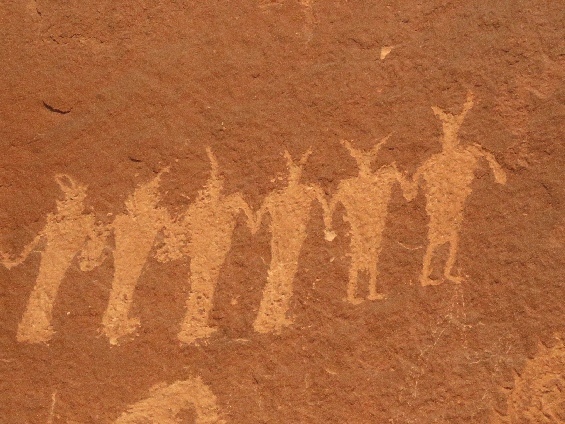 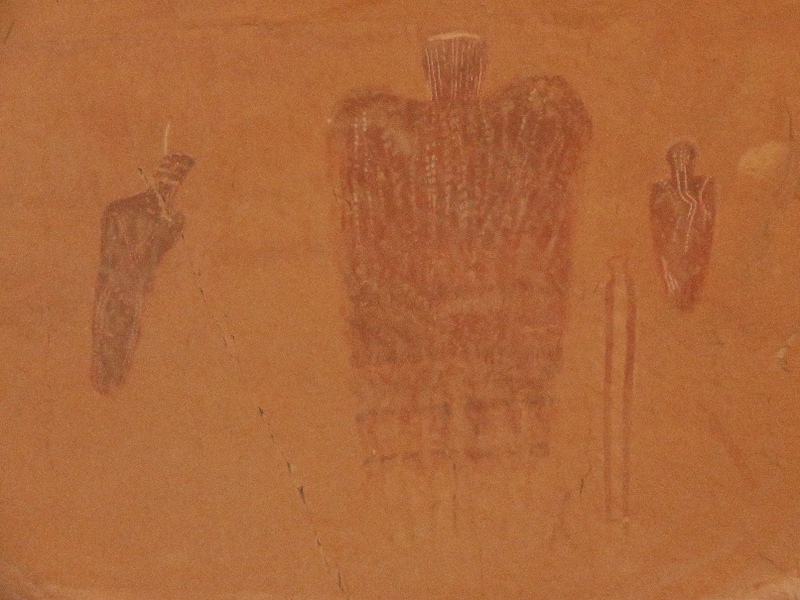 The panel is Barrier Canyon style and life-size figures. 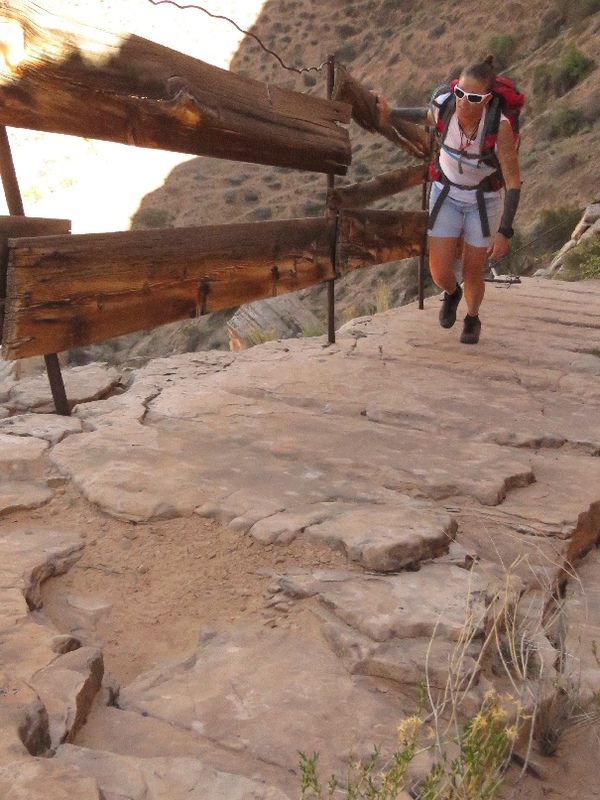 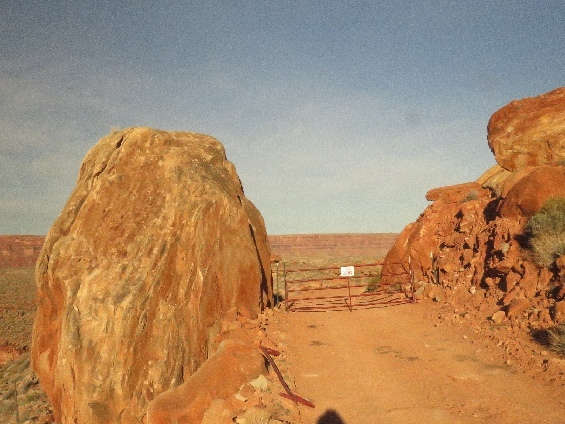 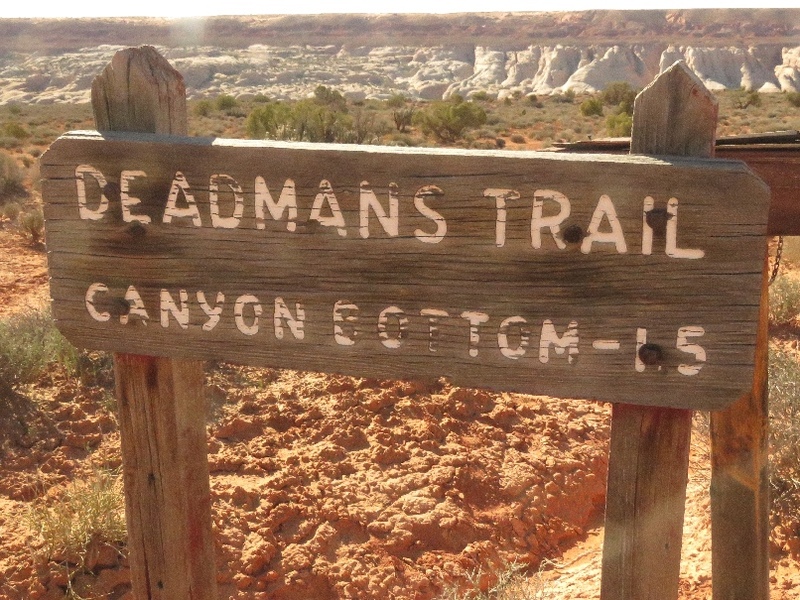 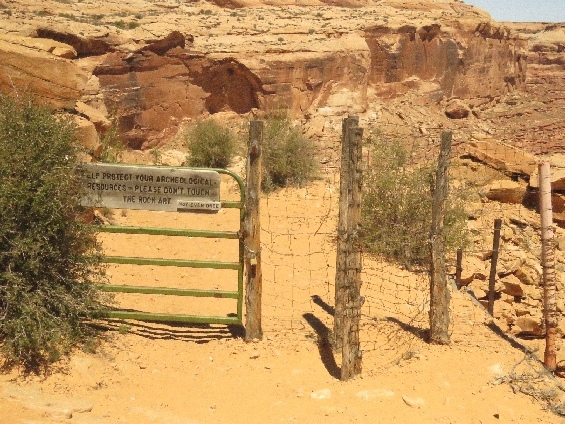 4/18/2019 Deadmans Trail, Maze Tour (Day 1), Canyonlands National Park, UT - This trail is steep and some segment is provided handfolder/fence on this trail, originally it was for the cows. We’ve hiked up this trail from the Great Gallery to top of the mesa. 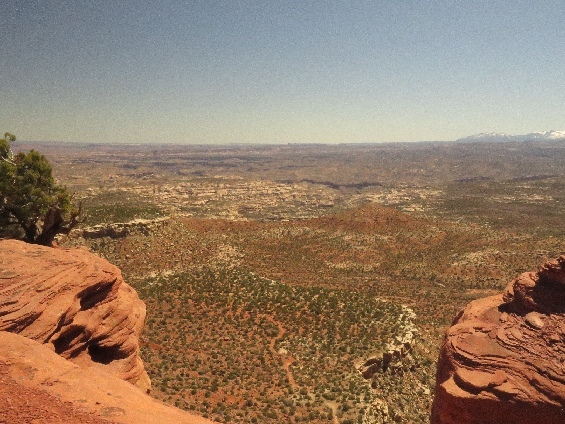 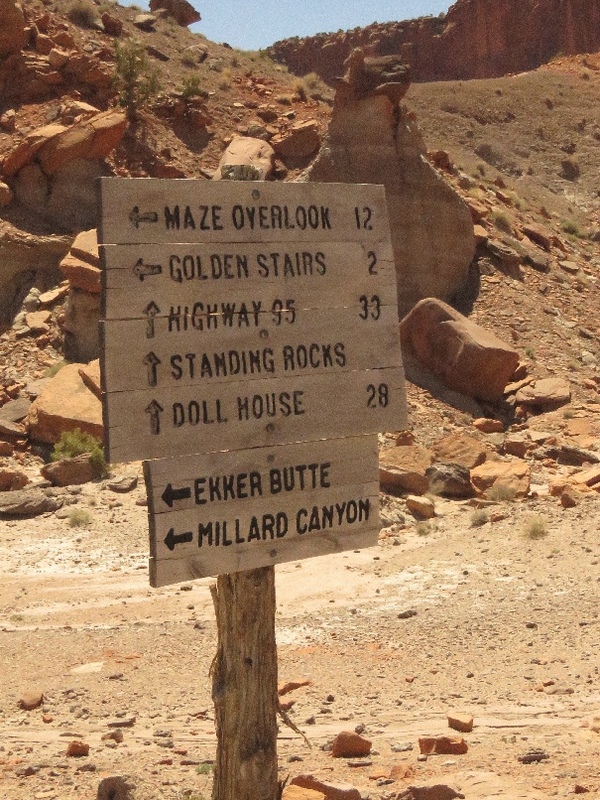 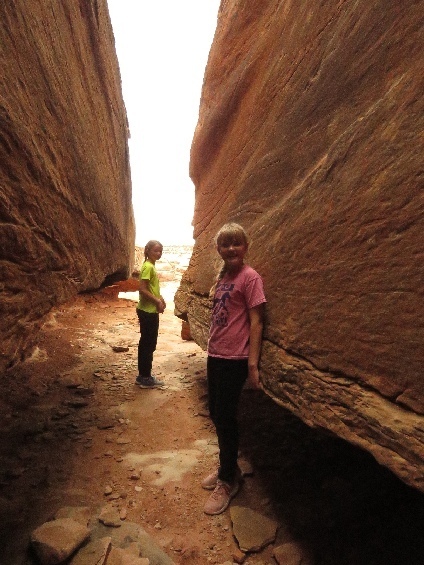 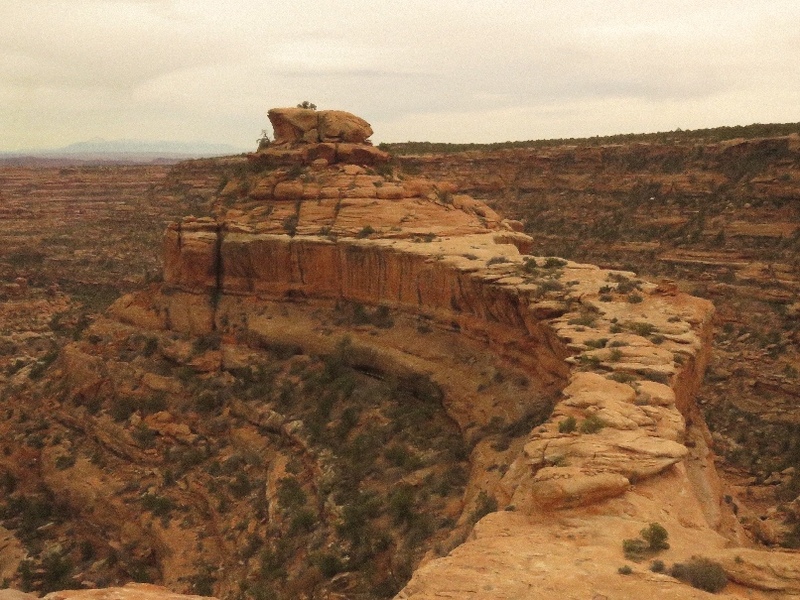 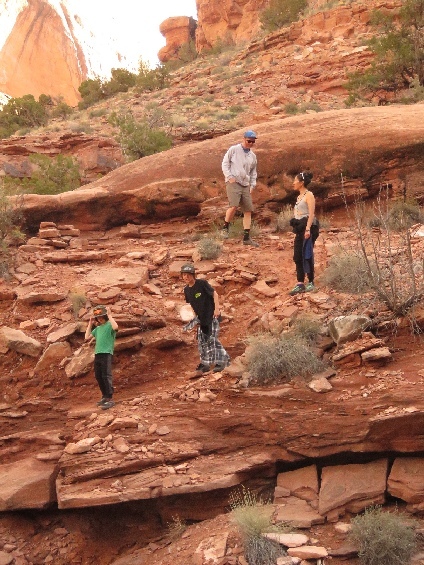 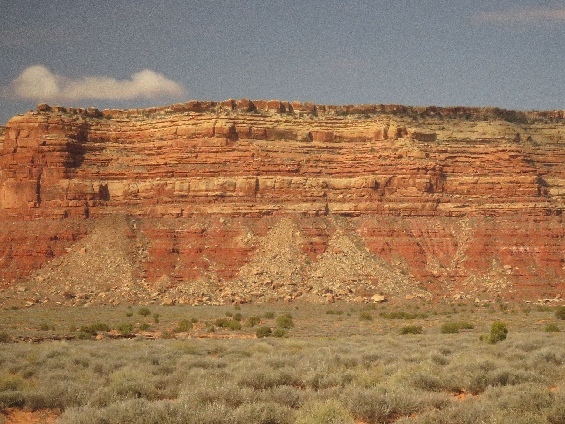 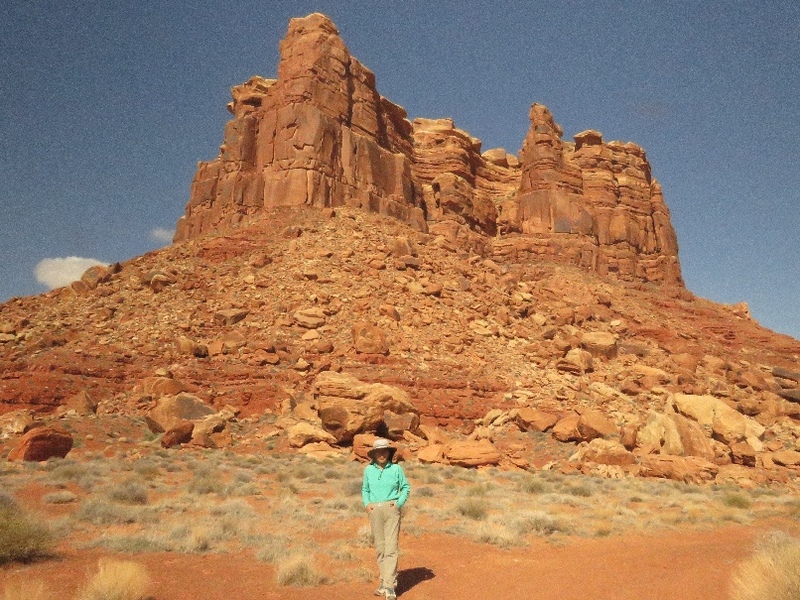 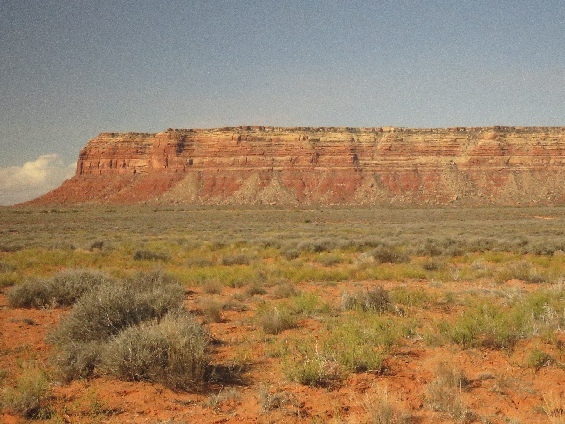 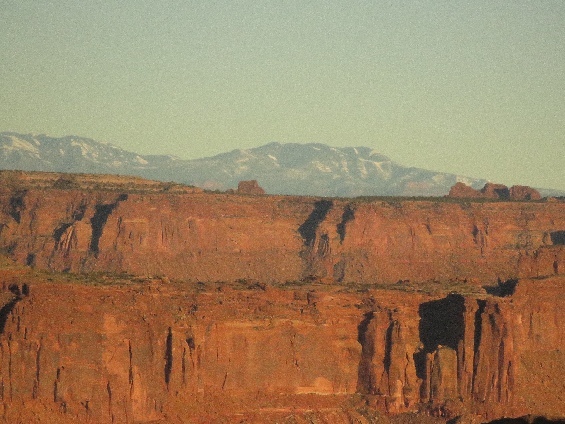 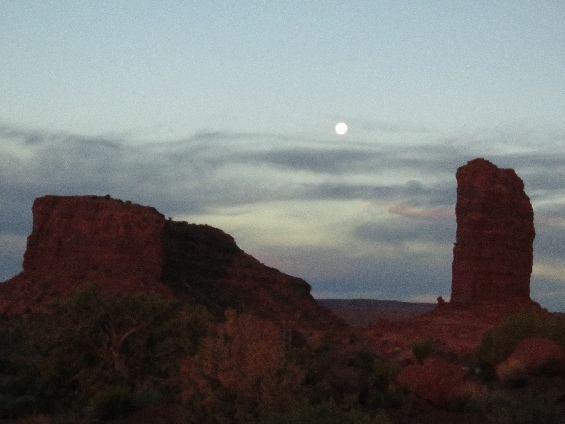 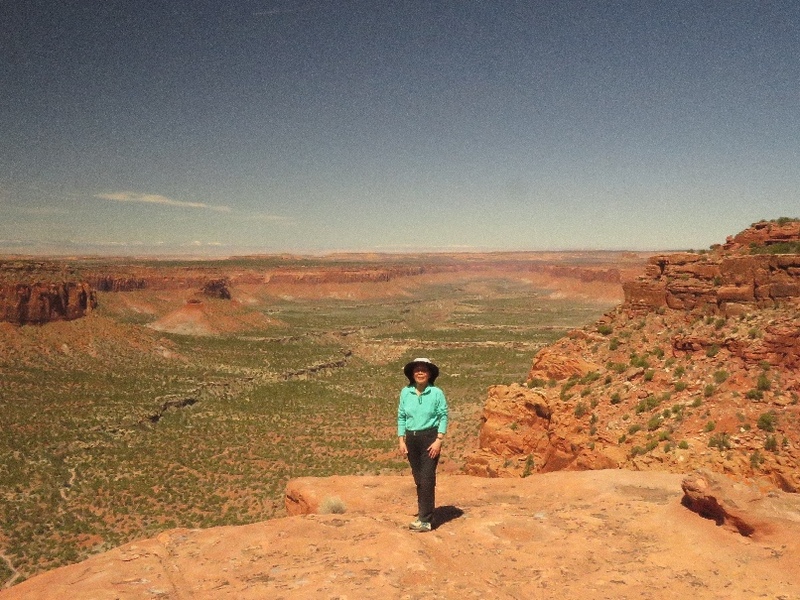 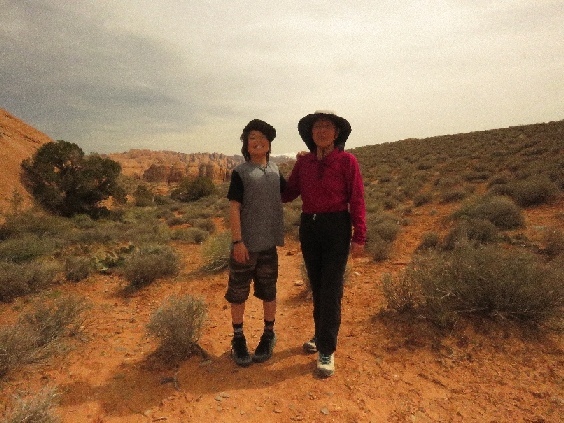 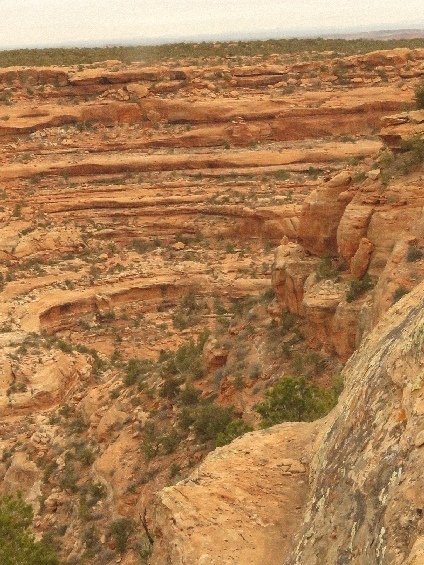 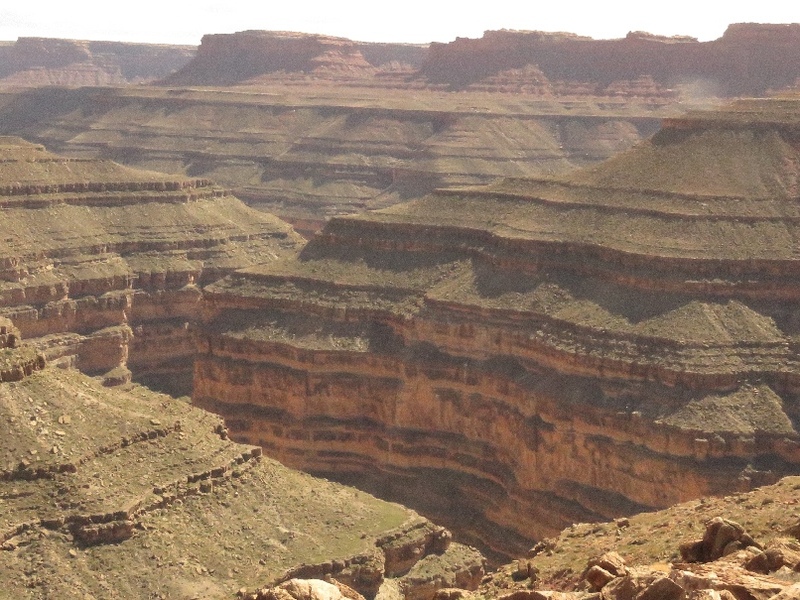 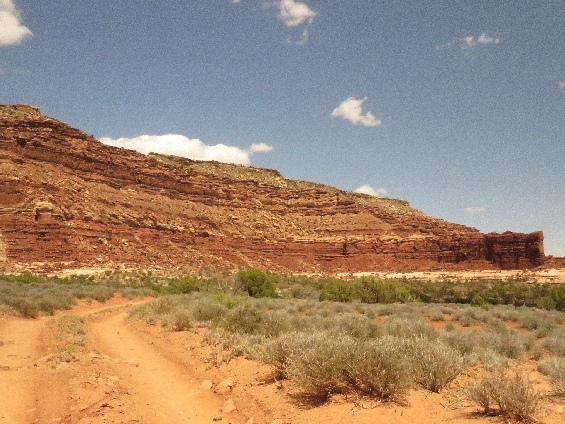 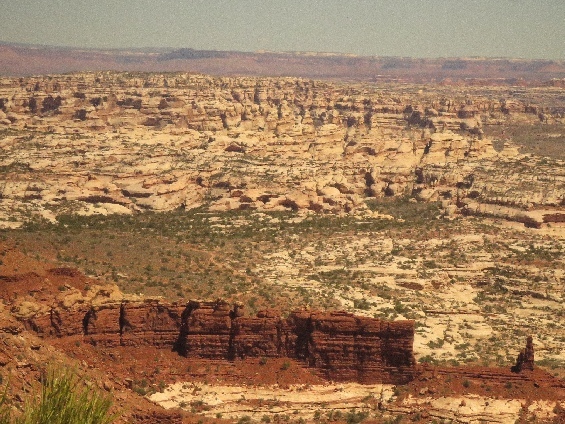 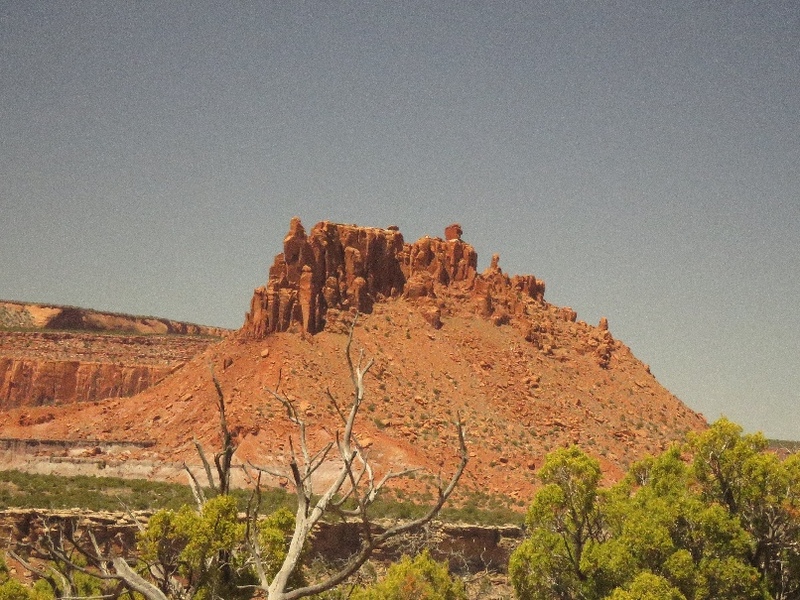 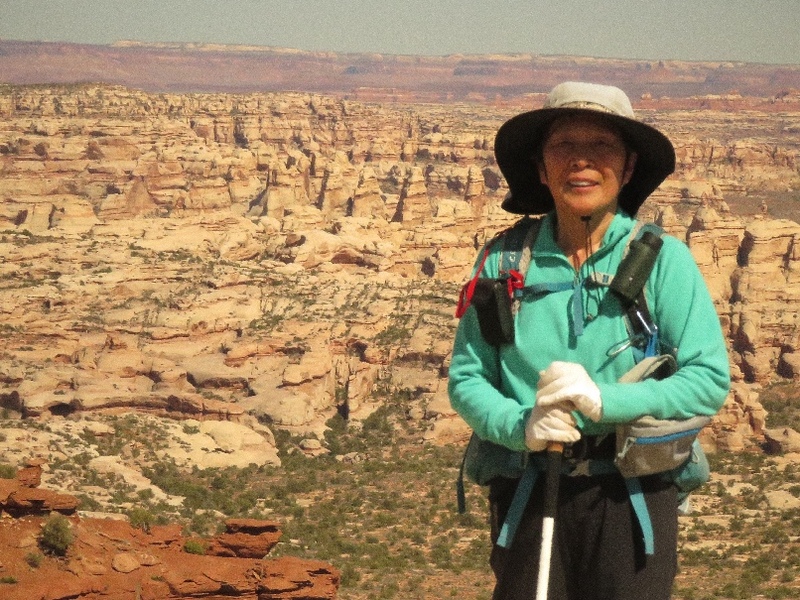 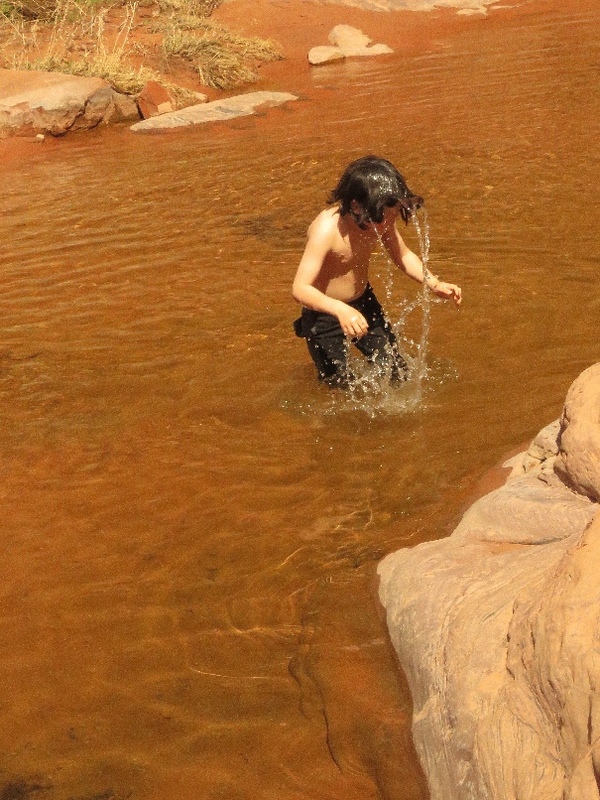 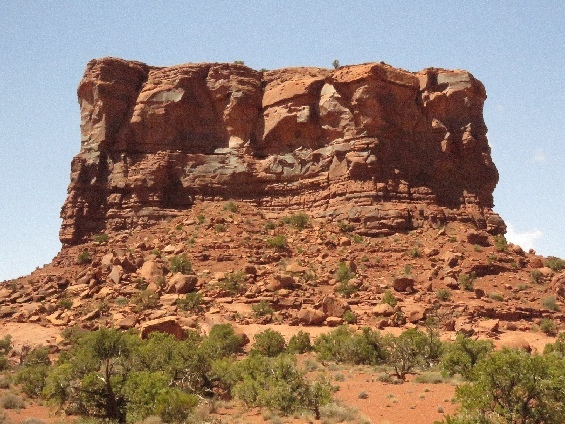 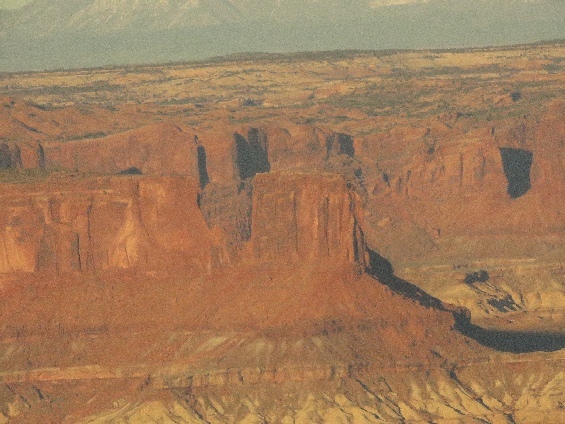 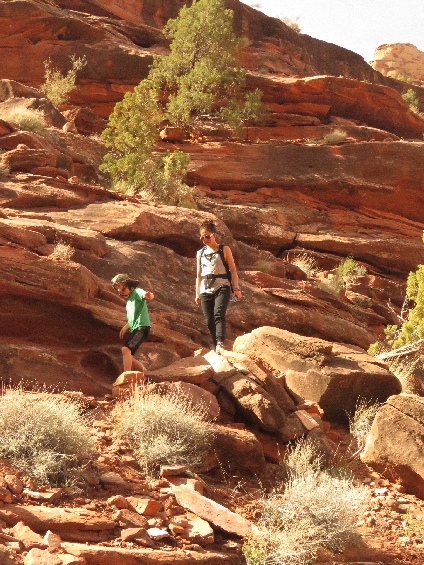 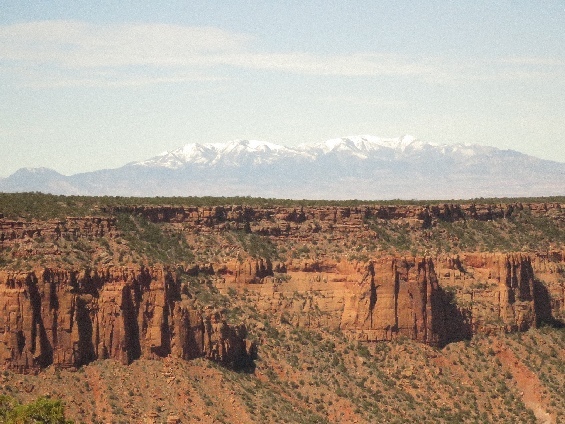 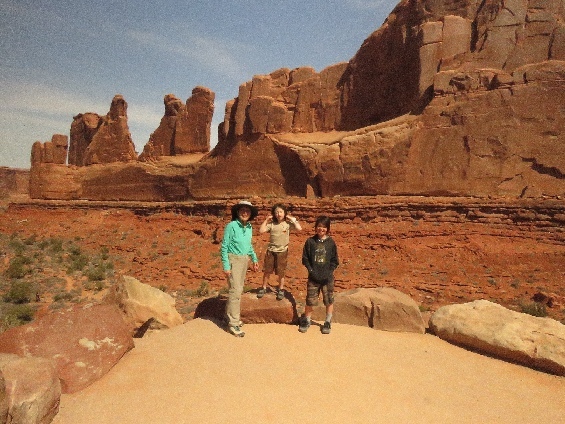 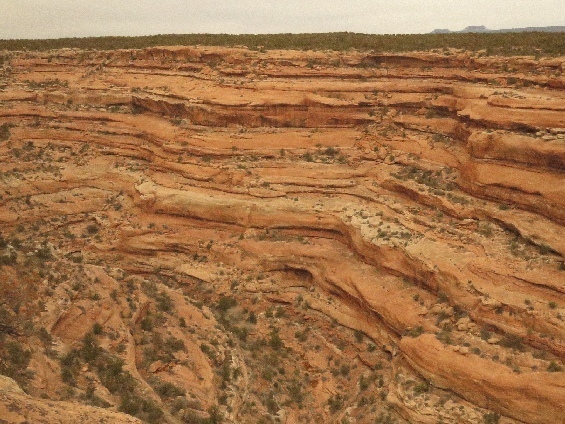 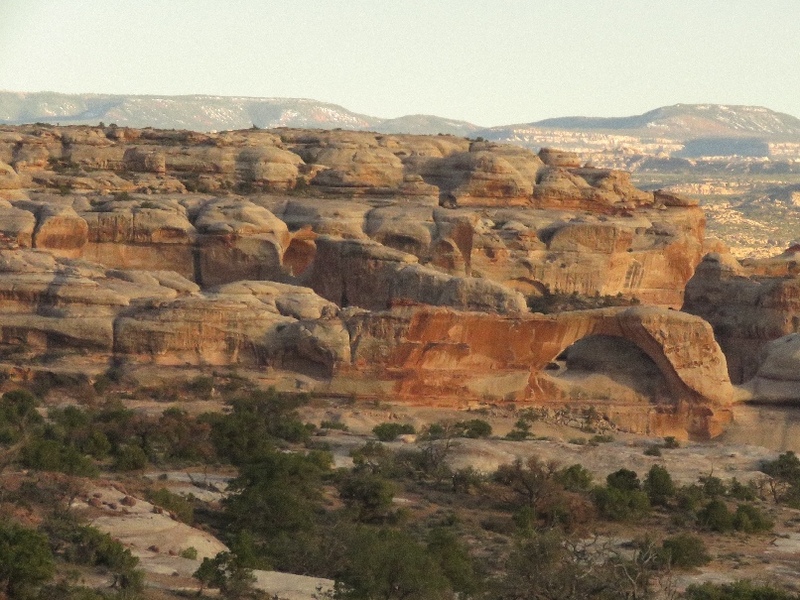 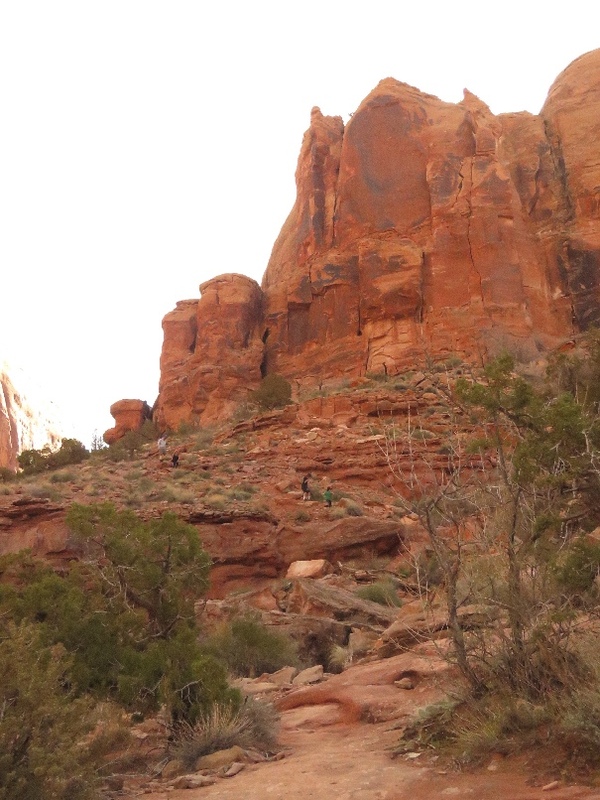 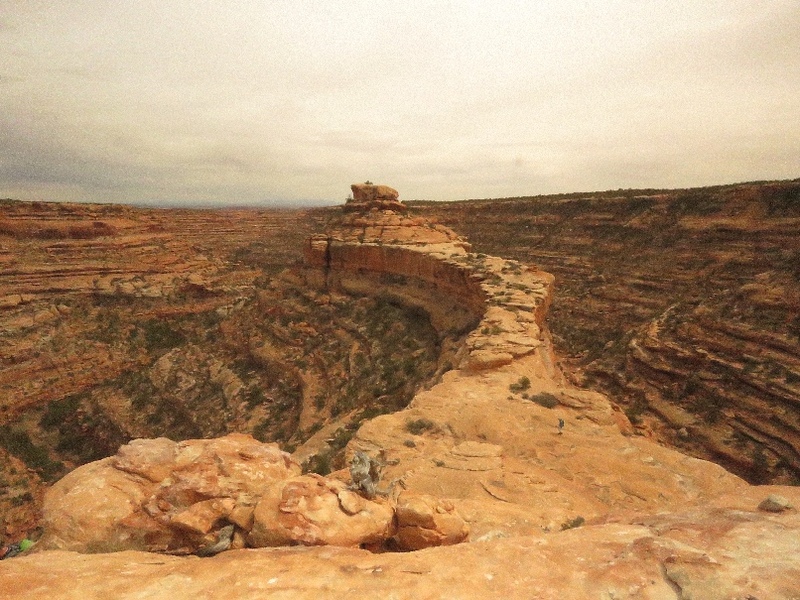 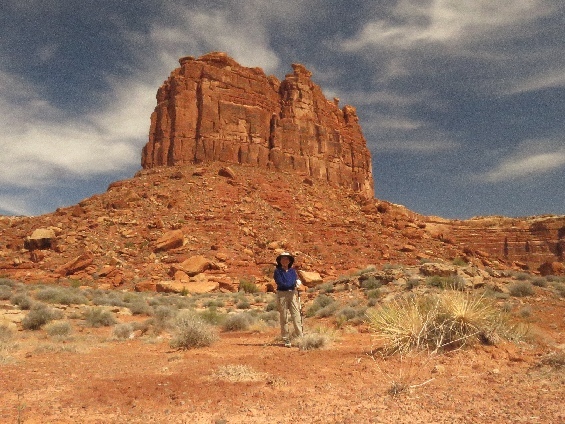 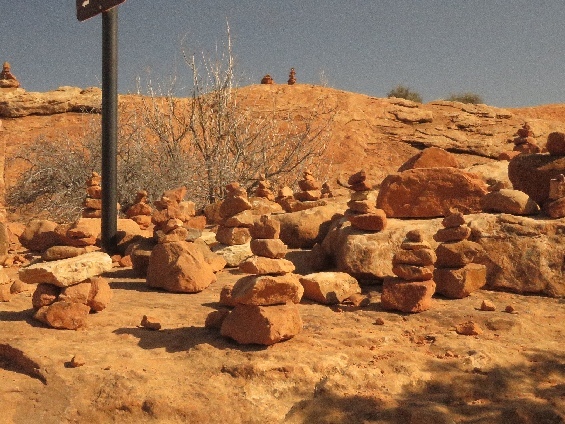 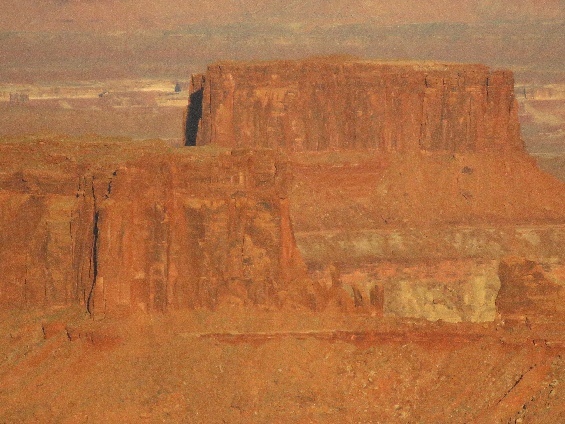 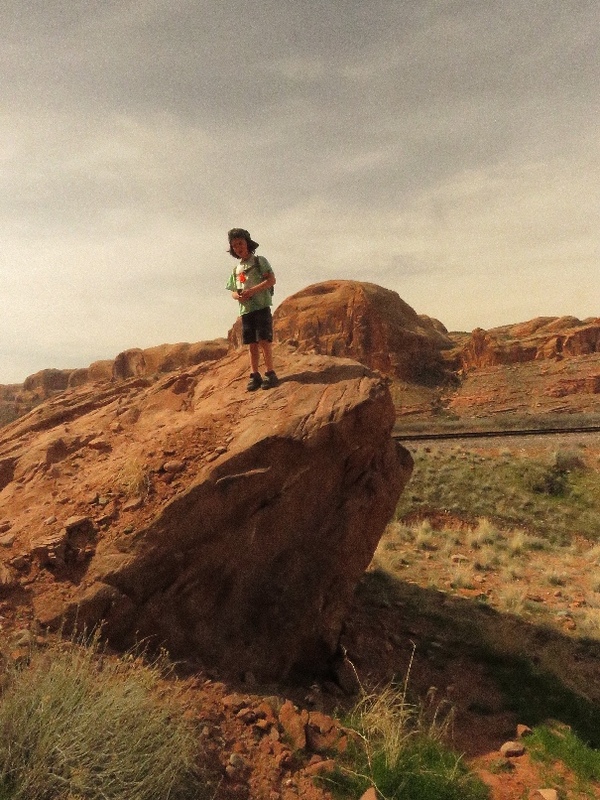 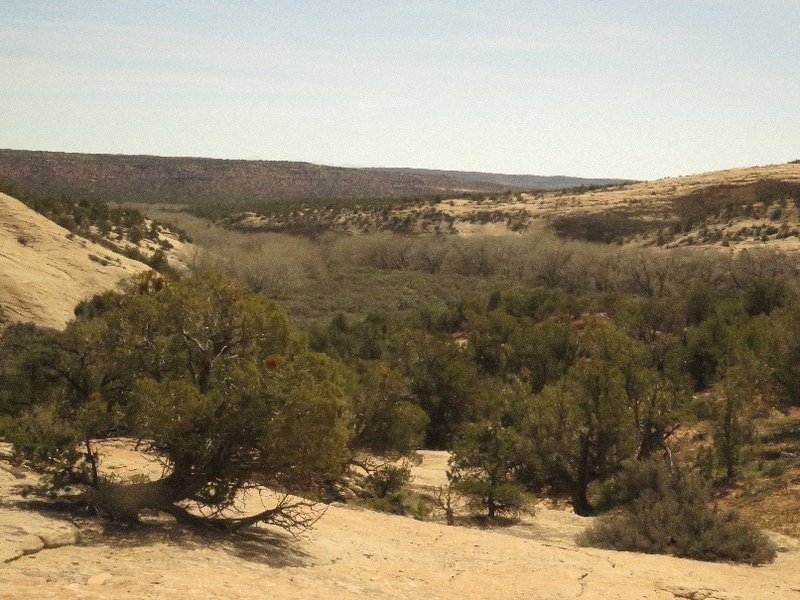 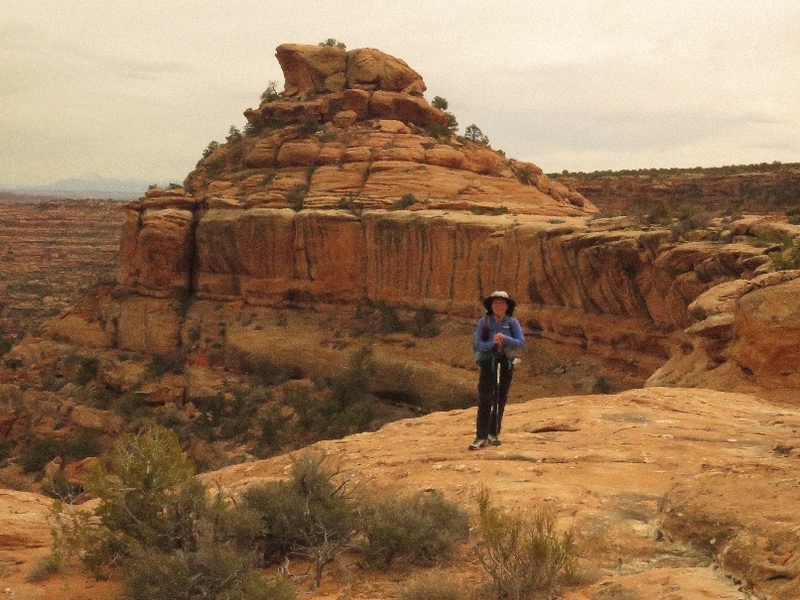 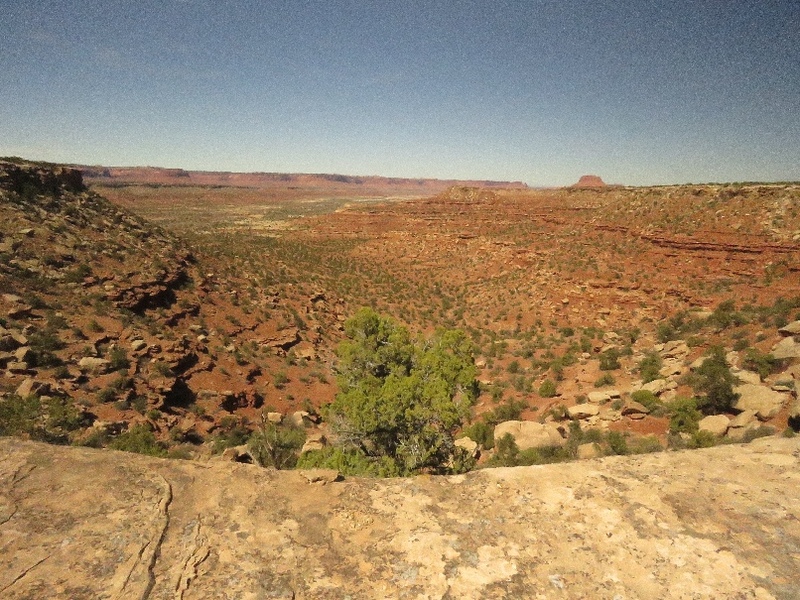 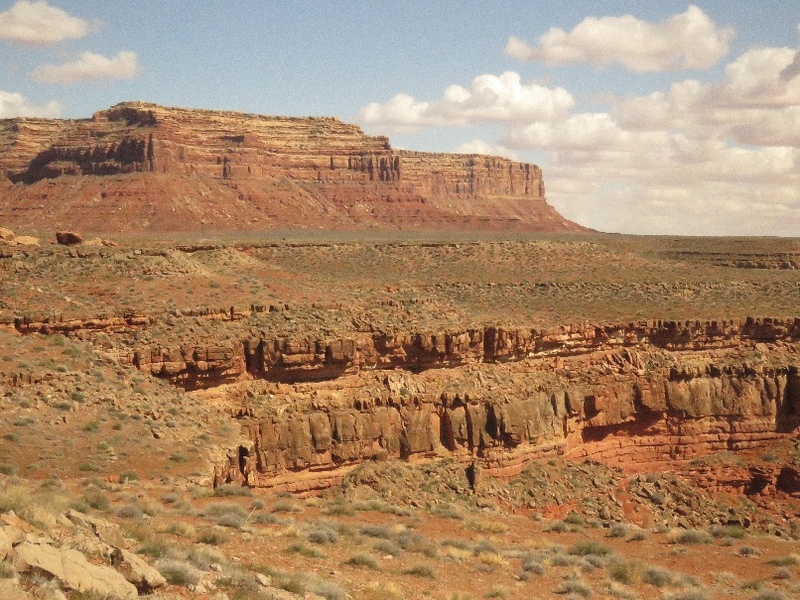 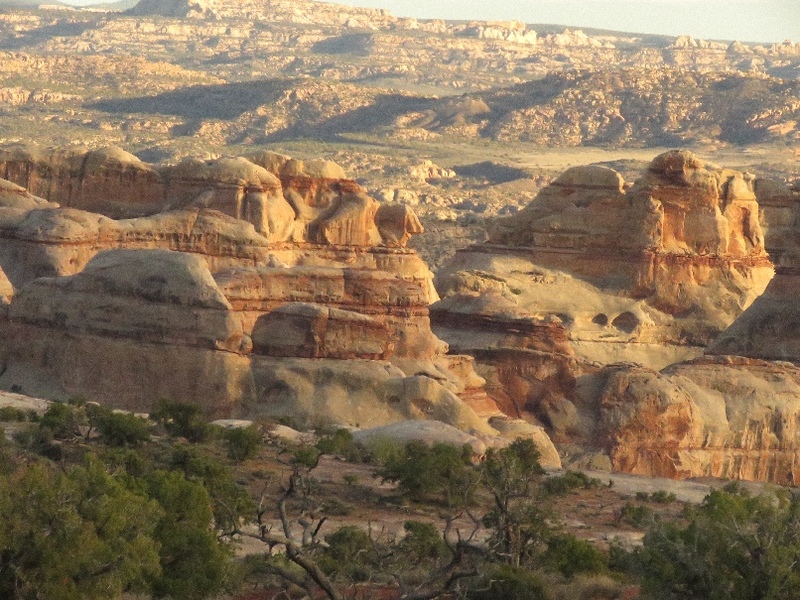 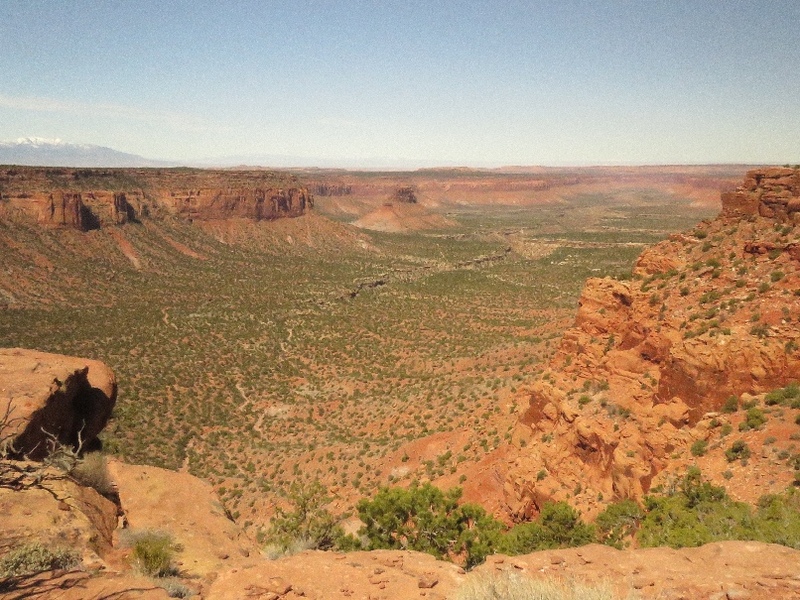 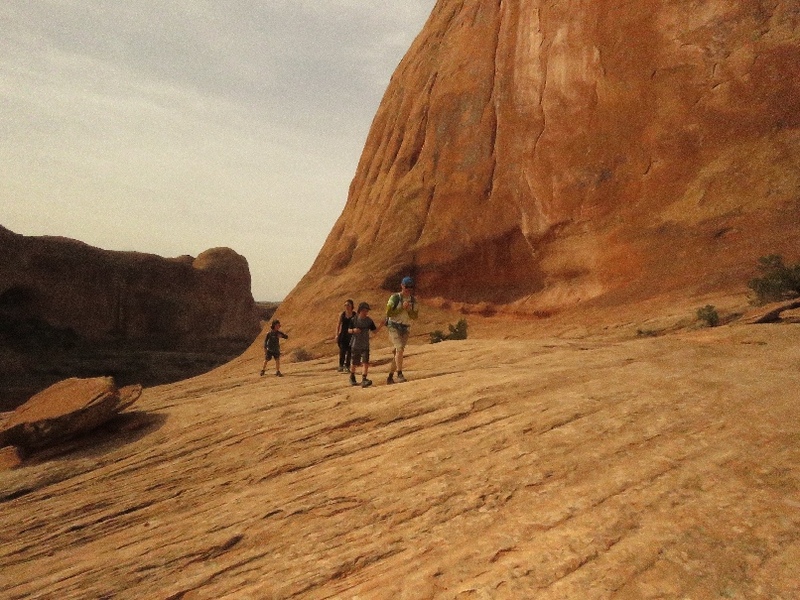 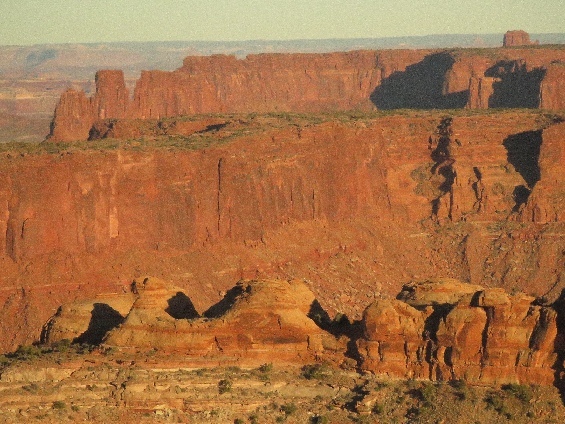 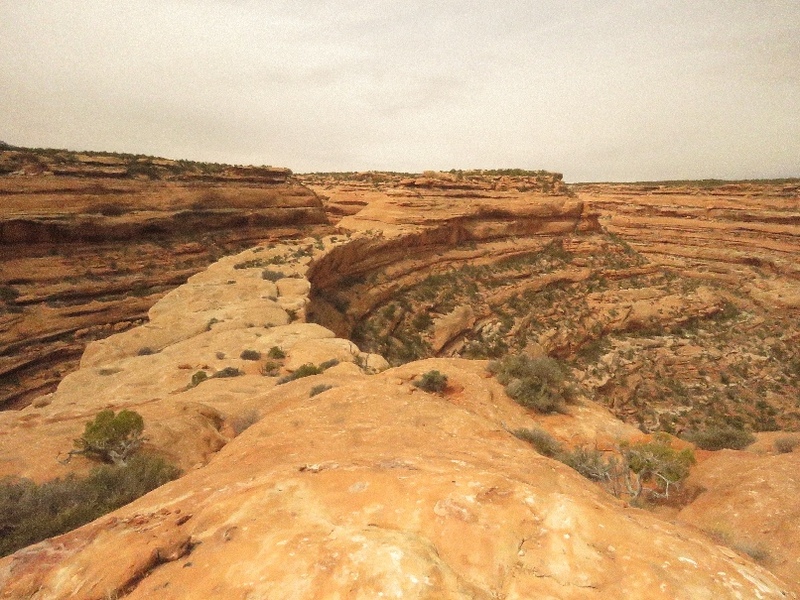 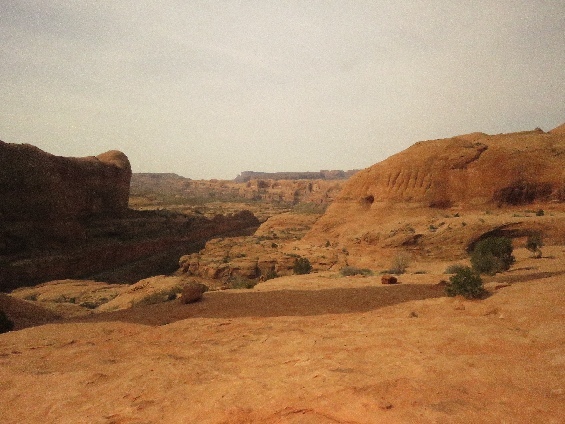 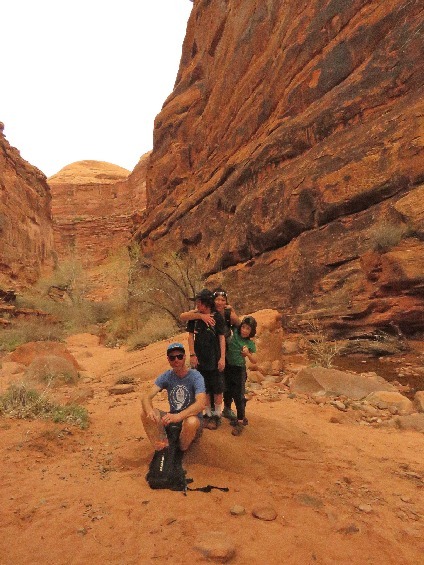 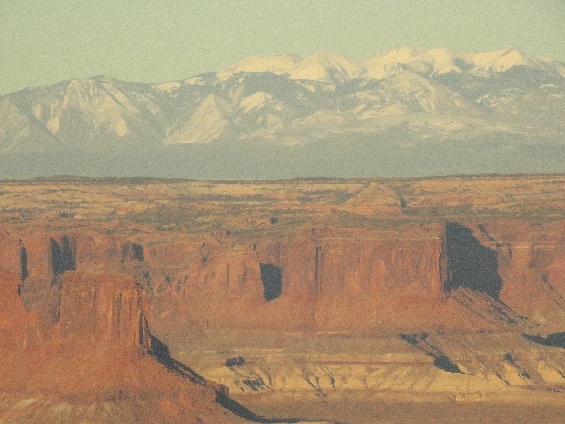 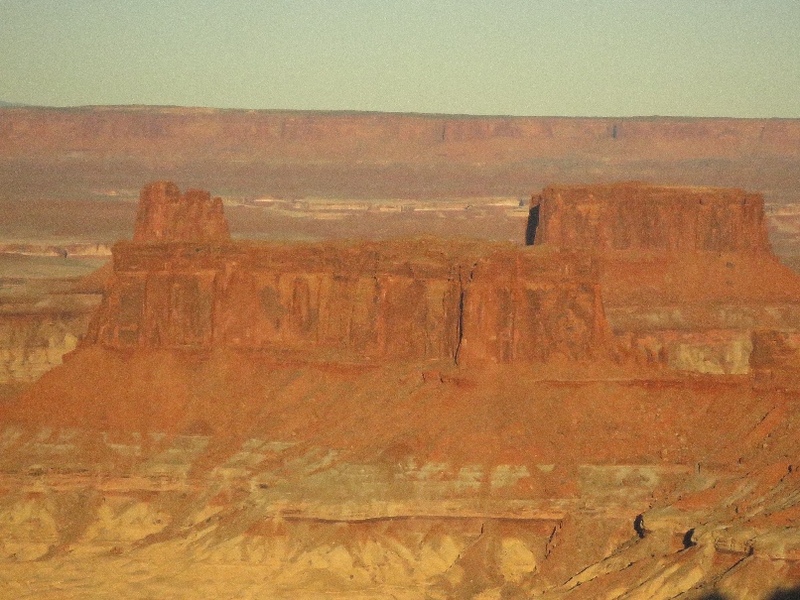 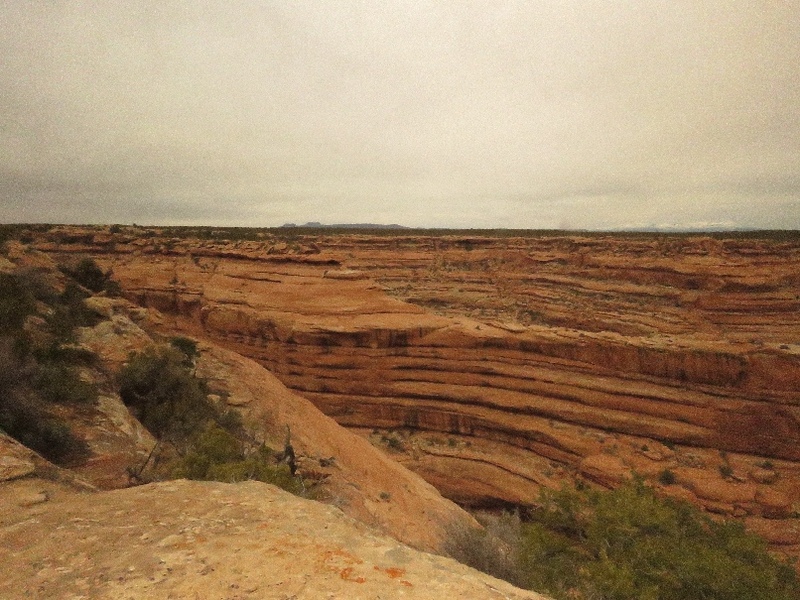 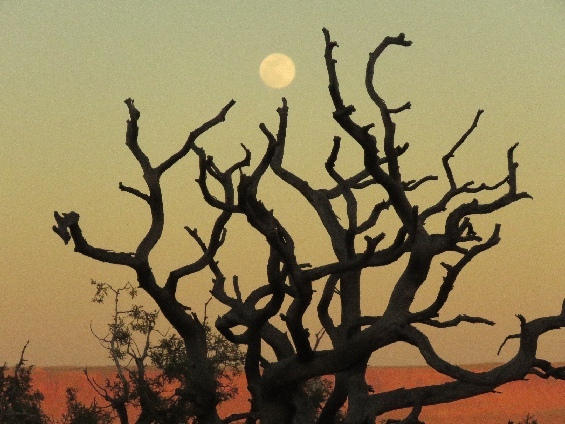 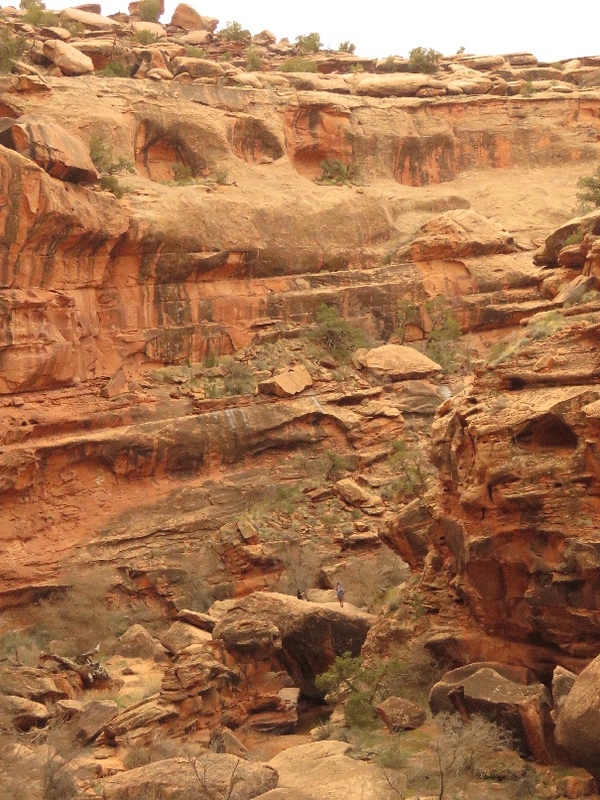 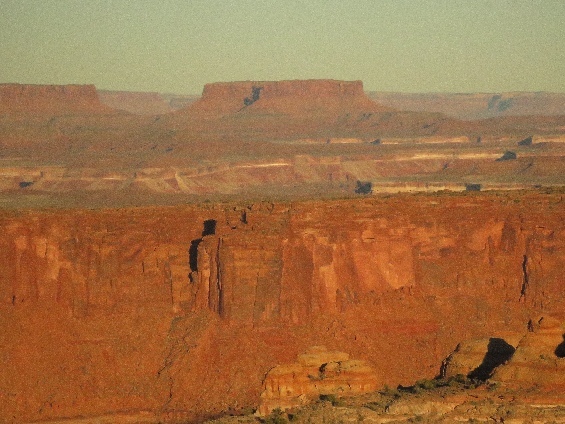 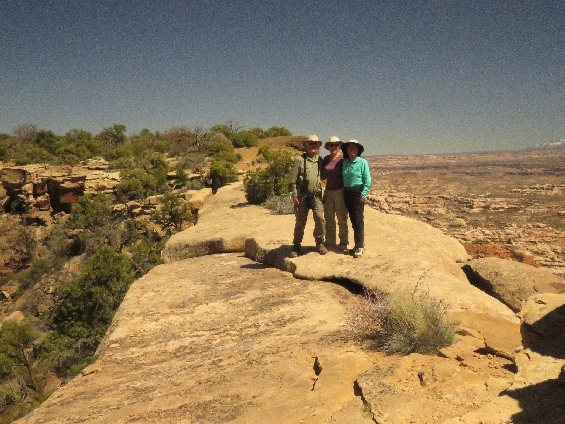 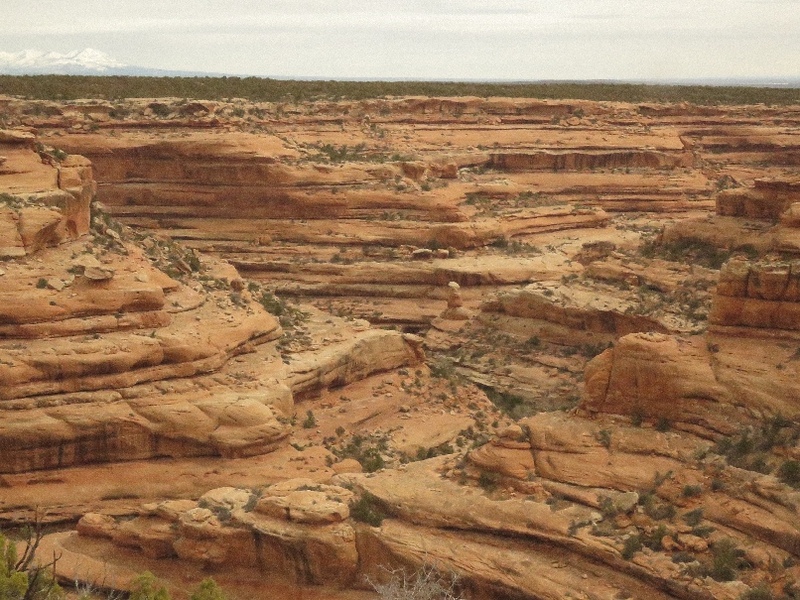 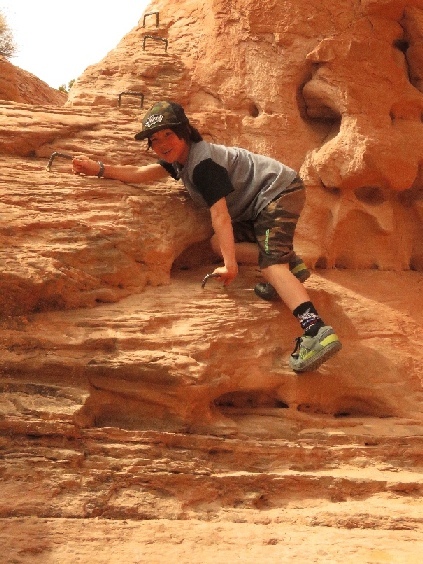 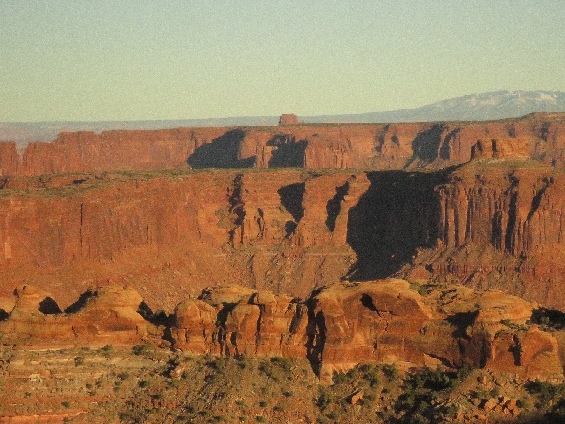 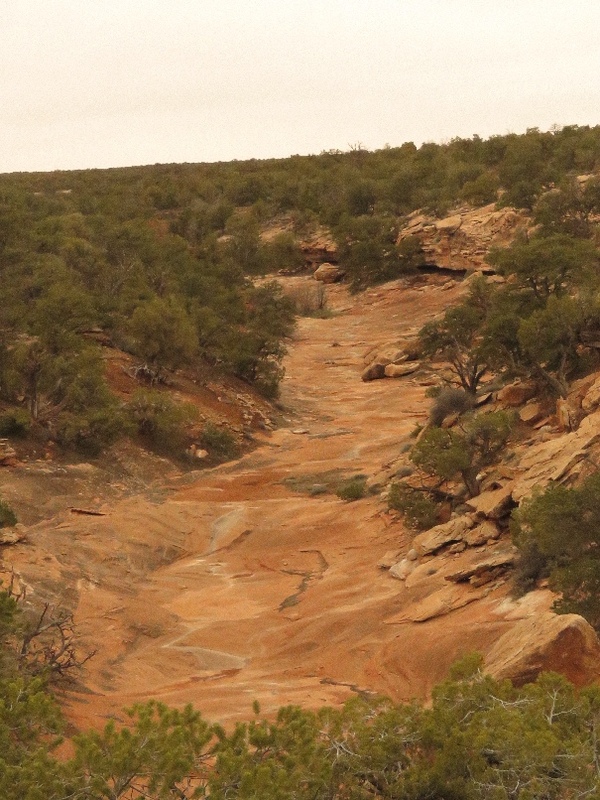 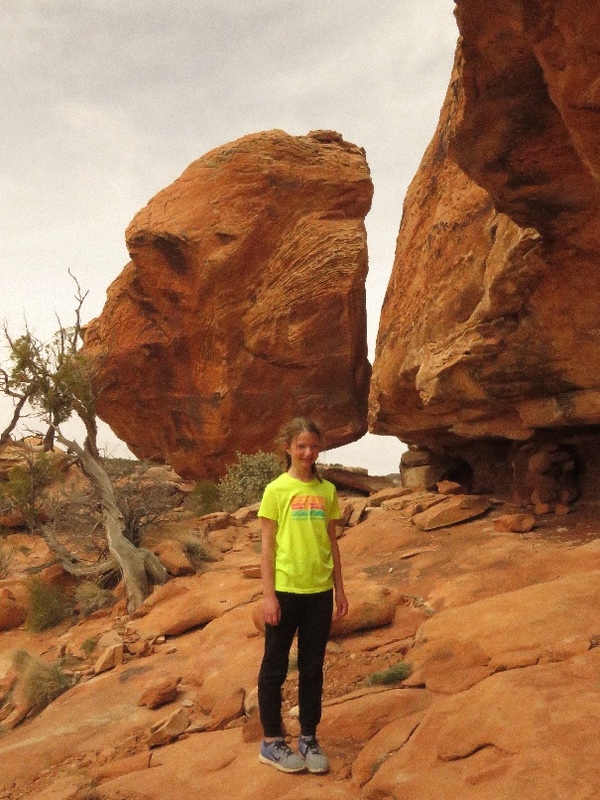 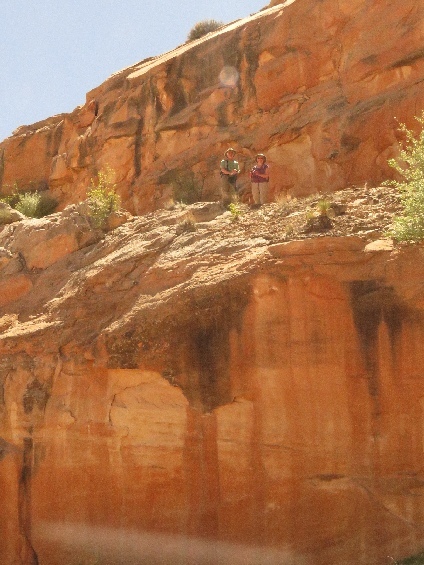 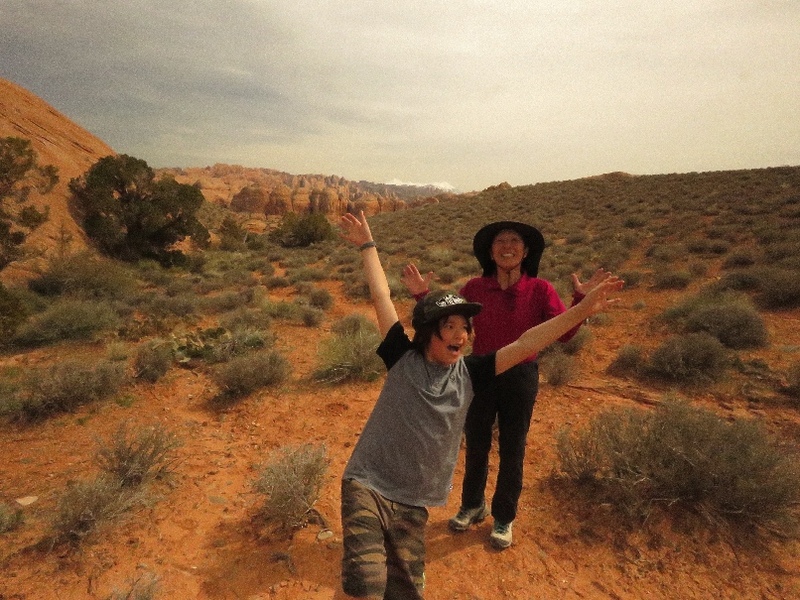 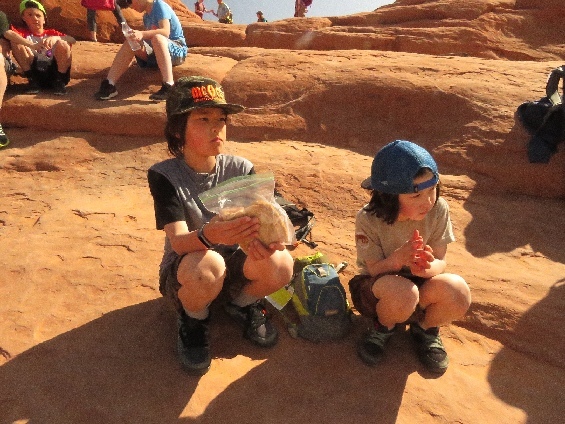 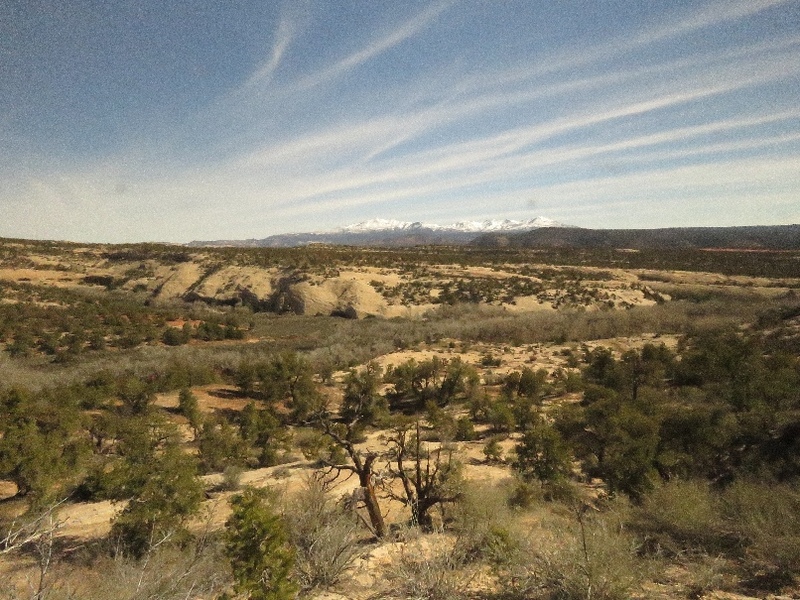 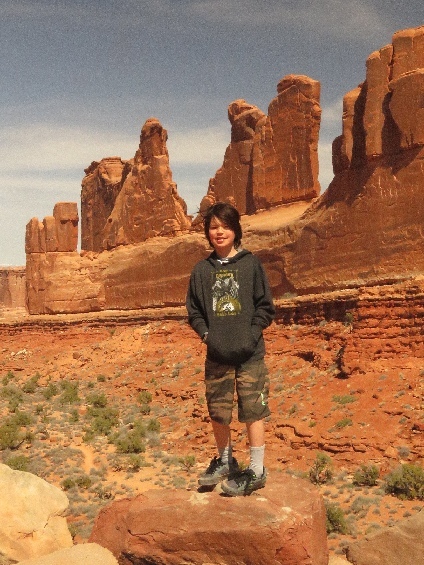 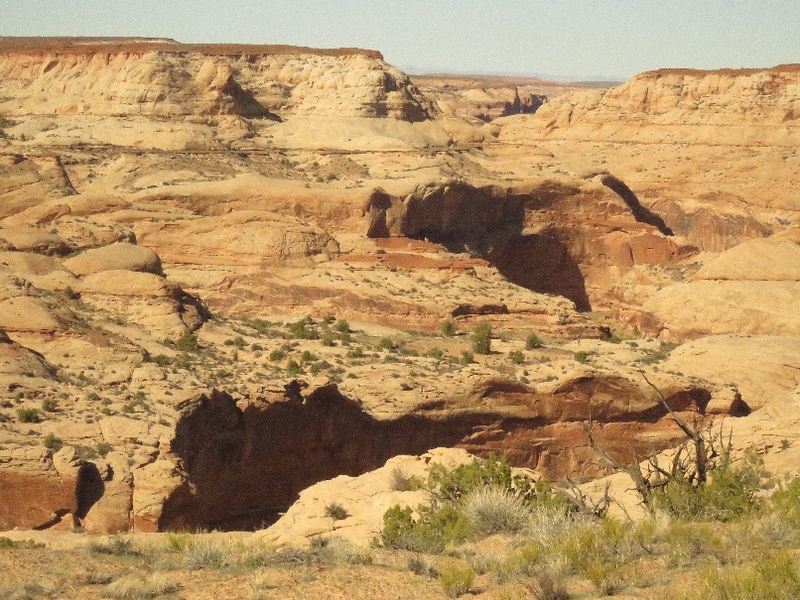 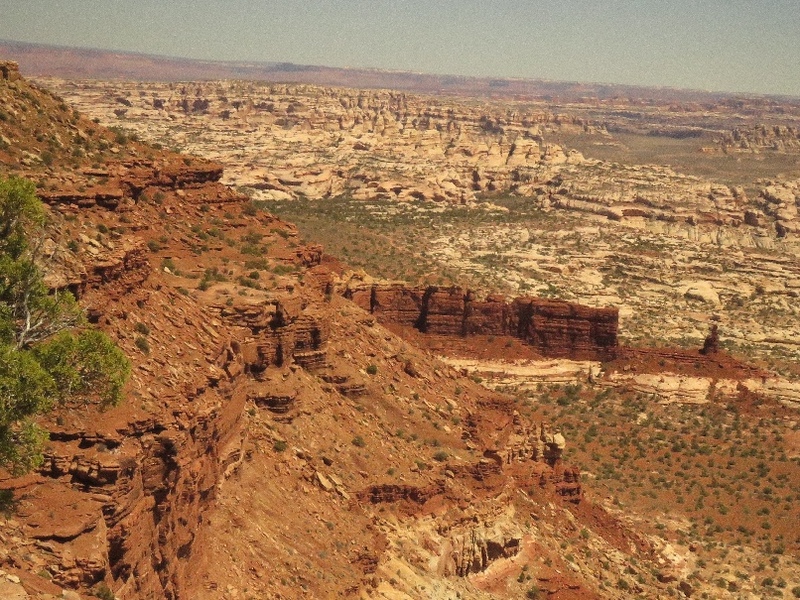 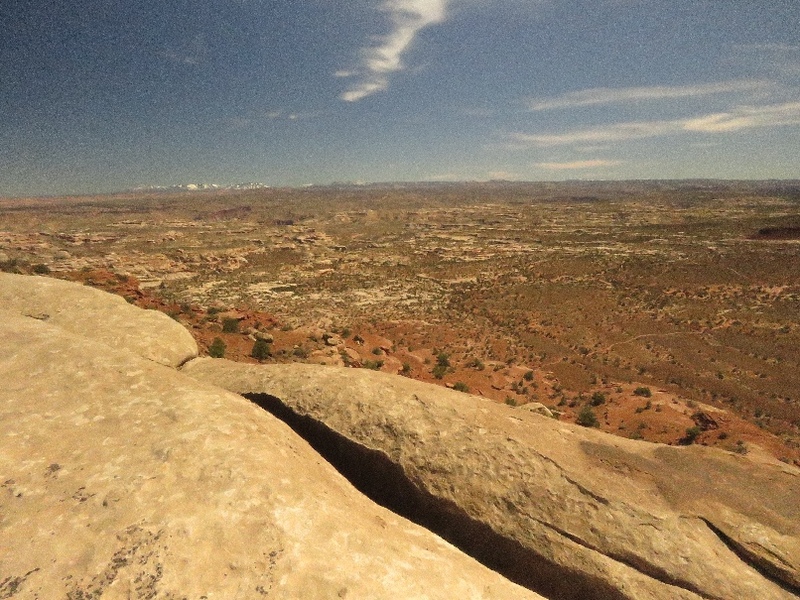 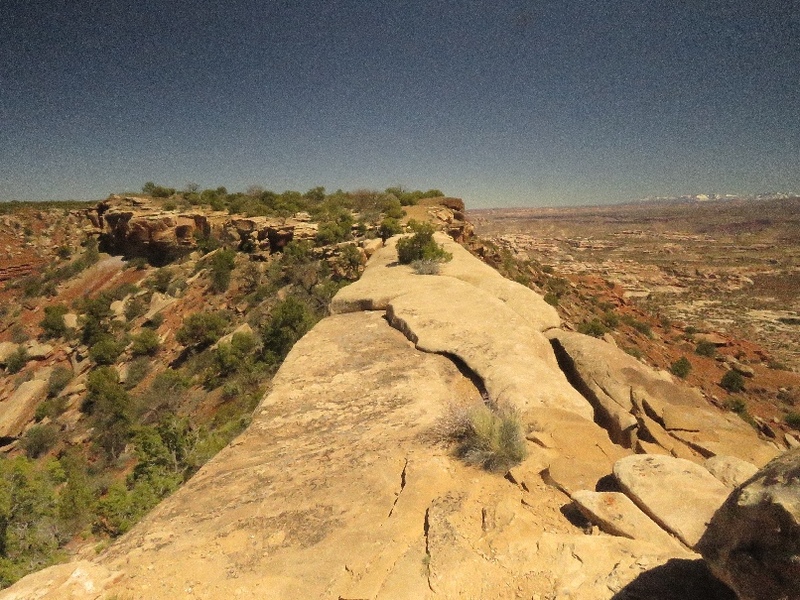 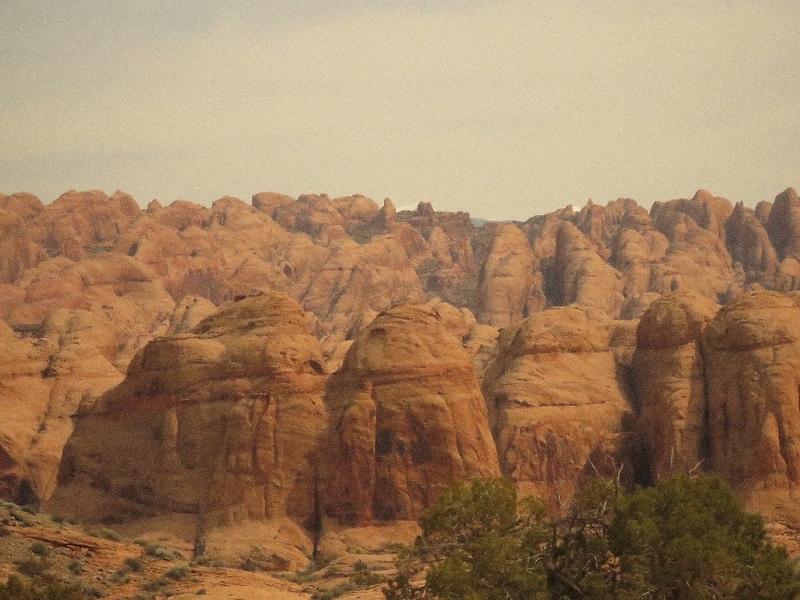 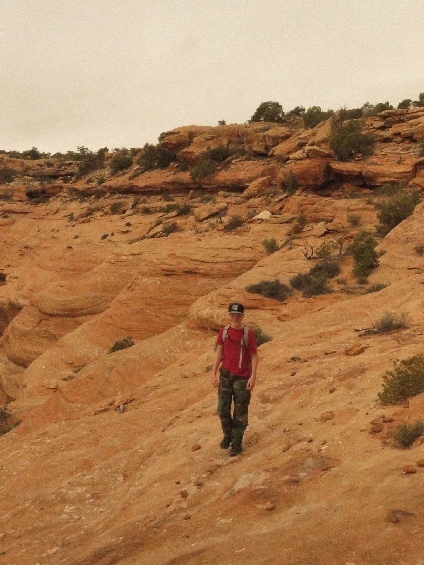 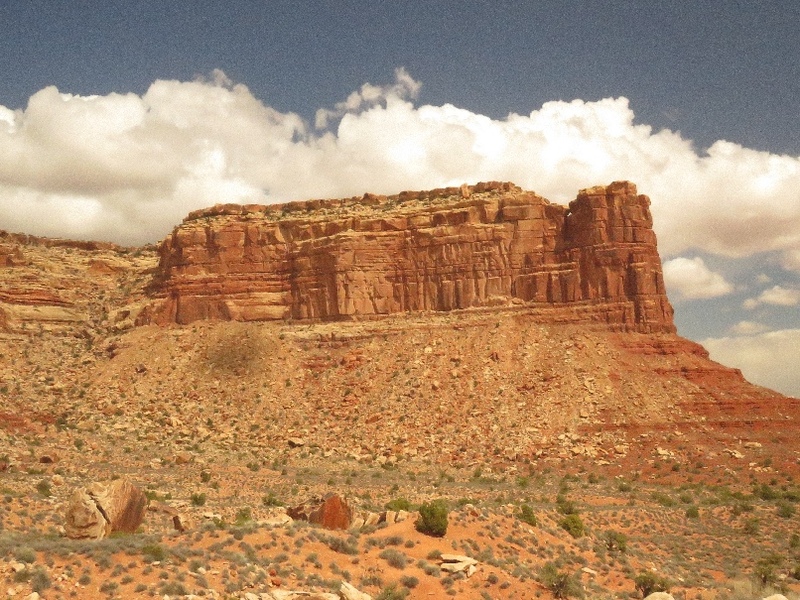 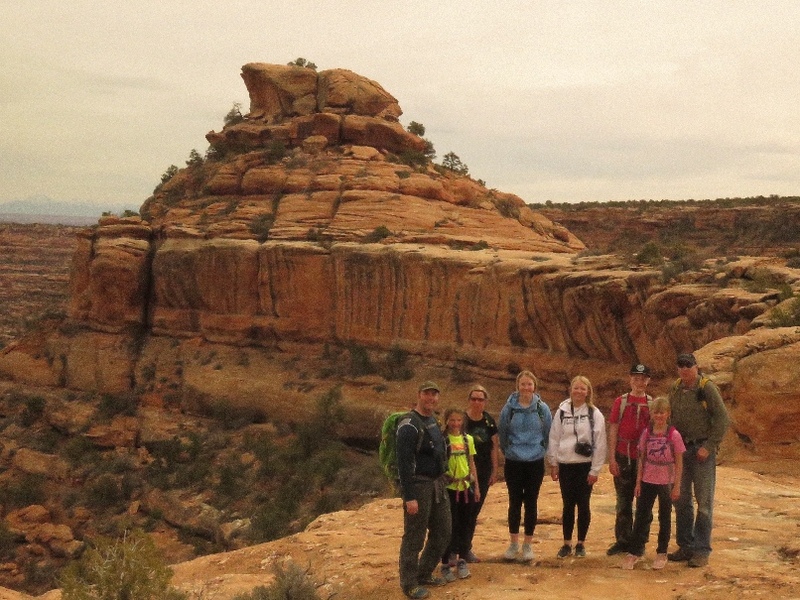 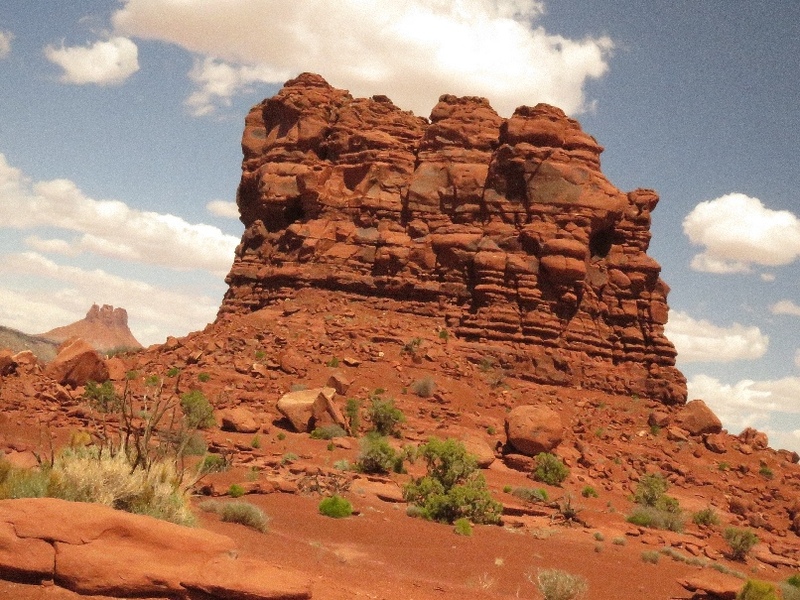 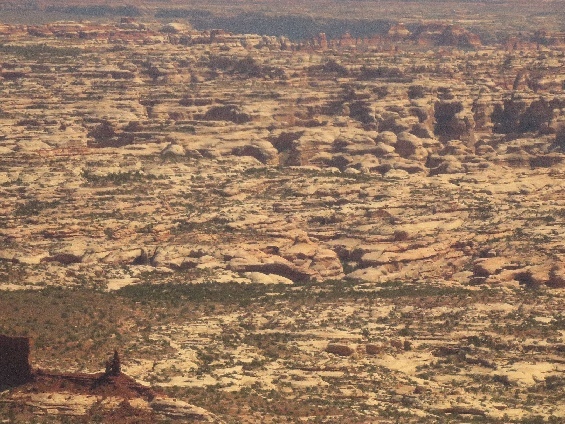 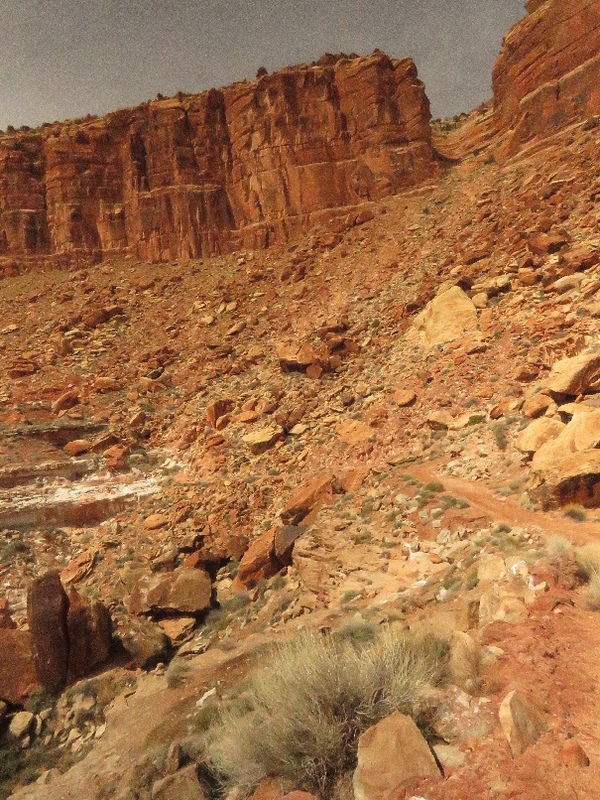 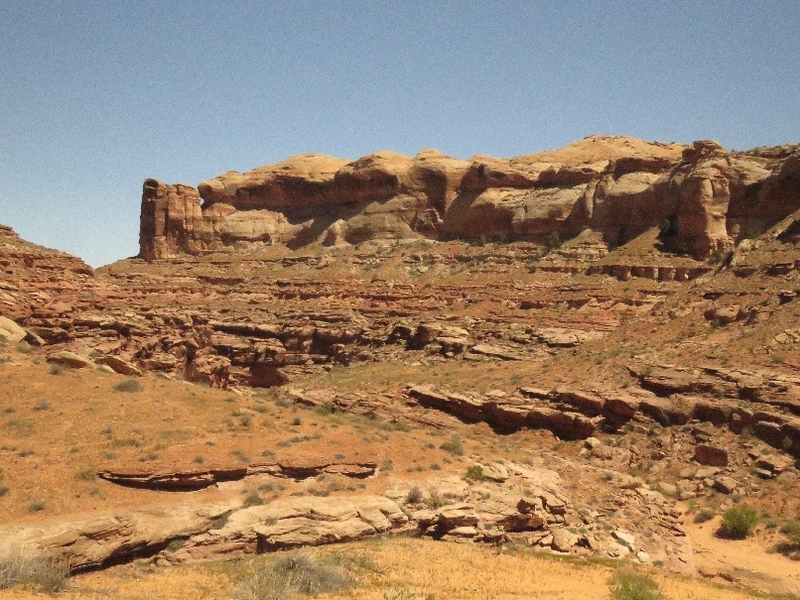 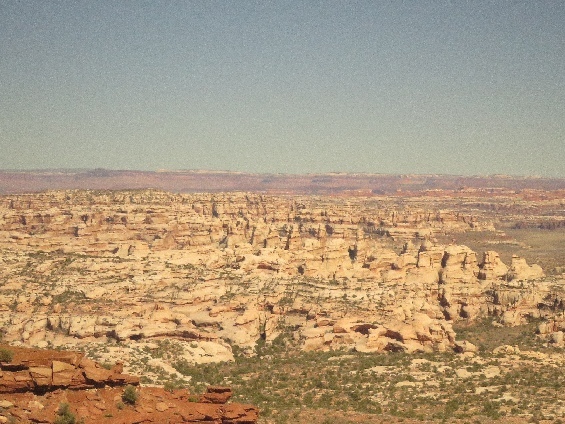 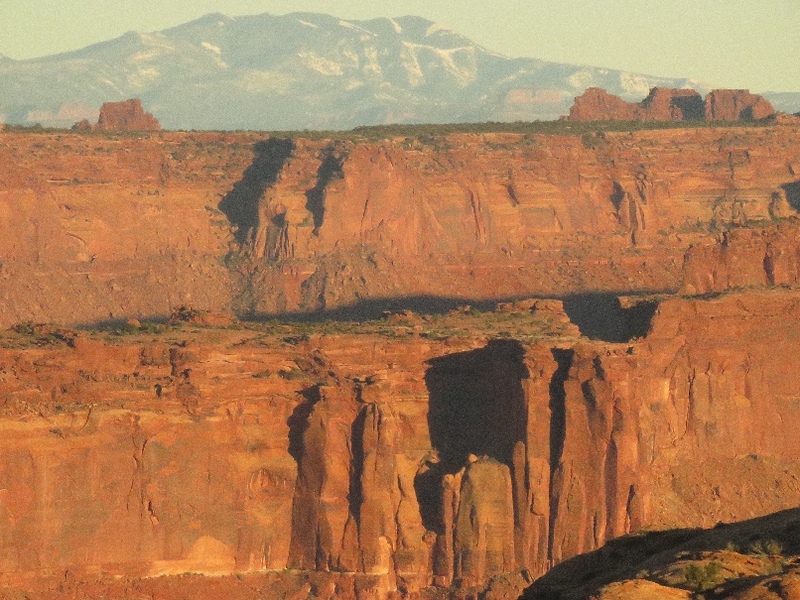 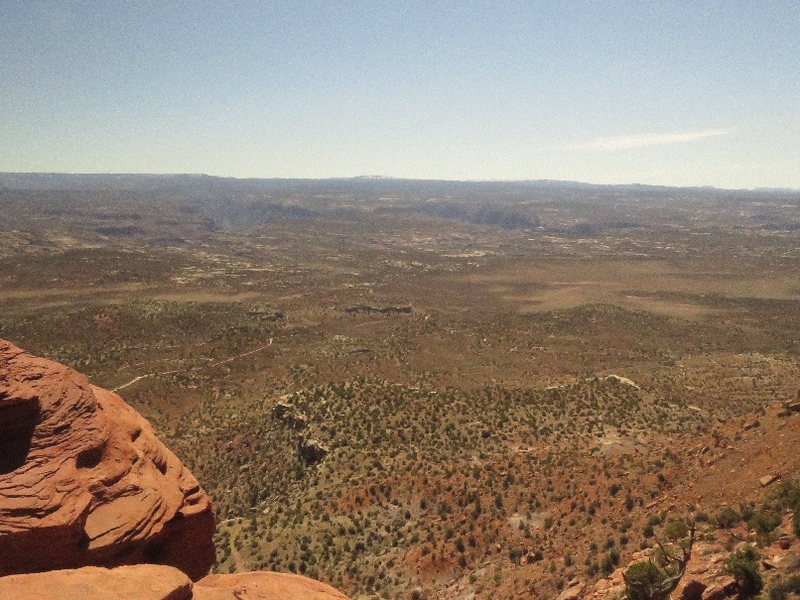 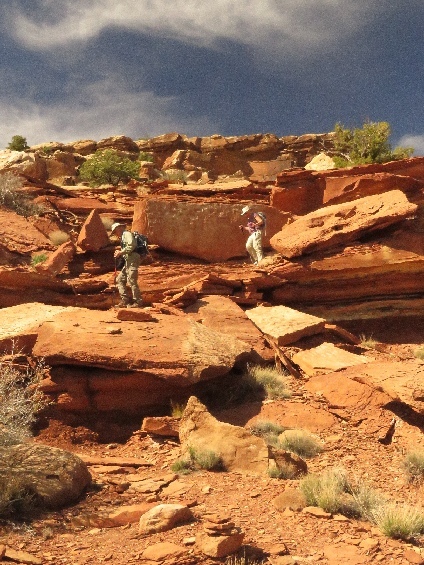 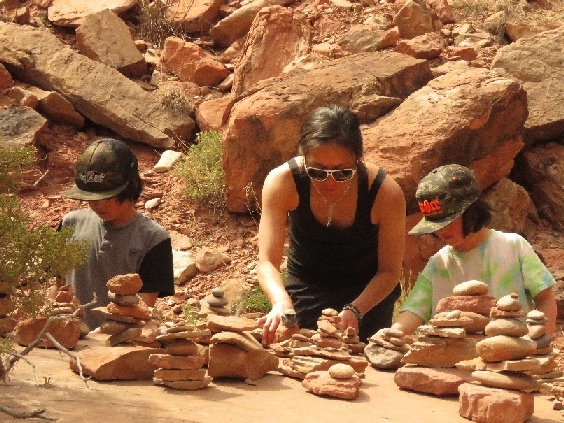 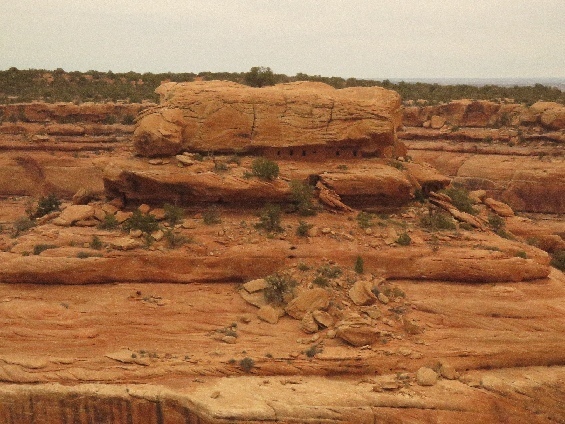 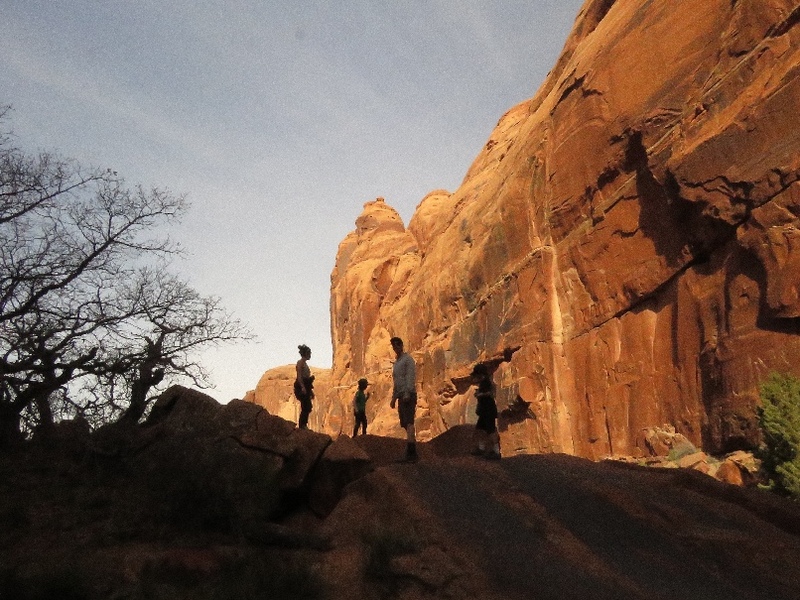 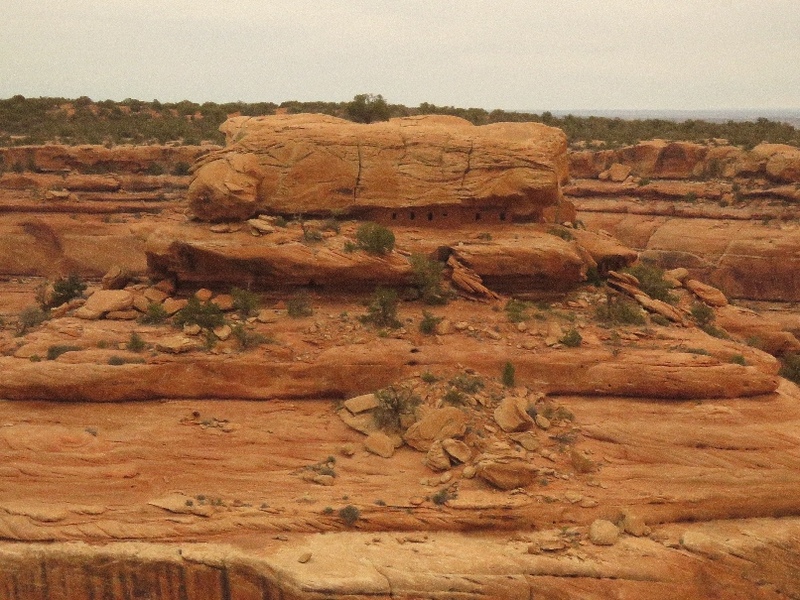 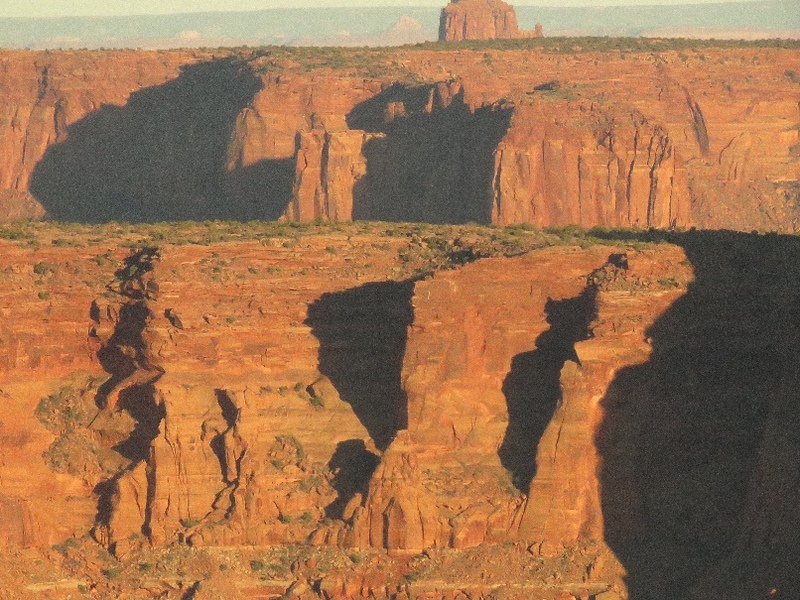 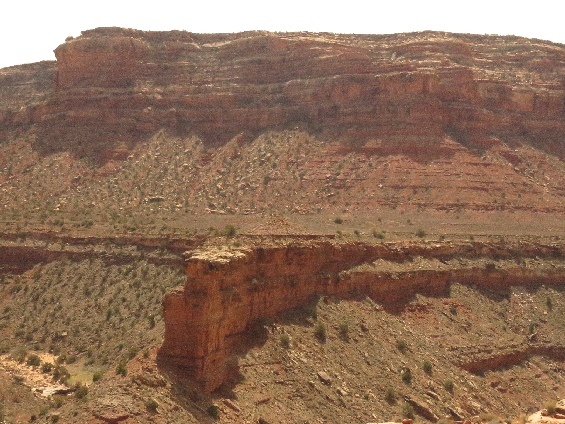 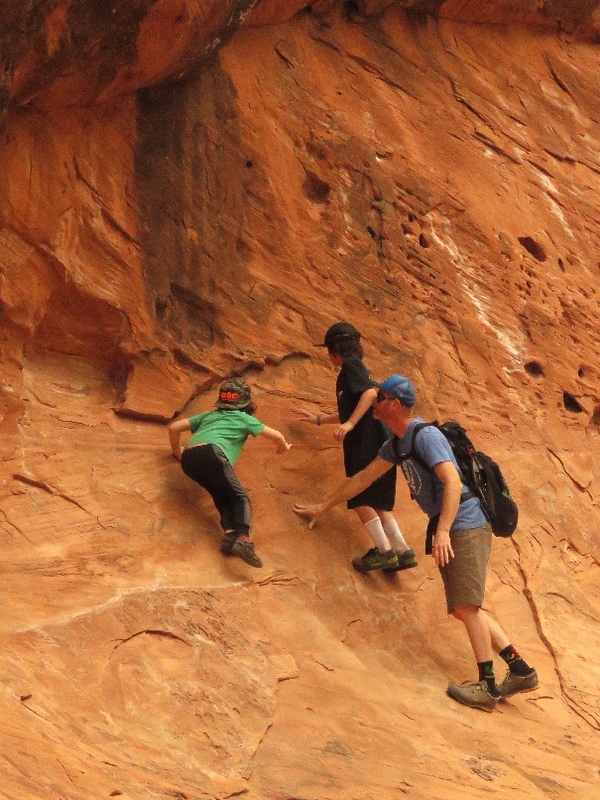 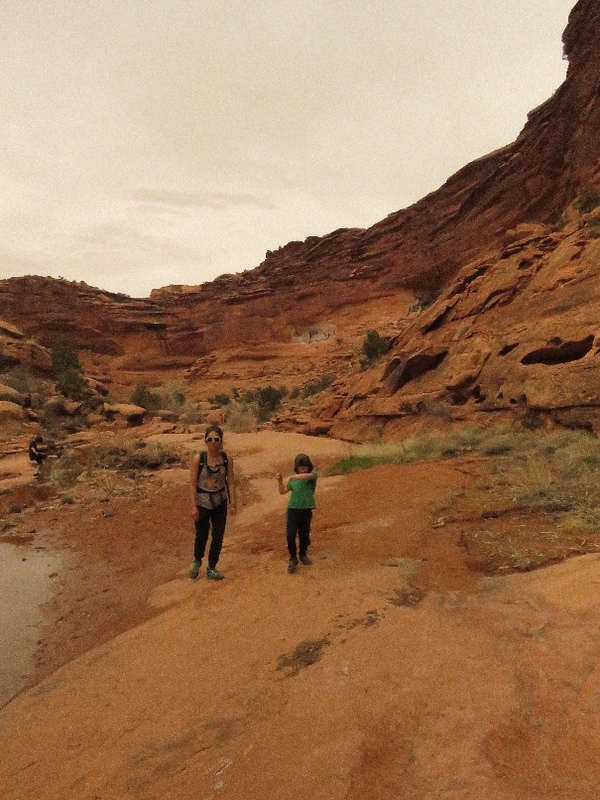 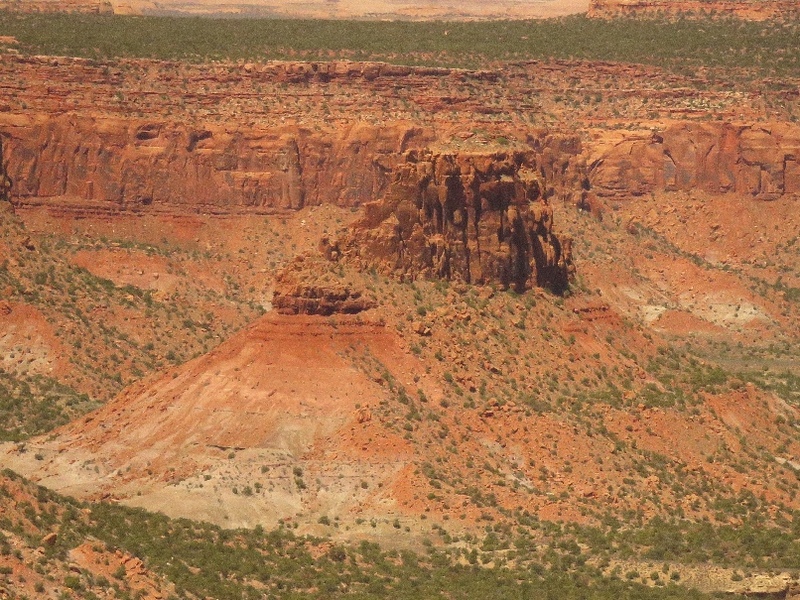 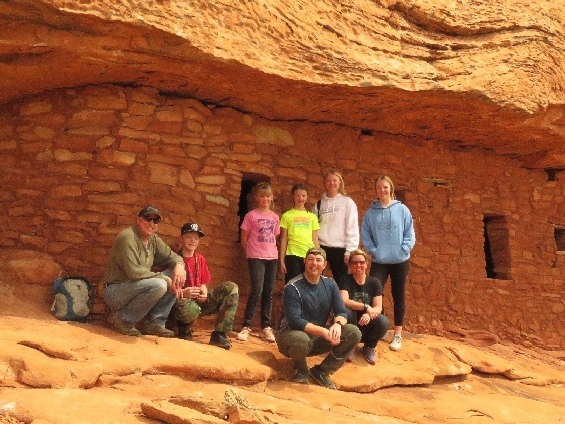 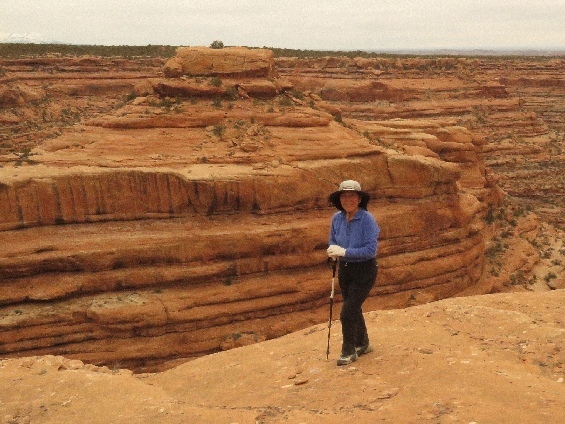 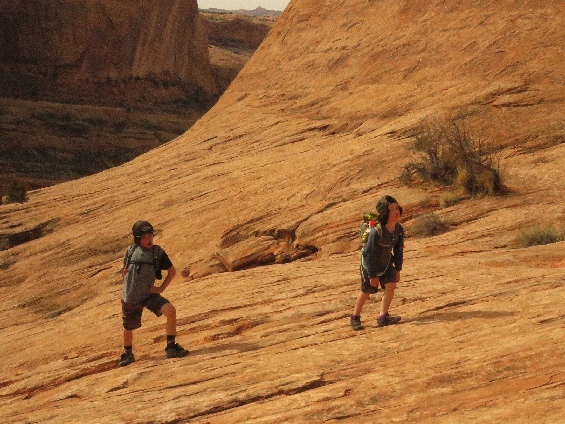 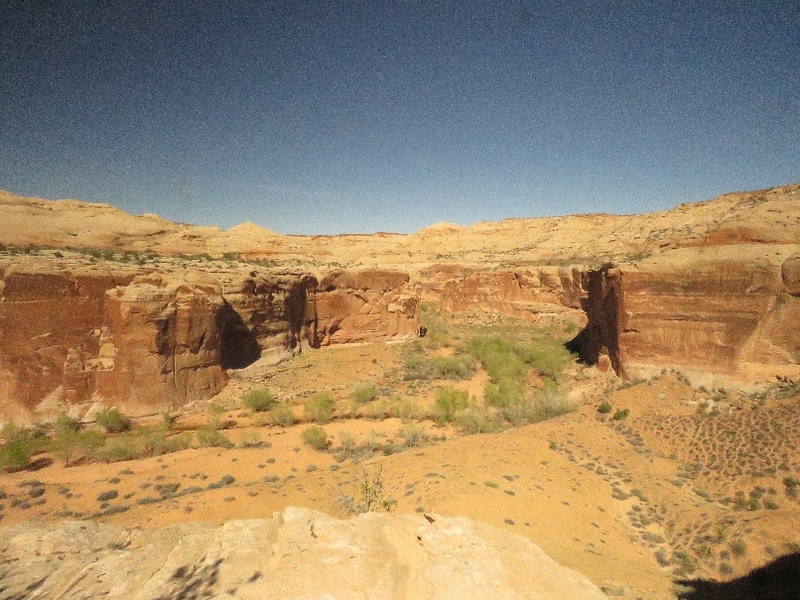 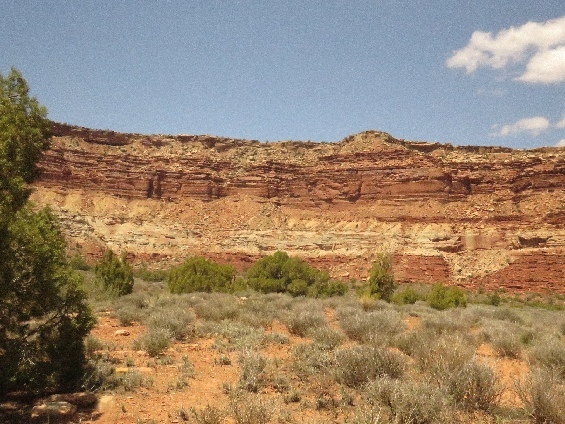 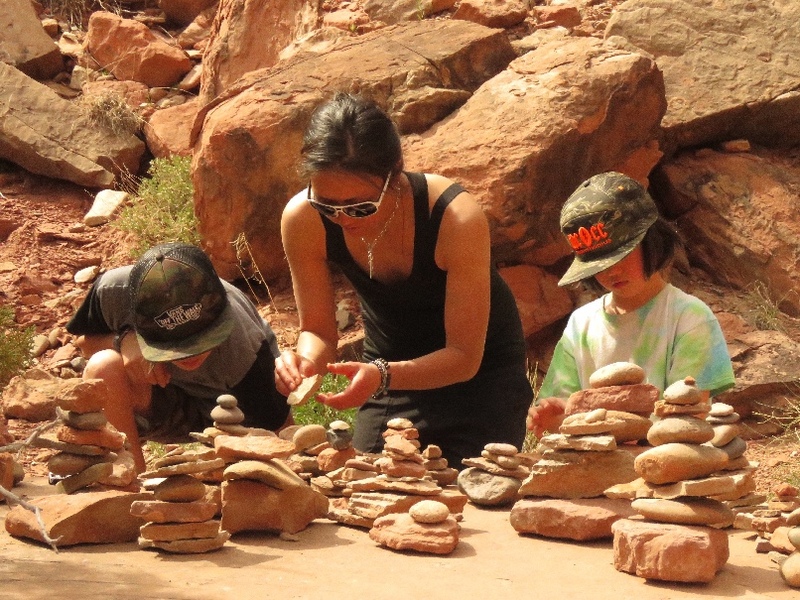 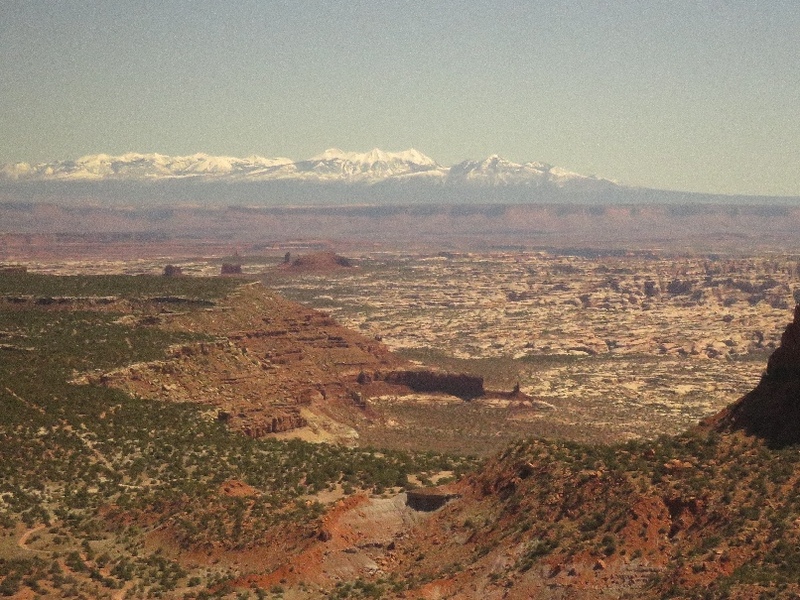 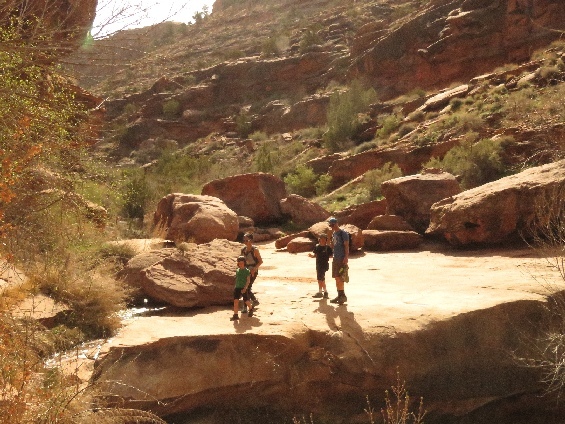 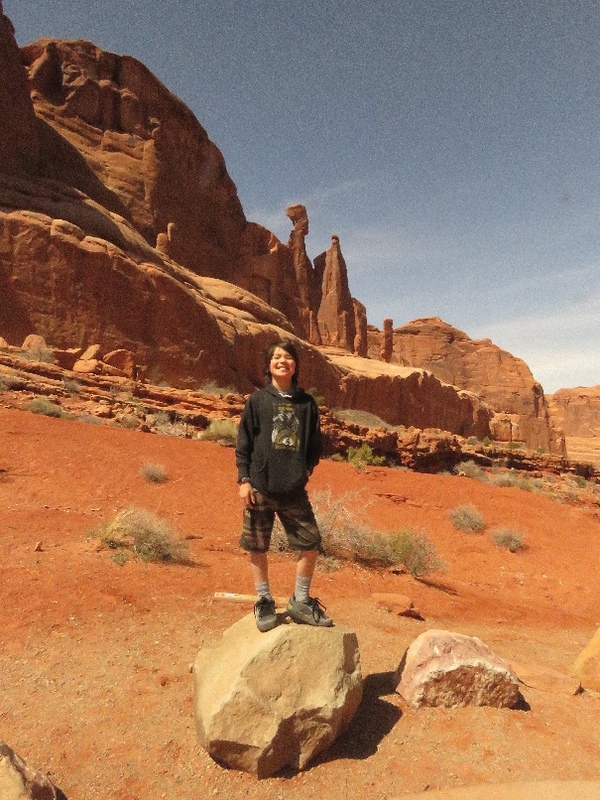 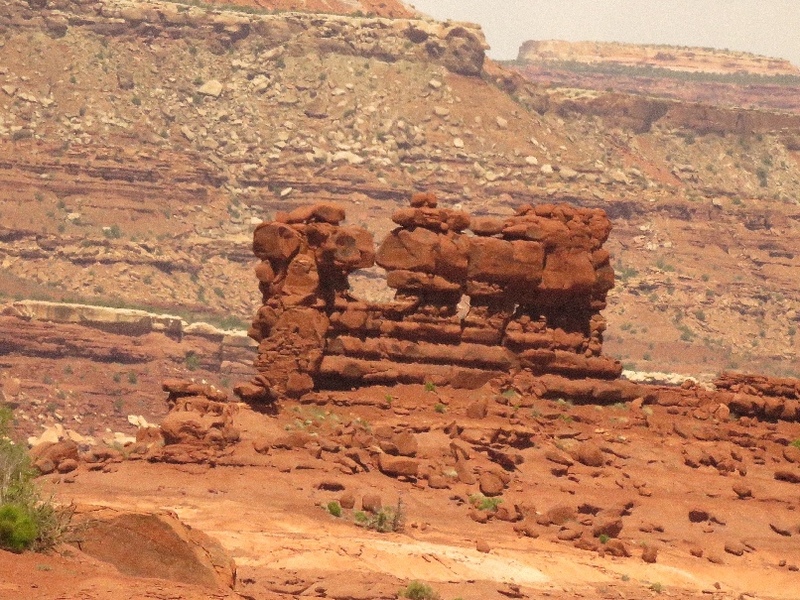 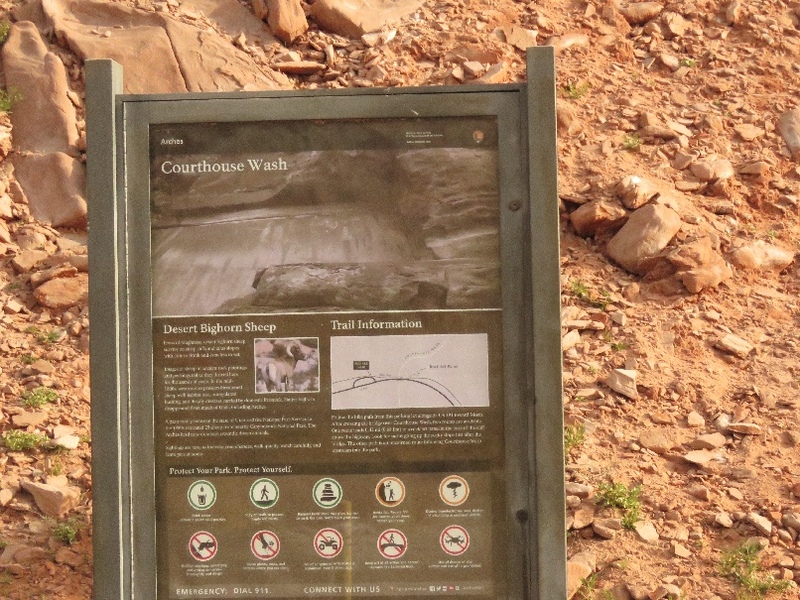 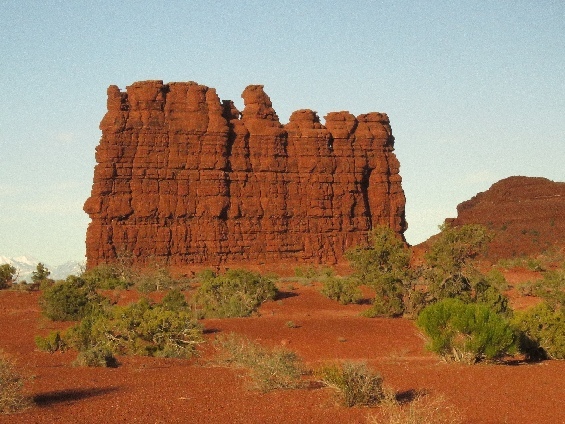 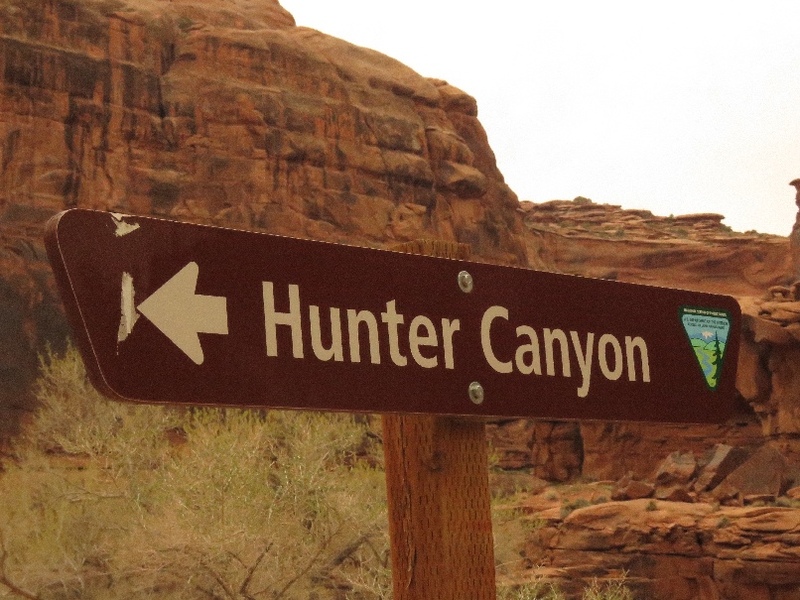 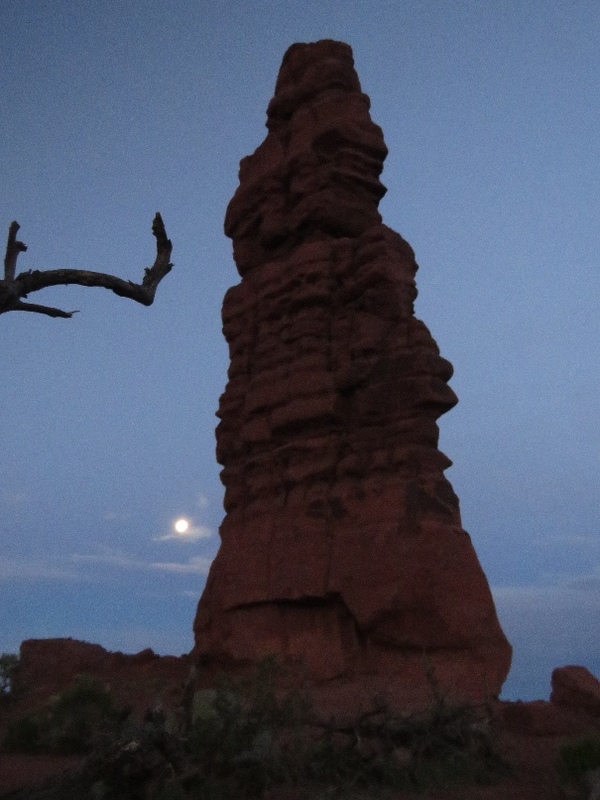 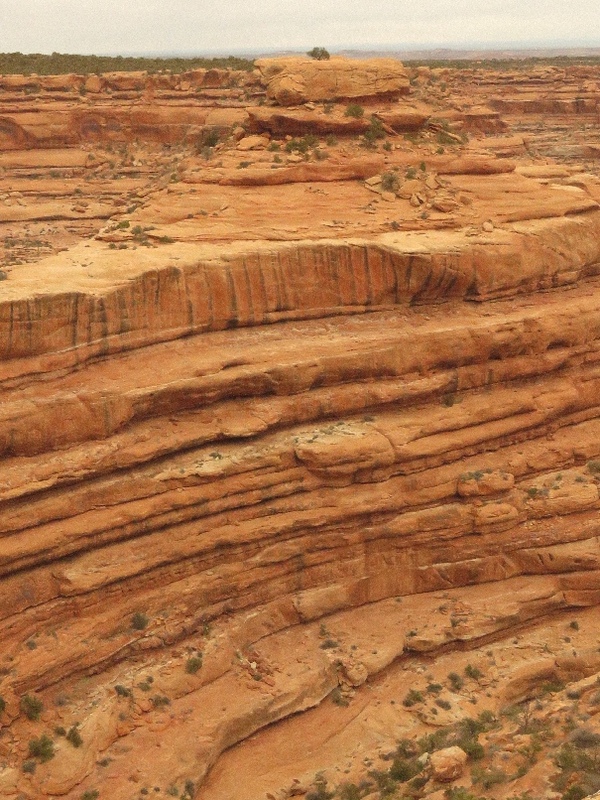 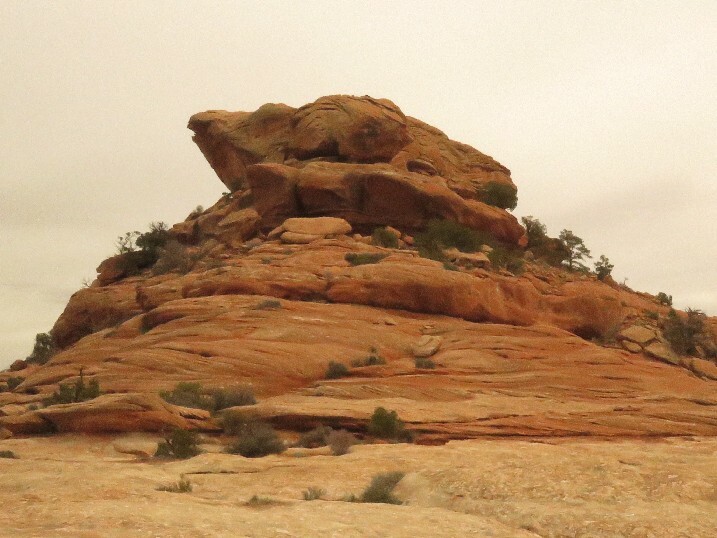 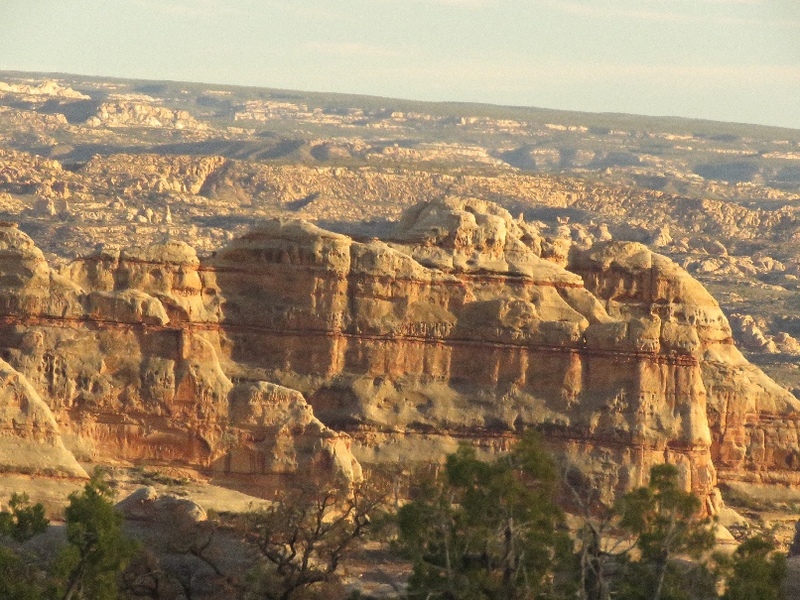 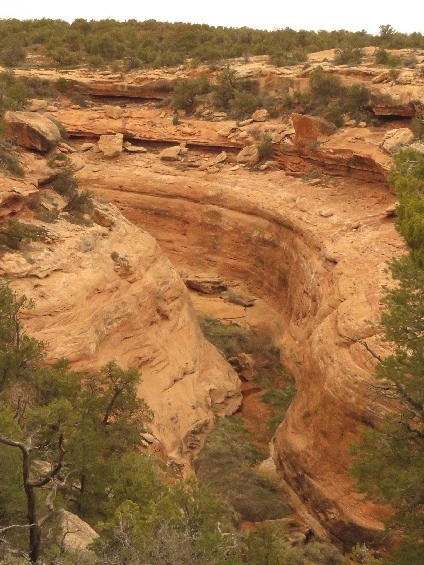 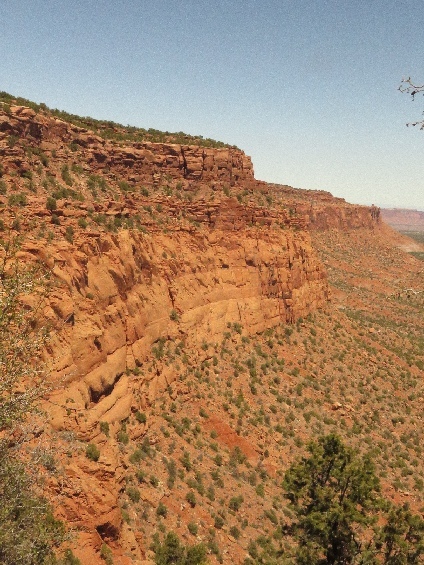 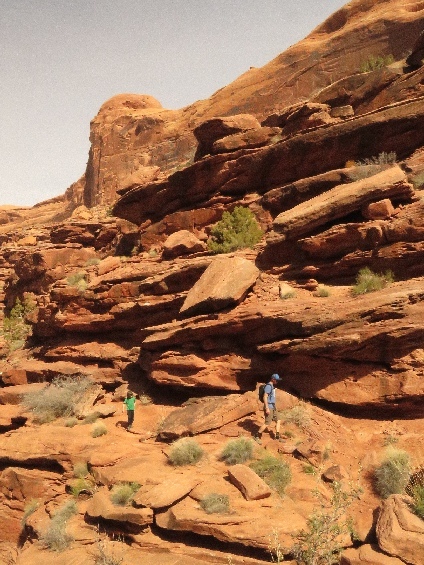 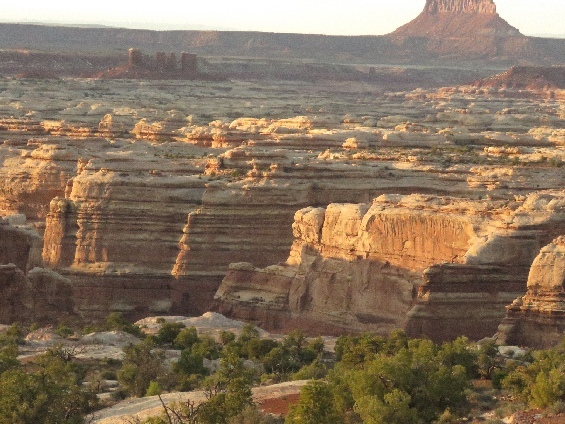 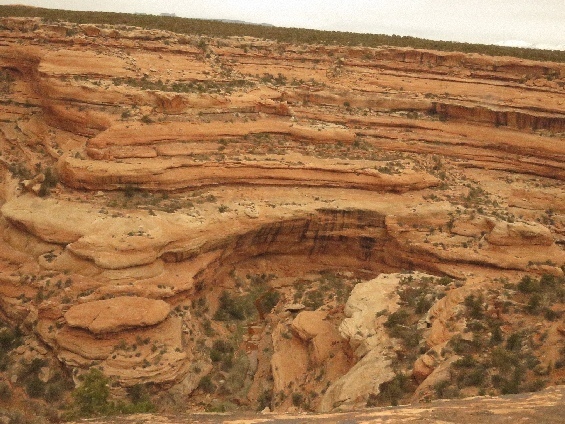 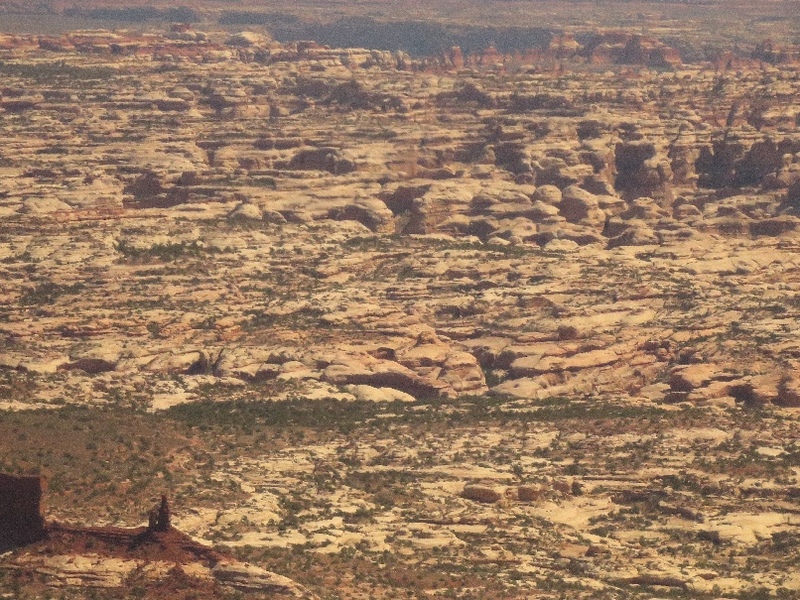 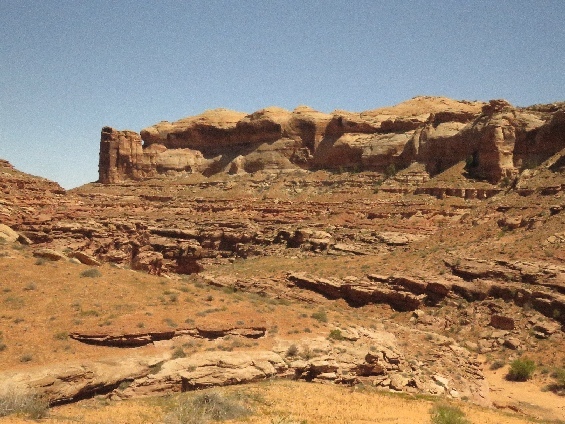 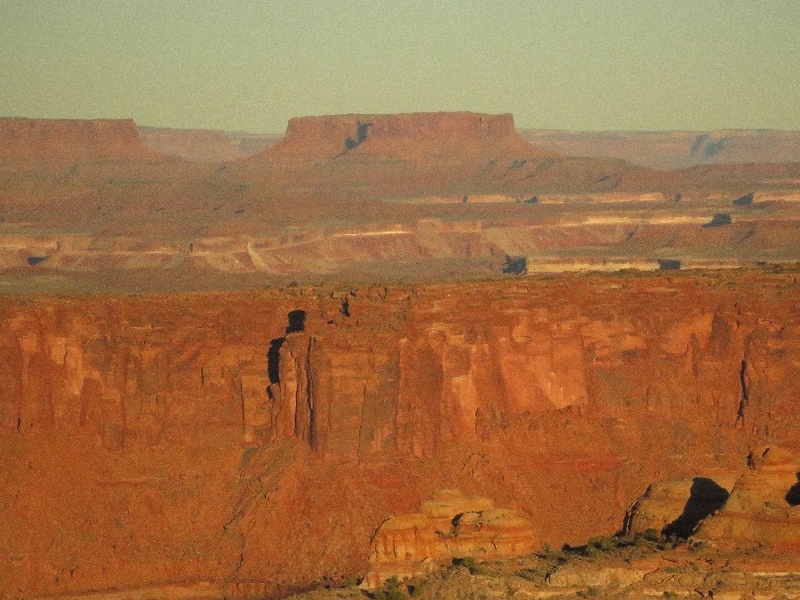 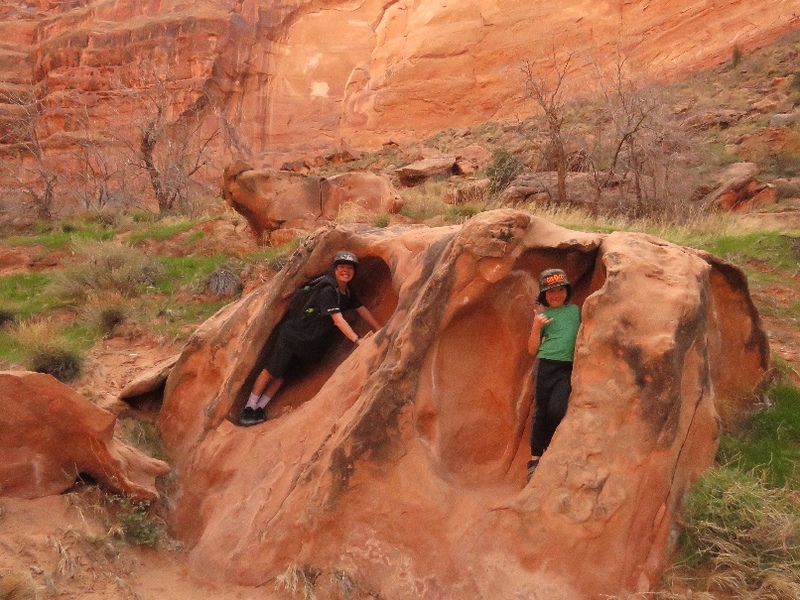 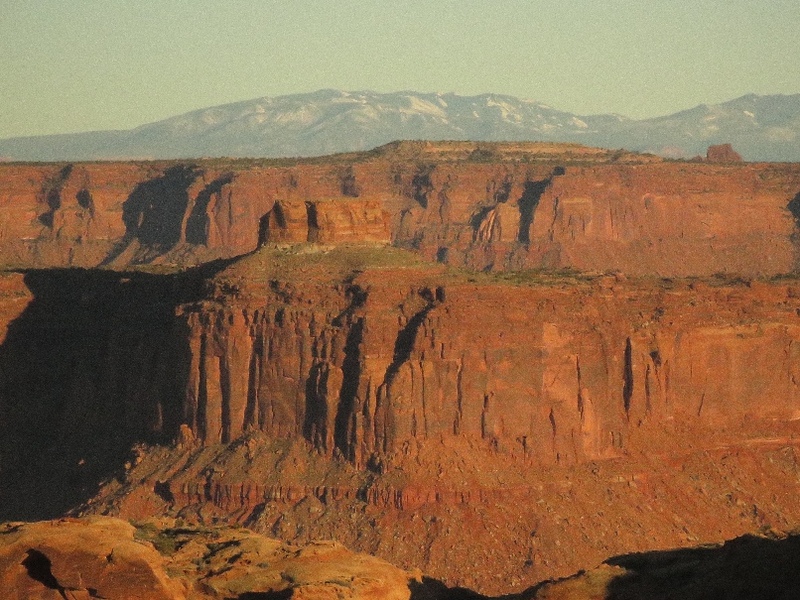 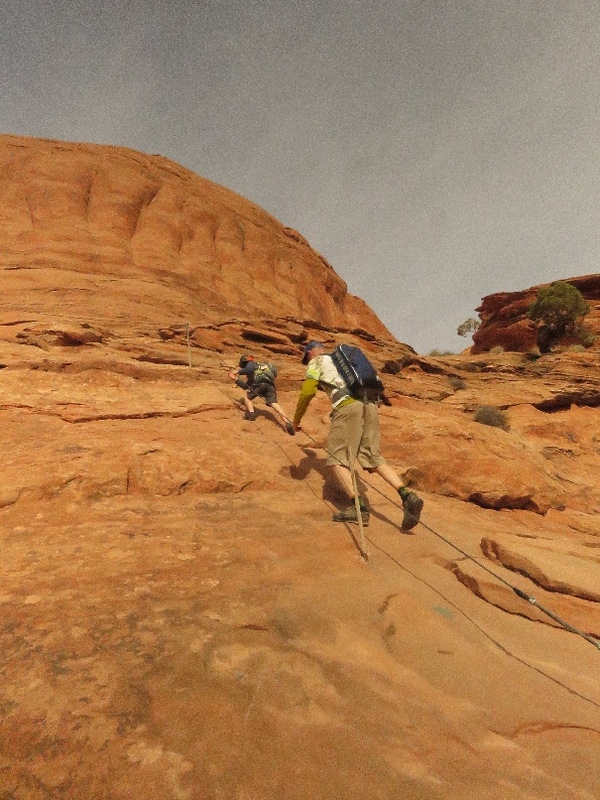 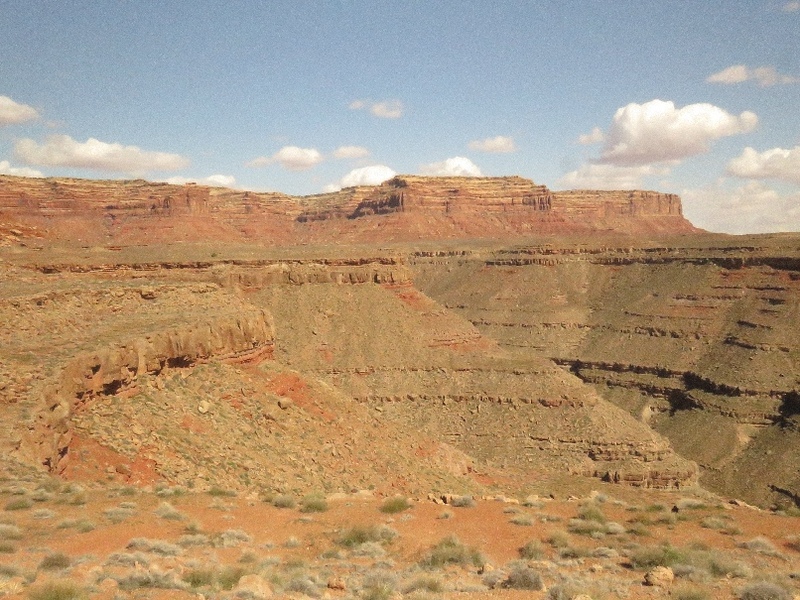 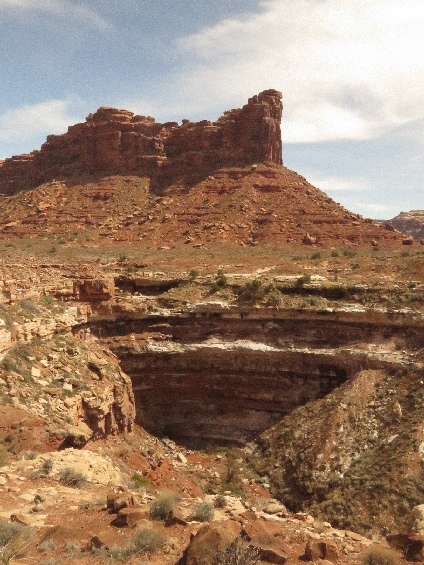 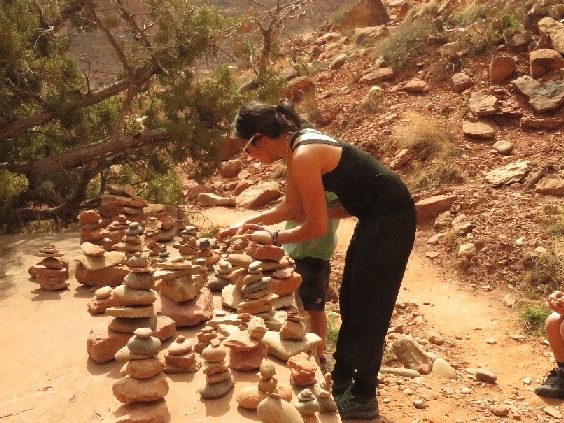 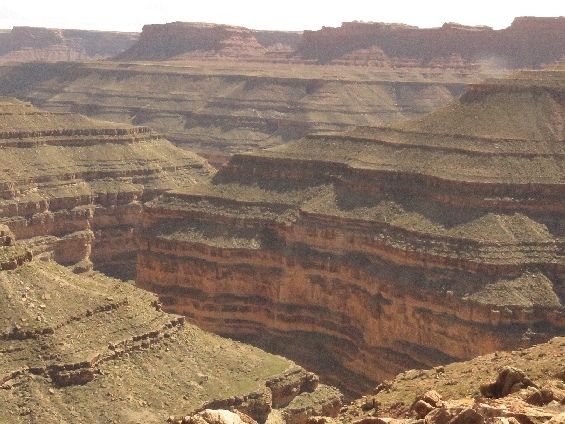 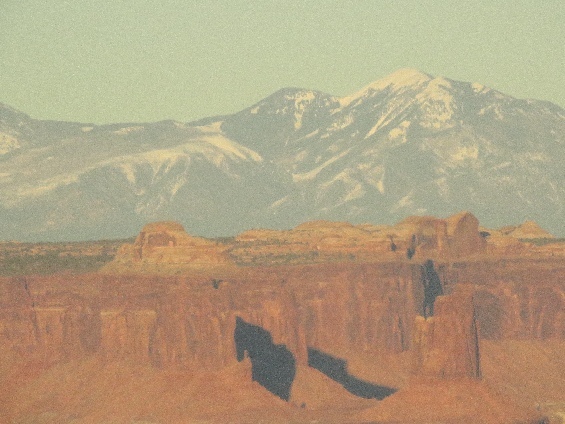 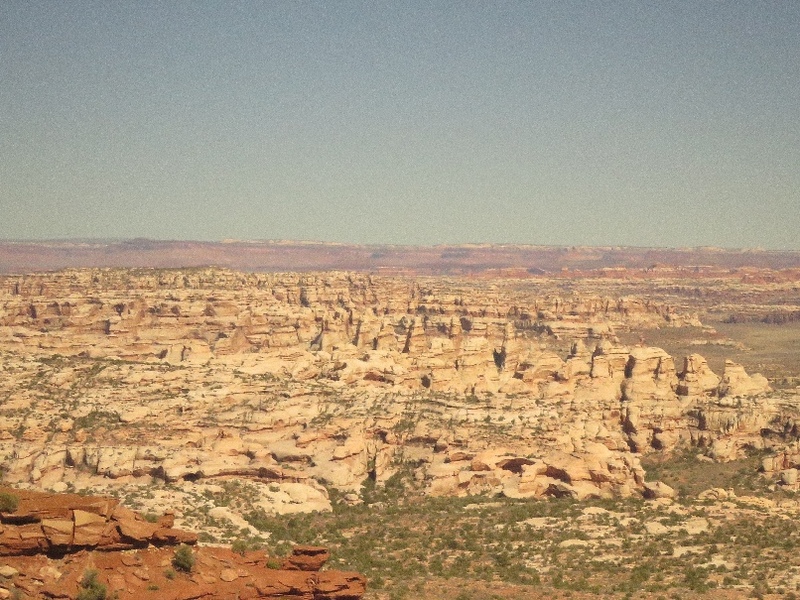 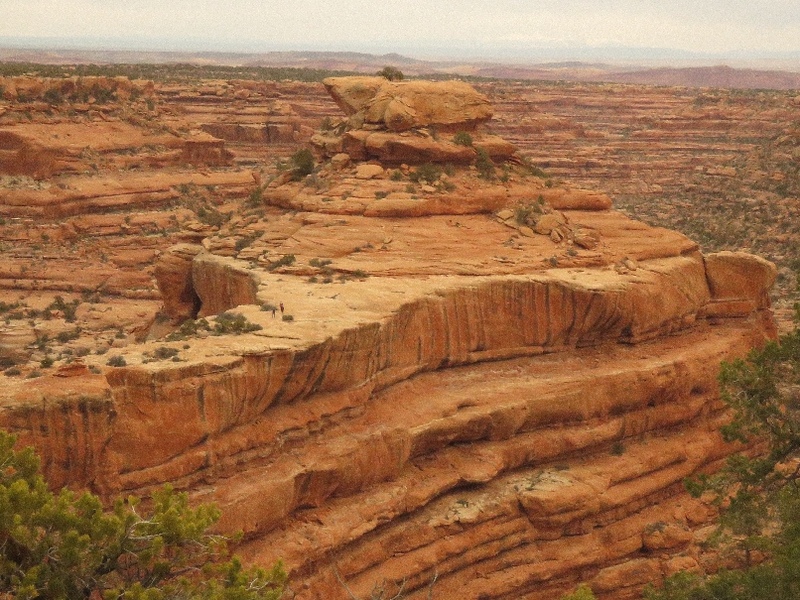 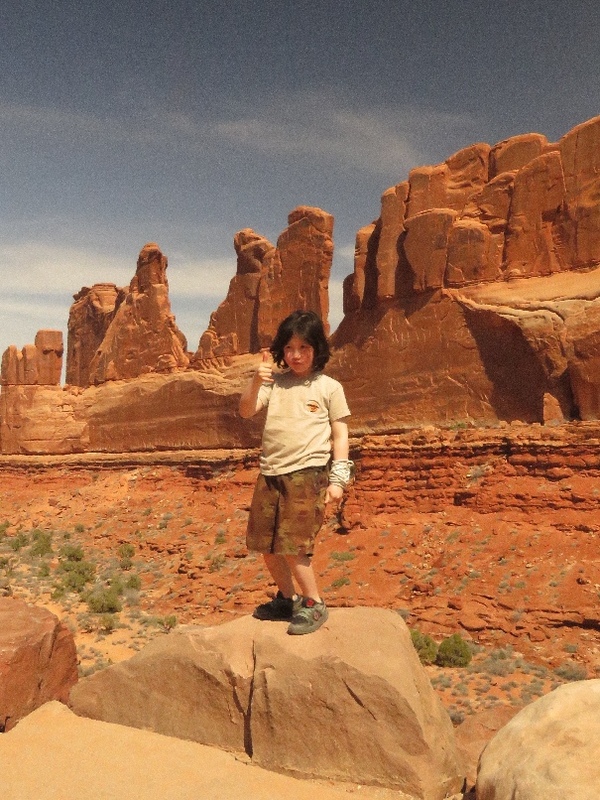 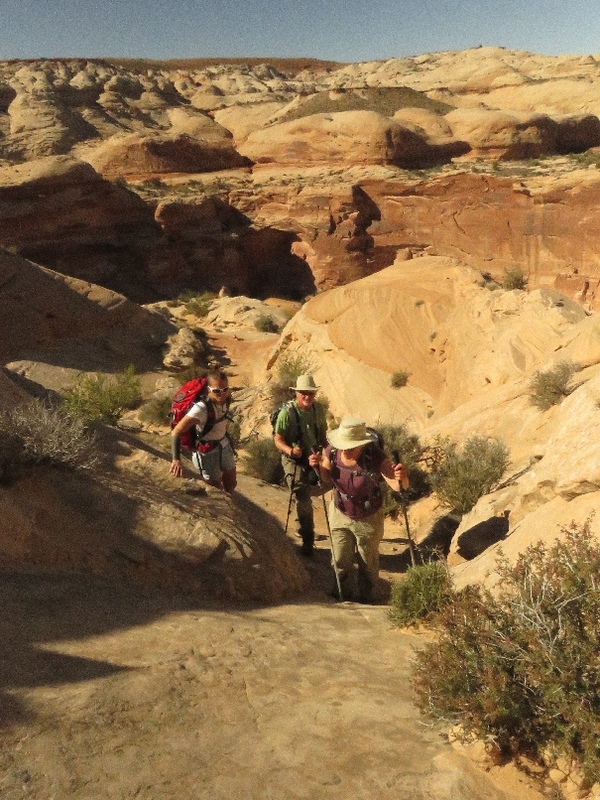 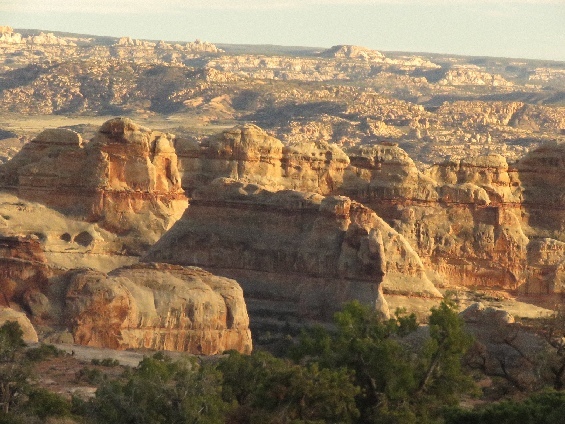 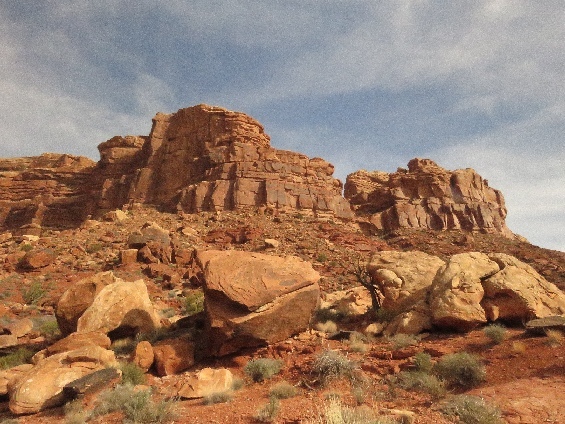 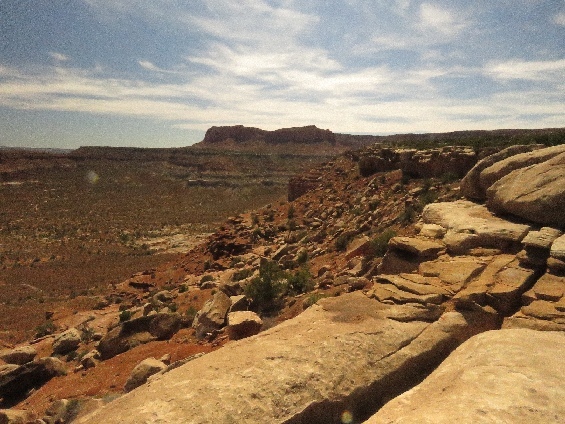 4/18/2019 High Spur, Maze Tour (Day 1), Canyonlands National Park, UT - Our 1st day Maze Tour end at the High Spur Campground. 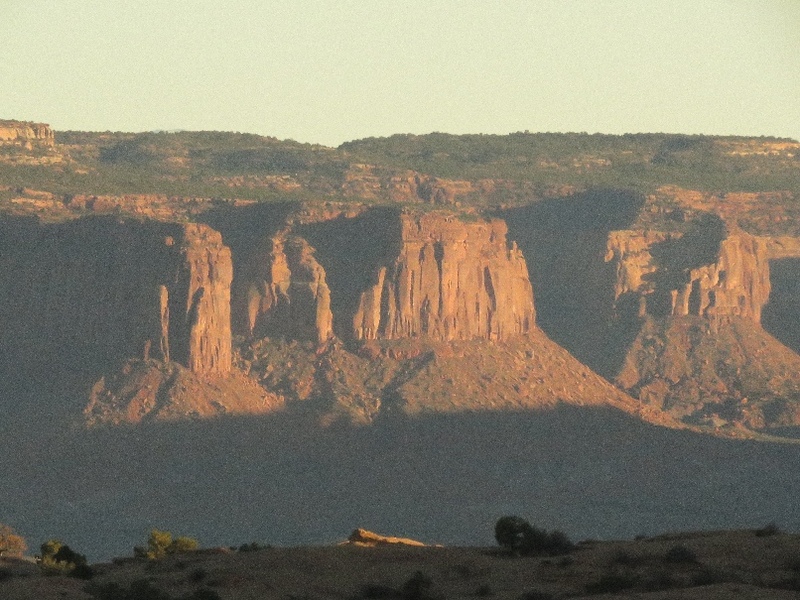 The view from this campground is incredible, we can see beautiful wide view, the Cleopatra’s Chair is visible also. 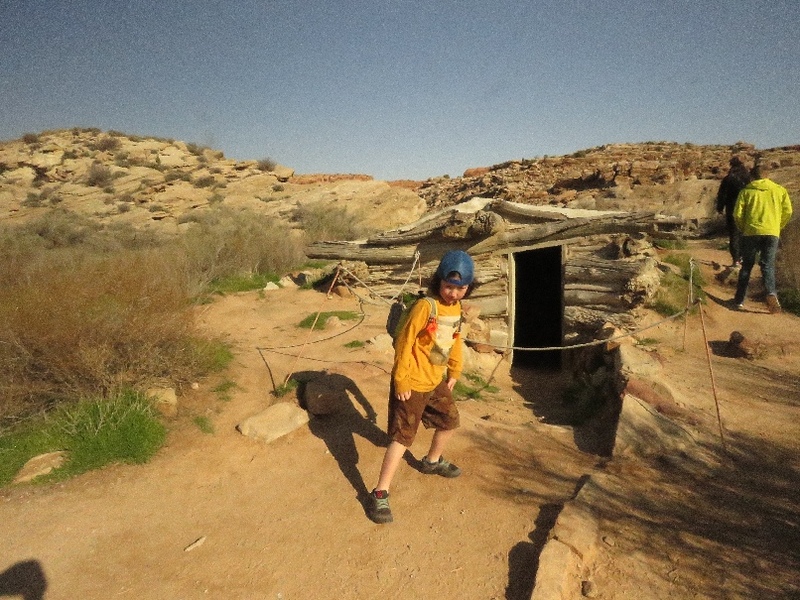 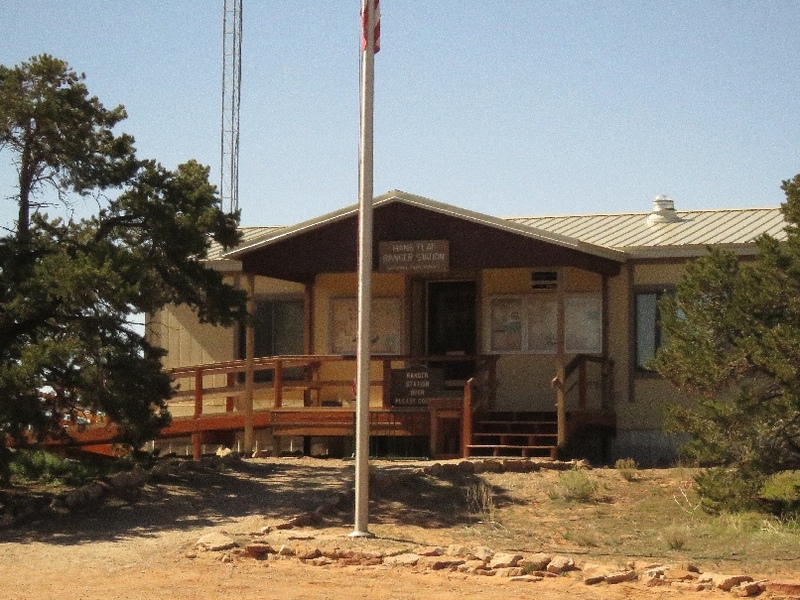 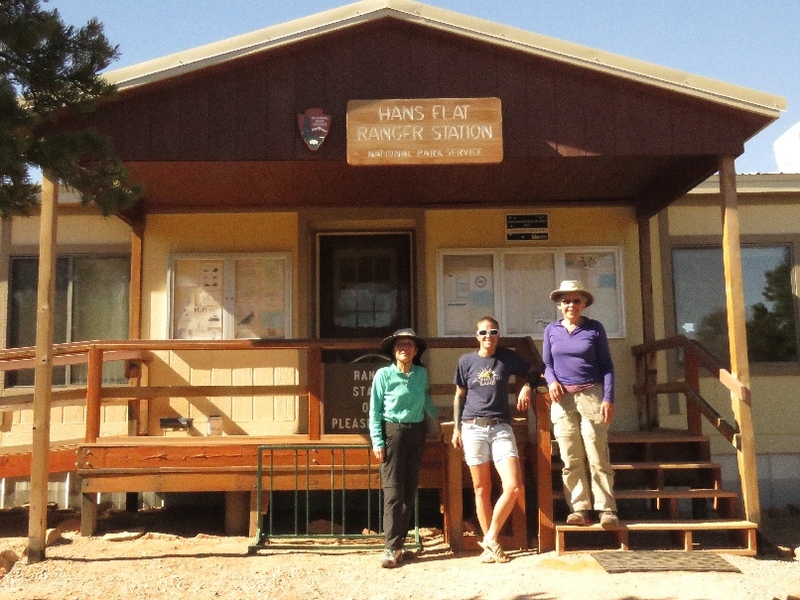 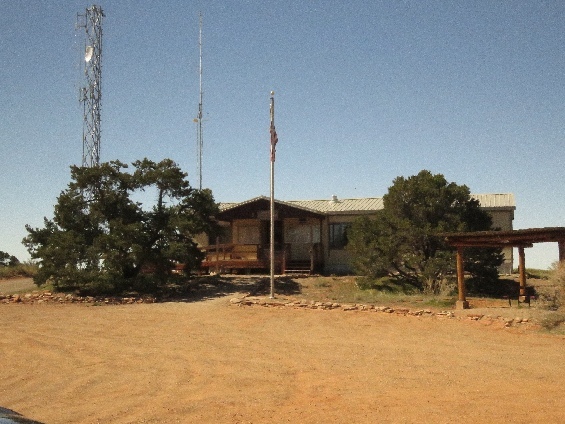 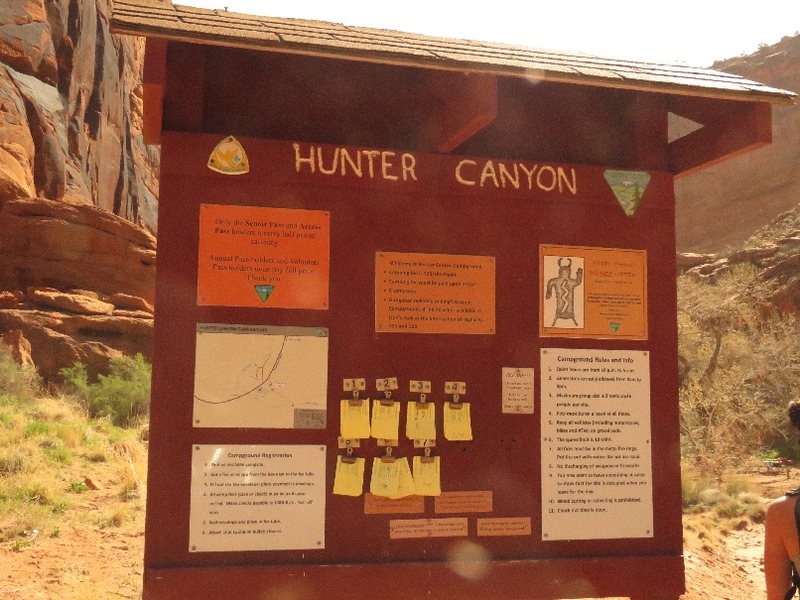 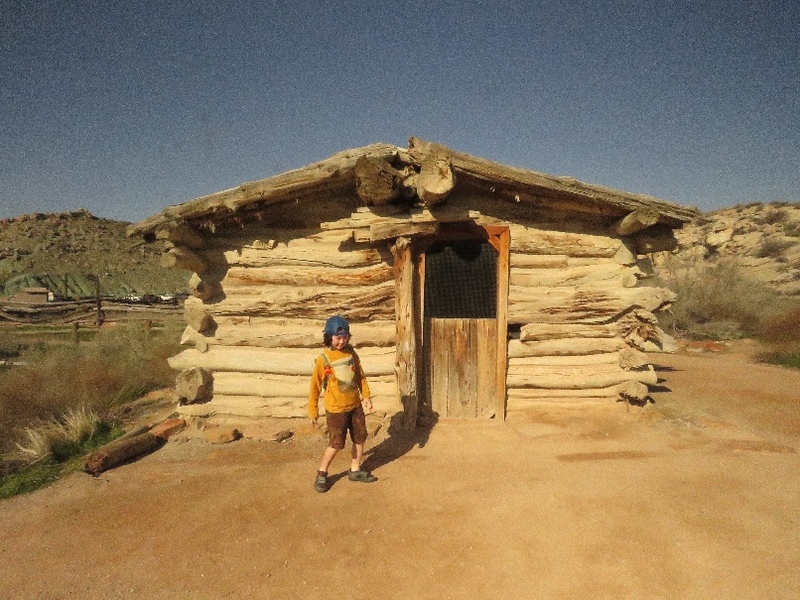 4/19/2019 Hans Flat Ranger Statiion, Maze Tour (Day 2), Canyonlands National Park, UT - Strang thing is this ranger station is located outside the Glen Canyon National Recreation Area and Maze District of Canyonlands National Park. There are 2-4 rangers cover entire Maze Distirct. 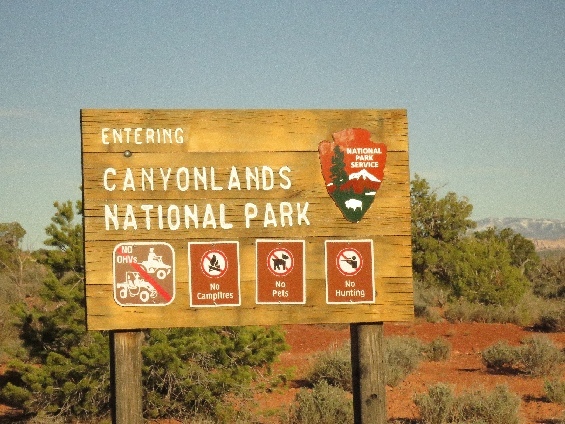 Most remote area in the lower 48 states and $5,000-6,000 to tow truck to rescure you that a ranger said. 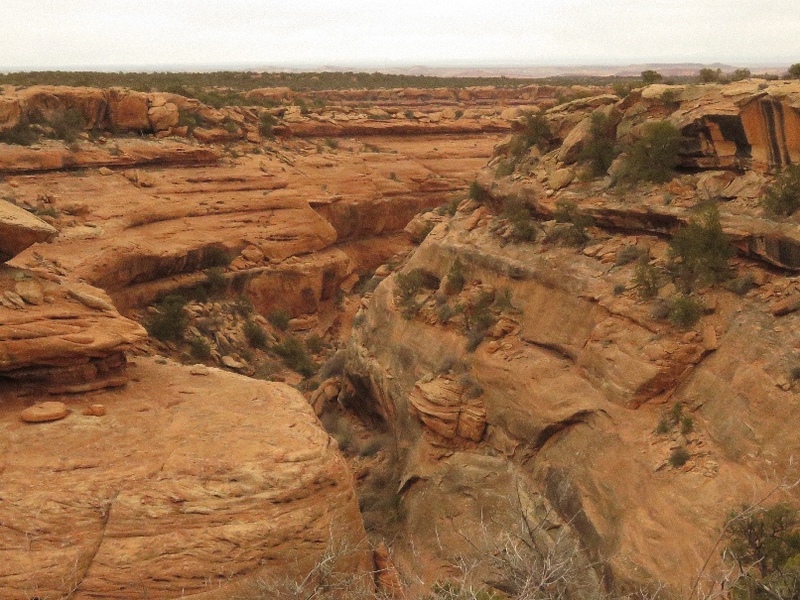 4/19/2019 The Neck, Maze Tour (Day 2), Canyonlands National Park, UT - I never know this place does exist. 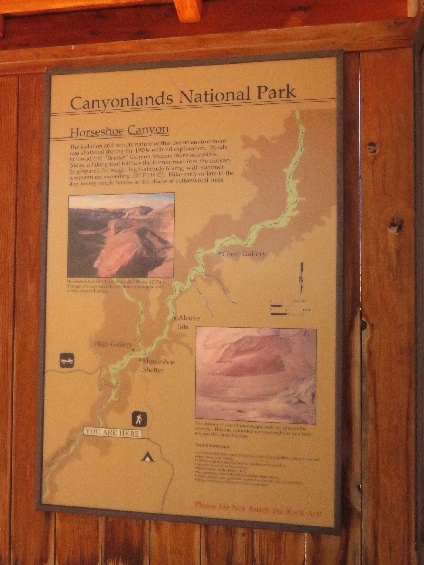 It is breathtaking view place because the road became very narrow and both sides are visible, west side is beautiful Happy Canyon, east side is wide range view, Waterhole Flat is closest, Imperial Valley next, then Beef Basin in far view. 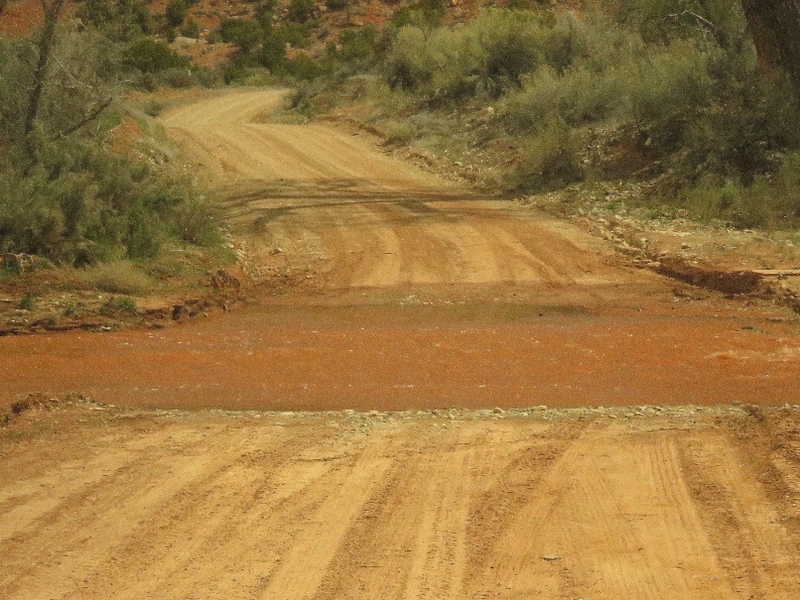 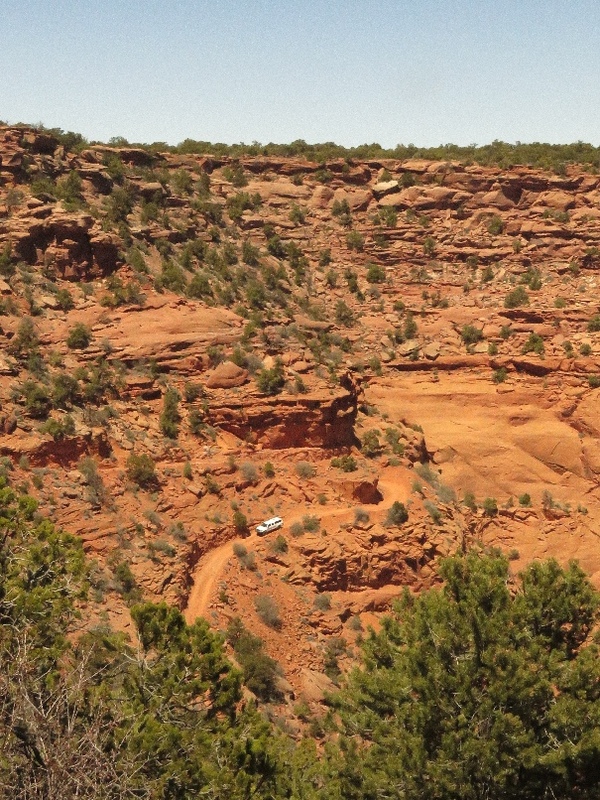 4/19/2019 Flint Trail, Maze Tour (Day 2), Canyonlands National Park, UT - This is a steep 4x4 dirt road, only one lane wide but not the one way, yes both ways. 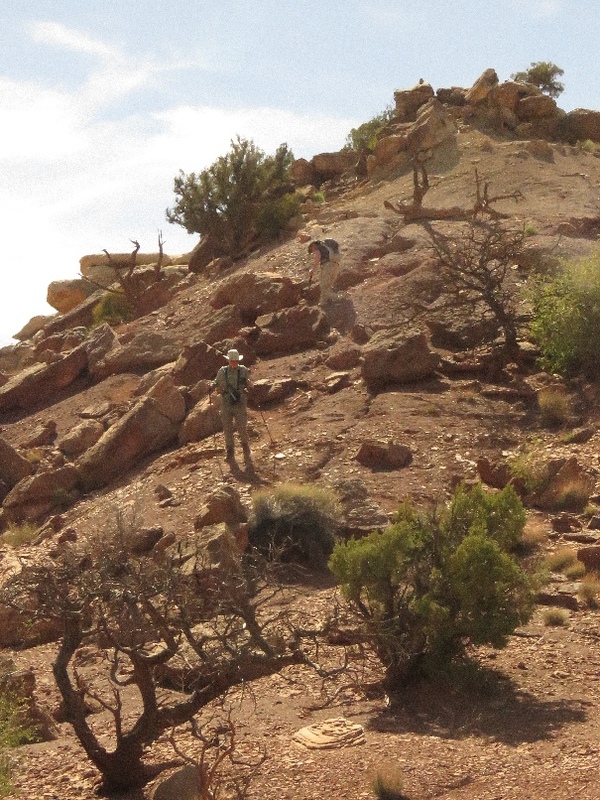 There are few hair pin curves, and some of are need adjustment, a means back up some to turn in steep slope. 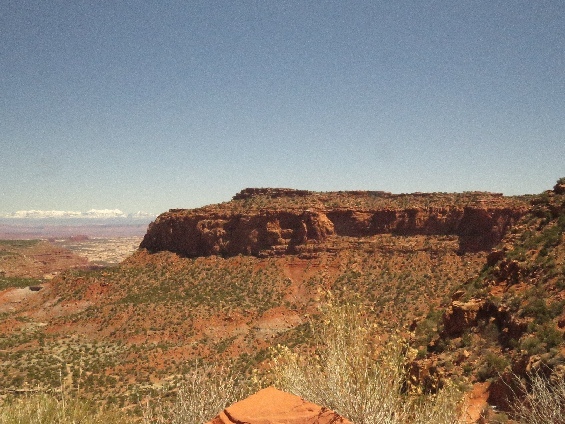 View is nice, but driver has no choice to enjoy the view. 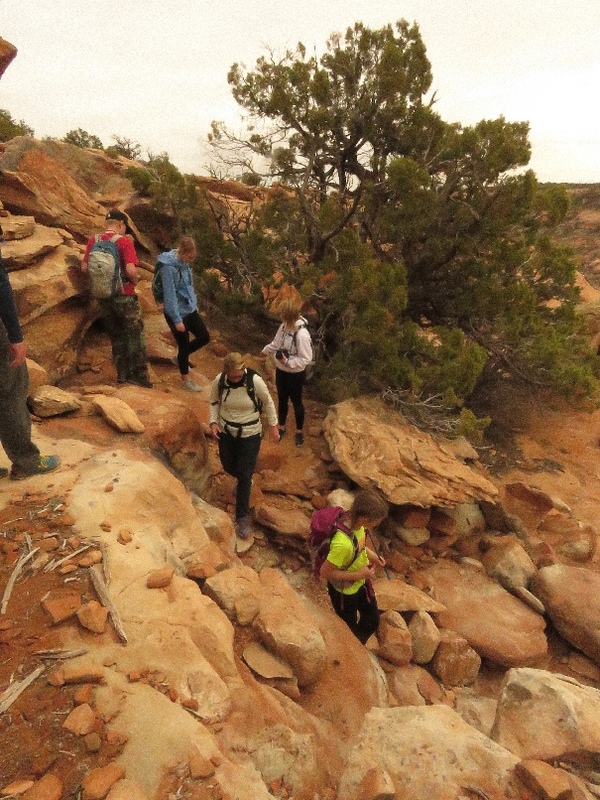 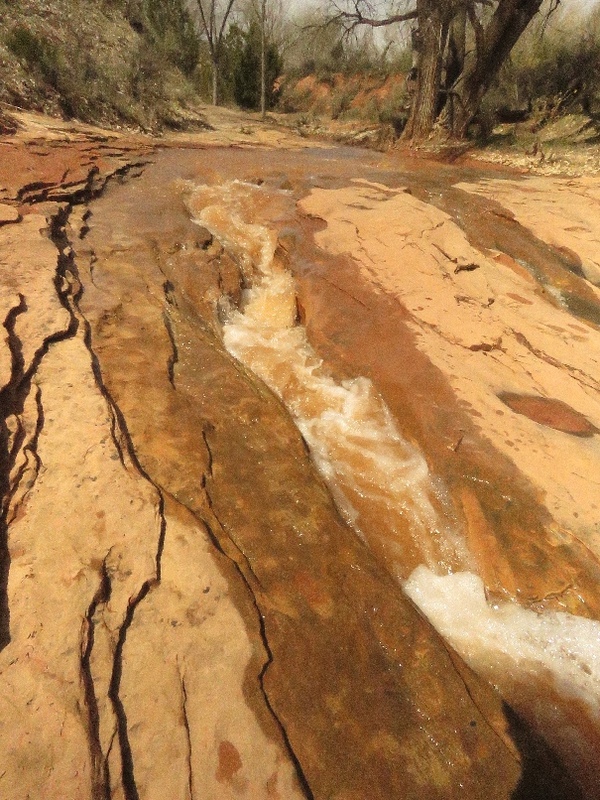 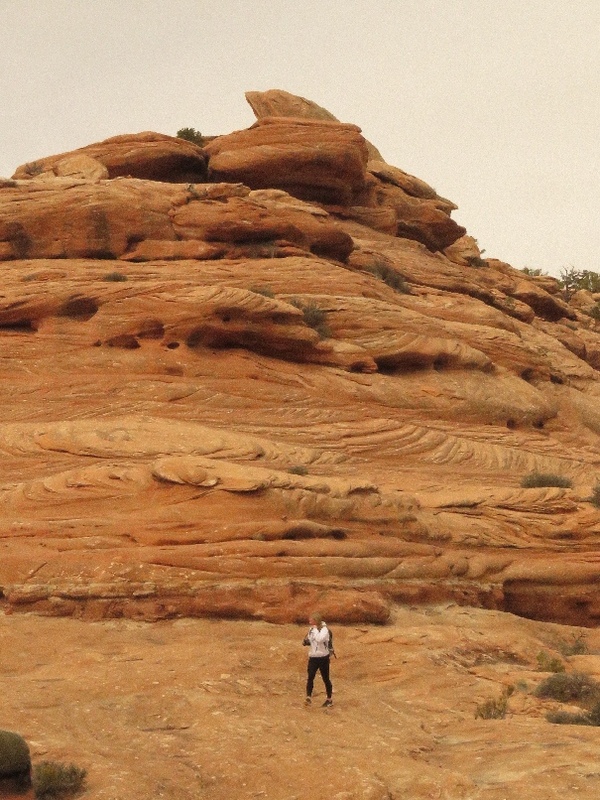 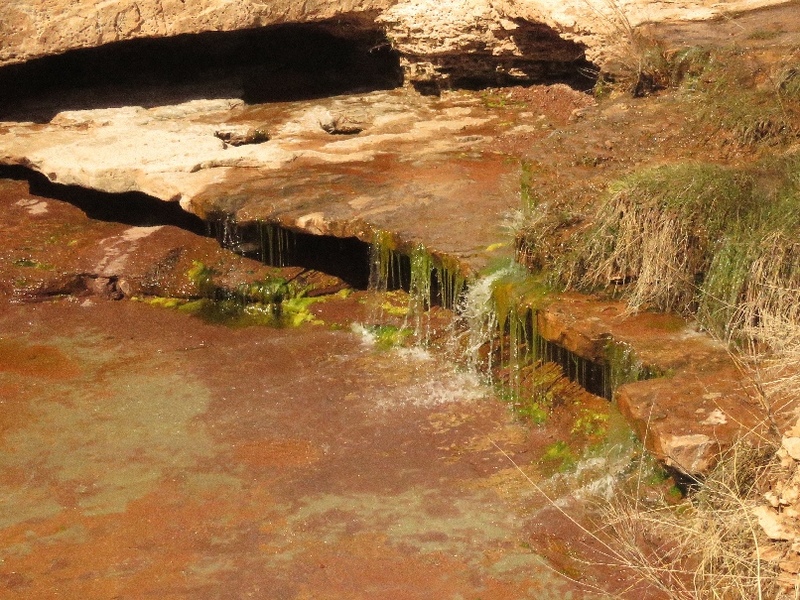 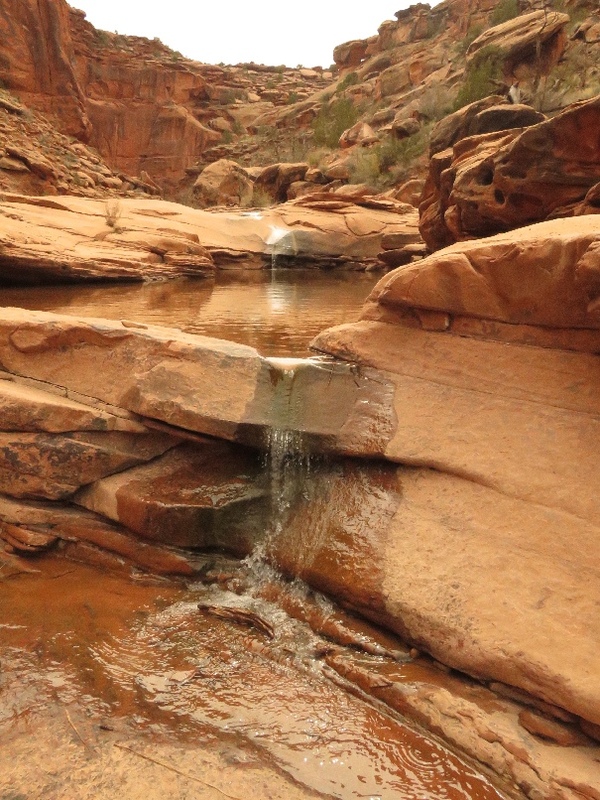 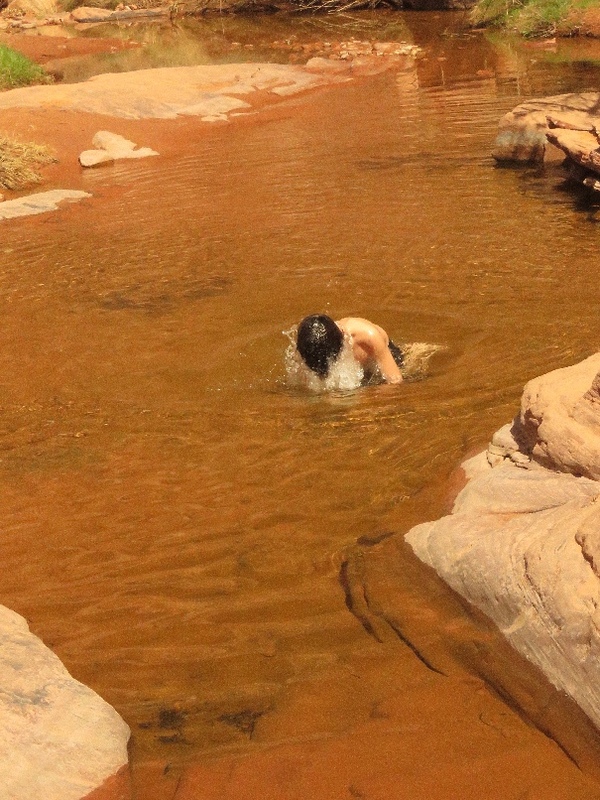 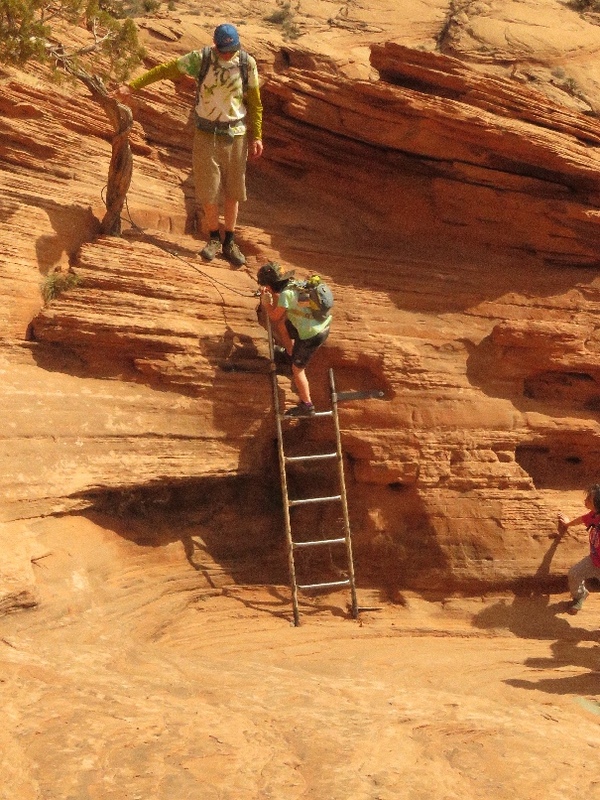 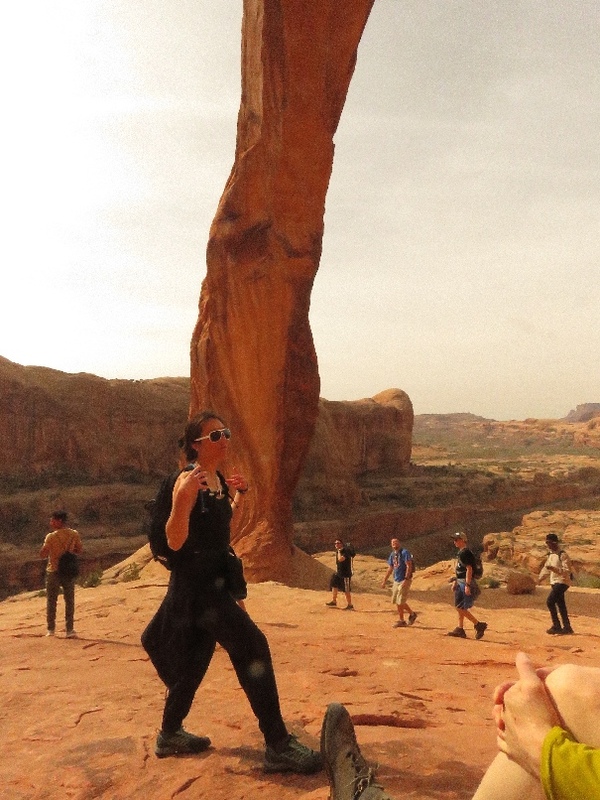 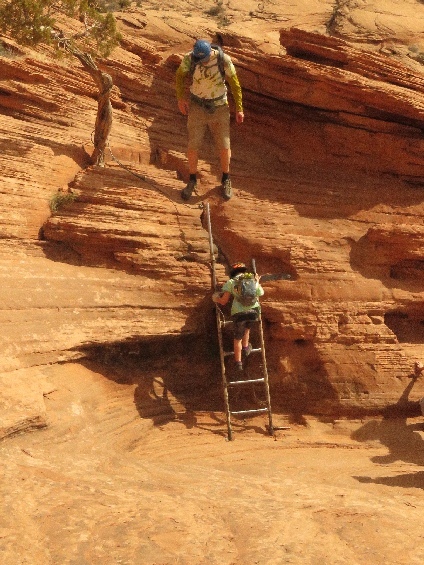 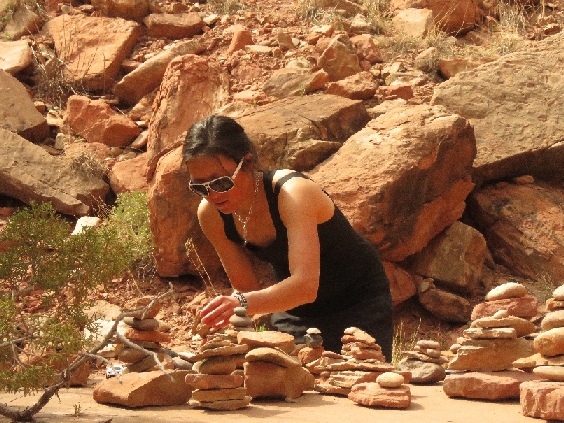 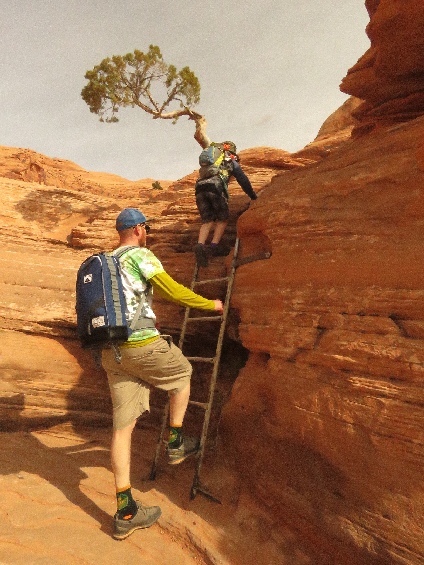 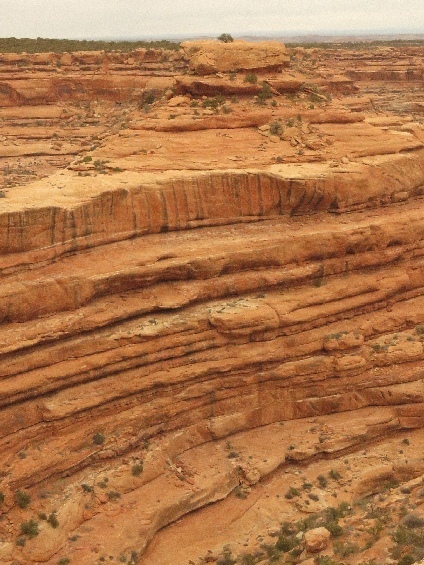 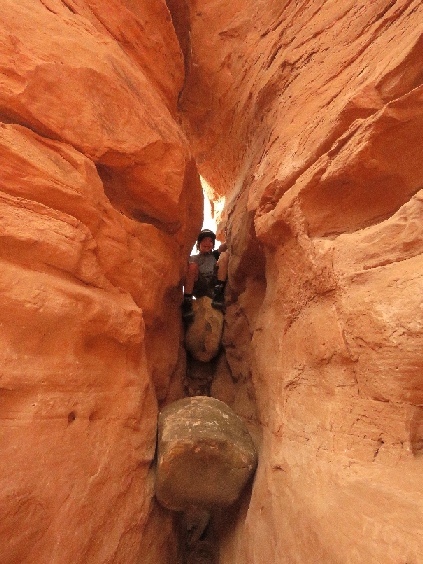 4/19/2019 Golden Stairs Trail, Maze Tour (Day 2), Canyonlands National Park, UT - China Neck is the begining of this hike, its nice place to take photos. The trail is all down hill, I thought one hour is enough to hike down the little over 2 miles trail, I was wrong, we spent over 3 hours to hike down. 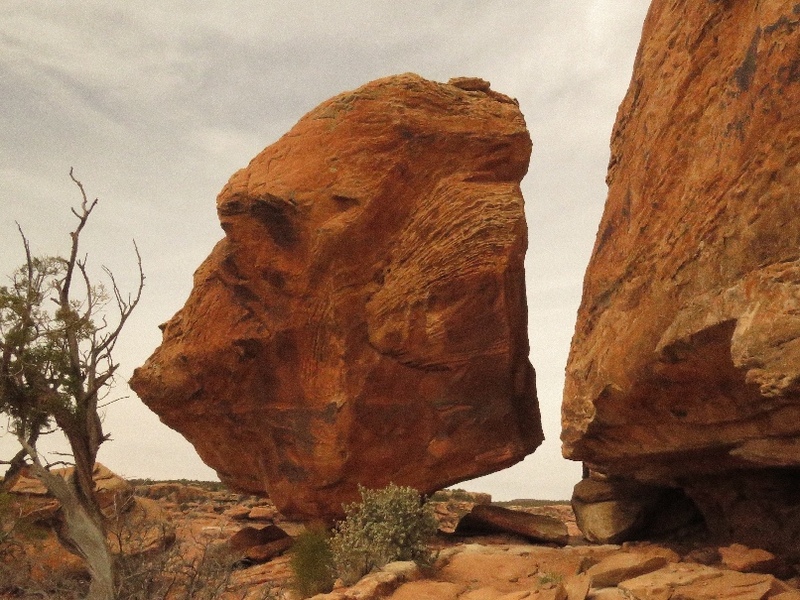 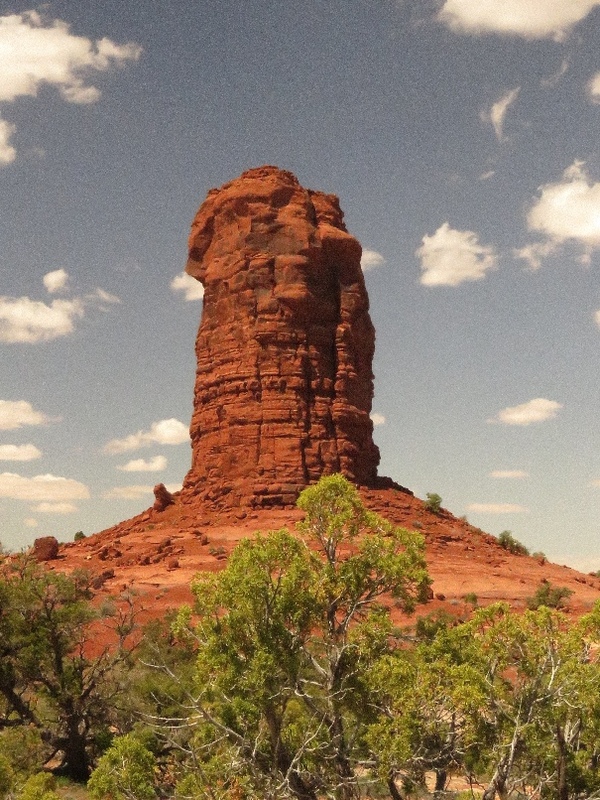 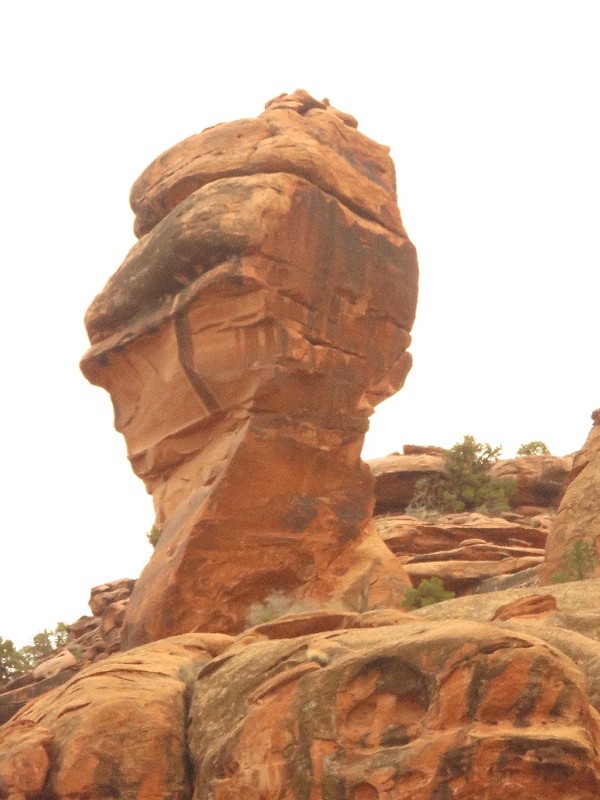 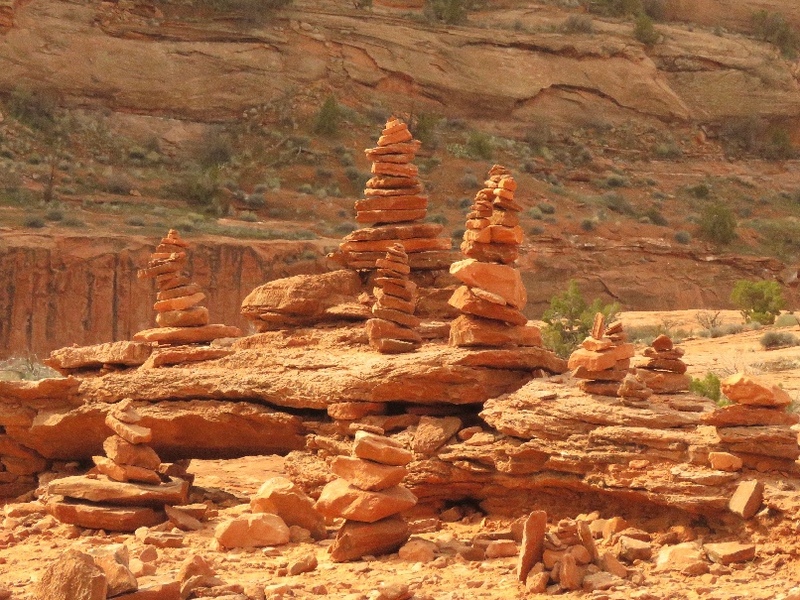 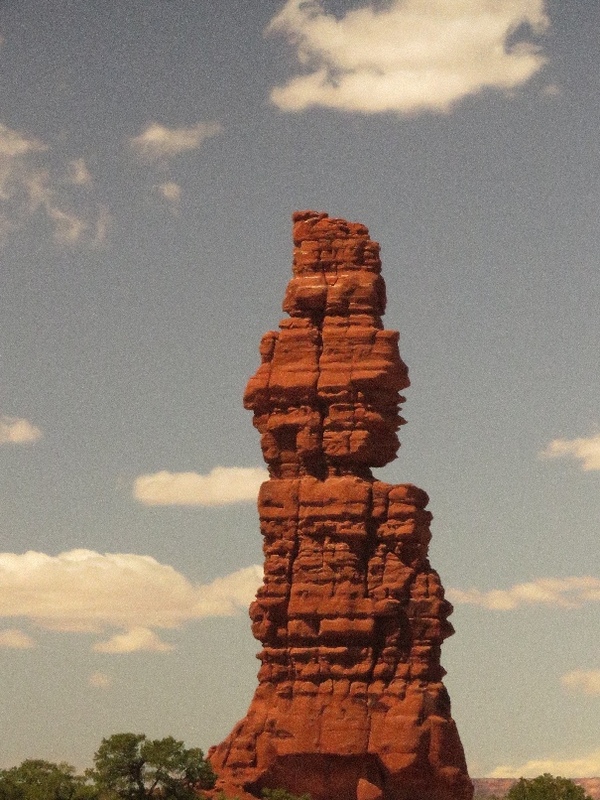 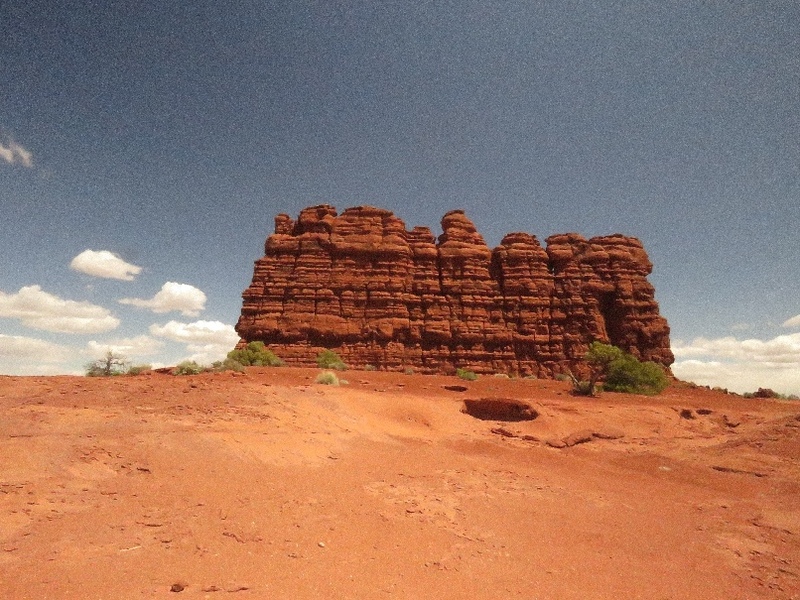 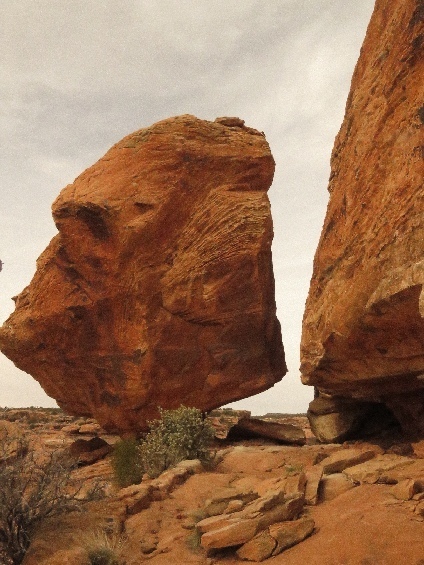 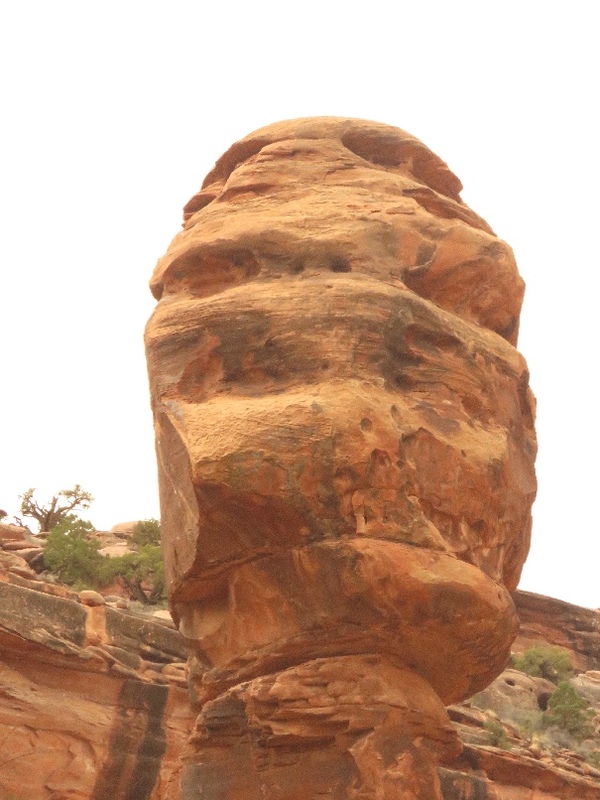 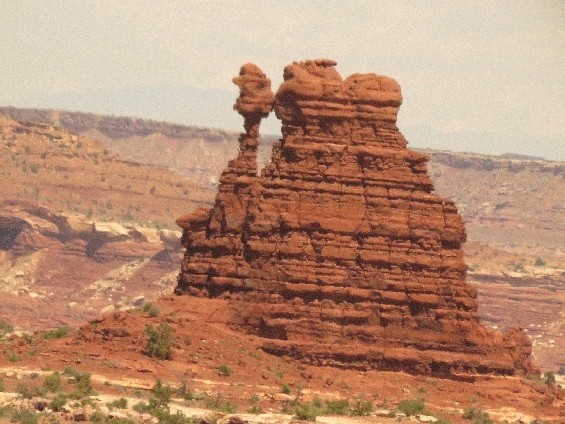 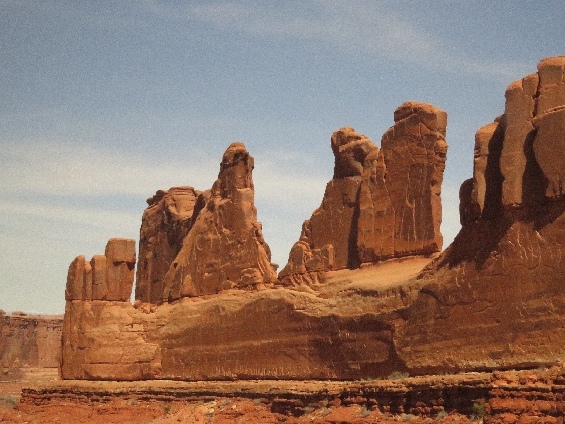 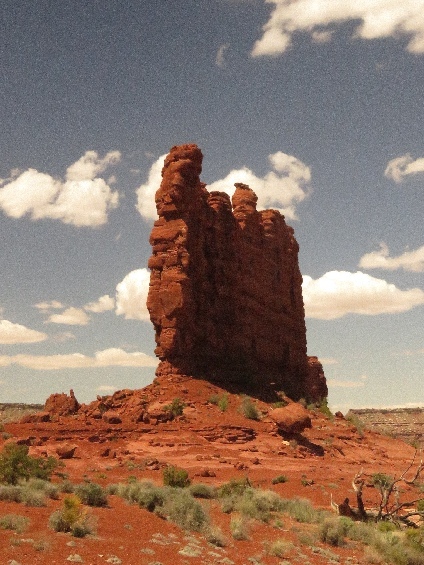 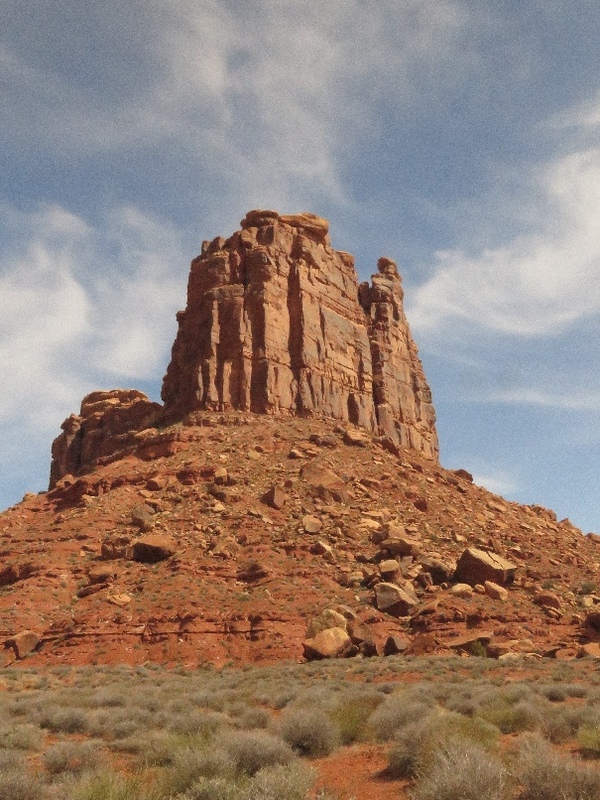 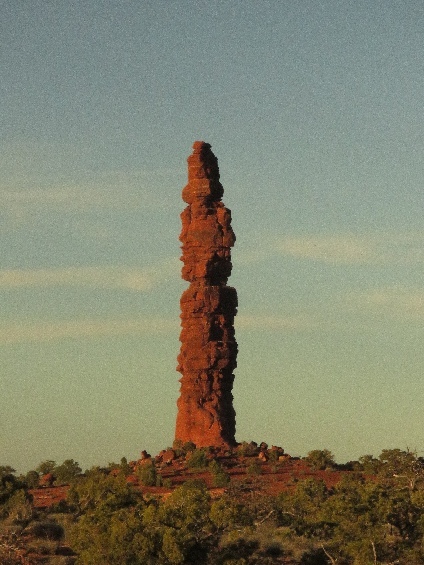 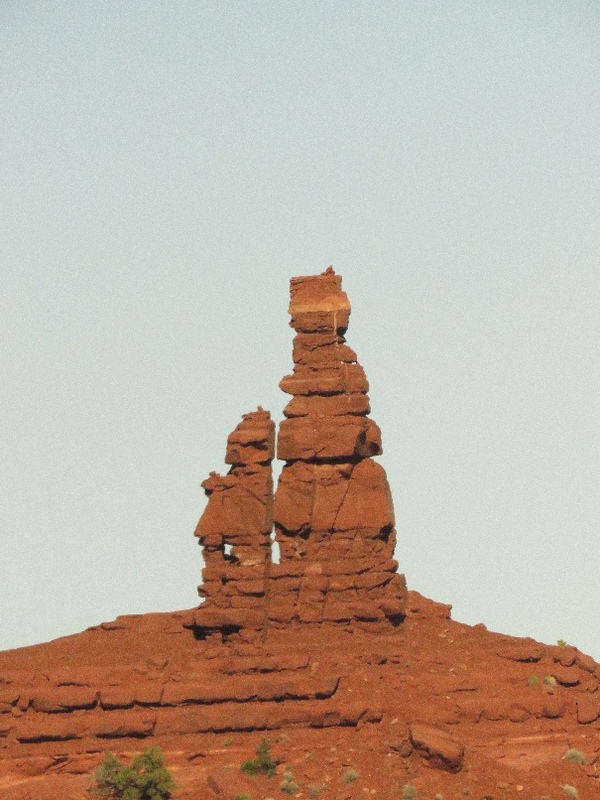 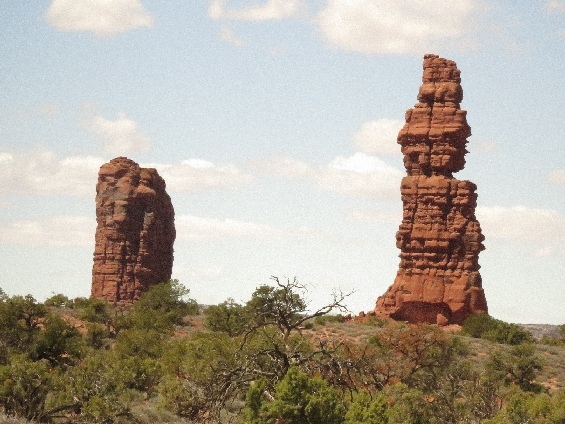 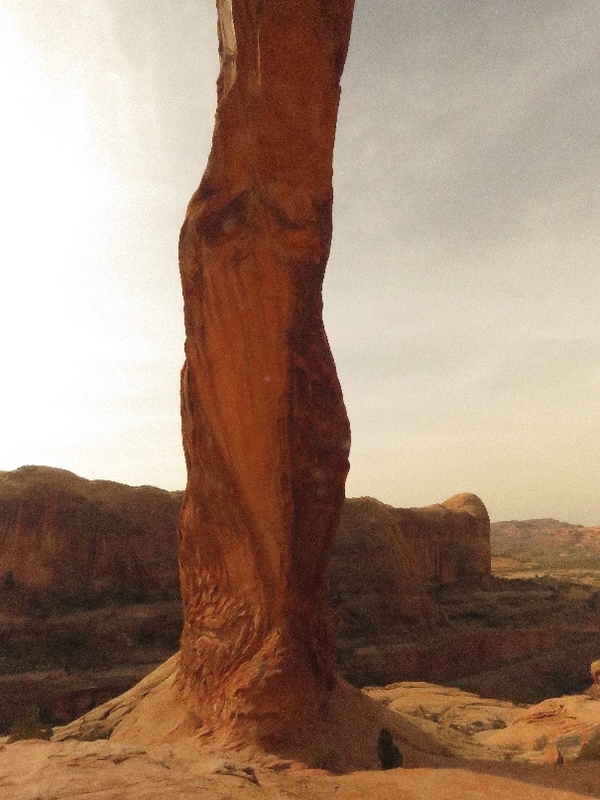 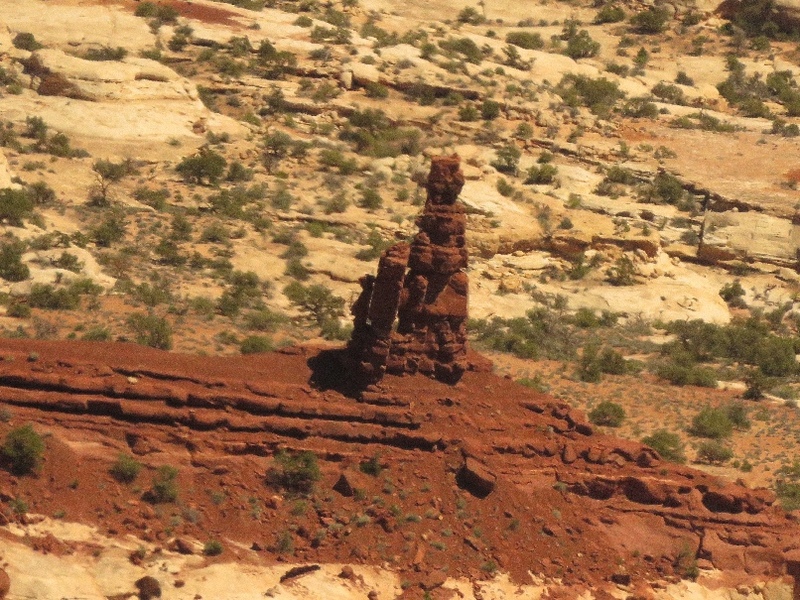 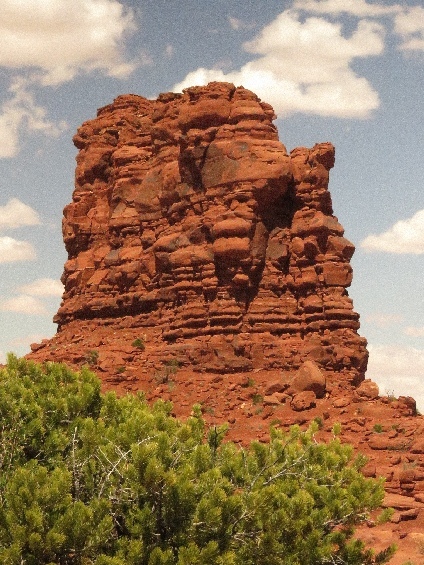 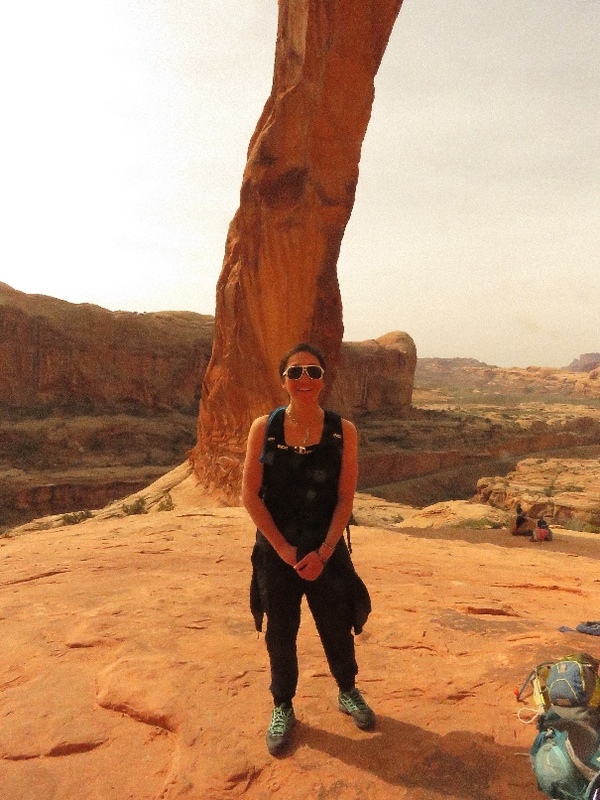 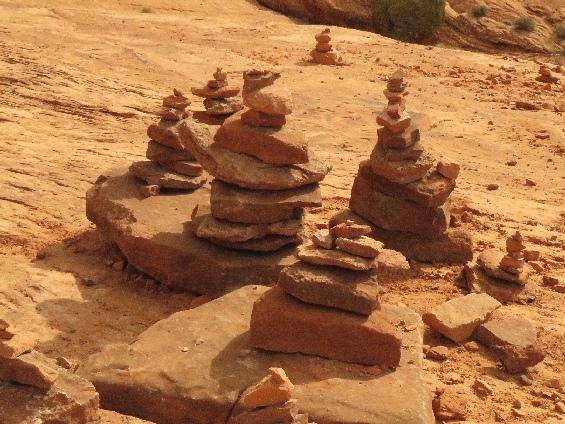 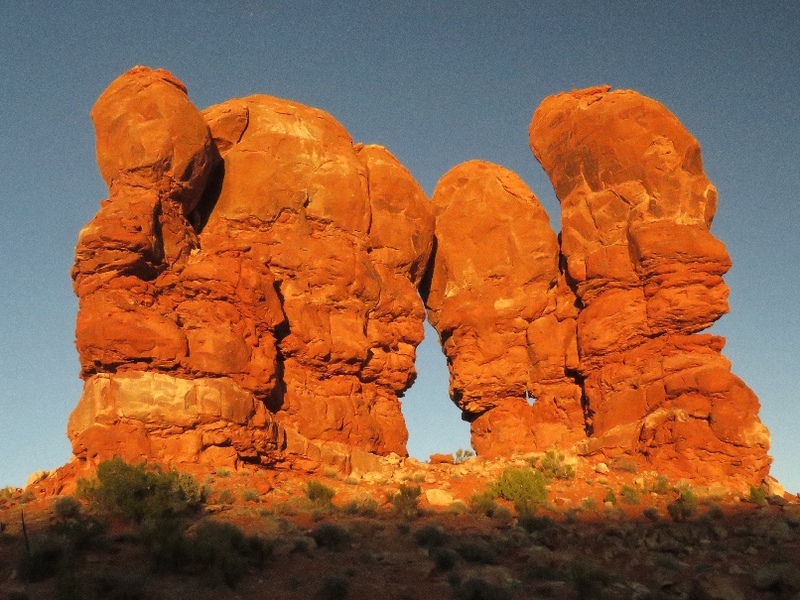 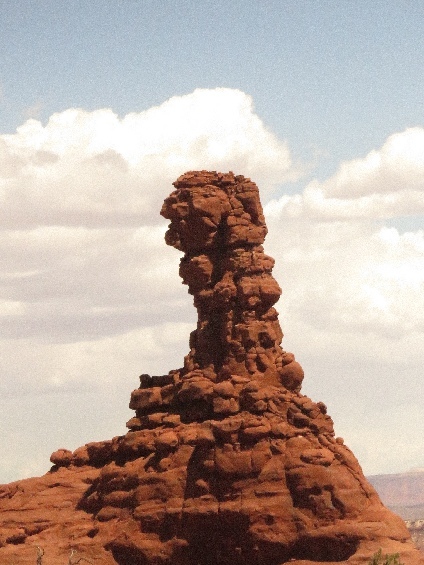 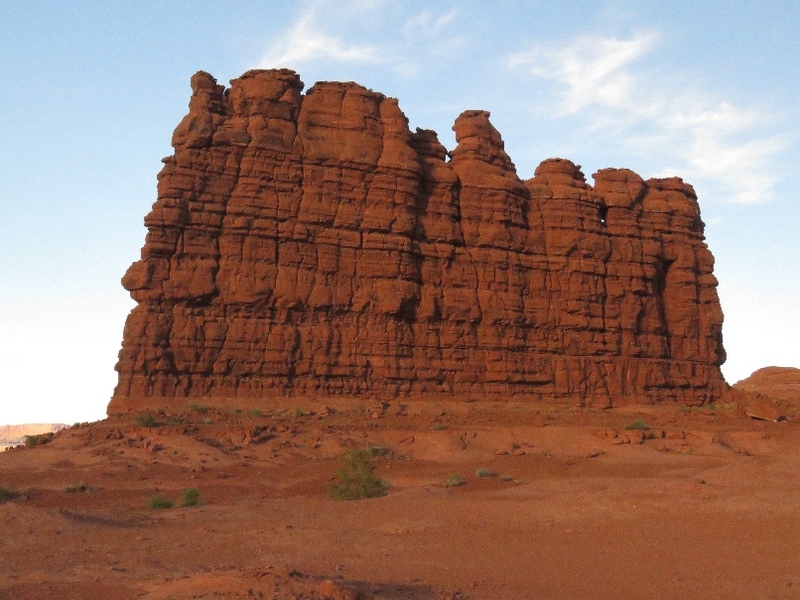 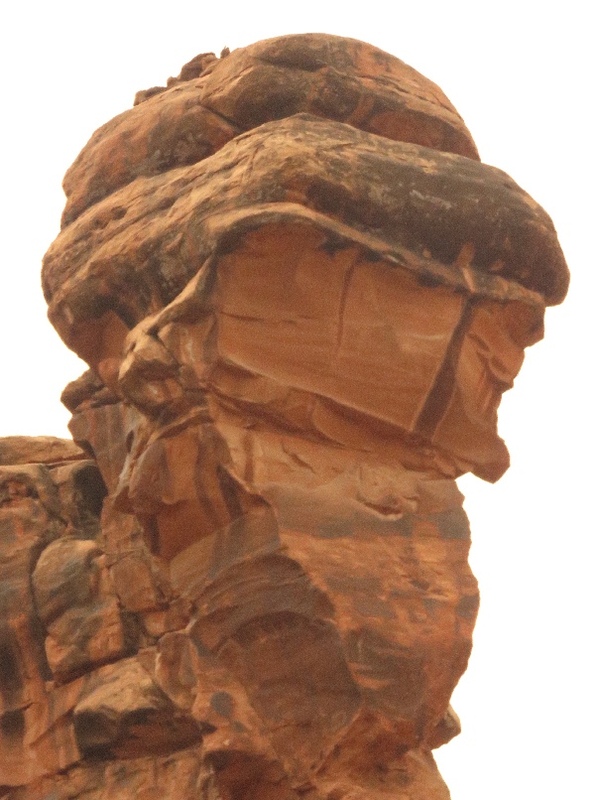 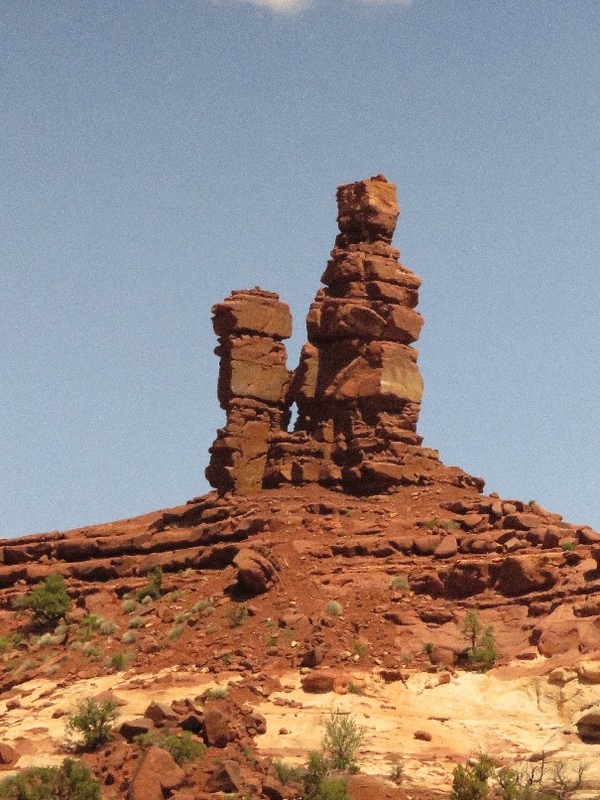 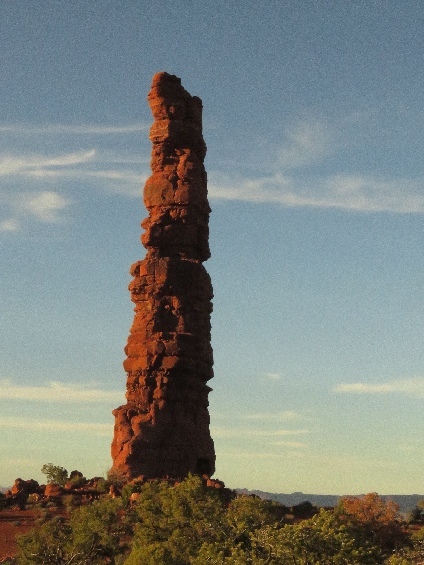 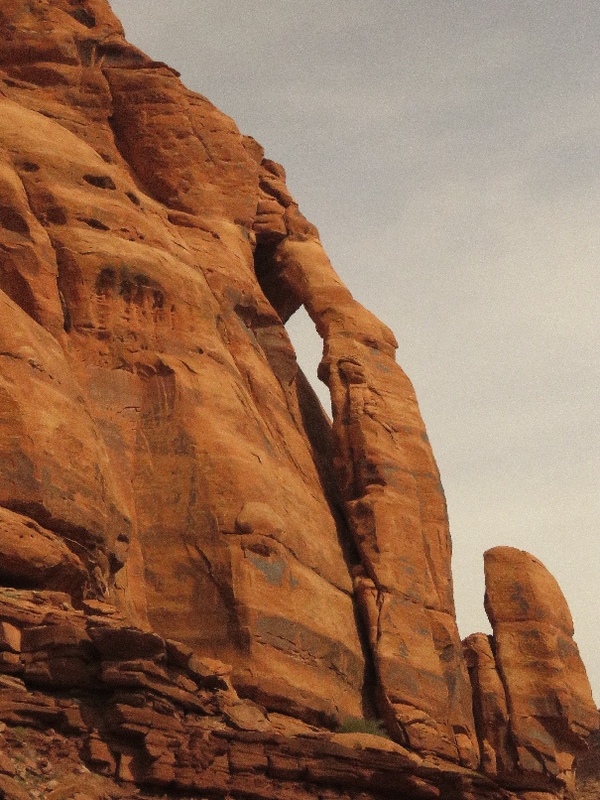 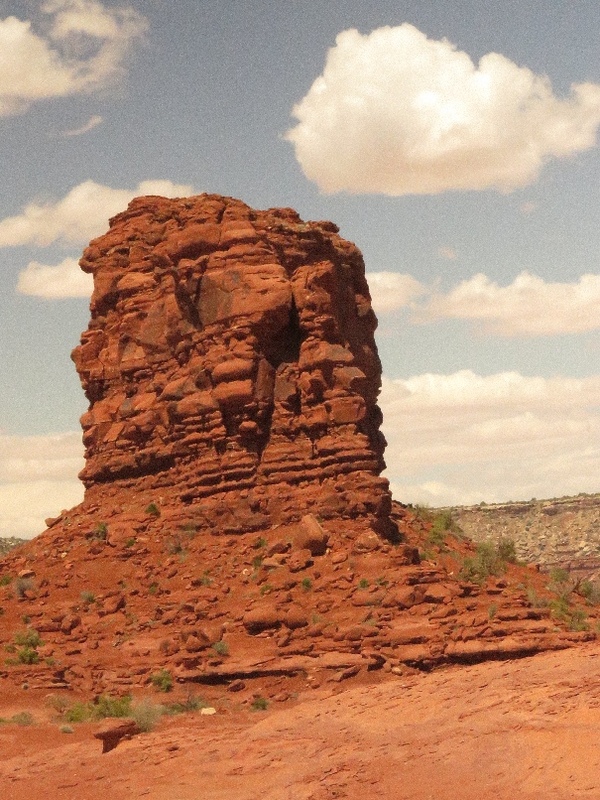 4/19/2019 Land of Standing Rocks, Maze Tour (Day 2), Canyonlands National Park, UT - There are many beautiful tall rocks standing in this area, the Standing Rock is one of them. 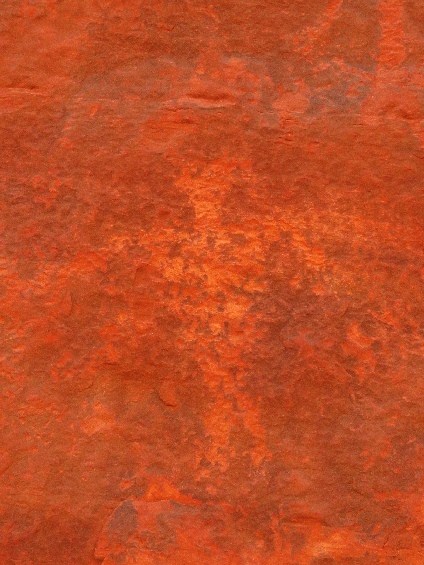 Some of are standing alone, some of are standing by group, all very strong red colors and visible from far view. 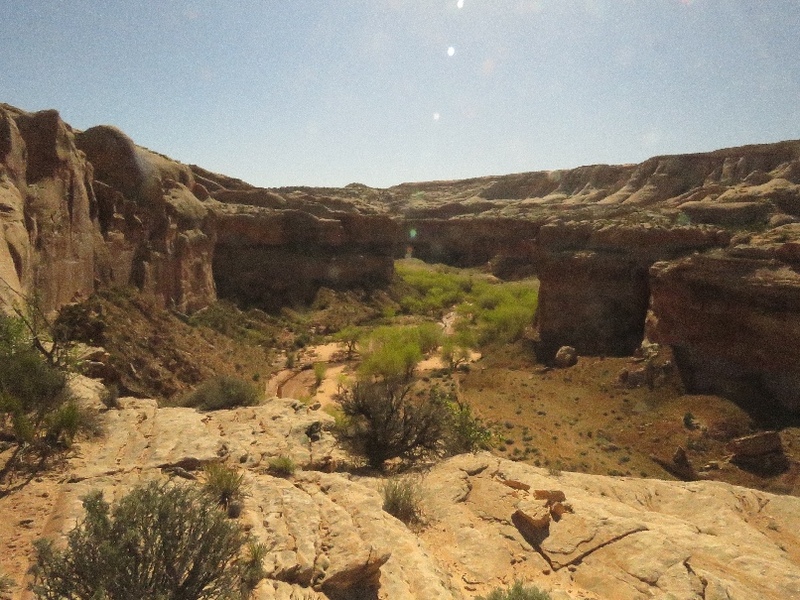 4/19/2019 Standing Rock, Maze Tour (Day 2), Canyonlands National Park, UT - Second night of camp site is amazingly the bottom of the Standing Rock. Set up the portable toilet that has best view, beautiful The Maze is below large area. 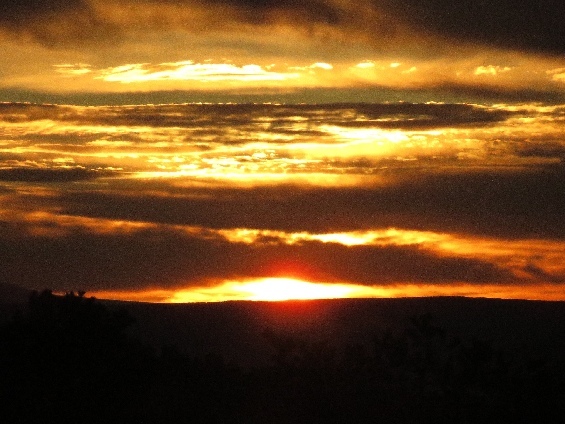 Surely no-one never wants to leave quickly.